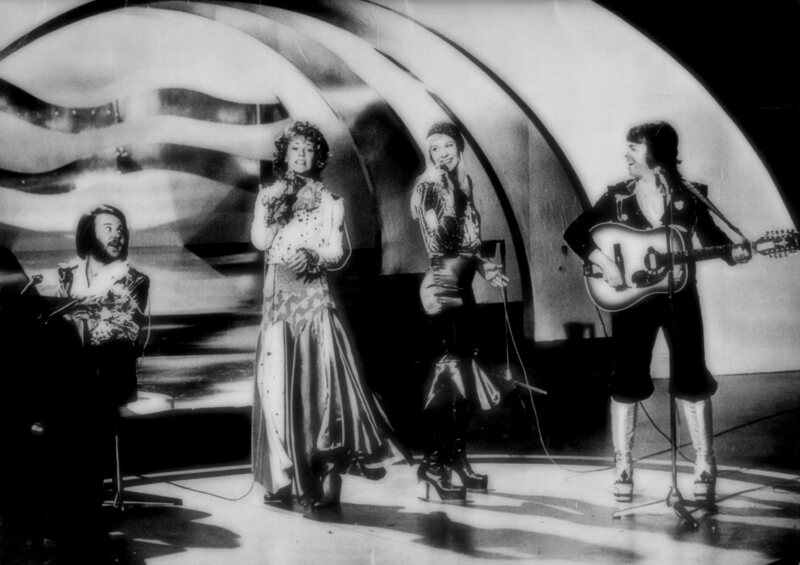 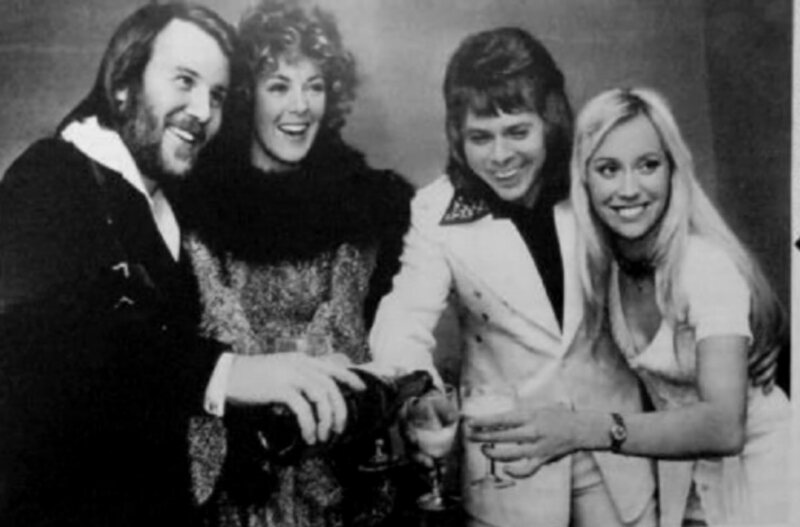 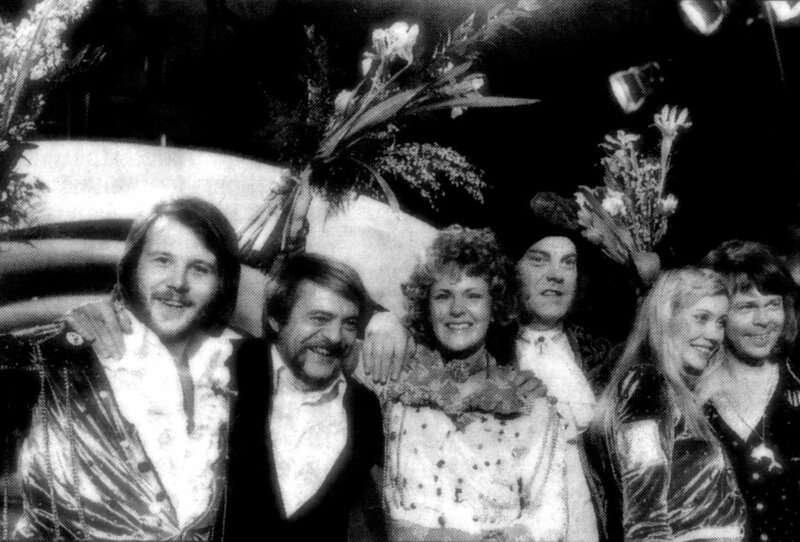 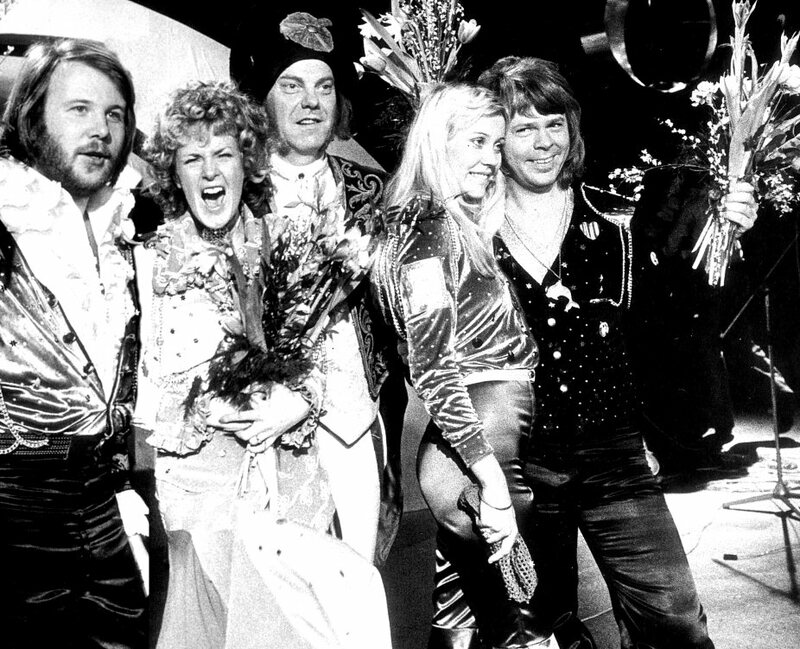 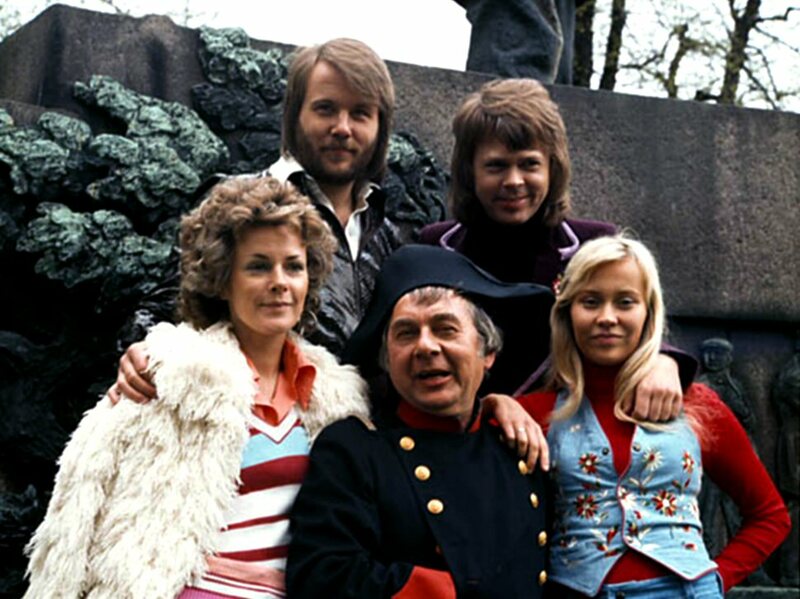 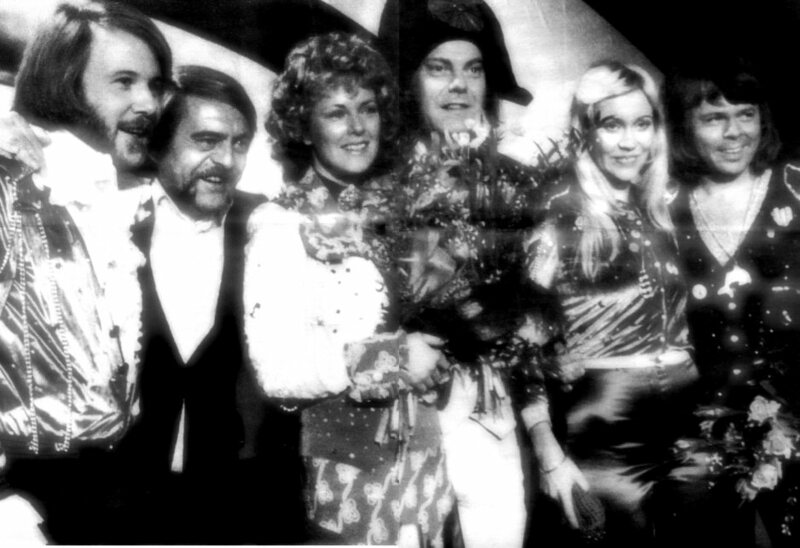 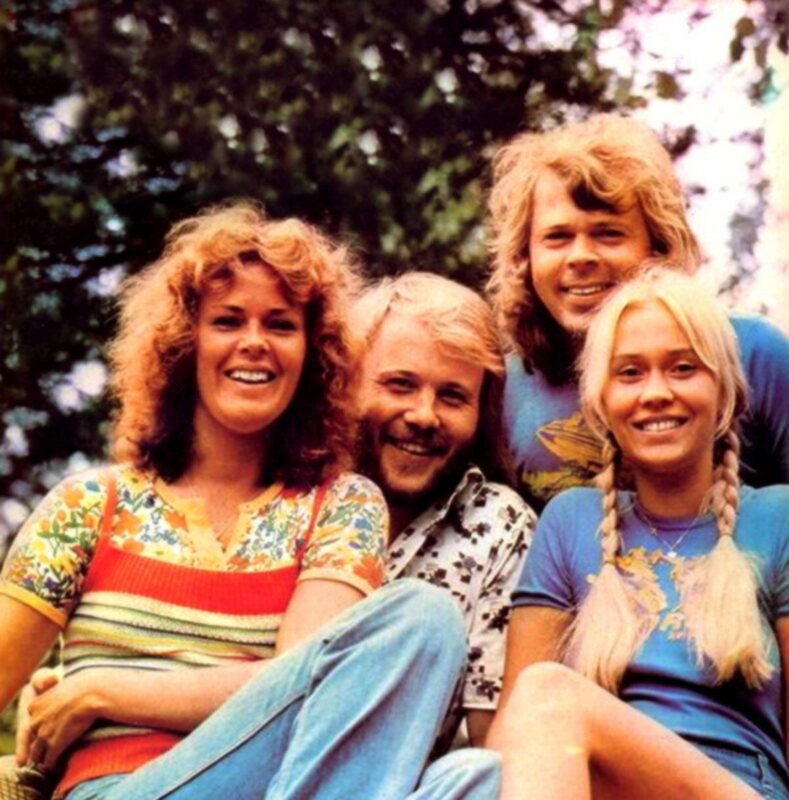 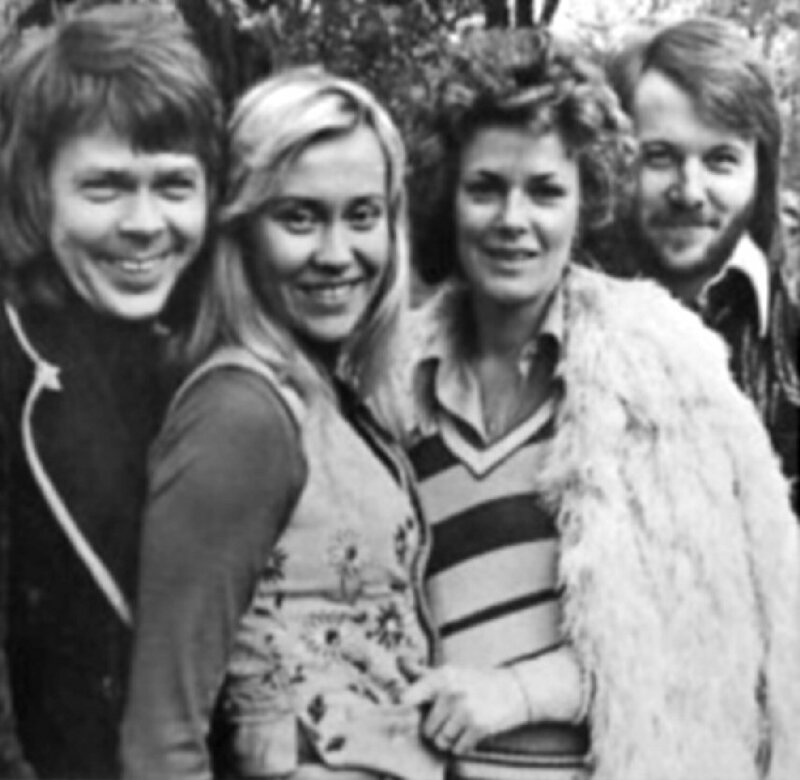 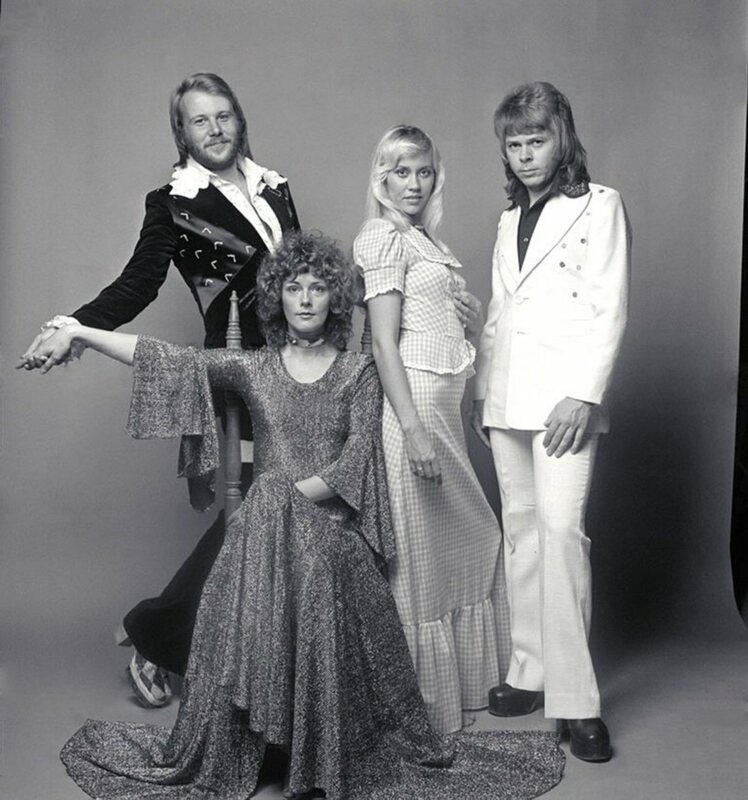 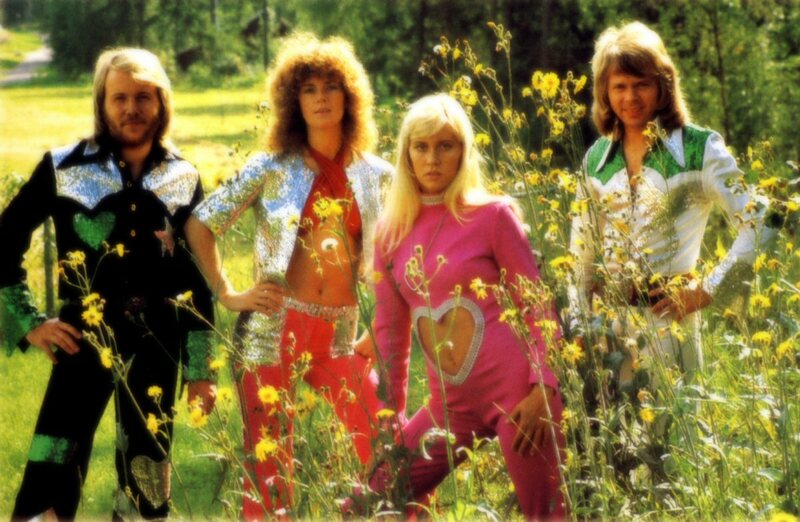 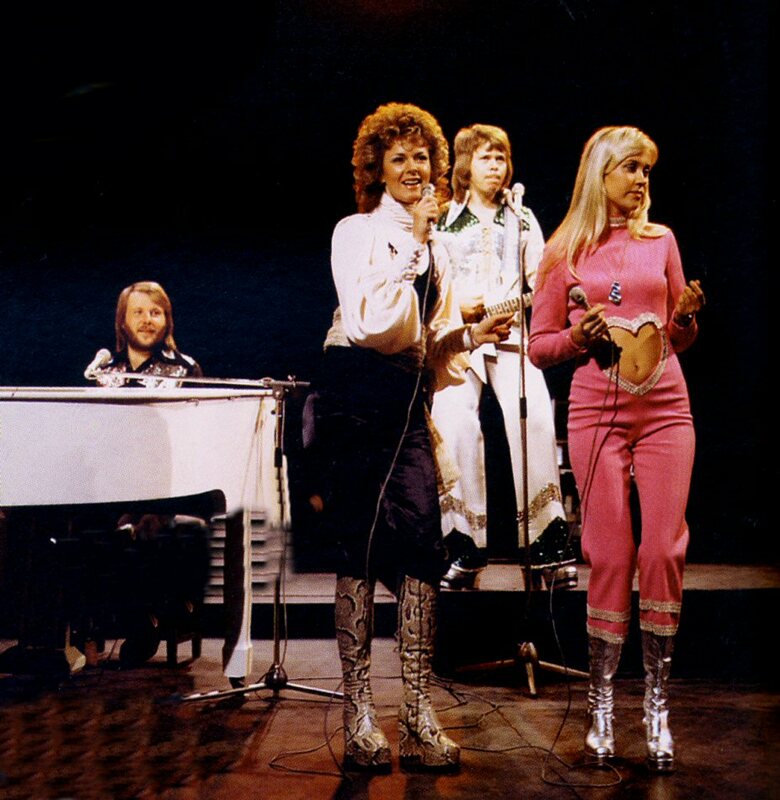 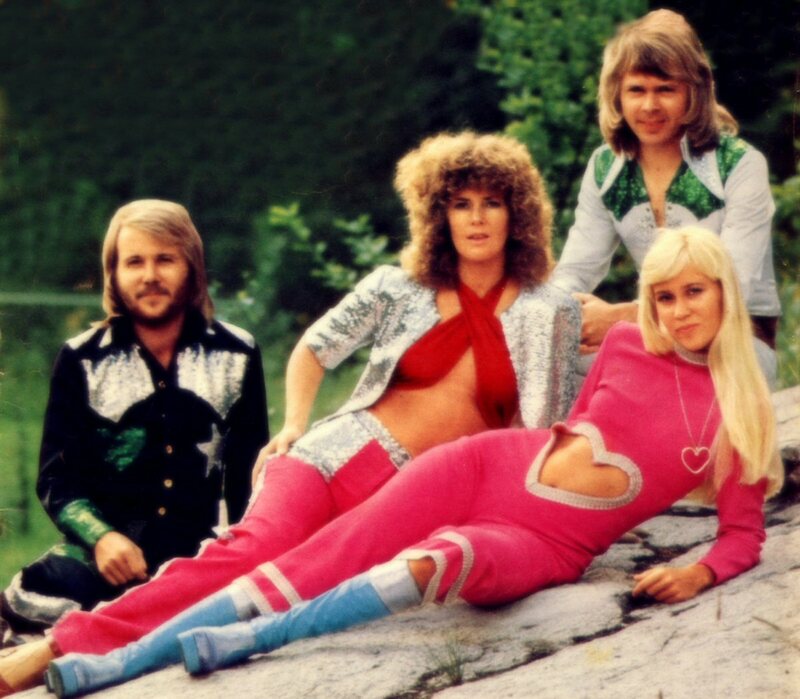 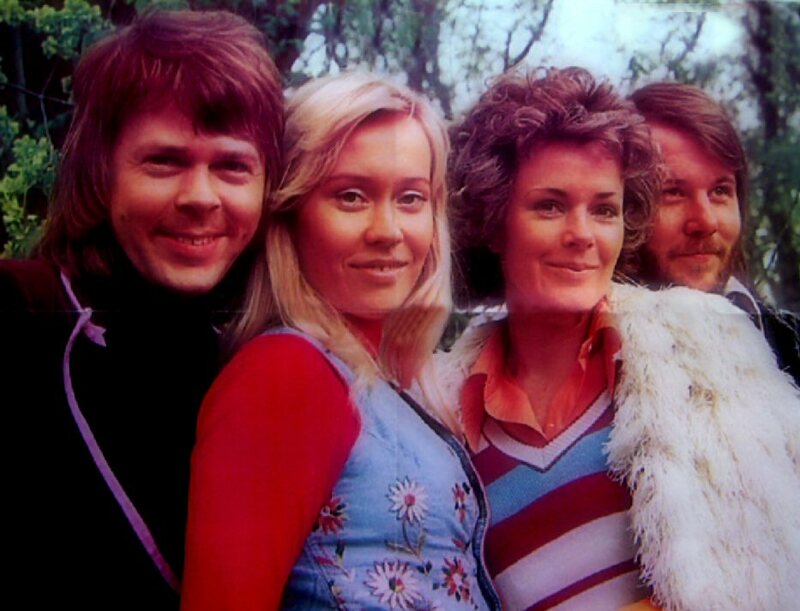 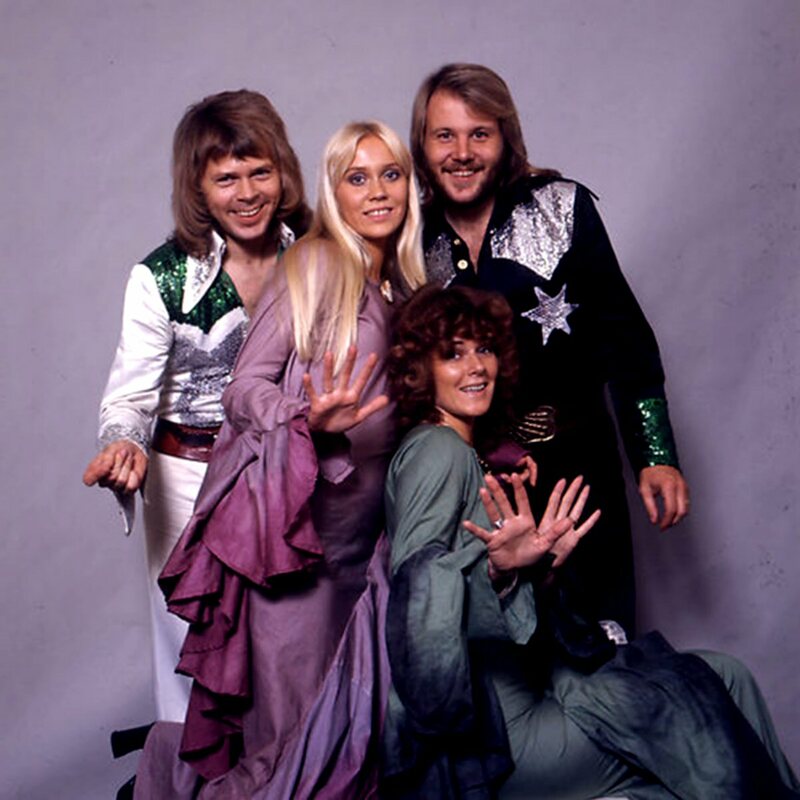 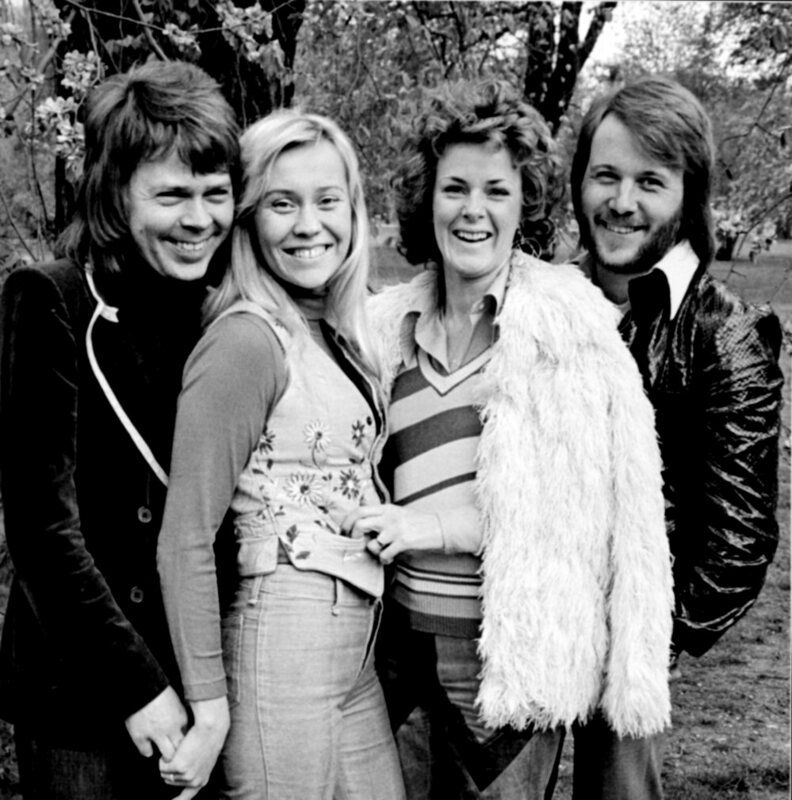 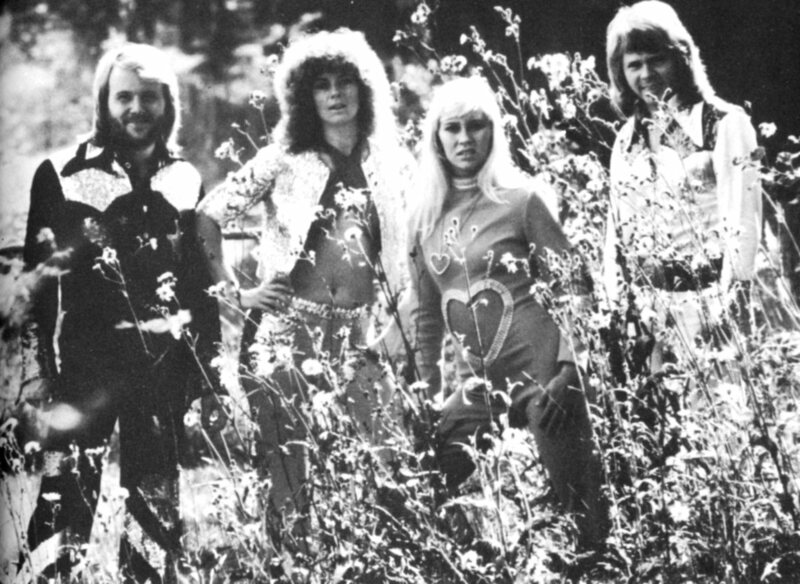 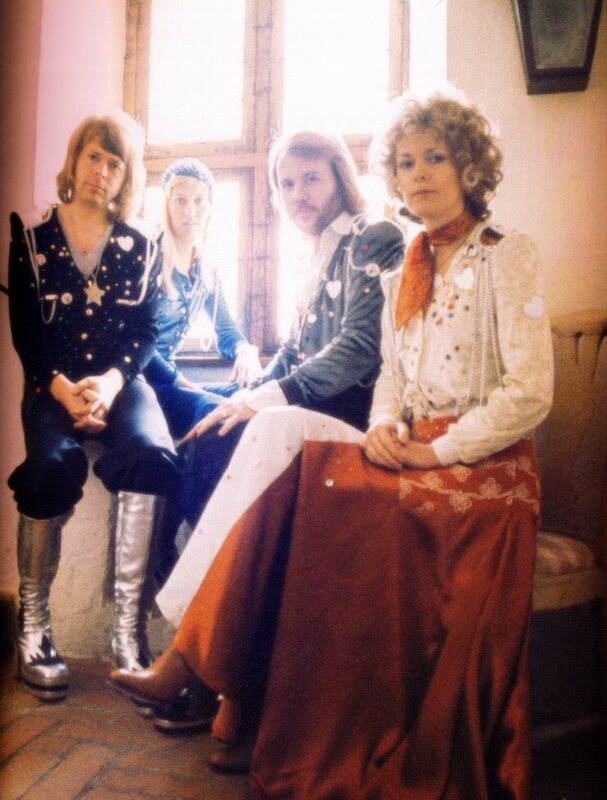 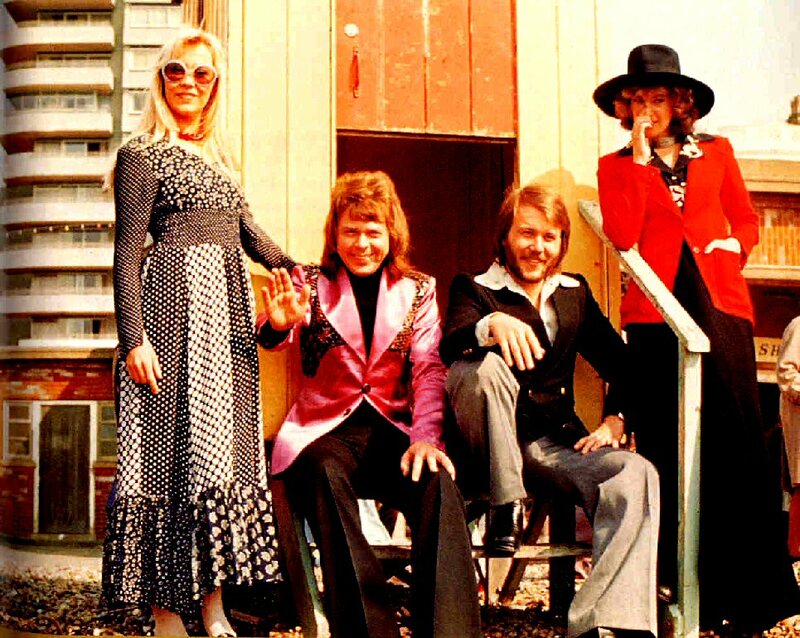 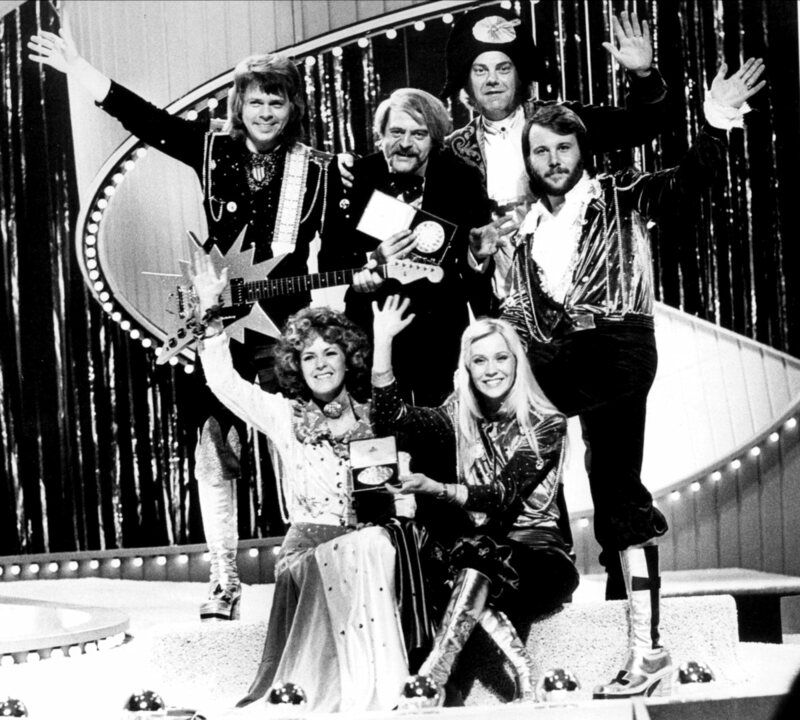 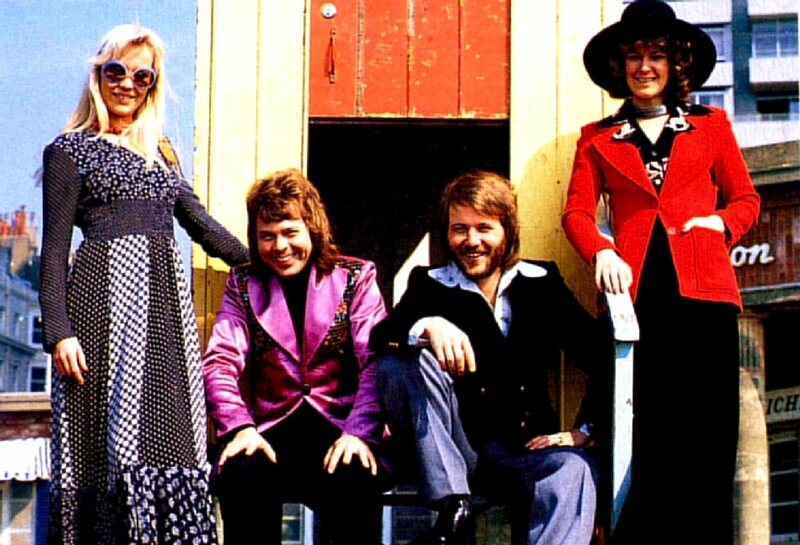 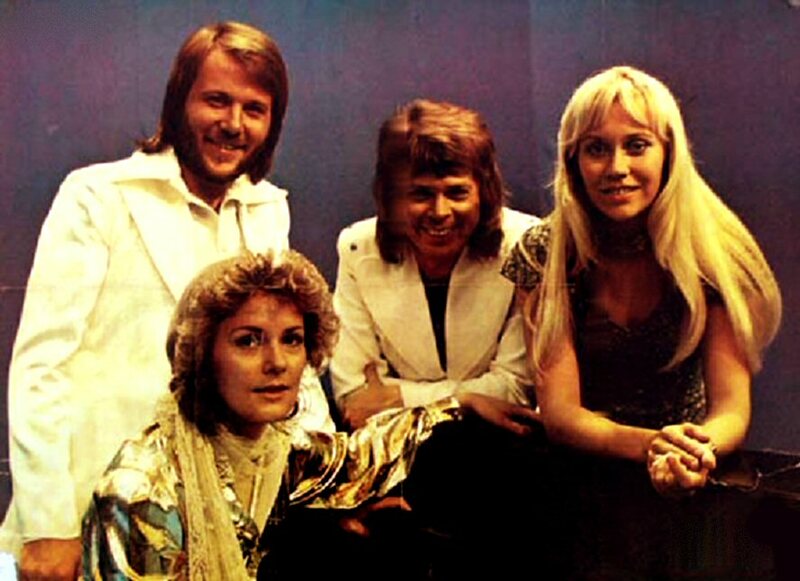 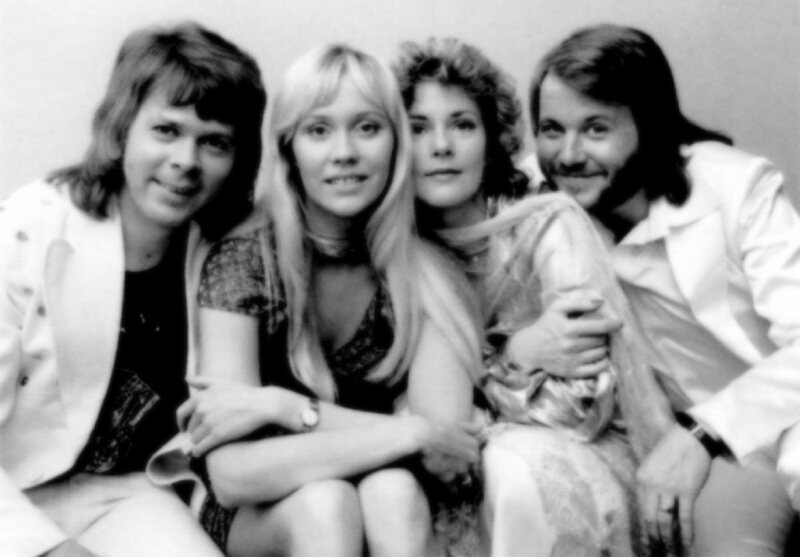 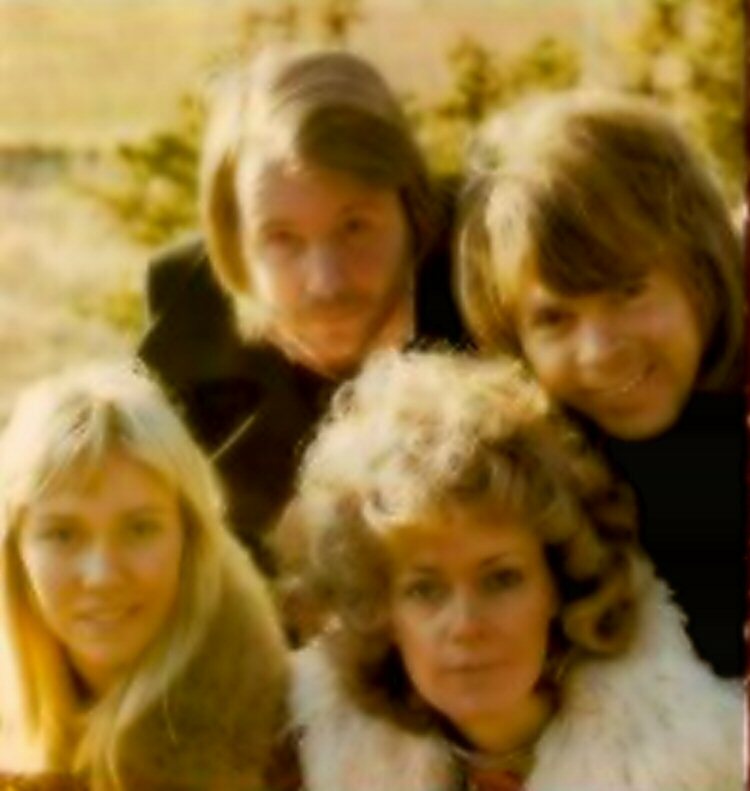 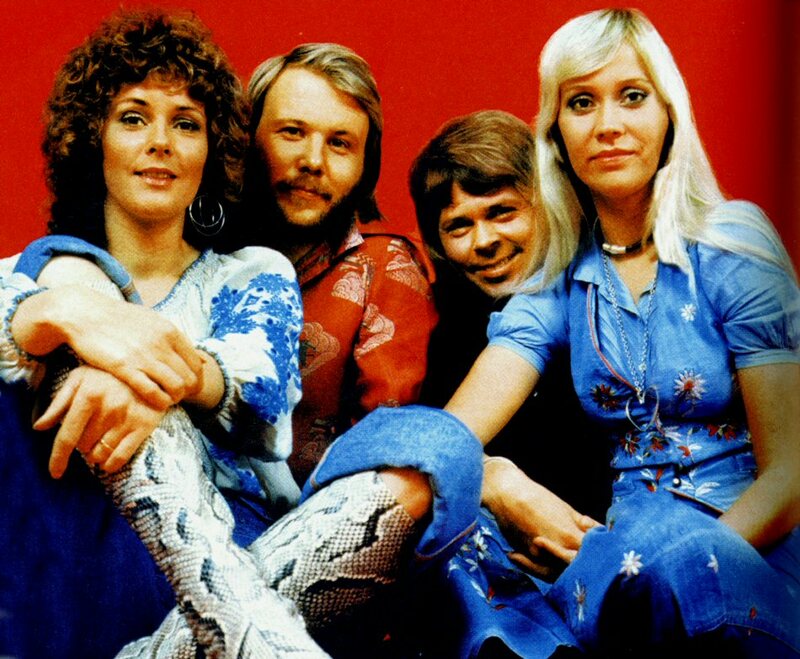 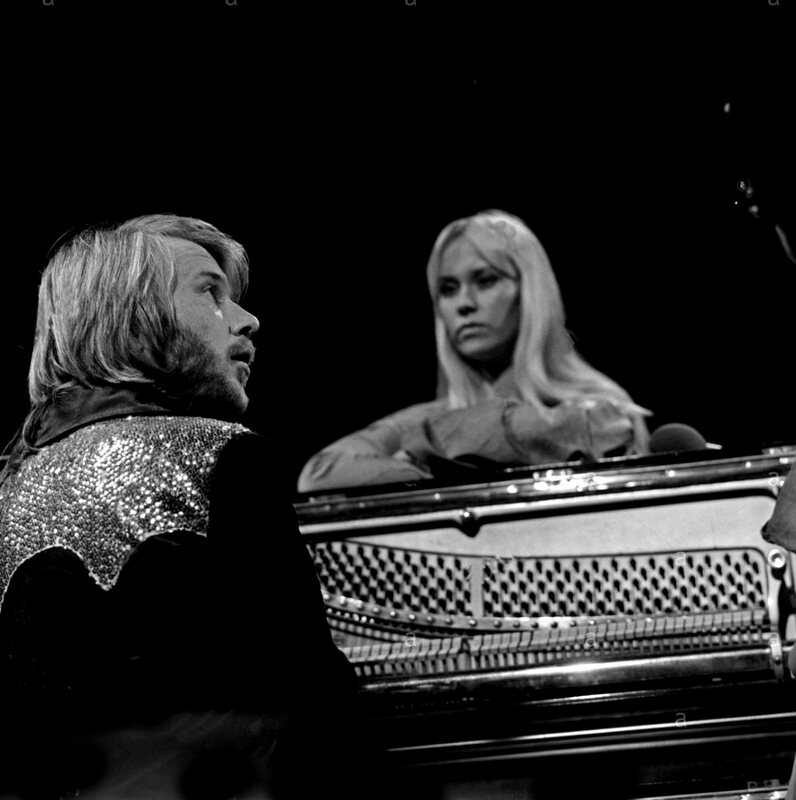 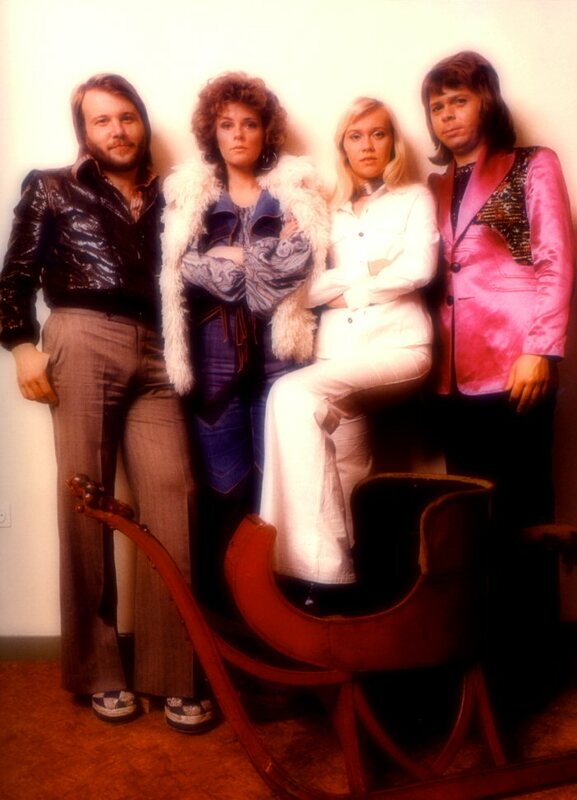 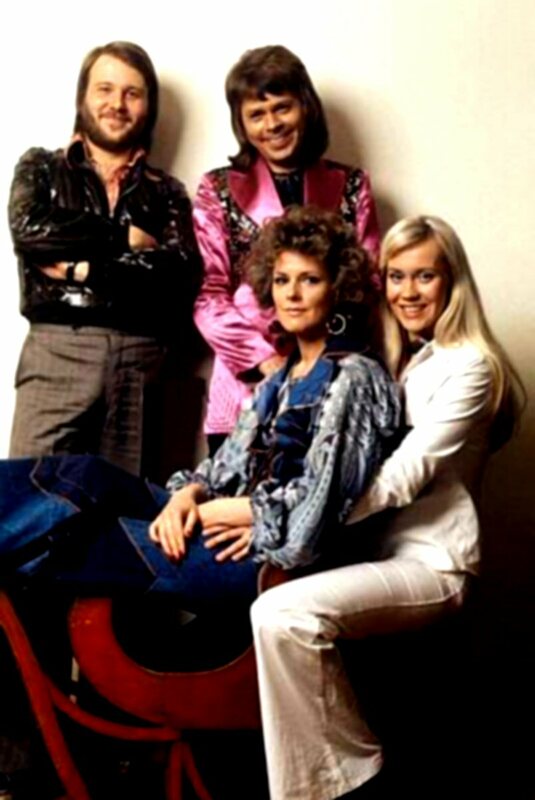 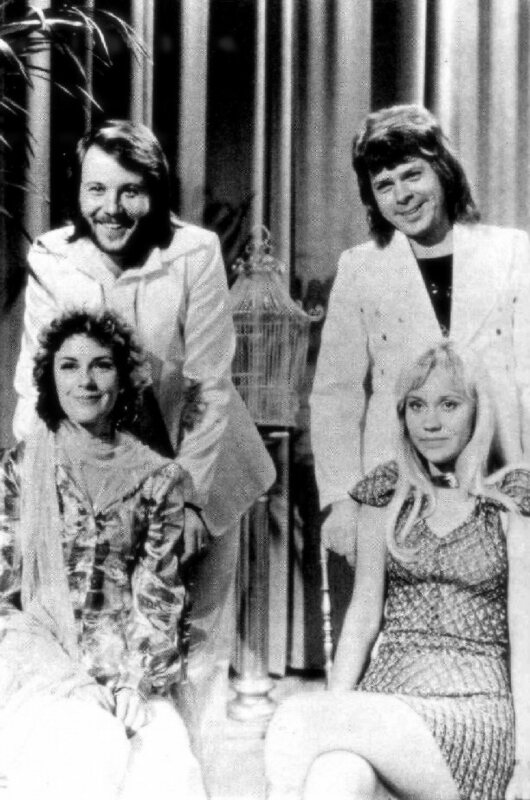 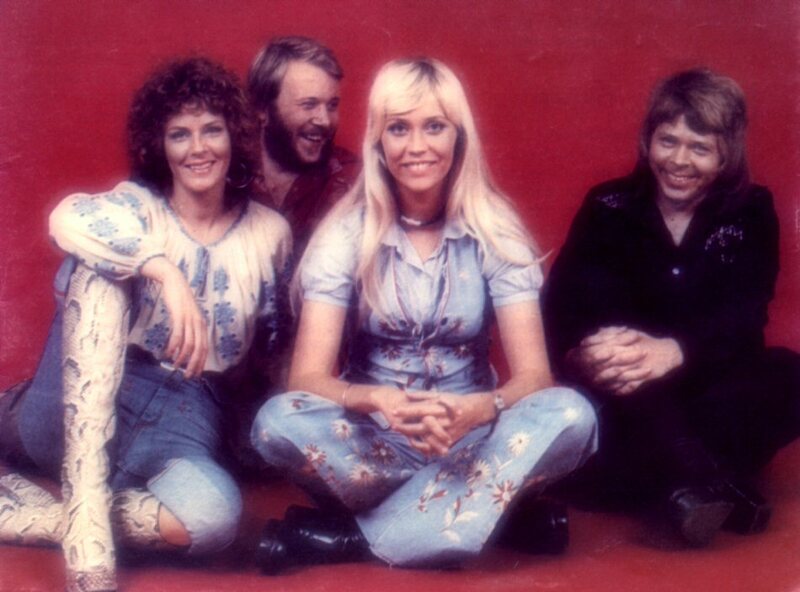 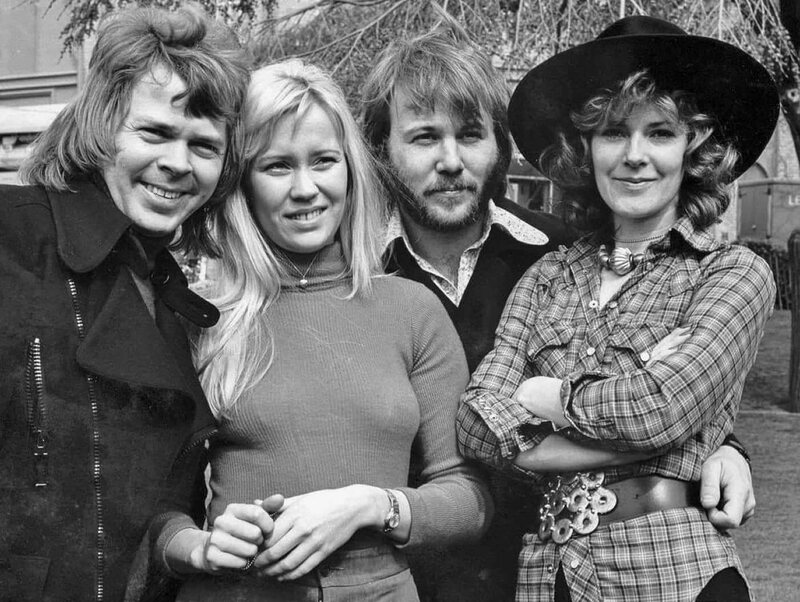 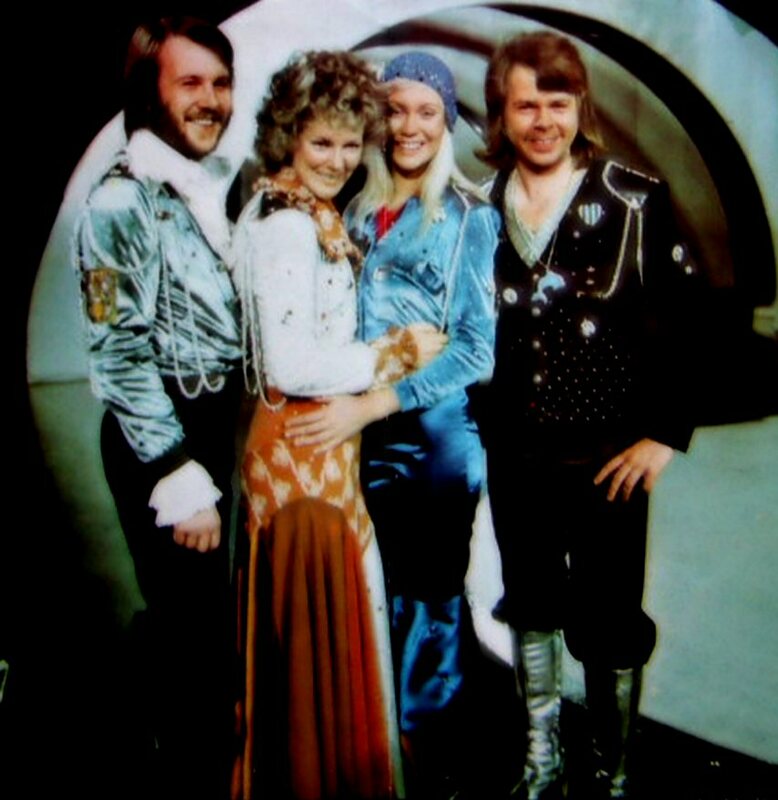 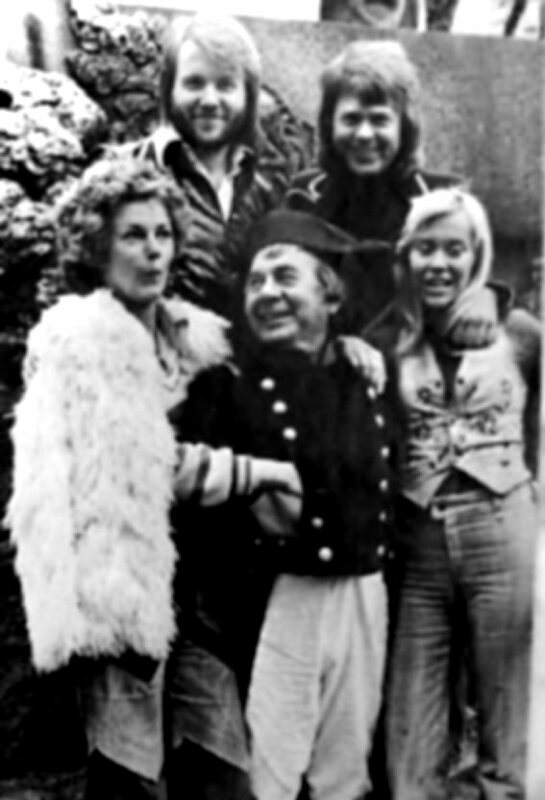 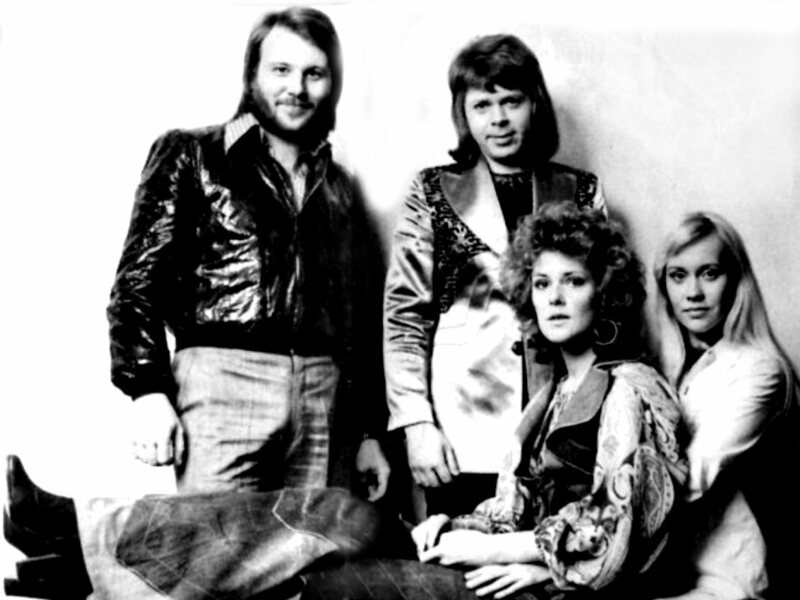 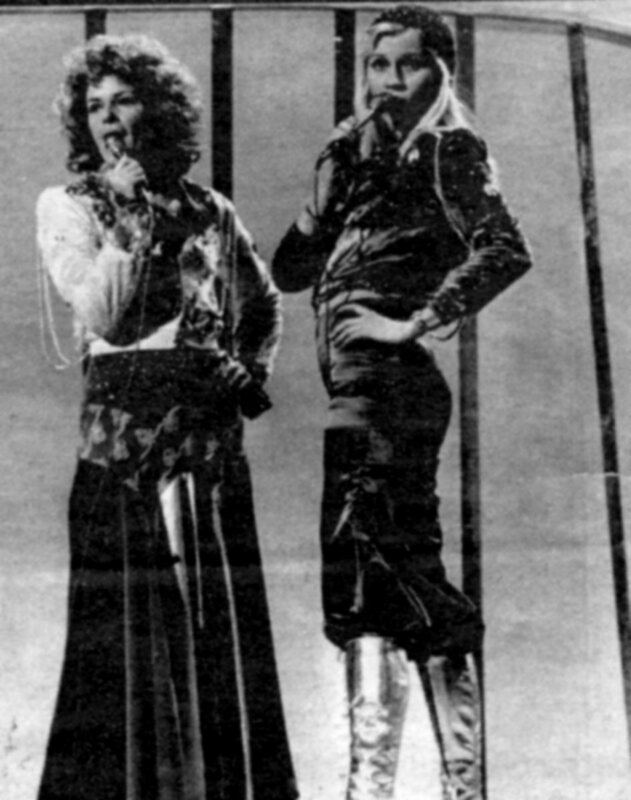 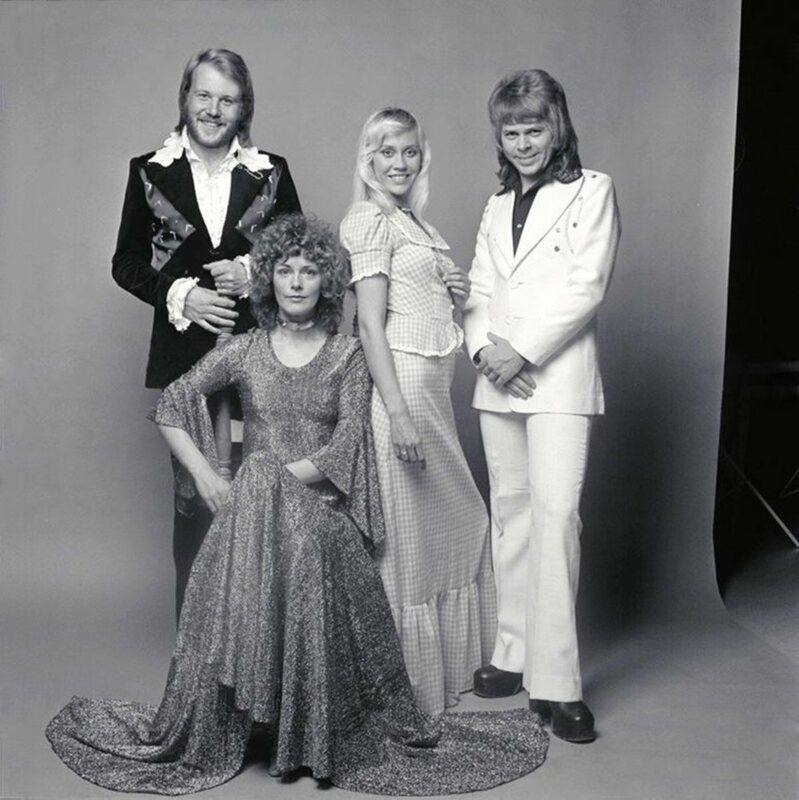 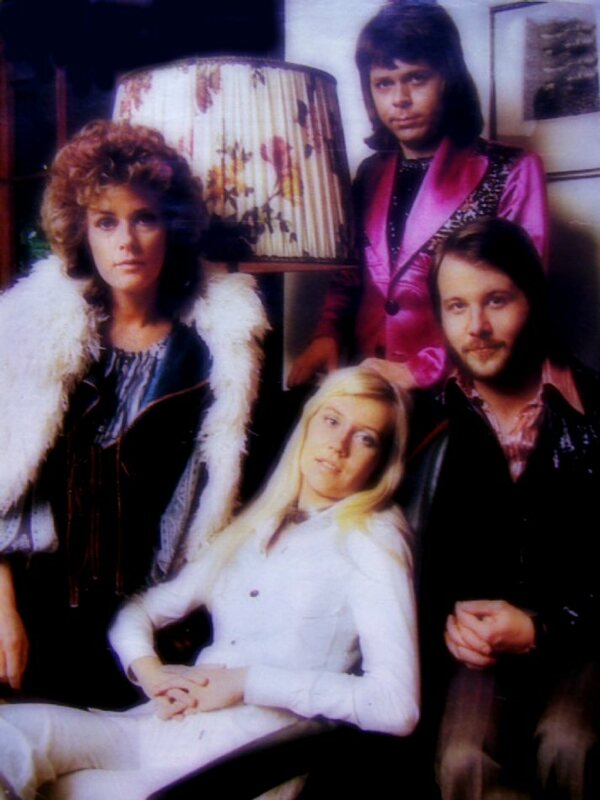 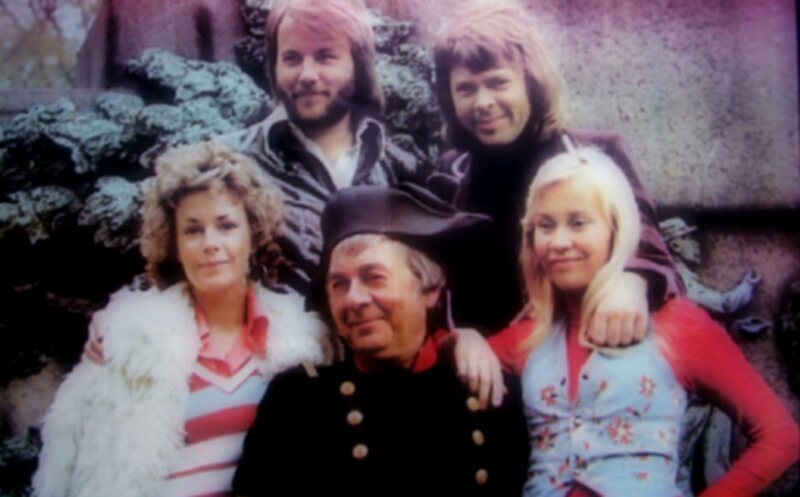 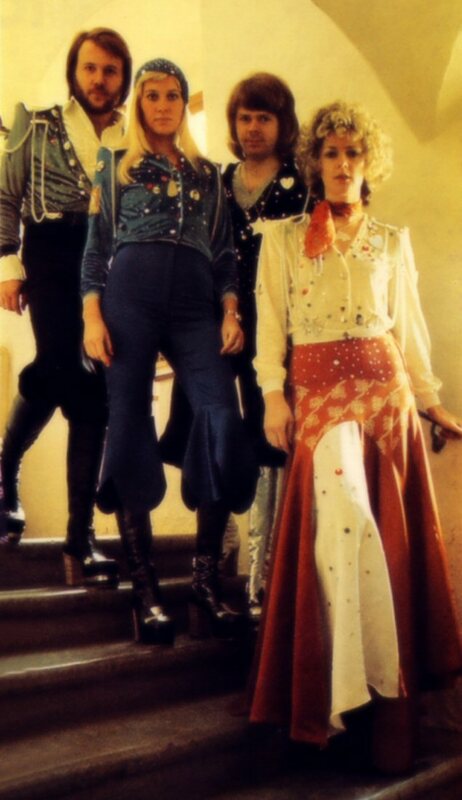 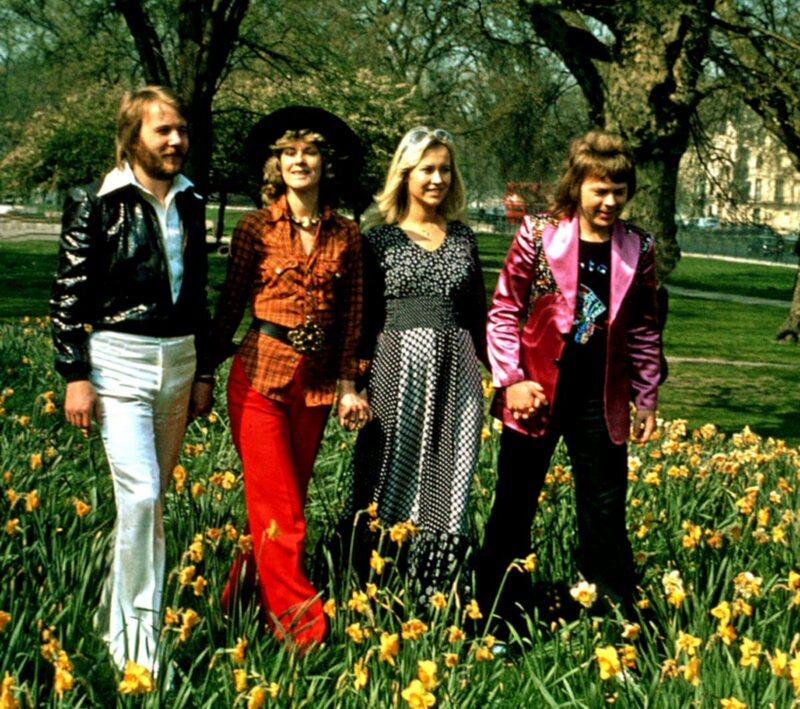 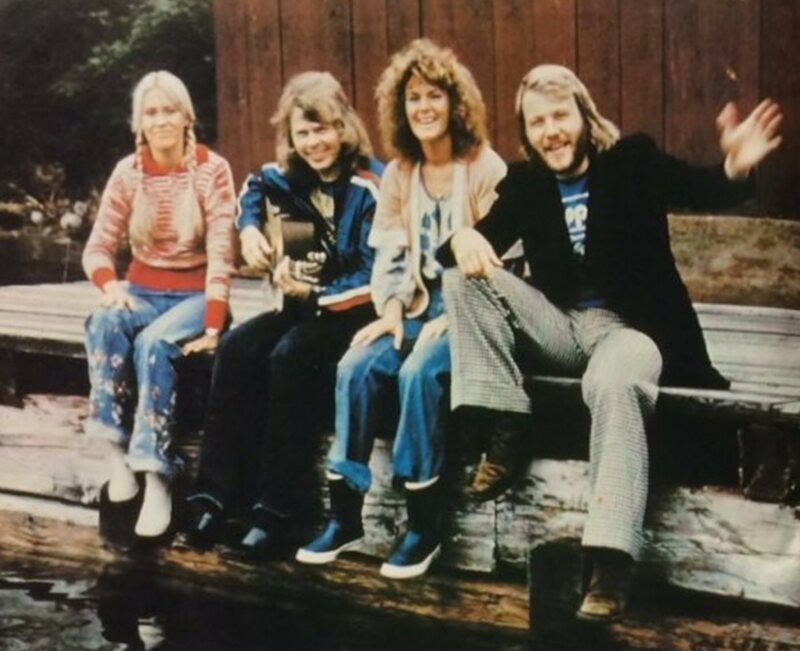 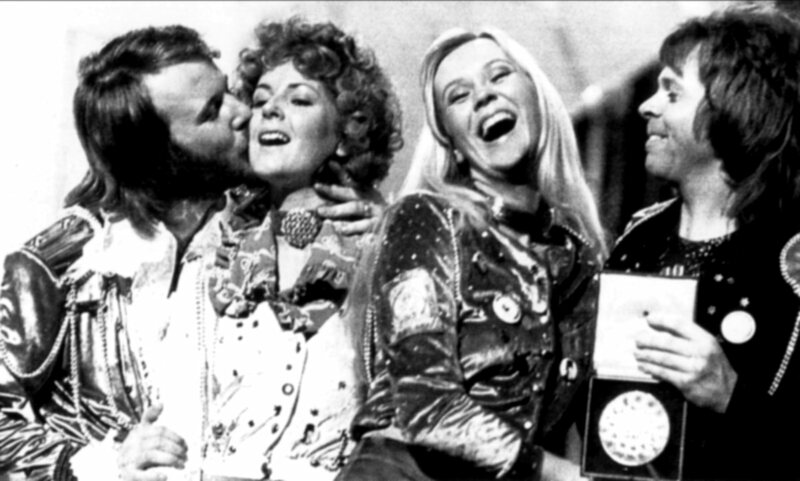 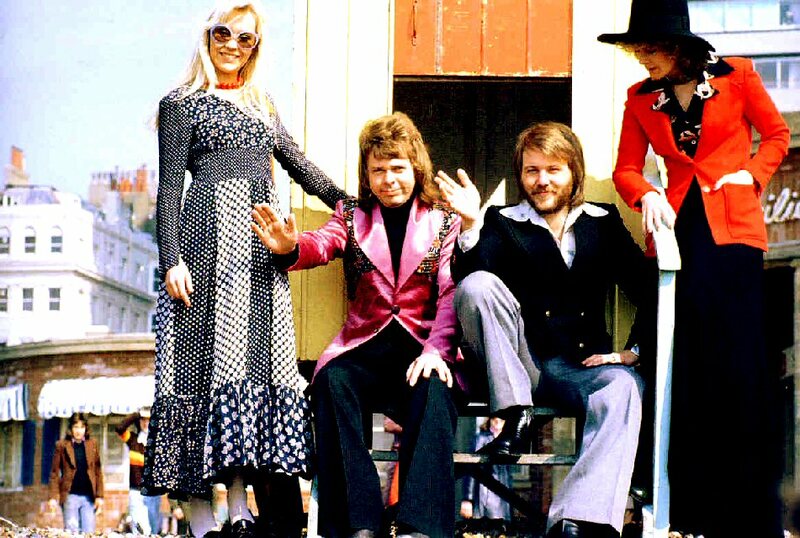 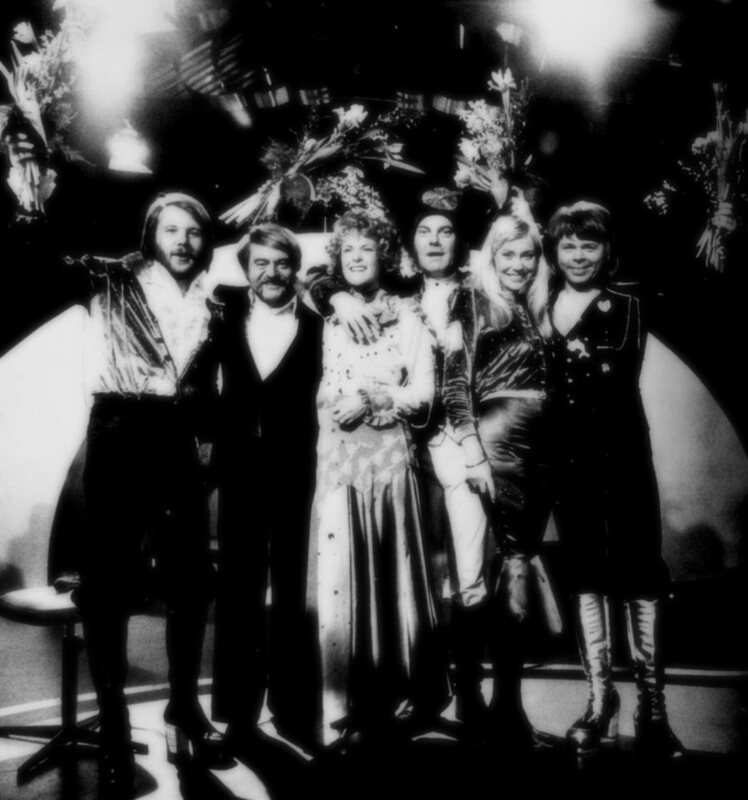 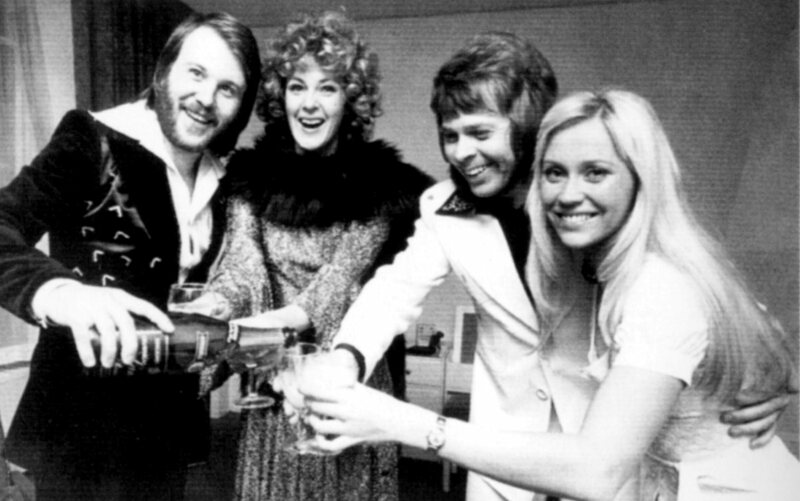 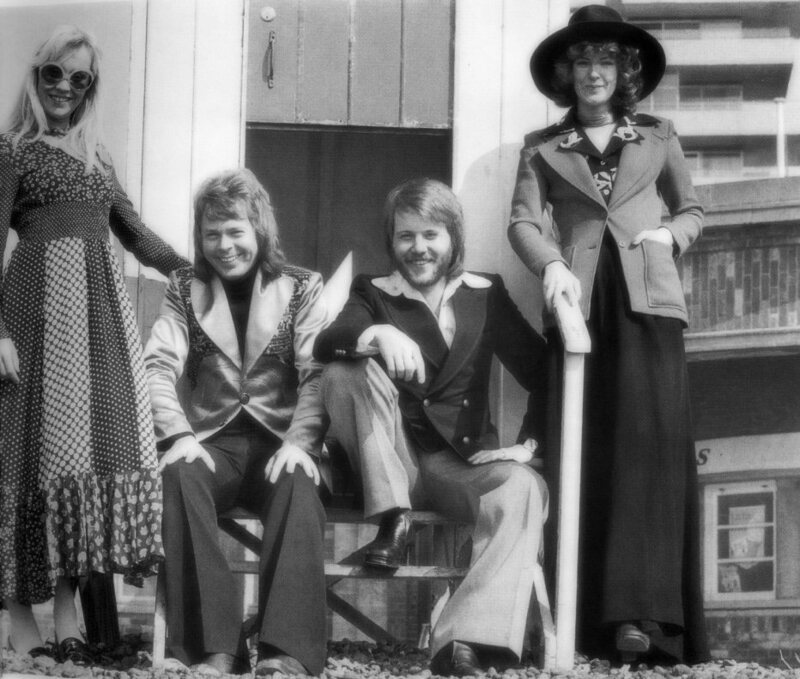 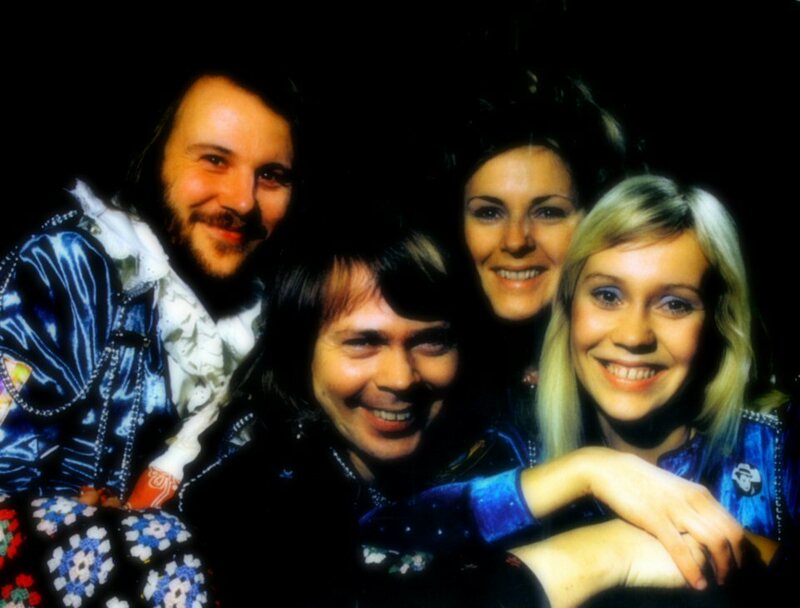 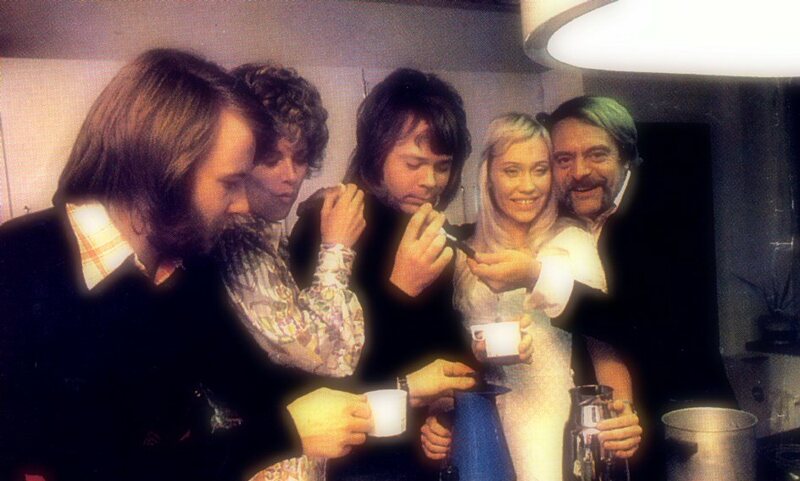 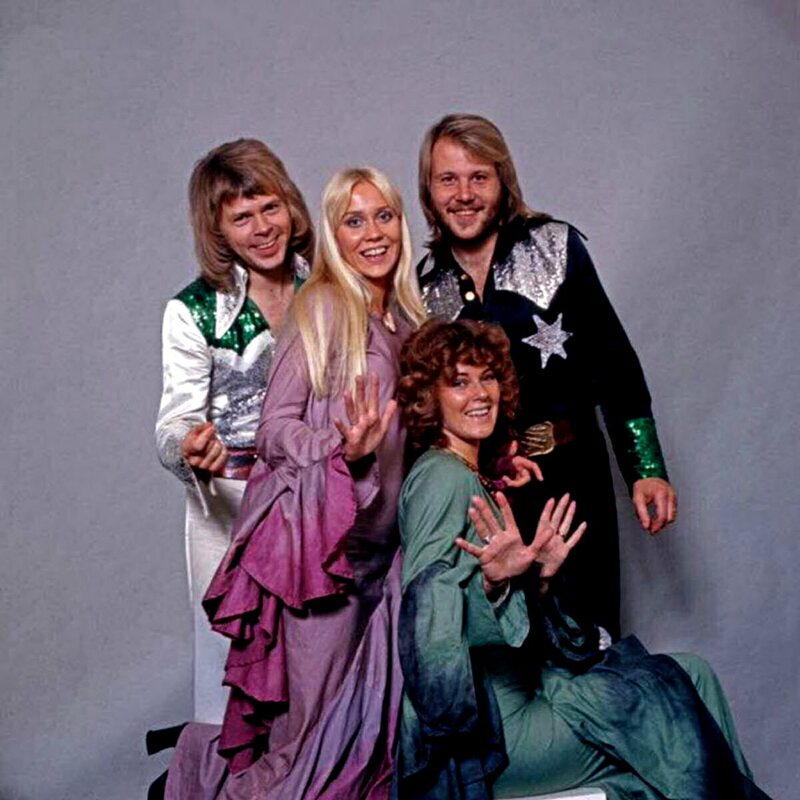 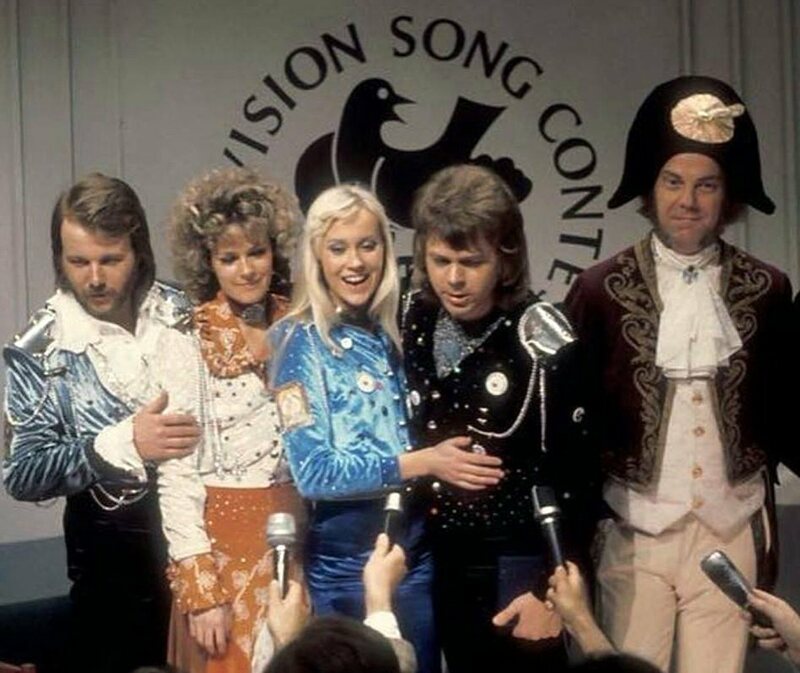 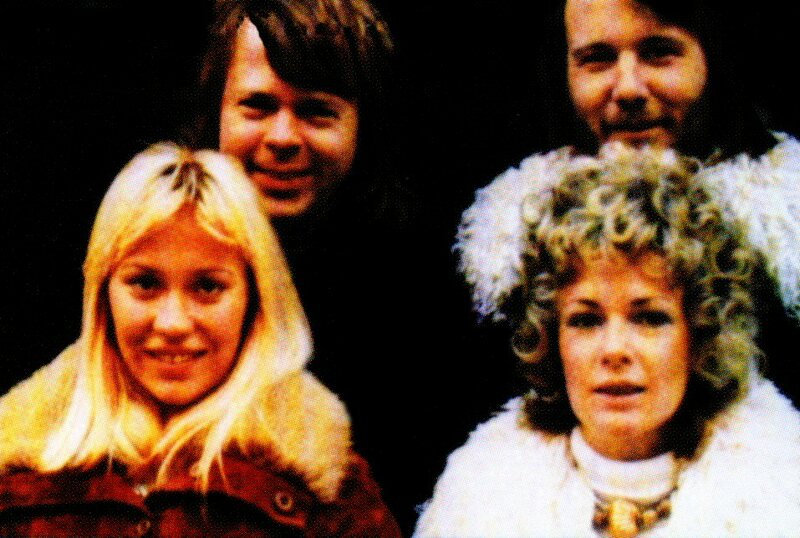 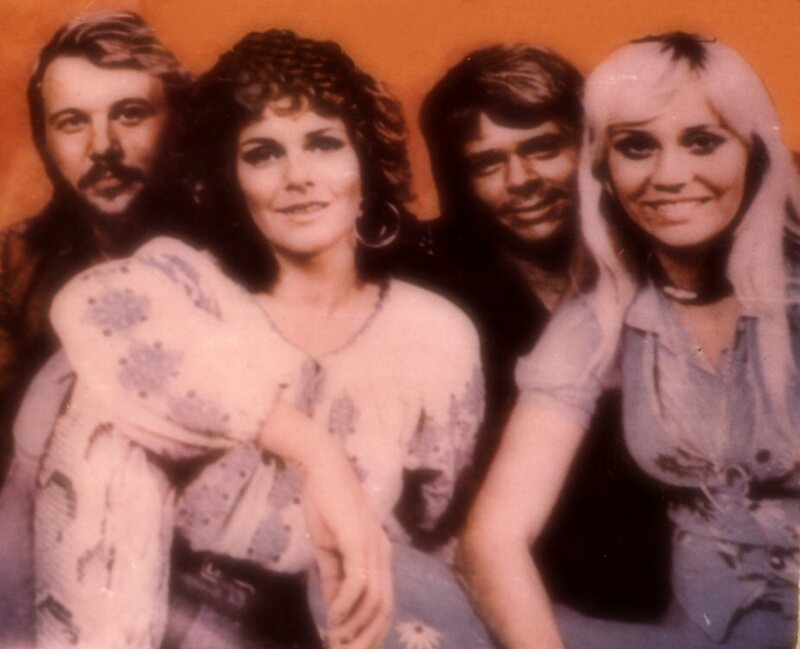 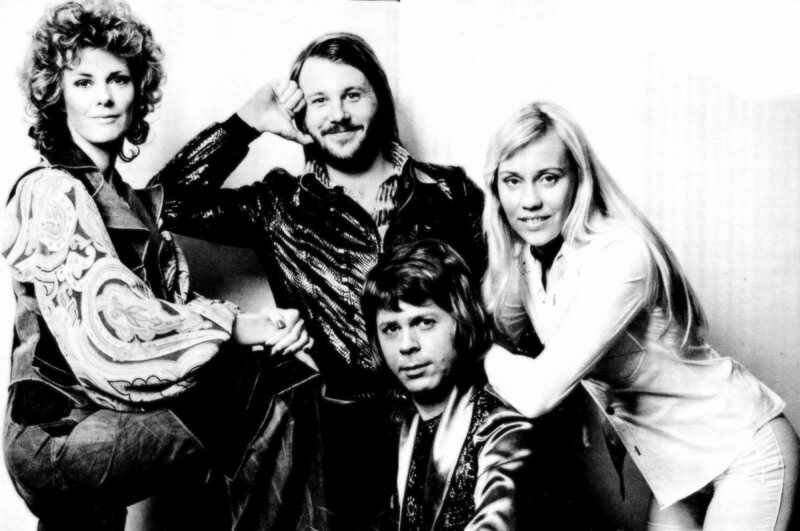 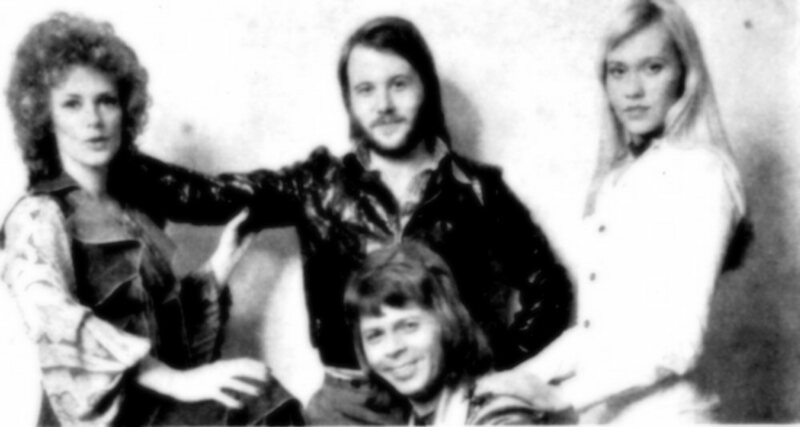 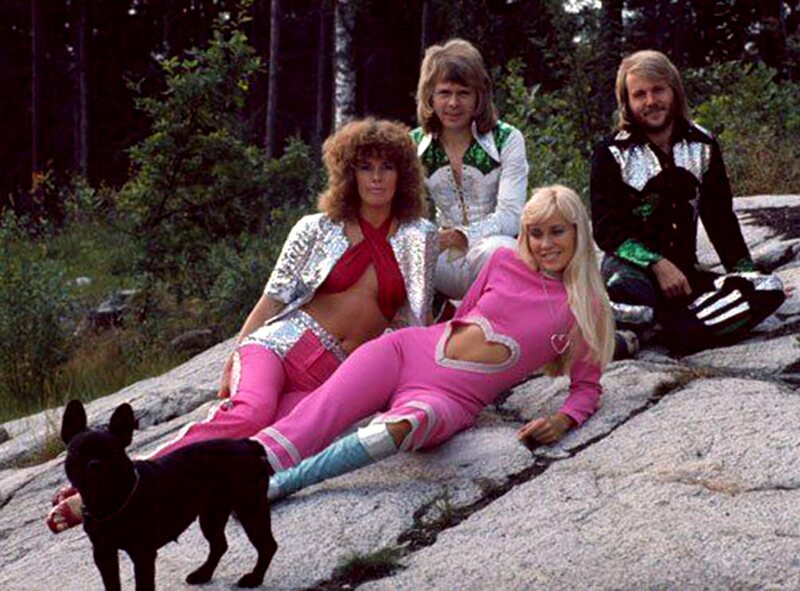 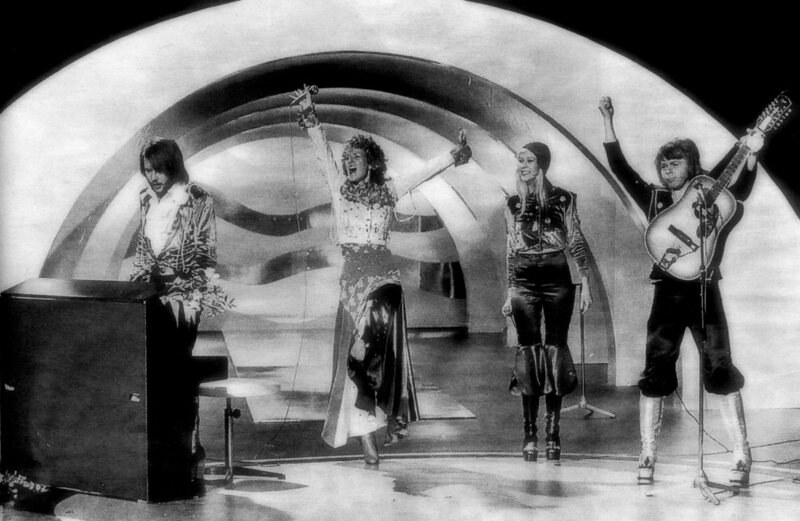 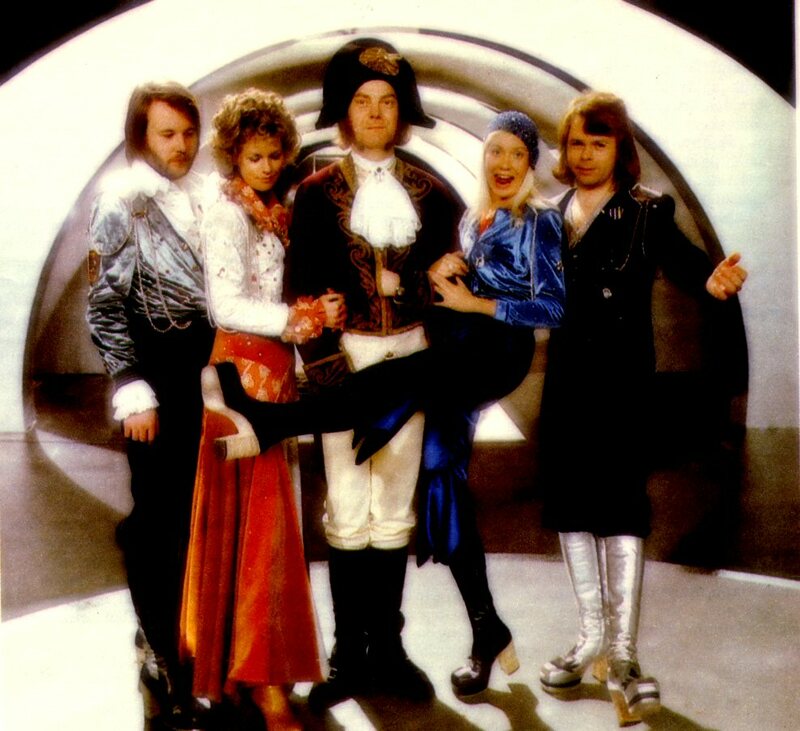 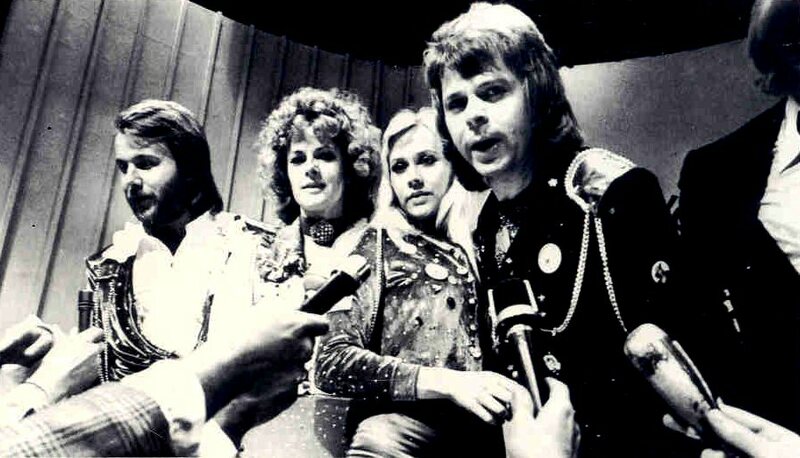 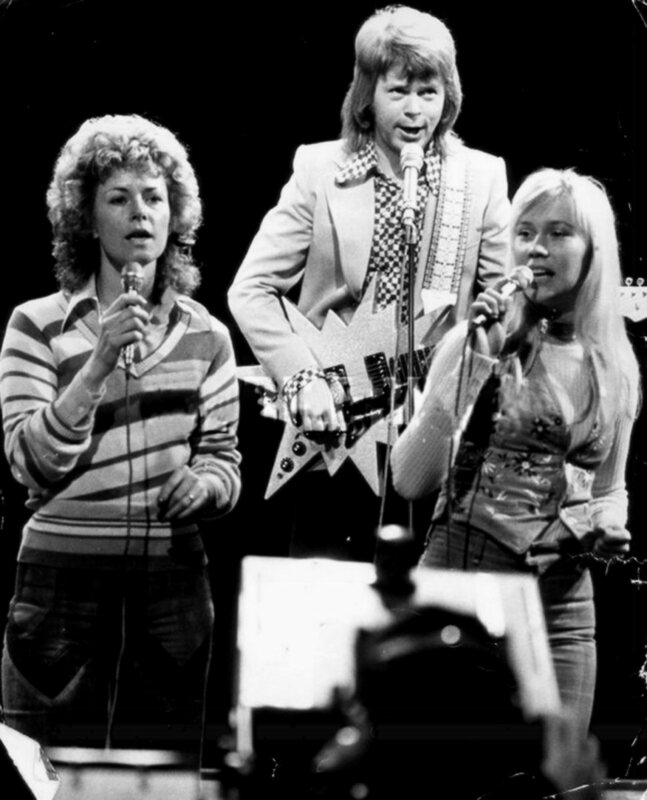 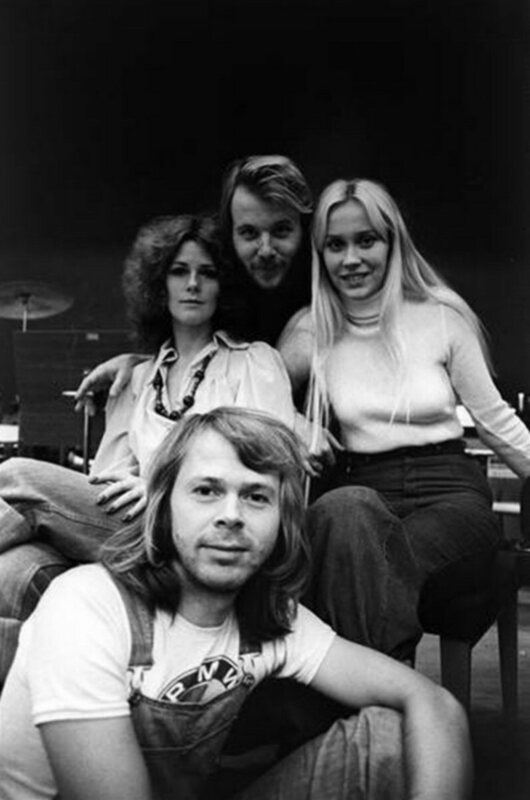 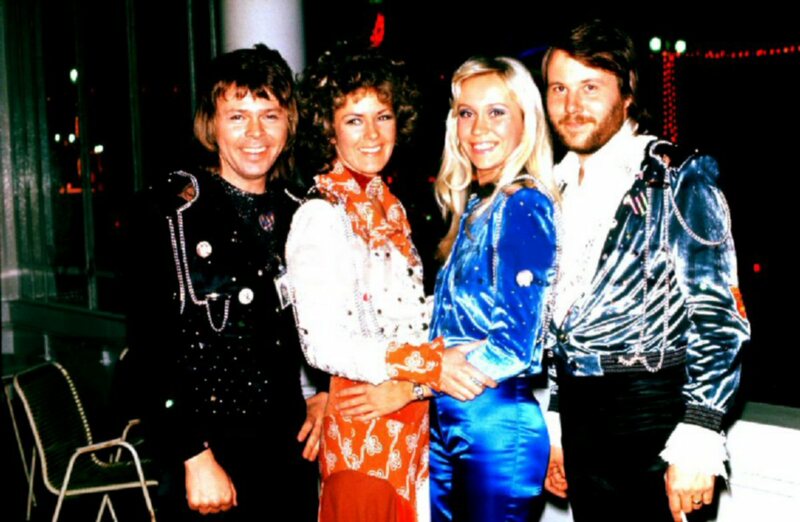 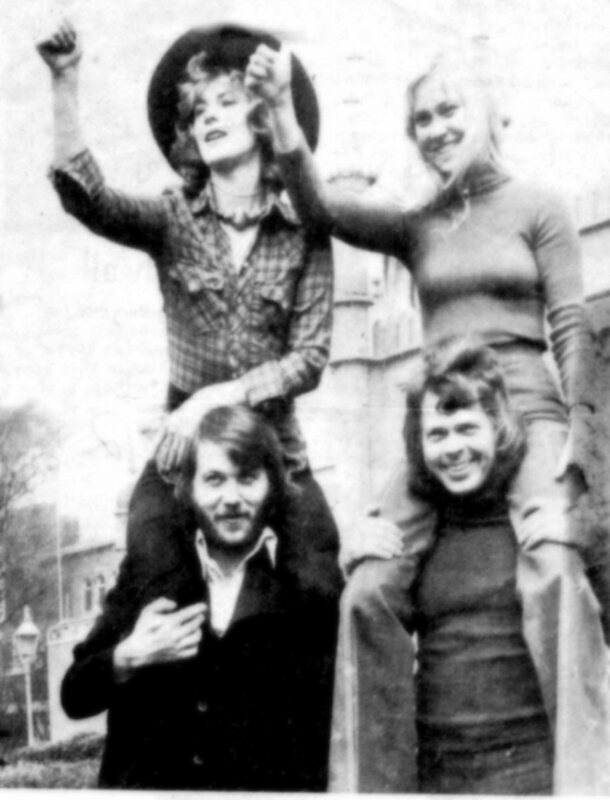 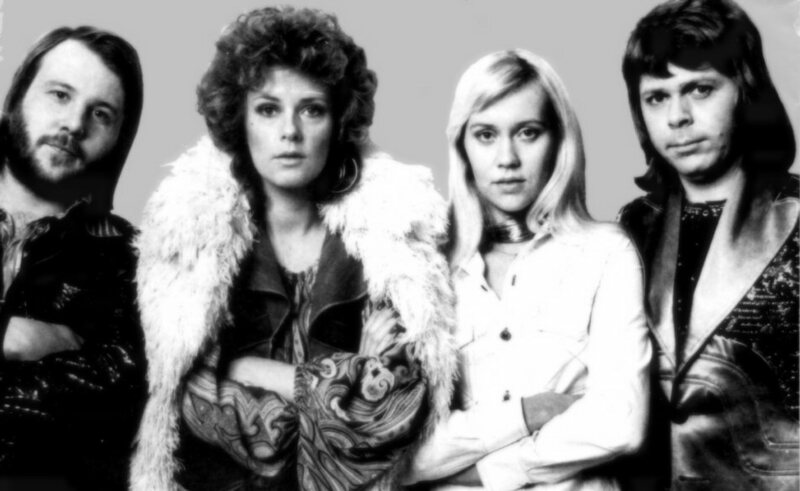 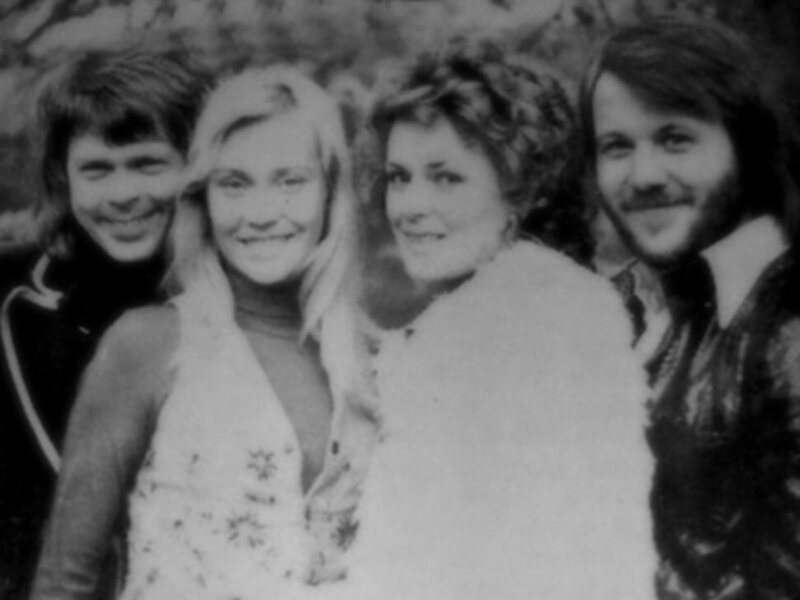 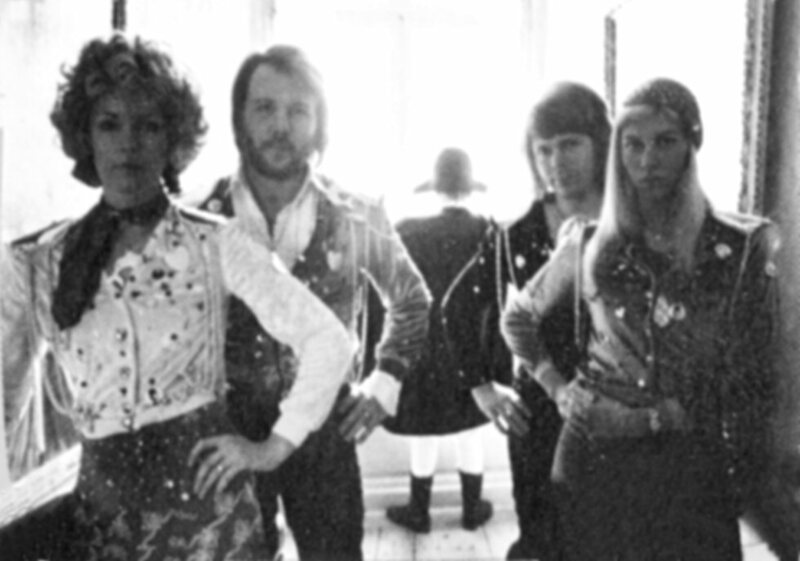 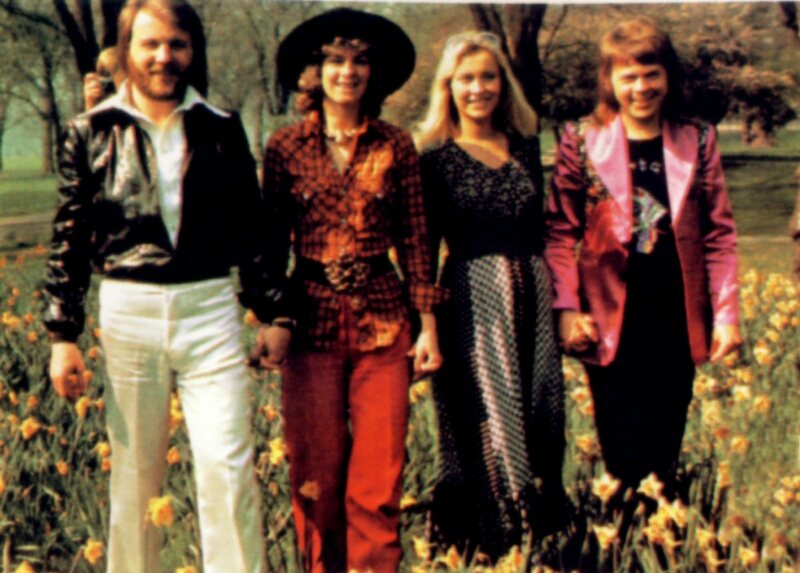 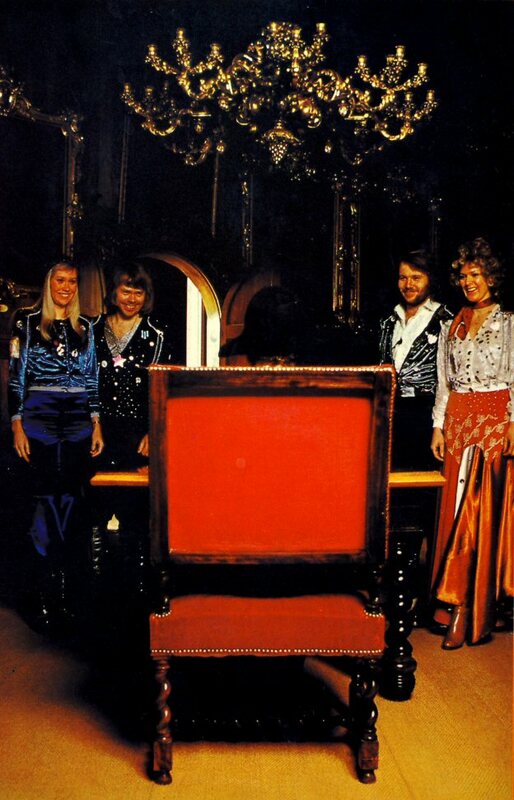 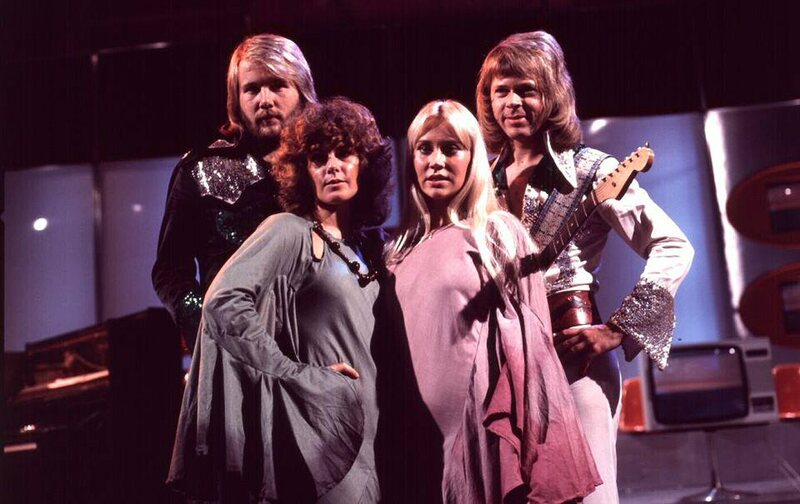 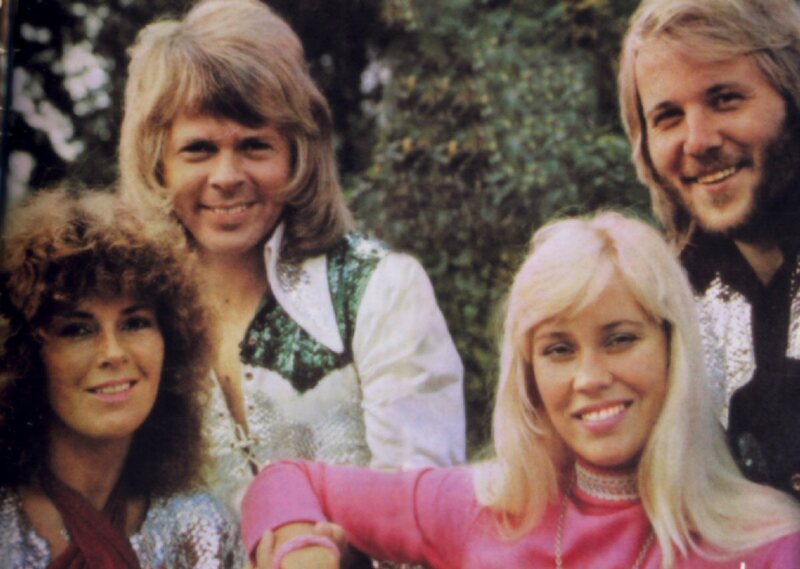 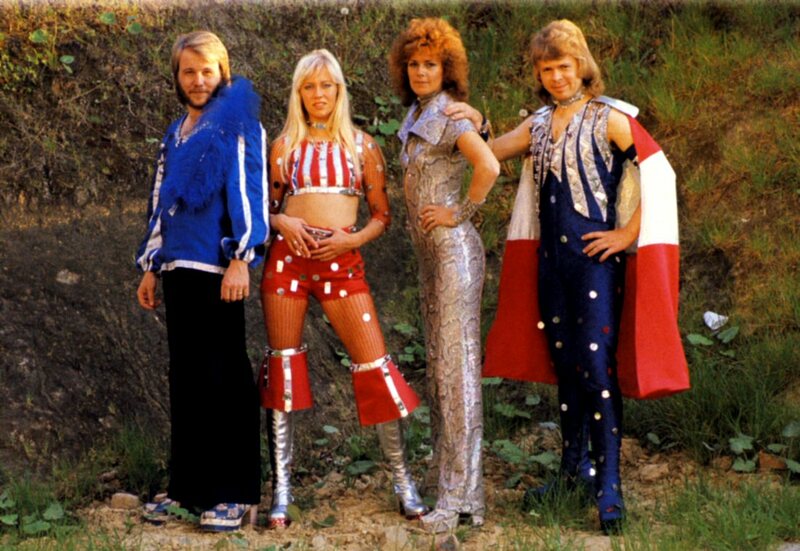 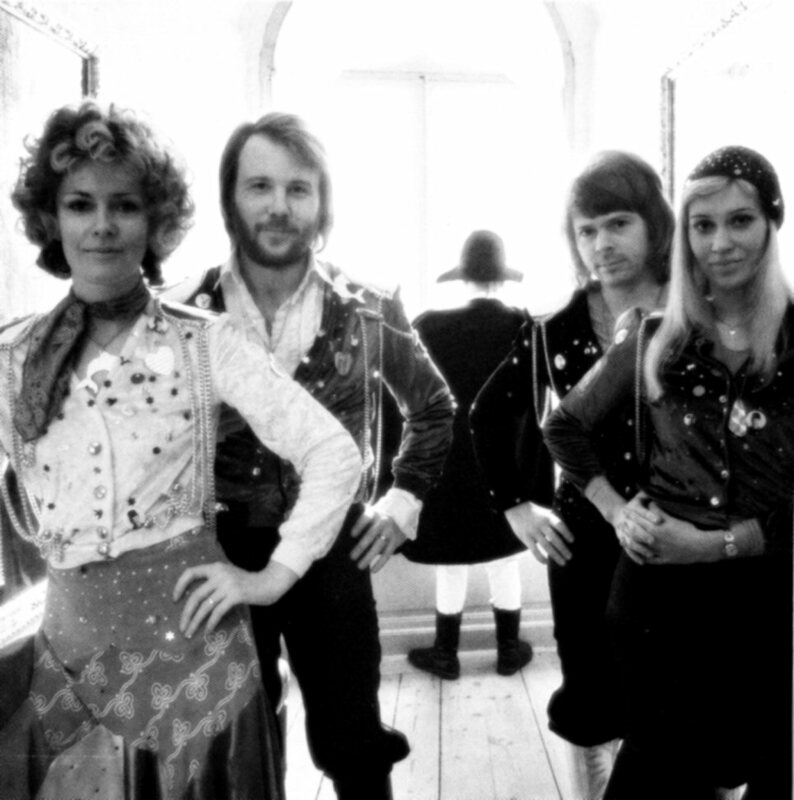 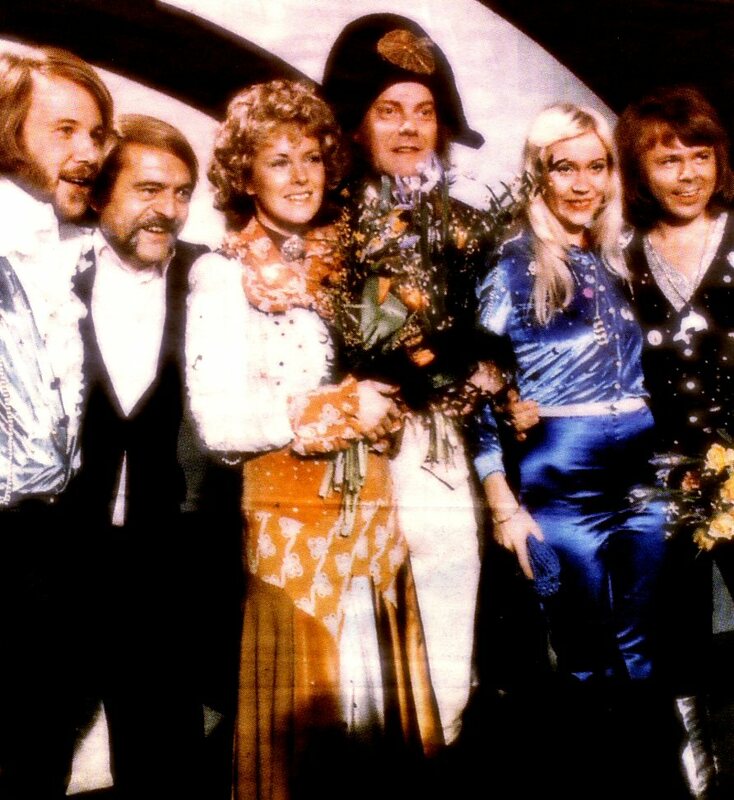 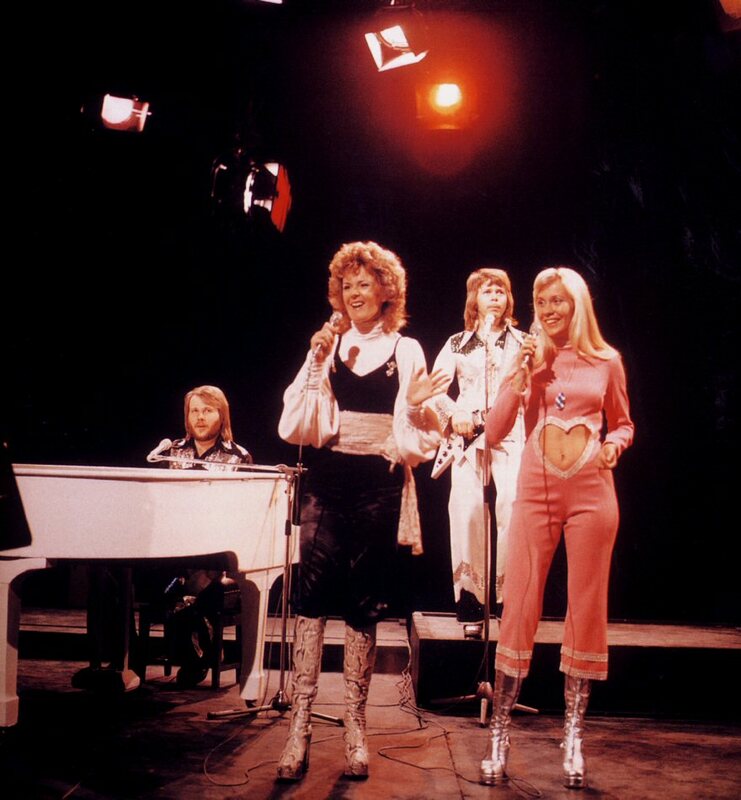 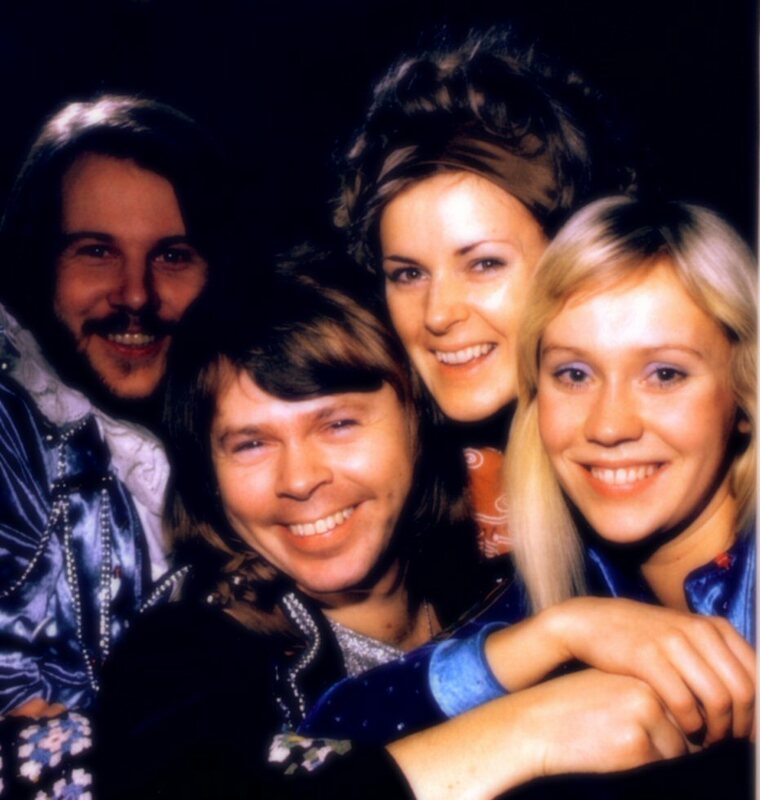 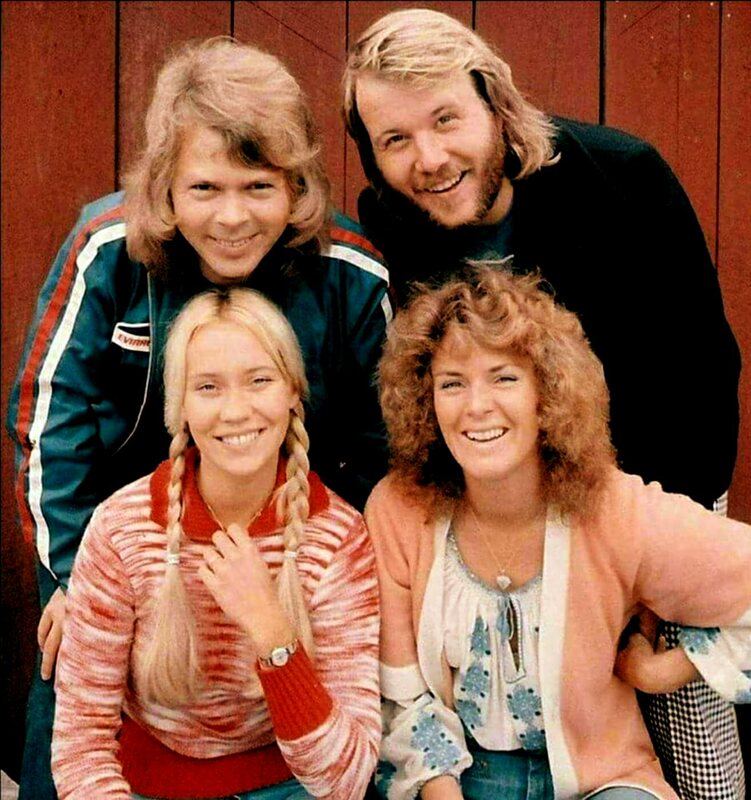 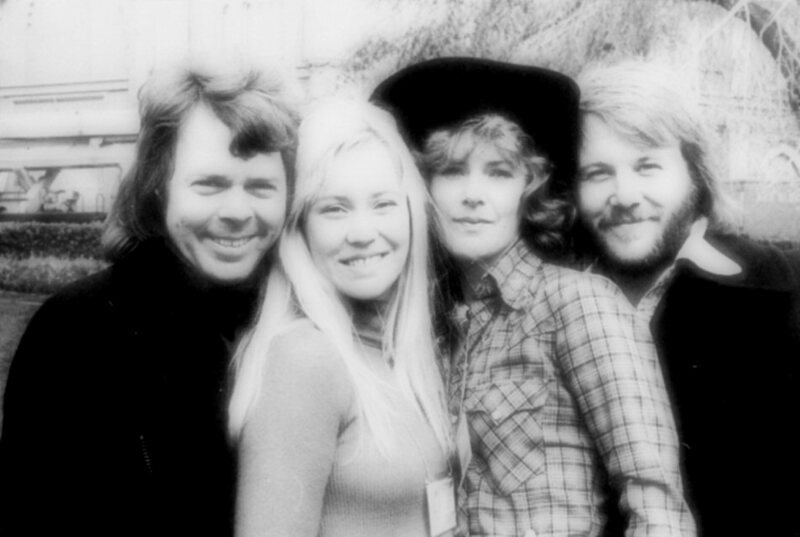 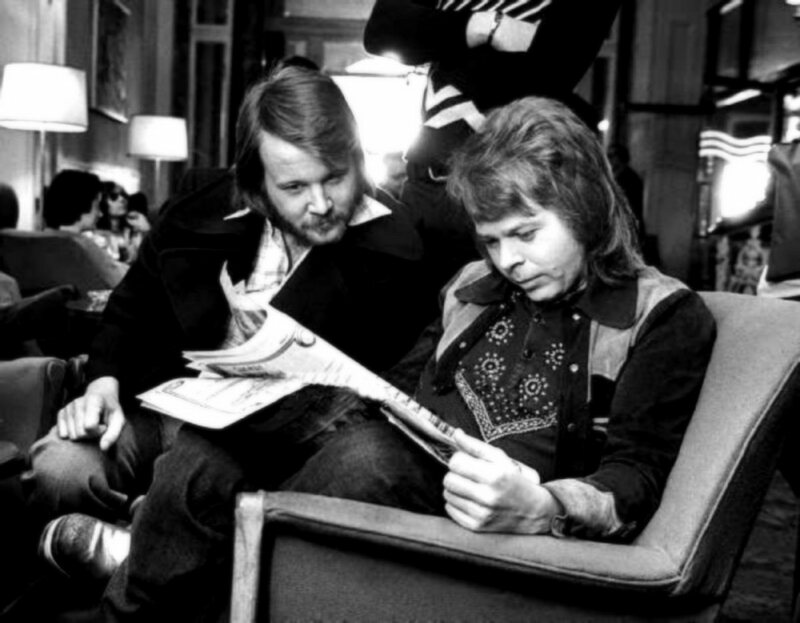 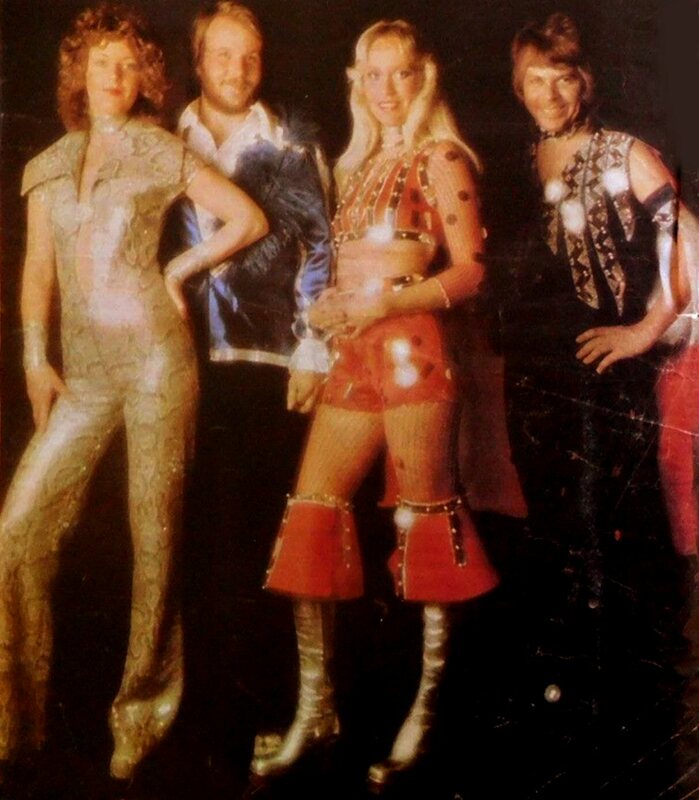 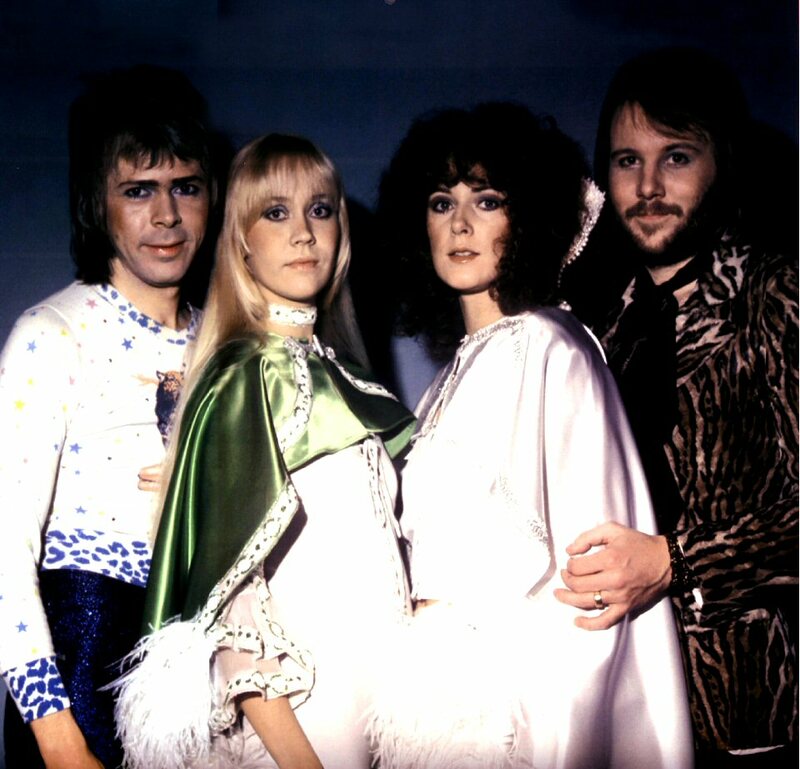 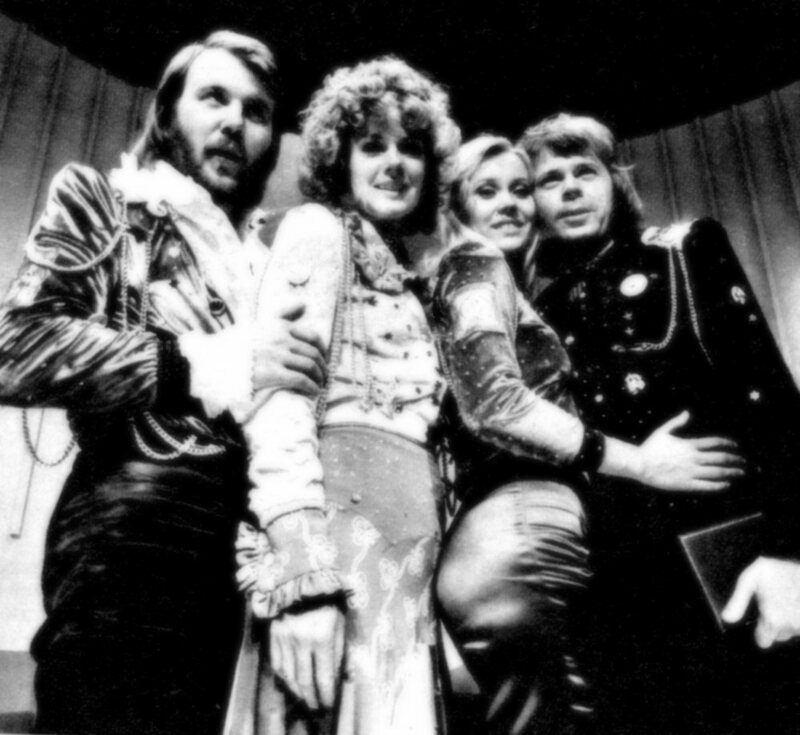 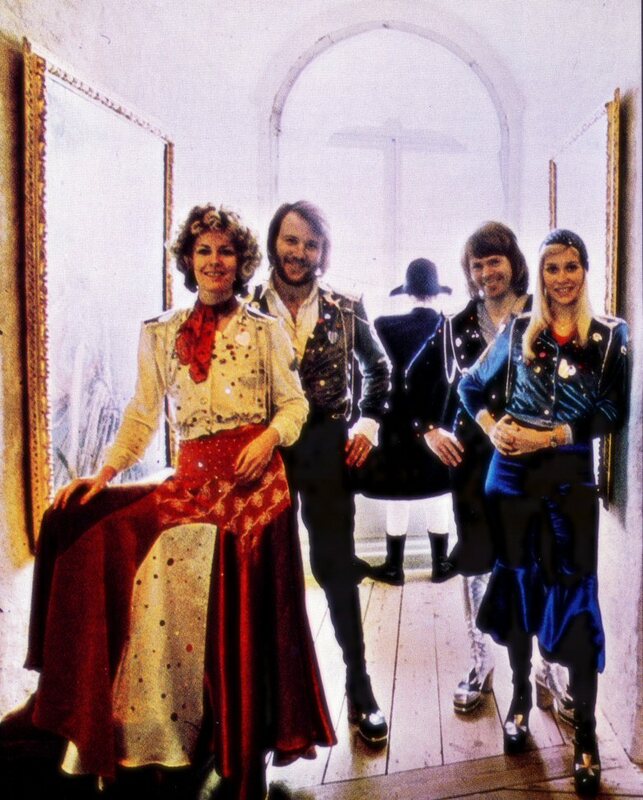 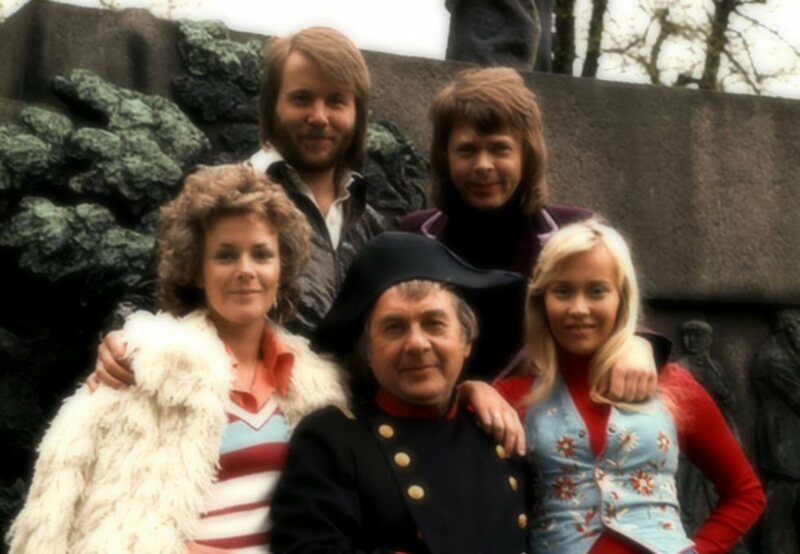 After the failure in 1973 with "Ring Ring" the group would participate in the Swedish outtake to the Eurovision Song Contest again hoping that they would win this time. 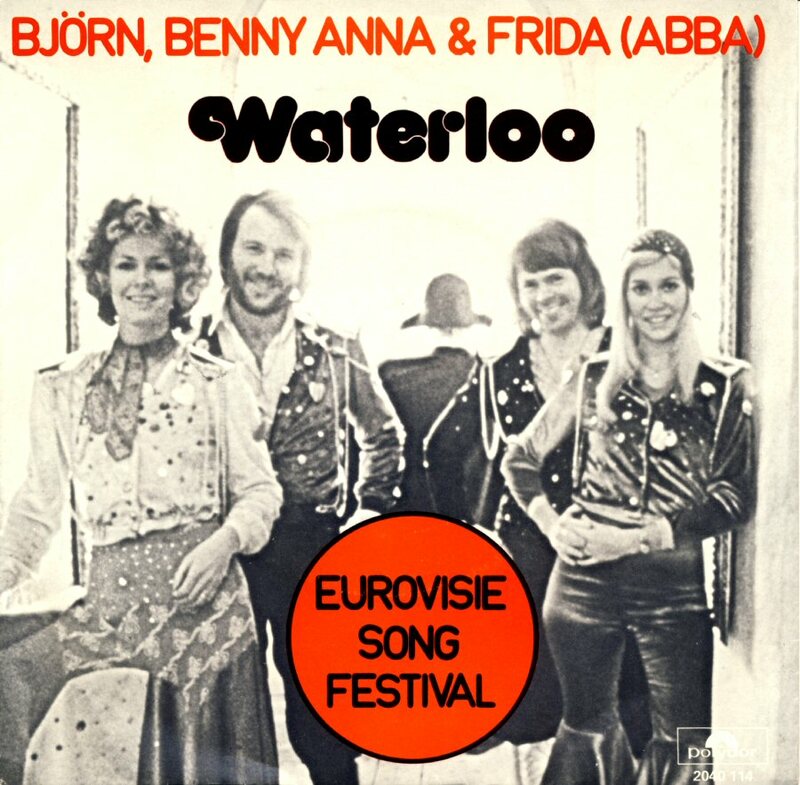 They decided to perform "Waterloo" even if "Hasta Mañana" had been taken in consideration as a very good song for ESC. 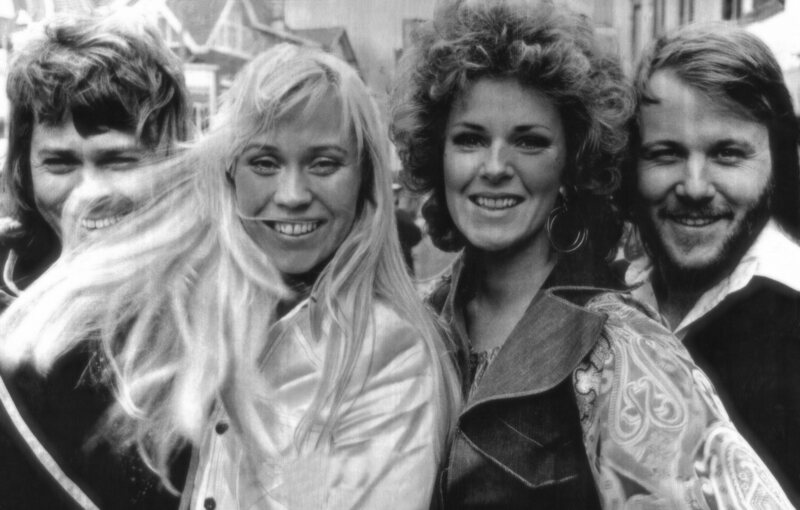 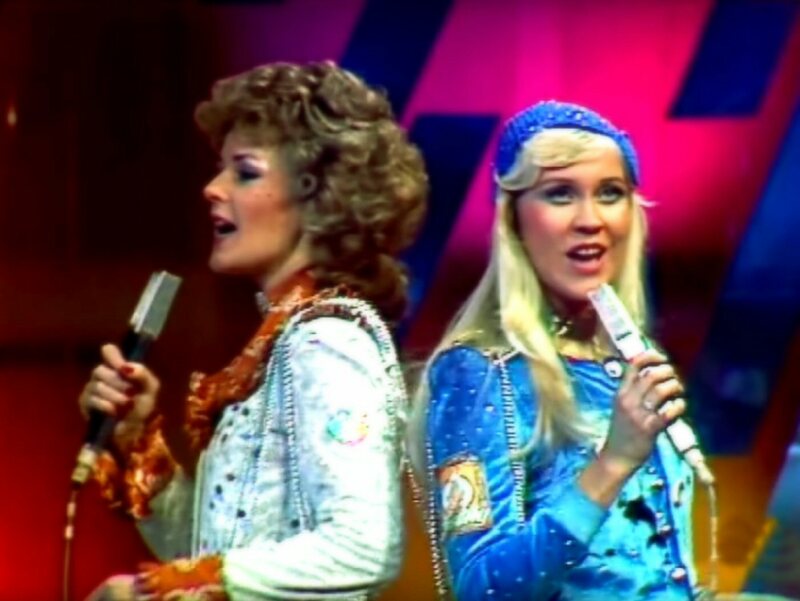 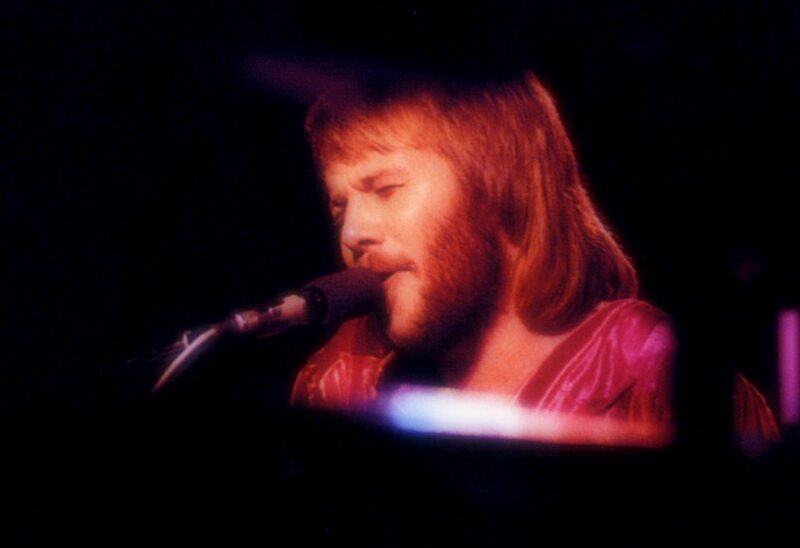 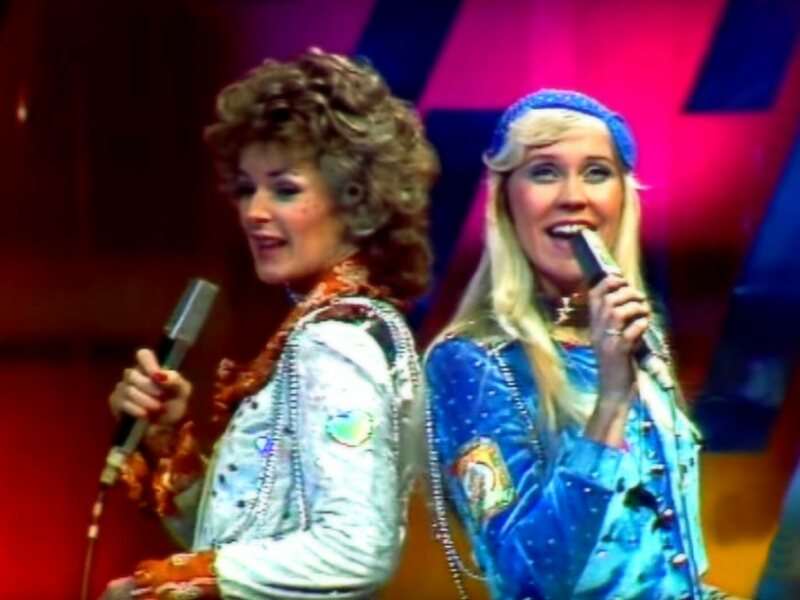 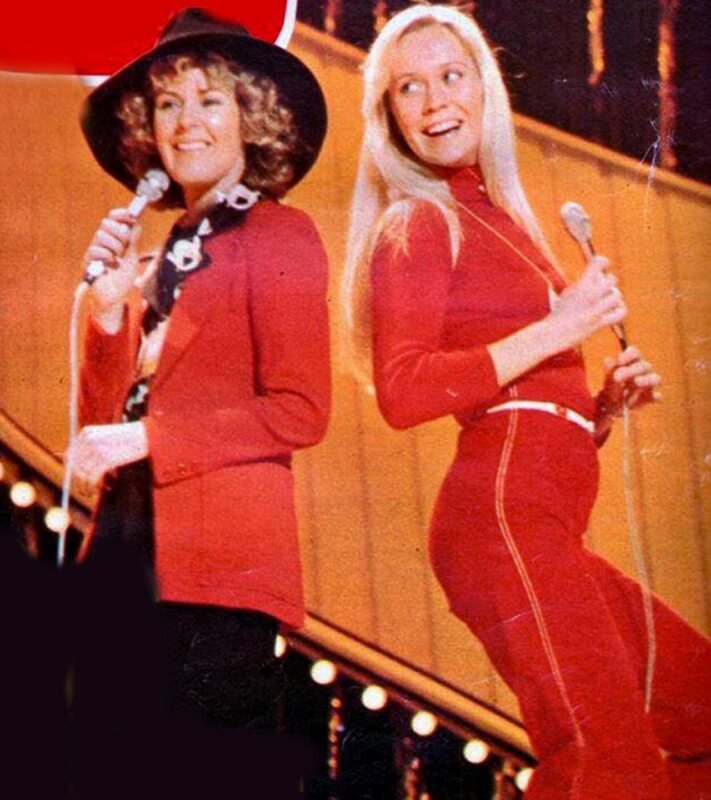 The only "problem" with "Hasta Manana" was that the song featured Agnetha singing lead vocal and it was important to present both girls as equally important singers in the group. 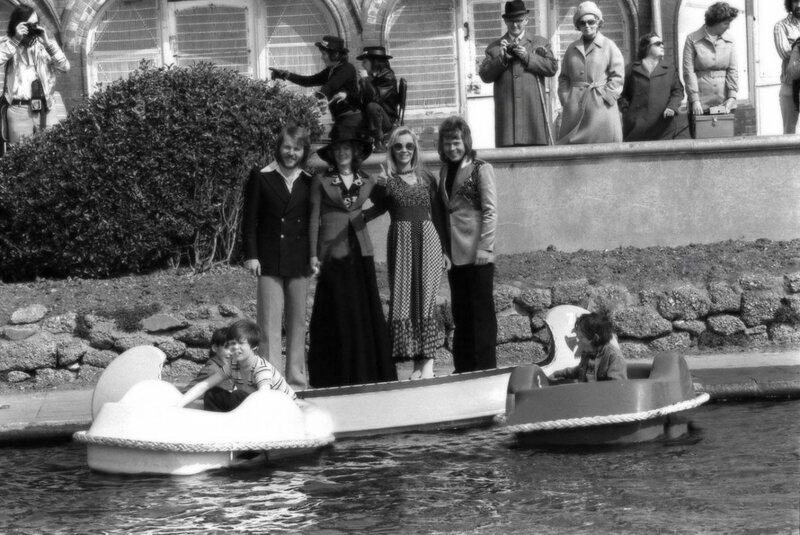 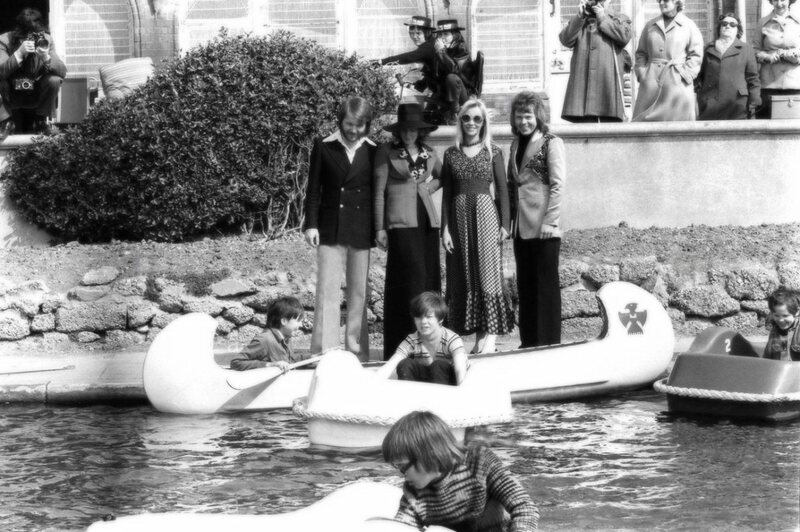 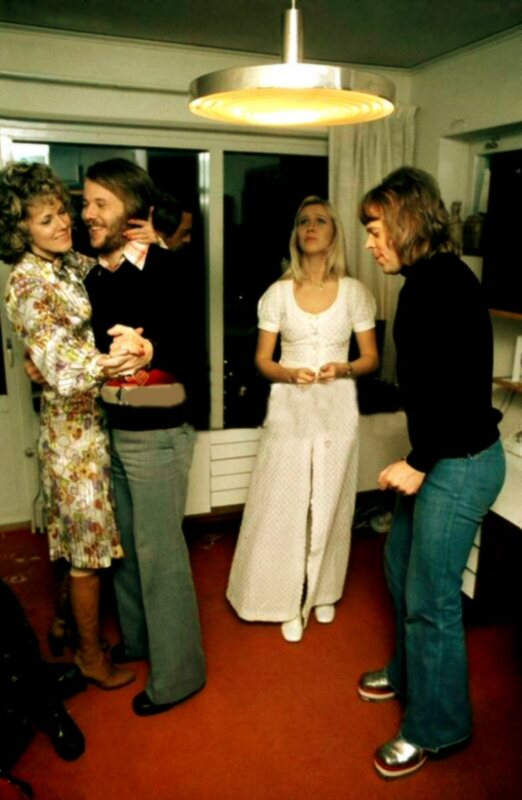 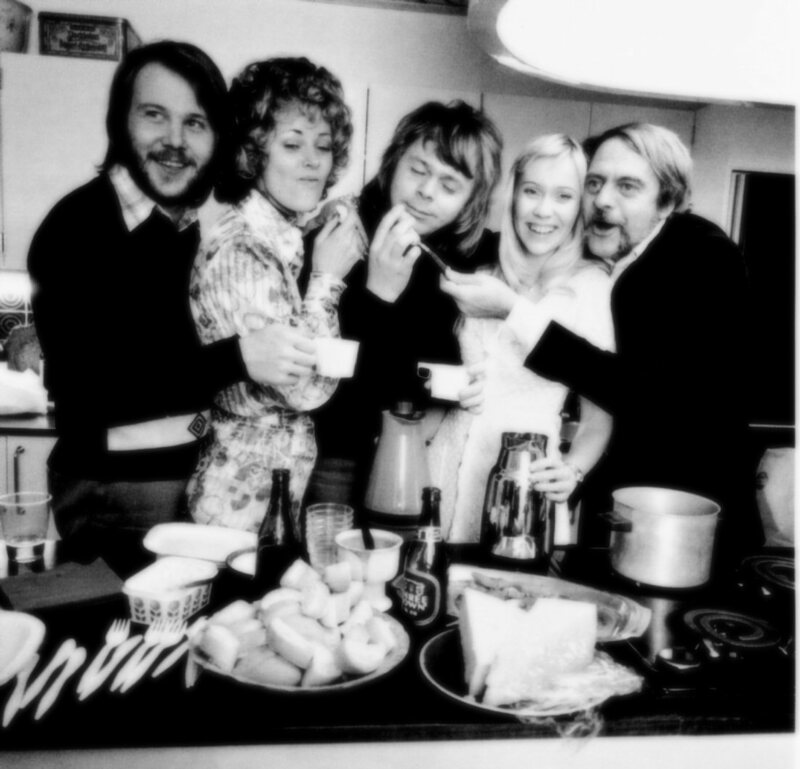 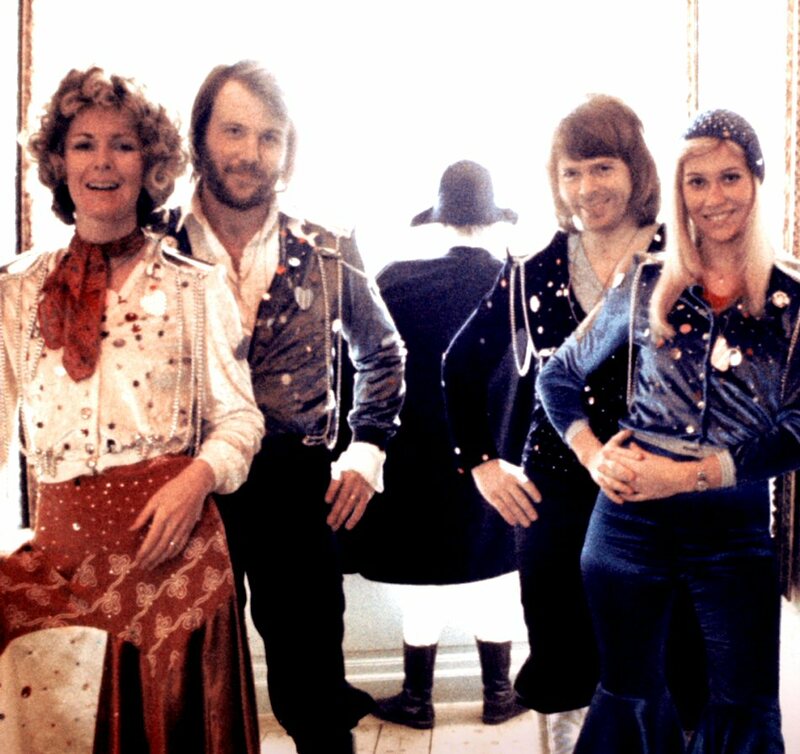 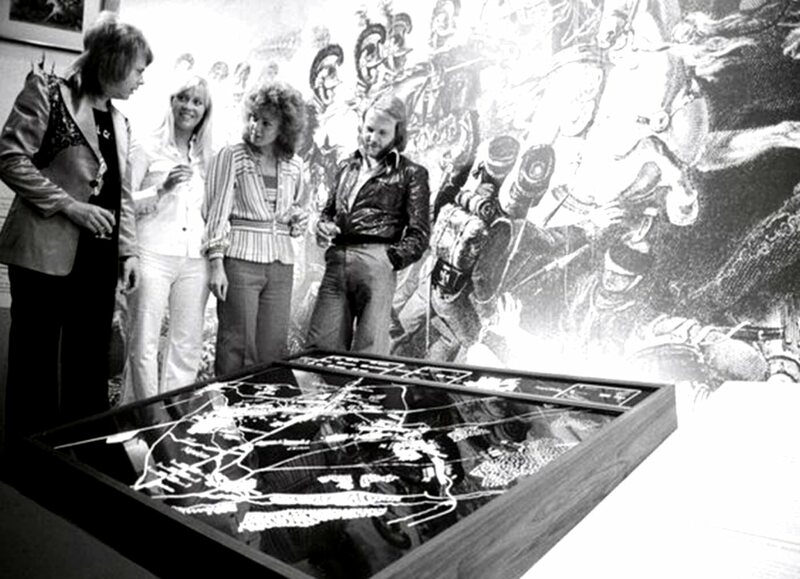 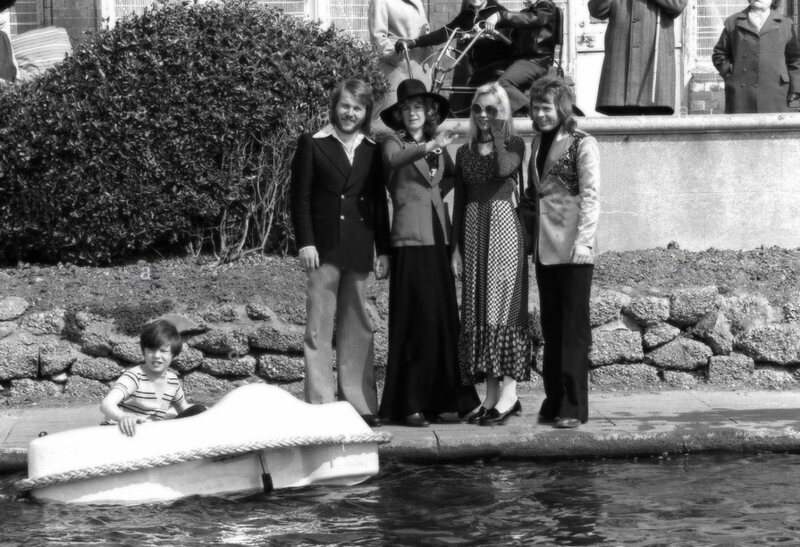 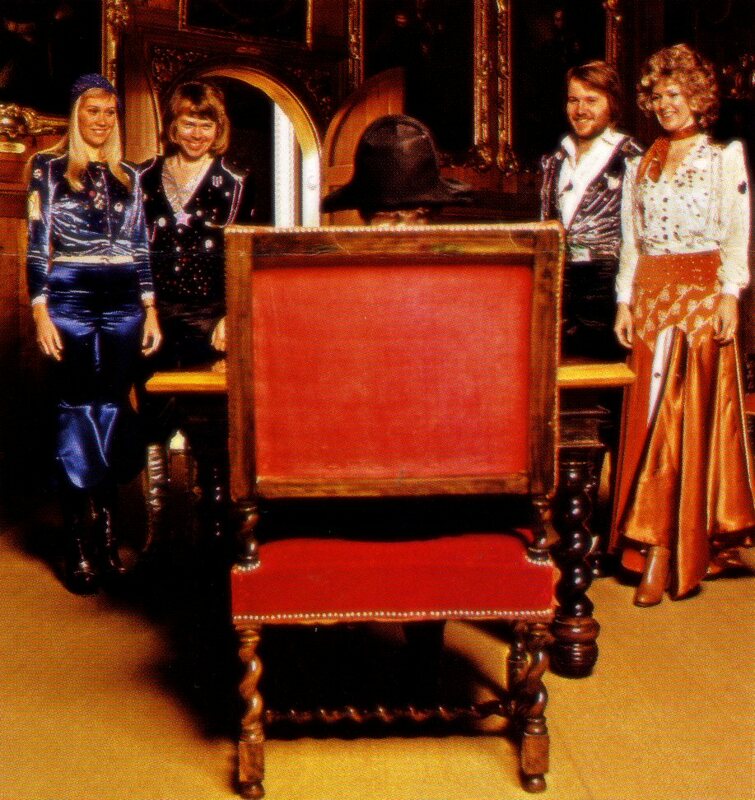 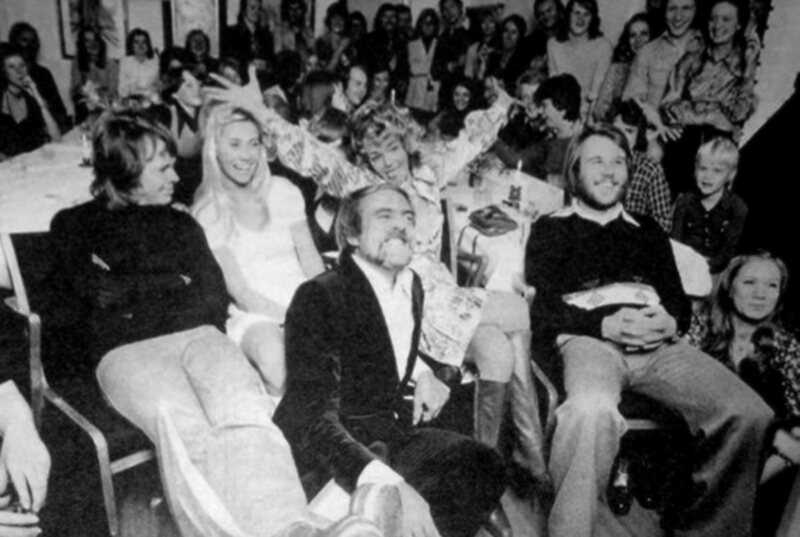 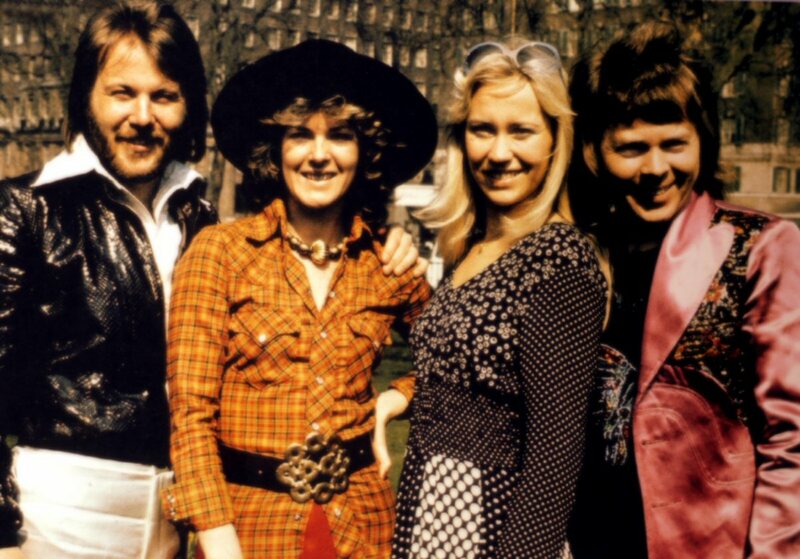 On 9 February 1974 ABBA won in the Swedish outtake to the Eurovision Song Contest and it was of course celebrated by the ABBA team in Stikkans house in Nacka outside Stockholm. 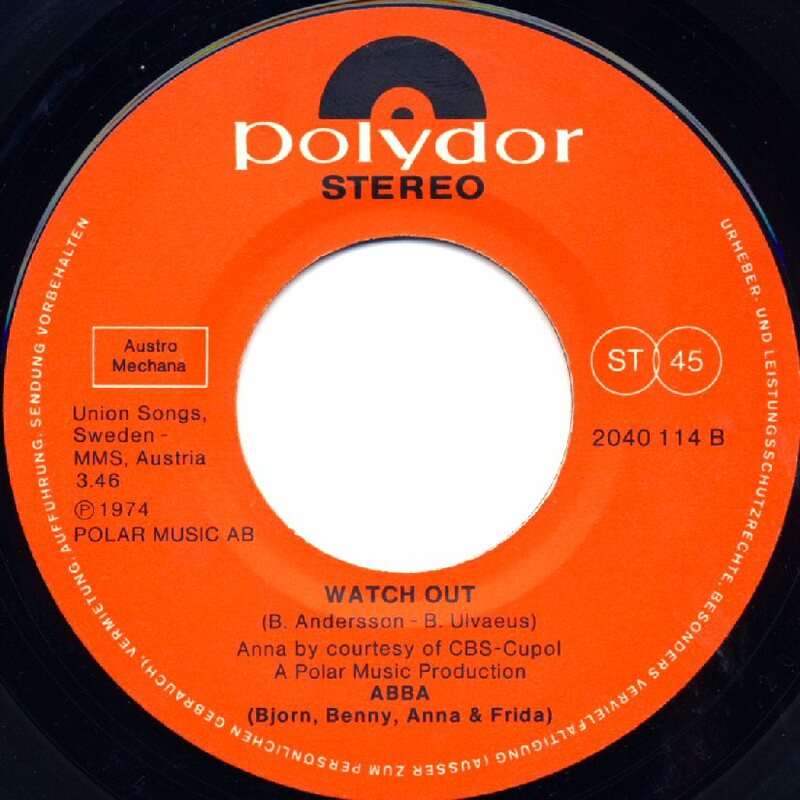 A big promotional campaign had been started by Stikkan Anderson who went on a promotional trip around Europe and paid visit at record companies which could be possible cooperation partners in the future. 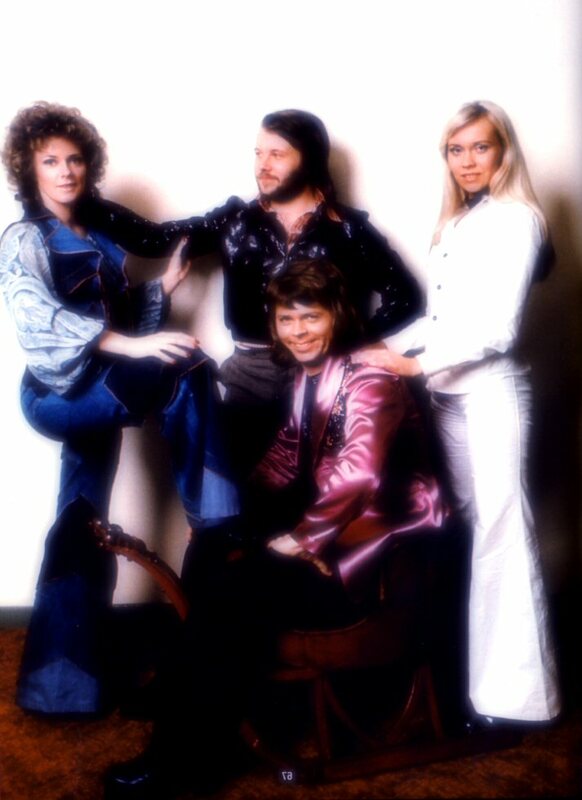 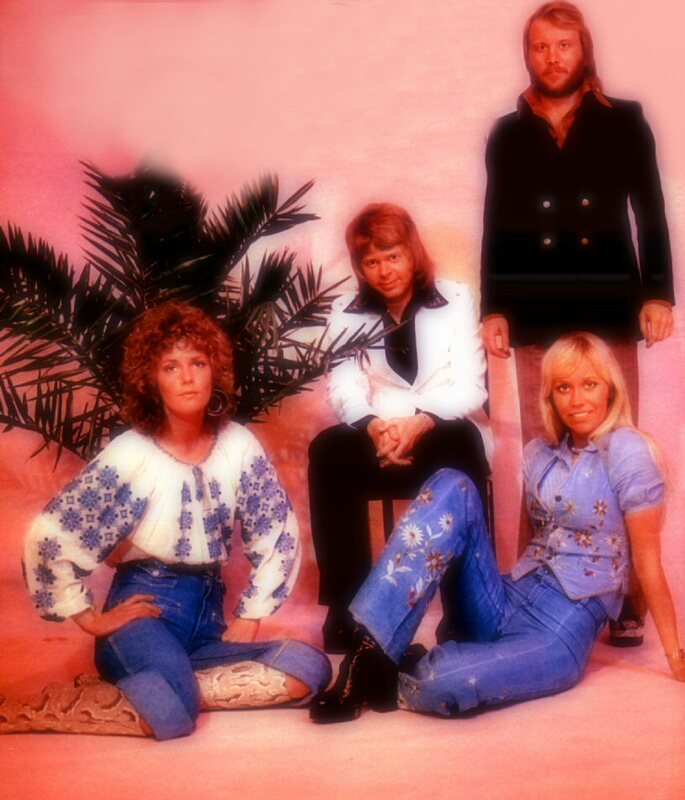 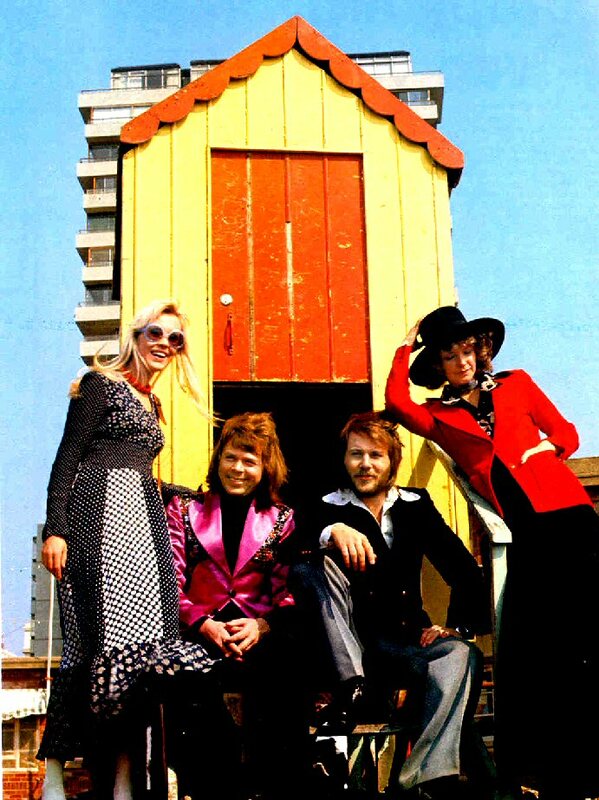 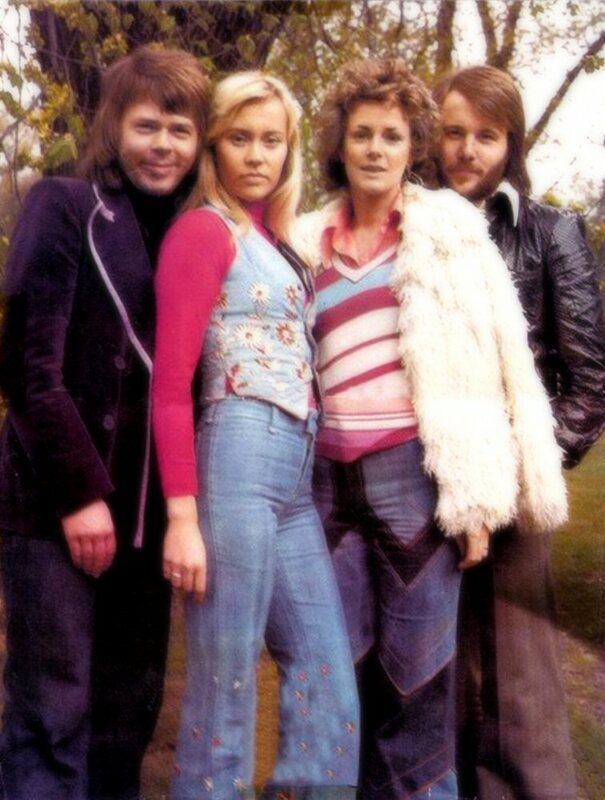 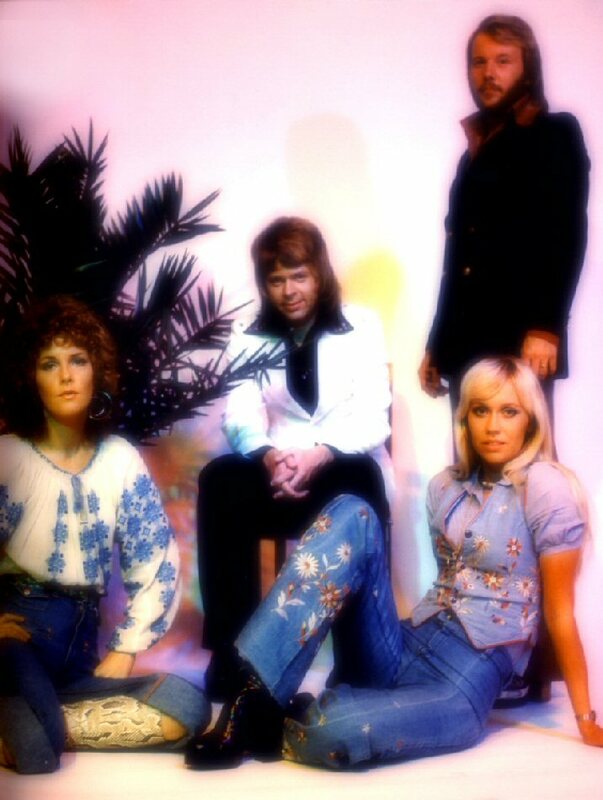 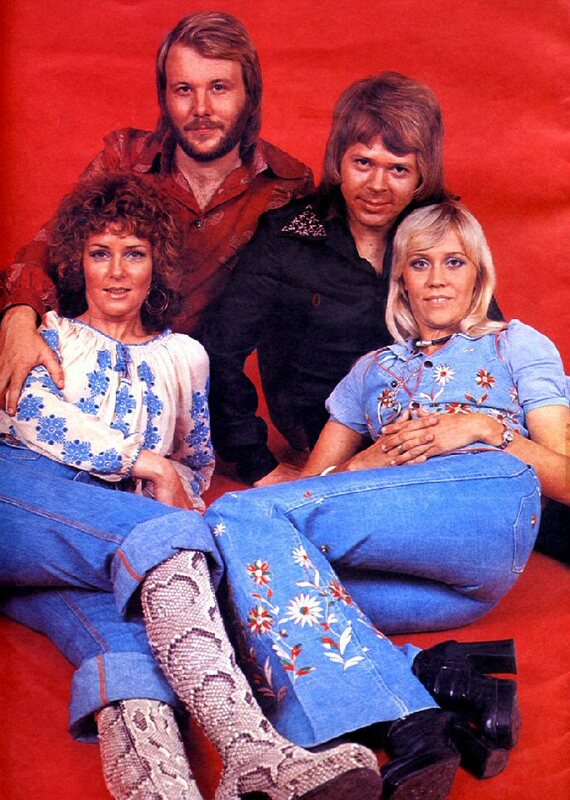 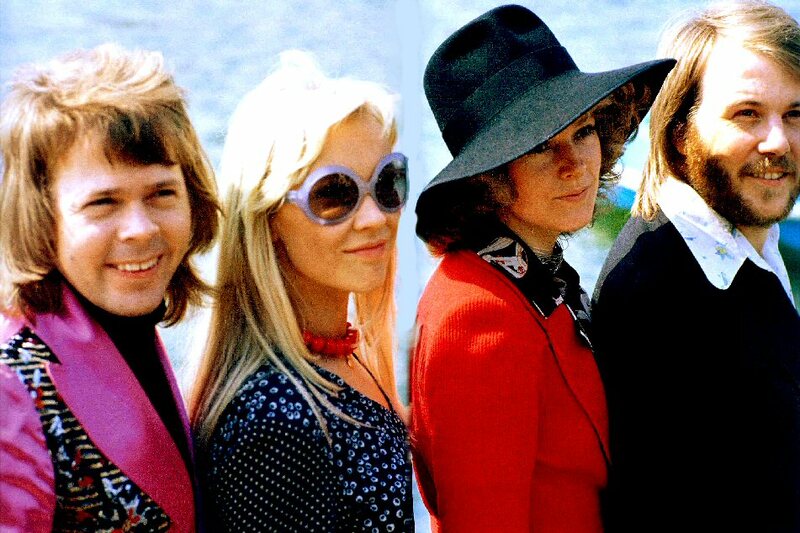 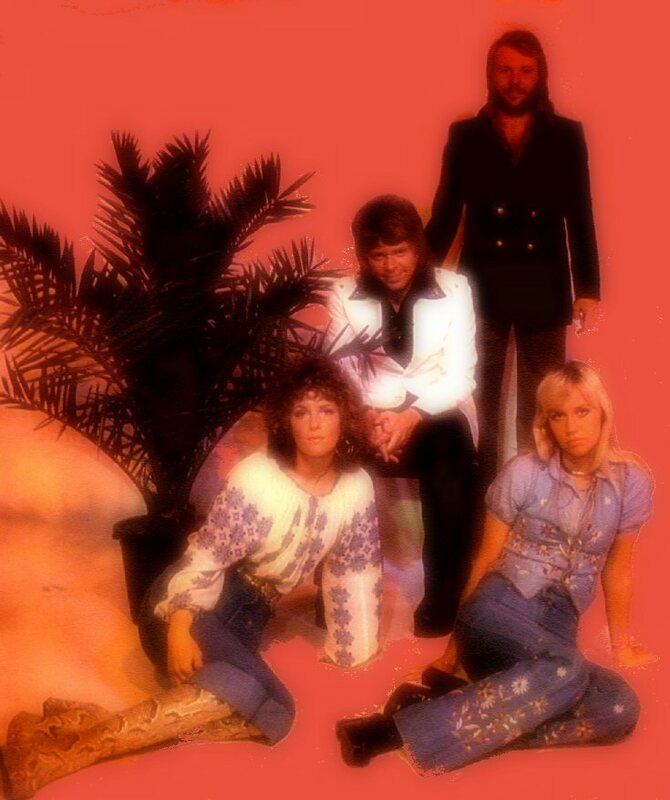 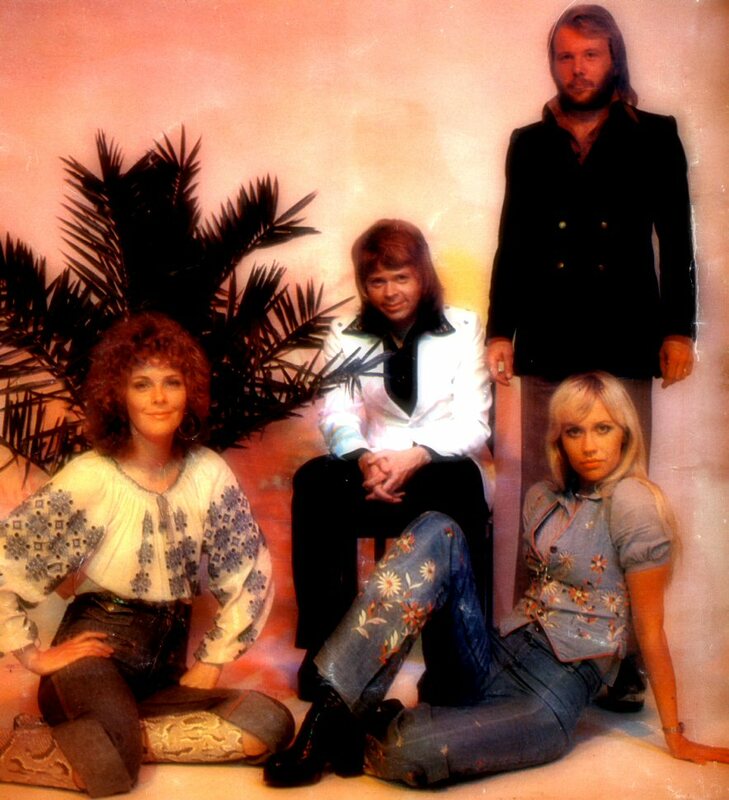 Shot from this photo session was used by Polydor in 1975 & 1976 as a cover photo for the album "The Best of ABBA". 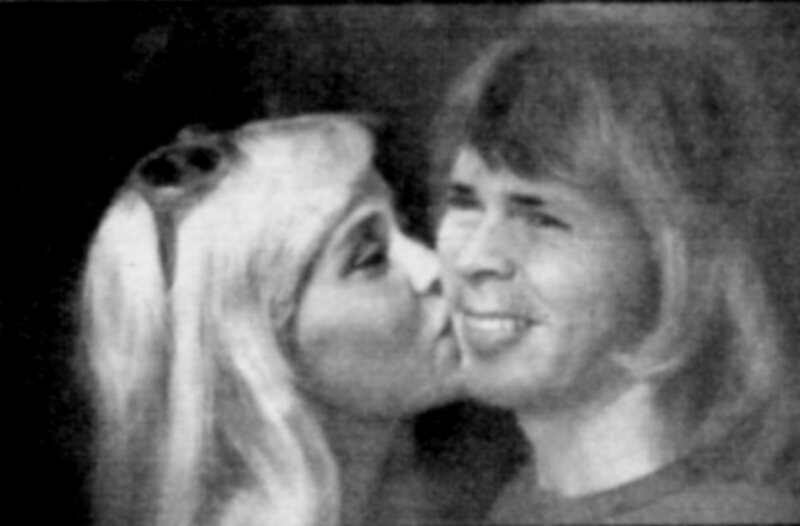 So far there are two known alternative shots available from this session. 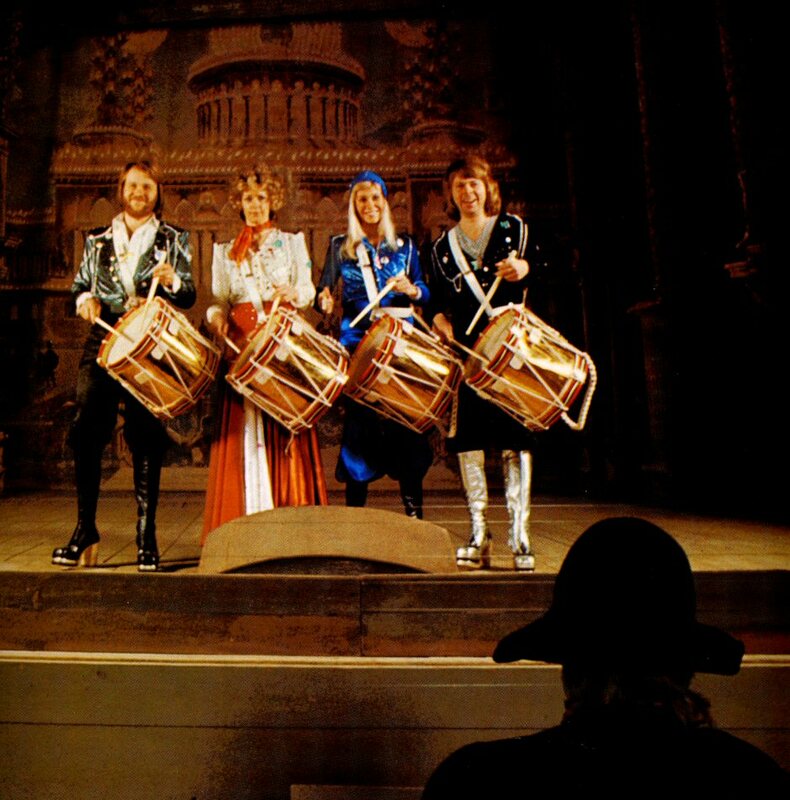 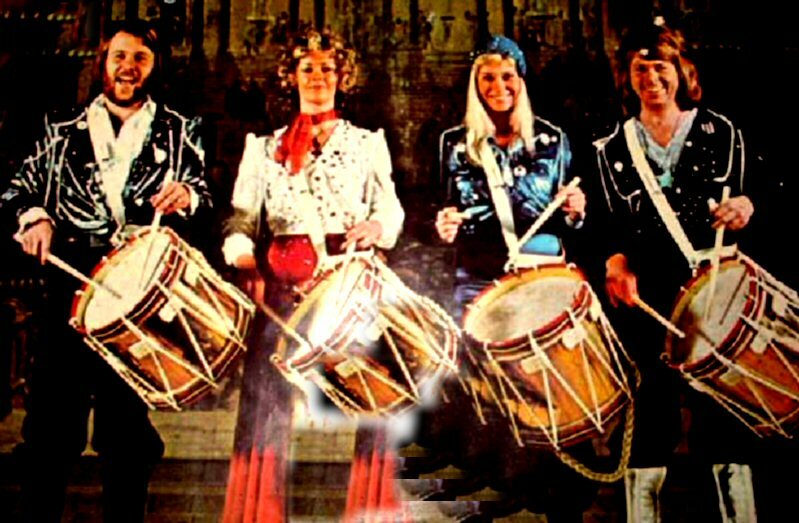 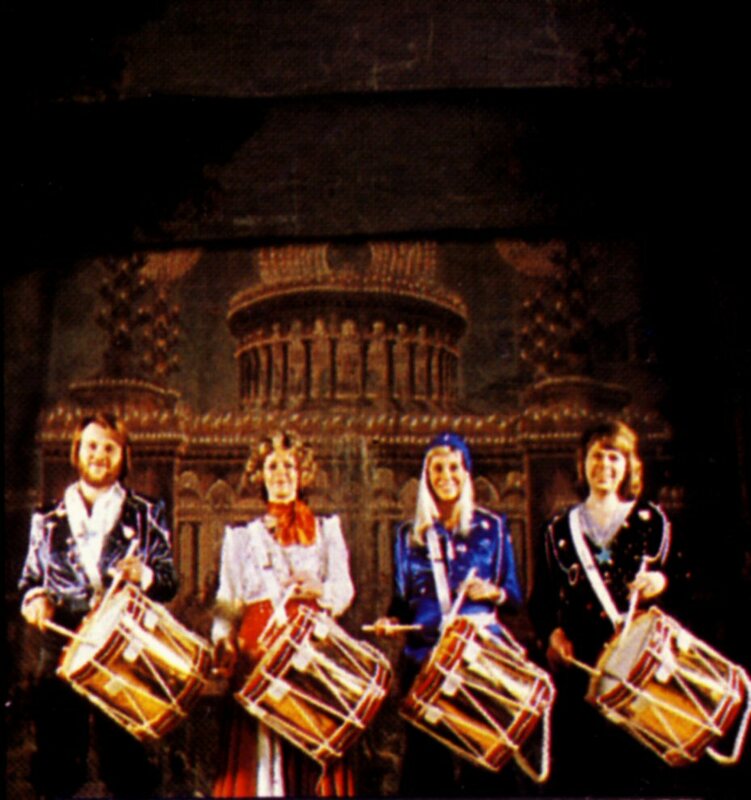 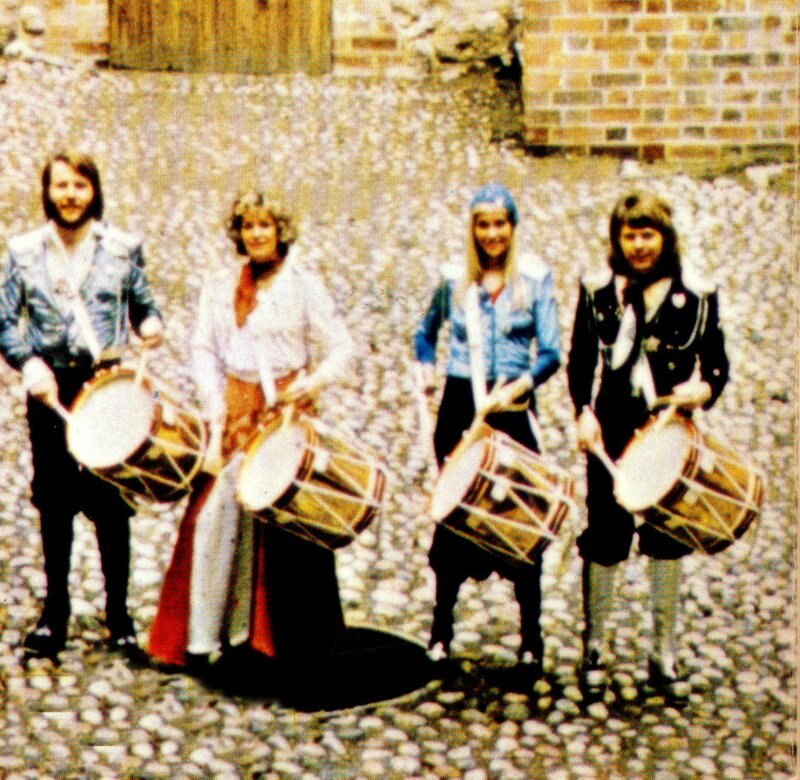 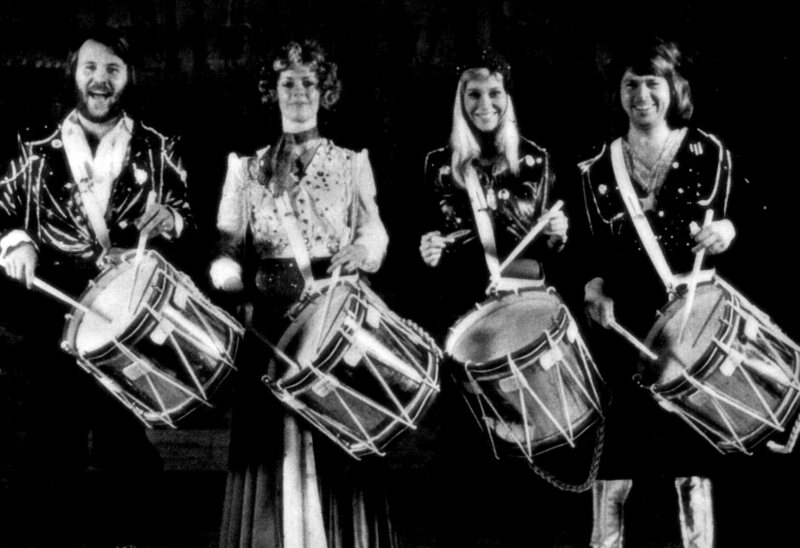 The alternative photo sessions featuring ABBA with drums were not used in a bigger scale by mass media in the world. 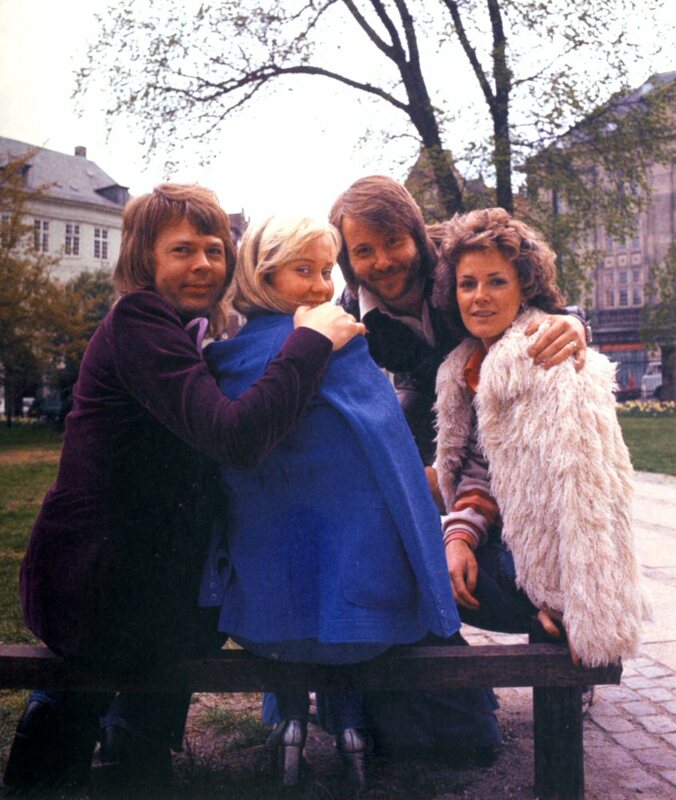 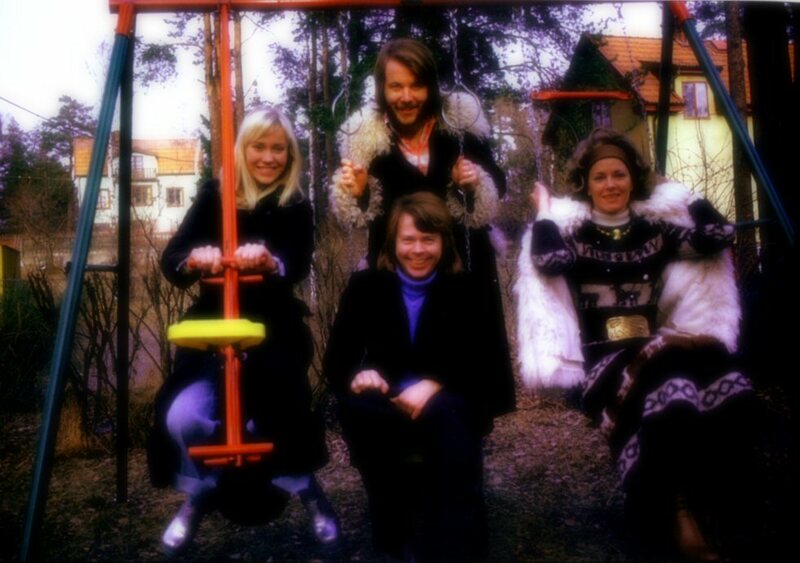 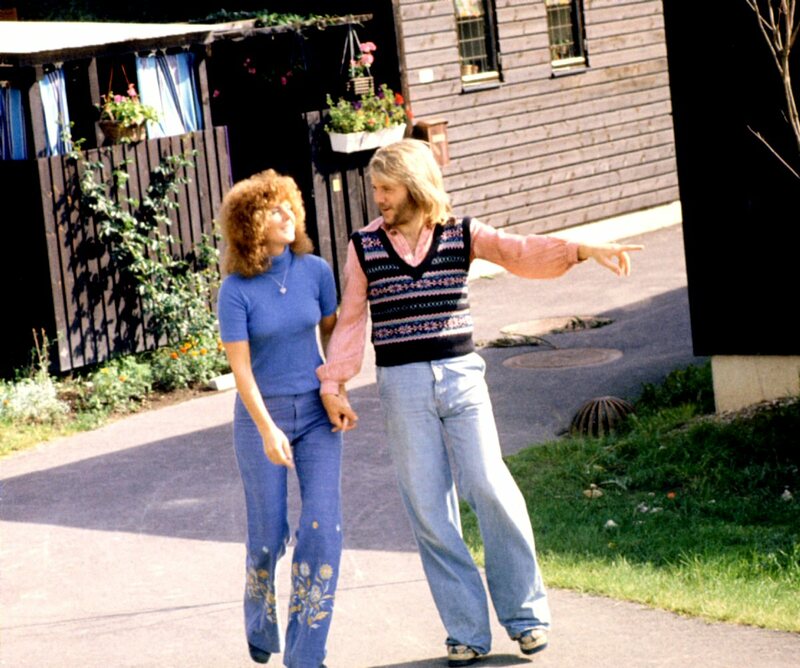 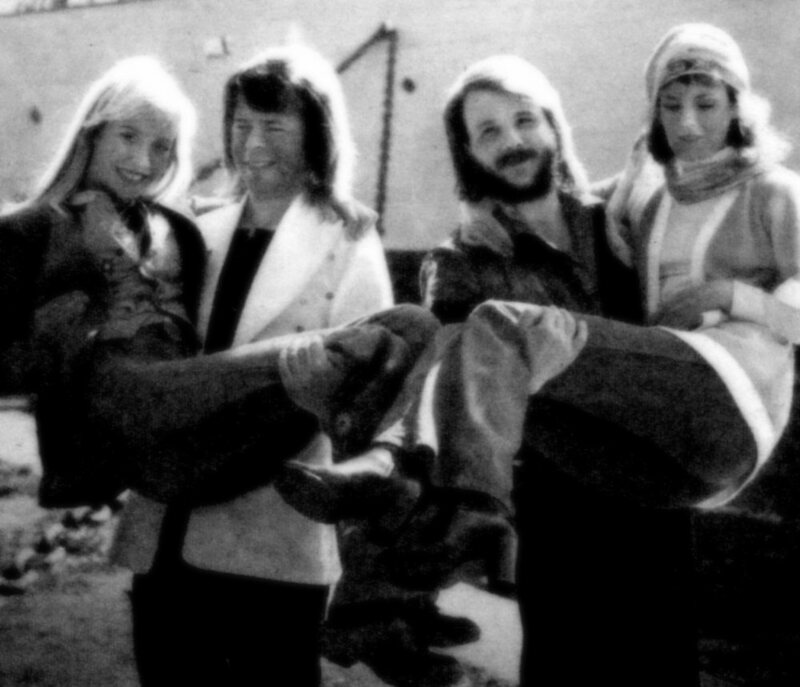 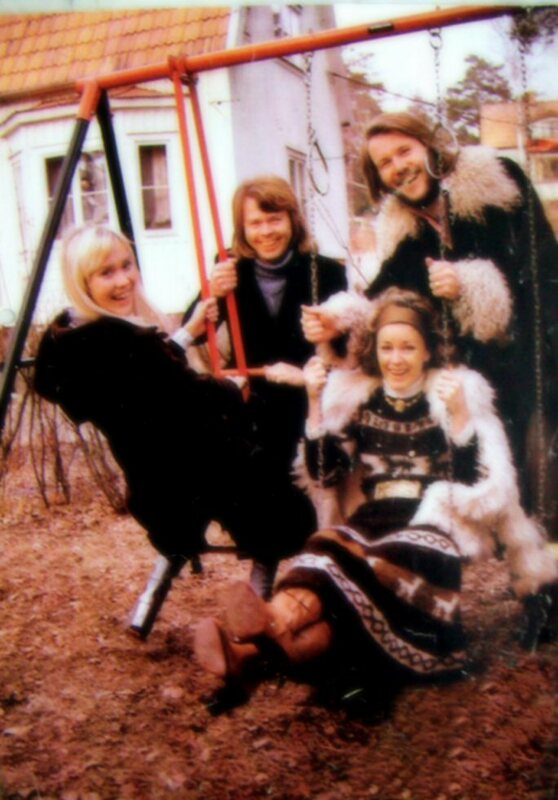 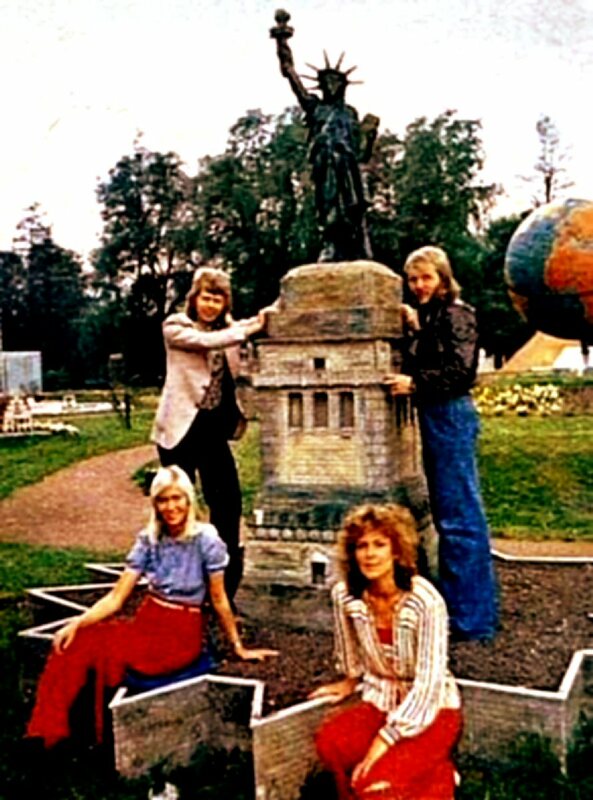 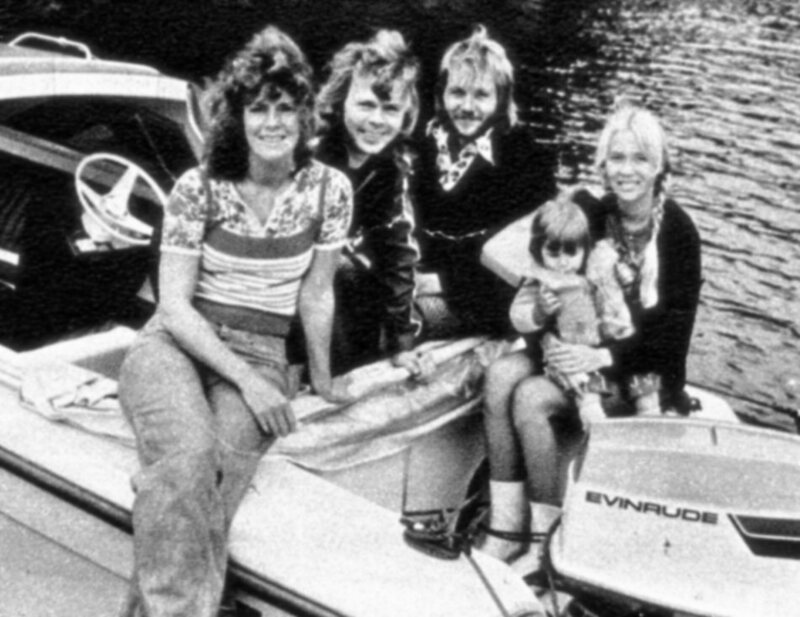 One picture appeared in the official ABBA calendar 1984, an alternative shots could be seen in some newspapers in Holland and a rare shot taken in the yard outside the castle was used on the back cover of the Swedish mini book "Mera pop" written in 1974 by Christer Borg - the same author who would write the first Swedish ABBA biography "Fenomenet ABBA" two years later. 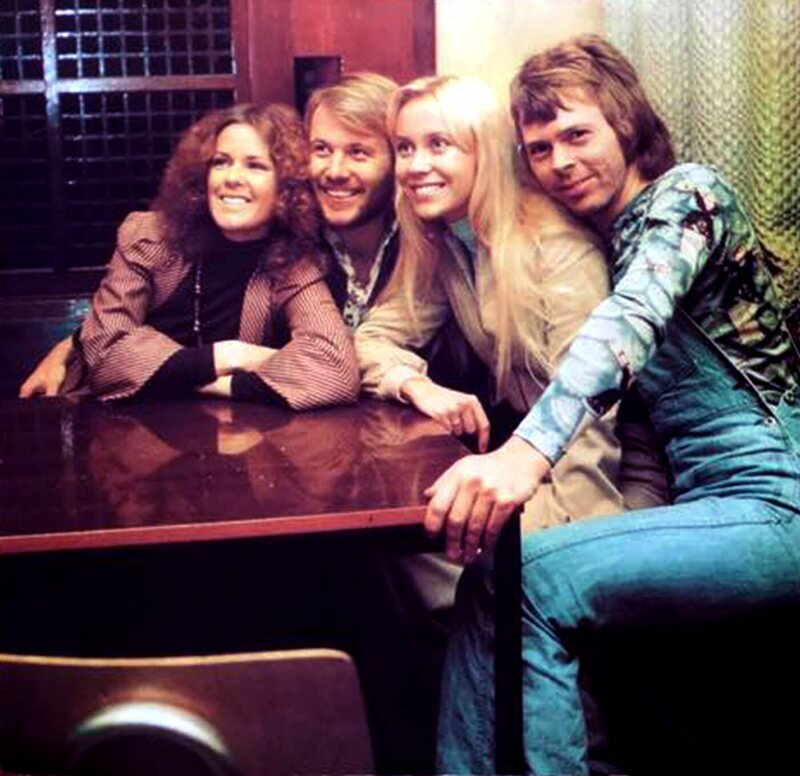 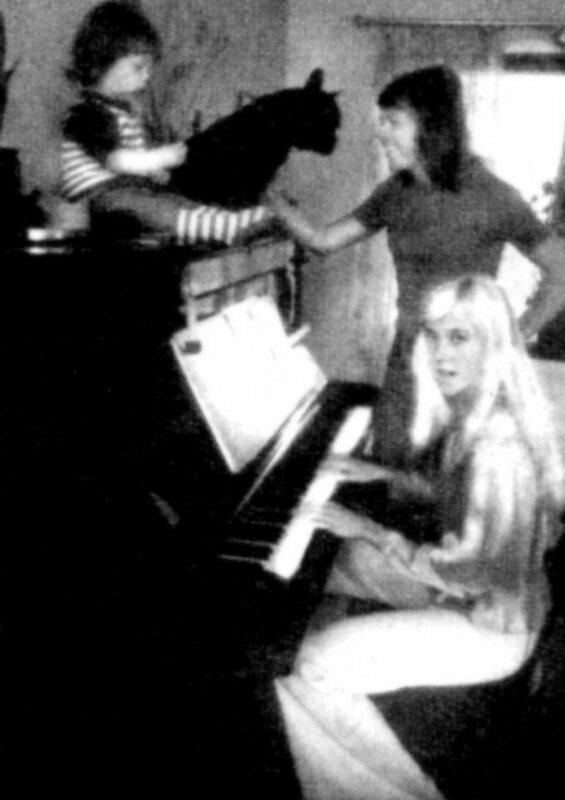 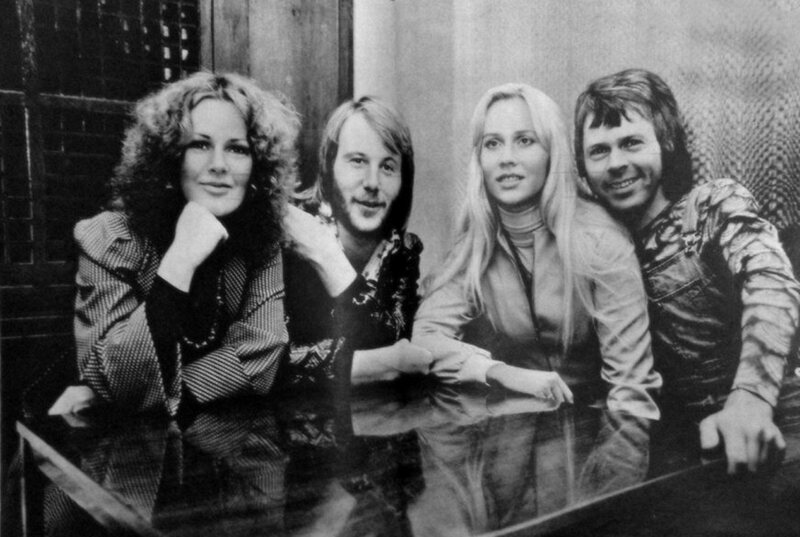 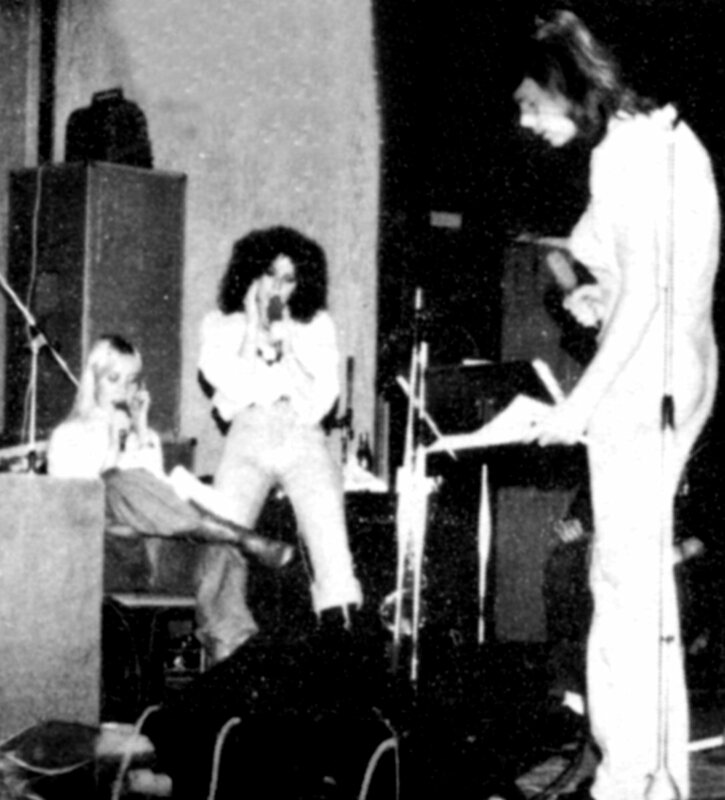 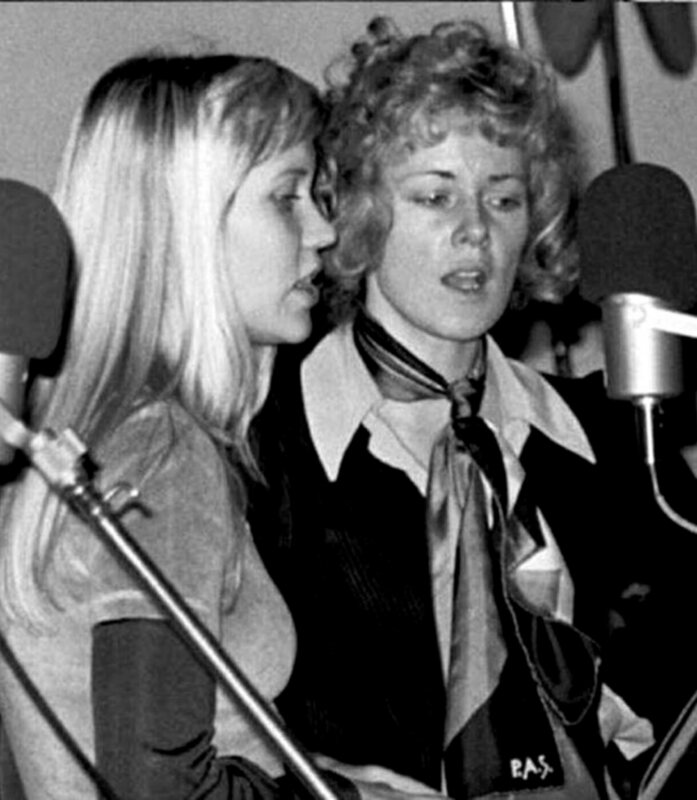 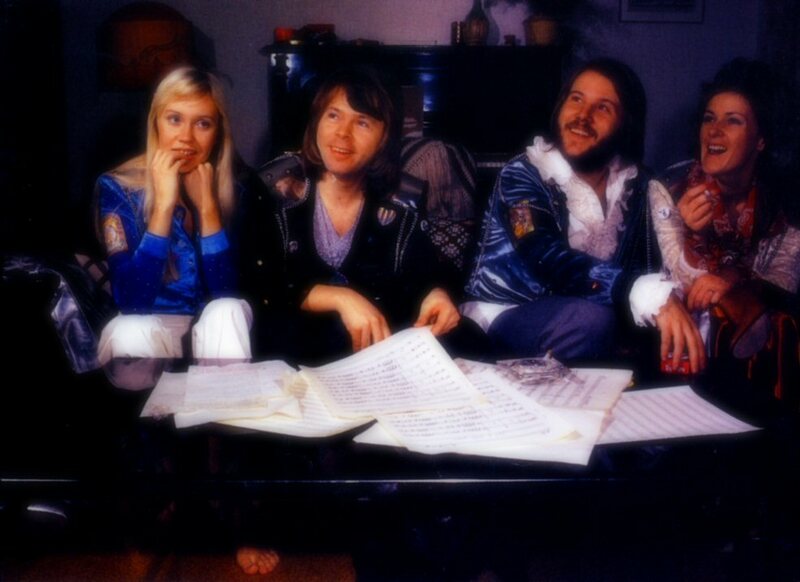 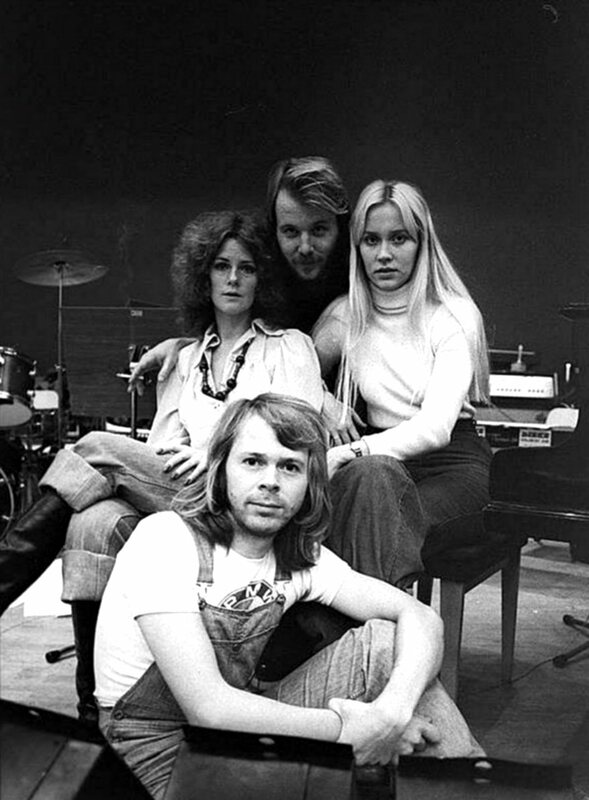 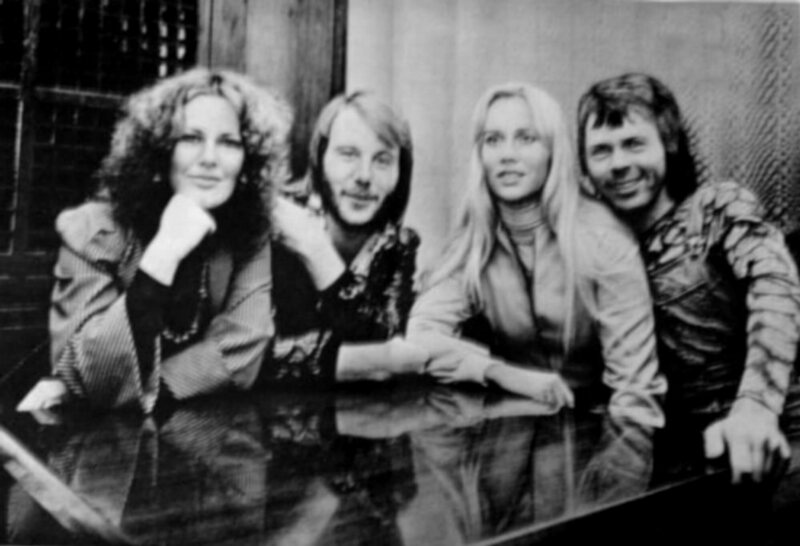 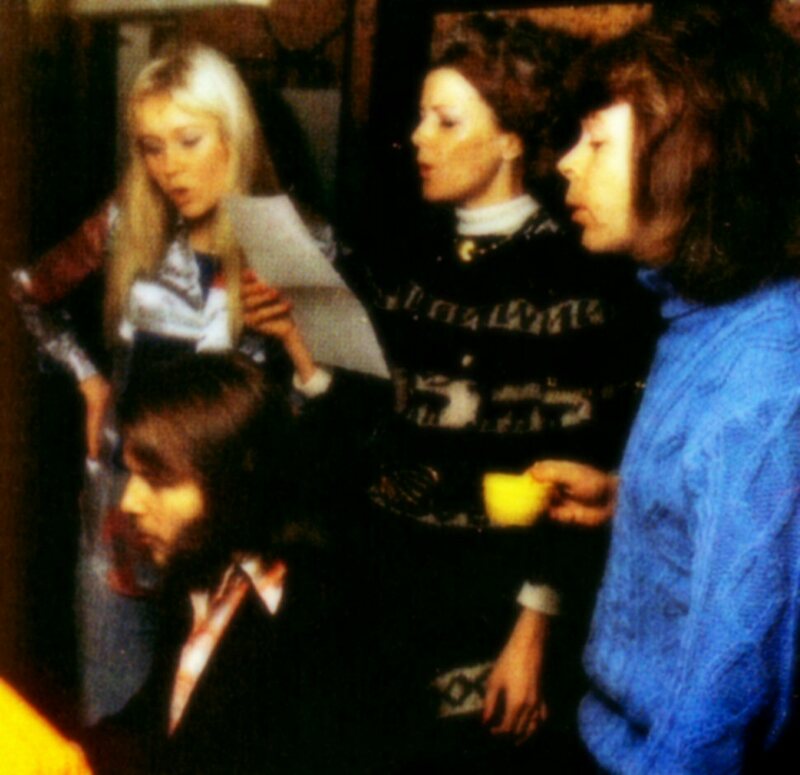 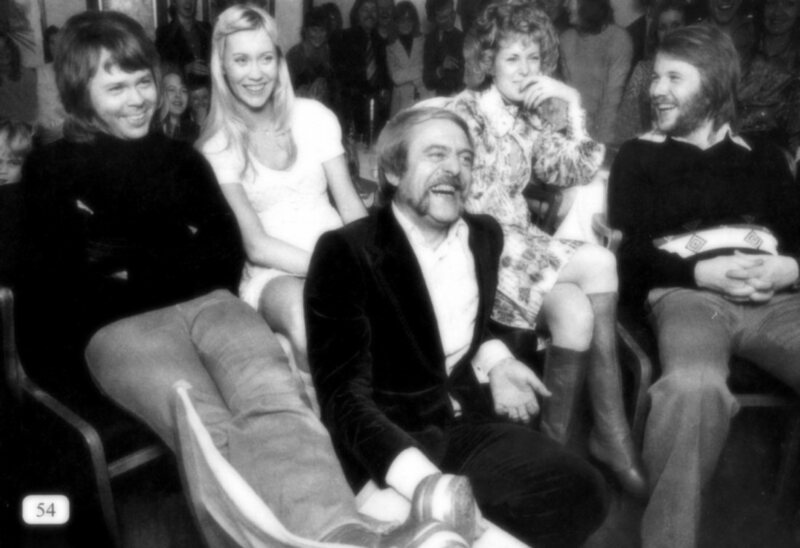 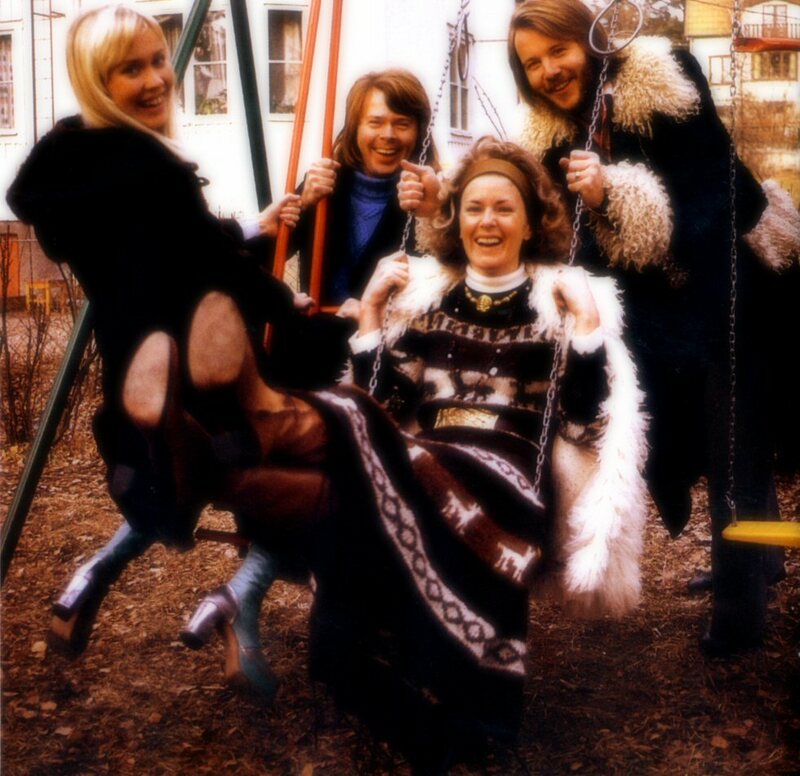 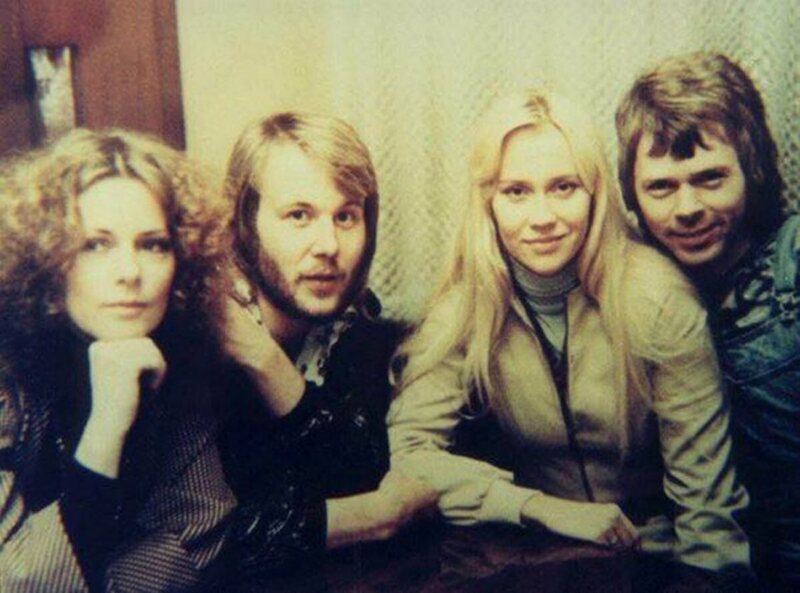 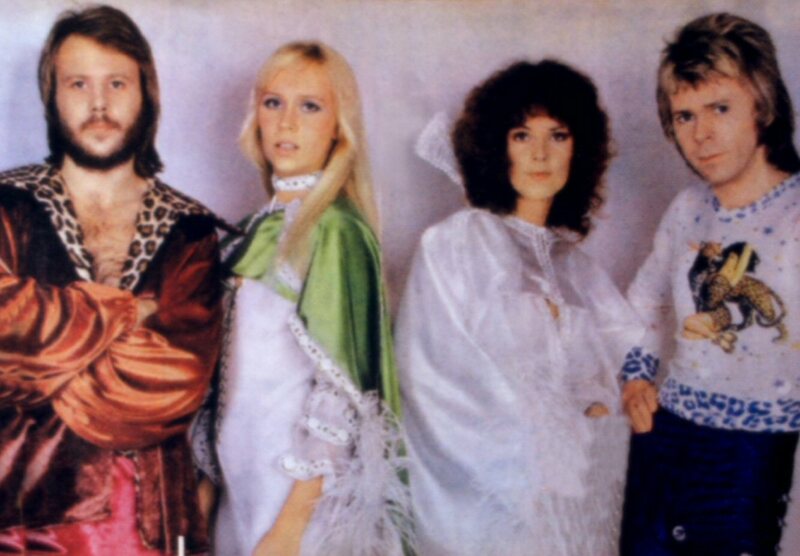 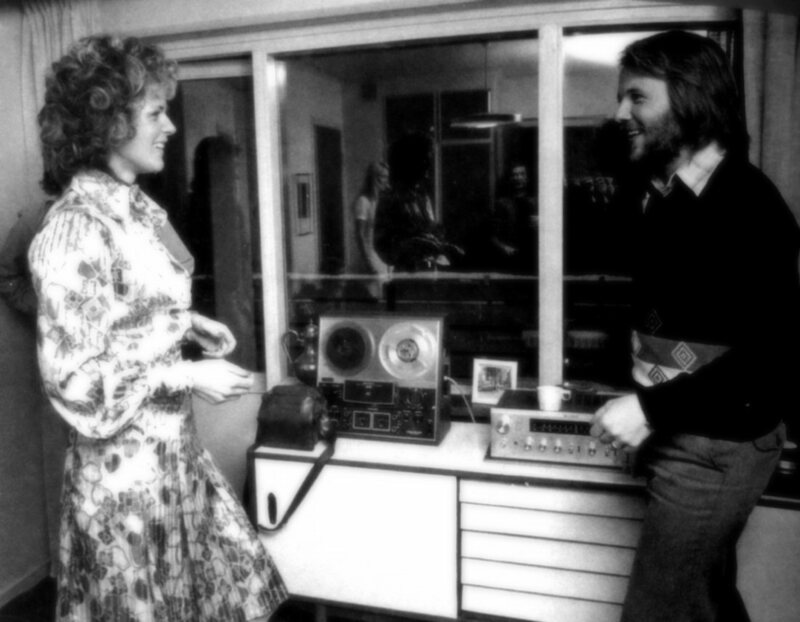 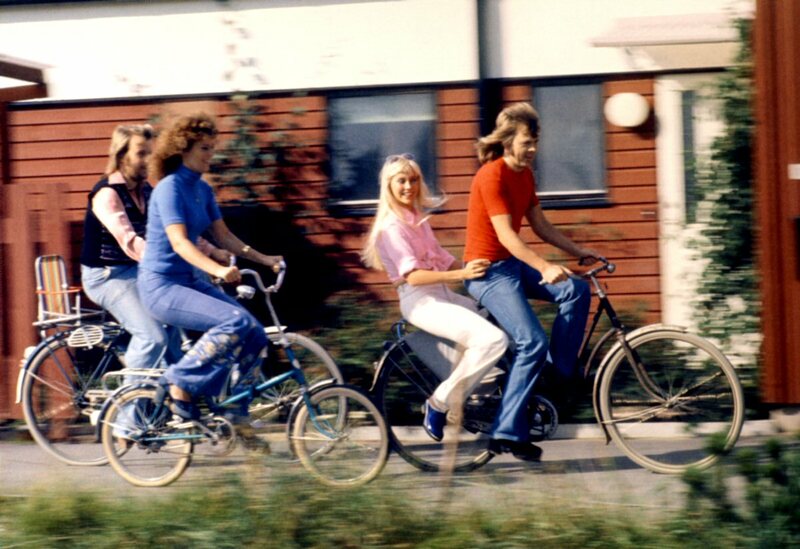 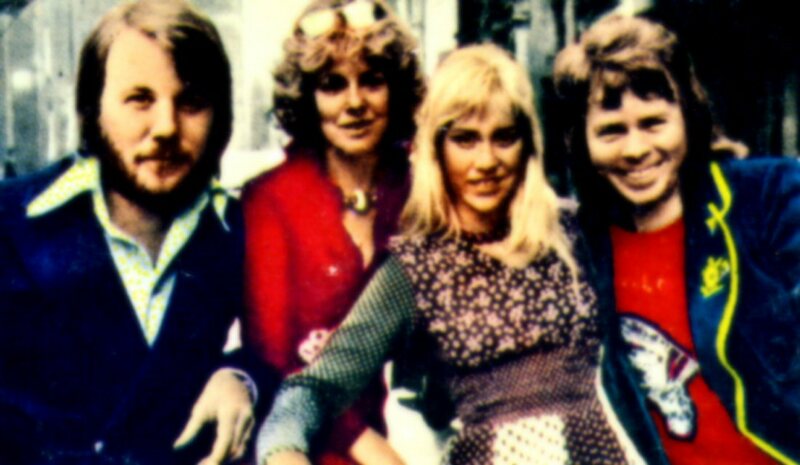 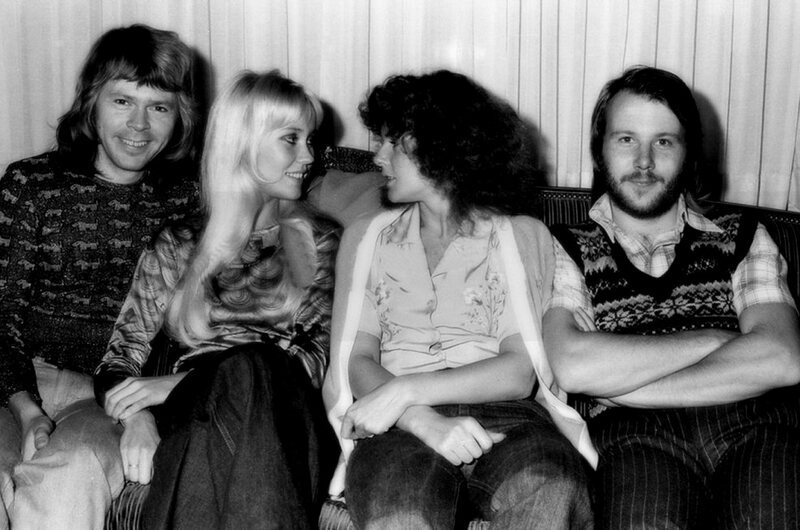 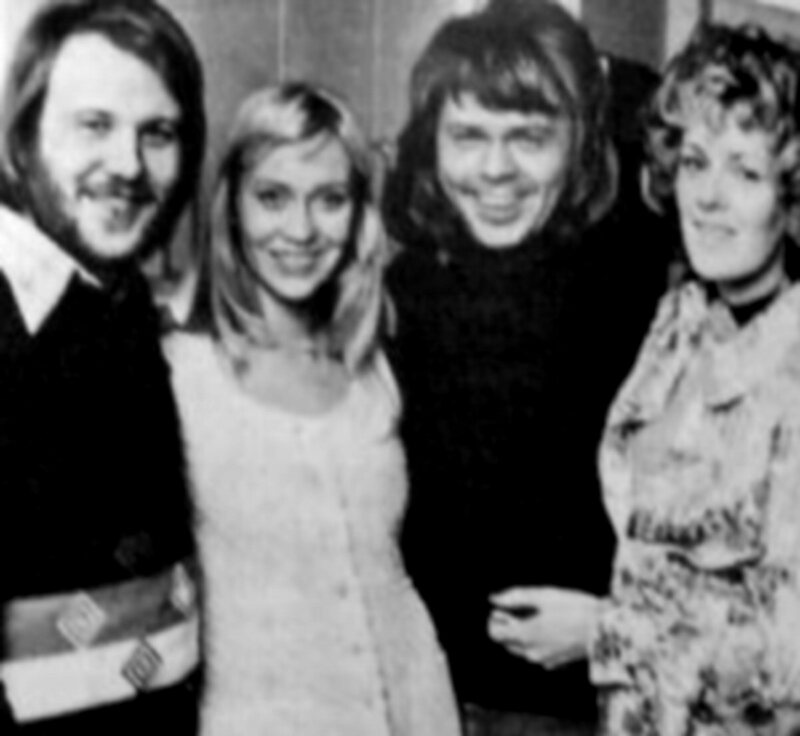 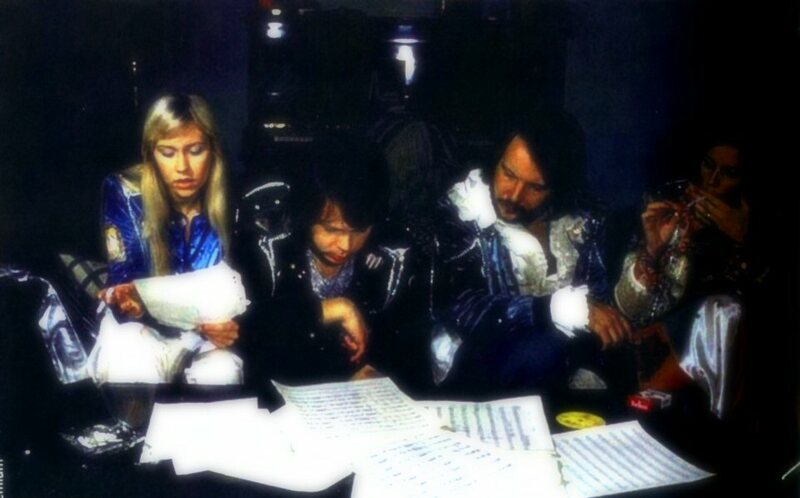 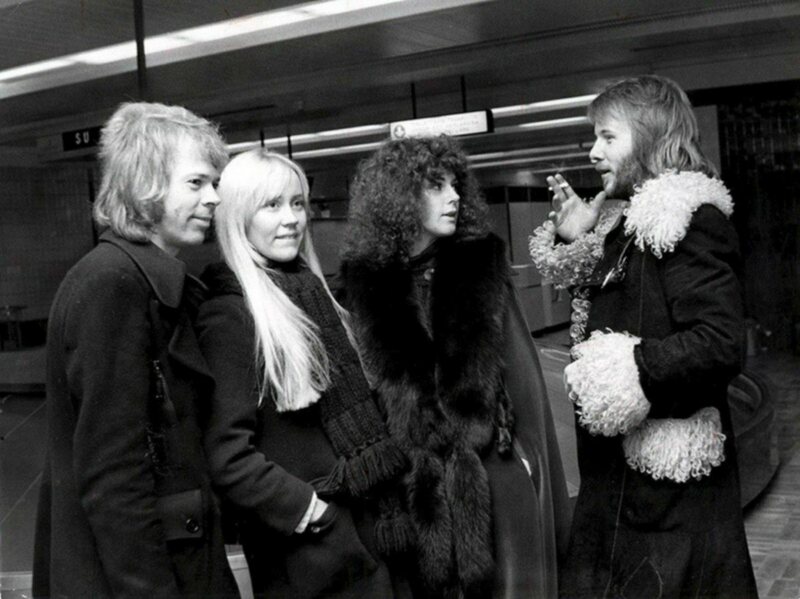 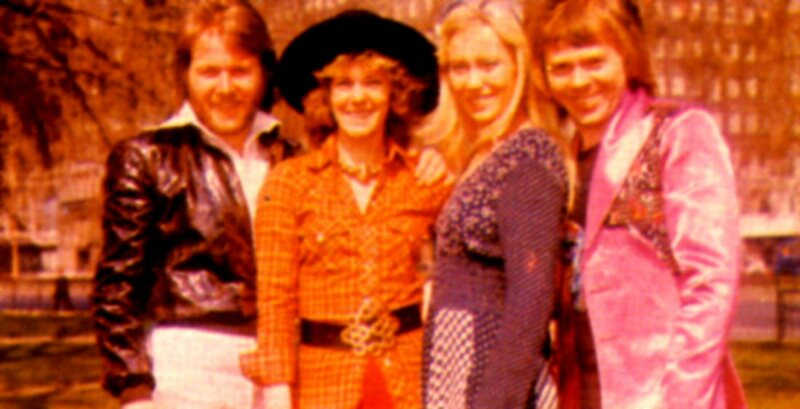 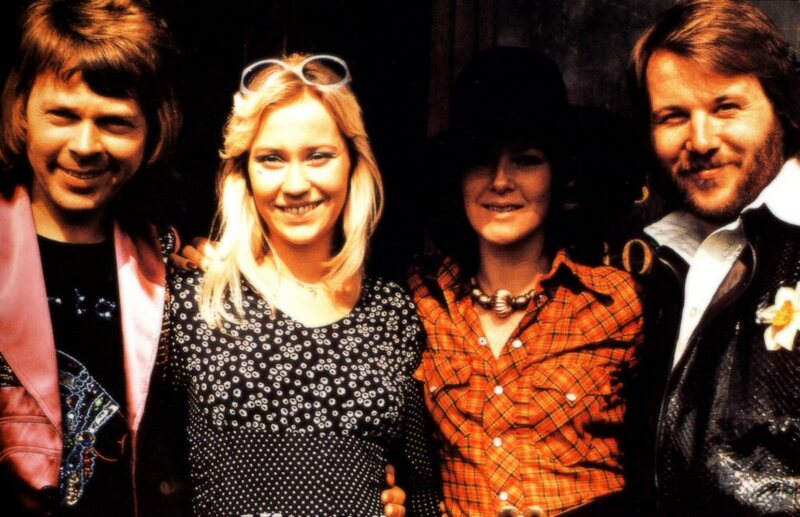 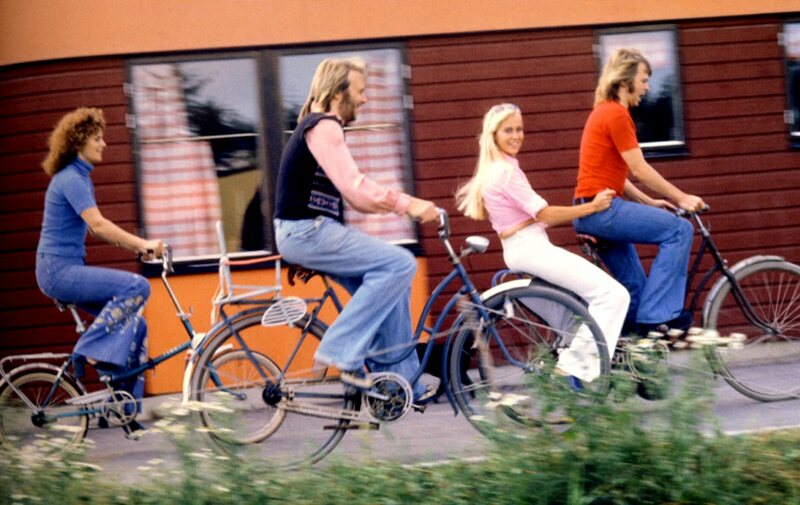 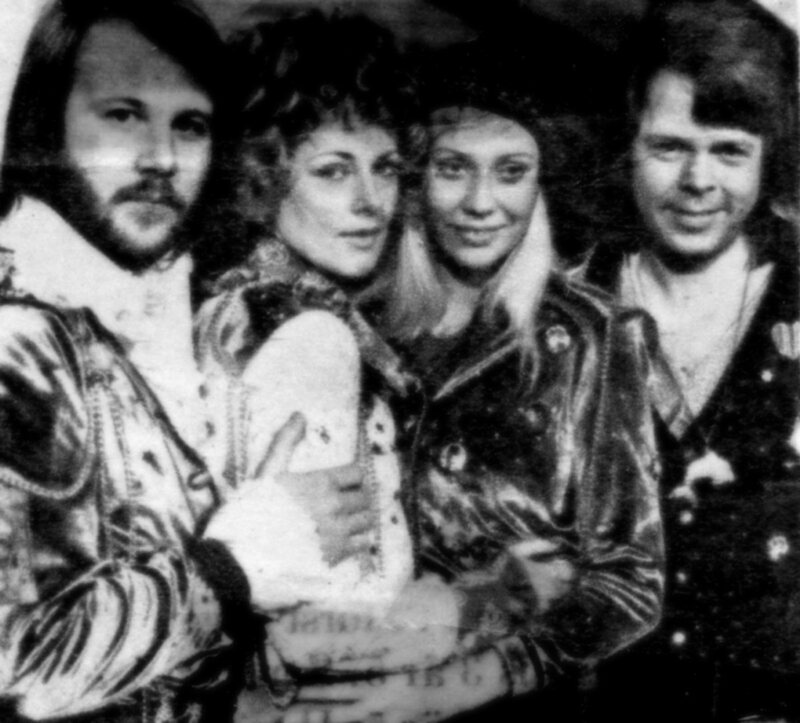 ABBA recorded songs for a new album between September 73 and March 74 in various studios. 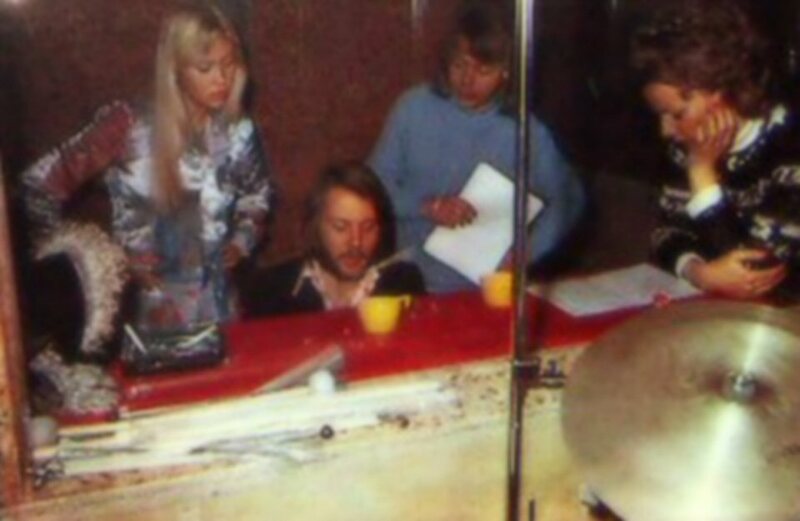 Some songs were recorded at Bruno Glenmark's studio, "Glenstudio", situated in Stocksund outside Stockholm. 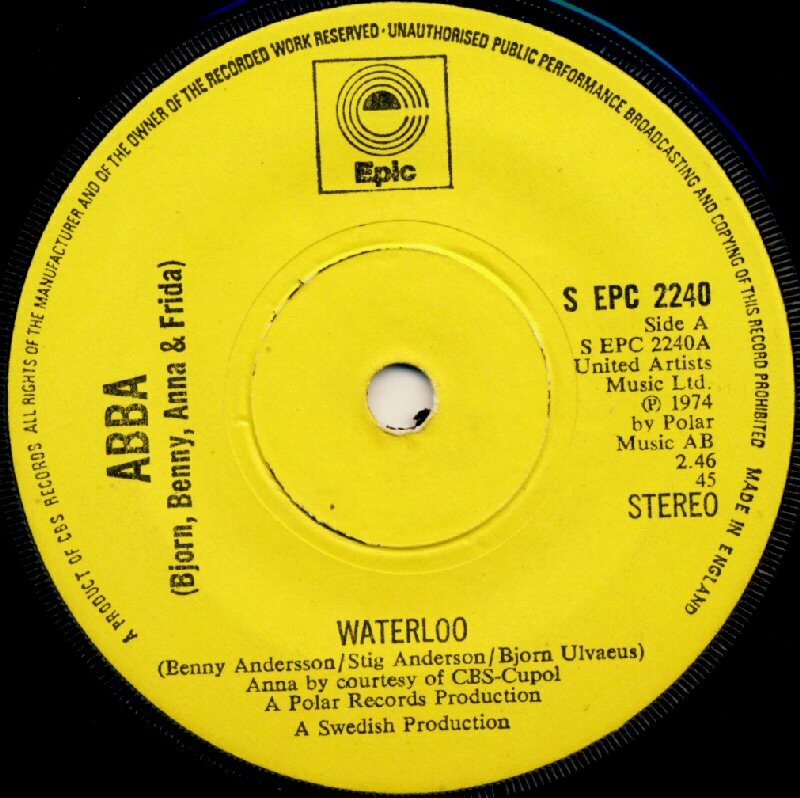 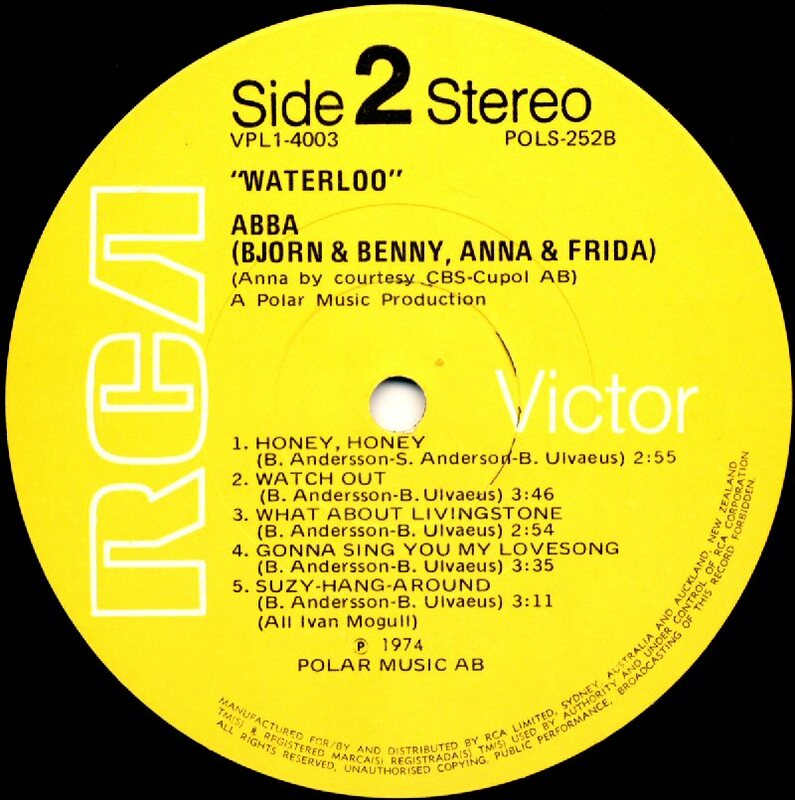 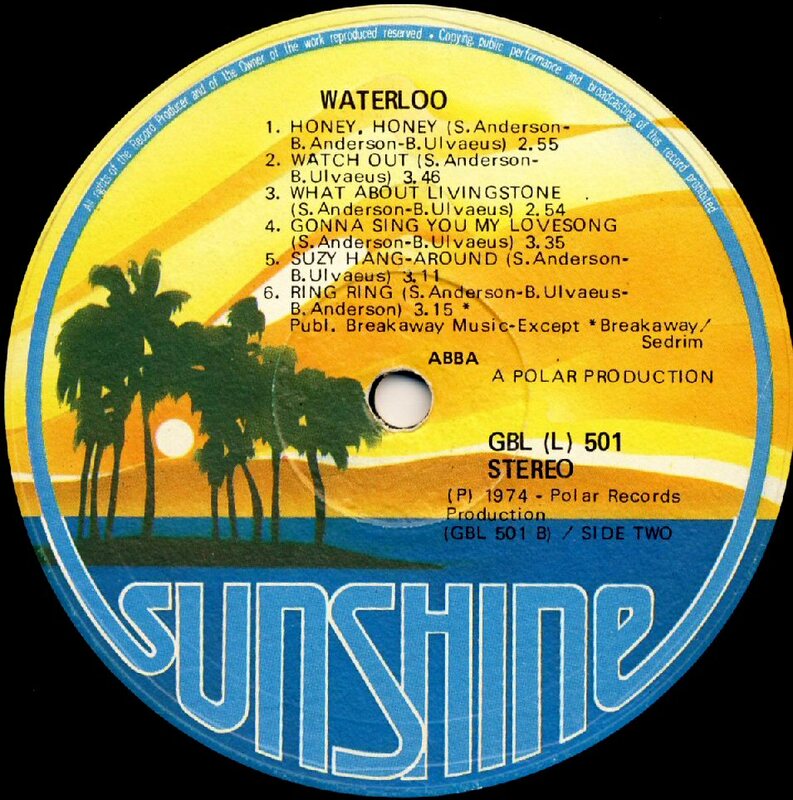 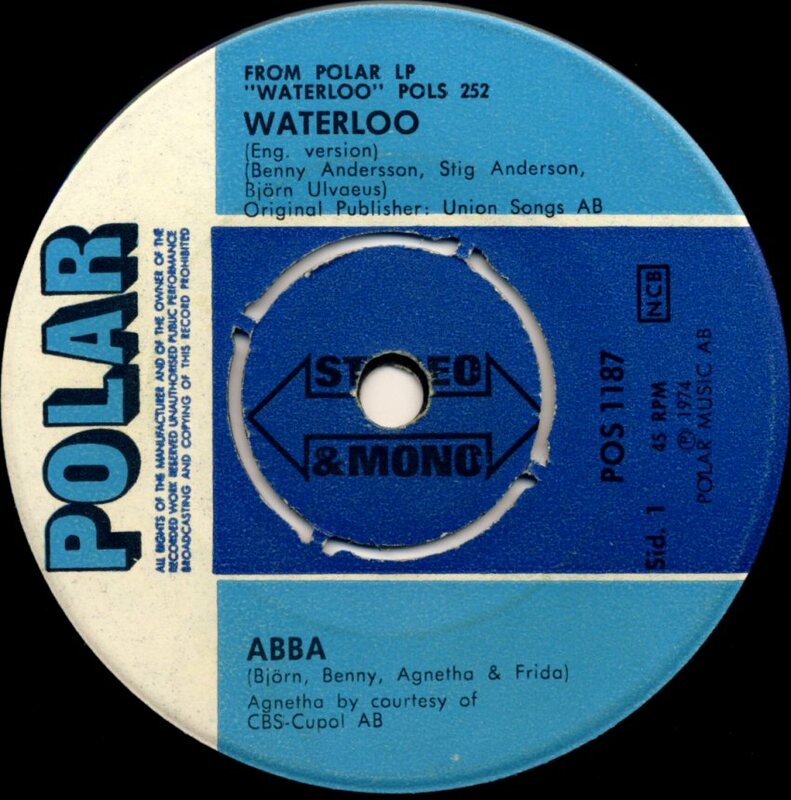 Two alternative singles with "Waterloo" were released in Sweden, the Swedish language version with "Honey Honey" (in Swedish) on the side B and the English language version with "Watch Out" on the B-side. 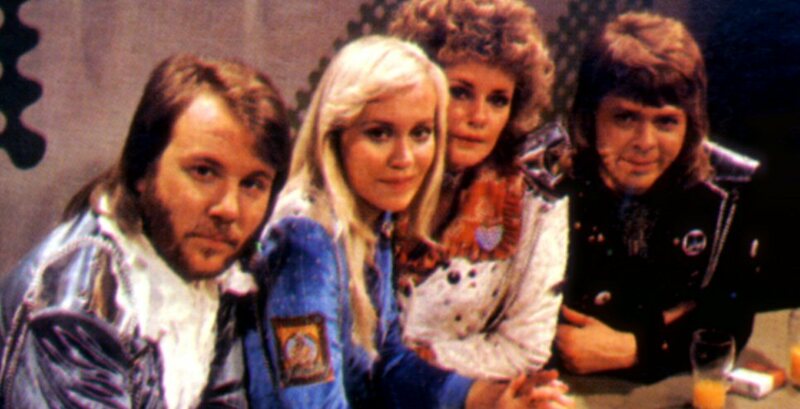 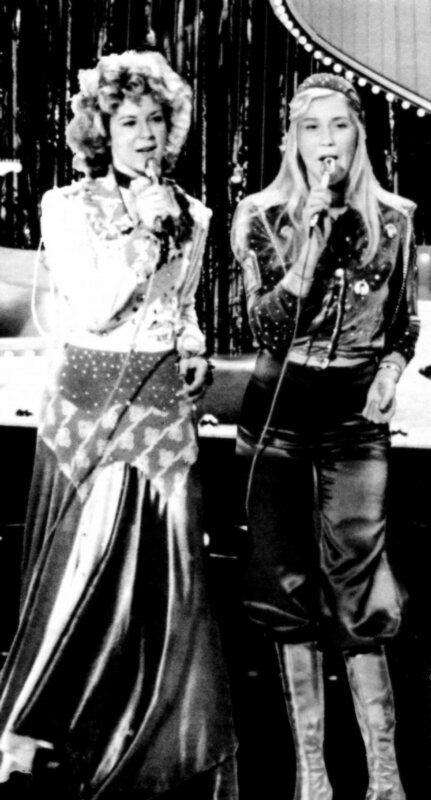 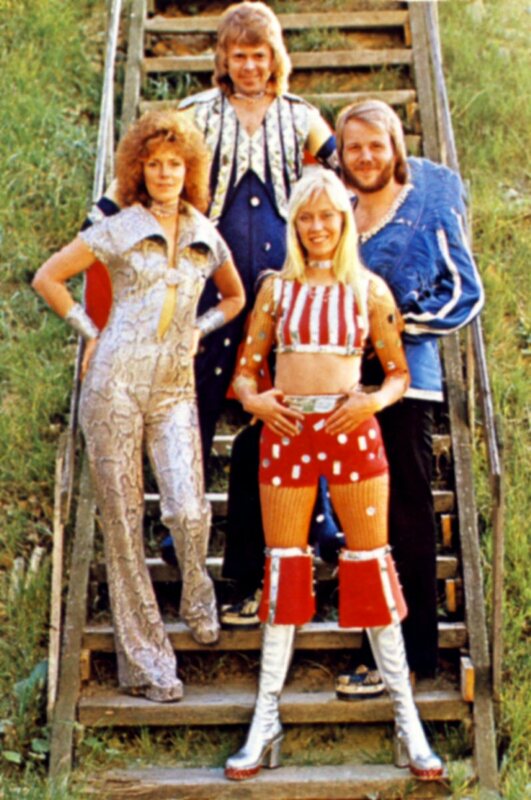 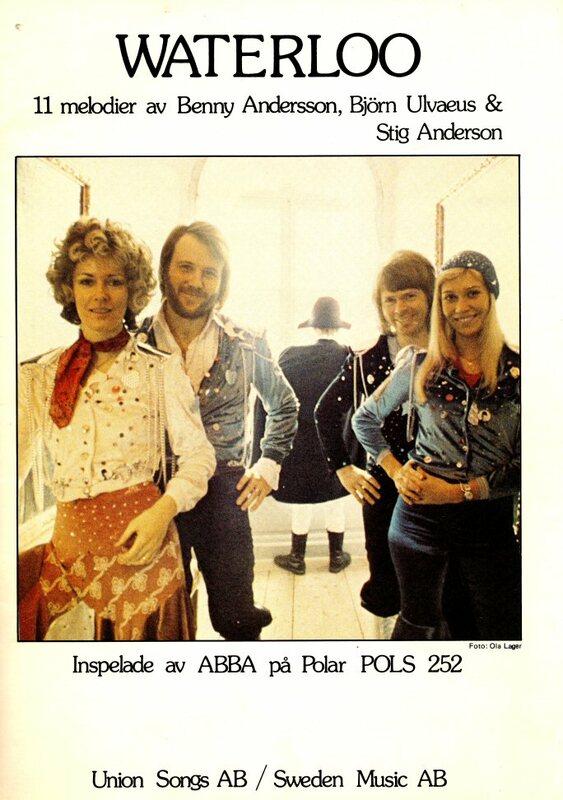 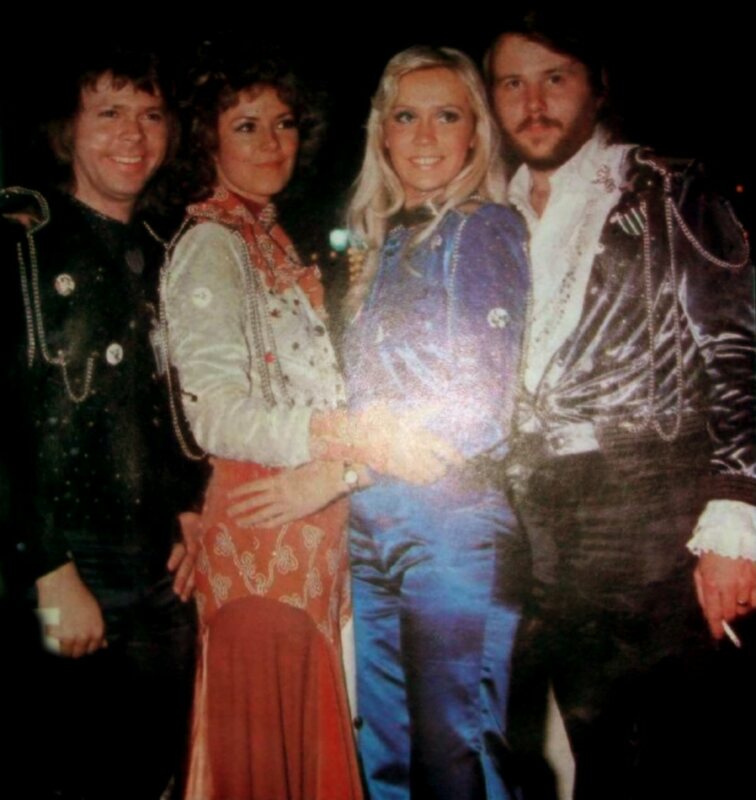 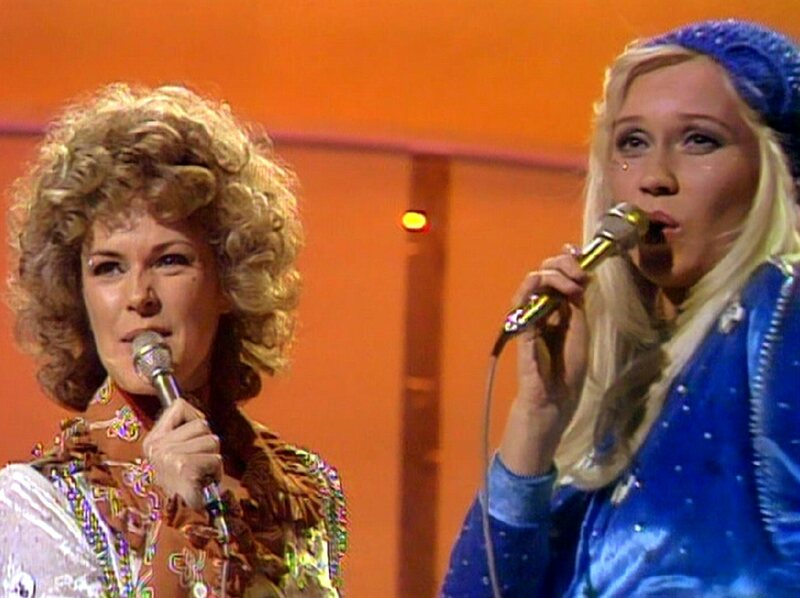 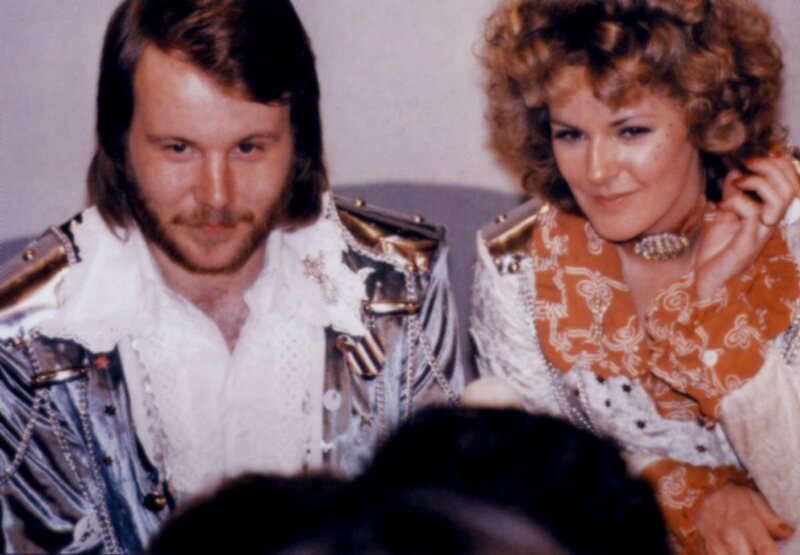 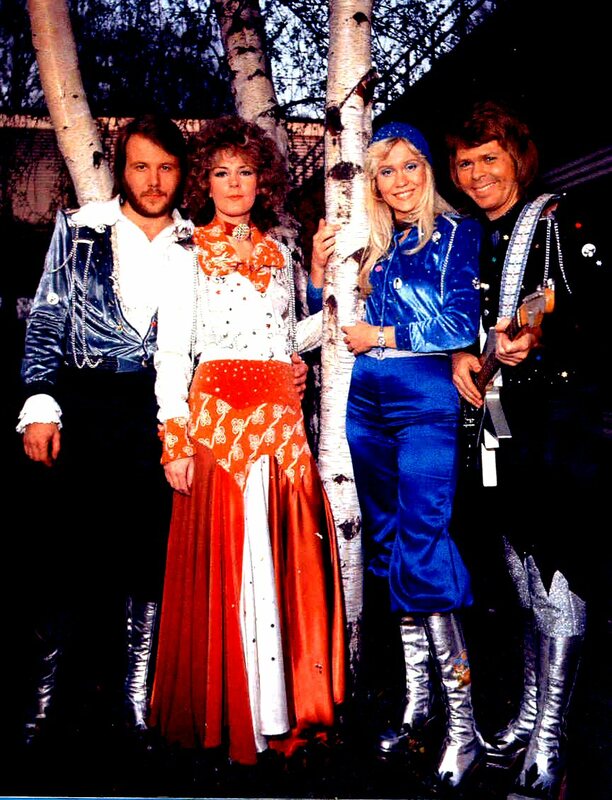 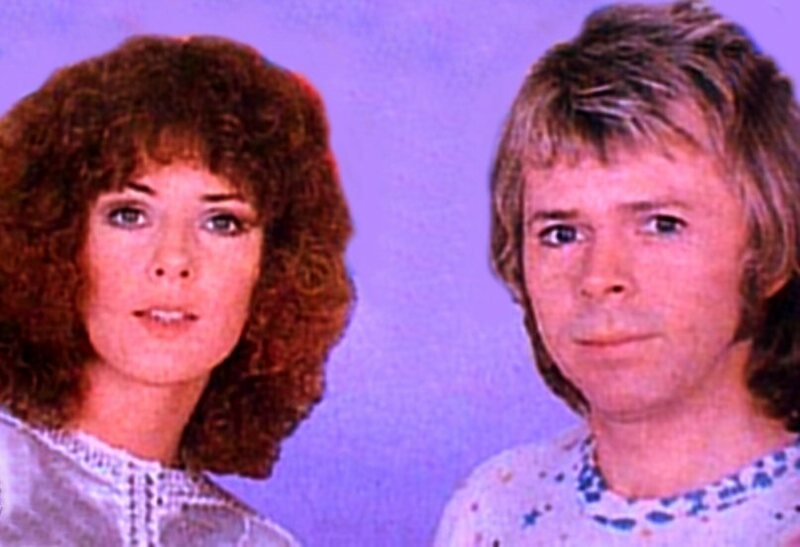 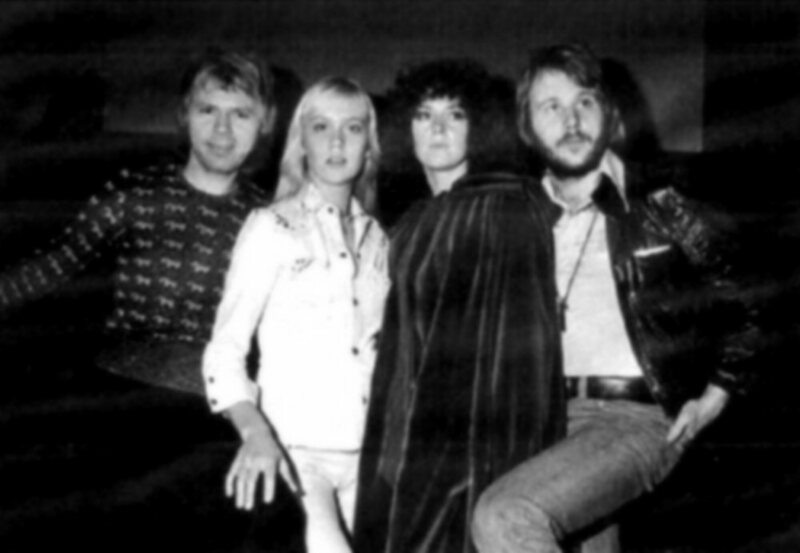 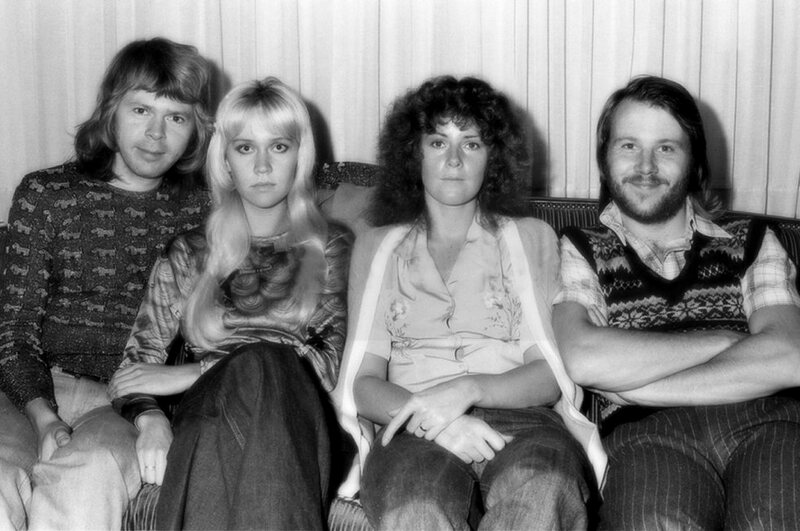 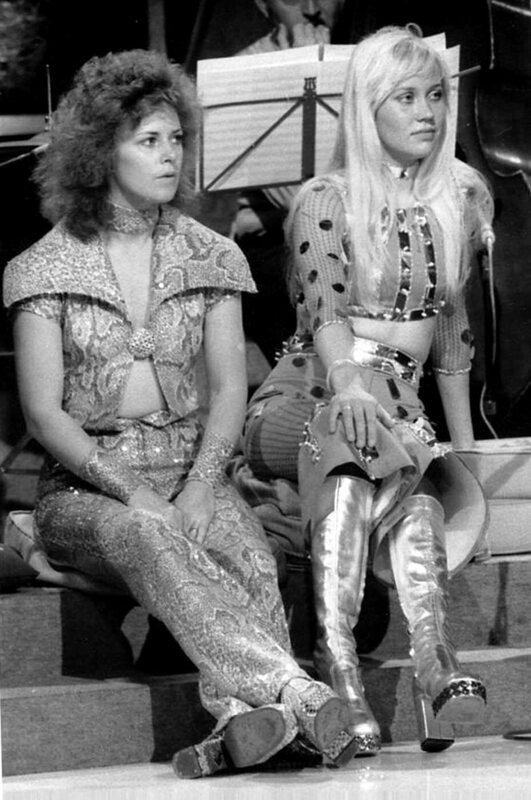 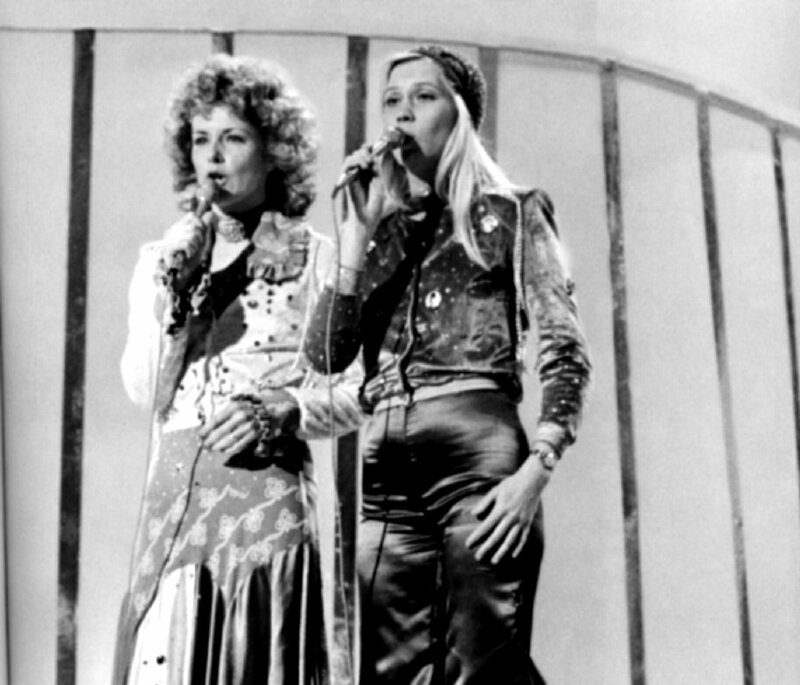 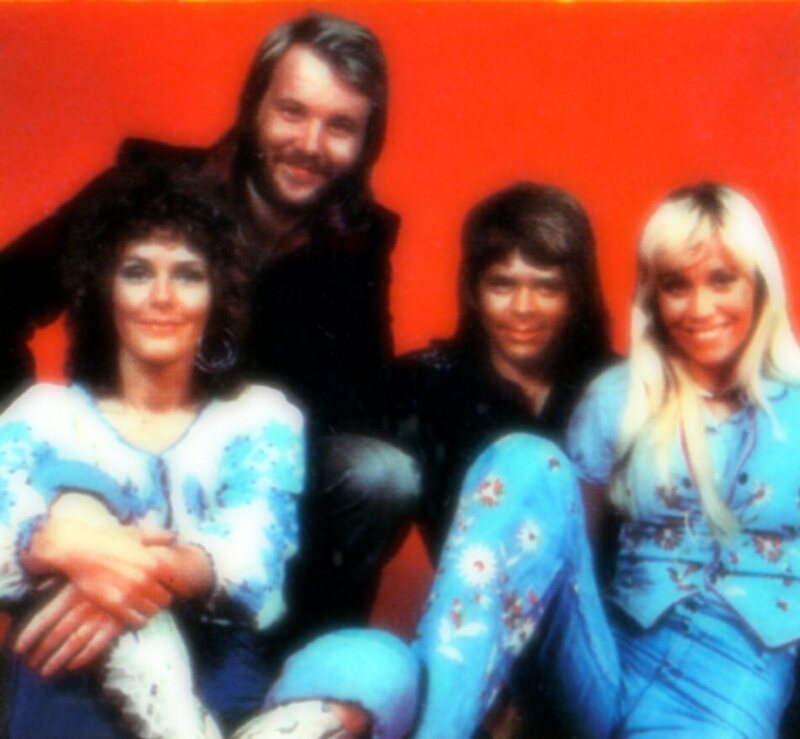 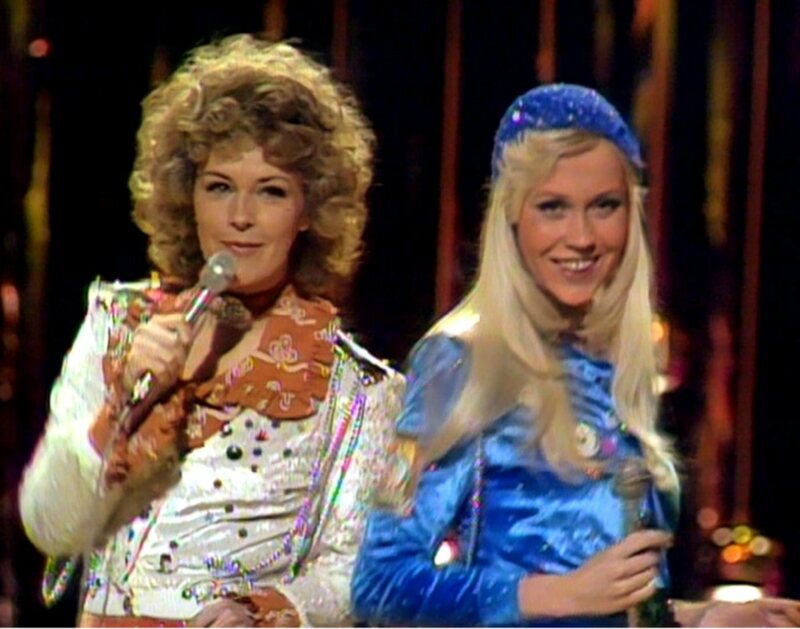 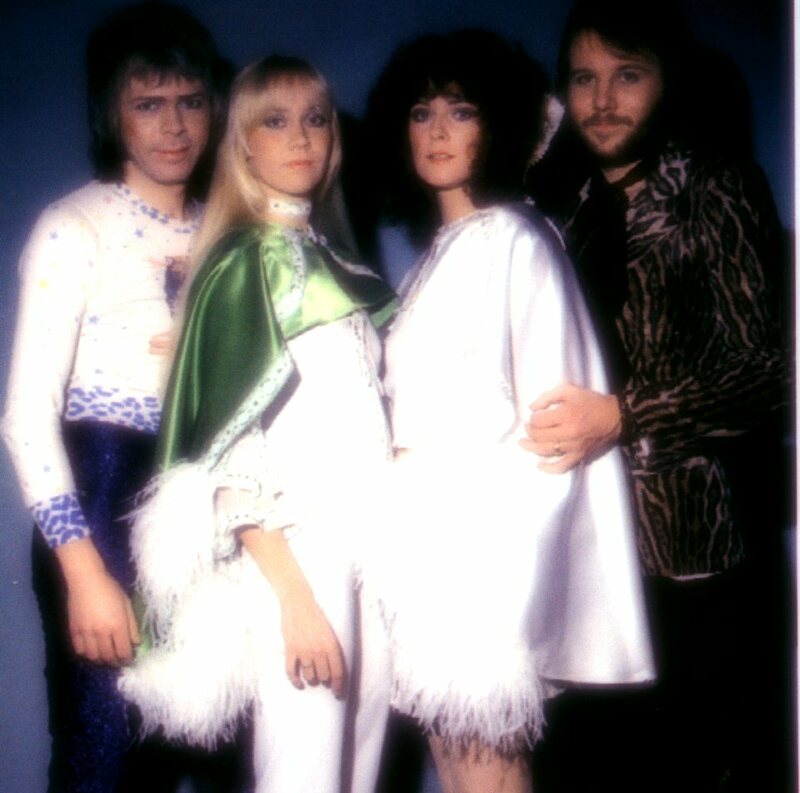 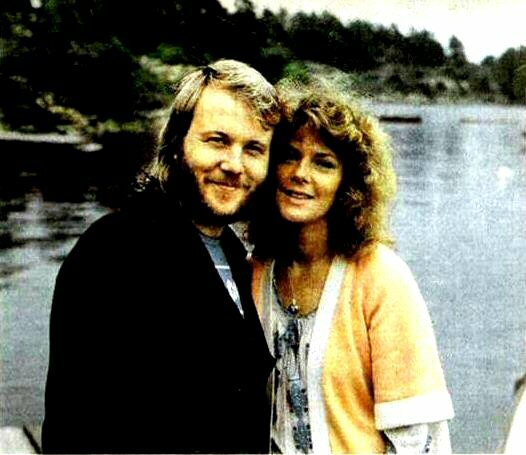 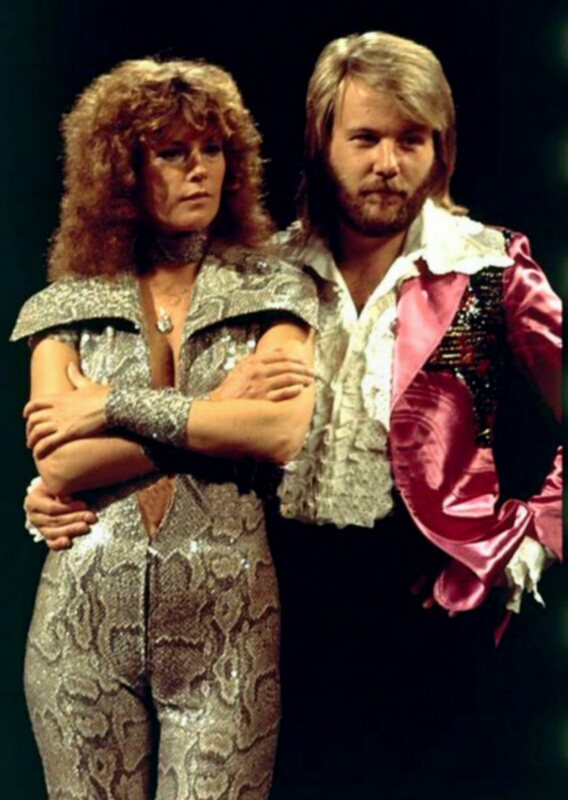 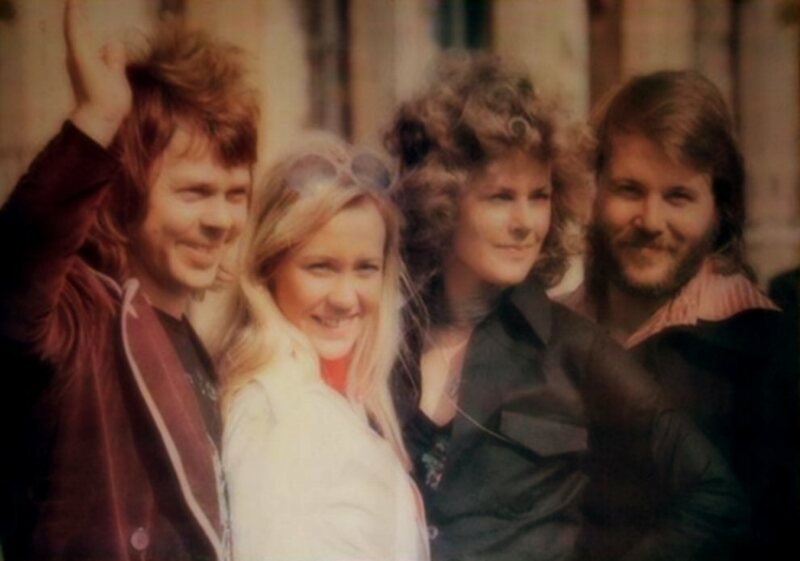 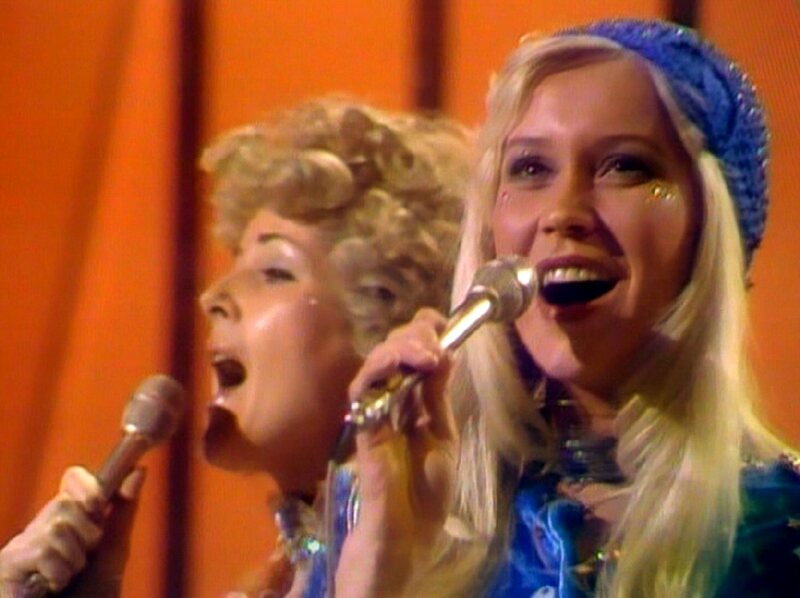 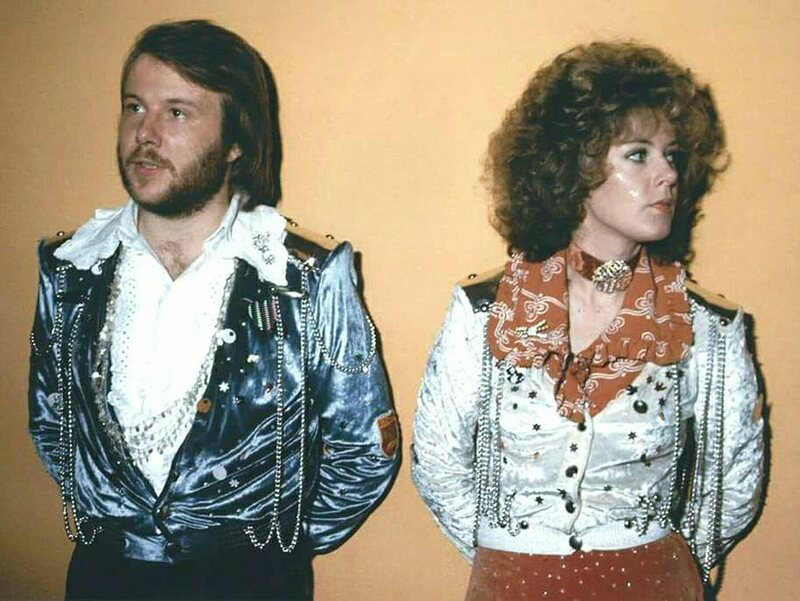 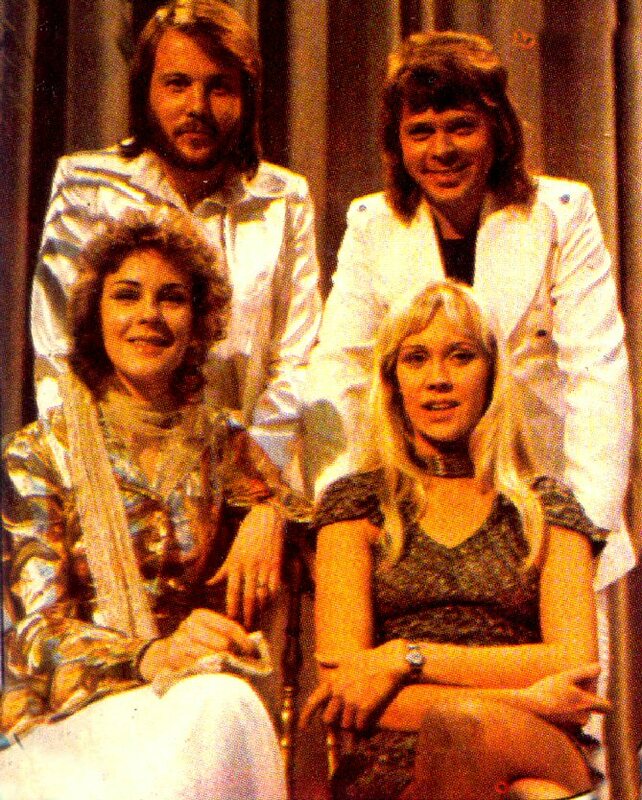 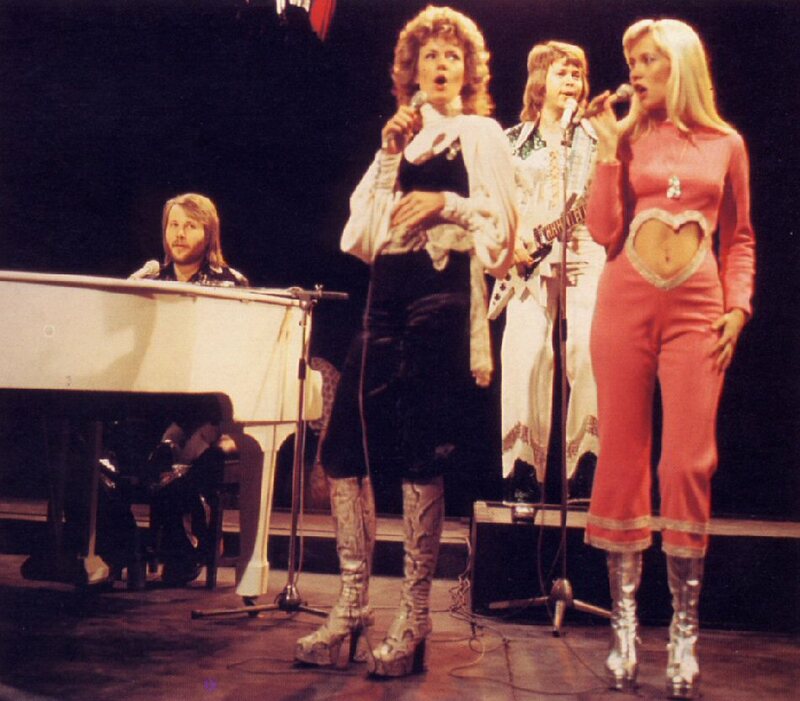 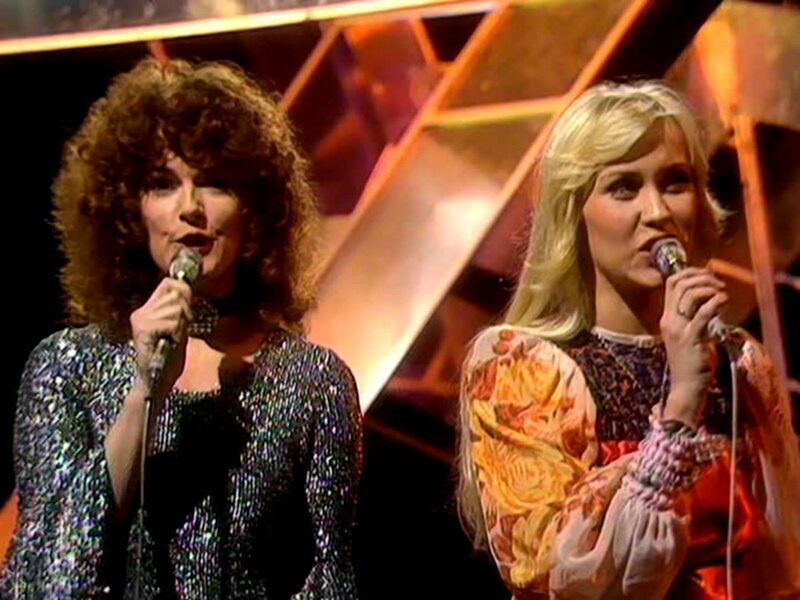 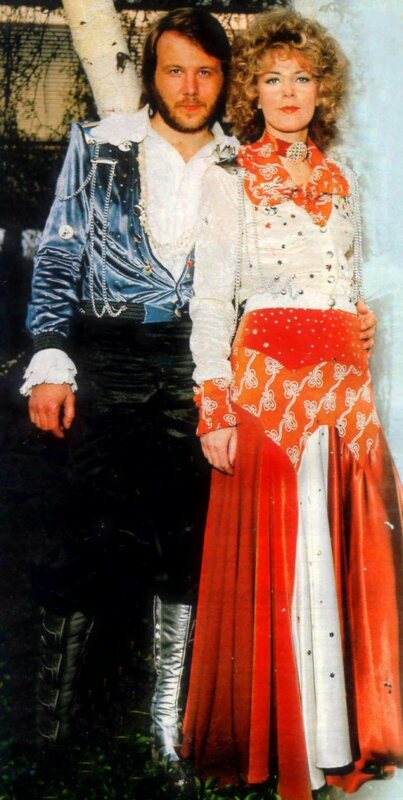 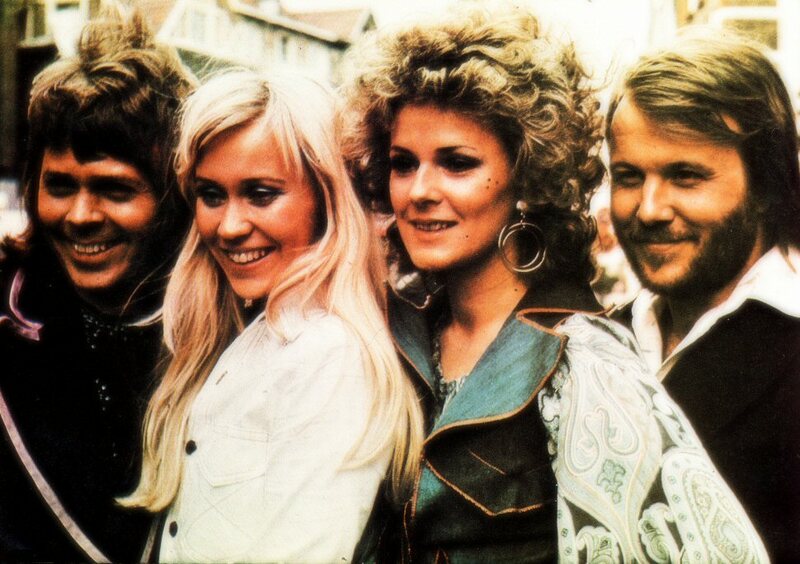 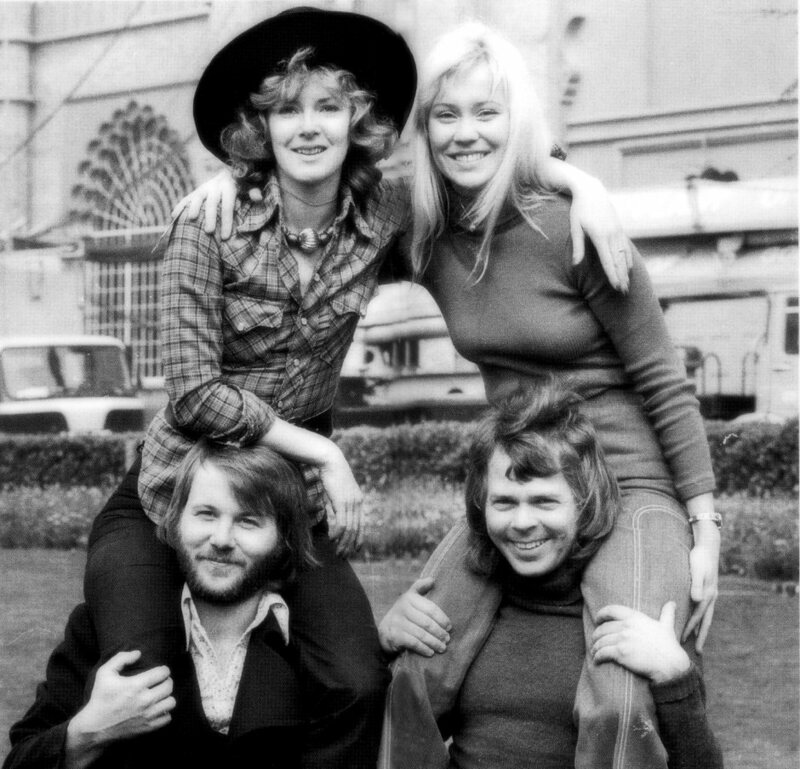 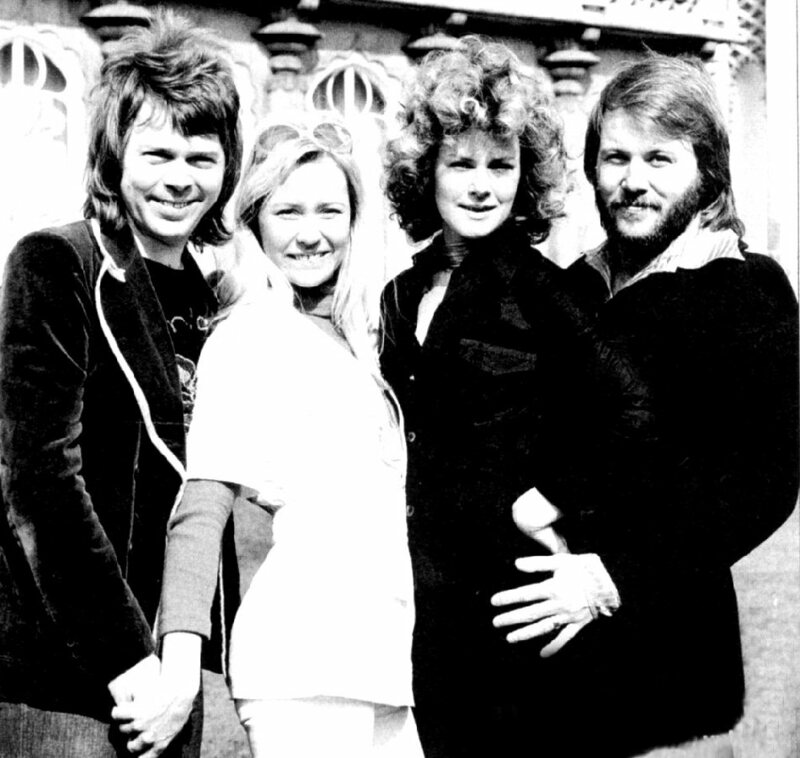 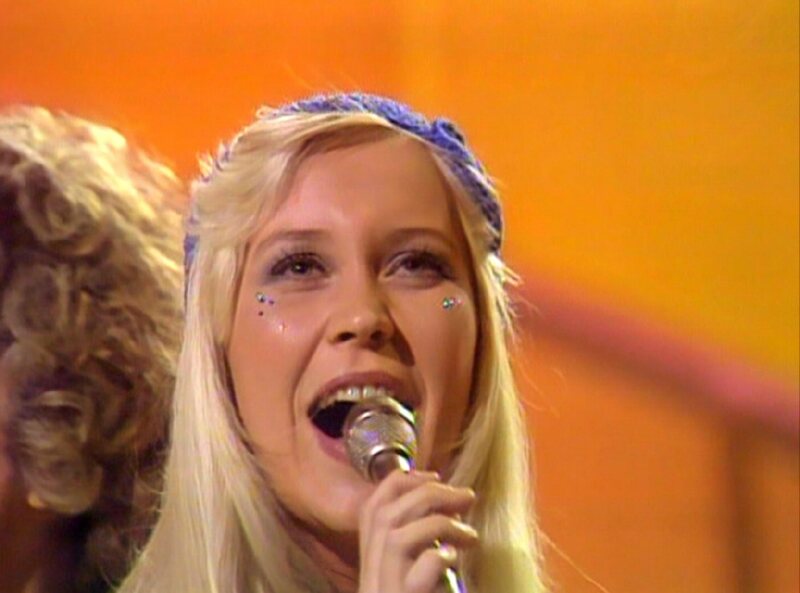 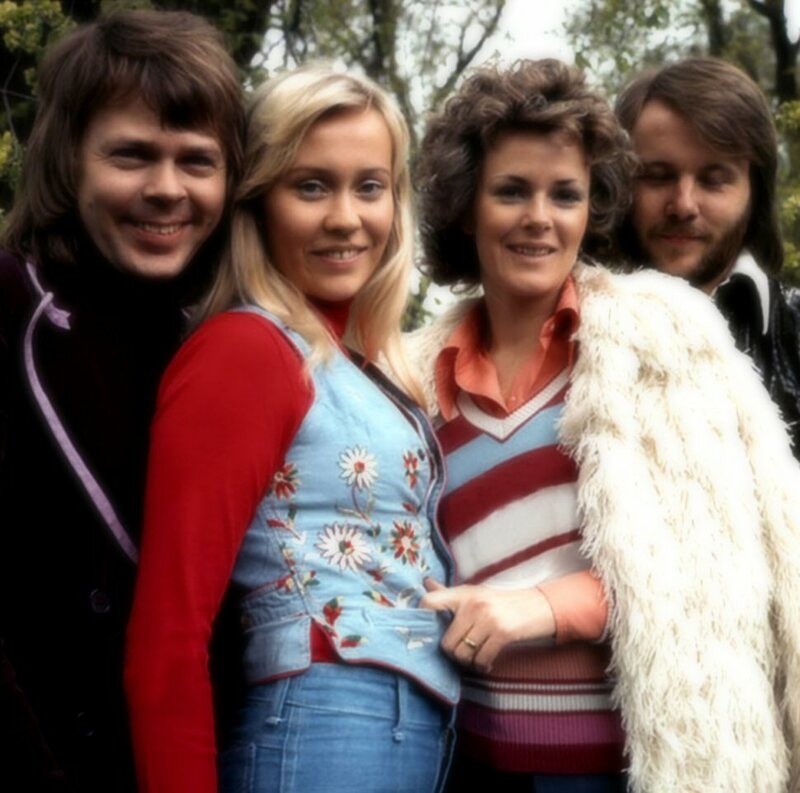 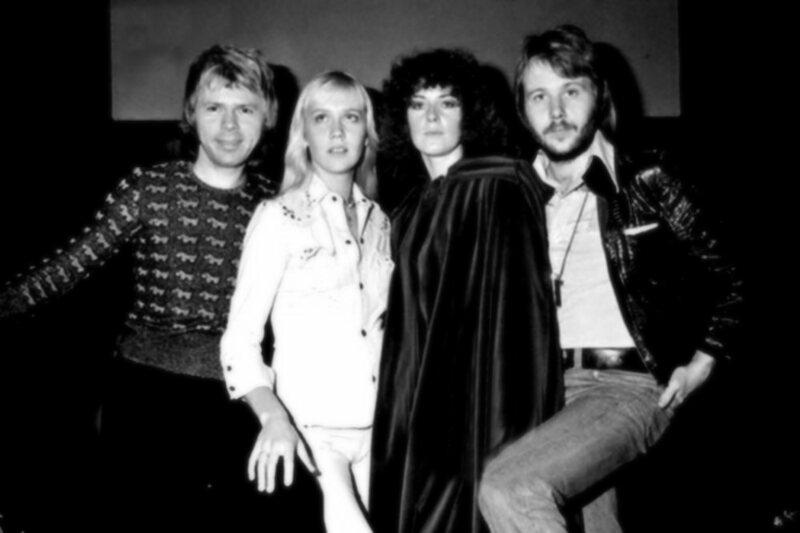 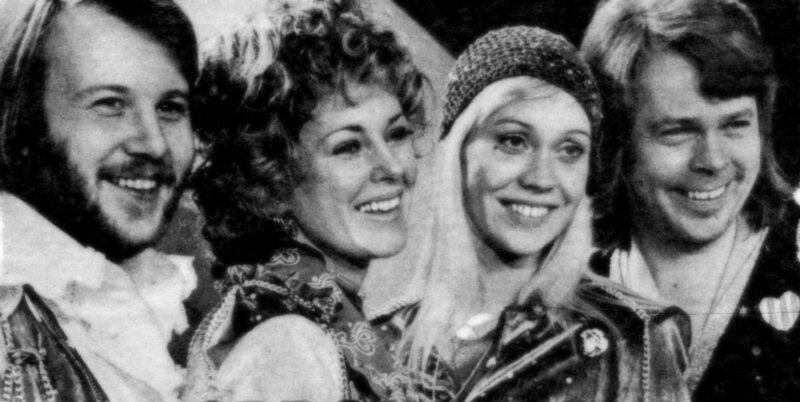 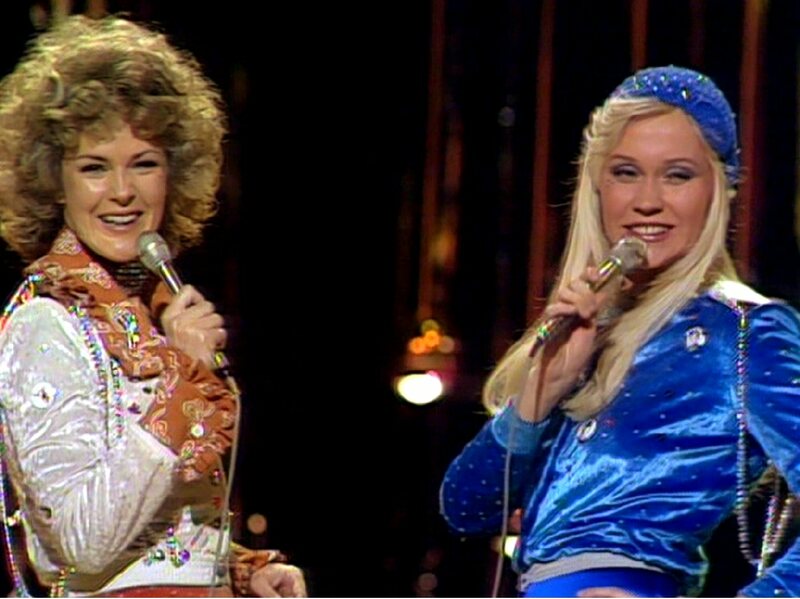 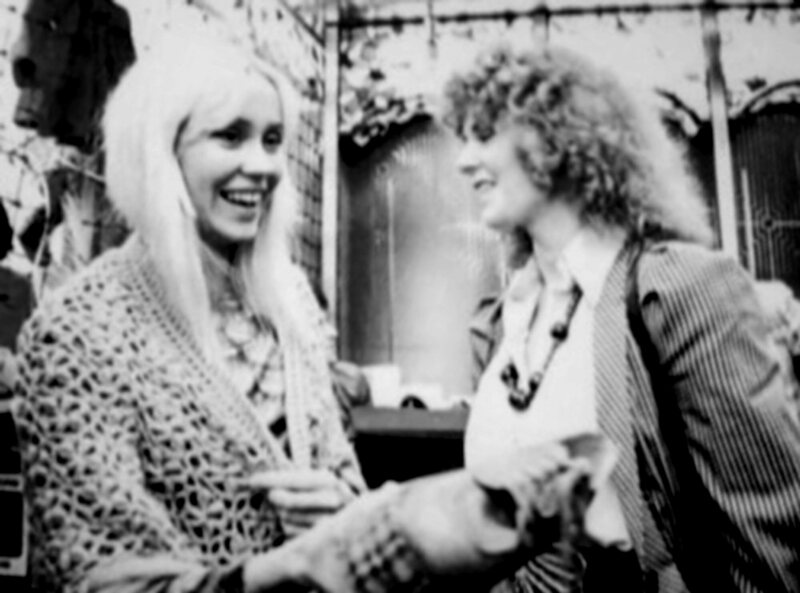 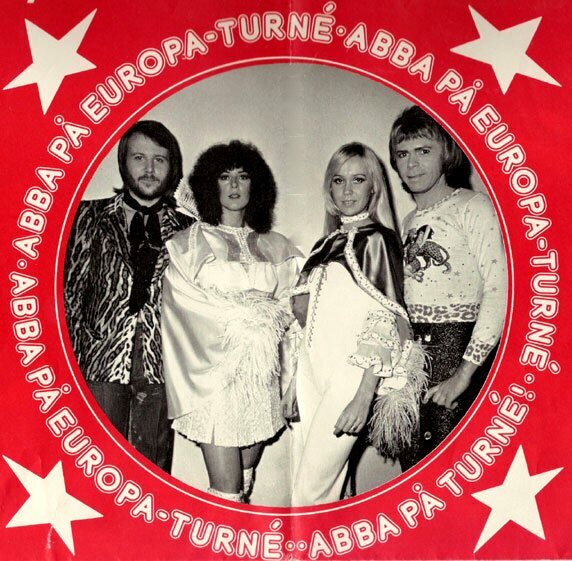 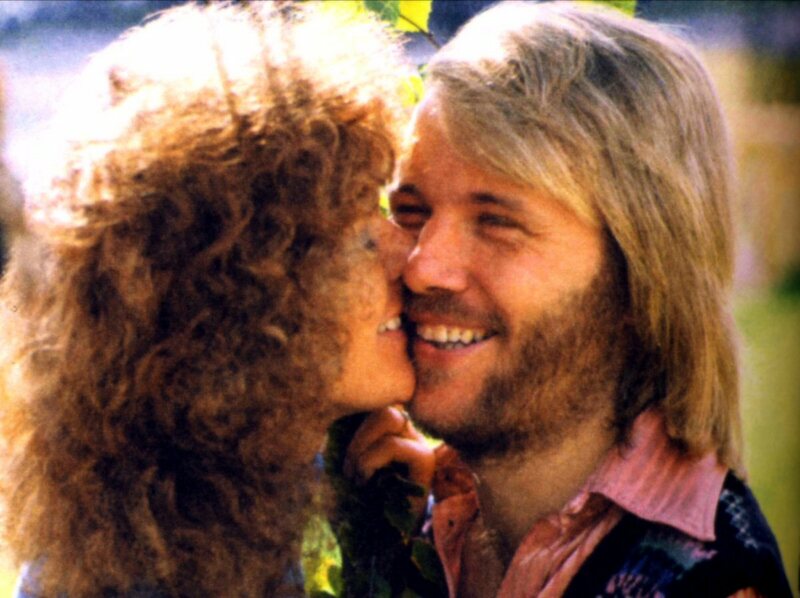 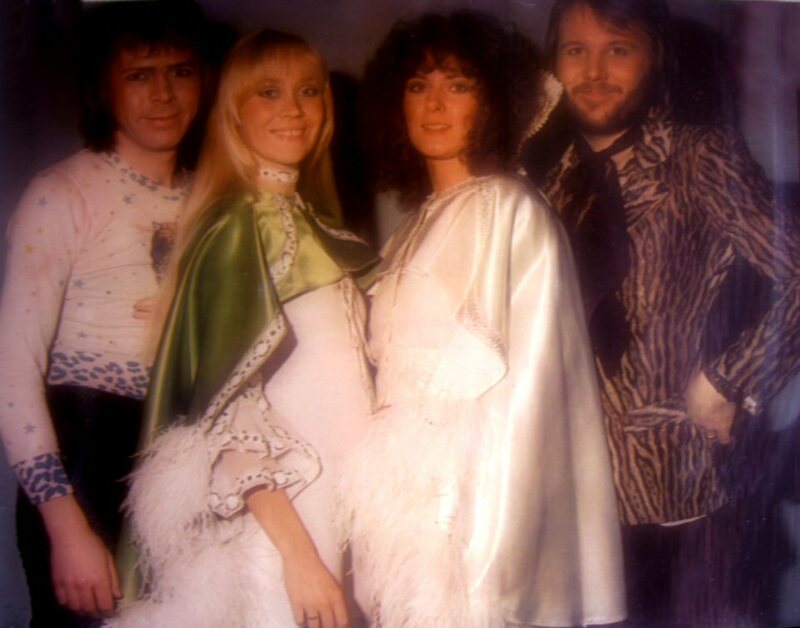 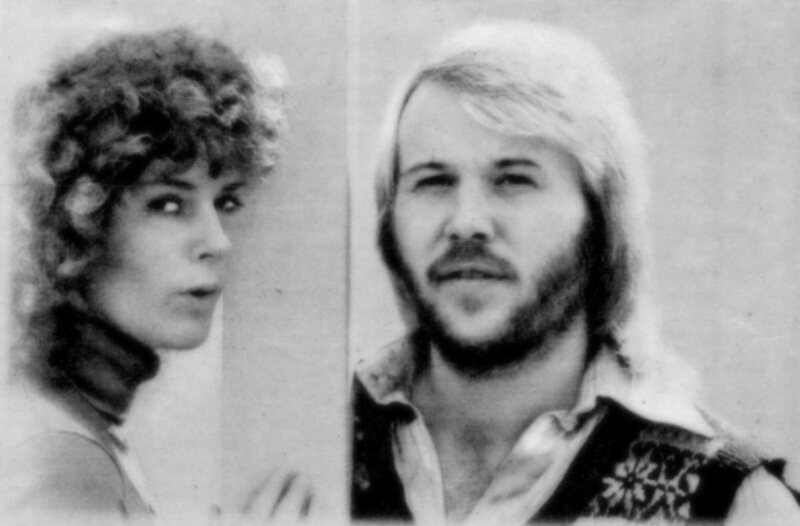 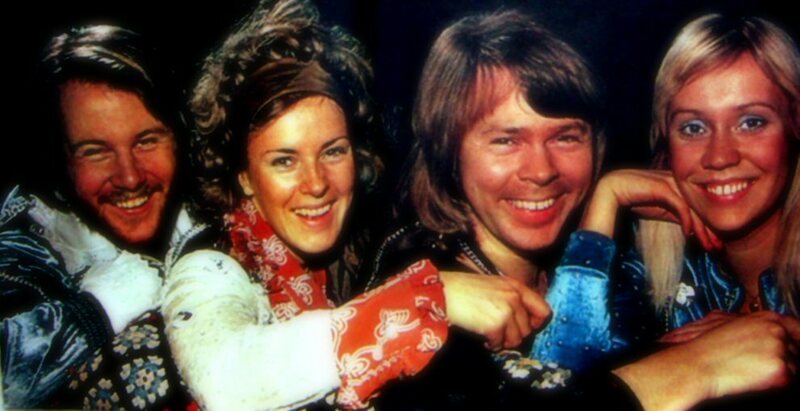 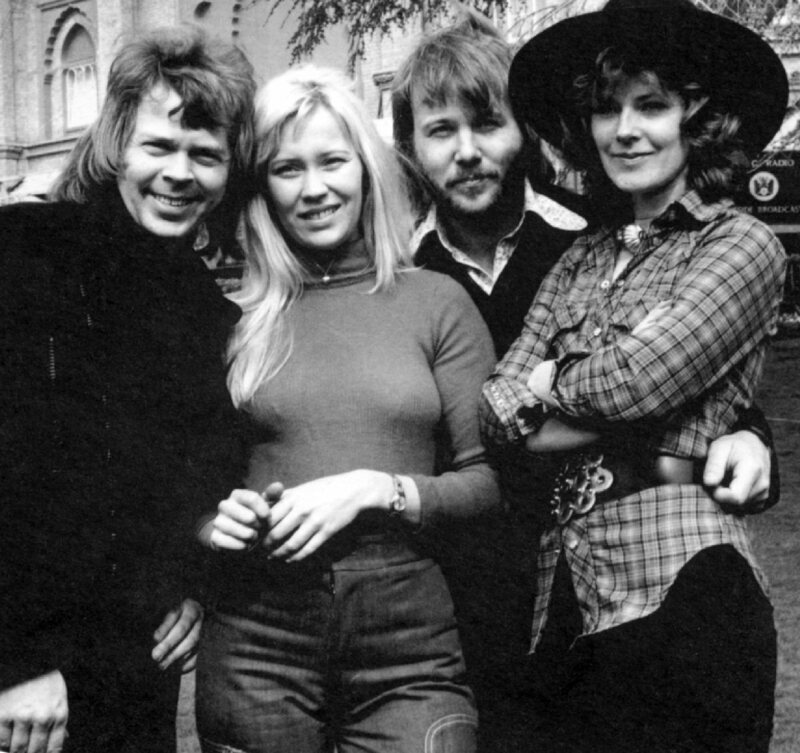 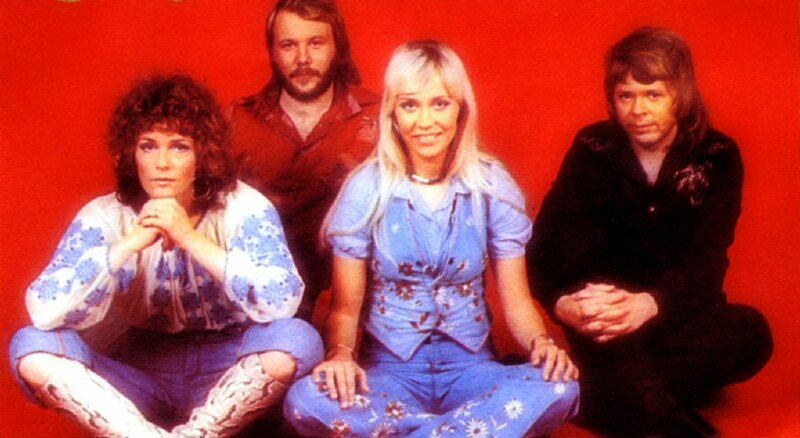 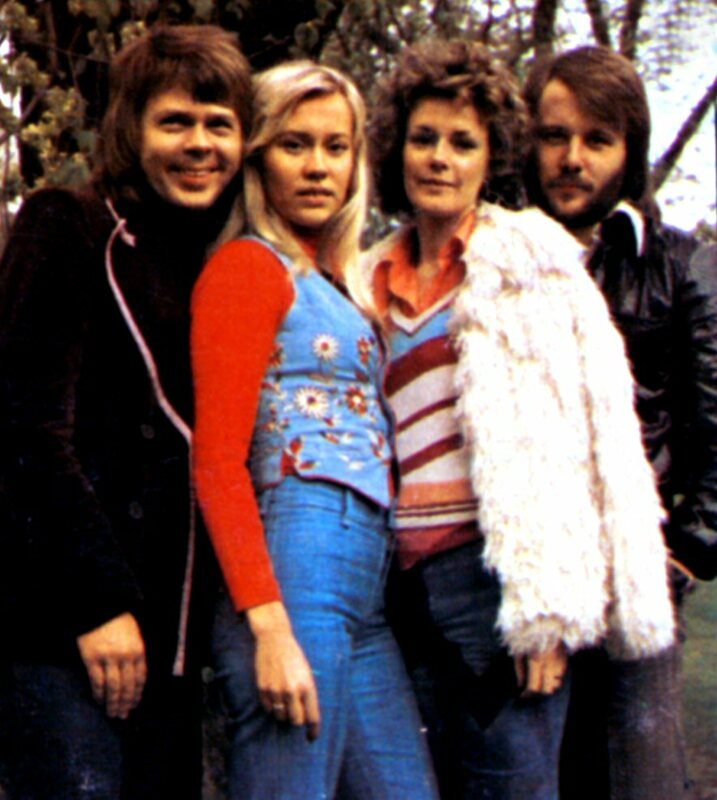 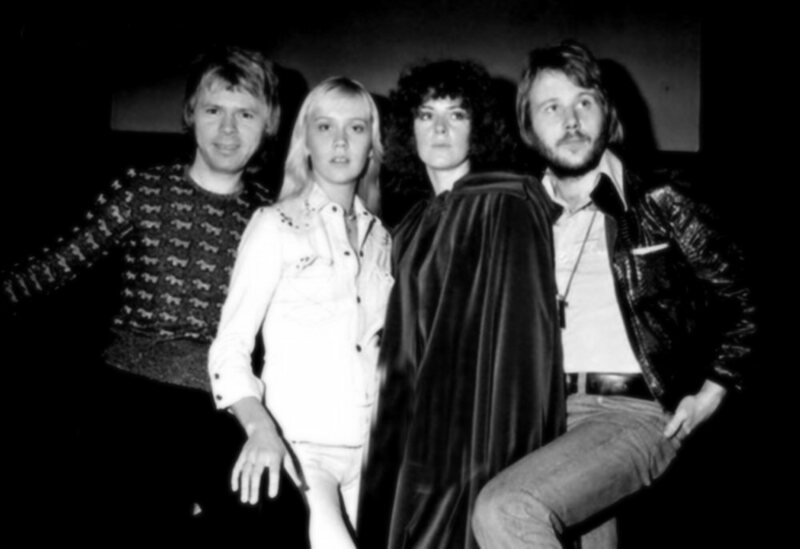 Both singles were very successful in ABBA's native country where they reached Top 3 on Topplistan. 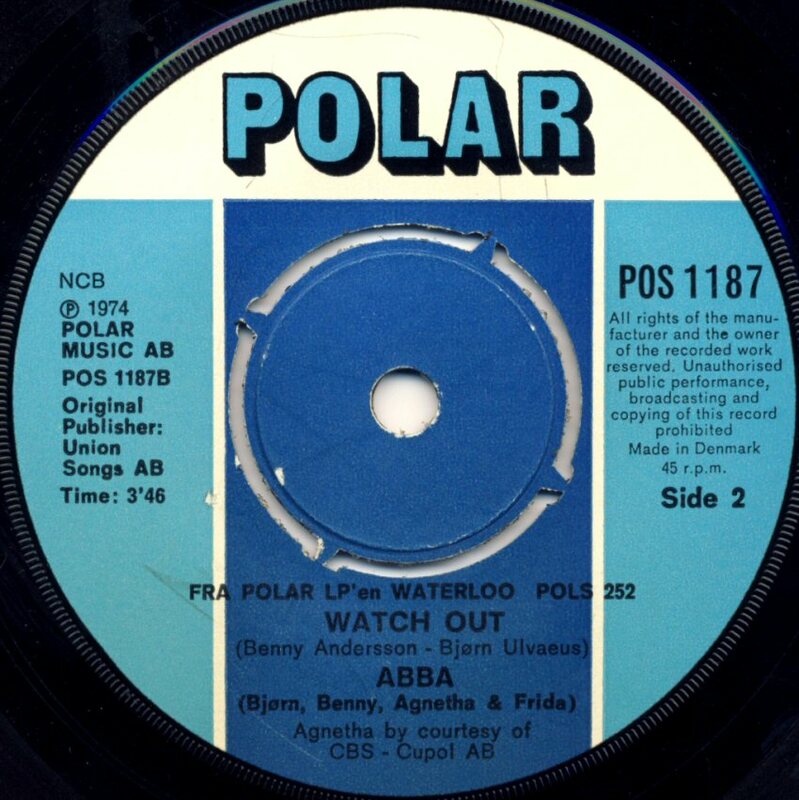 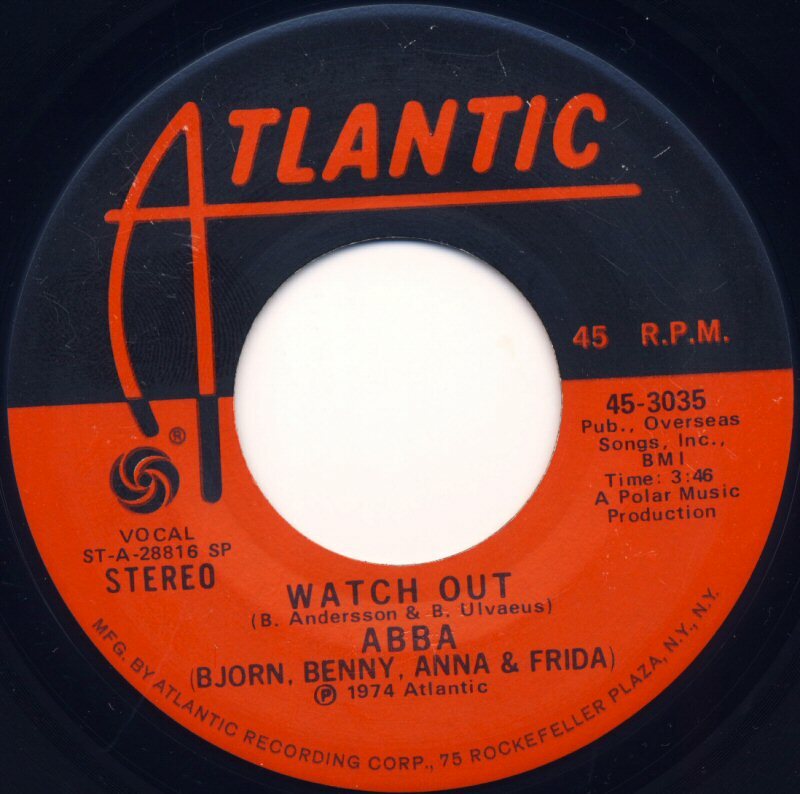 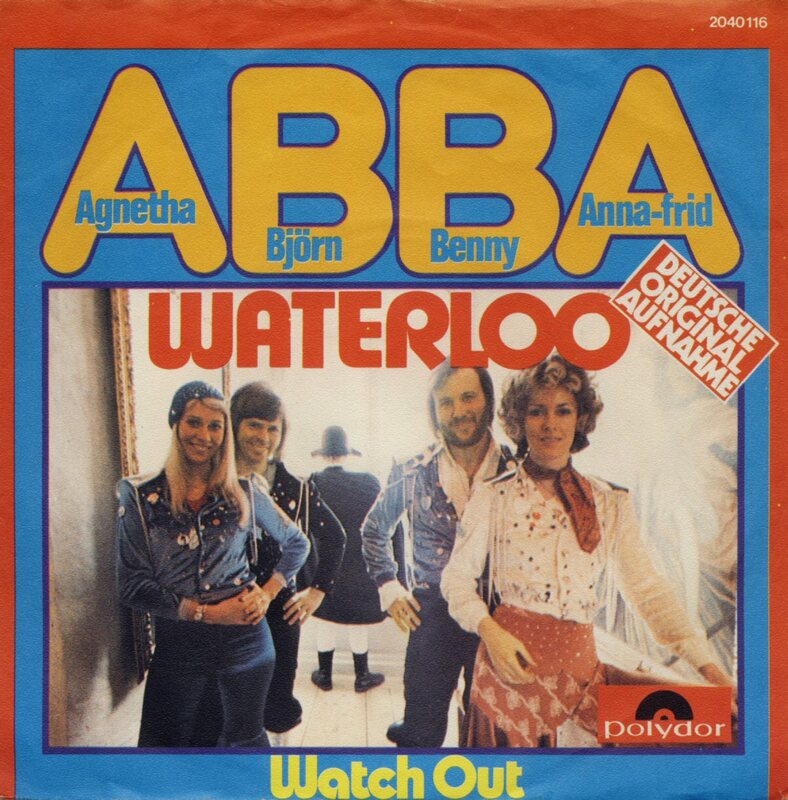 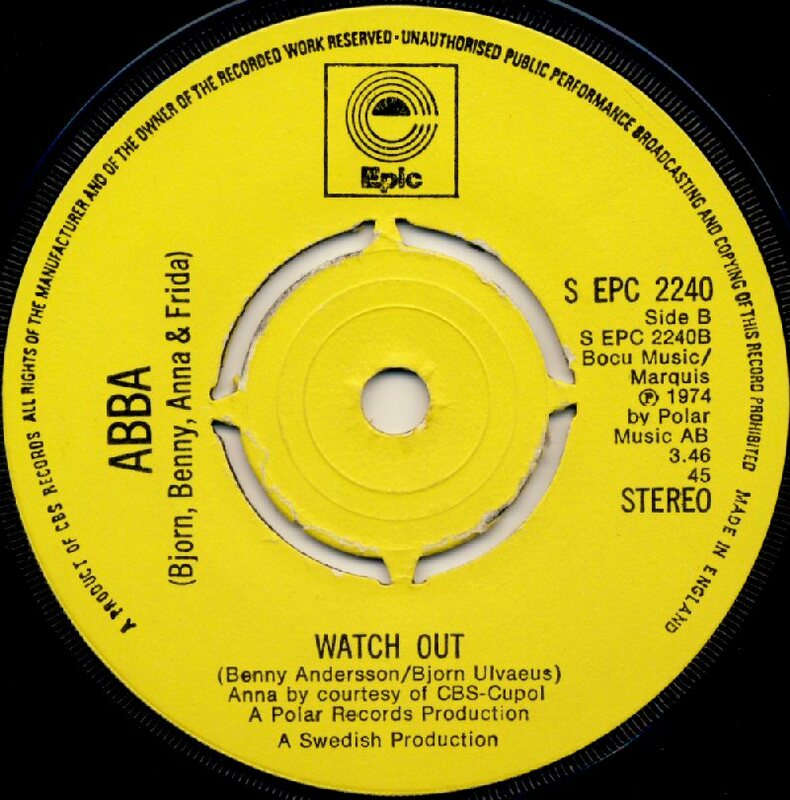 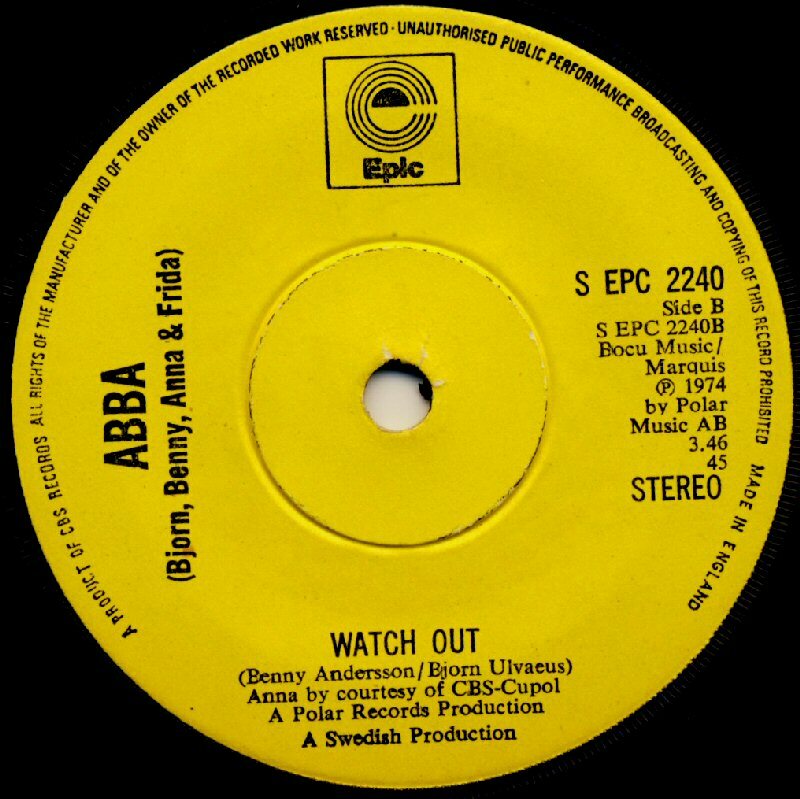 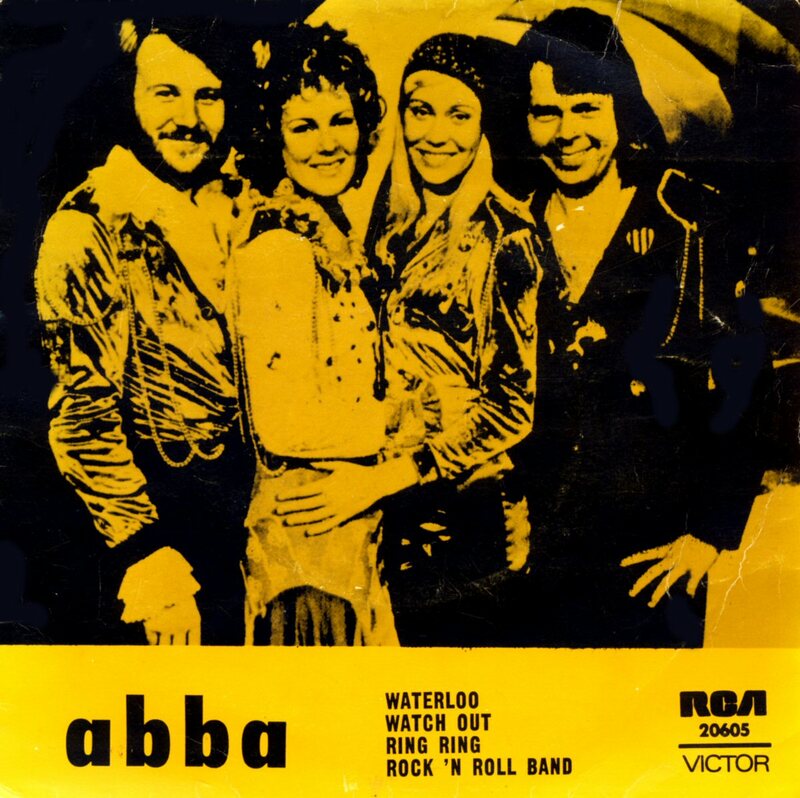 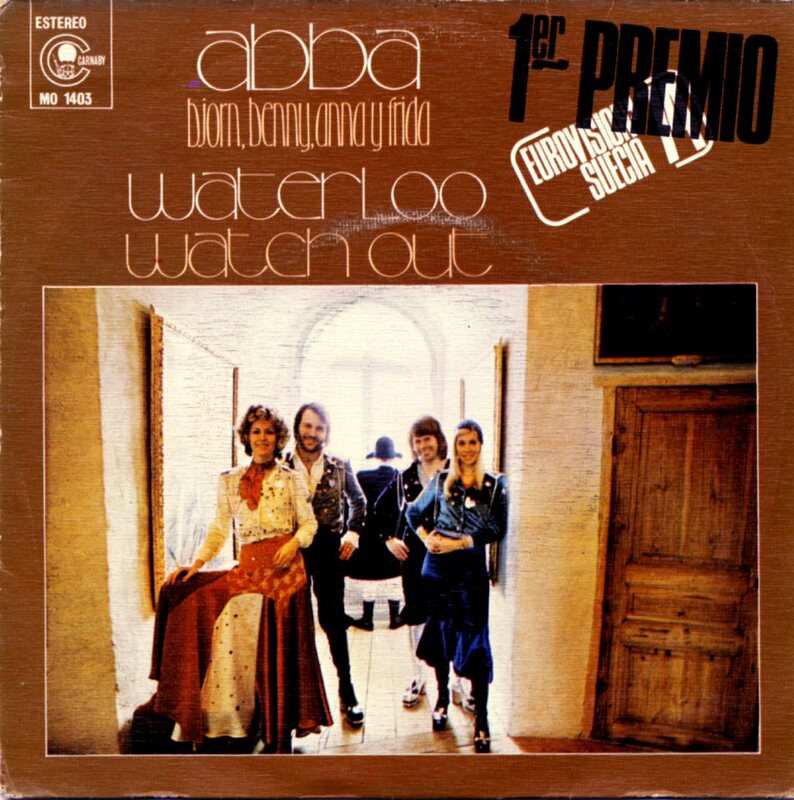 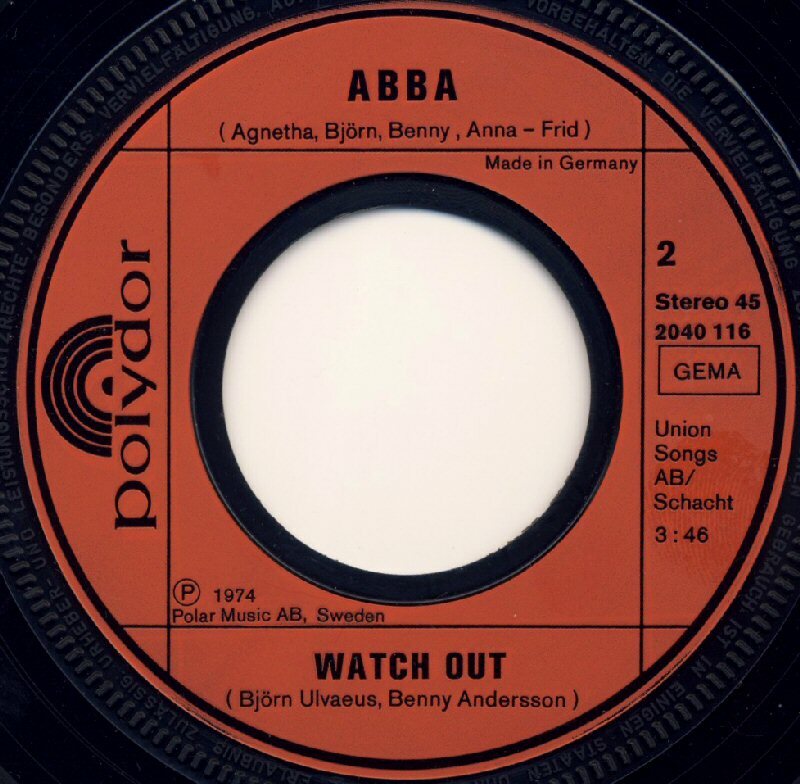 In Denmark the single "Waterloo"/"Watch Out" was released in a picture sleeve. 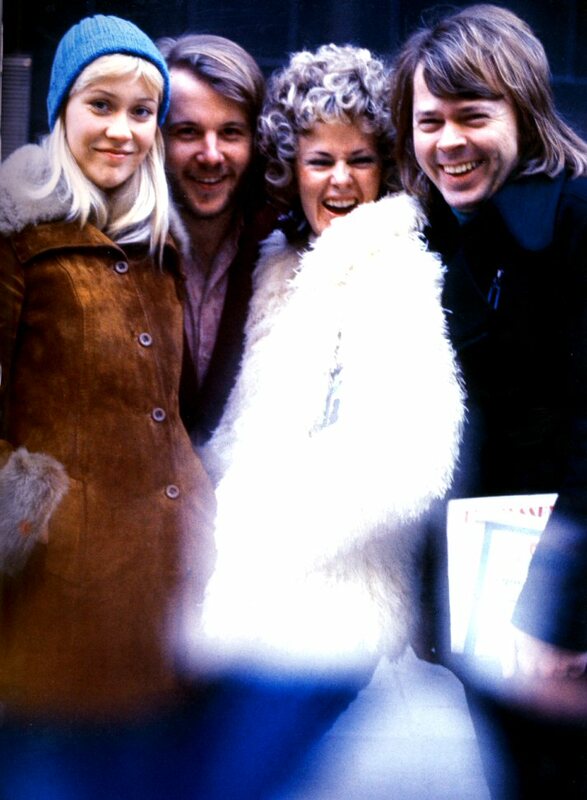 This photo session was taken by photographer Torbjörn Calvero on February 25th, 1974 outside the Polar Music office in Nybrogatan in Stockholm. 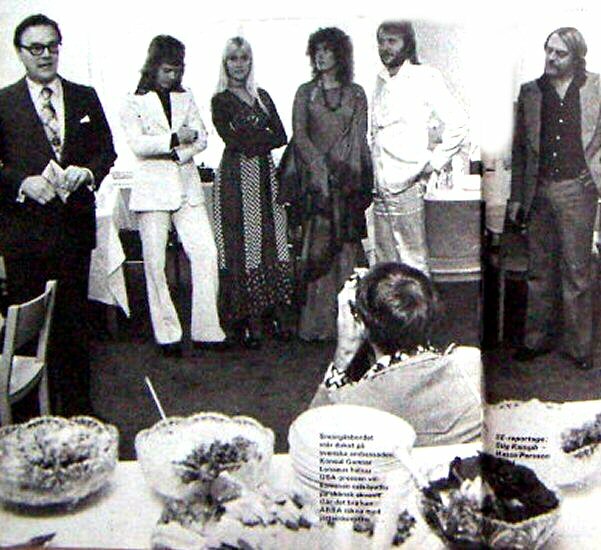 Two early photo sessions from 1974. 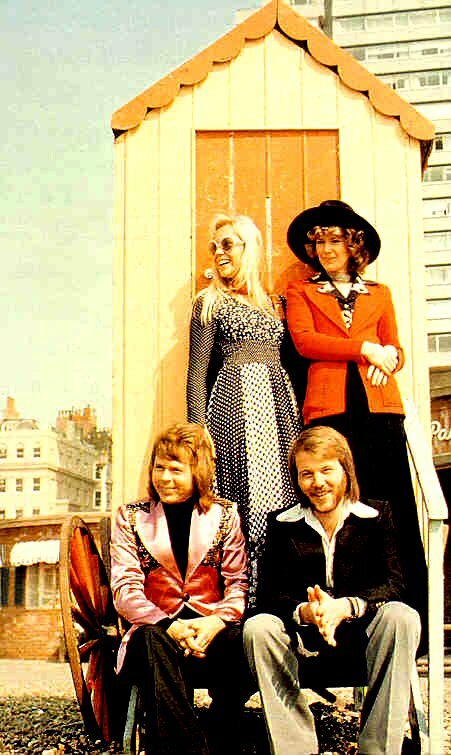 The photos were published all over the world as well as they appeared on several record covers as for instance the German SP "Honey Honey". 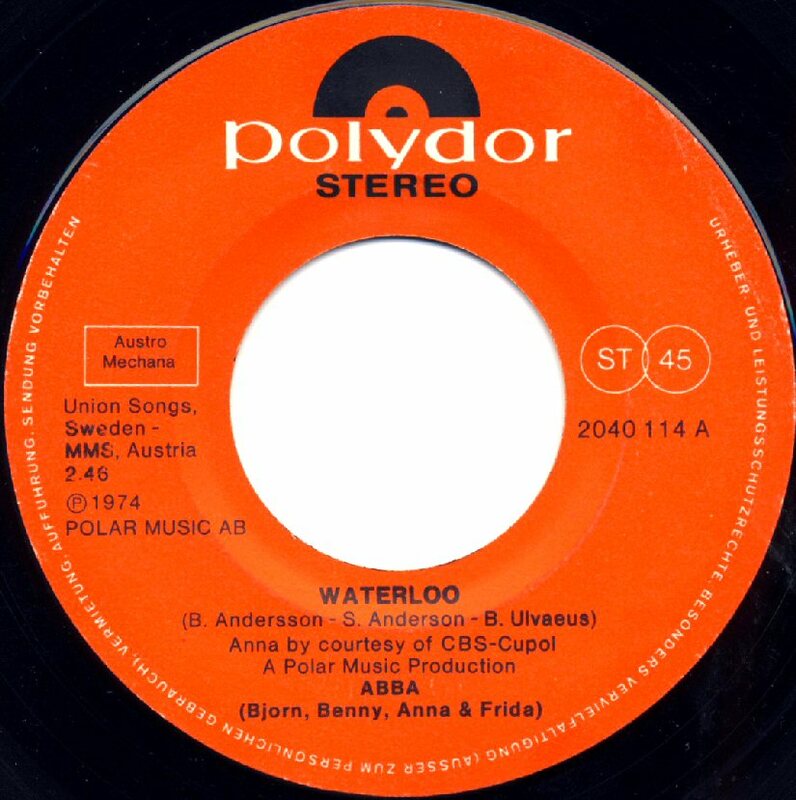 The album "Waterloo" was released in Sweden on March 4th, 1974. 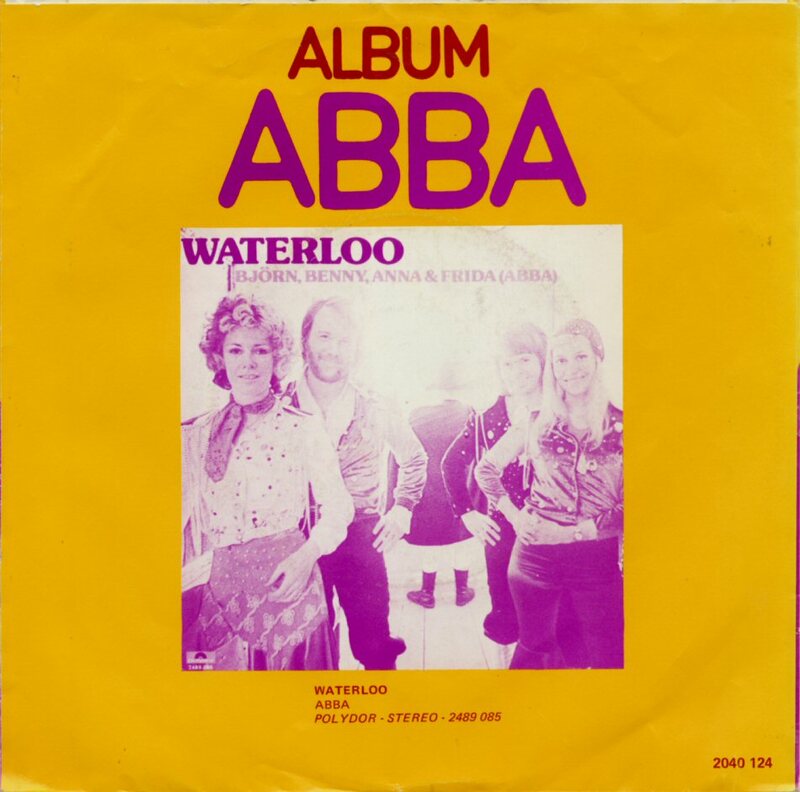 The album contained 12 songs featuring both Swedish and English versions of "Waterloo". 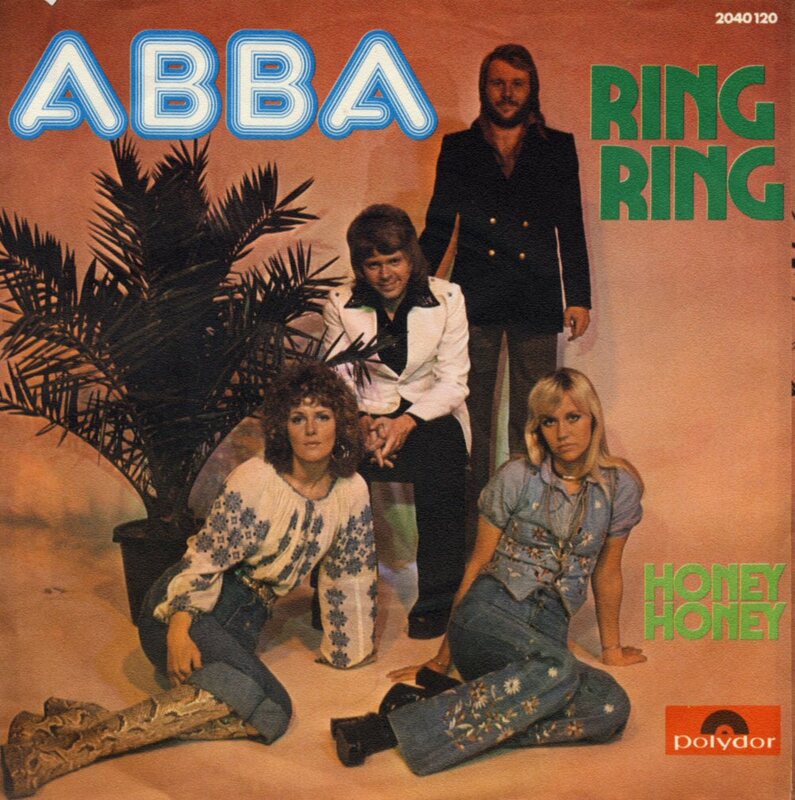 The bonus track on the Epic and Polydor versions of the album was the 1973 hit "Ring Ring". 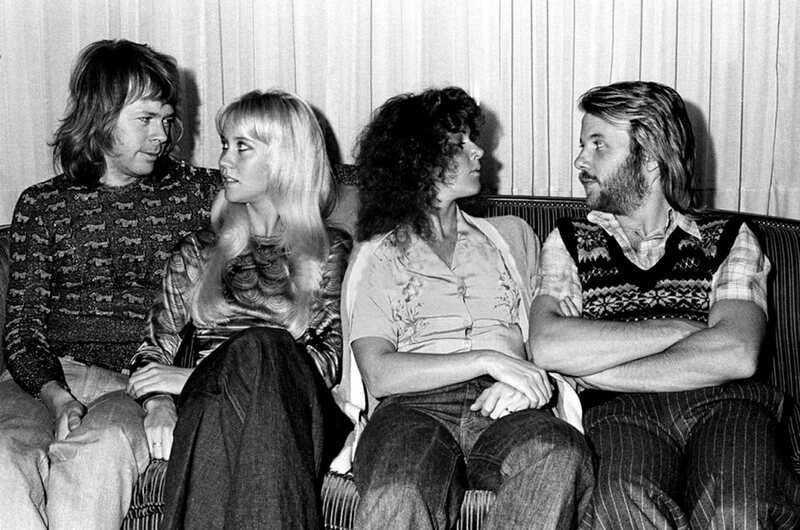 ABBA recorded their songs in English from the very beginning and the only exceptions were the songs "Waterloo", "Åh vilka tider" and "Honey Honey" which had been even recorded in Swedish. 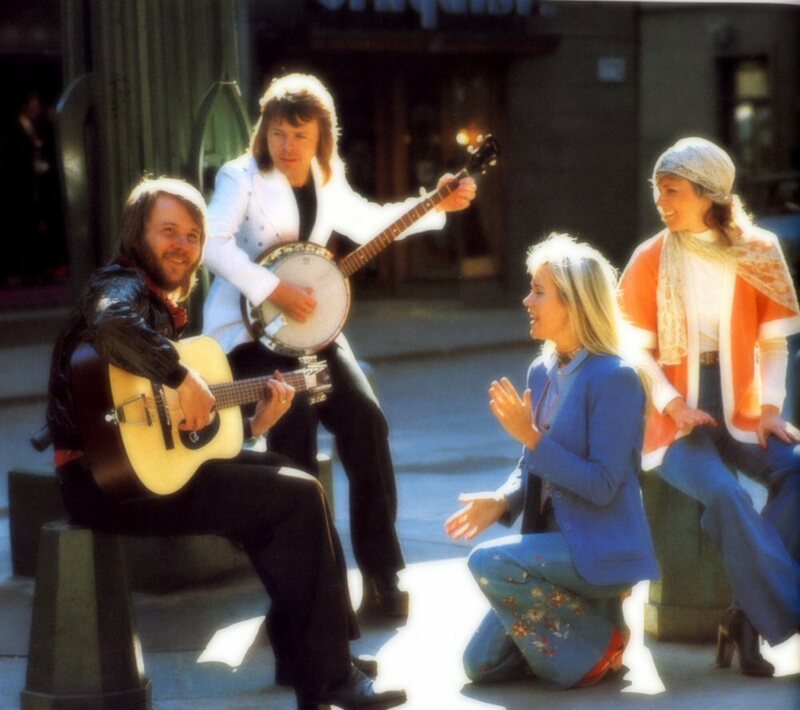 Frida's and Agnetha's vocals dominated on this album even if Björn still had leads on some tracks. 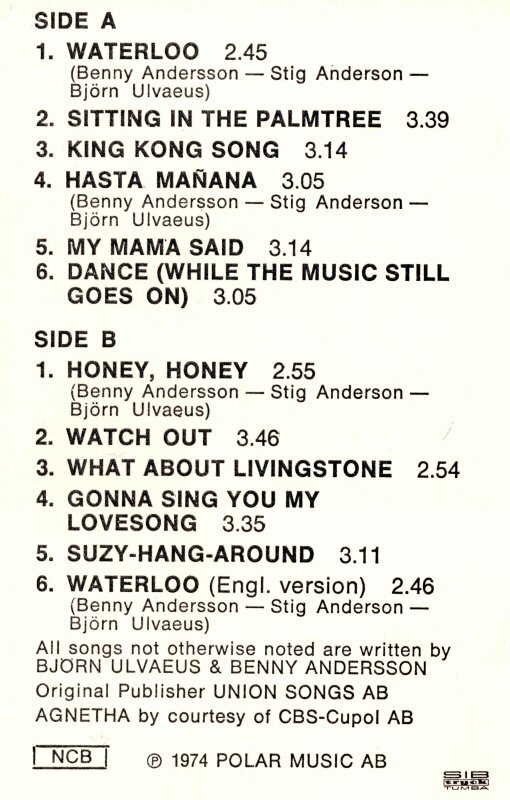 Even Benny contributed with lead vocal on "Suzy Hang Around". 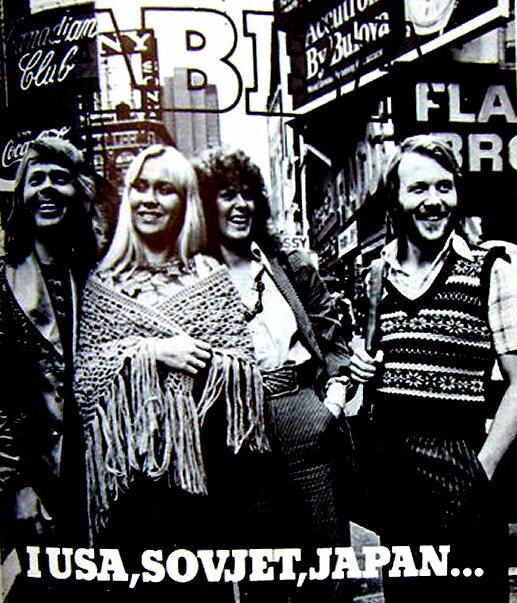 The cover picture was the same in all countries where album was released and only the design varied from country to country. 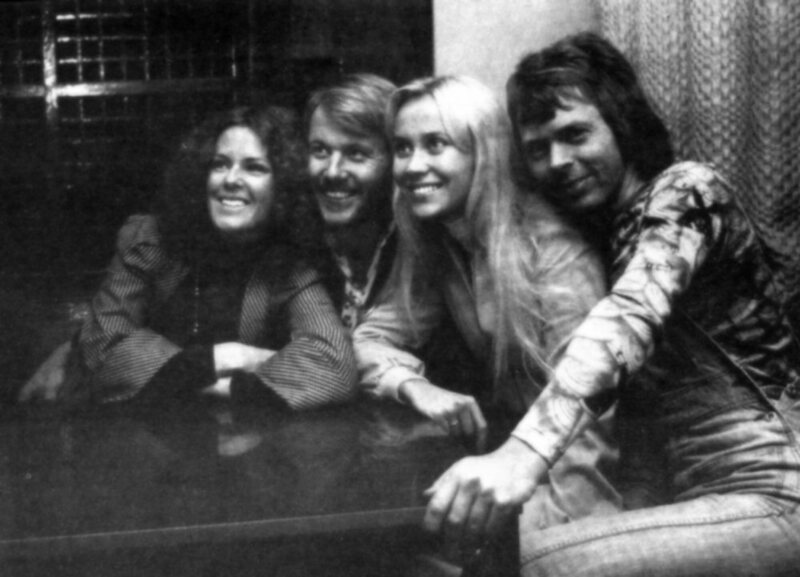 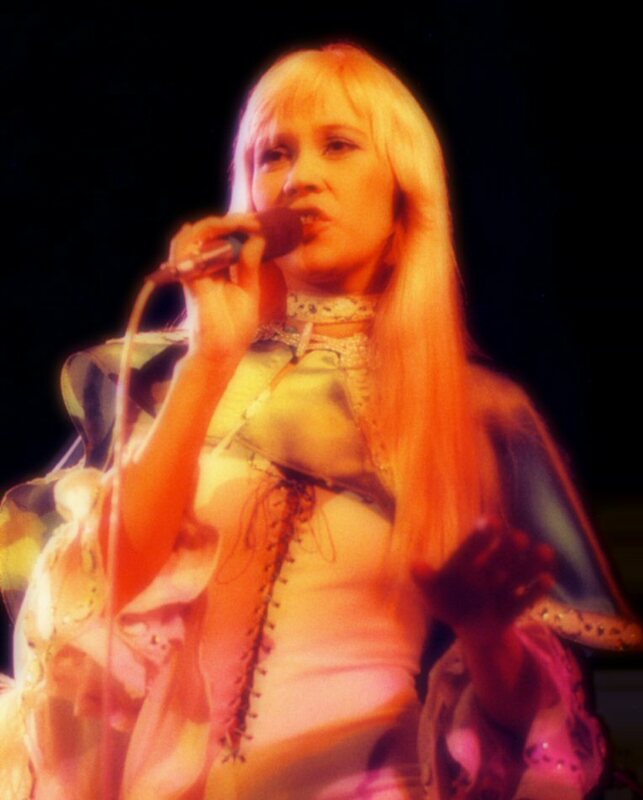 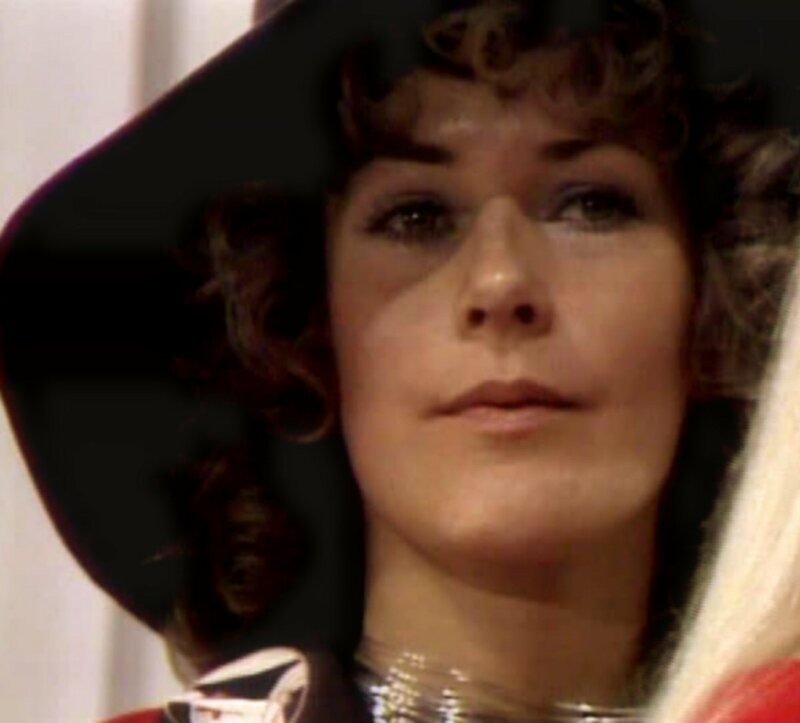 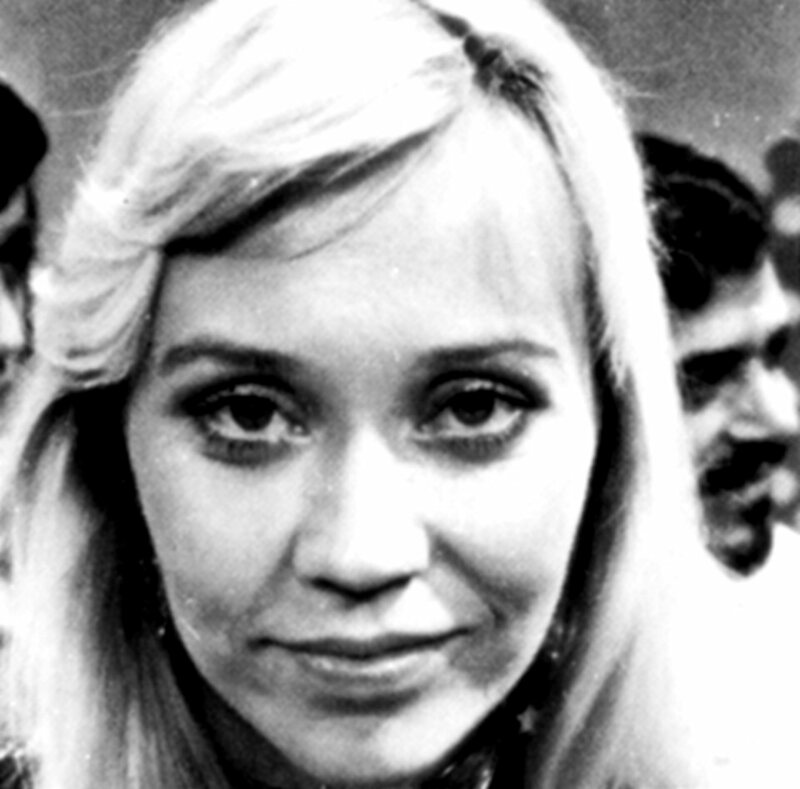 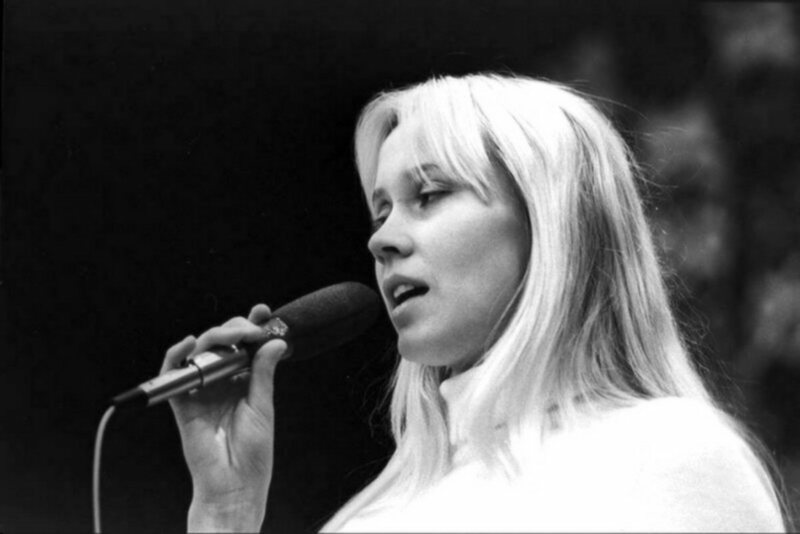 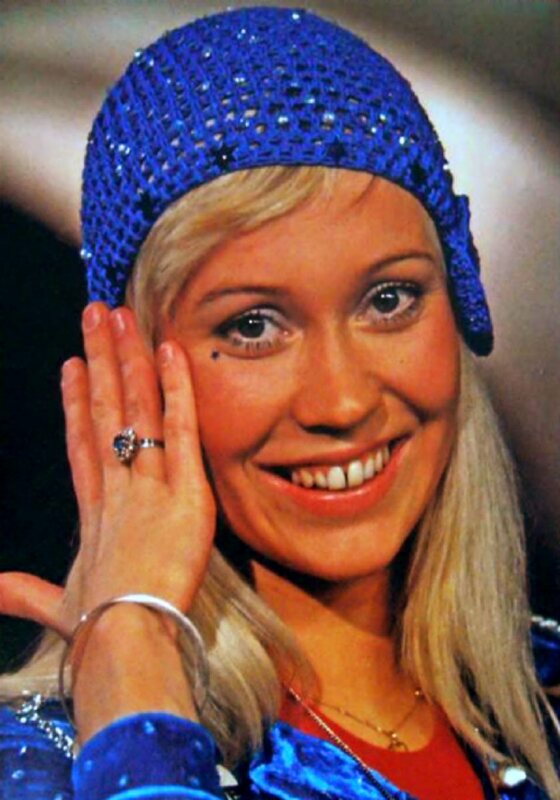 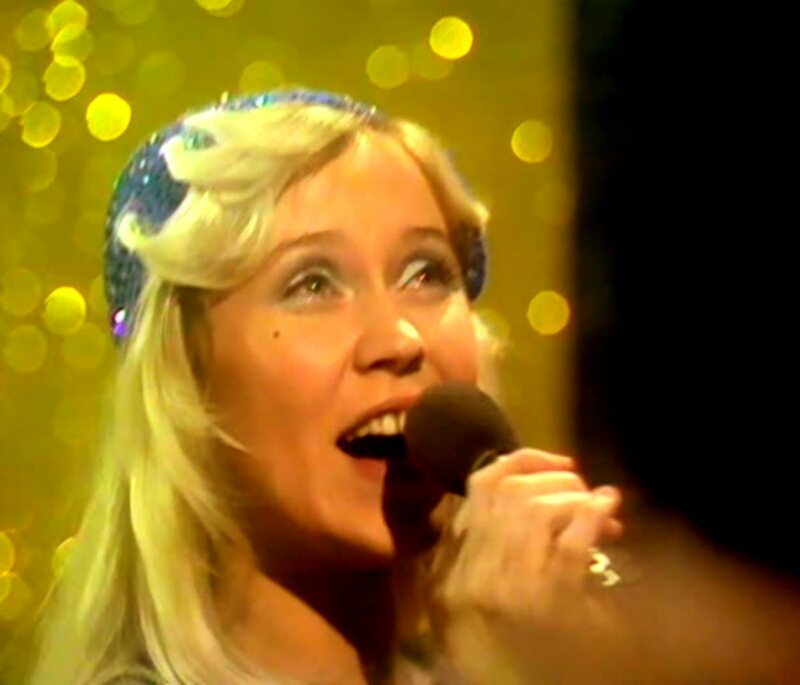 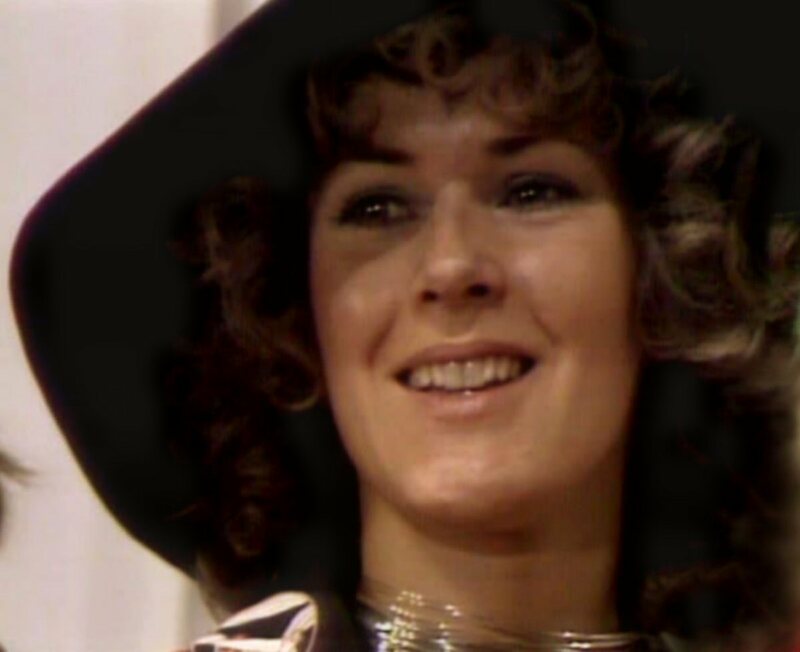 Even Agnetha's name was changed to Anna in certain territories. 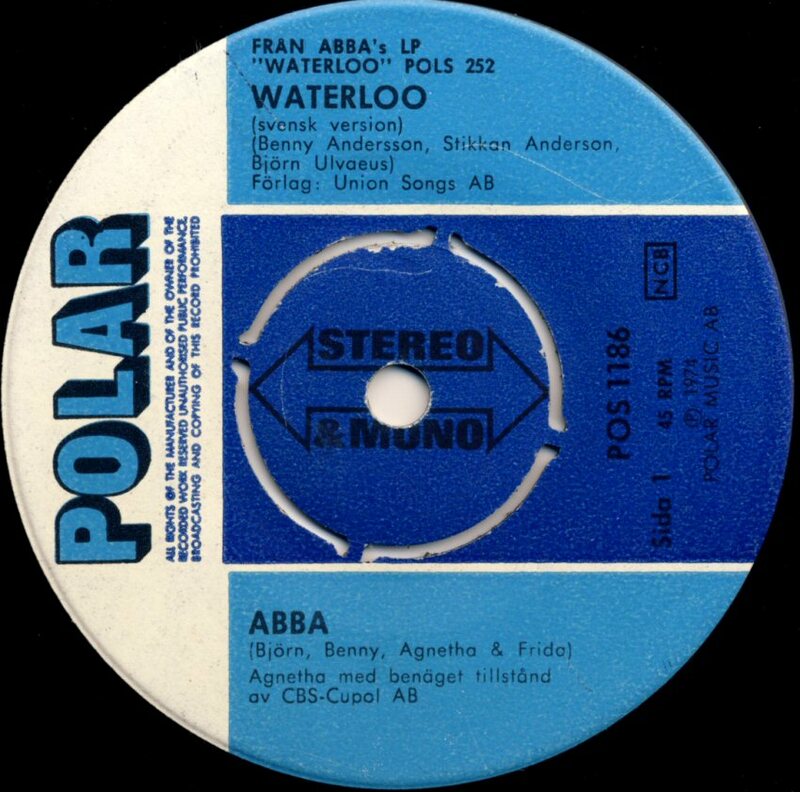 "Waterloo" entered the Swedish LP chart on March 12, 1974 where it stayed for 27 weeks peaking at #1. 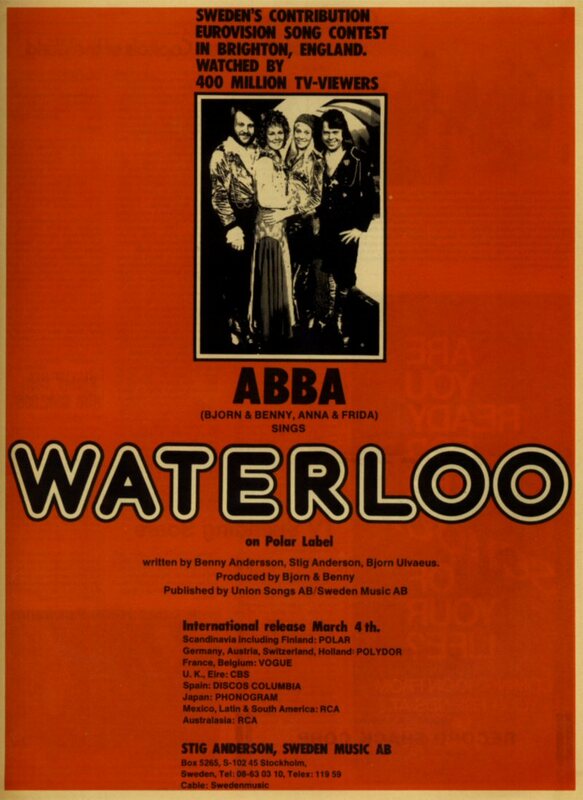 In West Germany "Waterloo" entered the chart on June 15th, 1974 and stayed there for 32 weeks reaching #6. 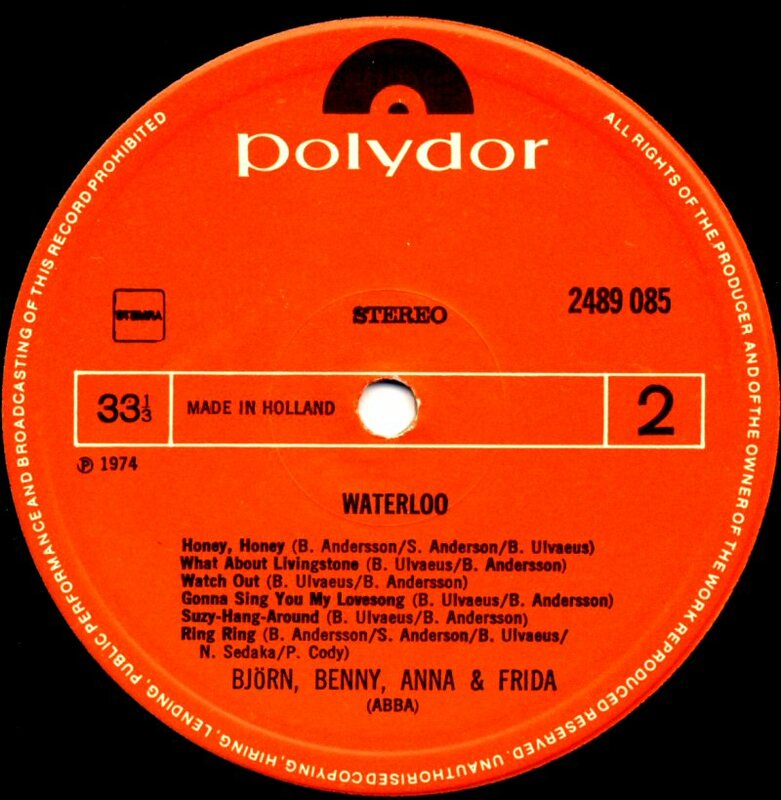 In the Netherlands the album "Waterloo" did not enjoy any bigger success and the LP did not appeared on the charts at all.. 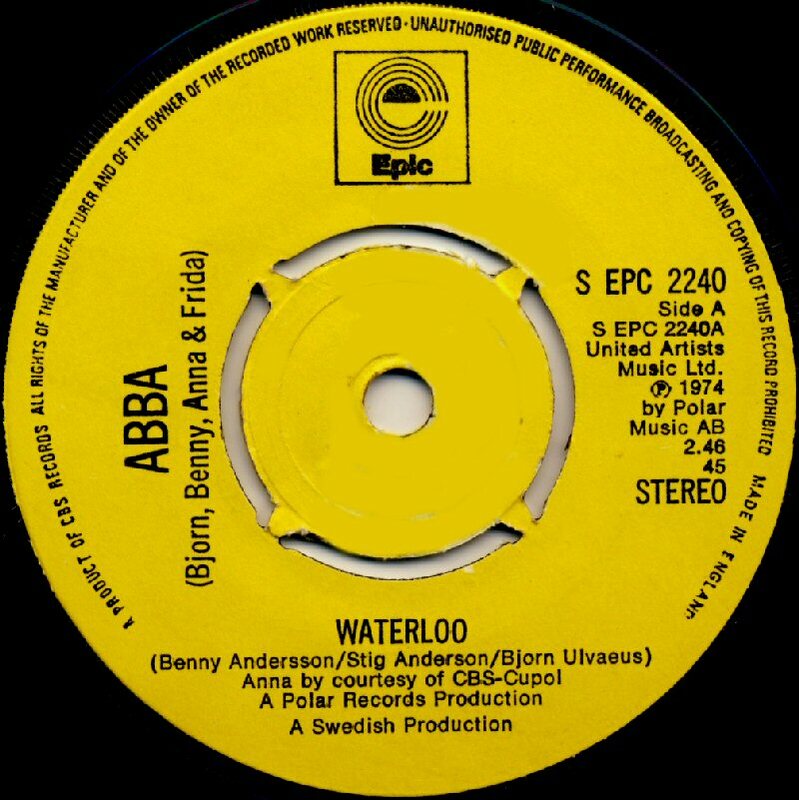 In Great Britain the LP "Waterloo" was released in May 74 and it entered the album chart on June 8th, 1974 where it stayed for only 2 weeks reaching #28. 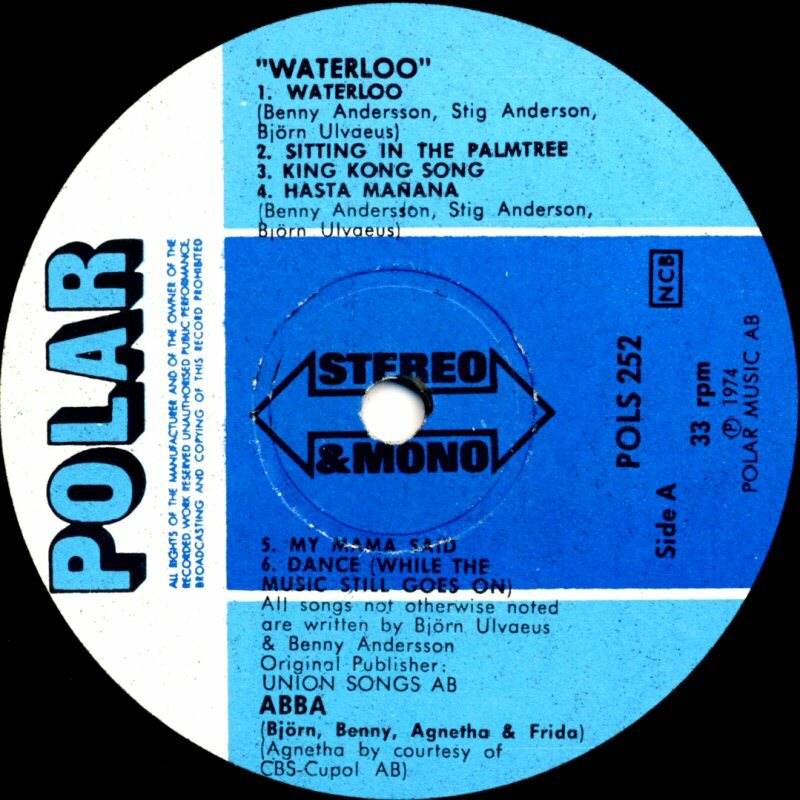 The album "Waterloo" saw its release in Spain at the beginning of May 1974. 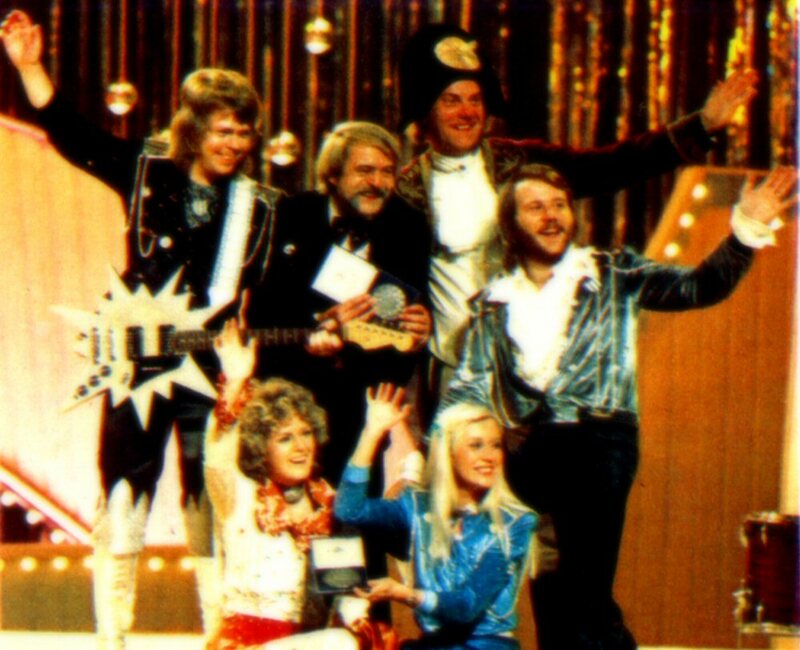 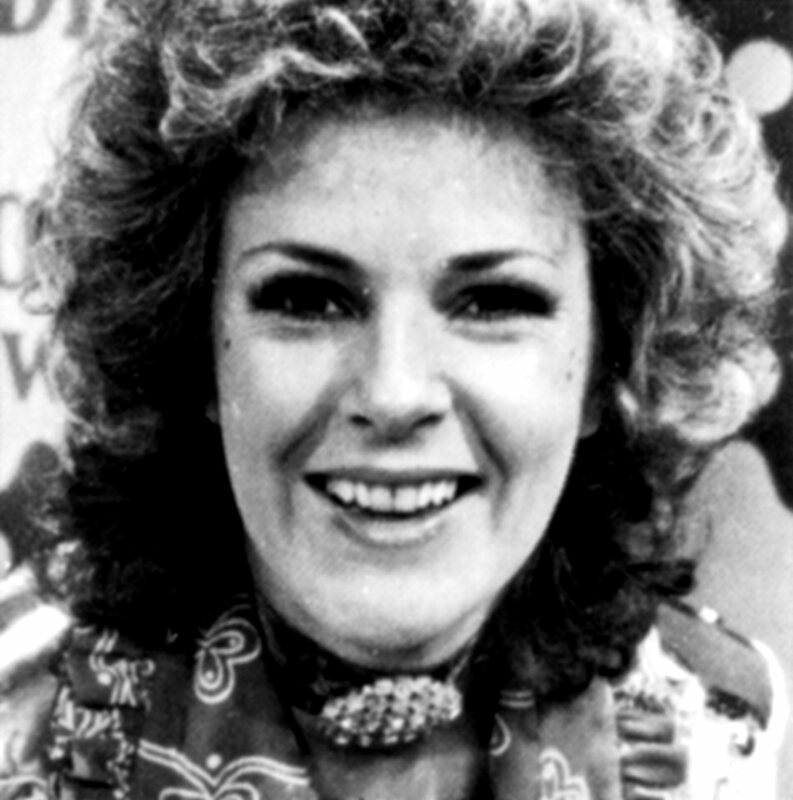 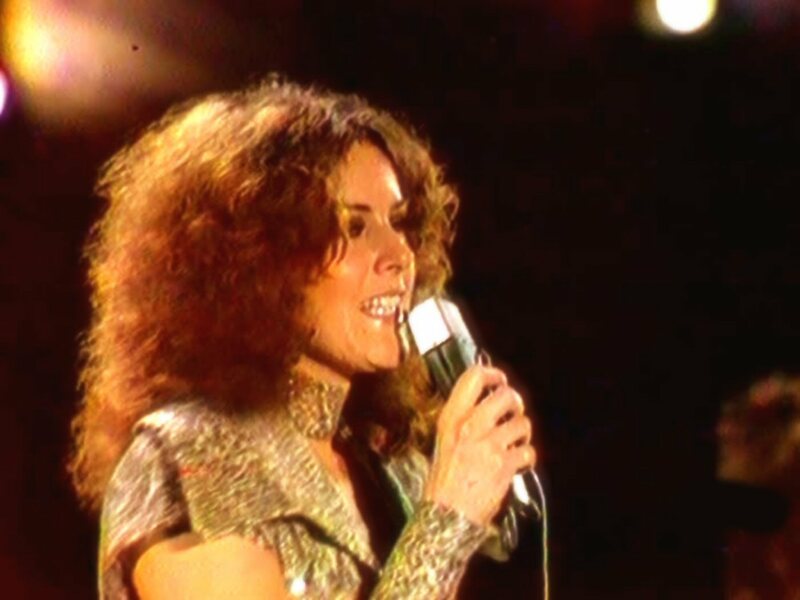 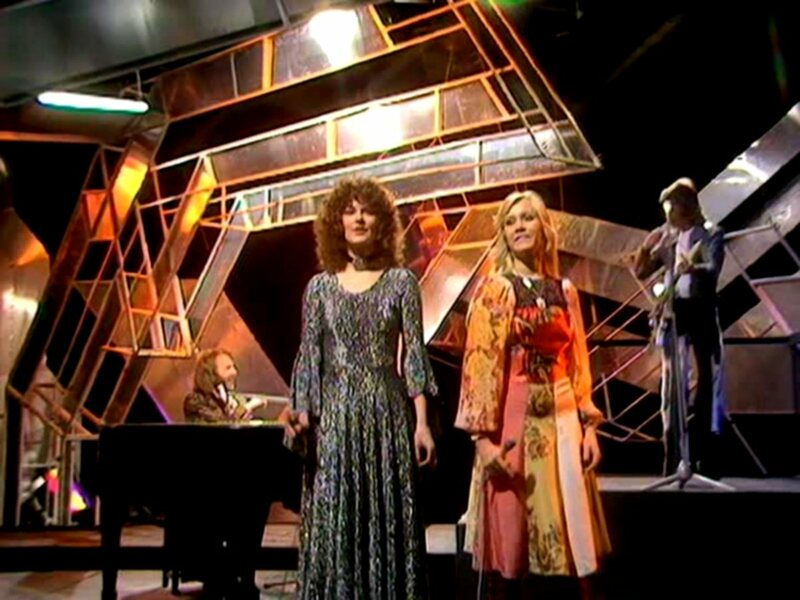 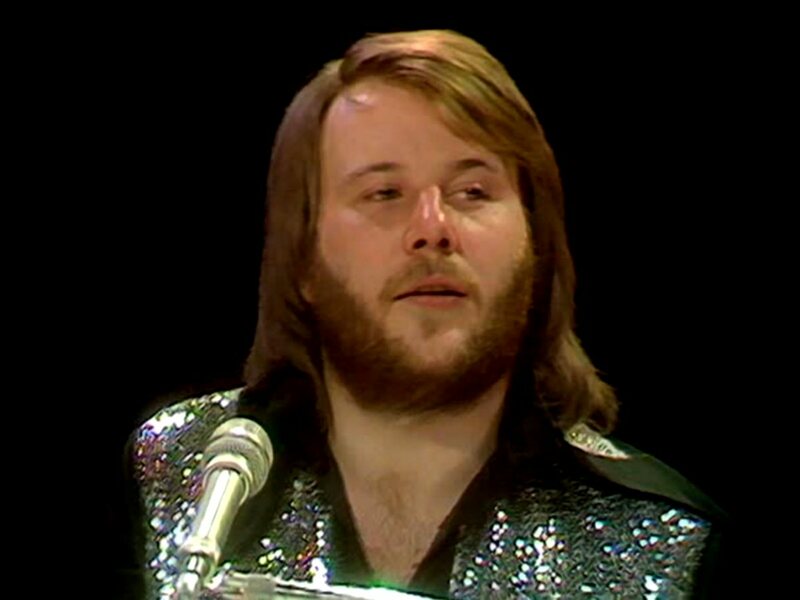 Under the title of the album there was even a plain information that the group had won the 1974 Eurovision Song Contest. 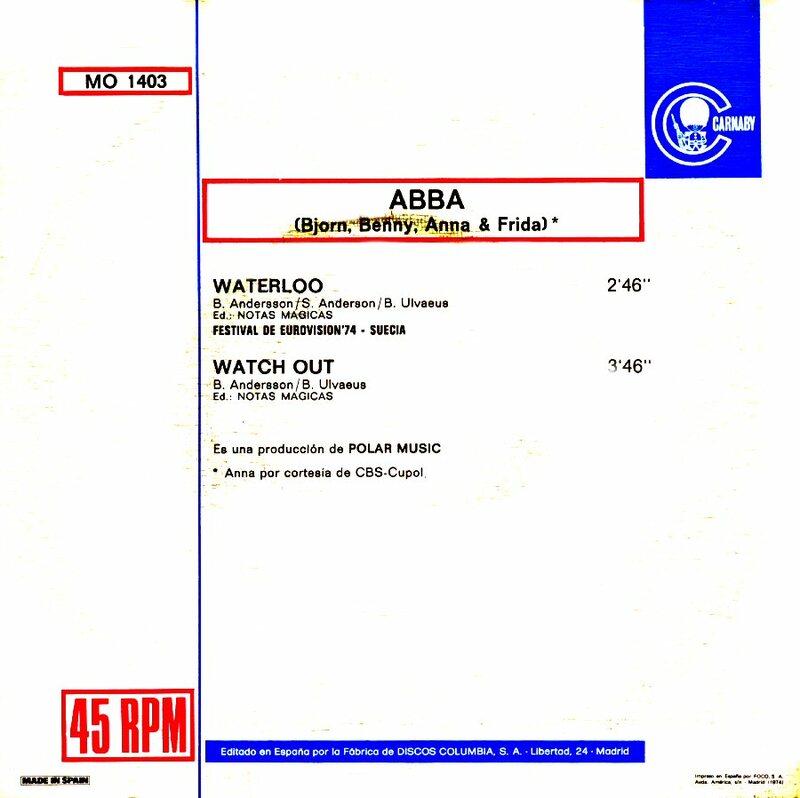 The Spanish album cover had different design comparing to the other releases but the same cover photo. 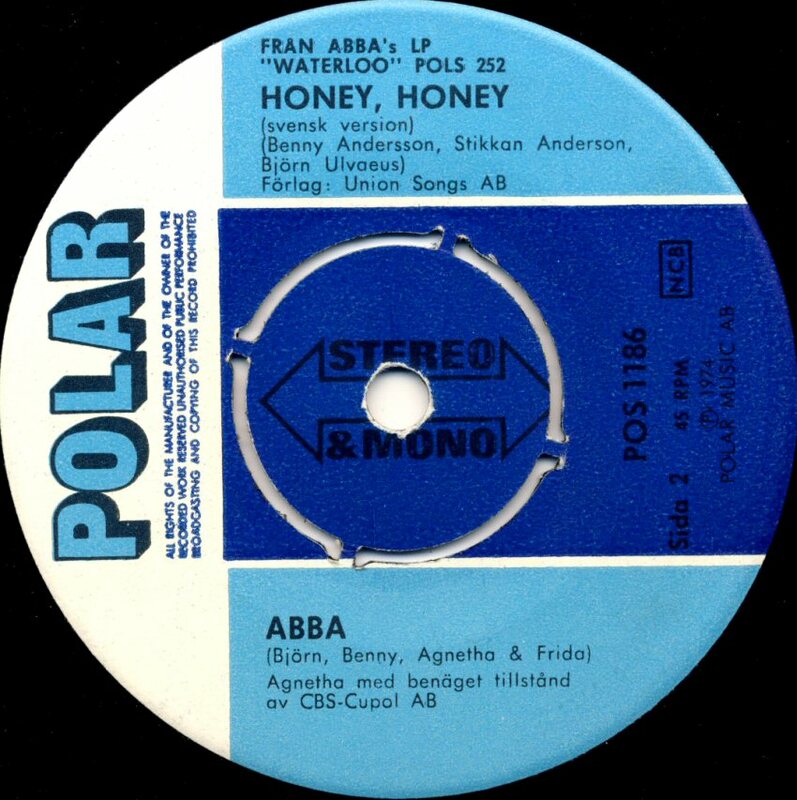 The track listing was slightly different to the original Swedish release as it was Ring Ring that opened side B and not Honey Honey. 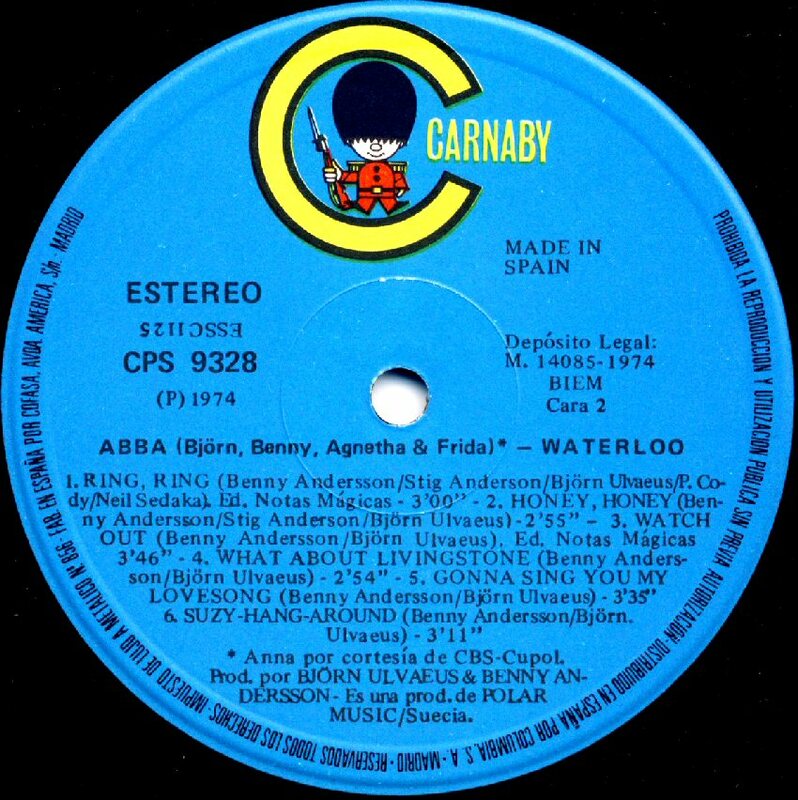 The album was released by the Spanish record company "Carnaby". 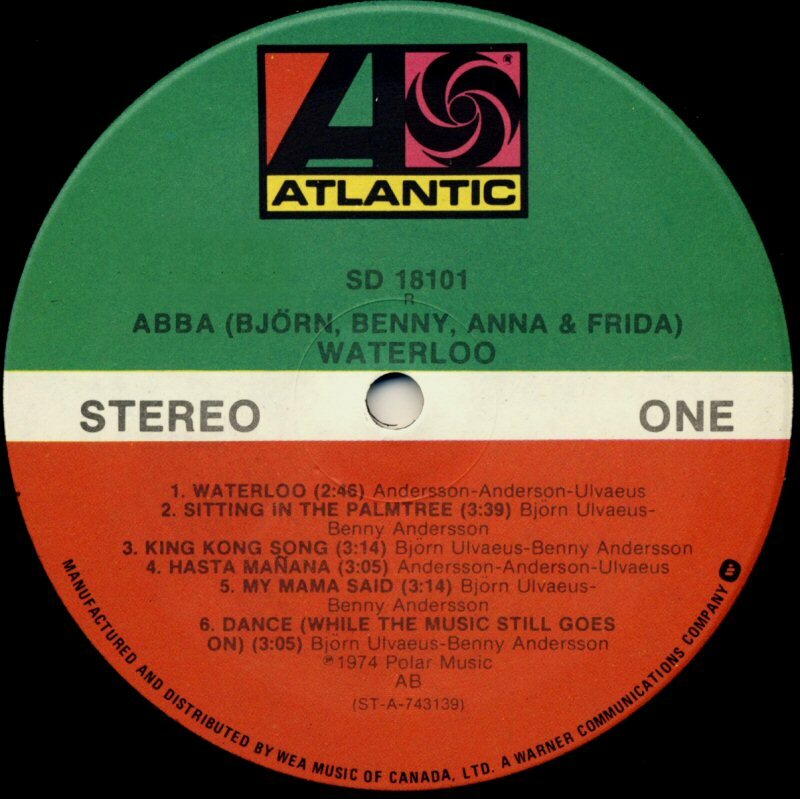 The US record company Atlantic released "Waterloo" in July 1974. 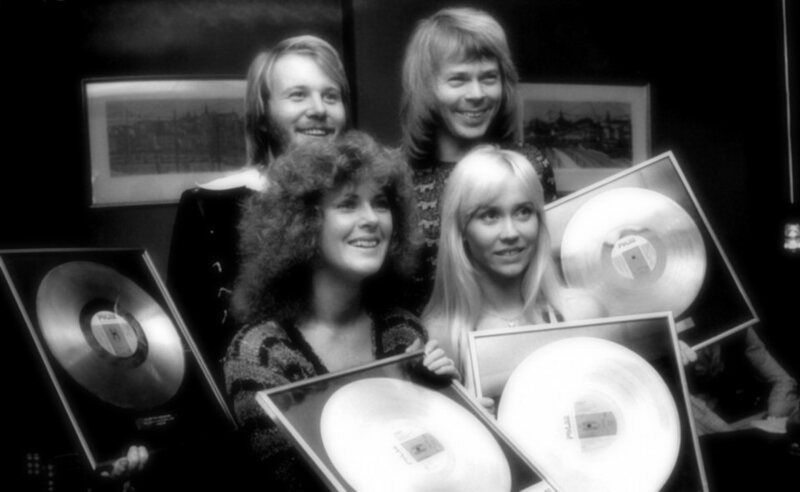 The album spent 8 weeks in Top 200 reaching #142. 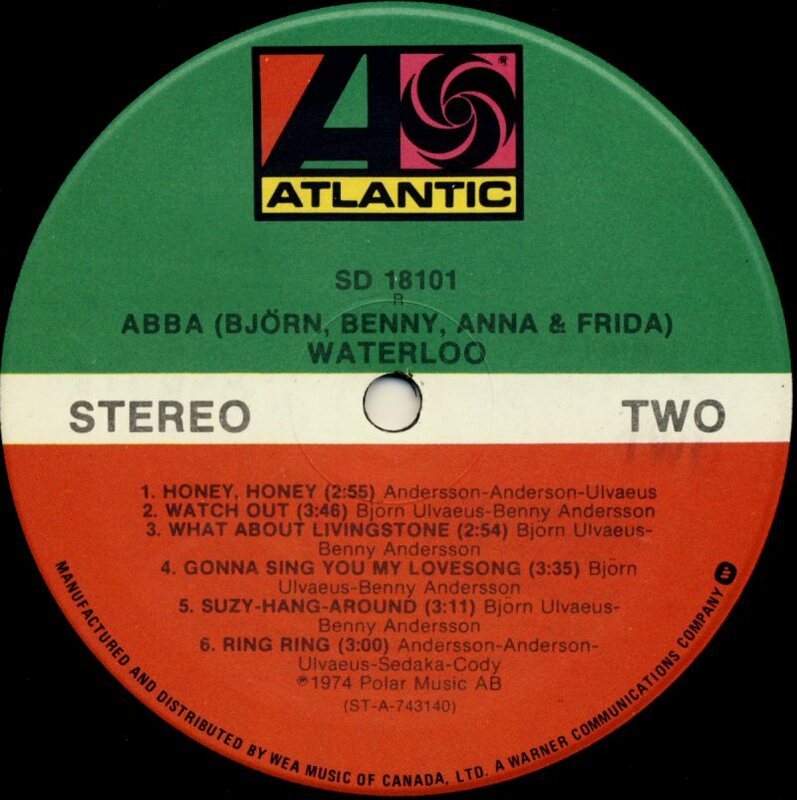 The Atlantic release of the album featured the US sax remix of "Ring Ring". 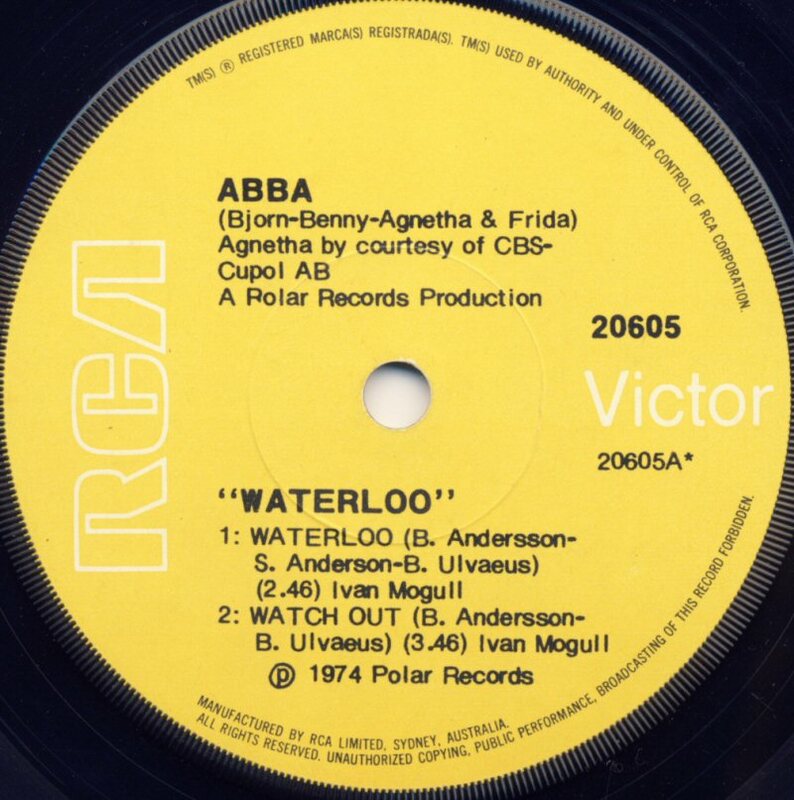 "Waterloo" saw its LP release in Australia on 1 July 1974. 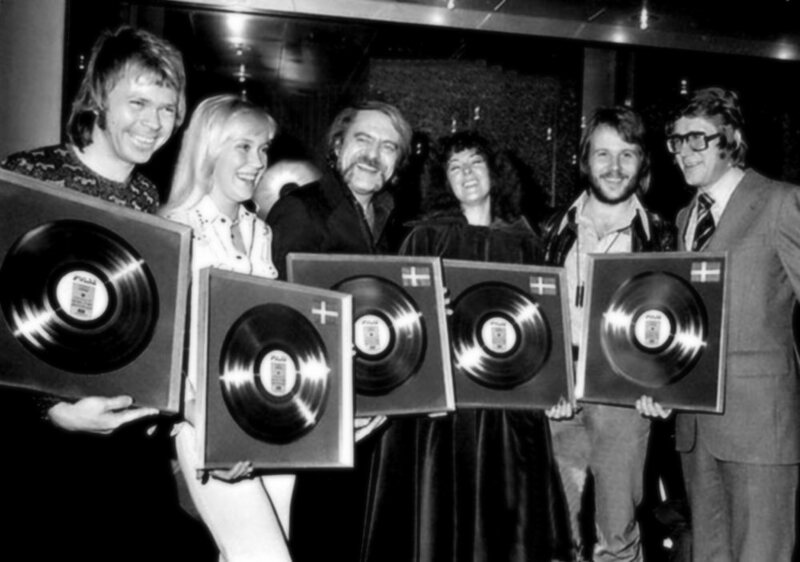 The album stayed on the Australian chart for 8 weeks reaching #67. 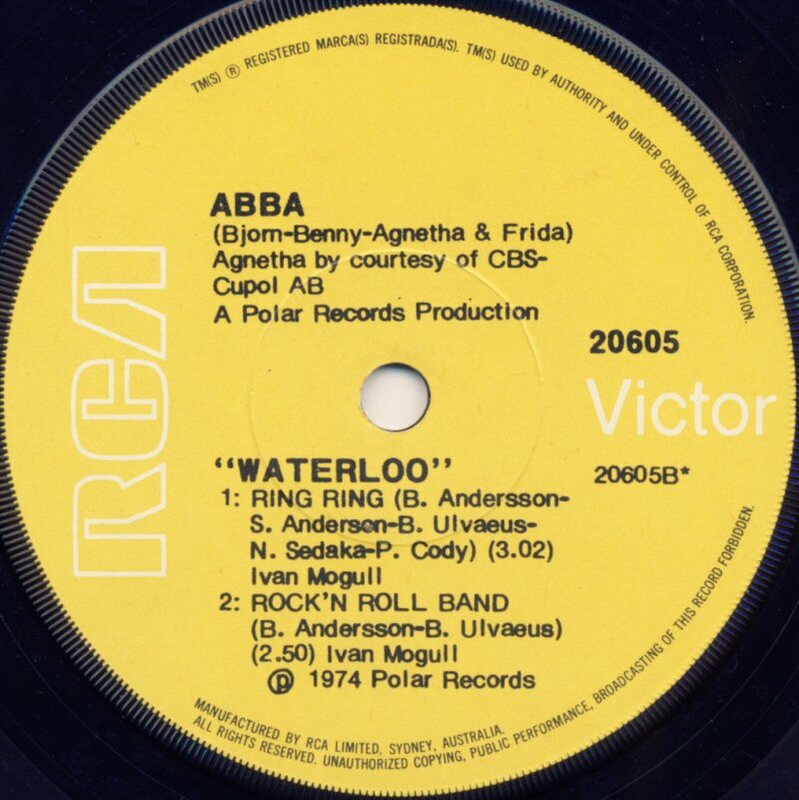 "Waterloo" was even released in South Africa in January 1975 where it peaked at #1 on the South African chart. 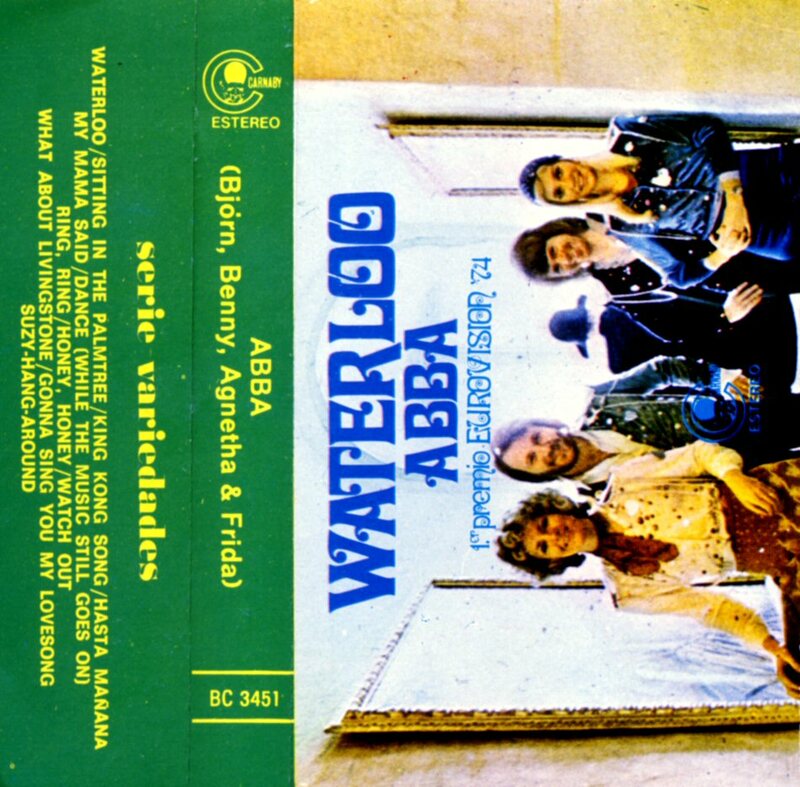 The album "Waterloo" was released in Poland, East Germany and Czechoslovakia with some delay under the period of 1975 - 1976. 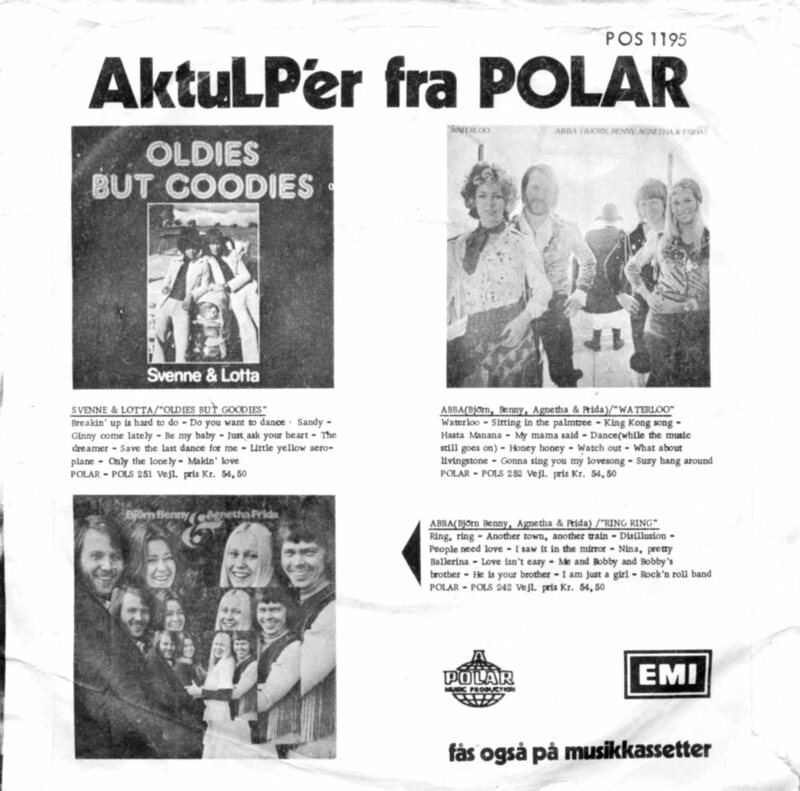 Both the covers and track listings were partly changed. 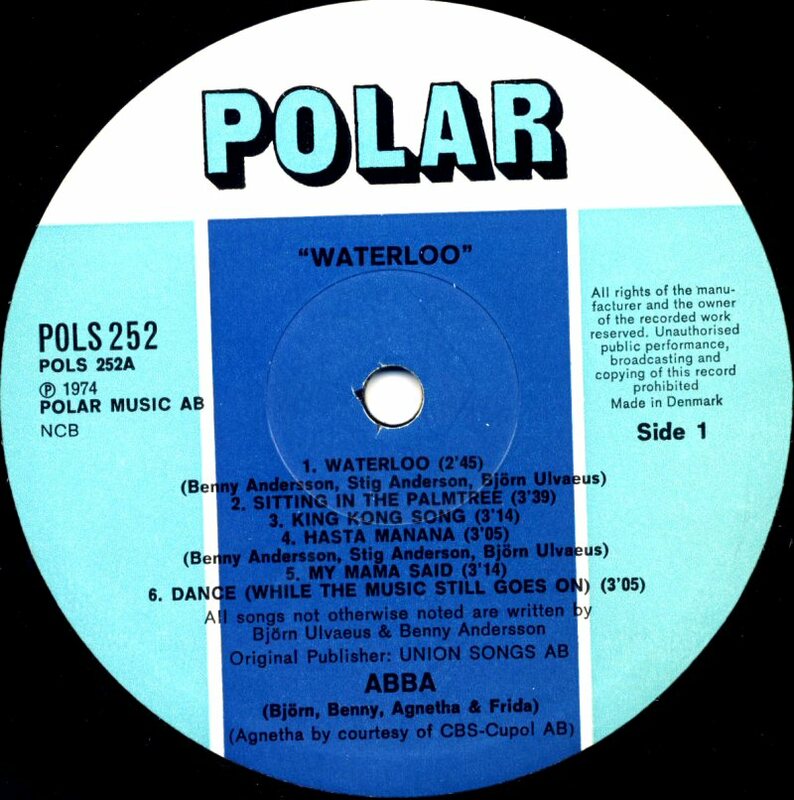 The Polish edition of the album featured almost the same track listing as the Swedish issue but without the Swedish version of "Waterloo". "Ring Ring" was not included here either. 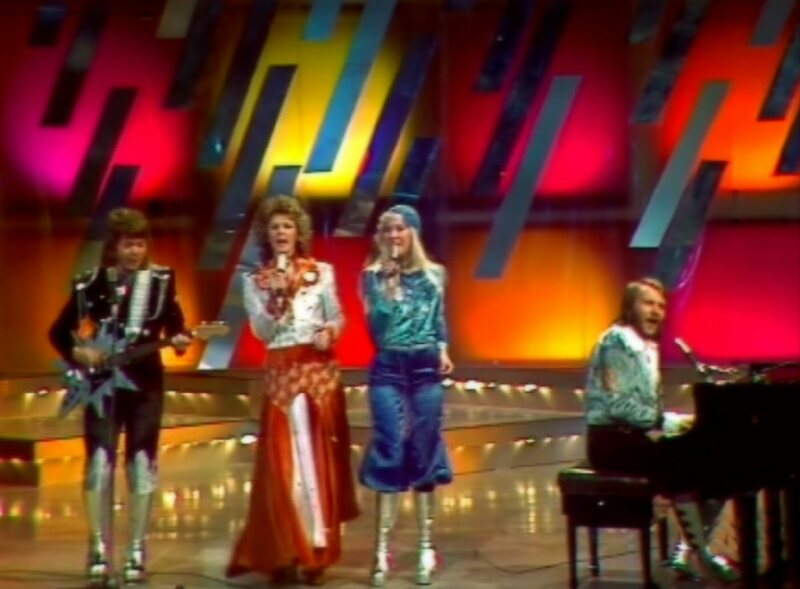 The record company "Muza - Polskie nagrania" issued the album in limited edition in 1975. 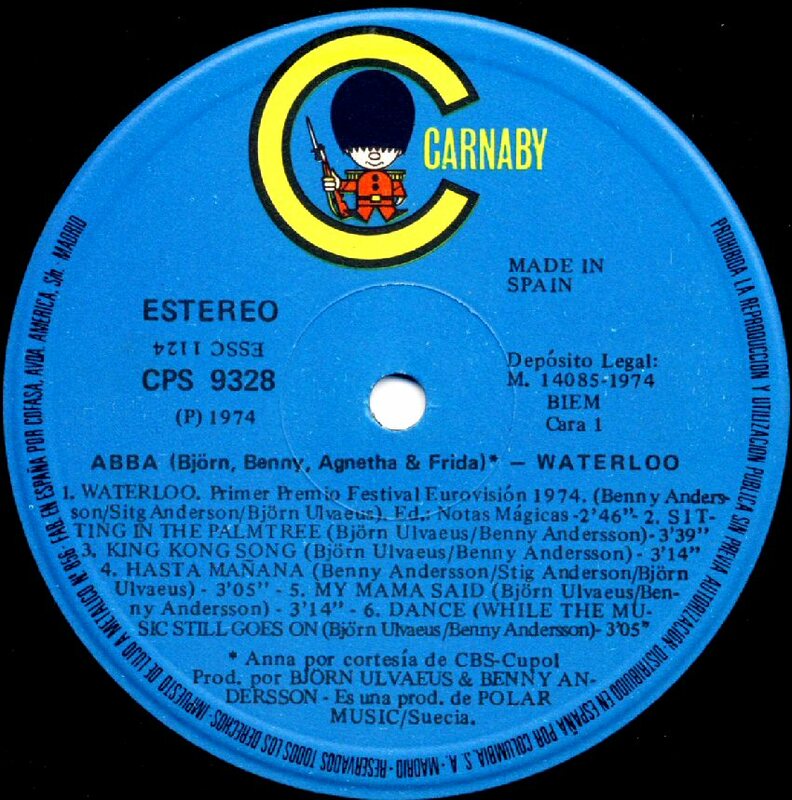 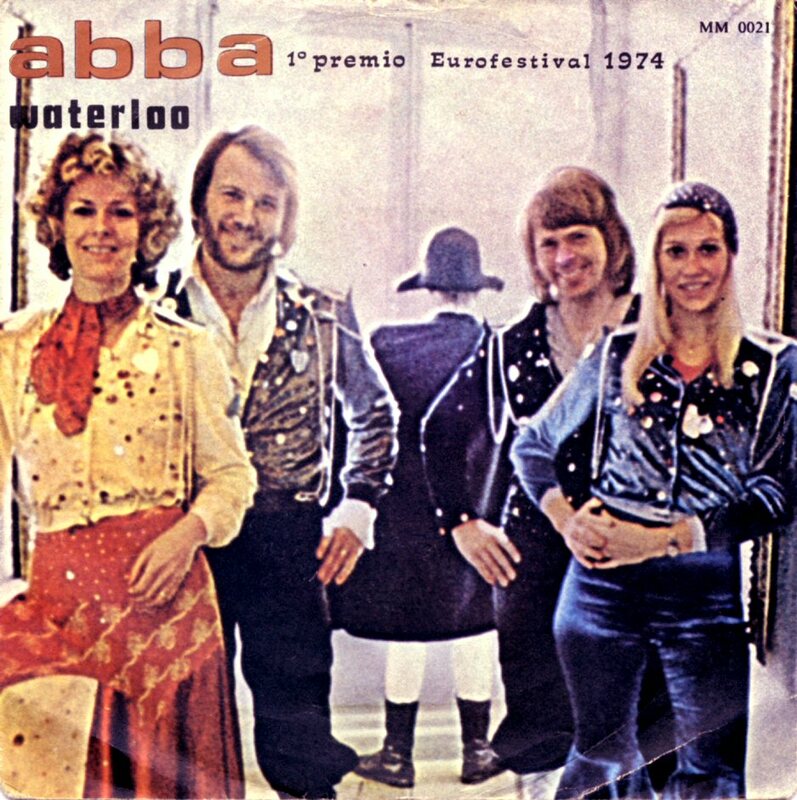 The East German release of "Waterloo" featured completely different cover with picture taken during ABBA's performance in East Berlin in November 1974. 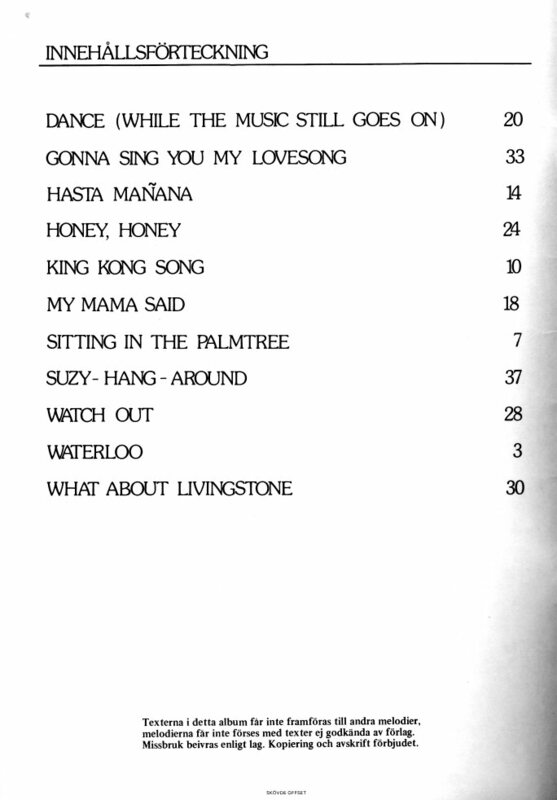 Even track listing was slightly changed. 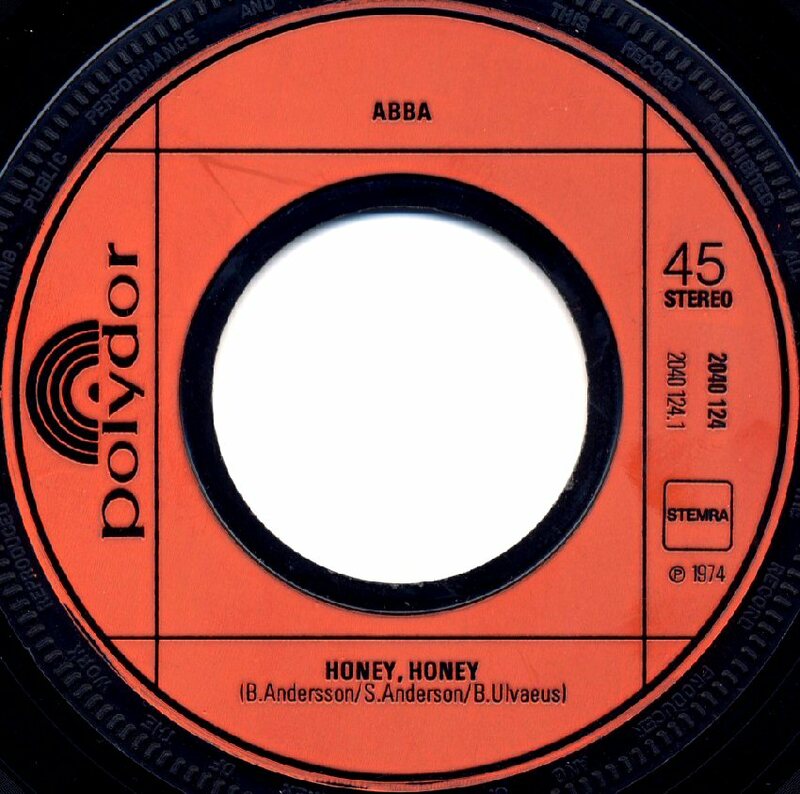 Because of unknown reason "Honey Honey" was removed and instead it was "So Long" that was the opening track on side B. 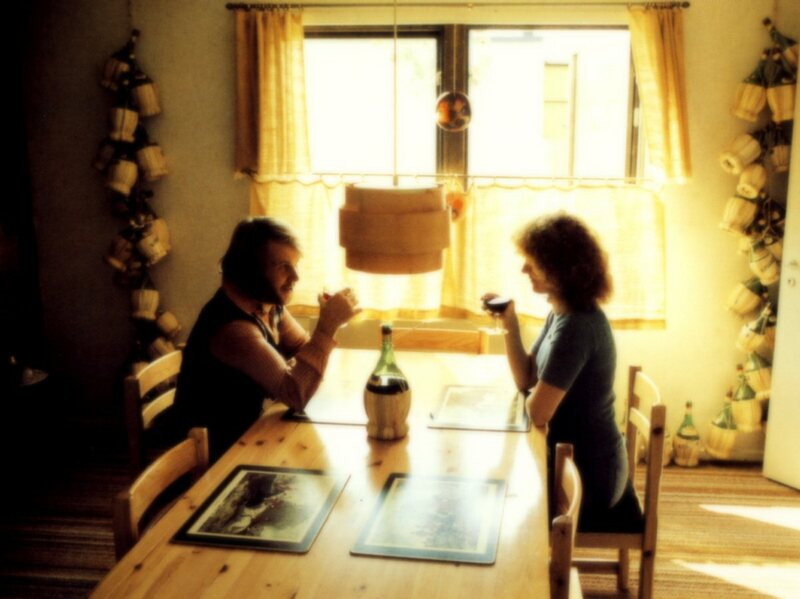 The album came out in 1975. 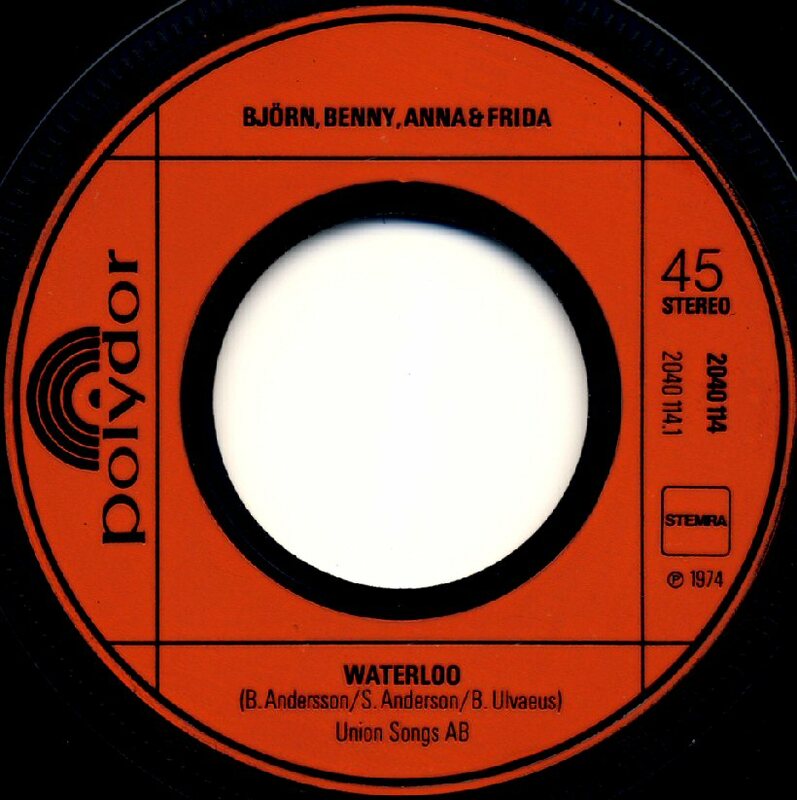 The Czechoslovakian version of "Waterloo" had in fact only one thing in common with the original album - the same cover. 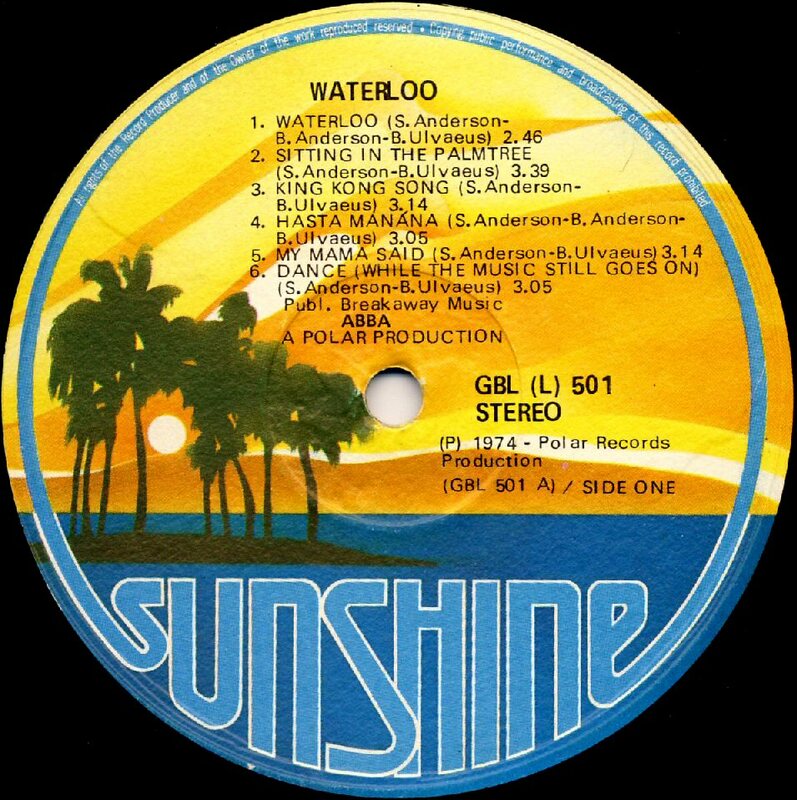 The album was a kind of "The best of..." featuring songs from both "Ring Ring" and "Waterloo" albums and it was released by the Slovakian record company "Opus" in 1975. 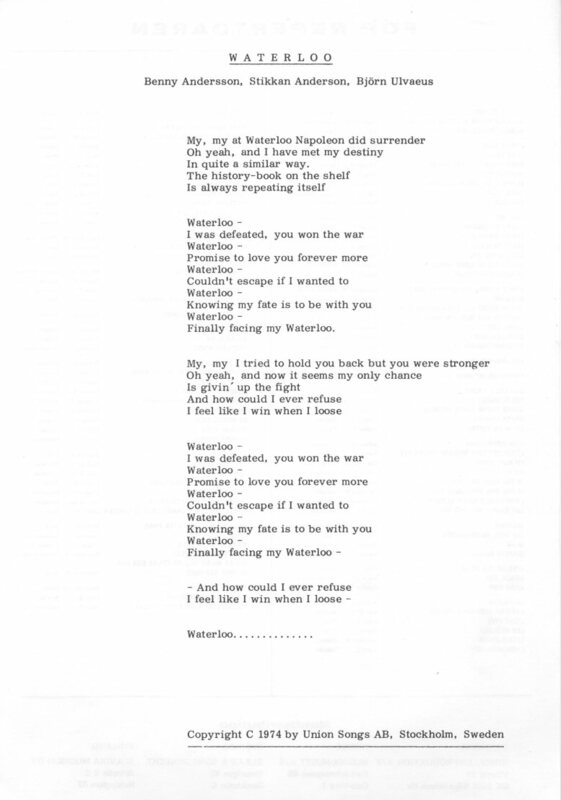 The note book contained all songs from the album "Waterloo" with lyrics. 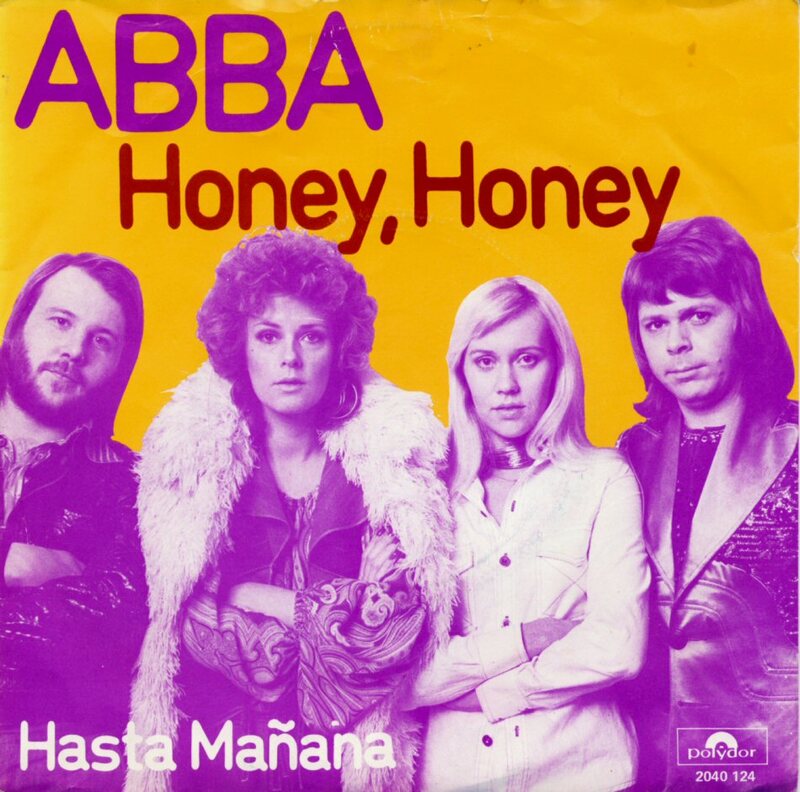 Even Swedish lyrics to "Honey Honey" and "Hasta Mañana" were added. 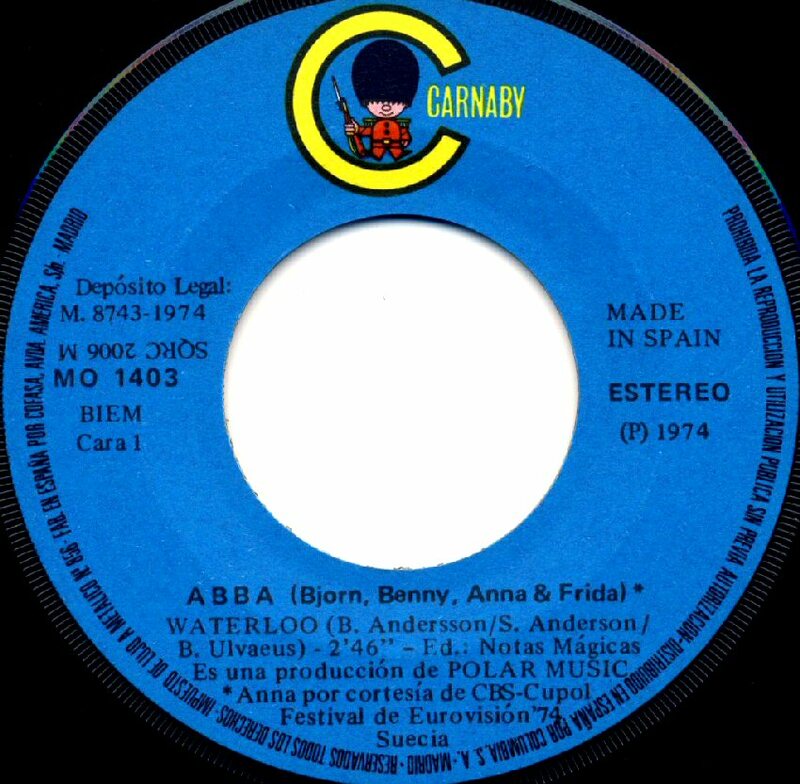 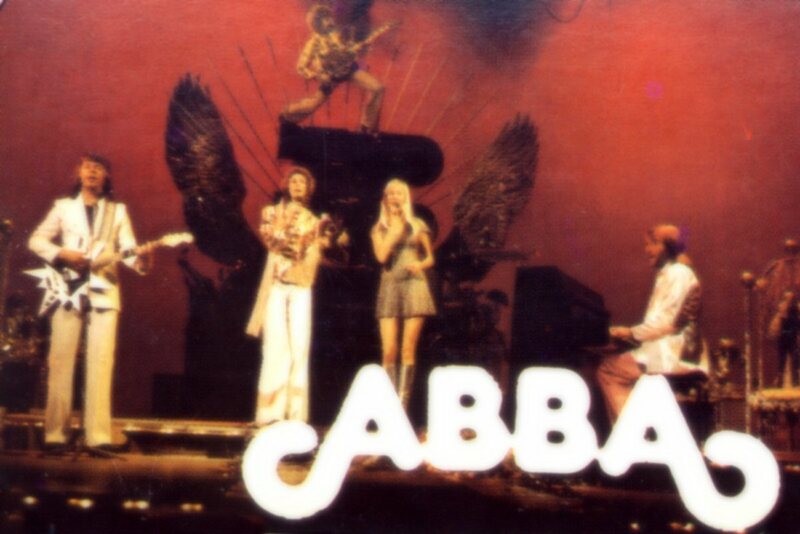 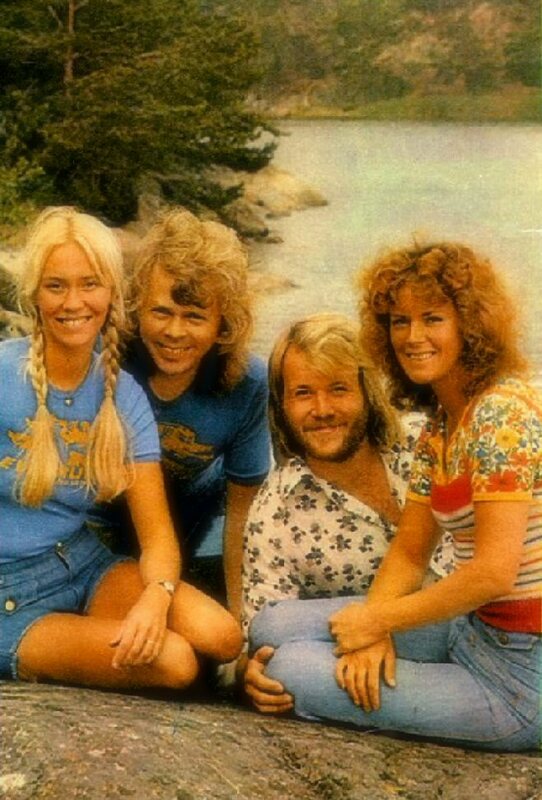 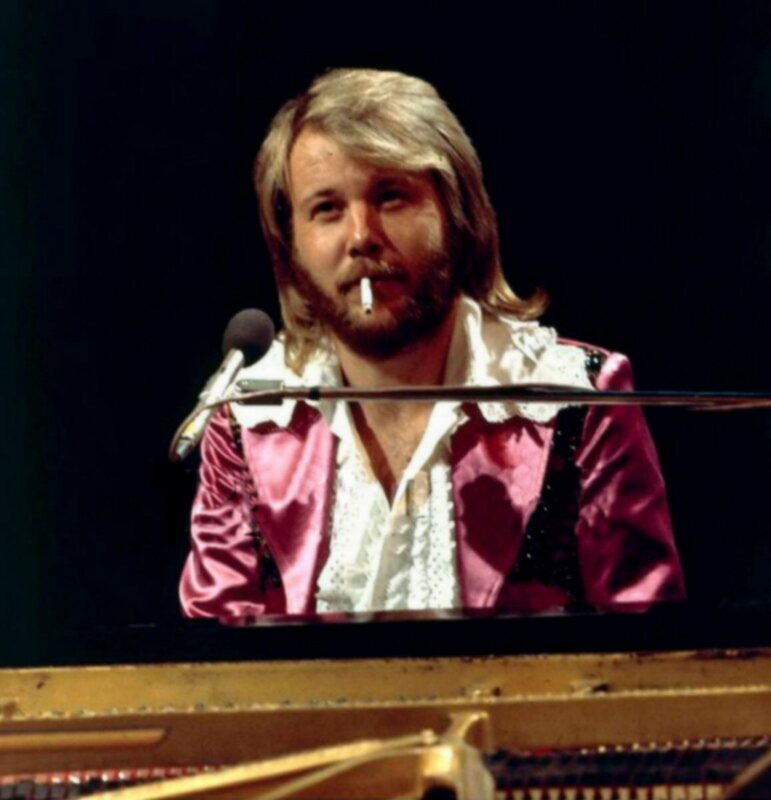 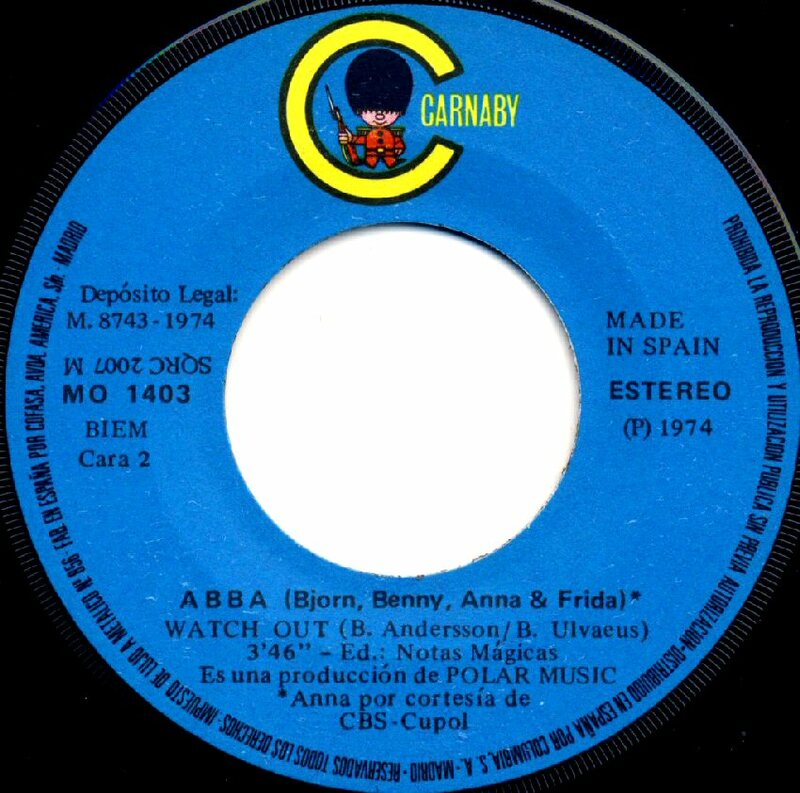 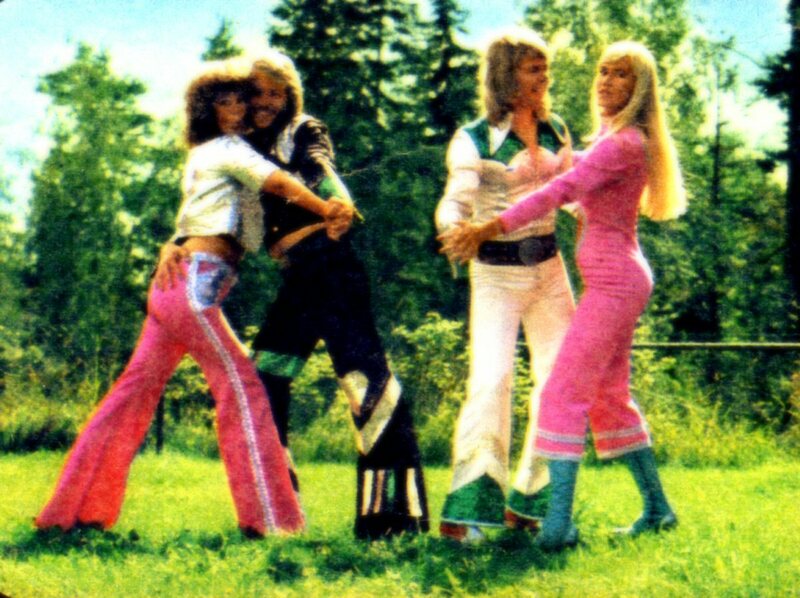 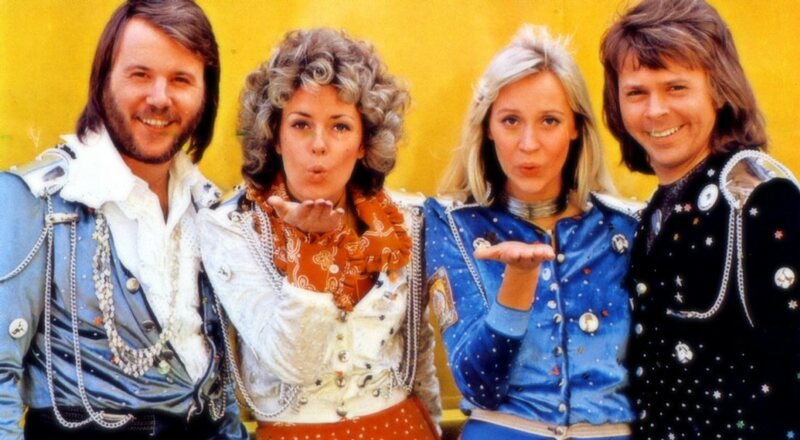 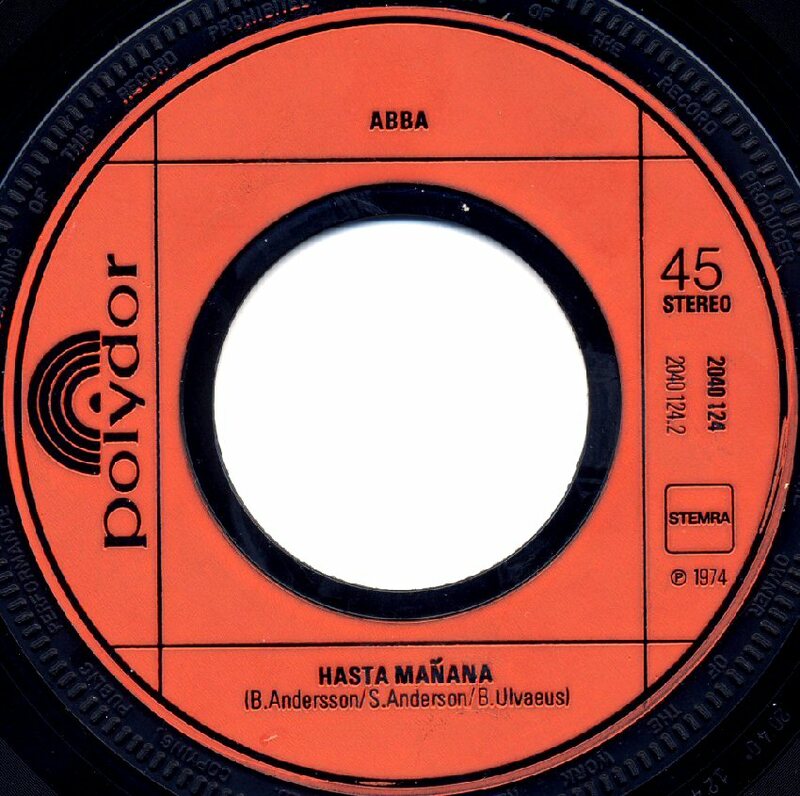 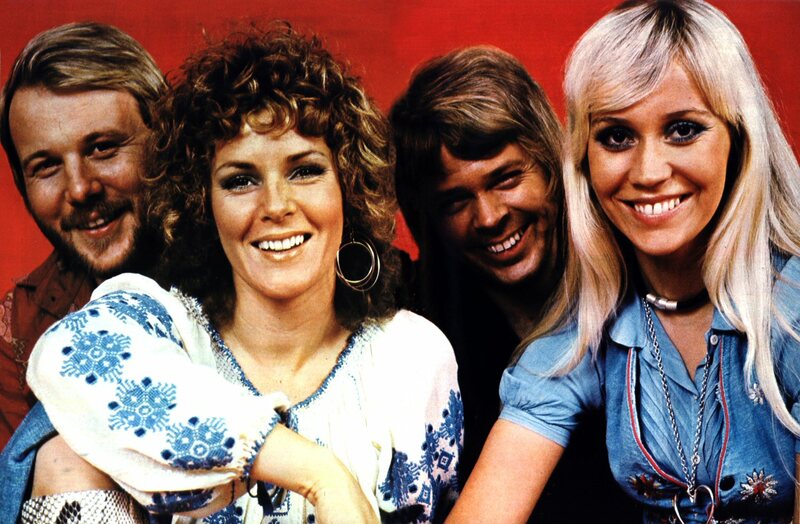 The interesting fact is that "Hasta Mañana" has never been recorded by ABBA in Swedish. 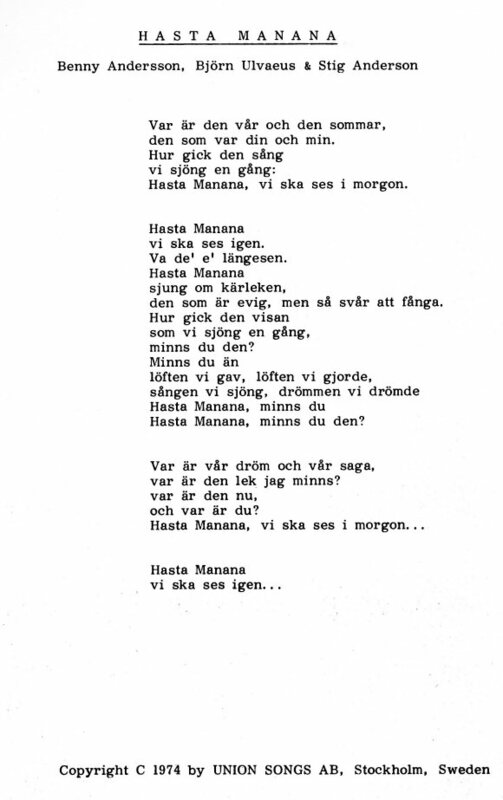 The Swedish version of the song was released by the Polar singer Lena Andersson. 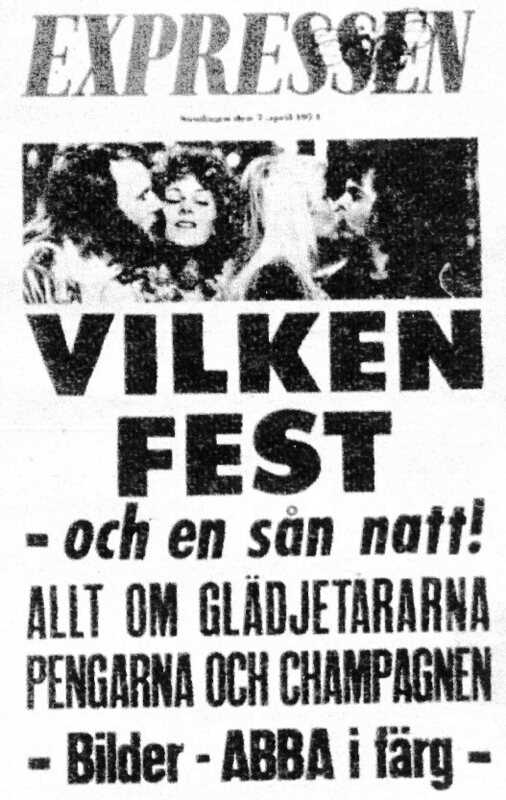 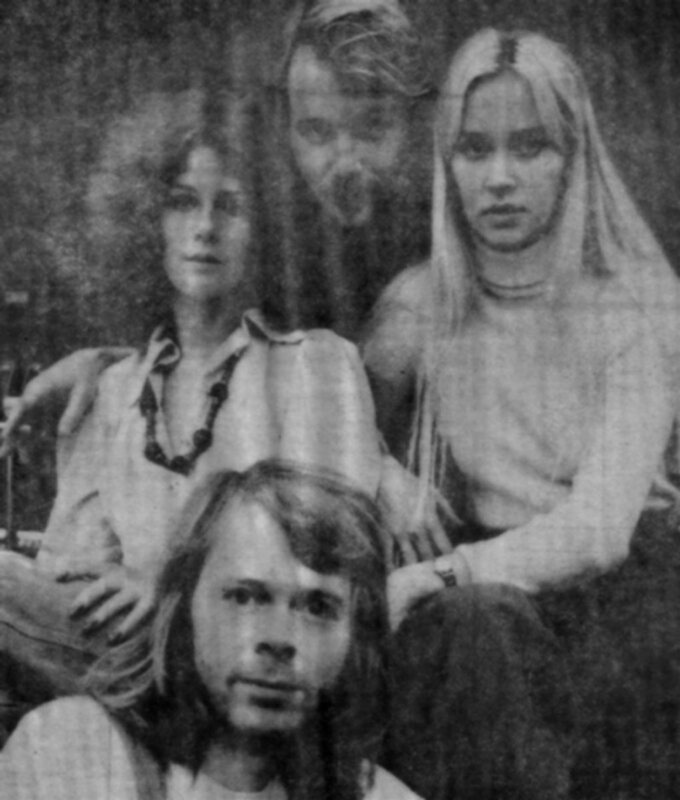 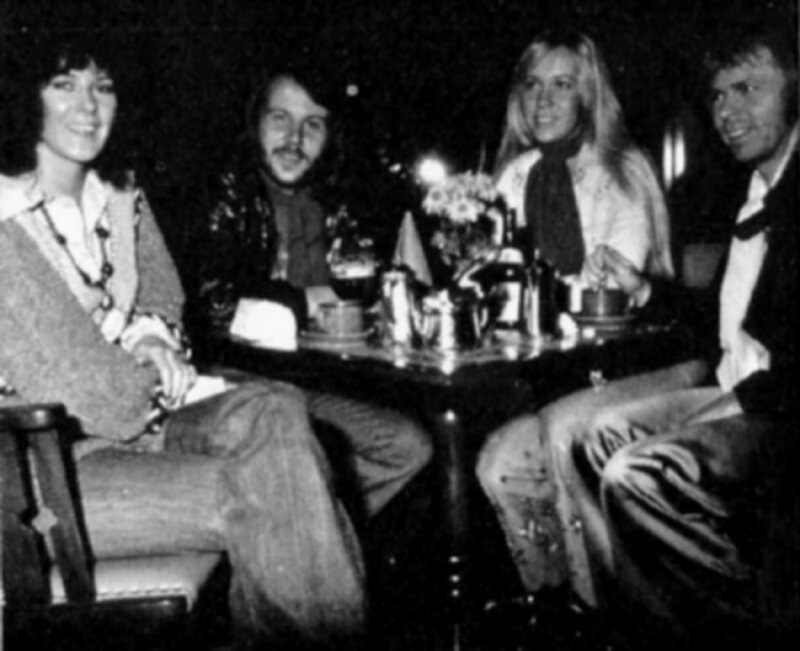 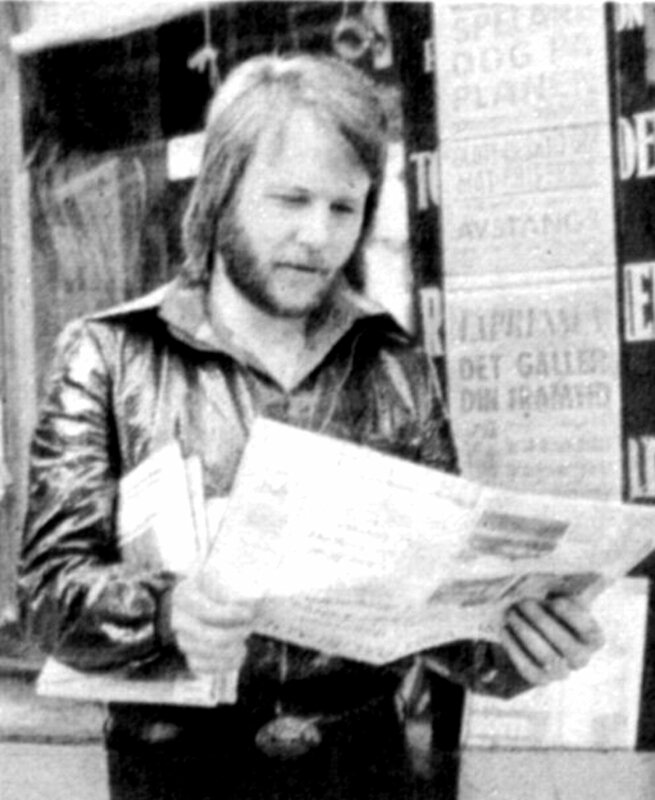 In March 1974 Swedish weekly "Veckorevyn" met ABBA in private and made an extended interview with the group. 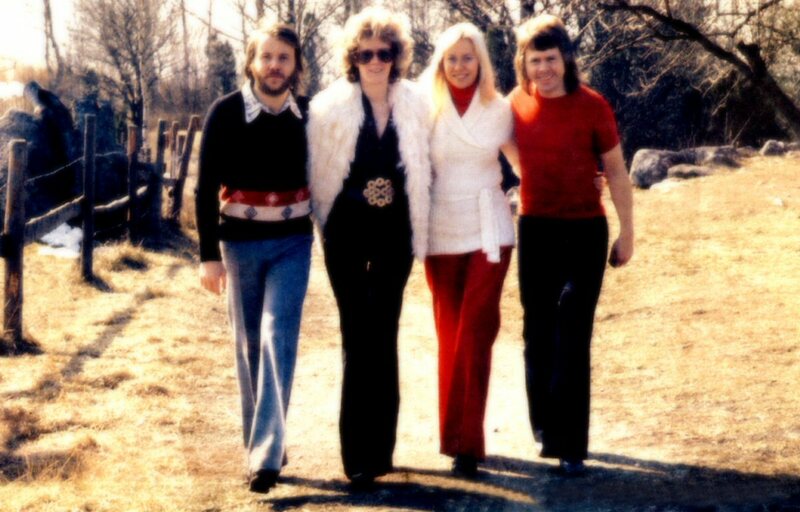 Lots of photos were taken in the area of Vallentuna where both couples lived by that time. 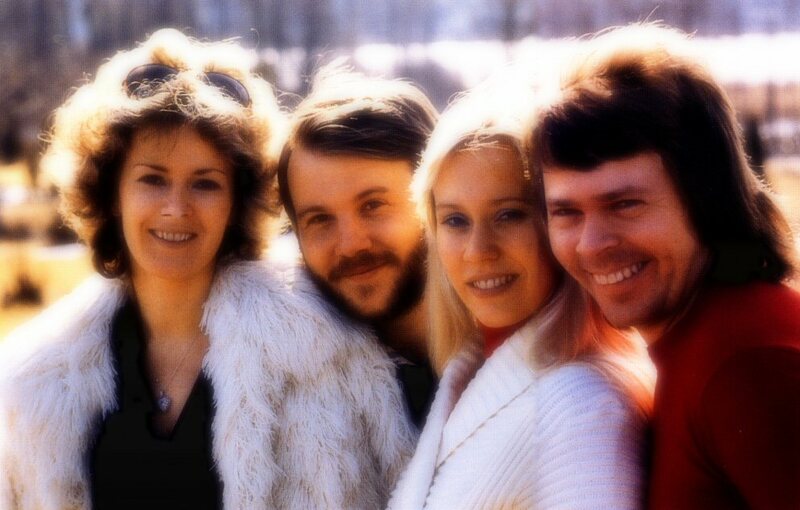 The ABBA article in "Veckorevyn" was published at the beginning of April. 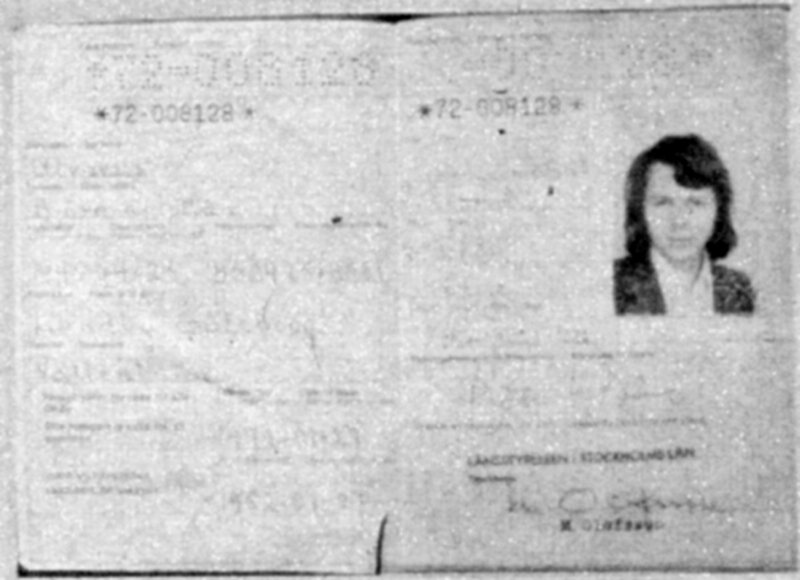 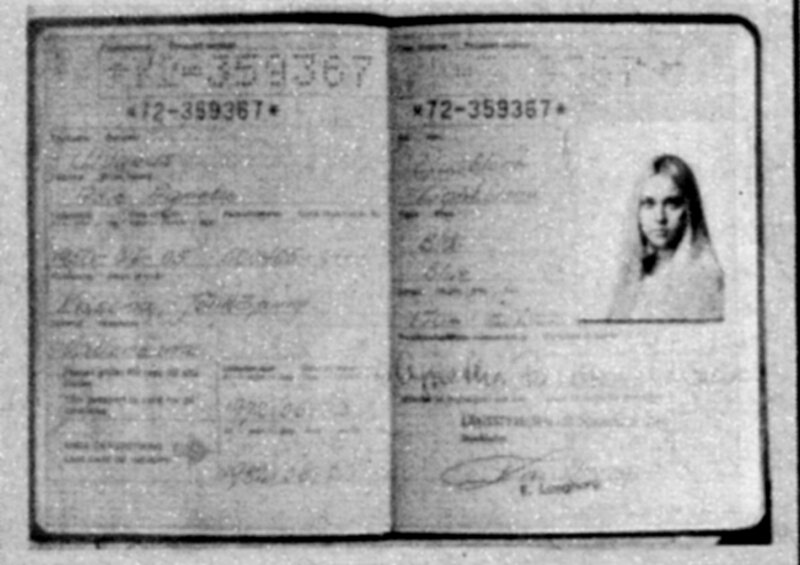 German photographer took pictures of ABBA members' passports. 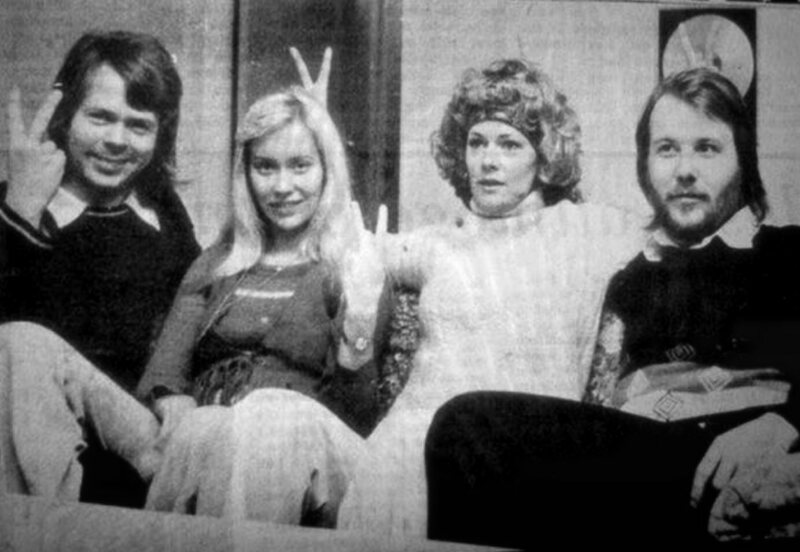 The pictures were published in Bravo in West Germany. 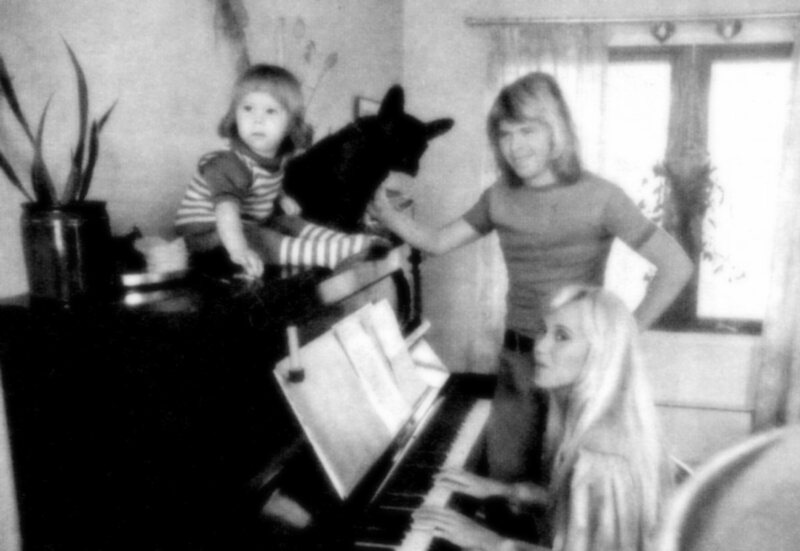 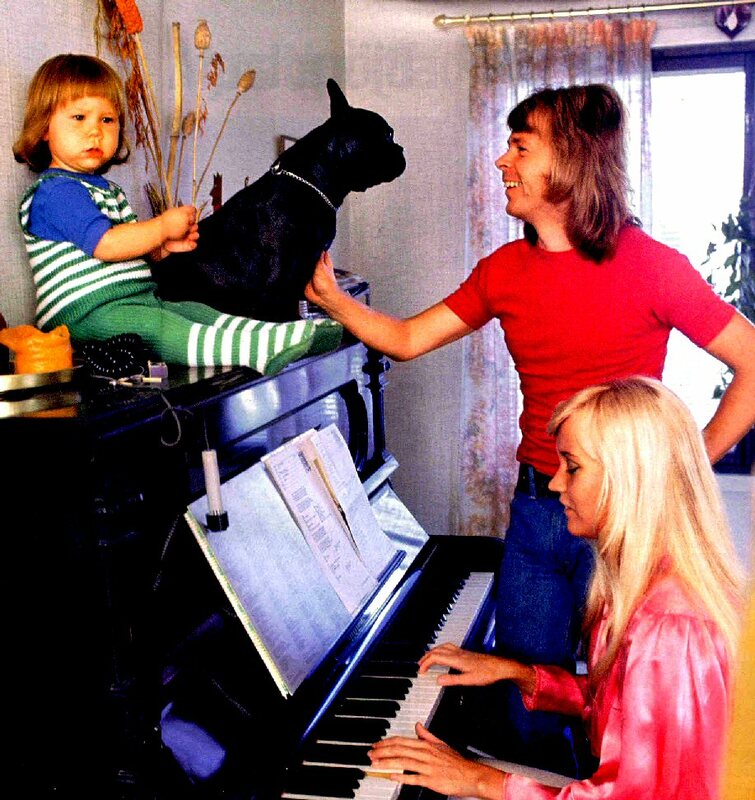 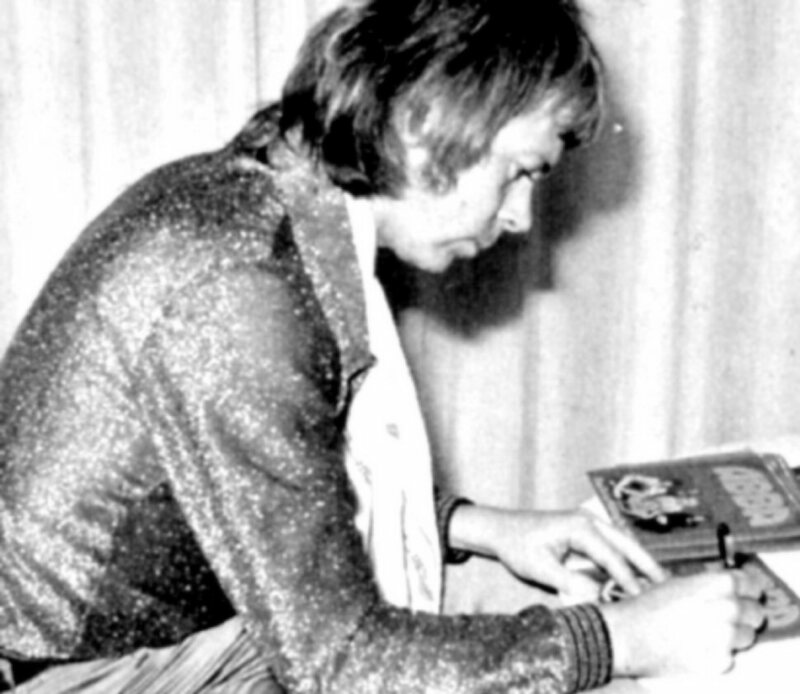 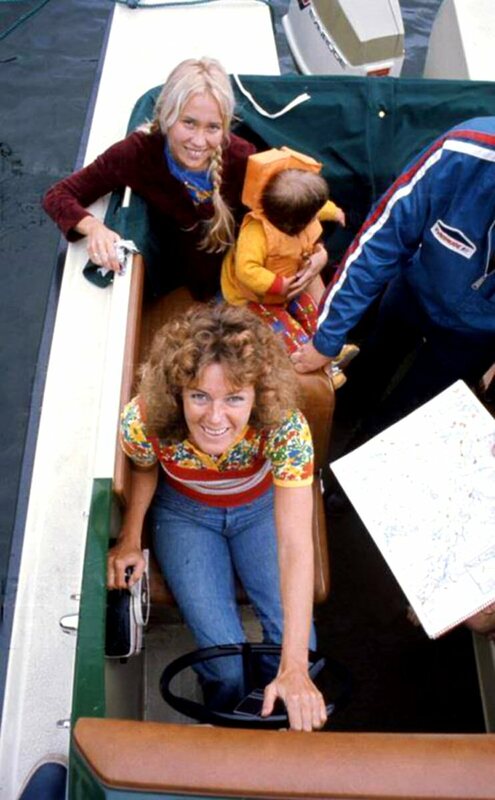 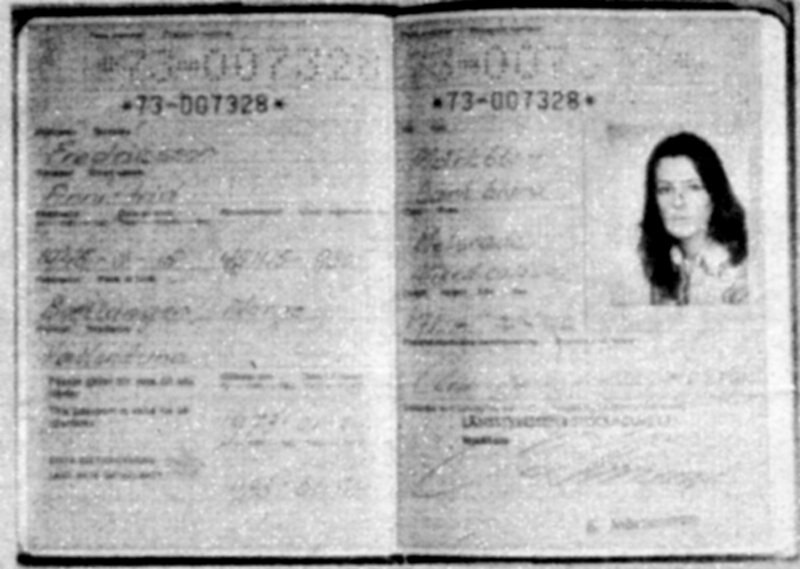 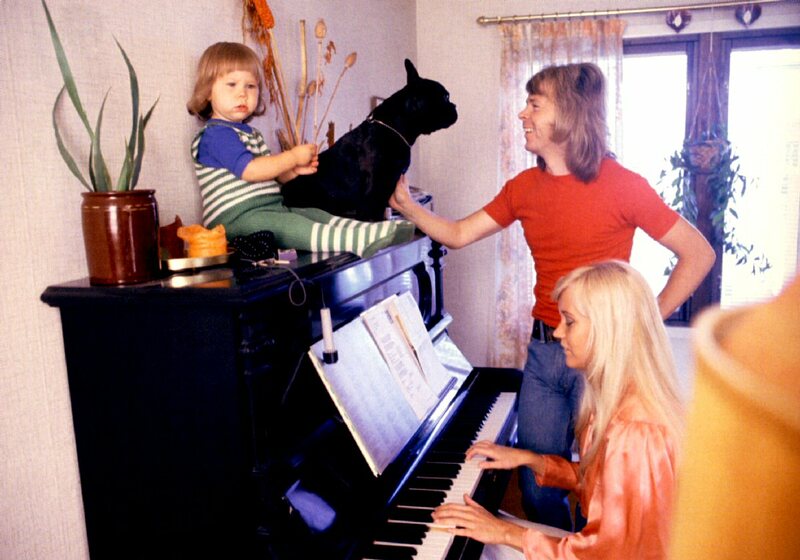 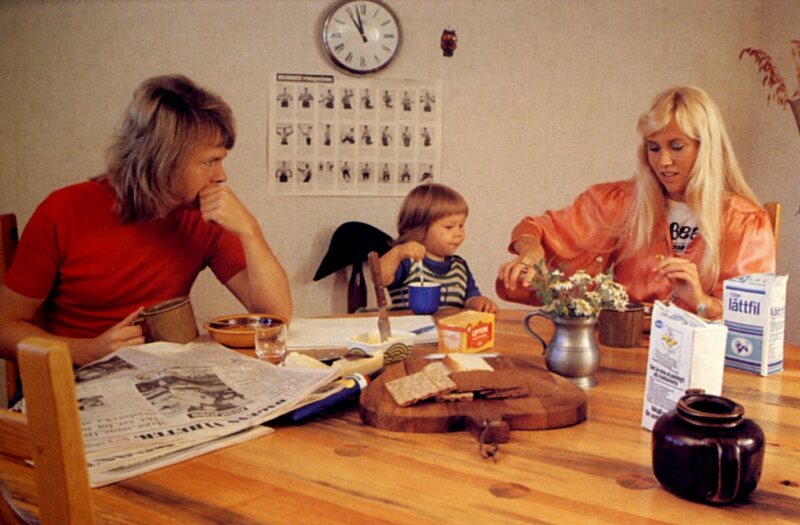 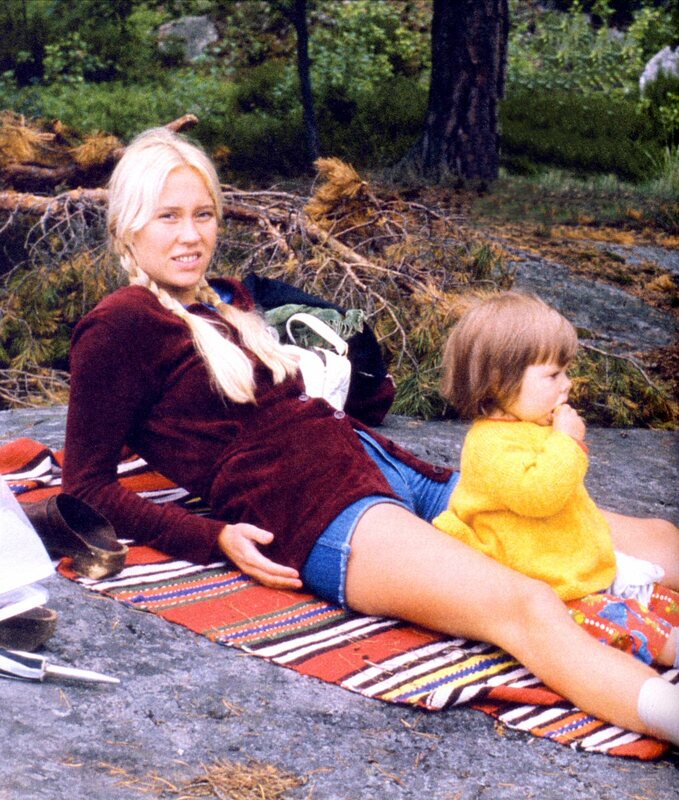 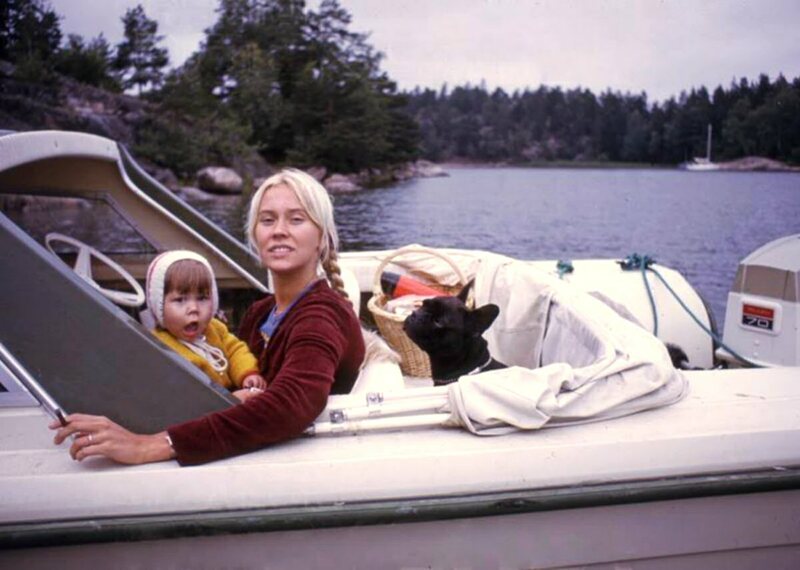 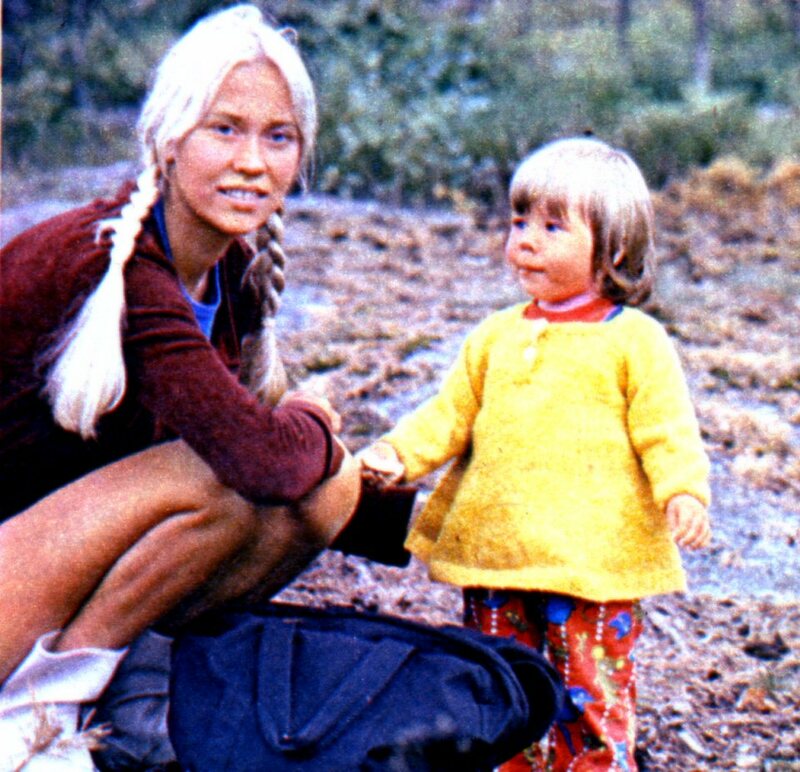 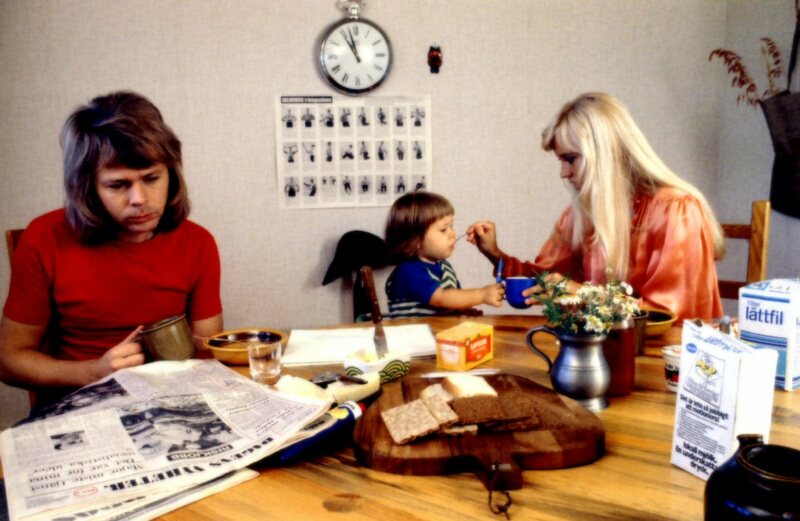 Agnetha's, Björn's and Benny's passports had been issued in 1972 and Frida's in 1973. 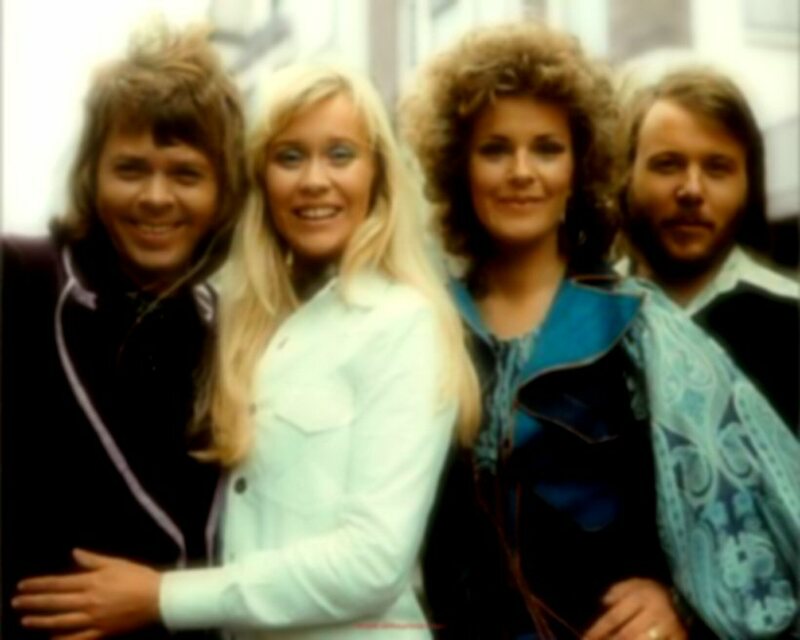 They were valid in 10 years which means during whole ABBA period. 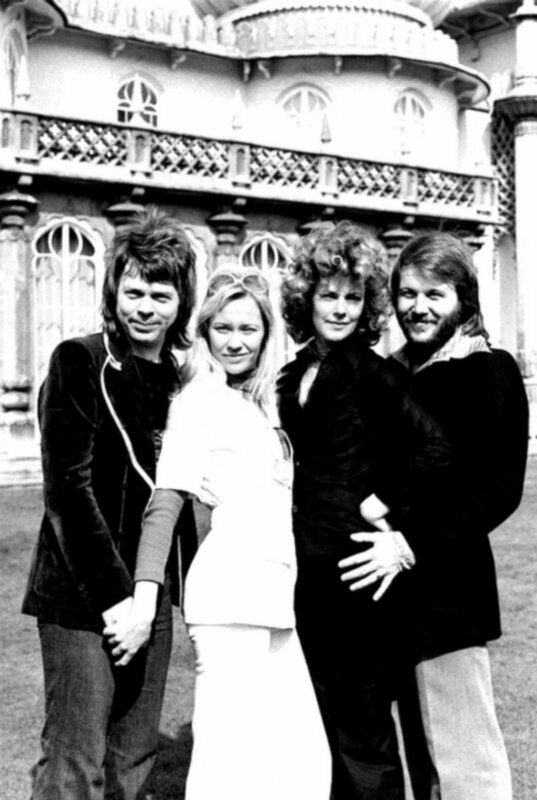 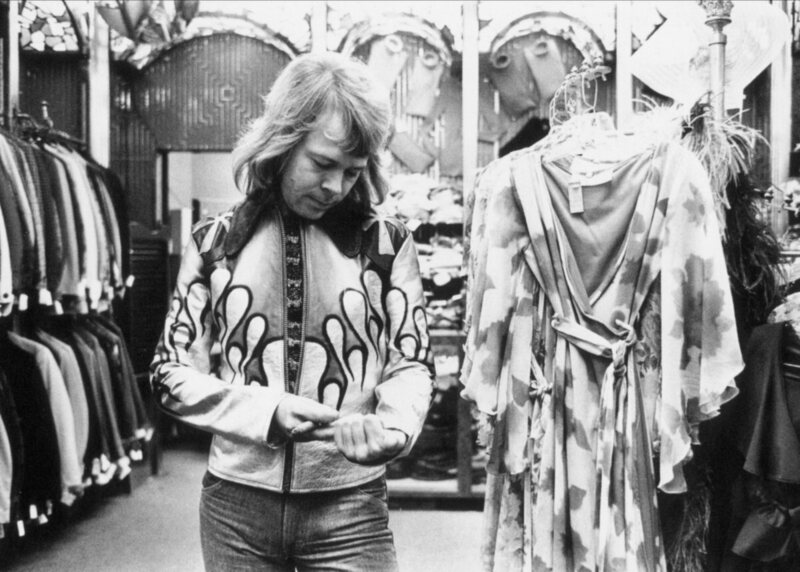 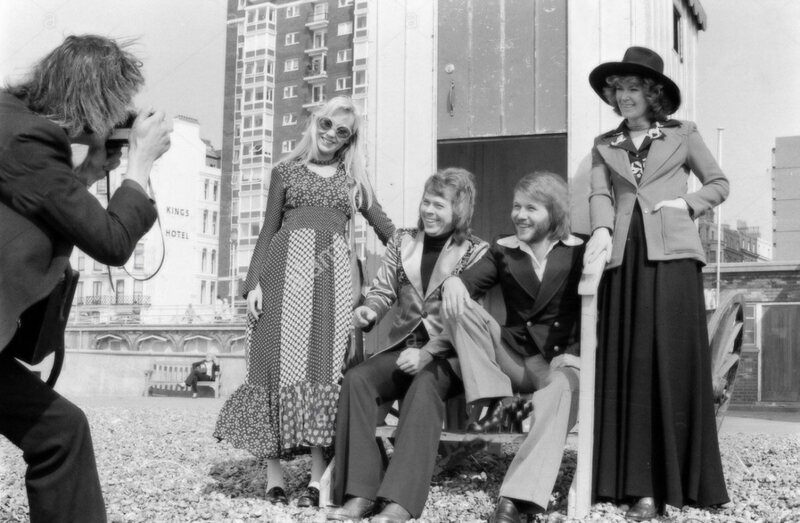 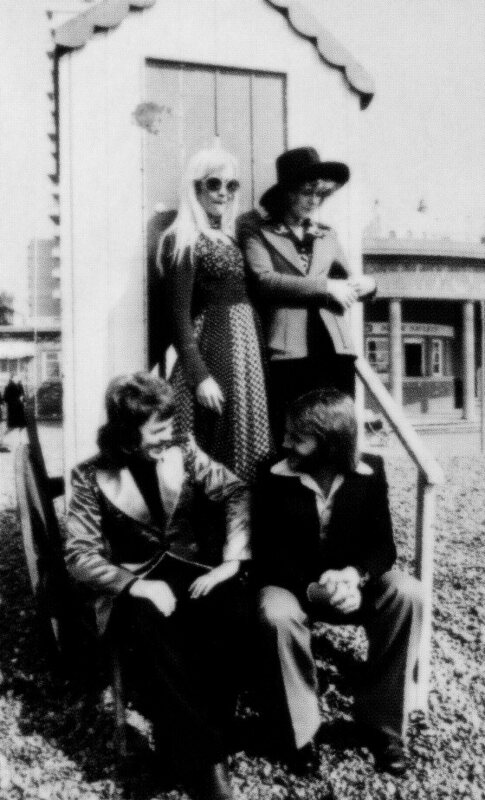 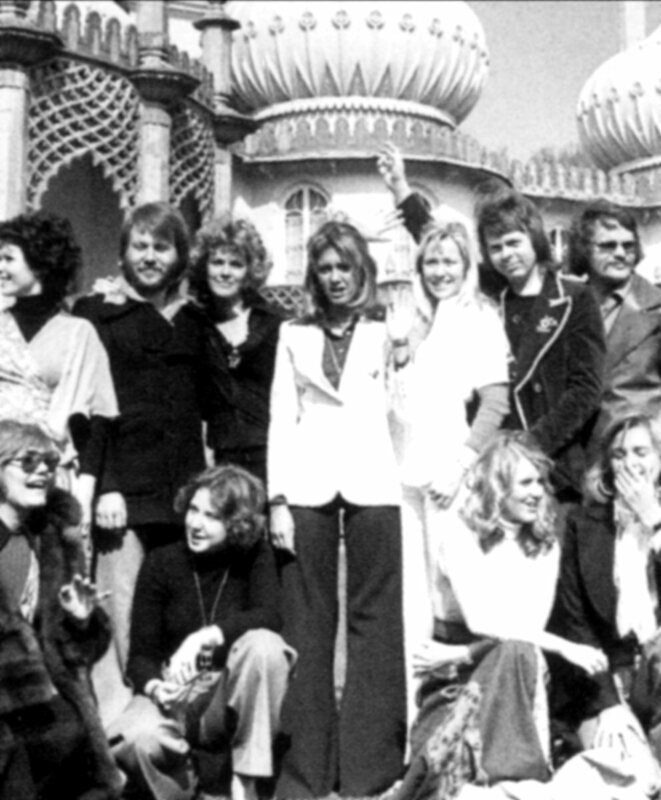 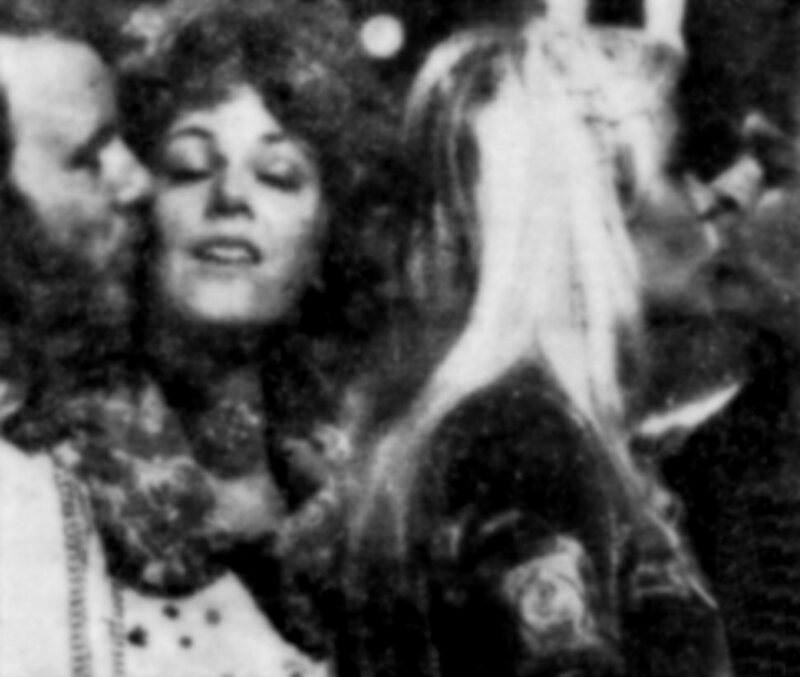 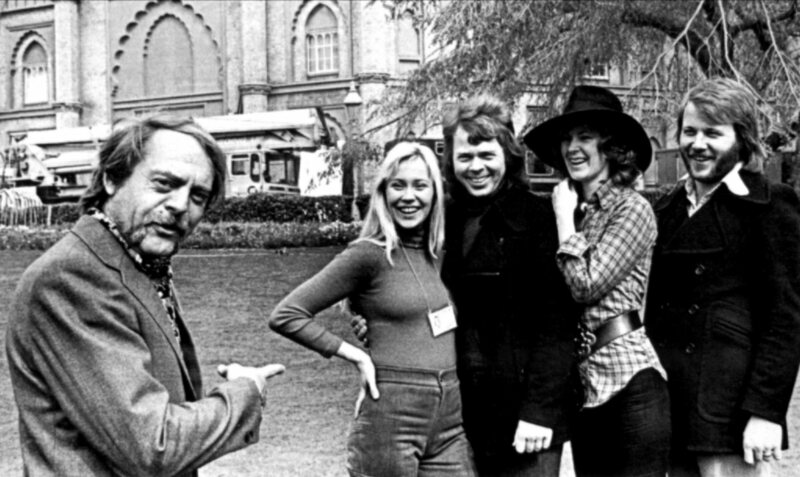 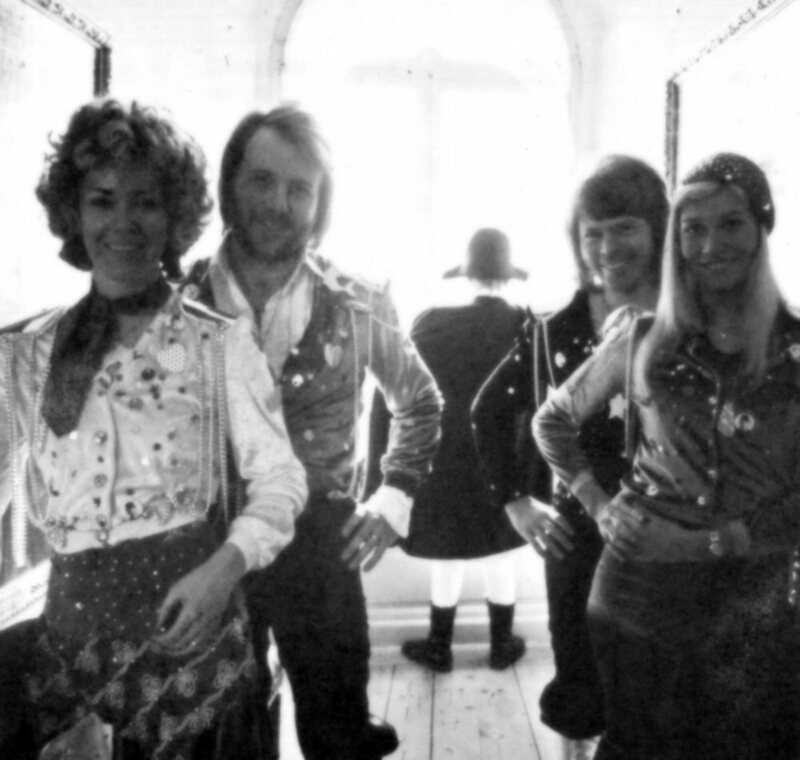 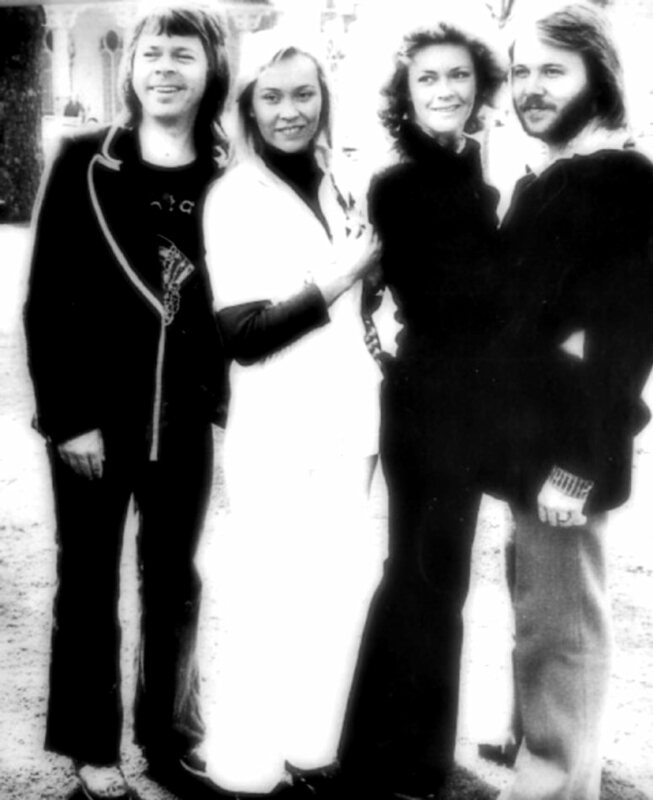 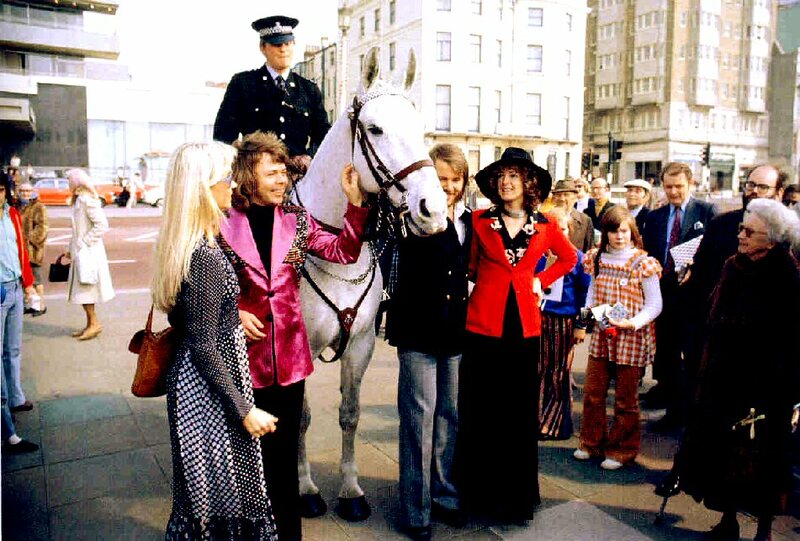 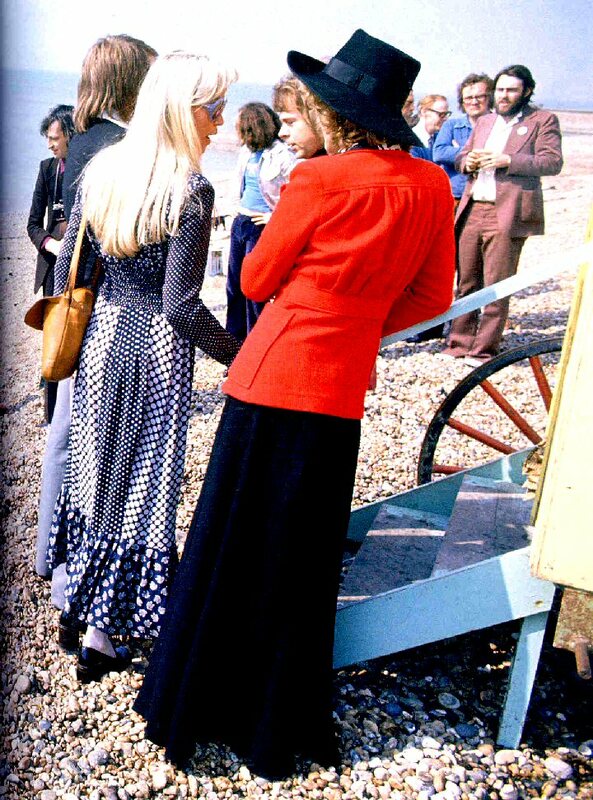 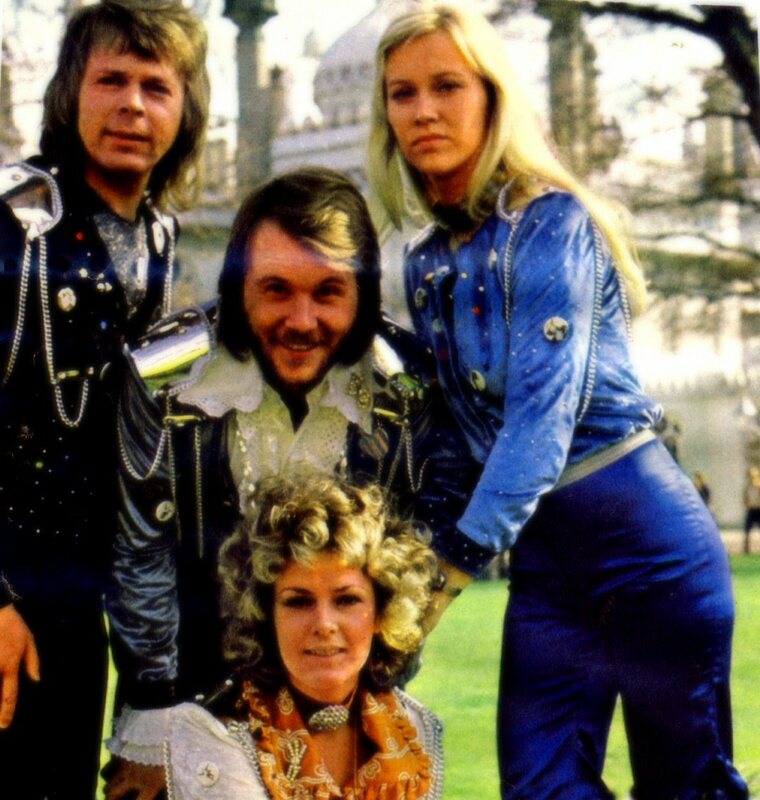 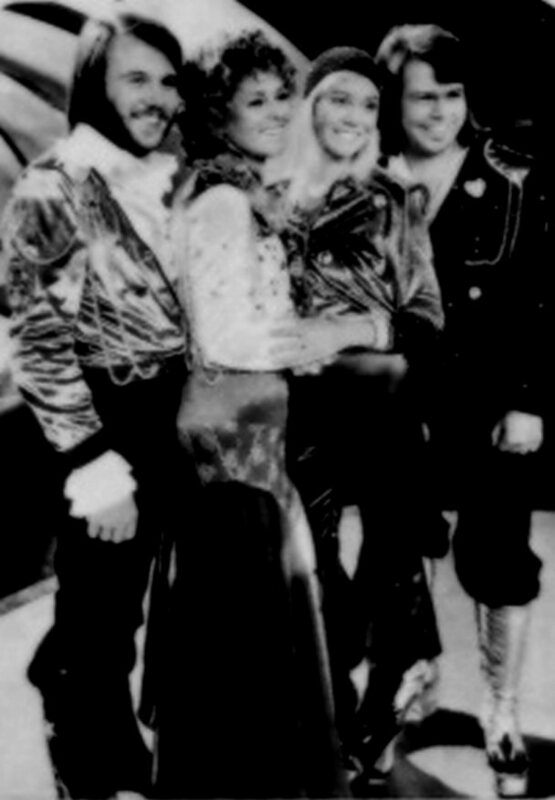 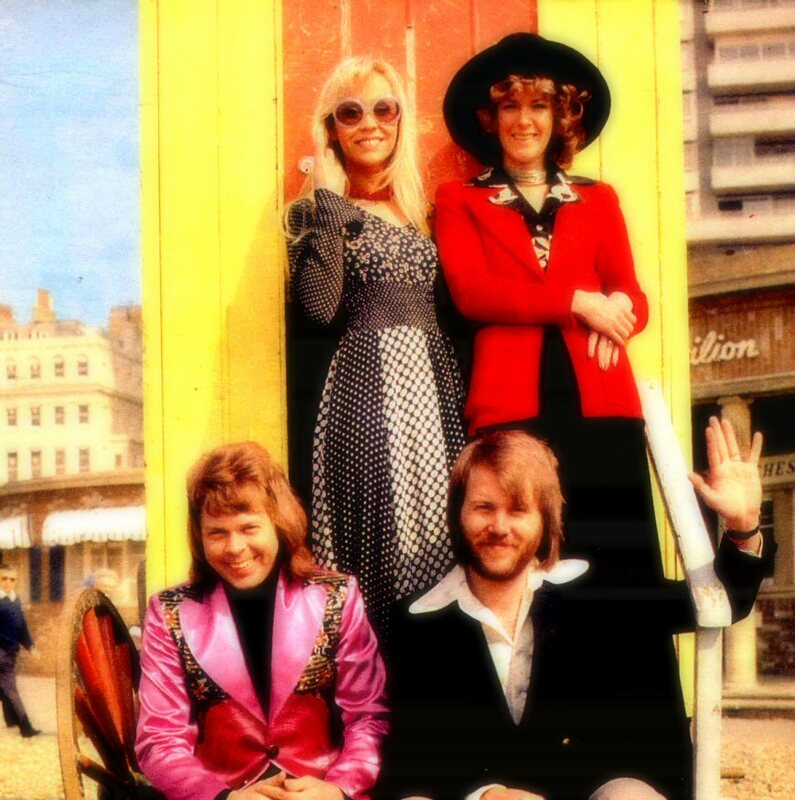 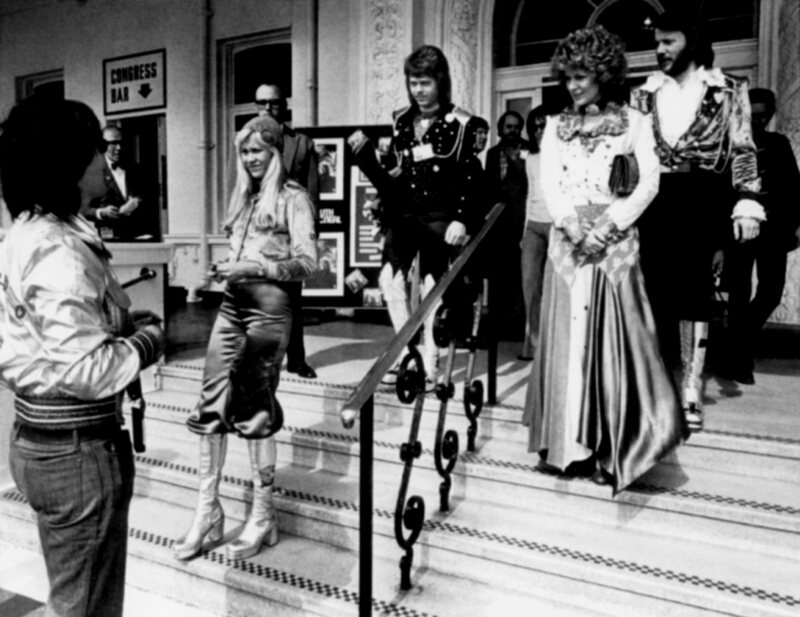 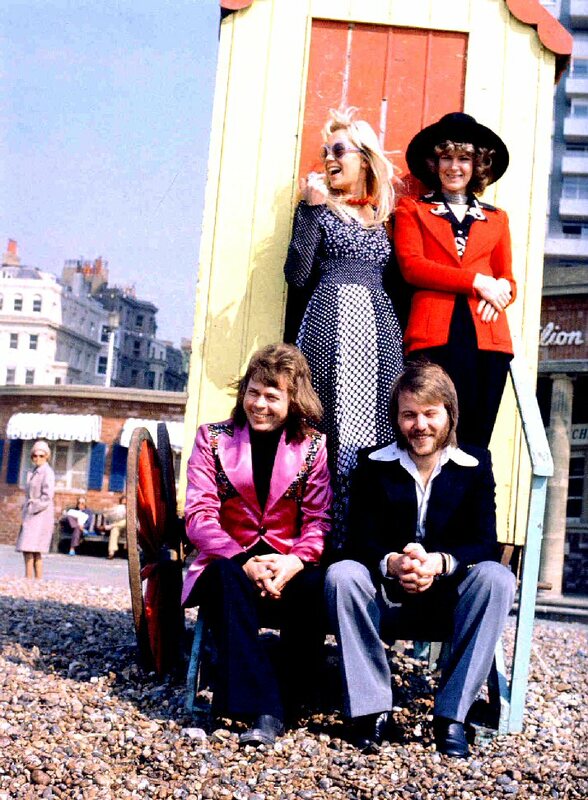 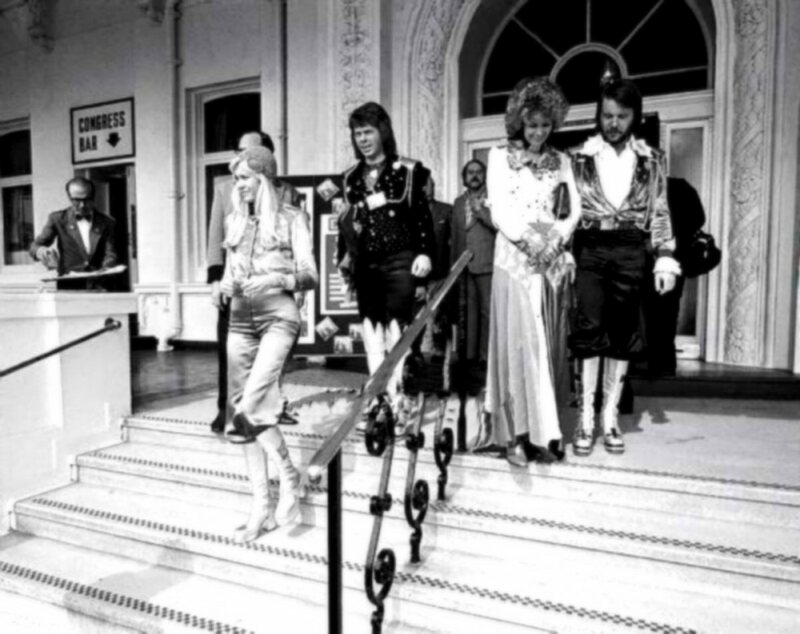 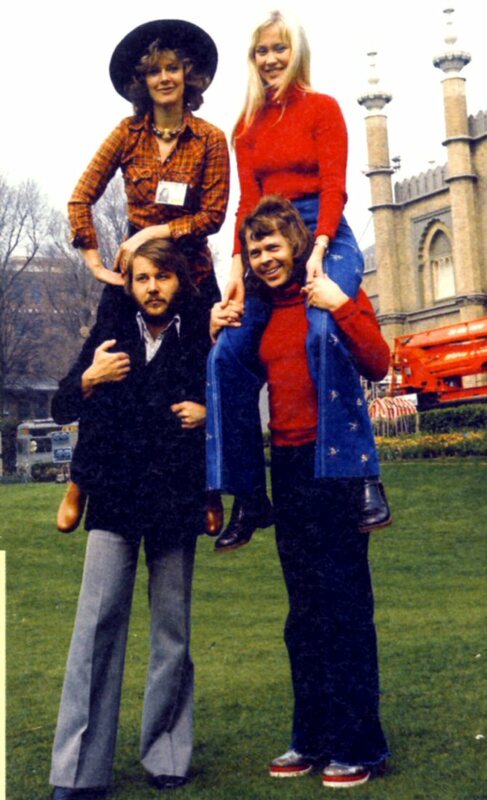 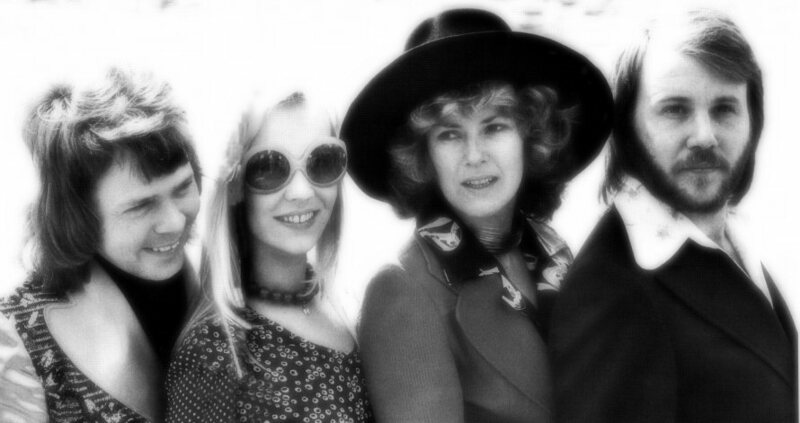 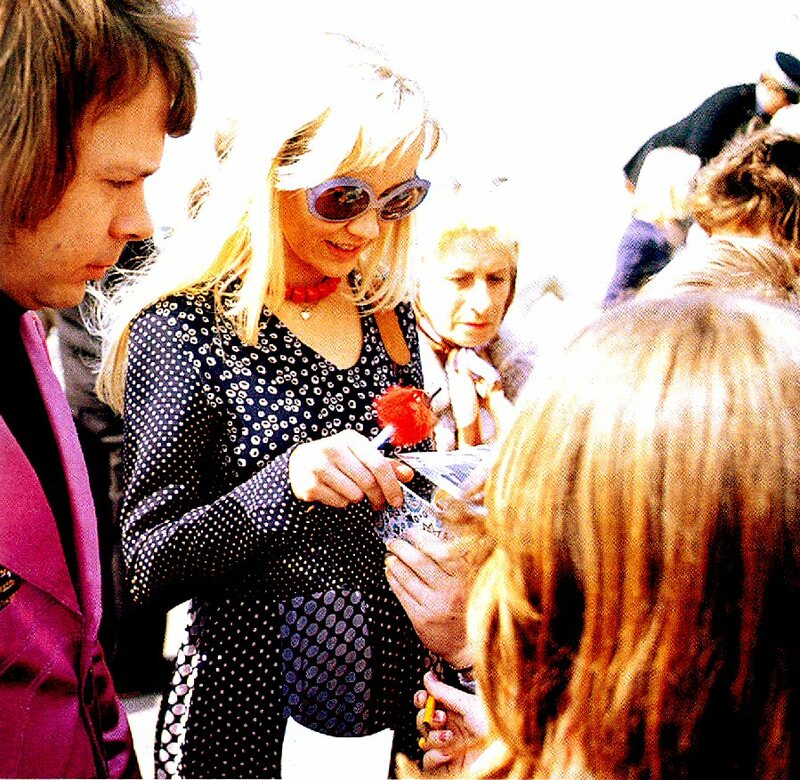 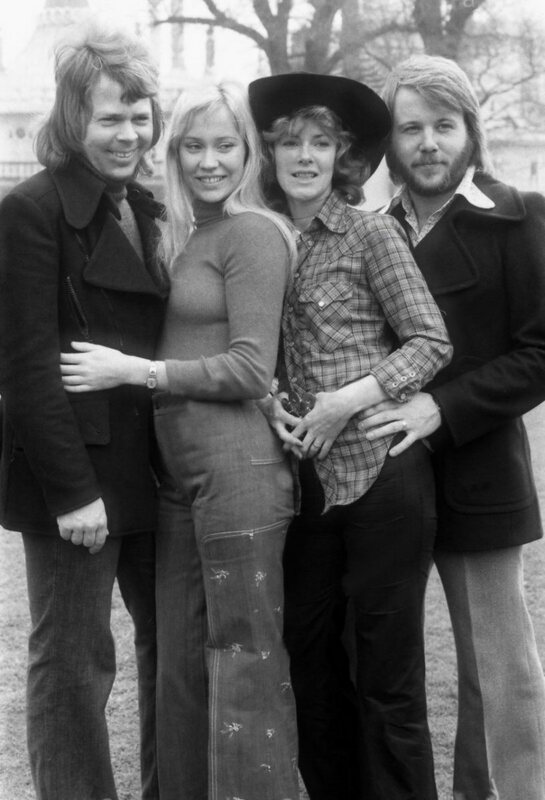 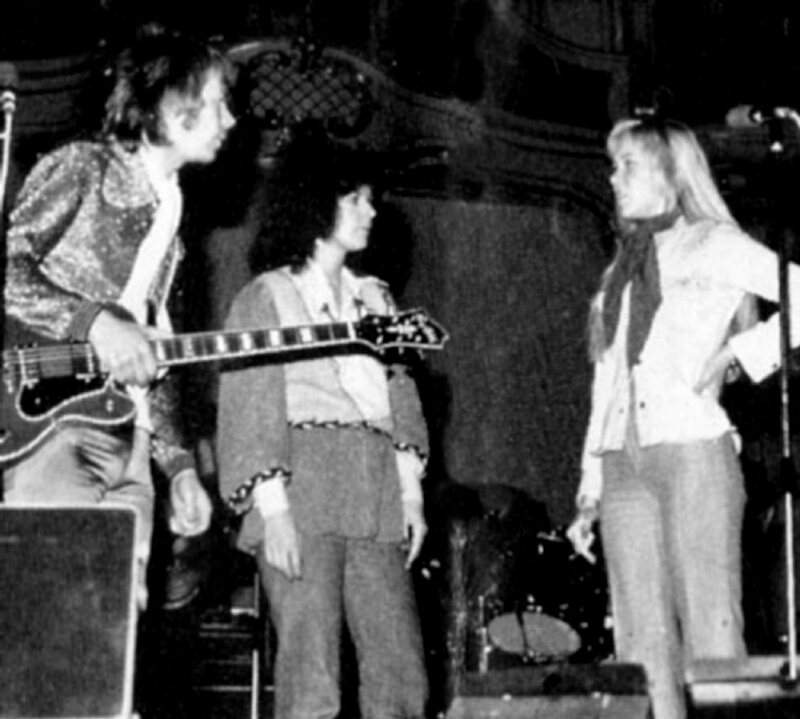 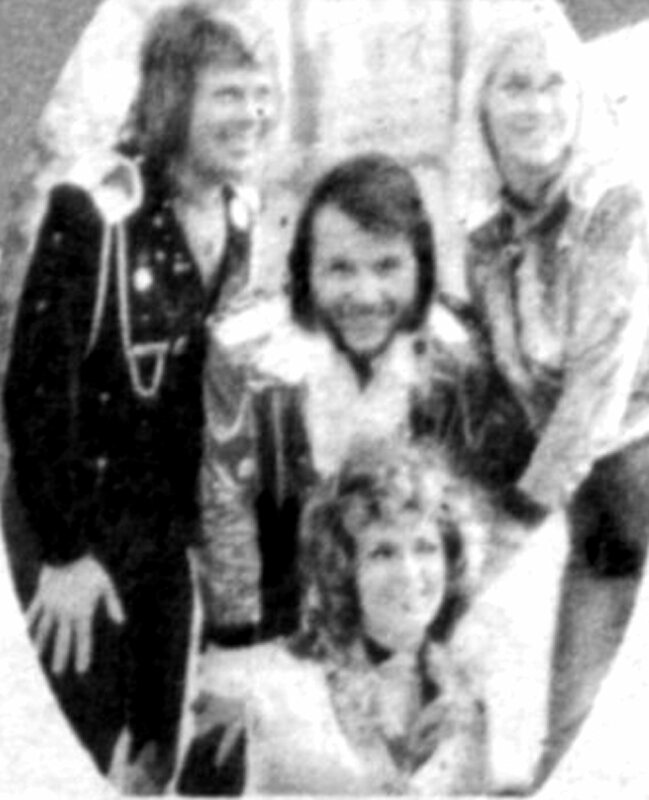 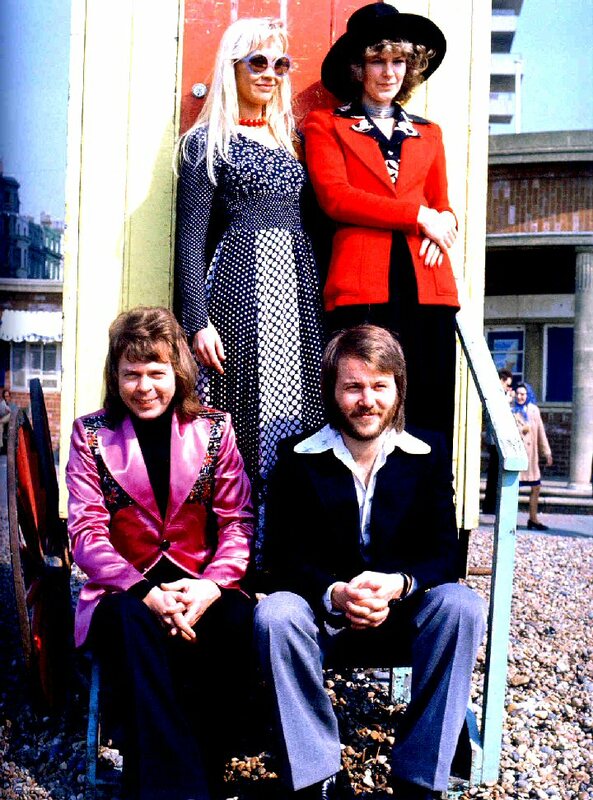 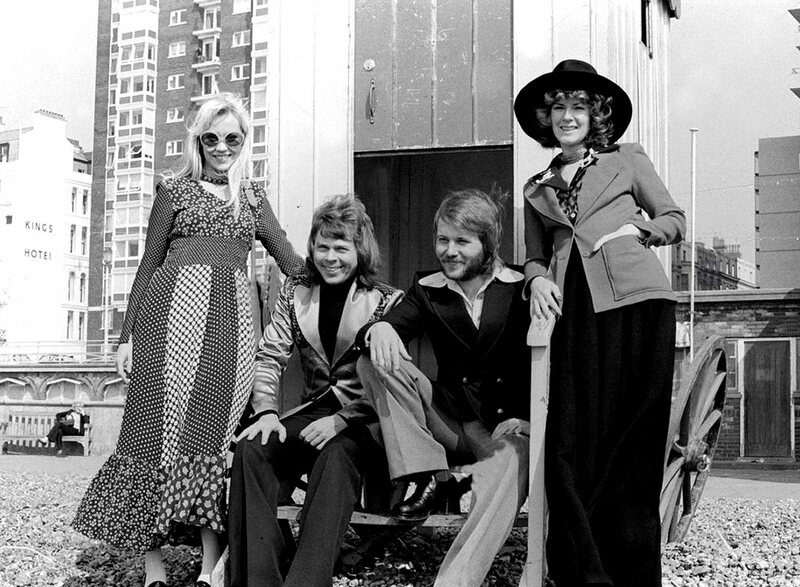 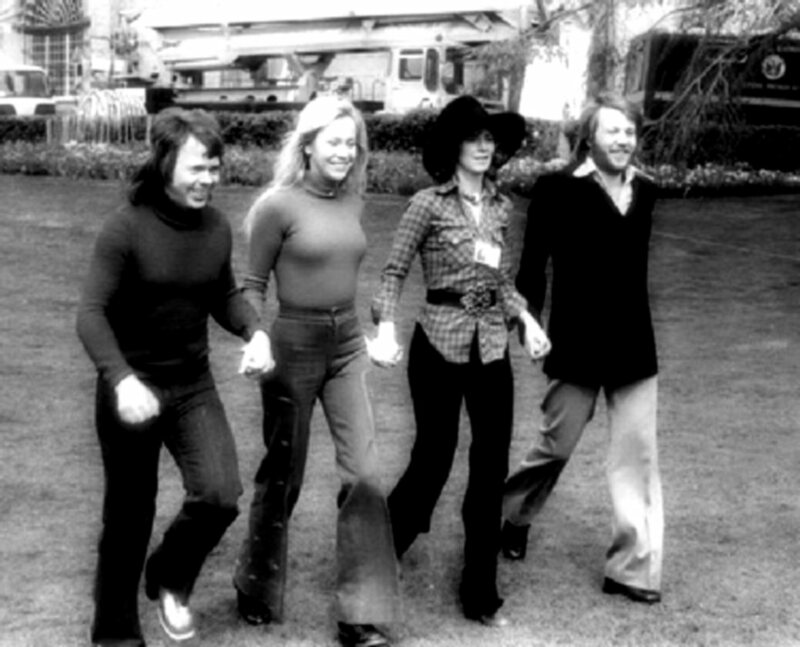 ABBA arrived in Brighton on April 3 and started rehearsals and promotional work. 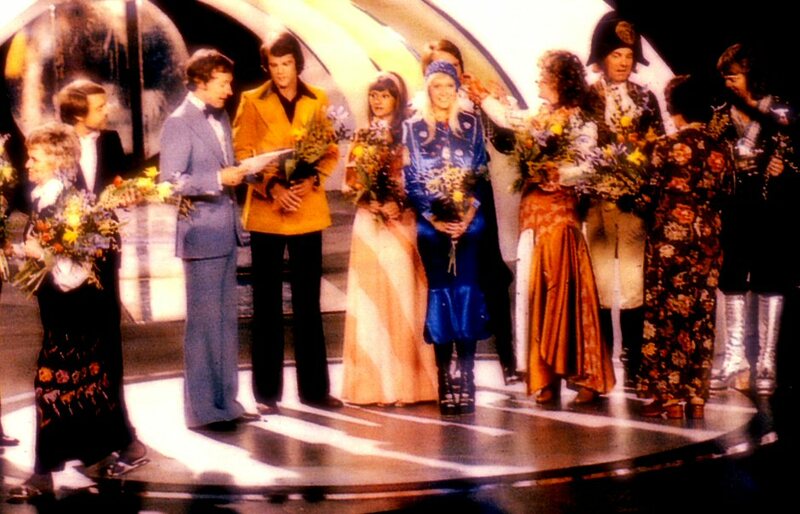 The competition was held on Saturday 6 April 1974 in the Brighton Dome. 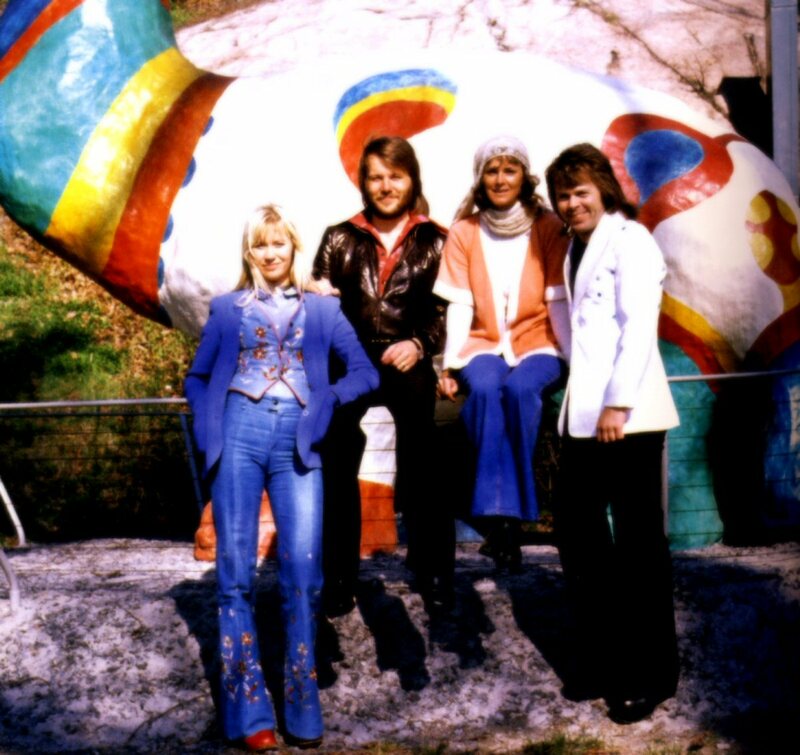 ABBA and Stikkan stayed at the Grand Hotel (see: ABBA related places). 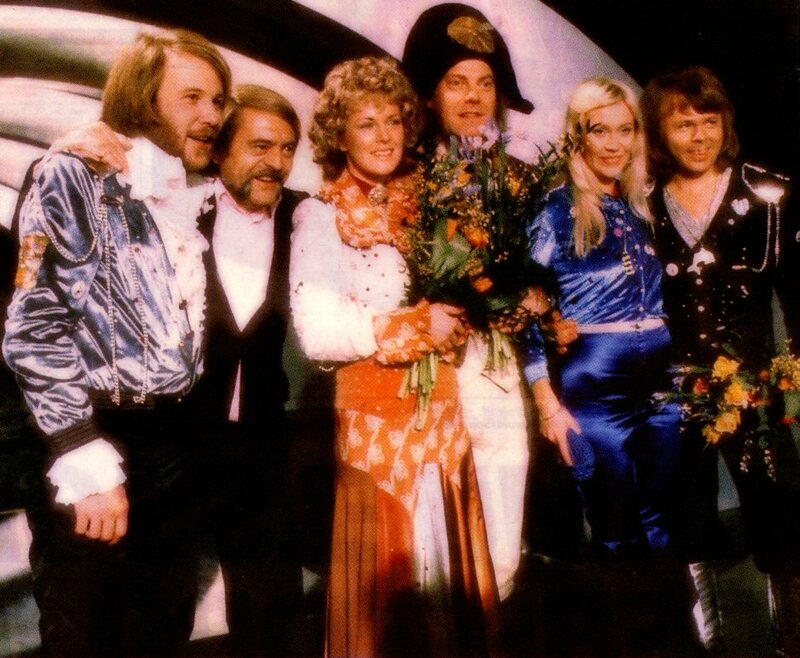 Nobody believed that ABBA would win. 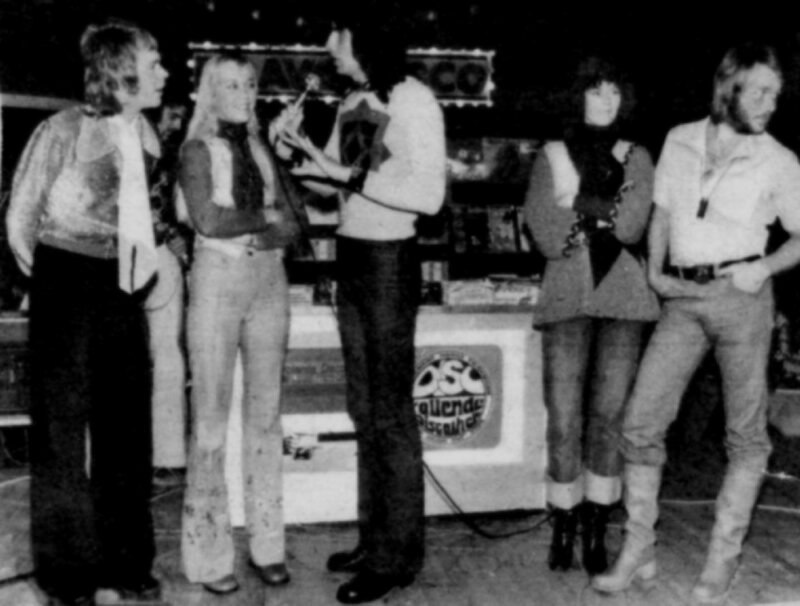 The competition was very hard. 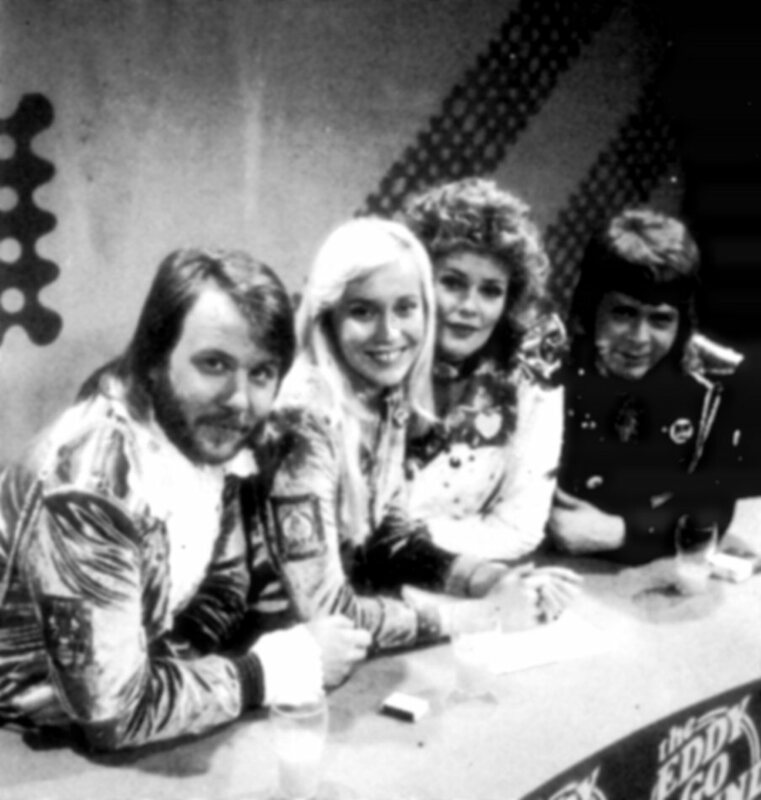 One of the competitors was Olivia Newton-John who was already a big name in the show business. 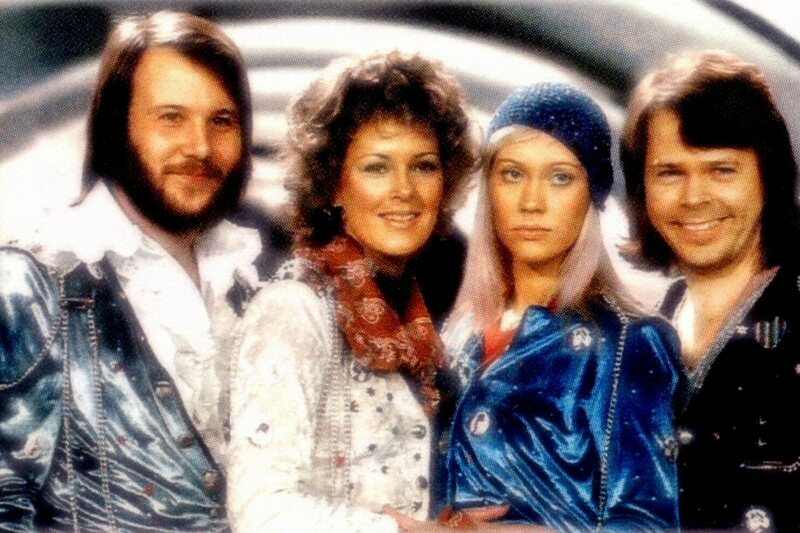 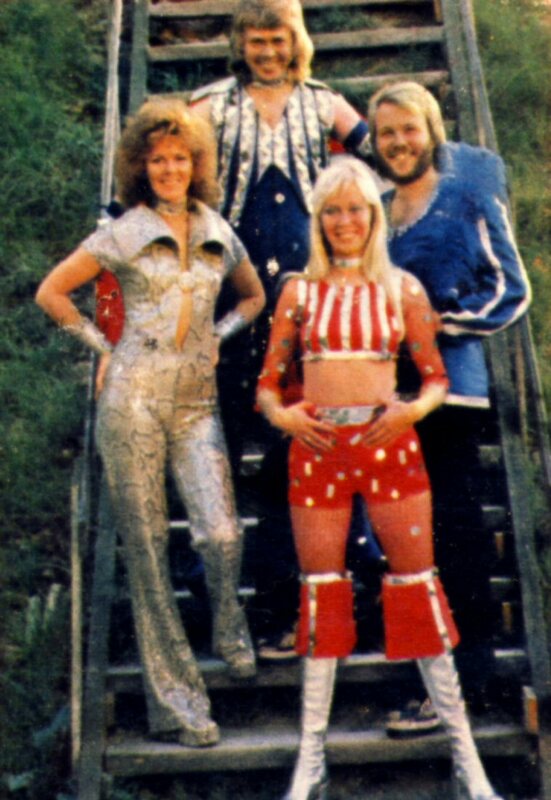 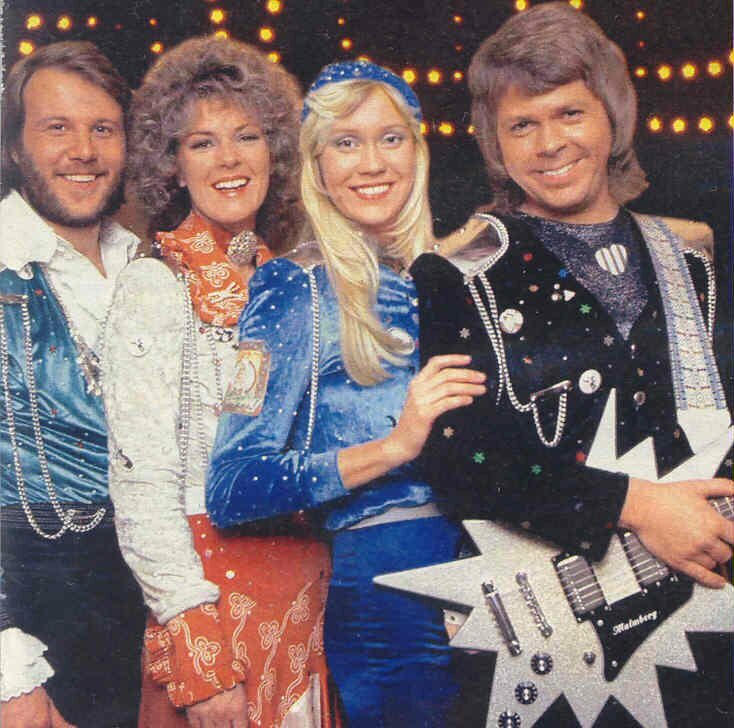 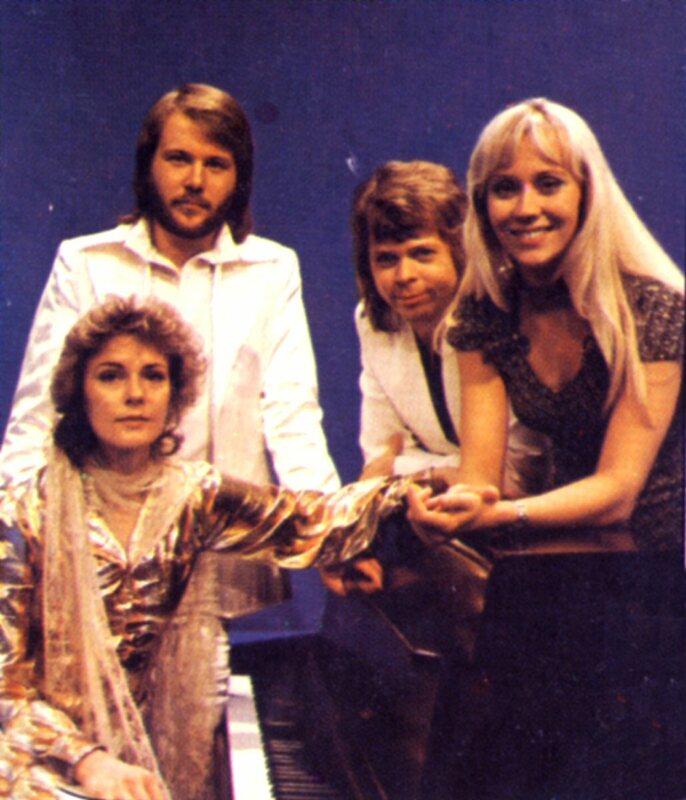 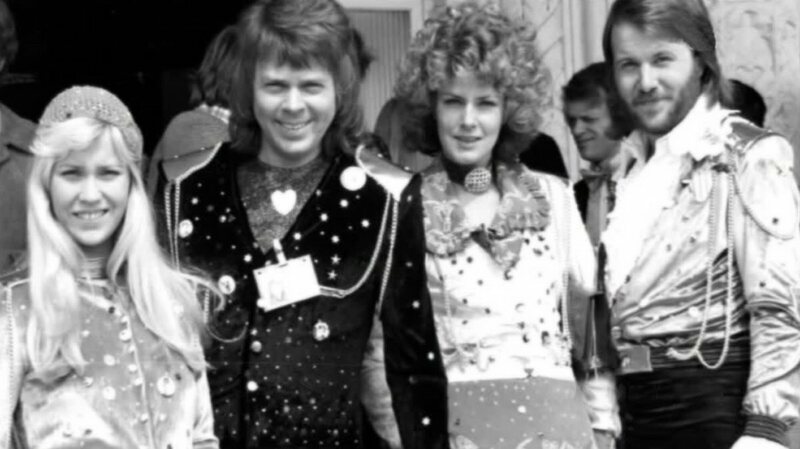 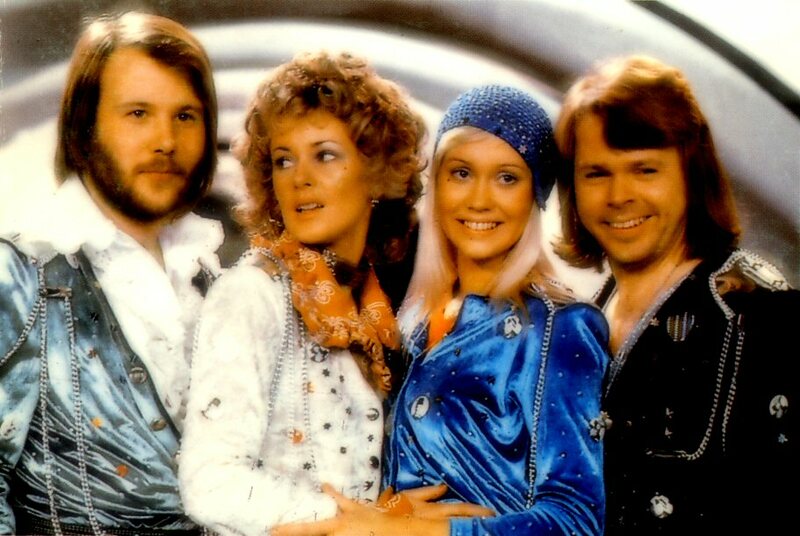 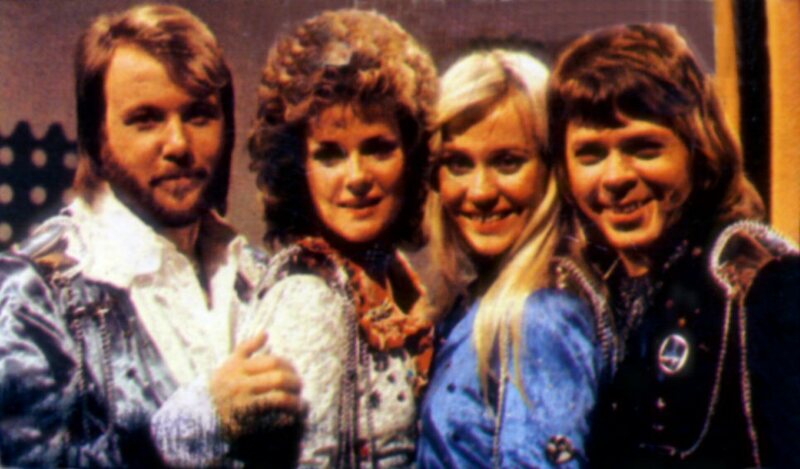 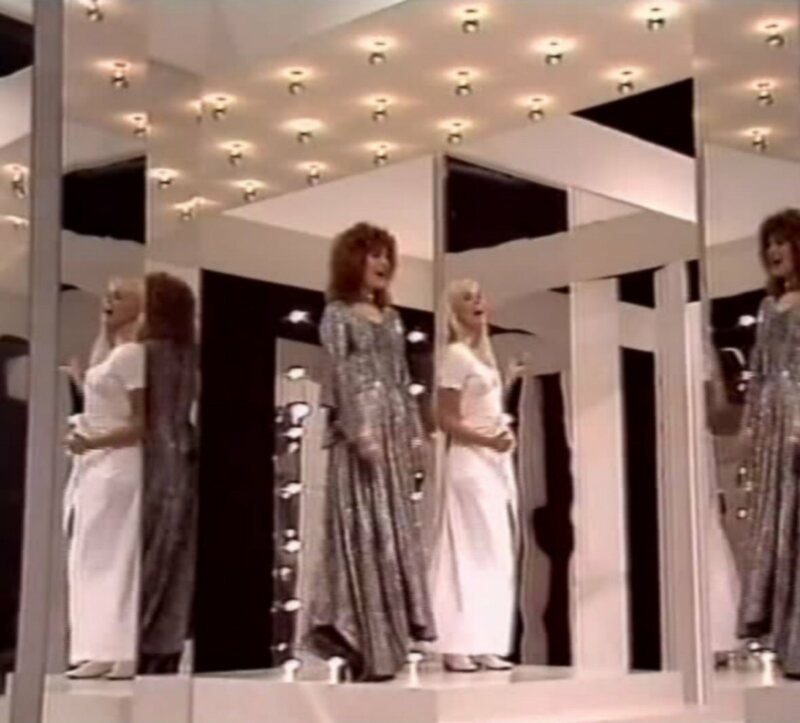 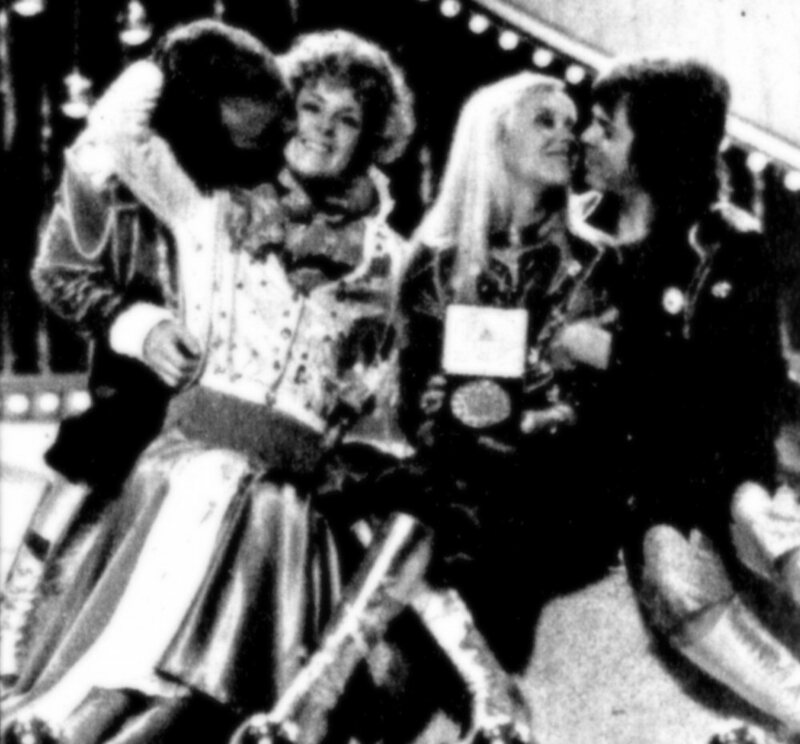 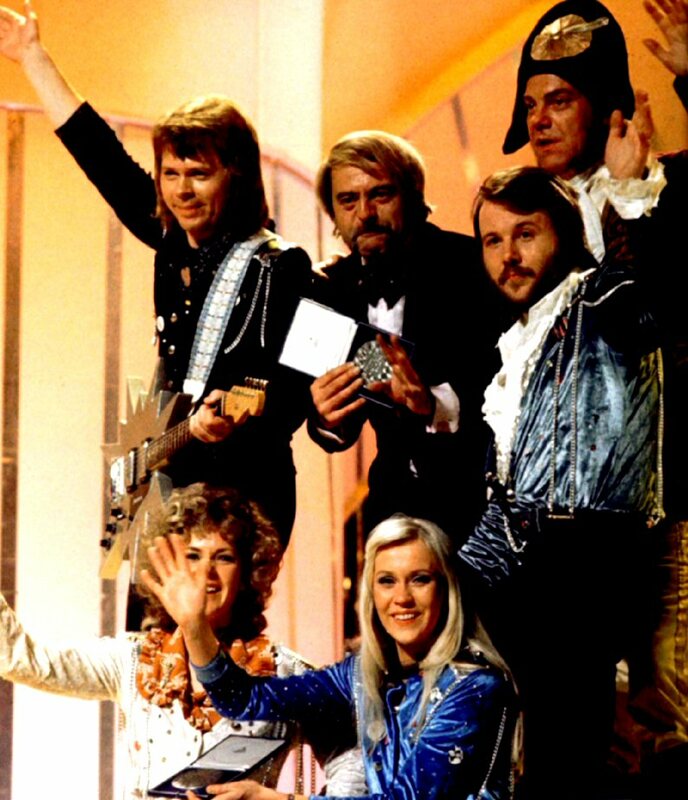 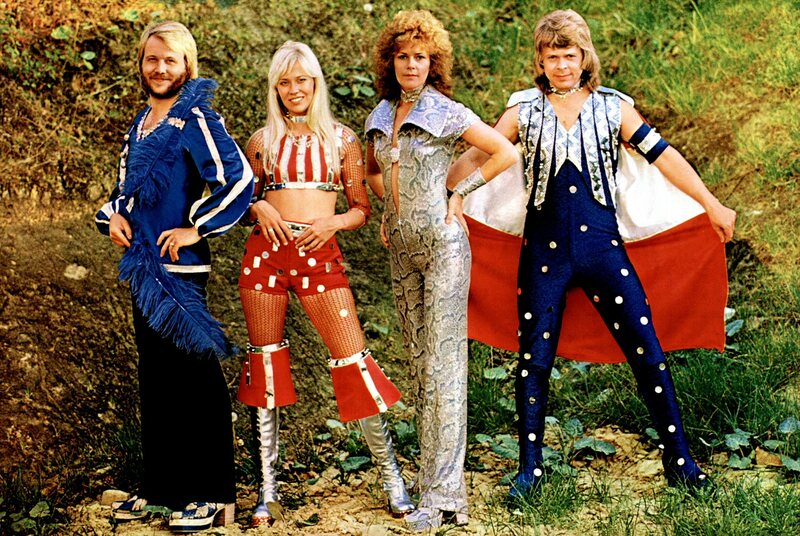 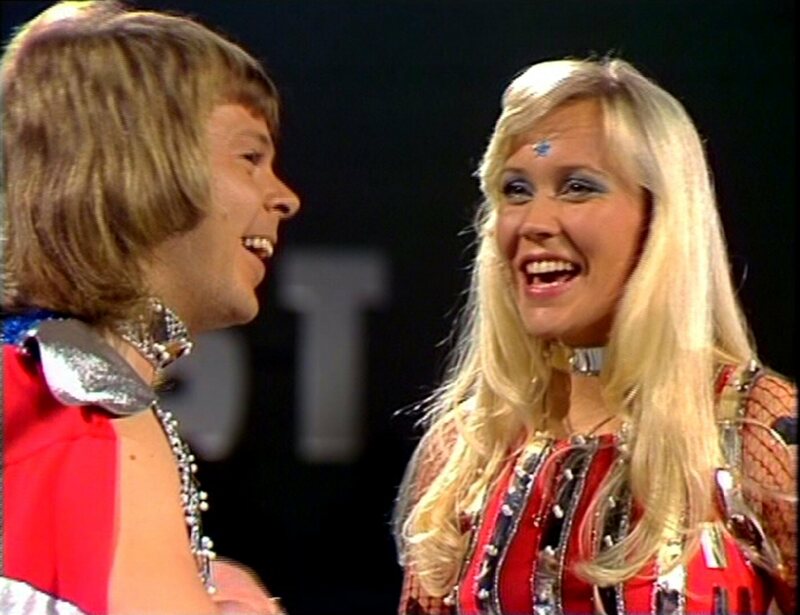 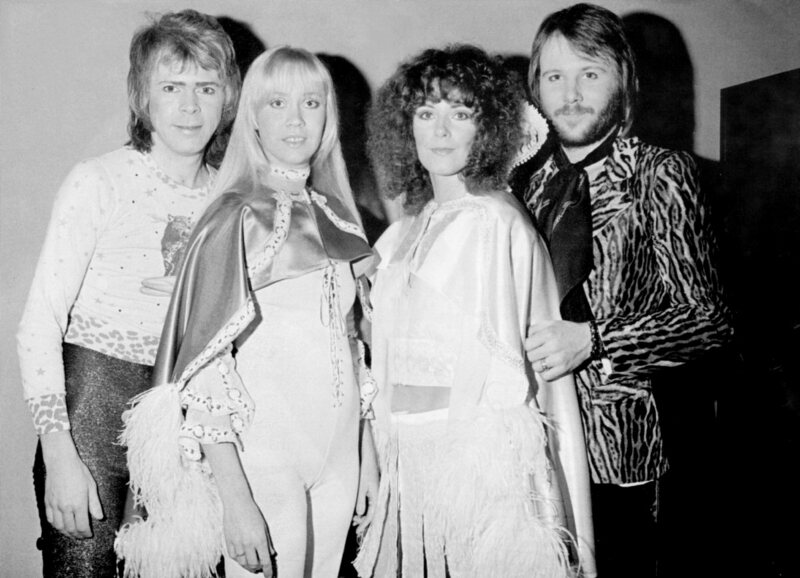 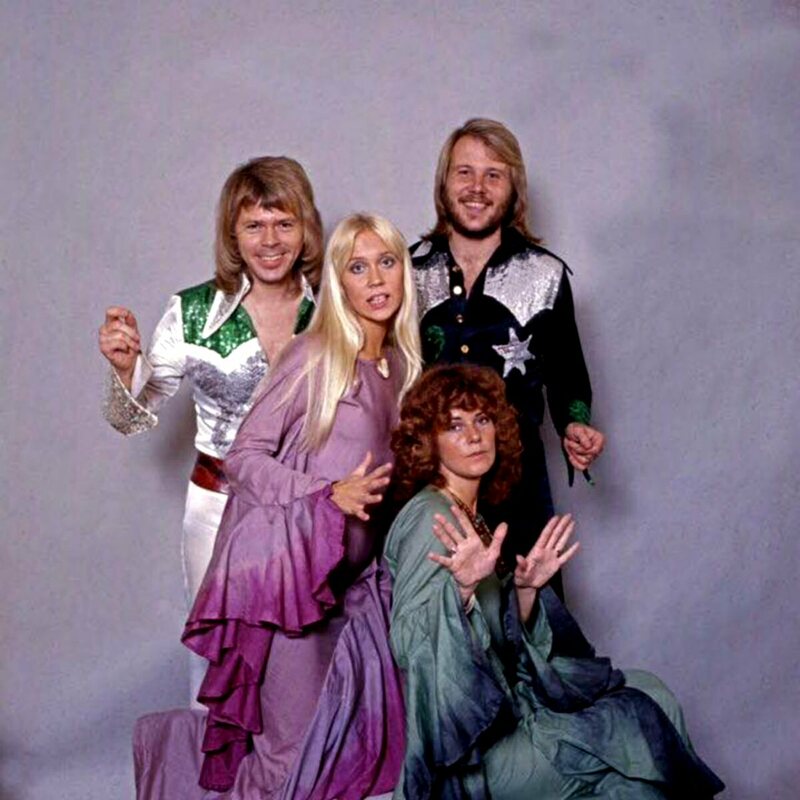 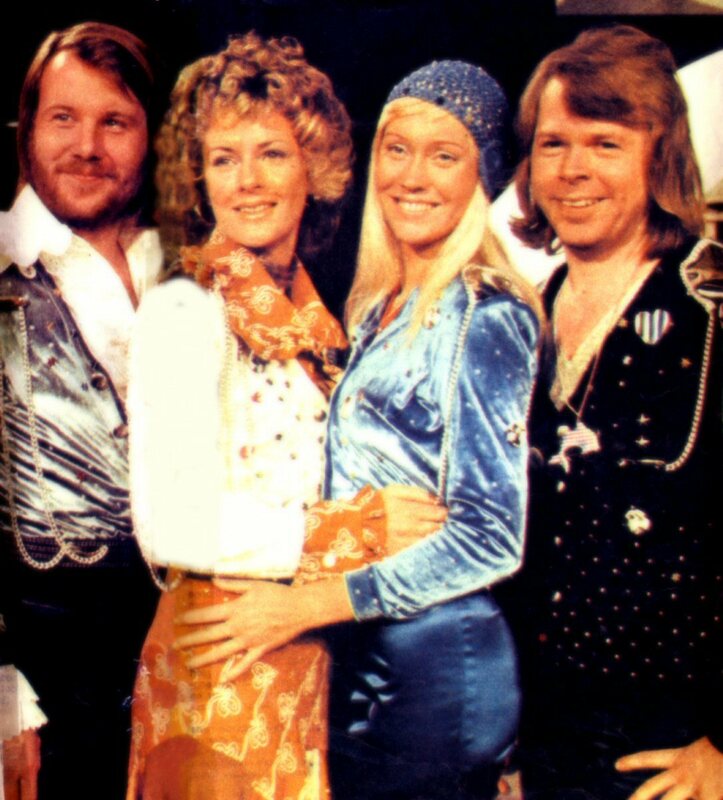 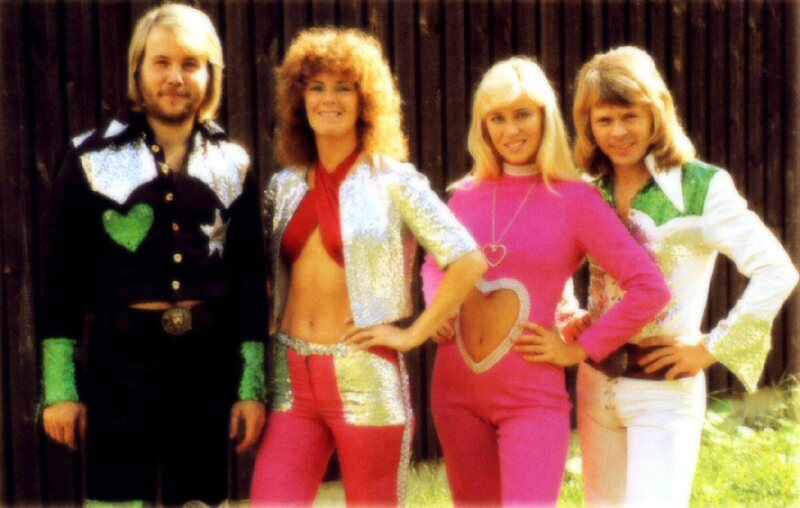 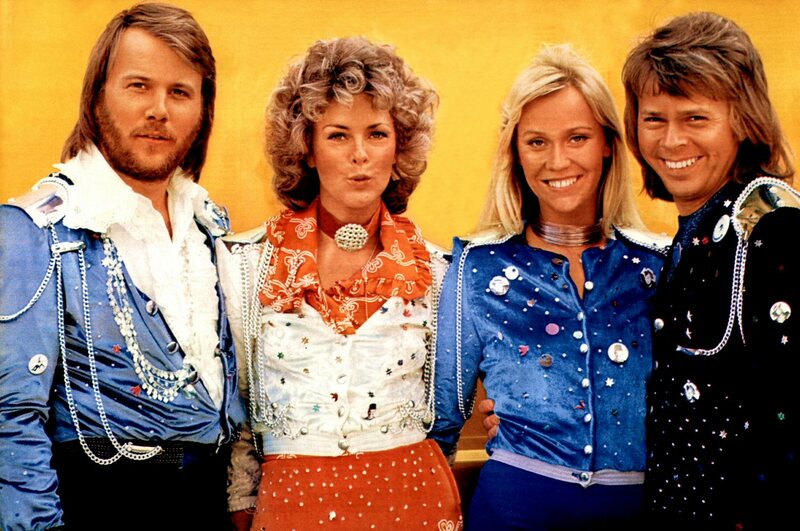 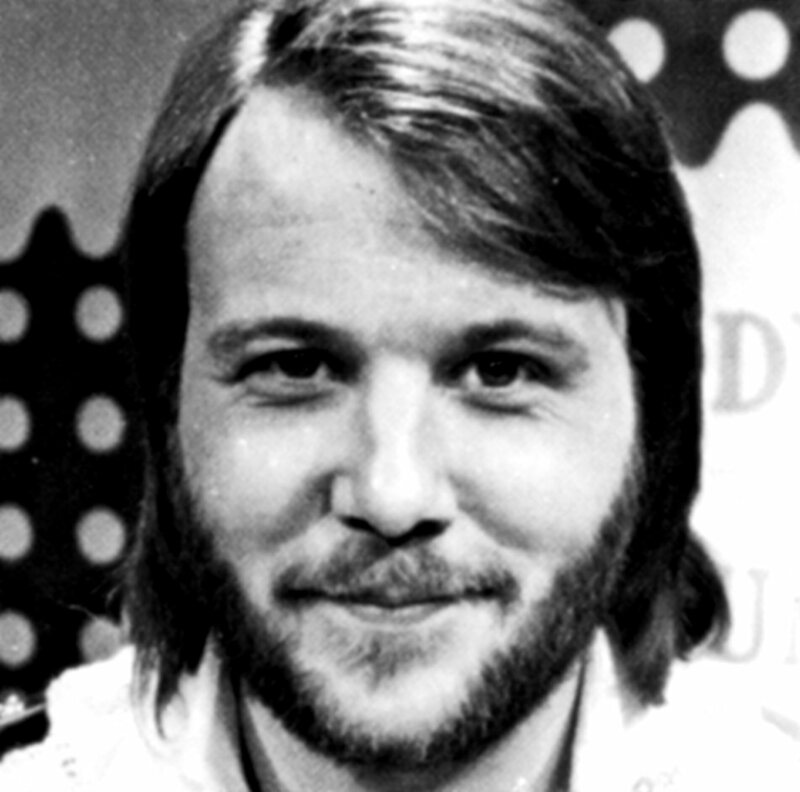 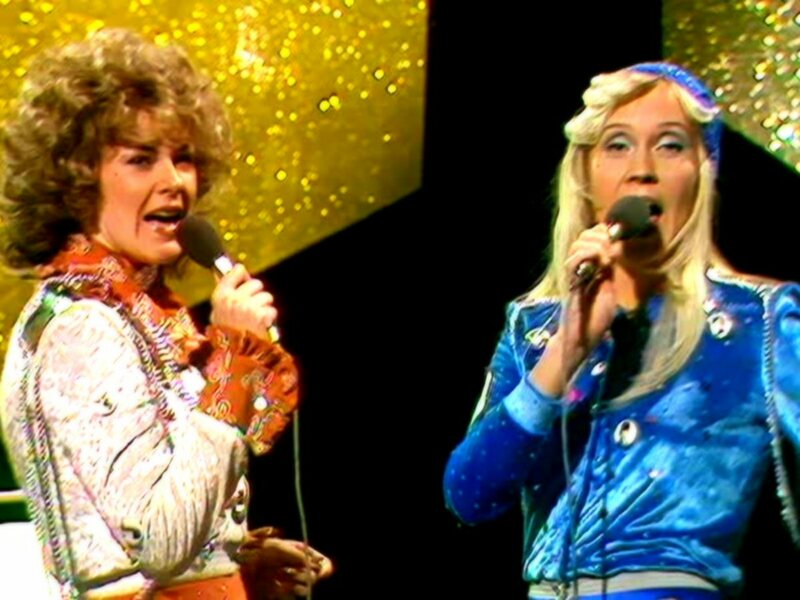 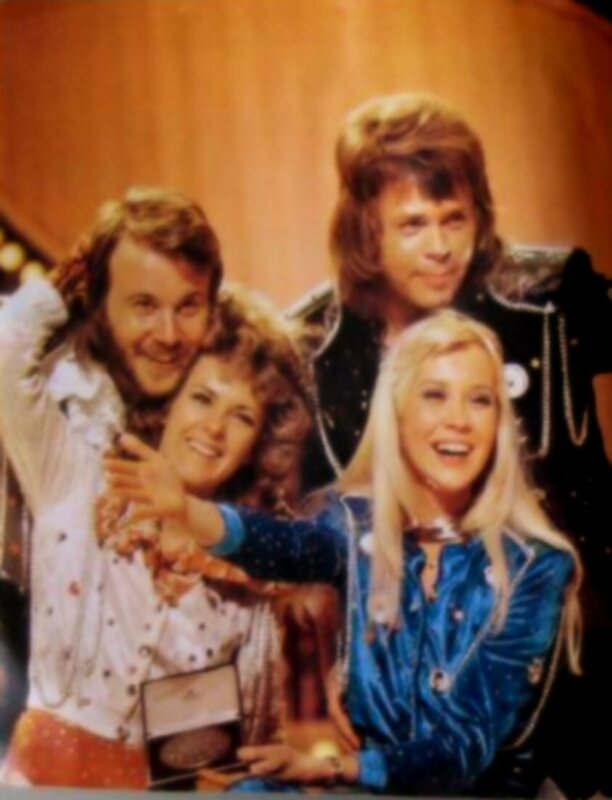 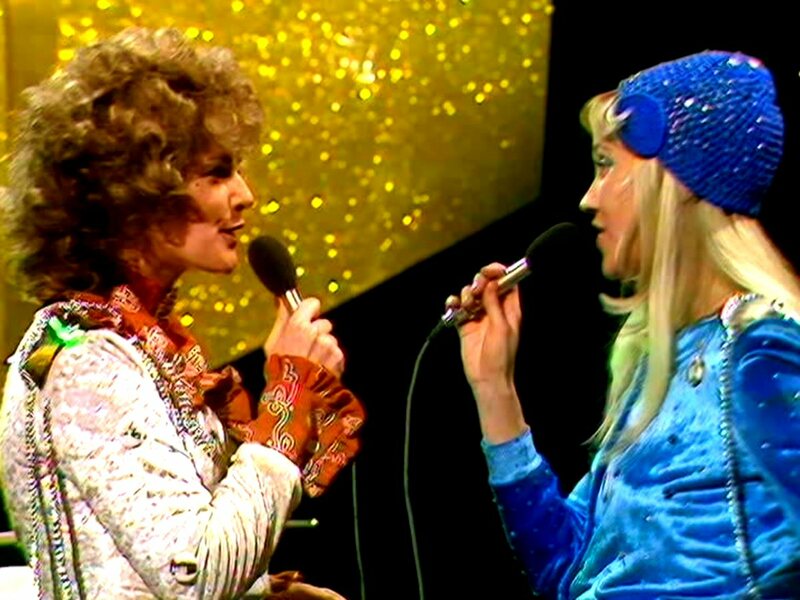 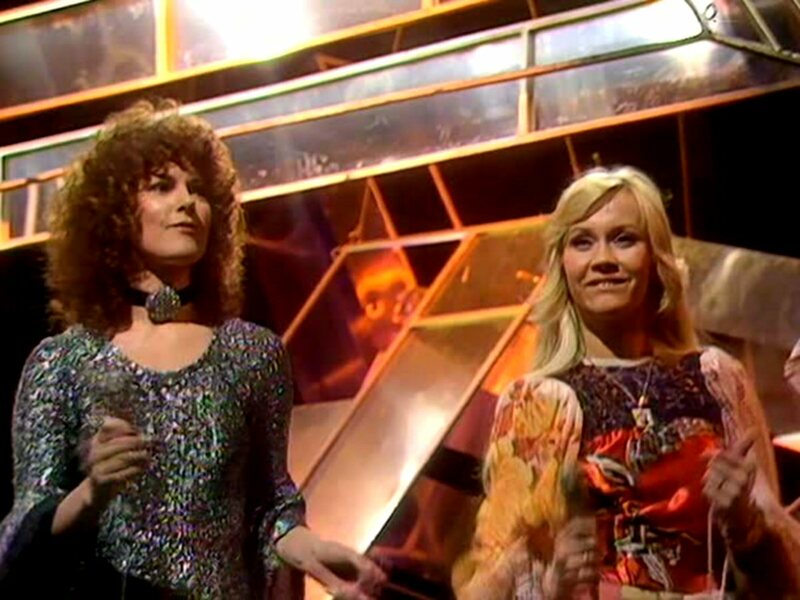 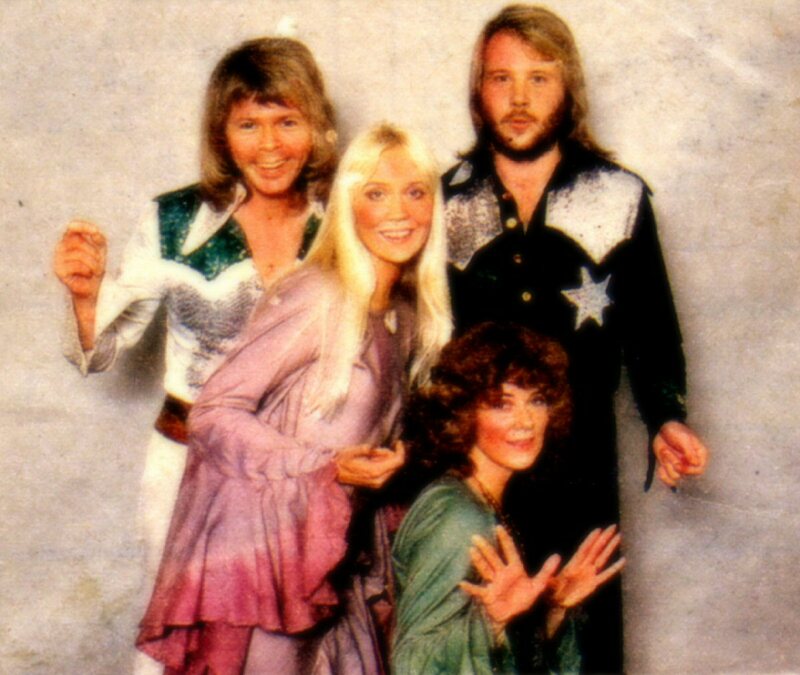 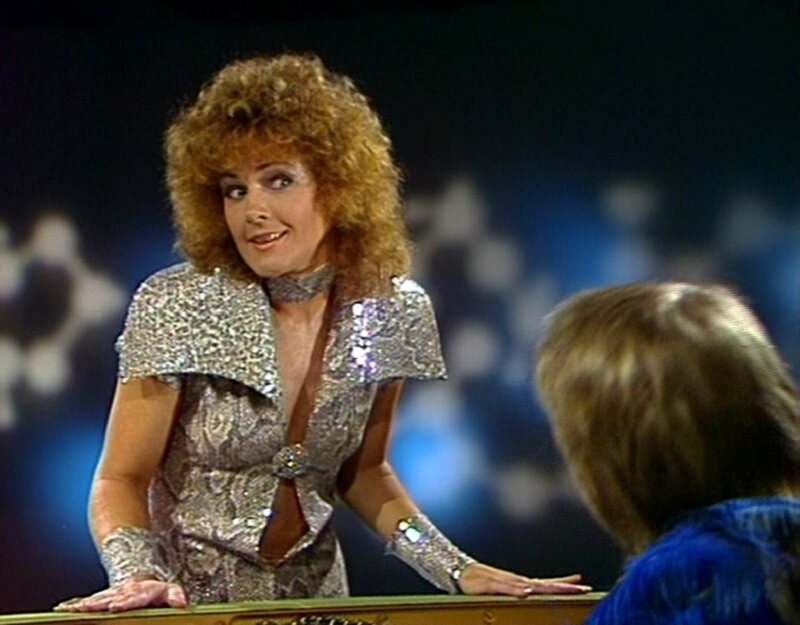 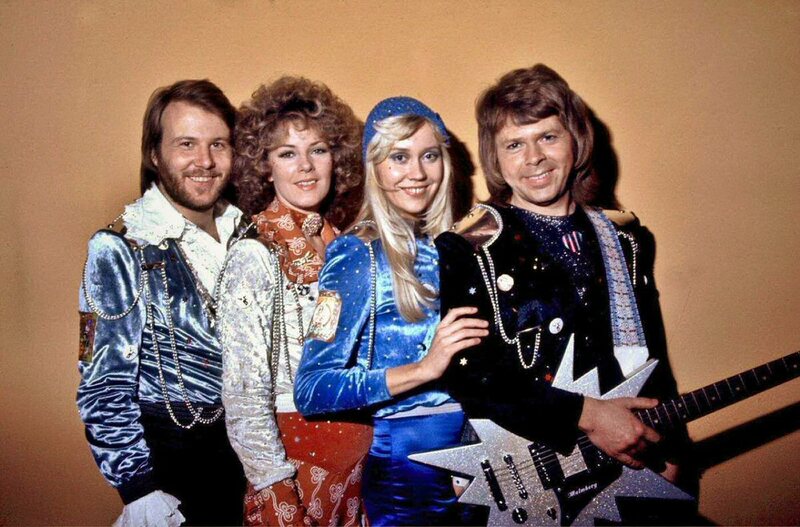 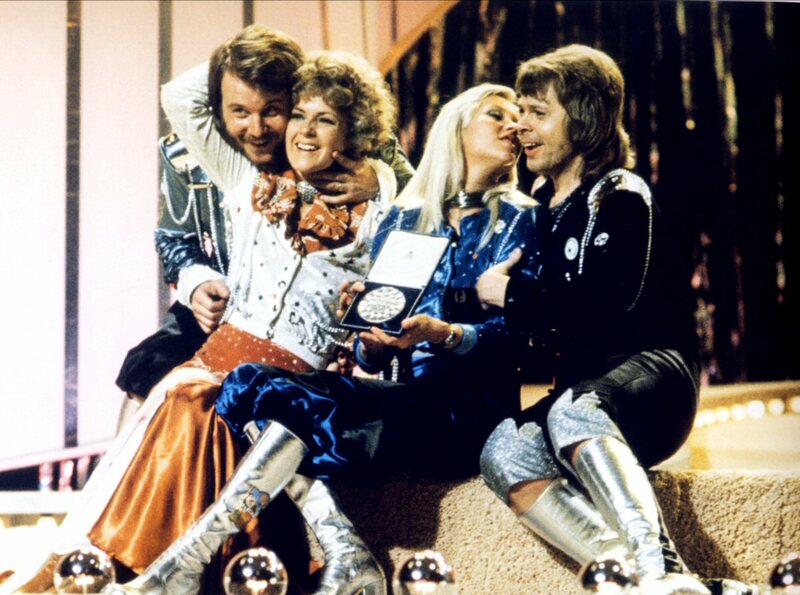 But ABBA won with 24 points and it would become the real start for the group as pop stars. 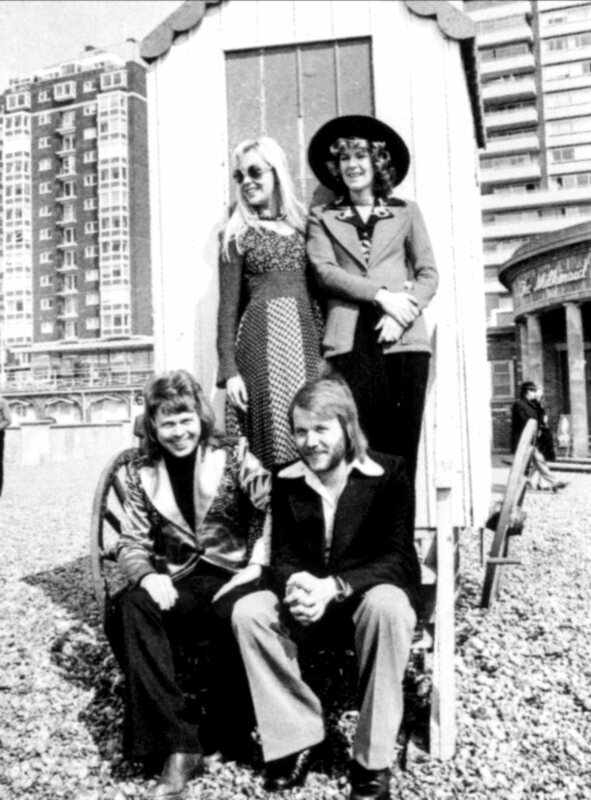 See ABBA related places in Brighton - here. 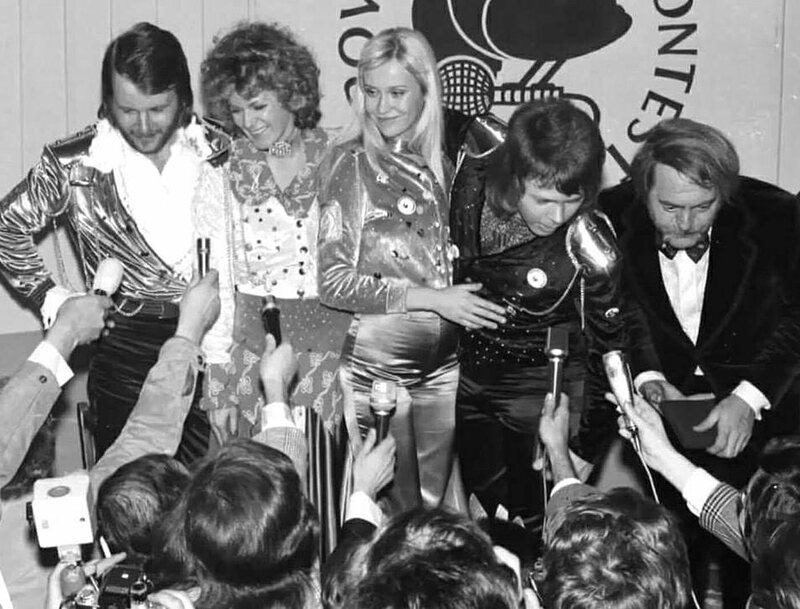 The day after the victory ABBA met the press and the photographers. 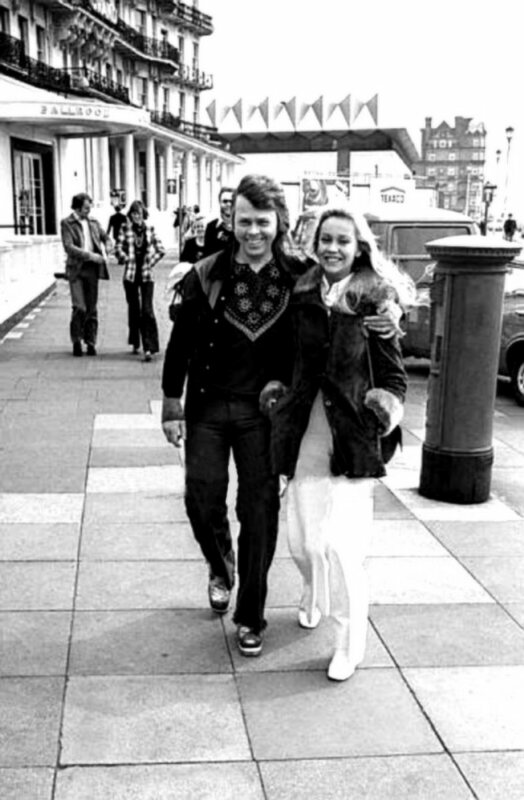 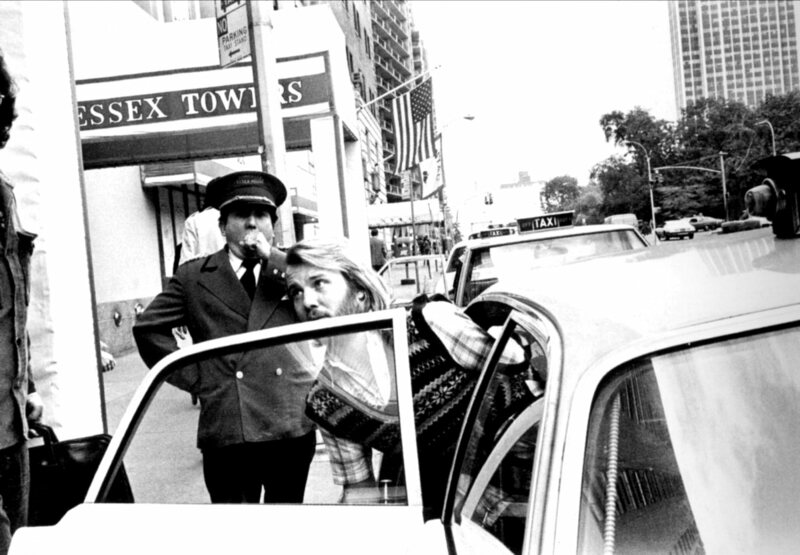 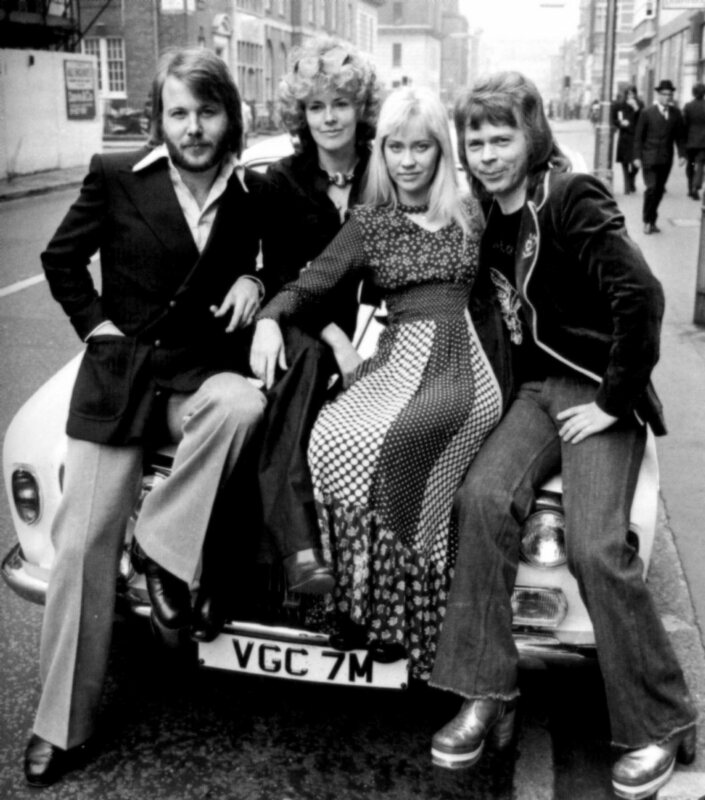 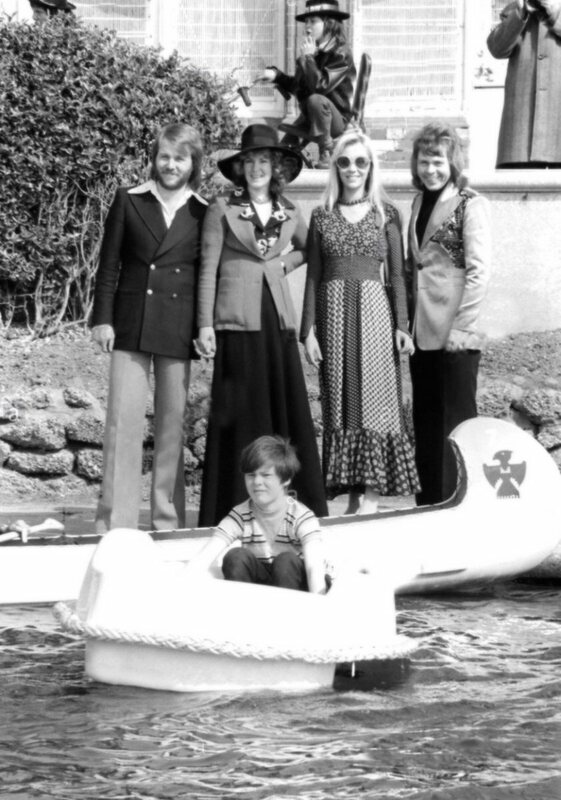 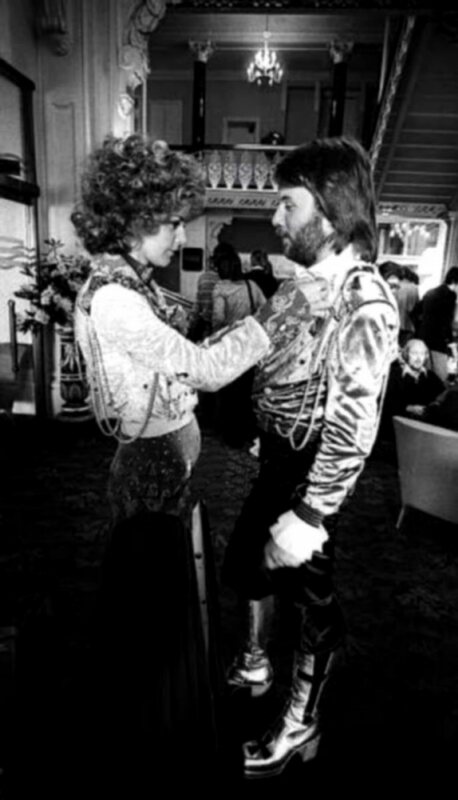 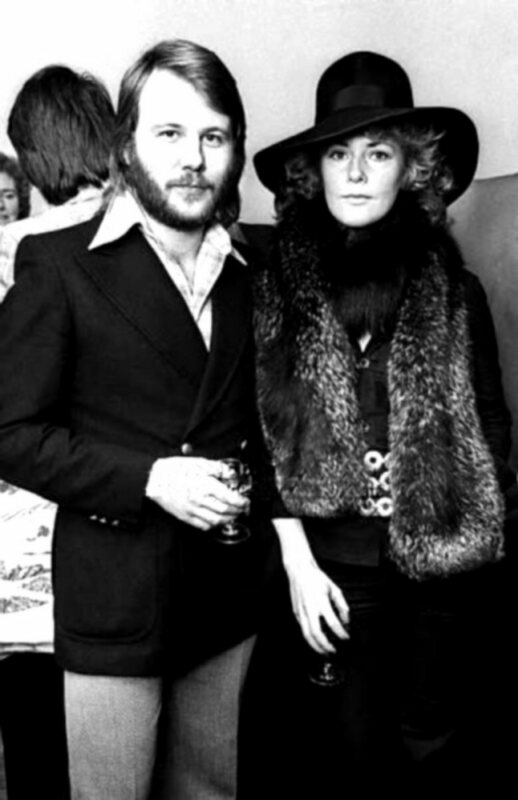 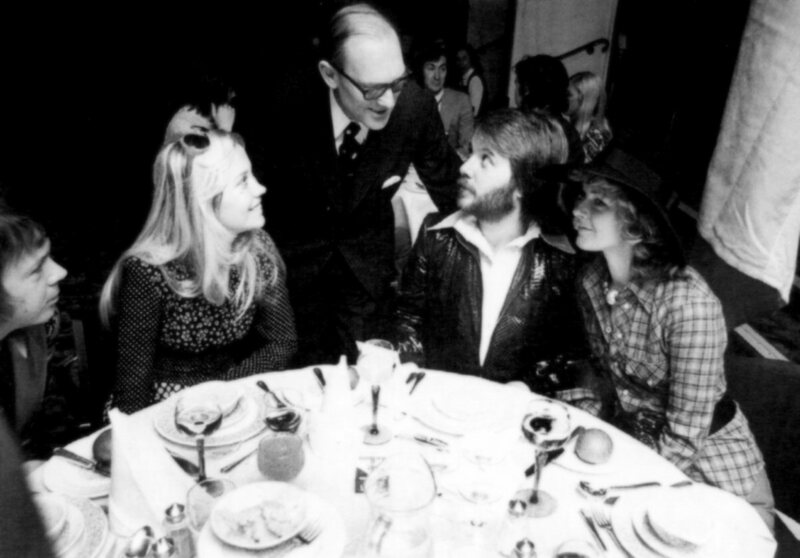 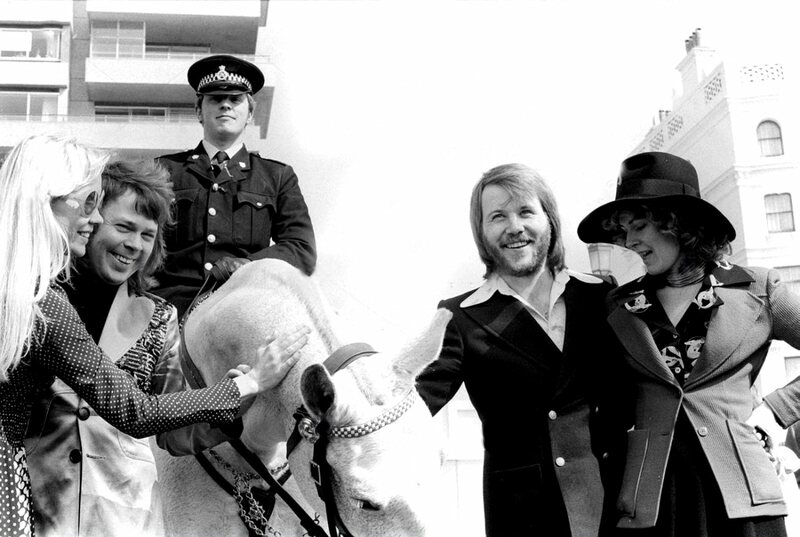 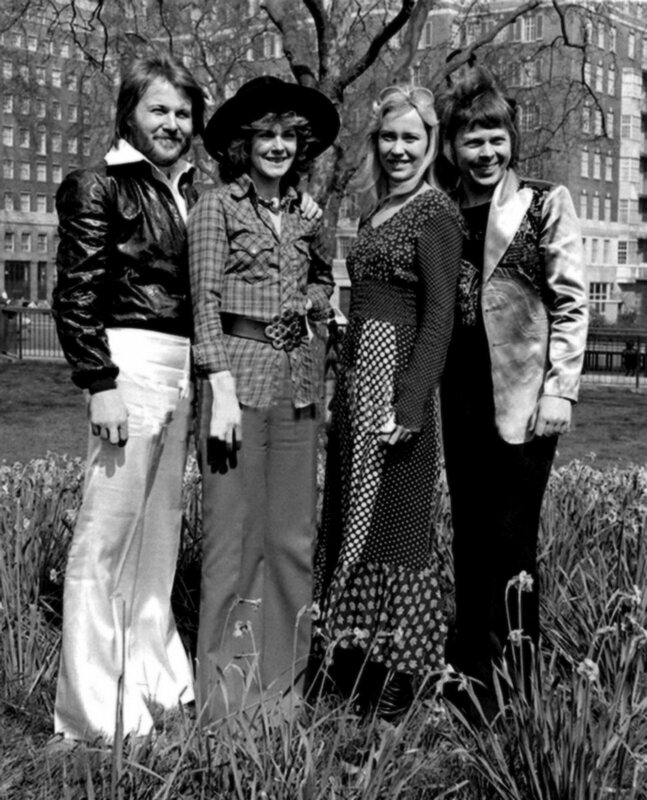 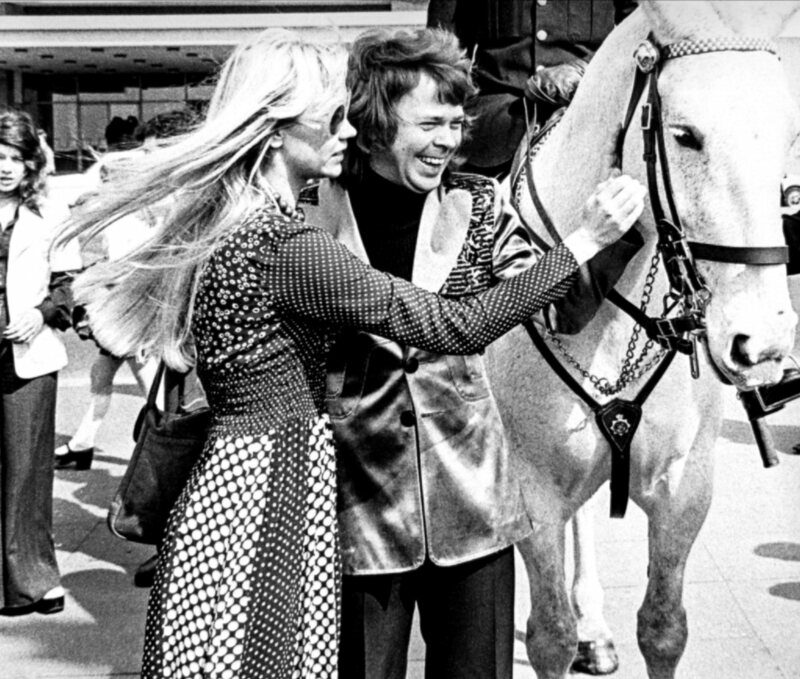 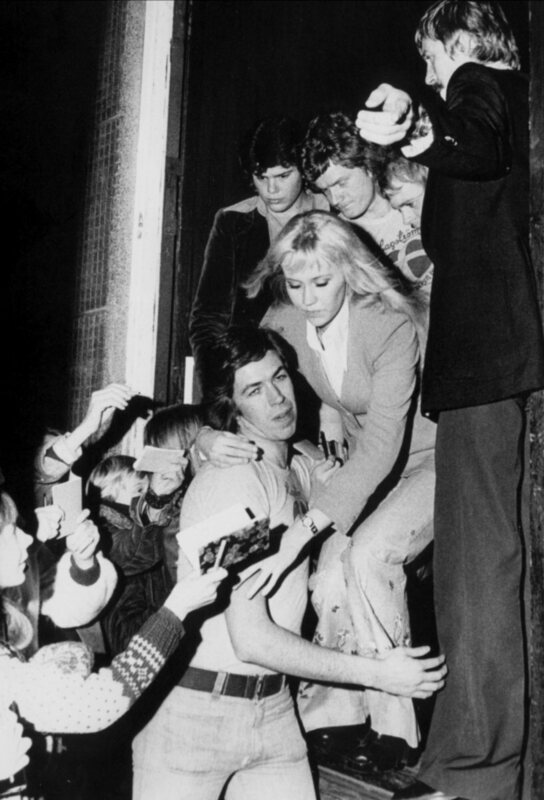 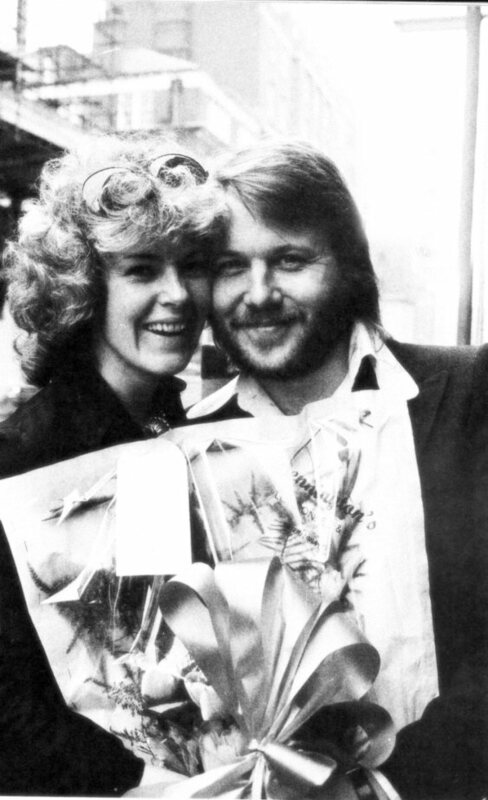 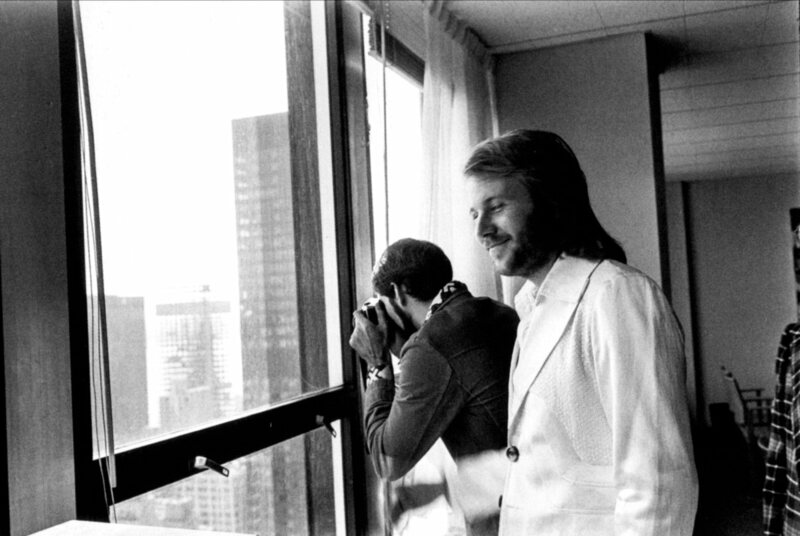 ABBA arrived in London two days after the contest and stayed at the hotel Grosvenor House. 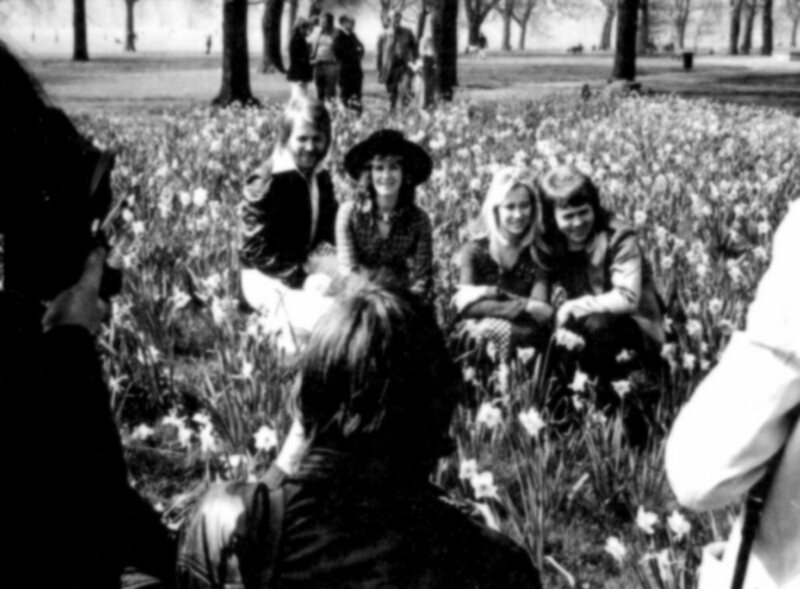 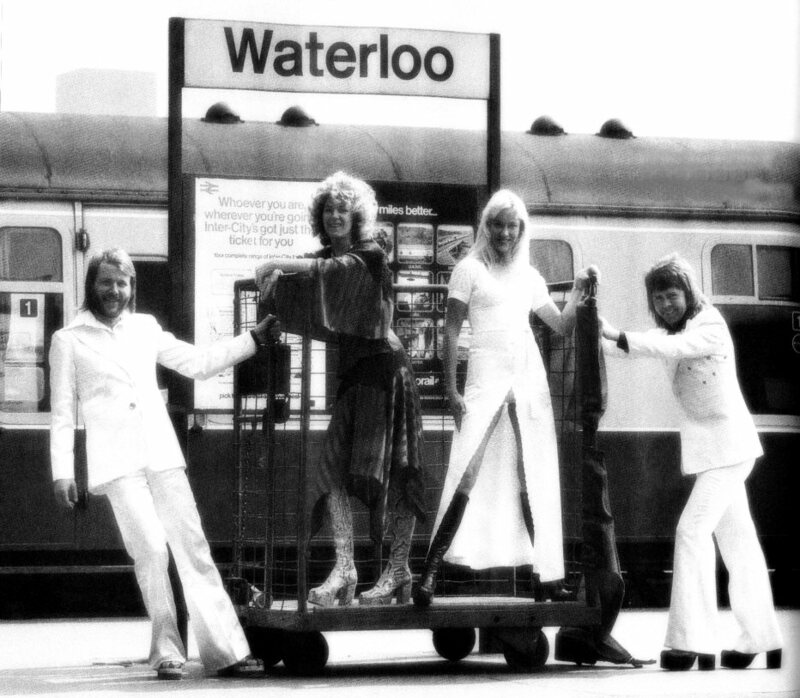 The group posed for photographers on the Waterloo station, Hyde Park and other locations in London. 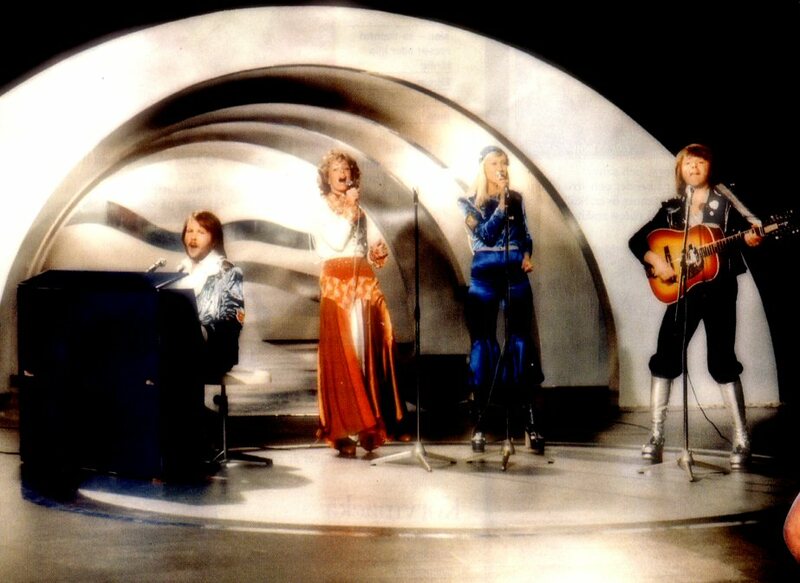 For the first time ABBA appeared on the British TV show Top Of The Pops on April 11th (recorded on April 10th) where they performed "Waterloo" live. 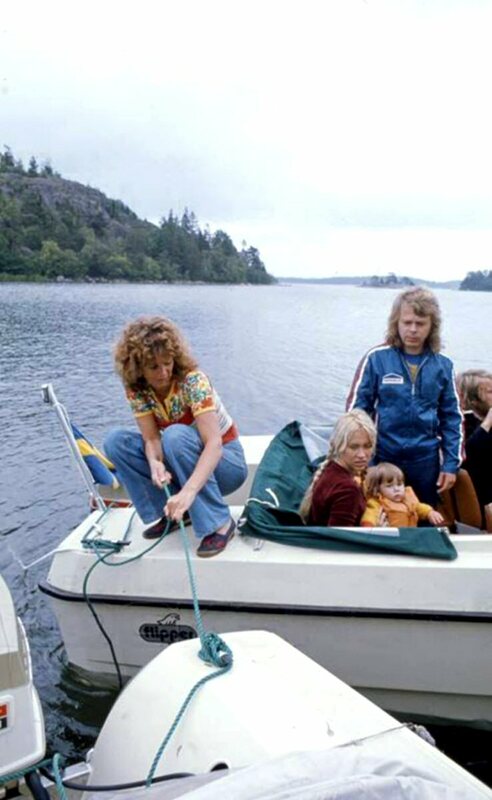 The pressure was very hard. 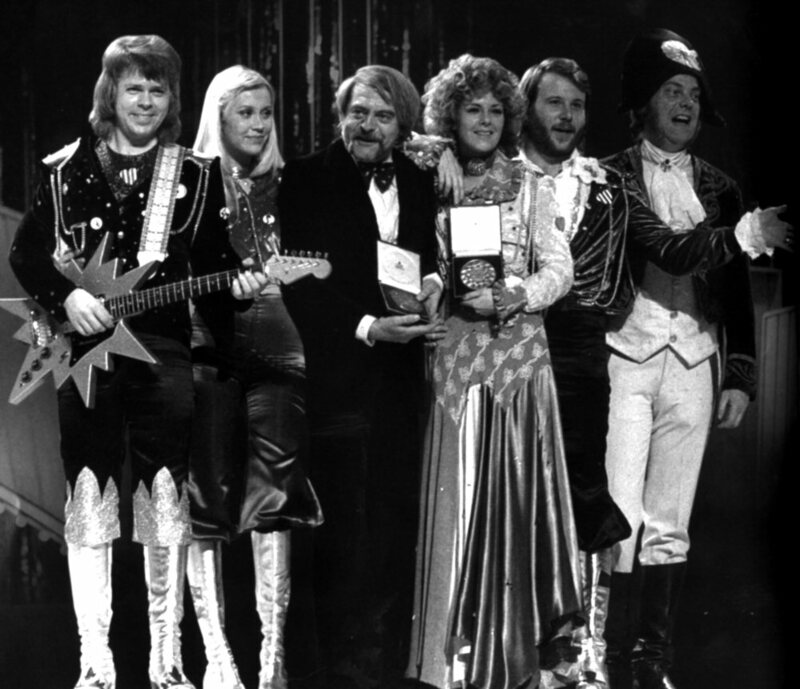 TOTP was one of the most important TV shows in Great Britain. 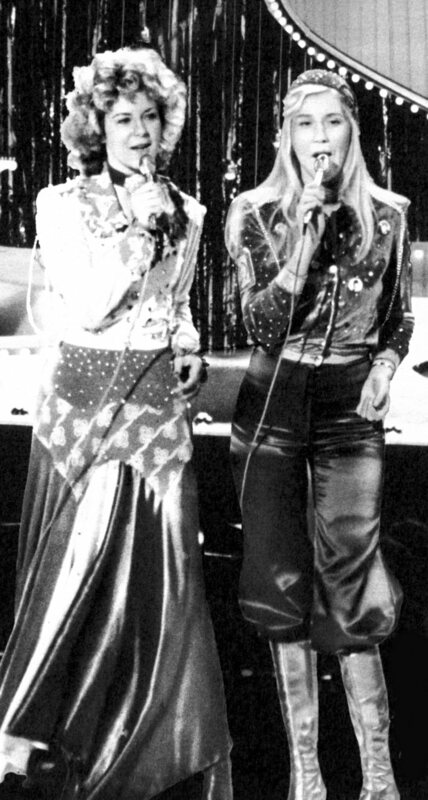 The girls sang wrong in the second part of the song but the performance was good anyway. 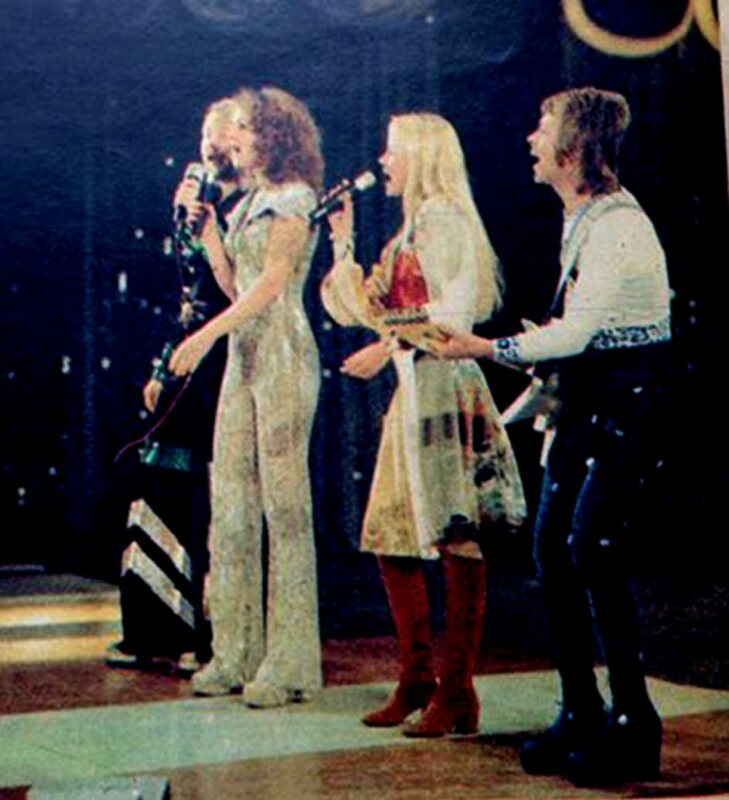 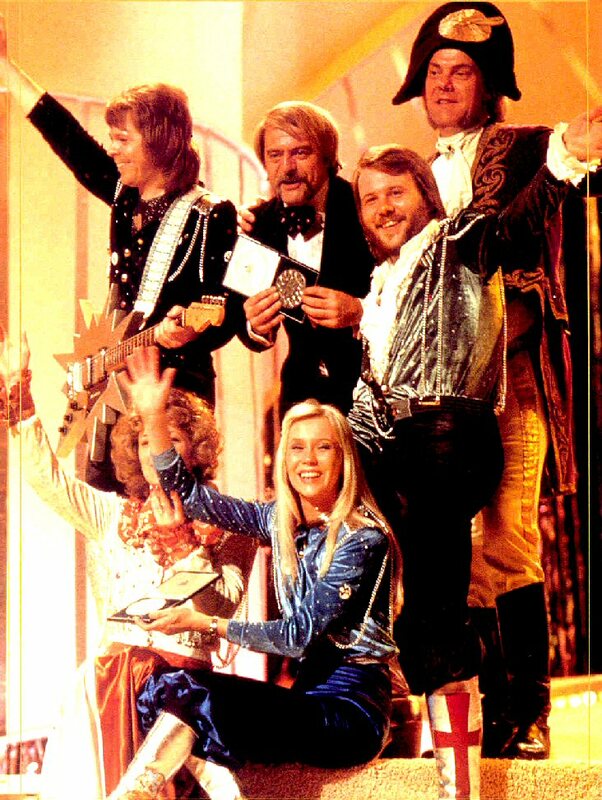 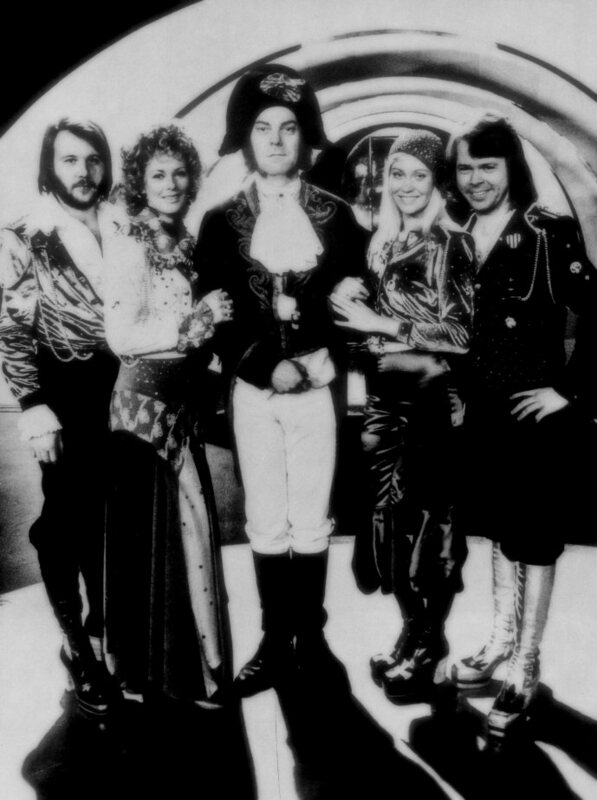 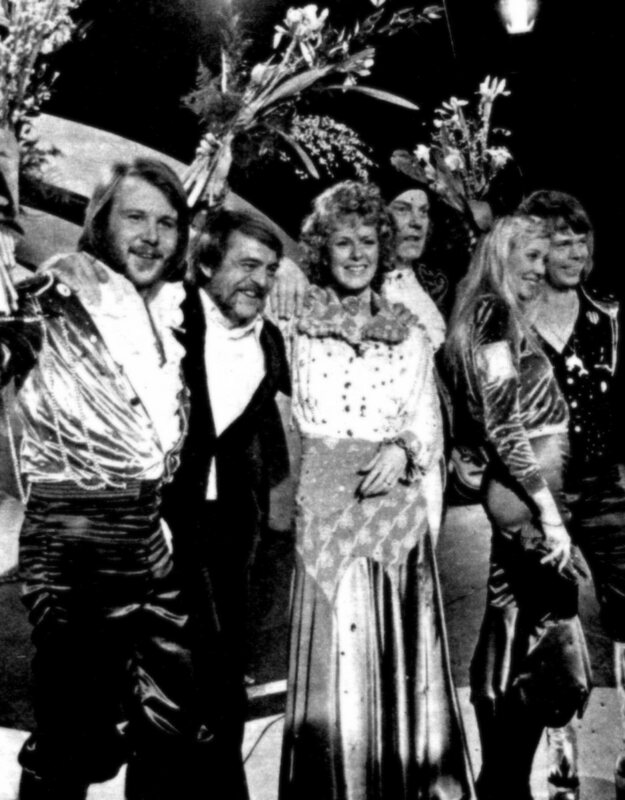 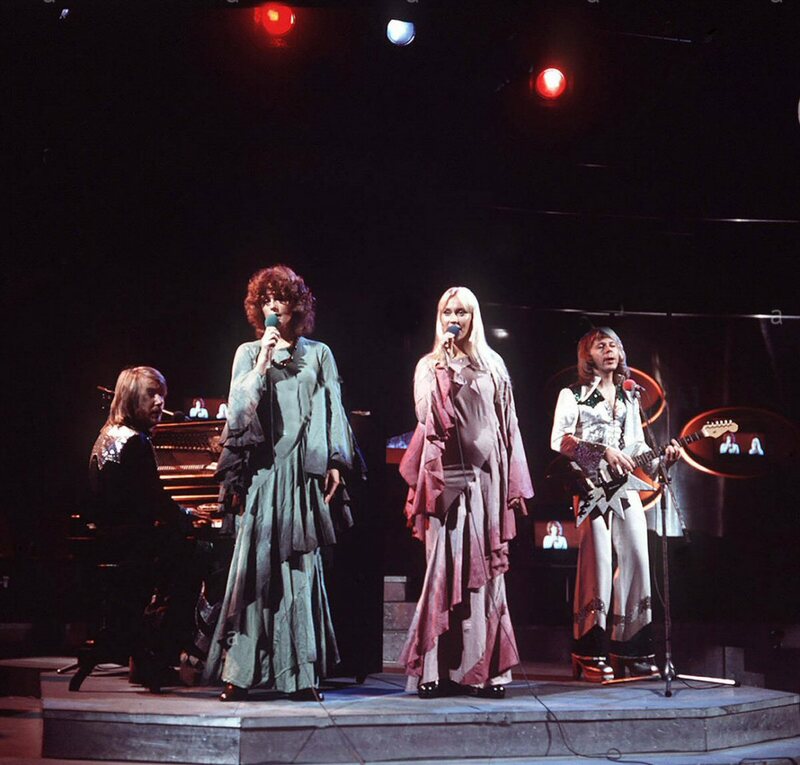 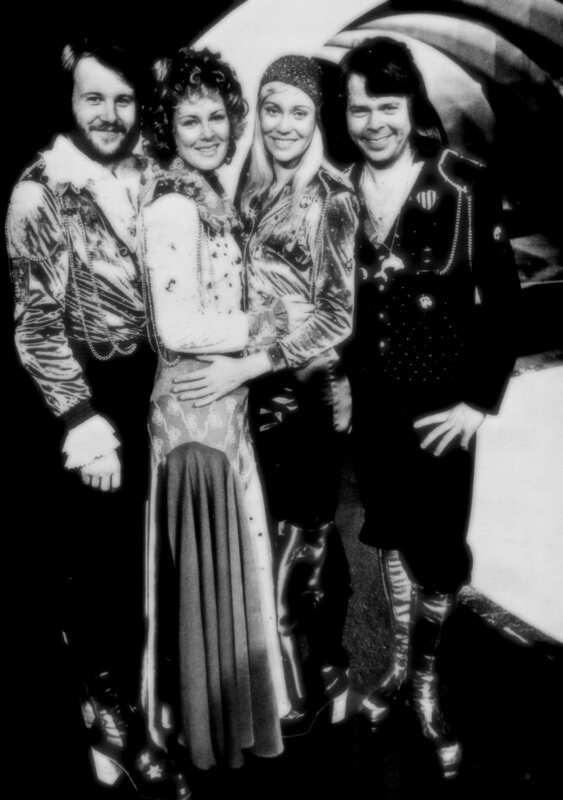 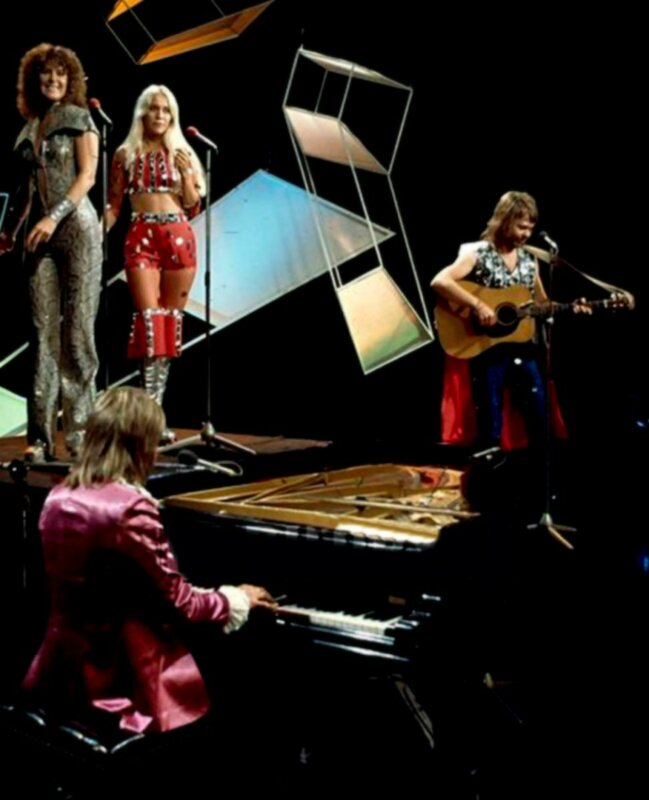 ABBA came to Germany directly from London for several TV performances in April. 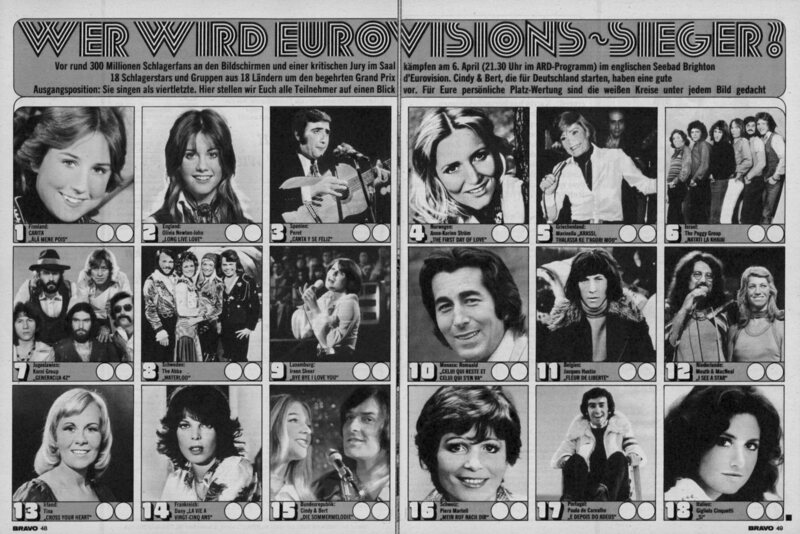 One of them was in "Die aktuelle Schaubude". 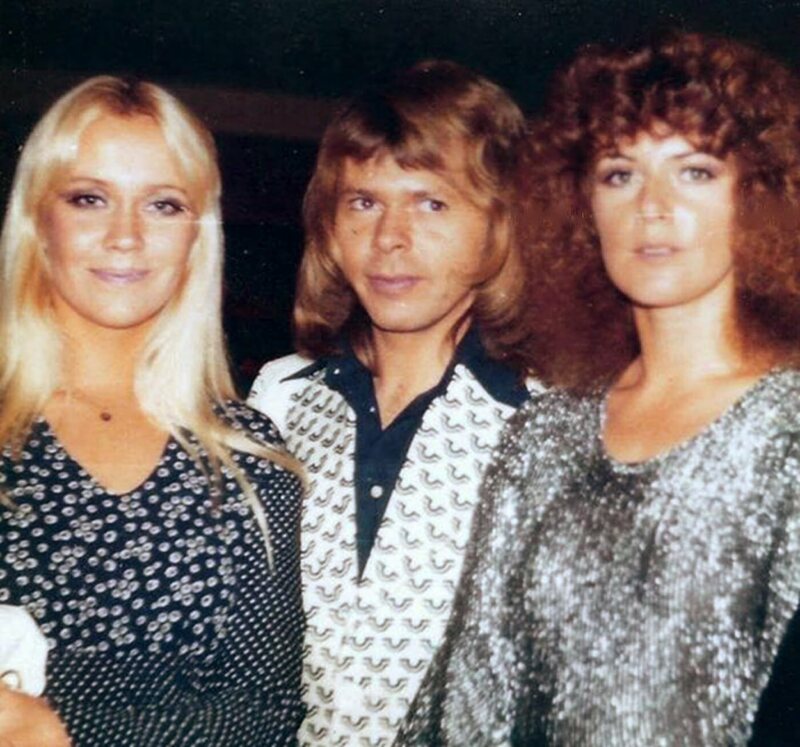 On April 17th, ABBA came to Paris for three days. 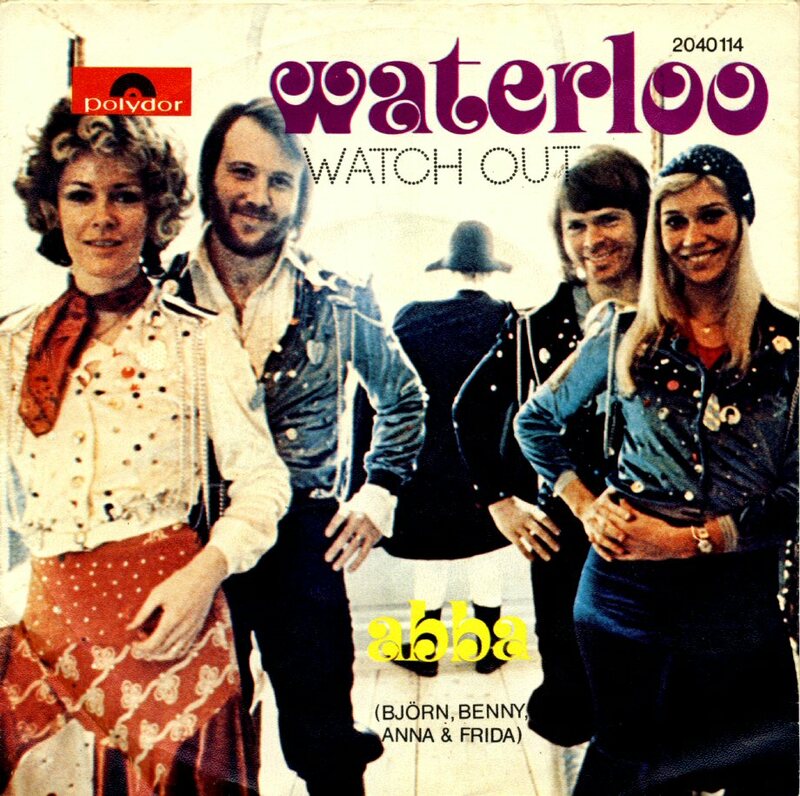 They promoted "Waterloo" on TV and radio RTL. 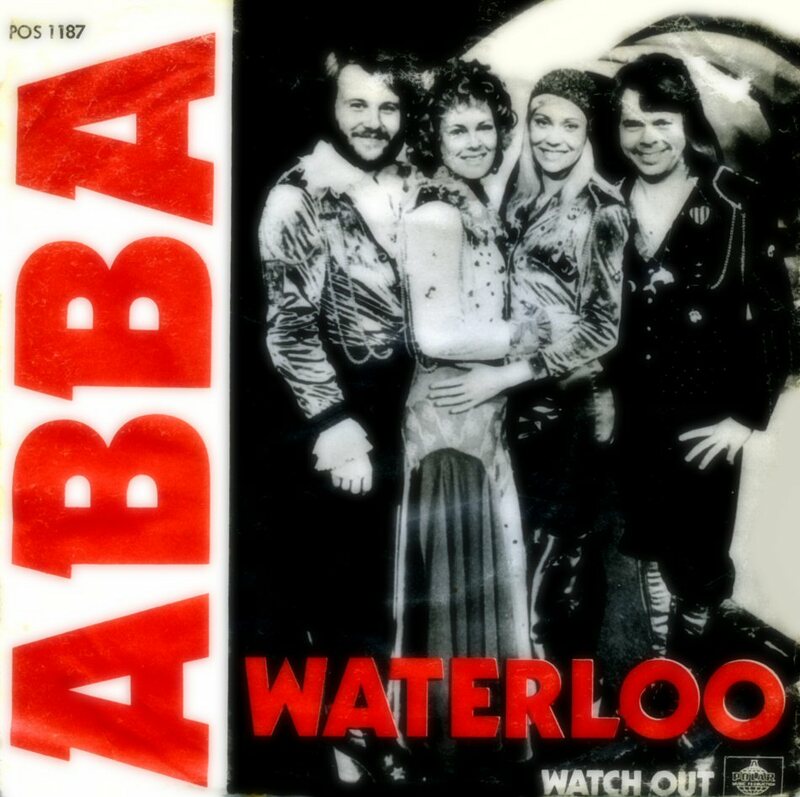 In the UK "Waterloo" entered the chart on April 20th at#17 and stayed there for 9 weeks peaking at #1 (May 4th and 11th). 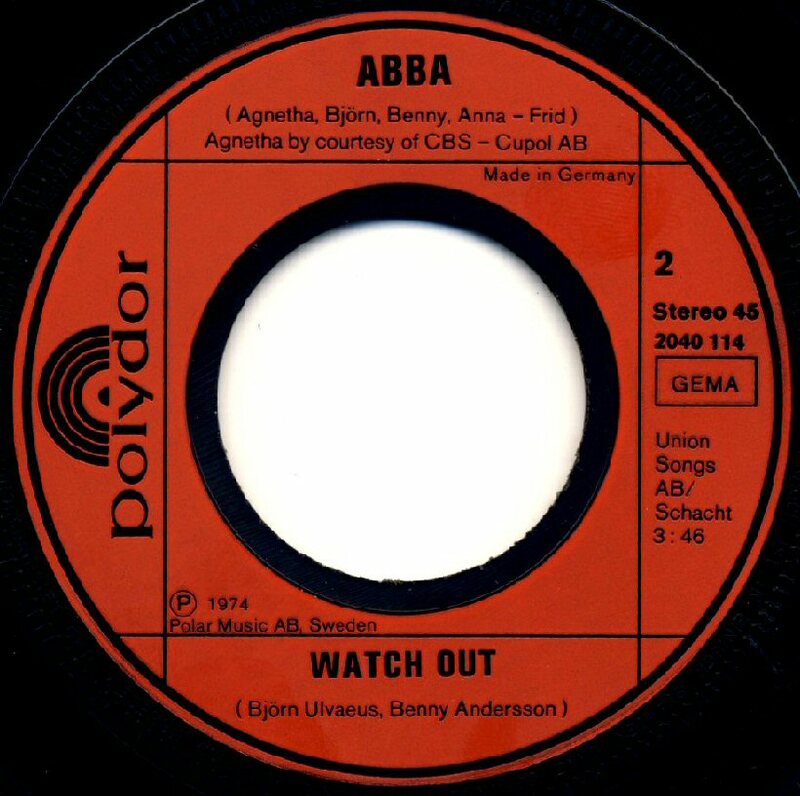 The single "Waterloo"/"Watch Out" entered the German chart on April 29th, 1974 where it reached the top on June 10th, staying there for 4 weeks. 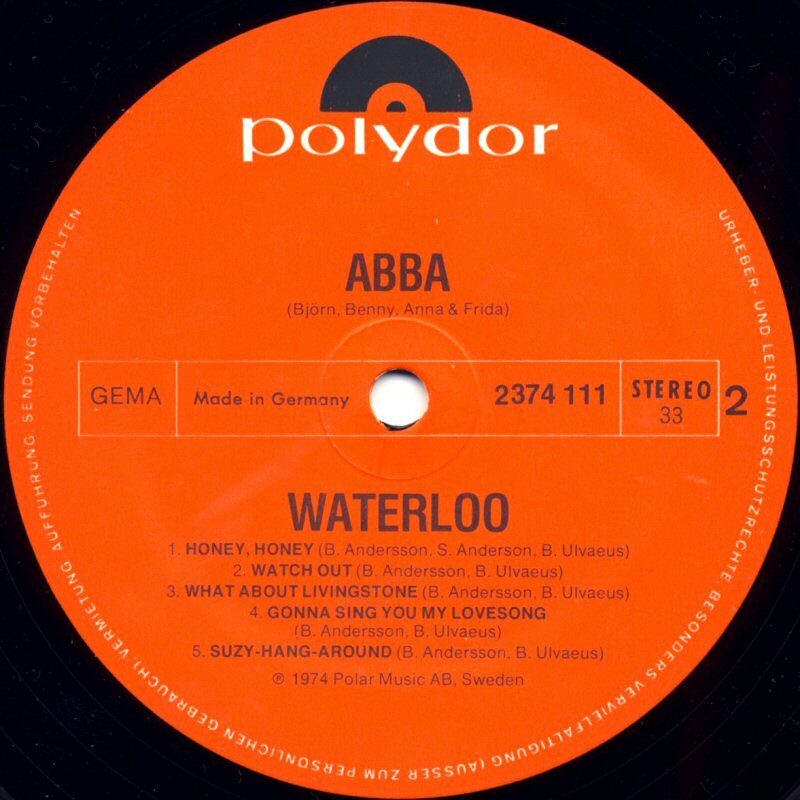 Totally "Waterloo" spent 25 weeks on the German chart. 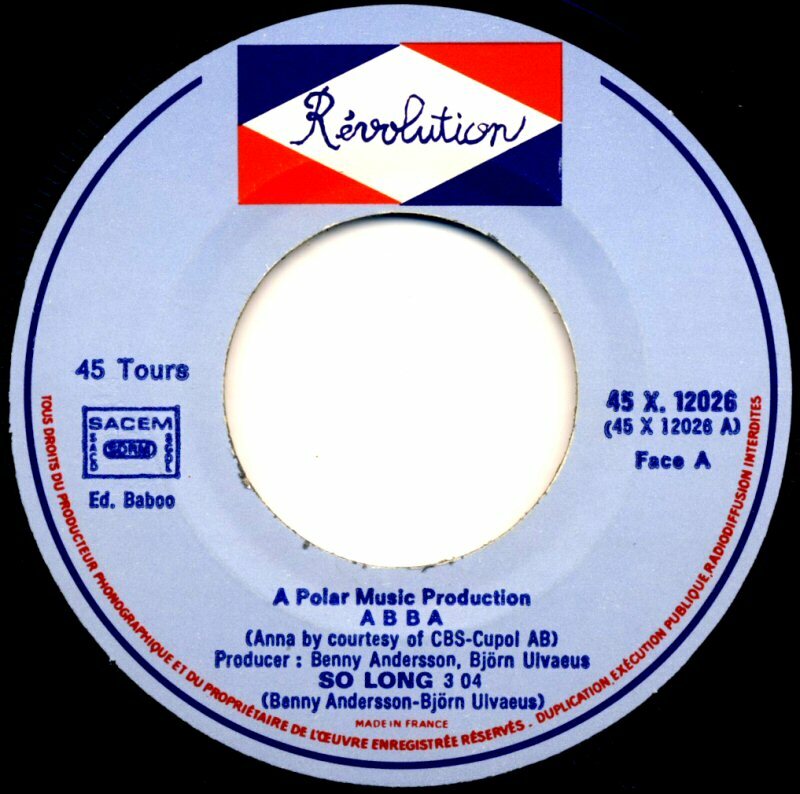 In USA the single was released on May 3rd, 1974 and it entered the single chart on June 1st, where it stayed for 12 weeks peaking at #6. 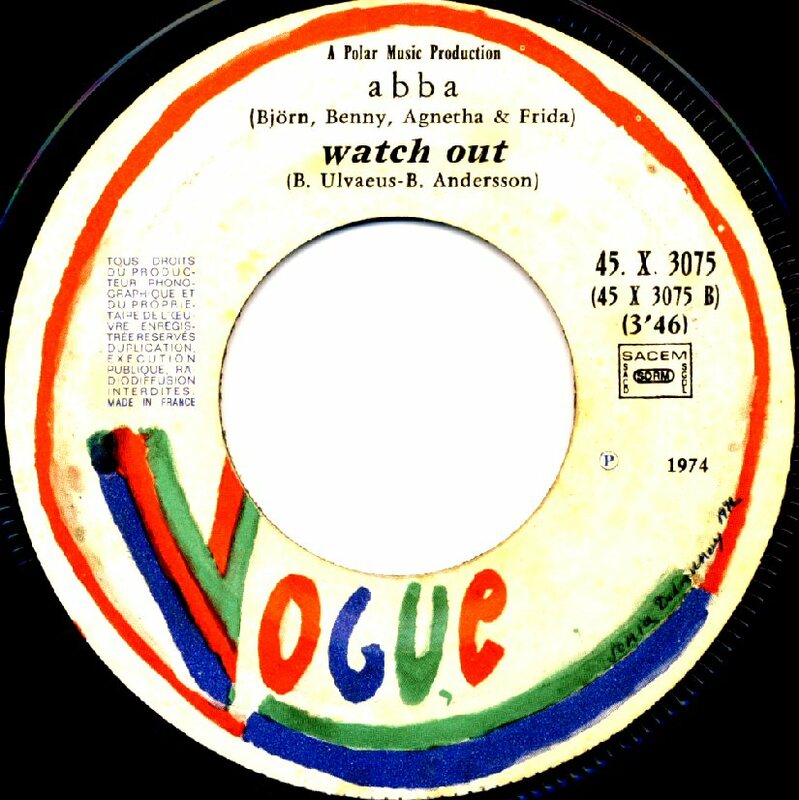 In Italy the single stayed on the chart for 23 weeks reaching#14. 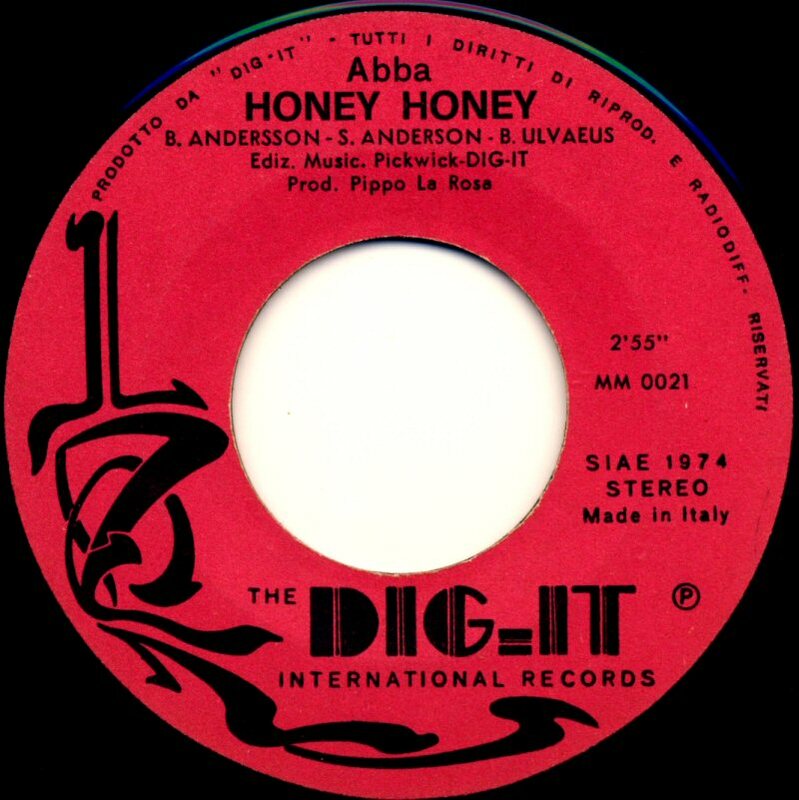 The Italian single featured "Honey Honey" on the side B. 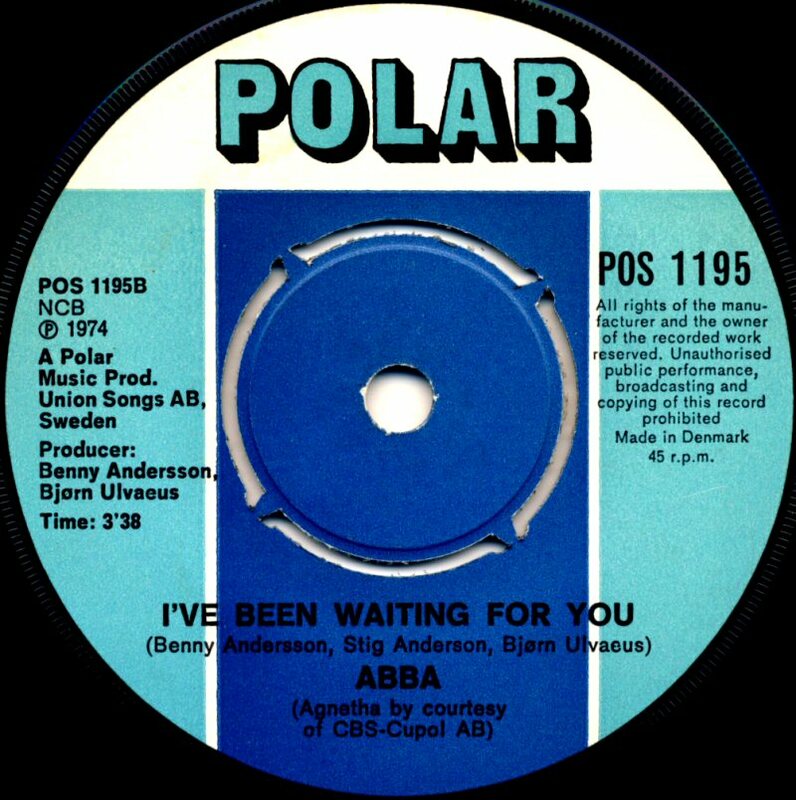 In Austria the single appeared on the chart on May 15th and stayed there for 20 weeks reaching #2. 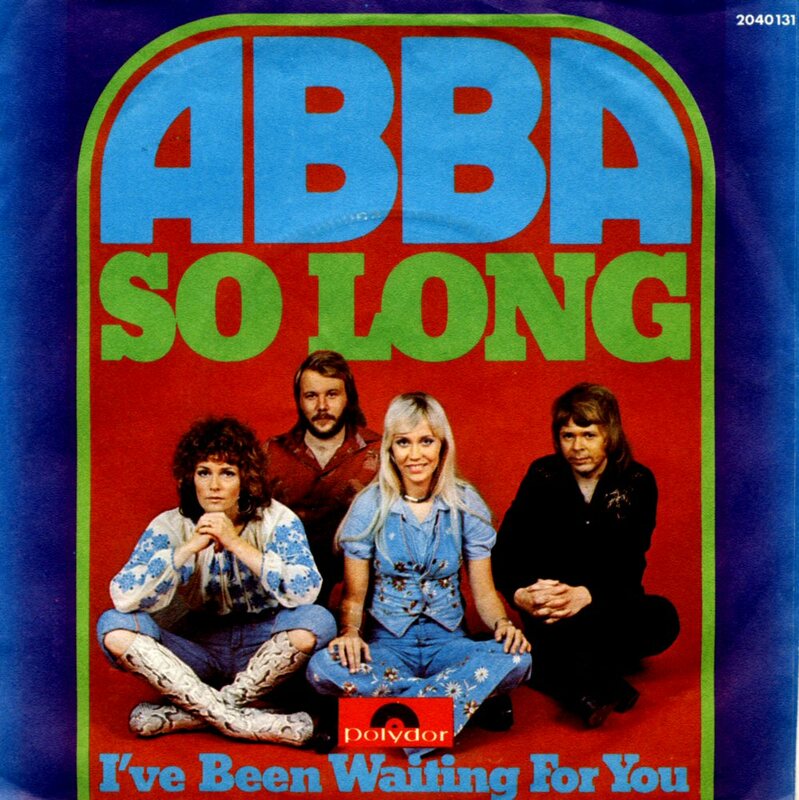 Even in Spain the single was successful and stayed on the chart for 15 weeks with #3 as the highest position. 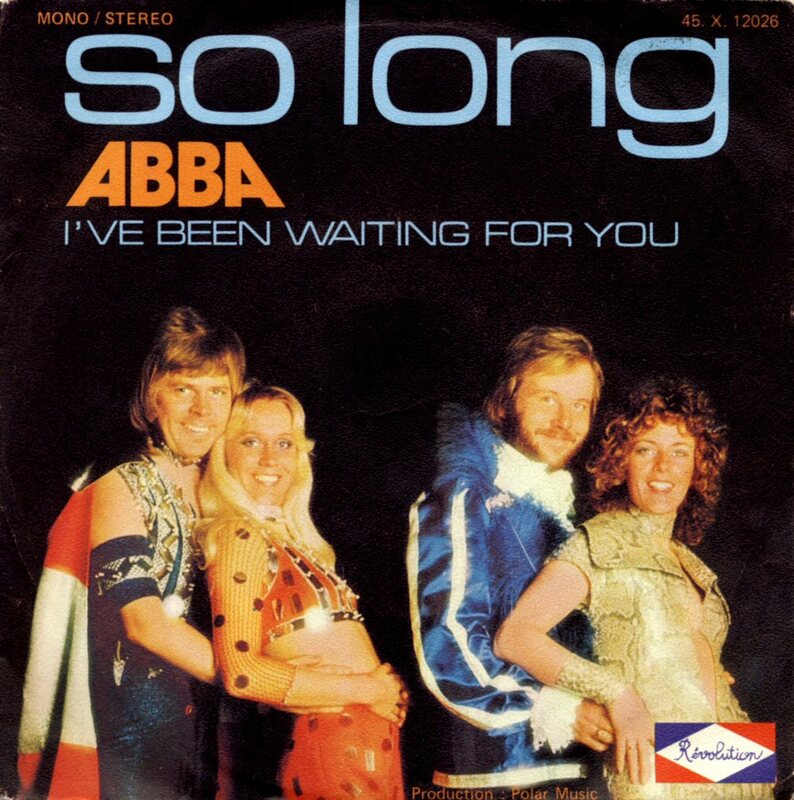 In France the single reaching #3, in Belgium #1. 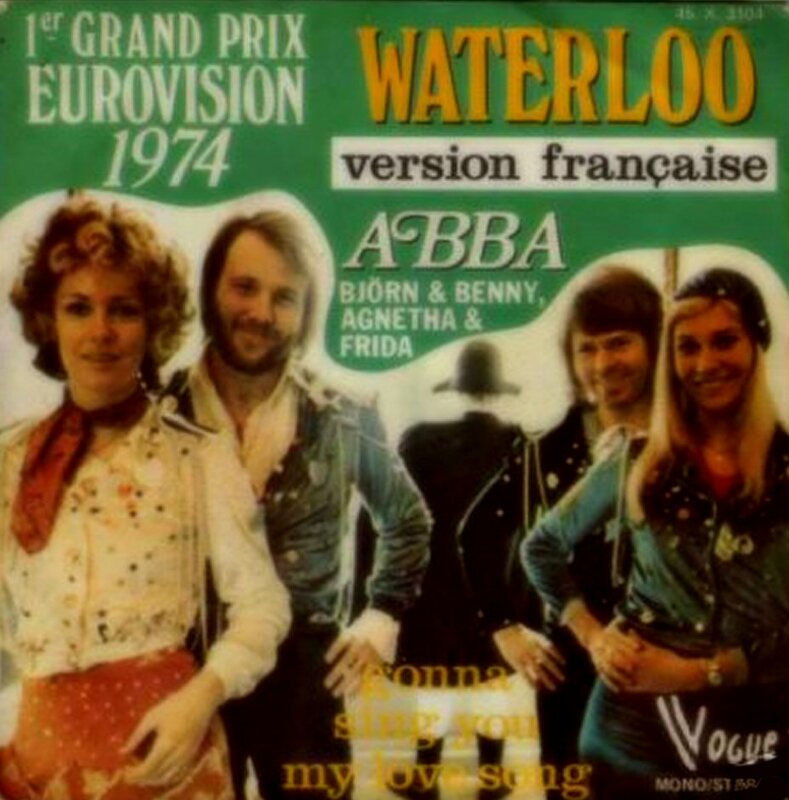 An alternative single release in France featured a French language version of "Waterloo" b/w "Gonna Sing You My Lovesong". 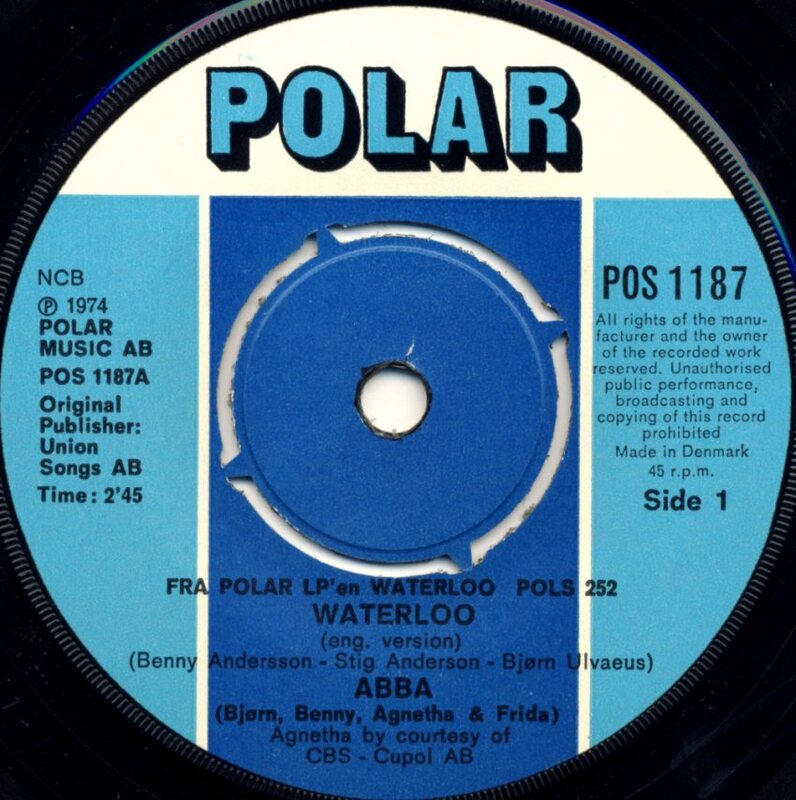 In USA the single "Waterloo" entered the Billboard SP chart on June 22nd, 1974 where it stayed for 12 weeks peaking at #6. 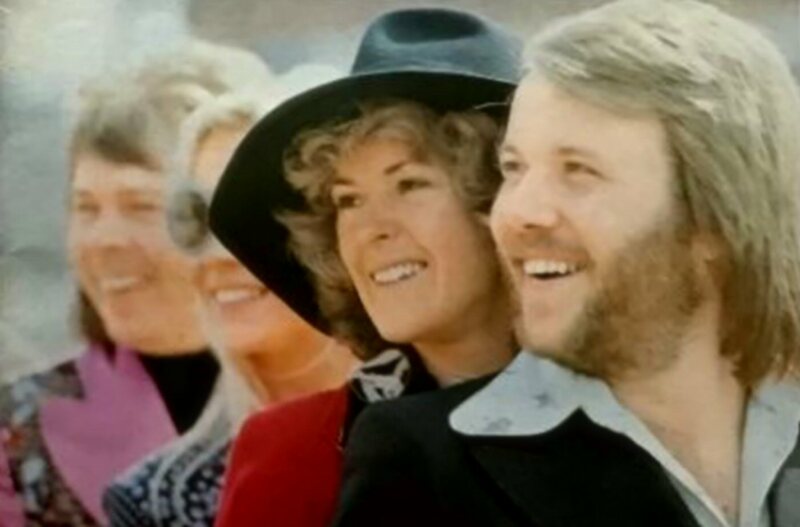 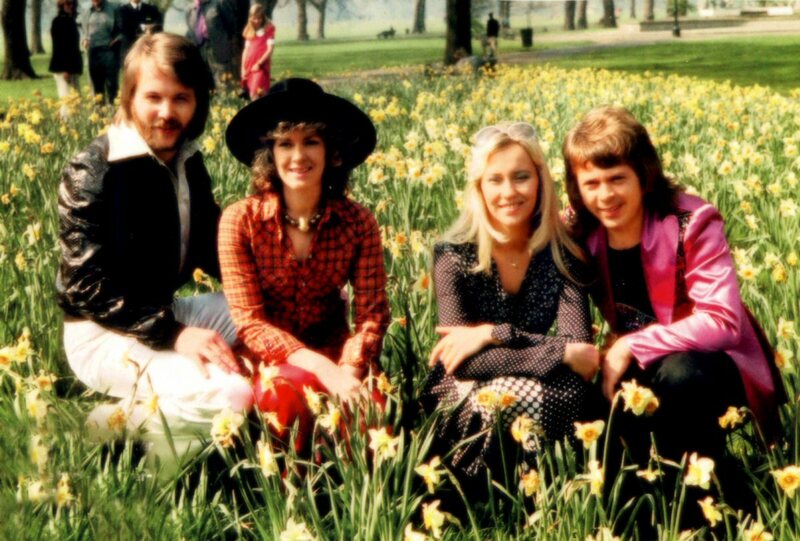 In Holland ABBA promoted "Waterloo" in two TV shows: "The Eddy Becker Show" and "Top Pop" at the end of April. 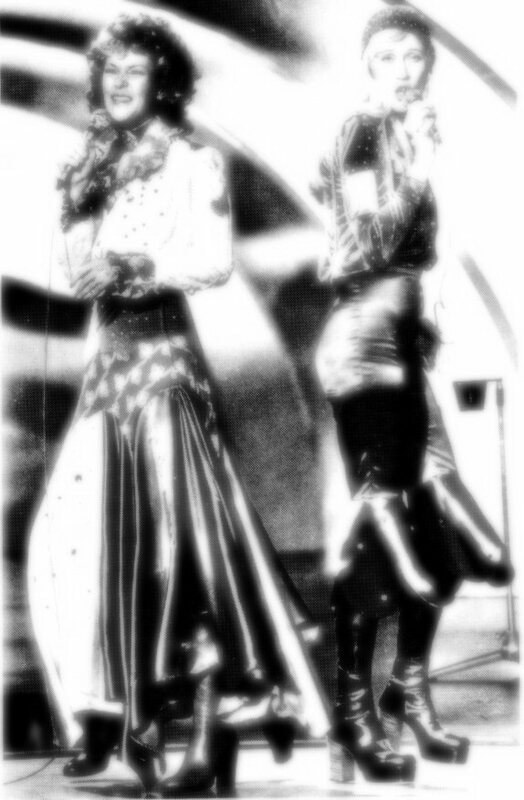 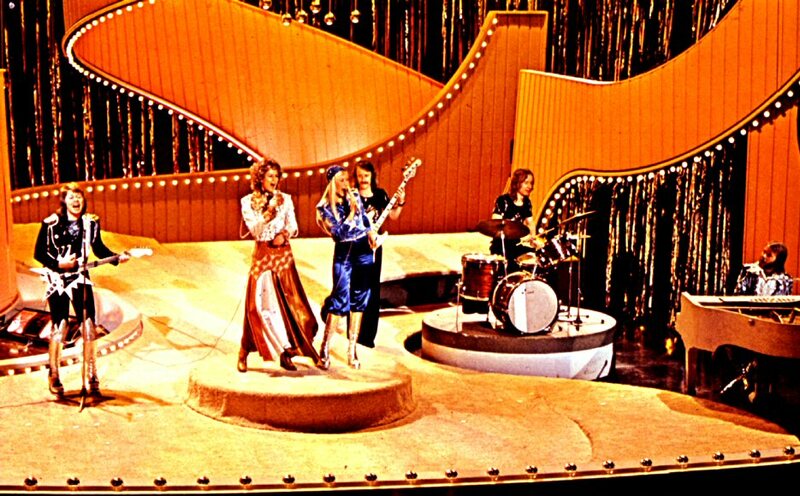 "Toppop" broadcasted live on April 29th, 1974. 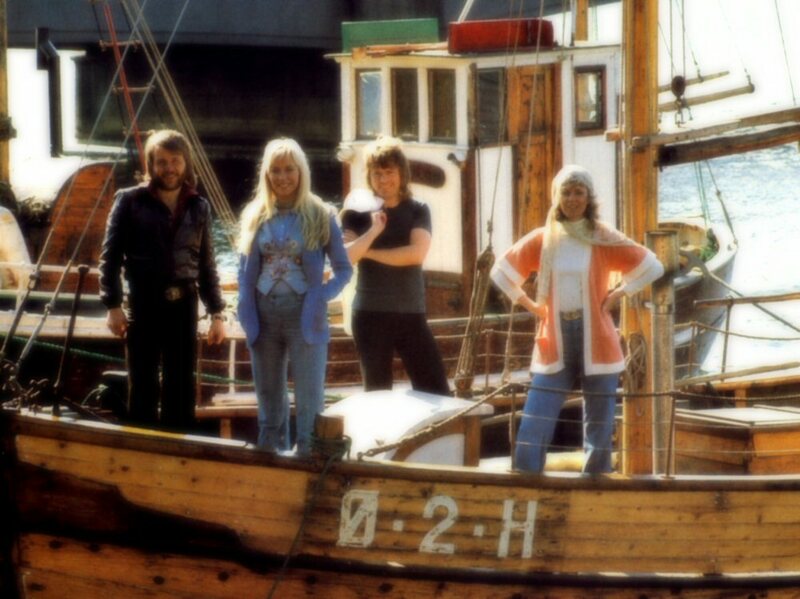 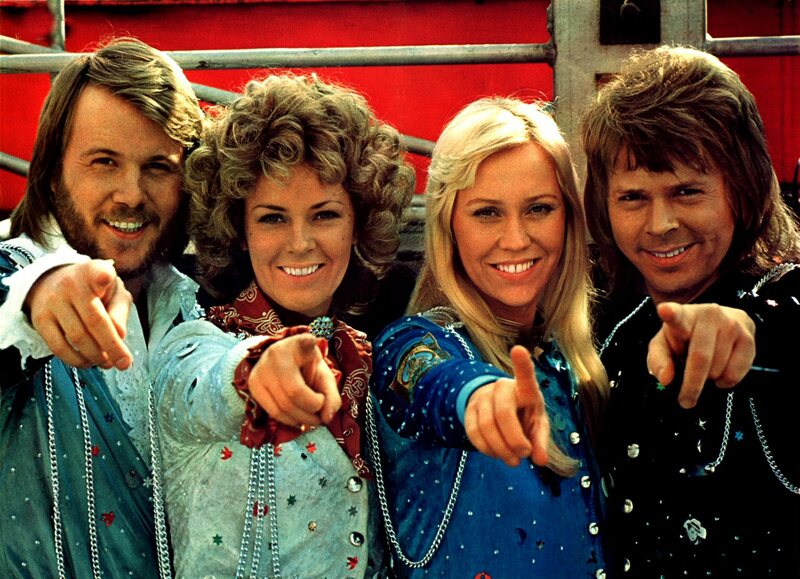 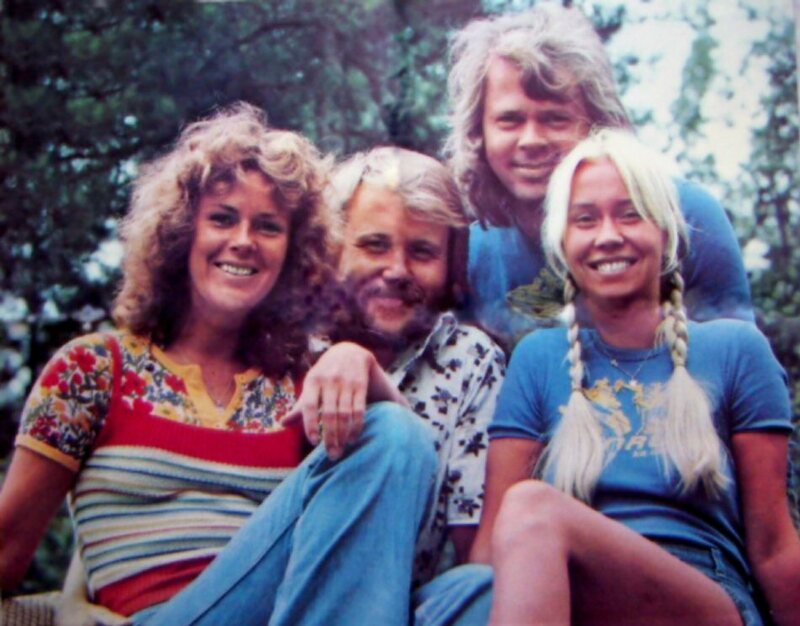 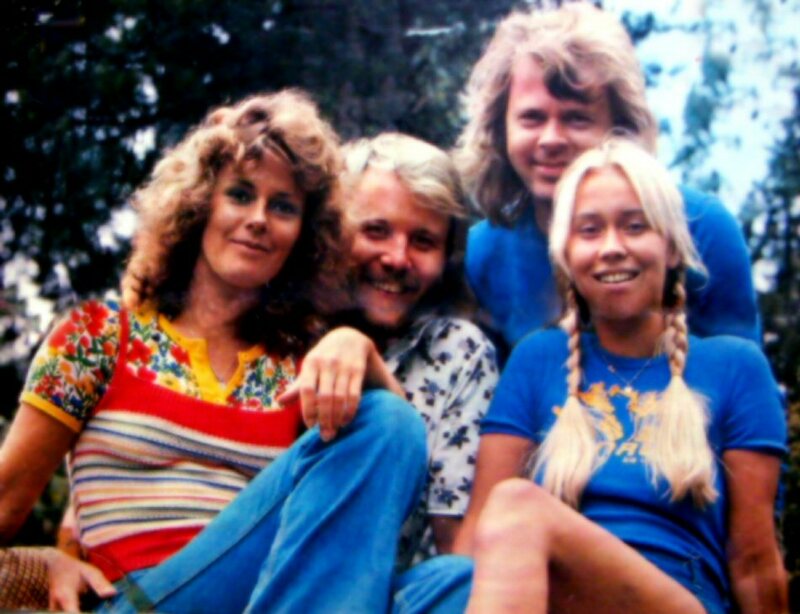 Stikkan announced on April 16th that ABBA folkpark's tour 74 in Sweden was cancelled because of the lack of time. 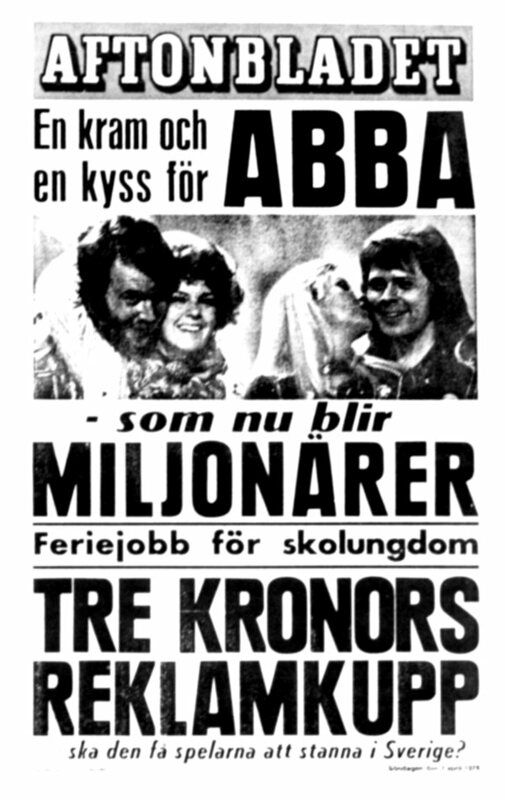 It caused strong reactions in the Swedish press. 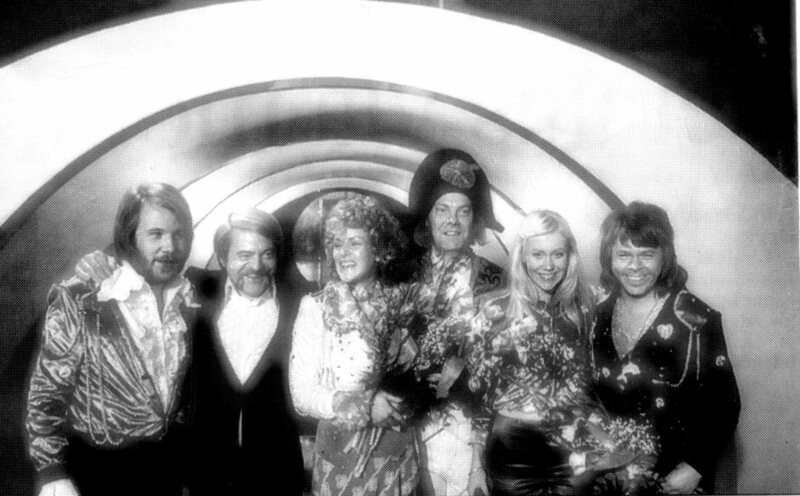 On April 24th, ABBA had a press meeting at the disco Bonaparte in Copenhagen (Denmark). 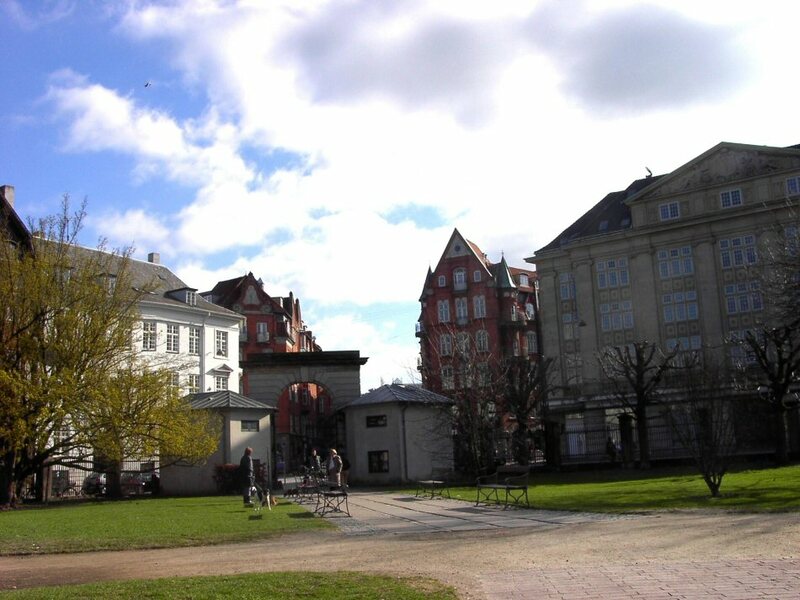 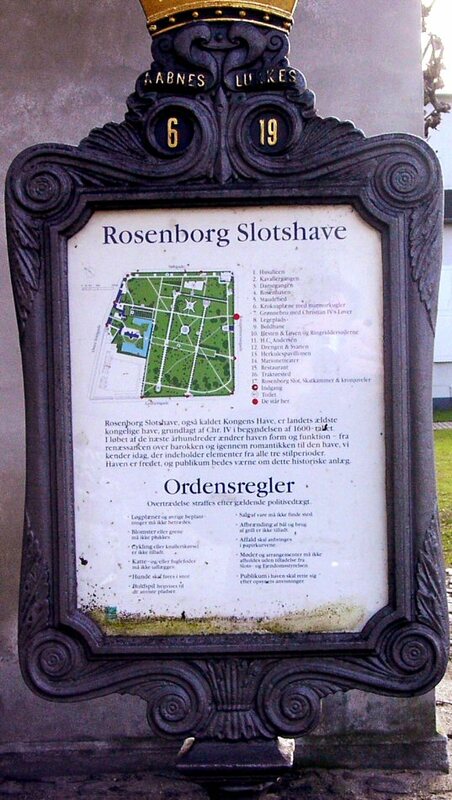 Even an extended photo session was arranged in the park "Rosenborg Slotshave". 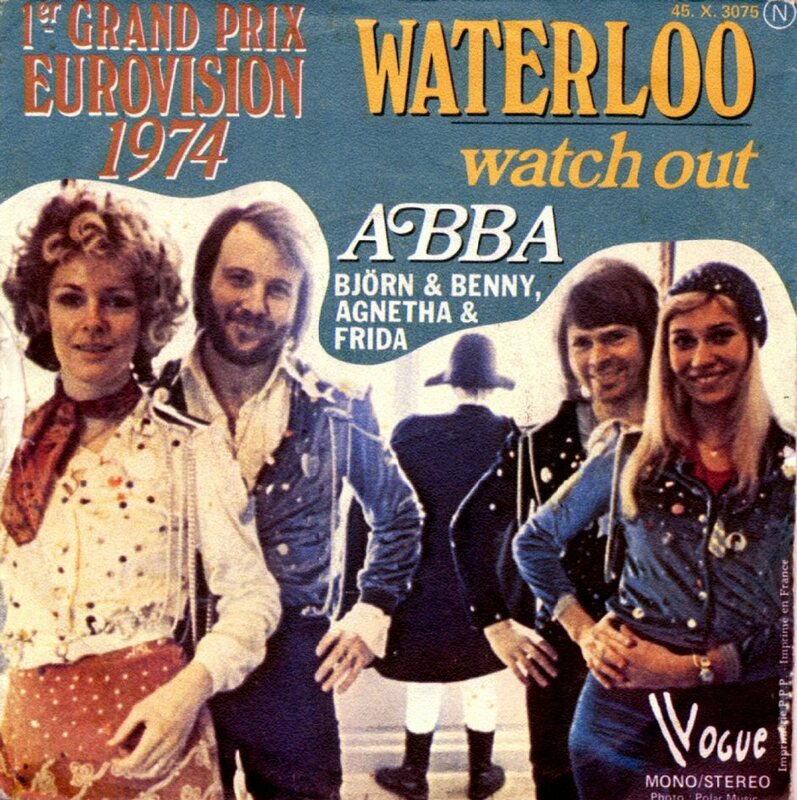 The group was back in the BBC show "Top of the Pops" and performed "Waterloo". 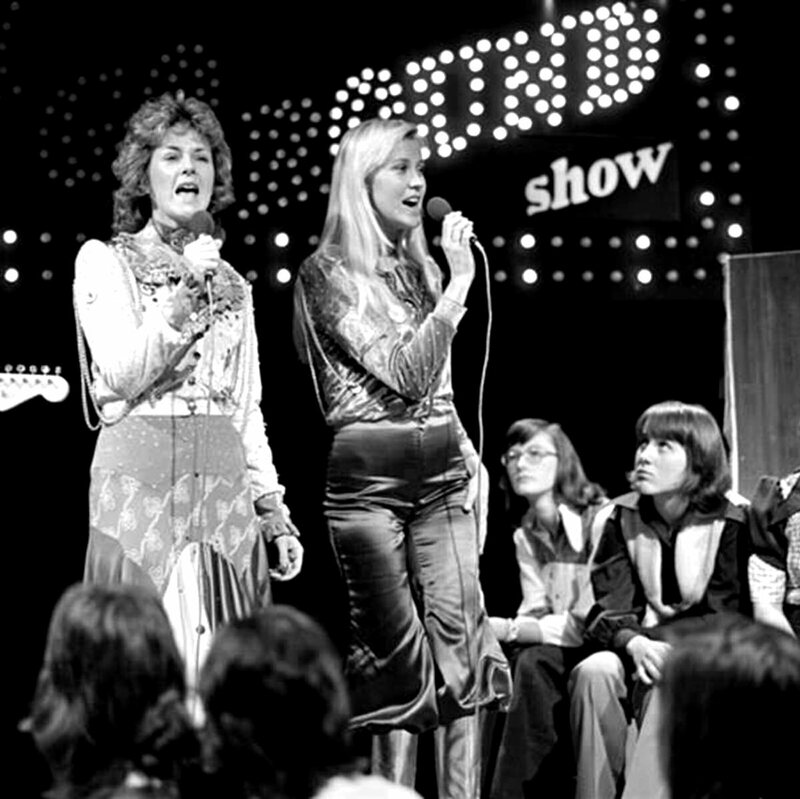 The show was recorded on April 30th and aired on May 2nd, 1974. 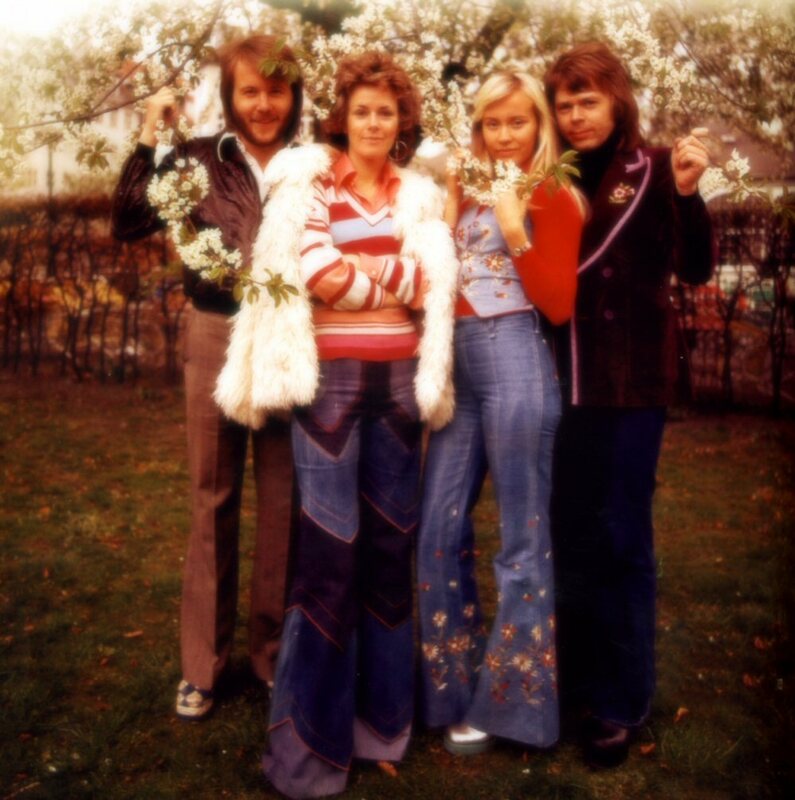 ABBA came to West Germany in the middle of May. 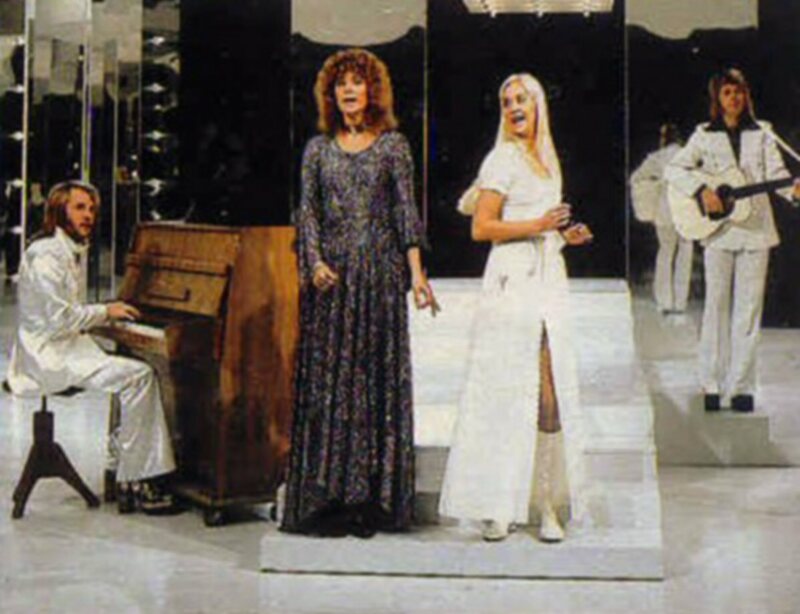 On May 14th they recorded a performance for the German TV Special "Drehscheibe". 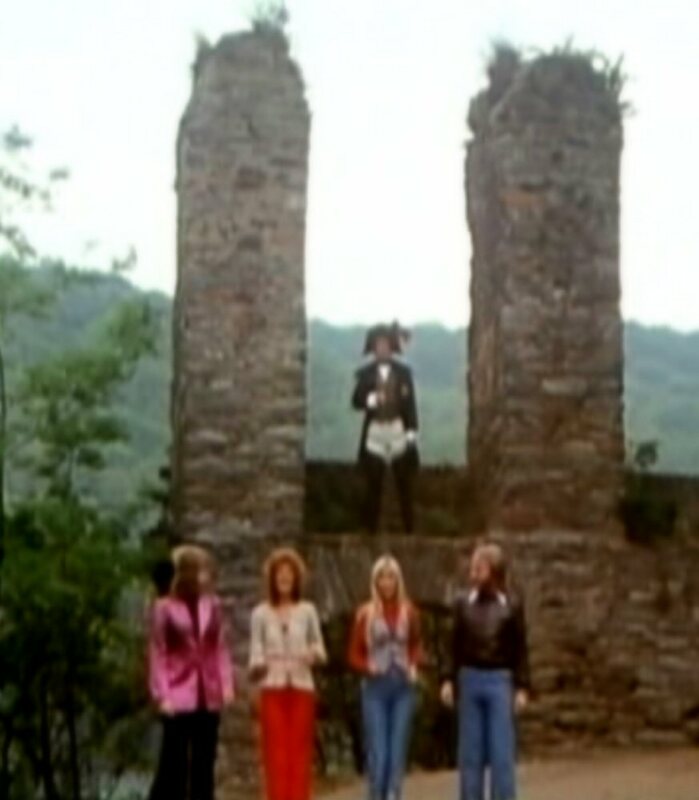 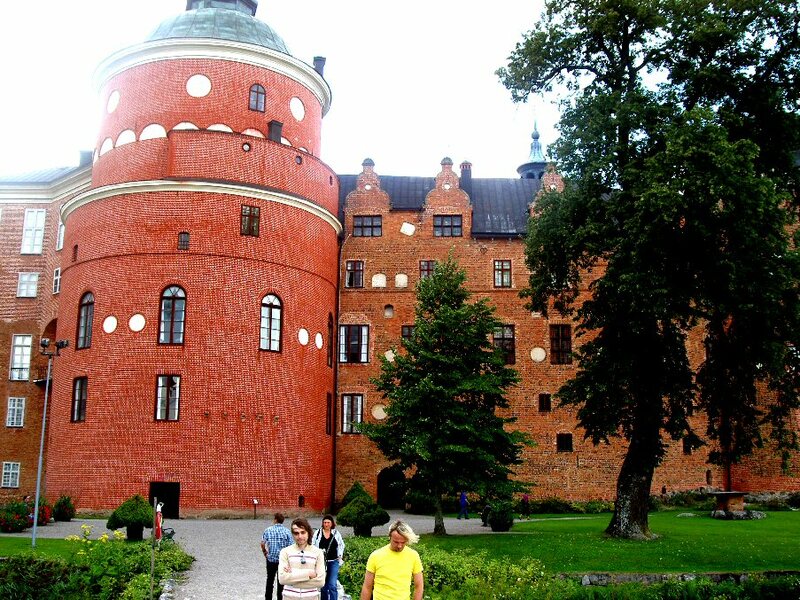 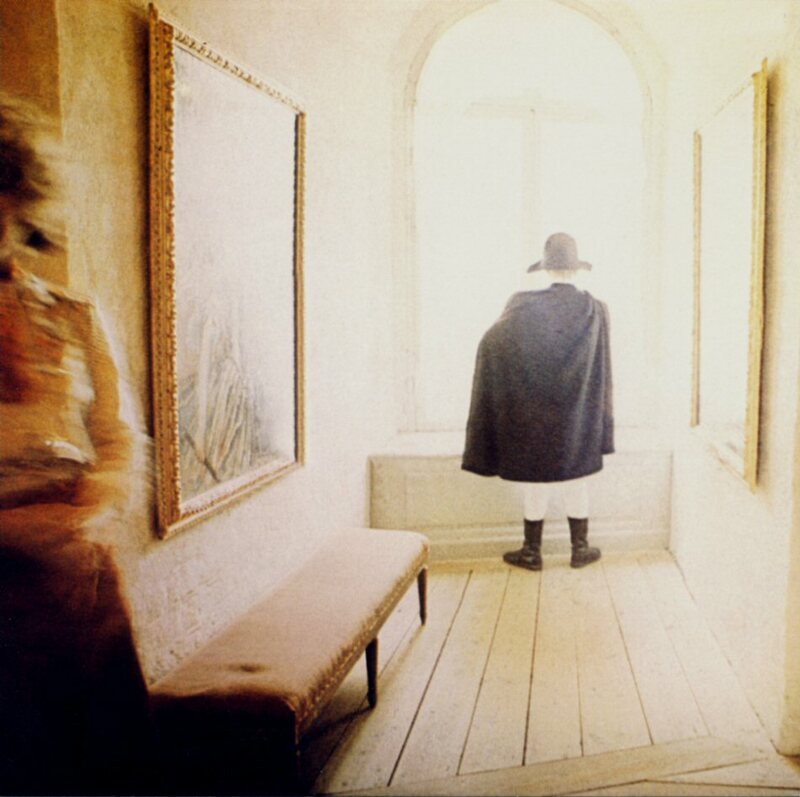 They sang "Waterloo" and the video was recorded in one of the castles outside Frankfurt am Main. 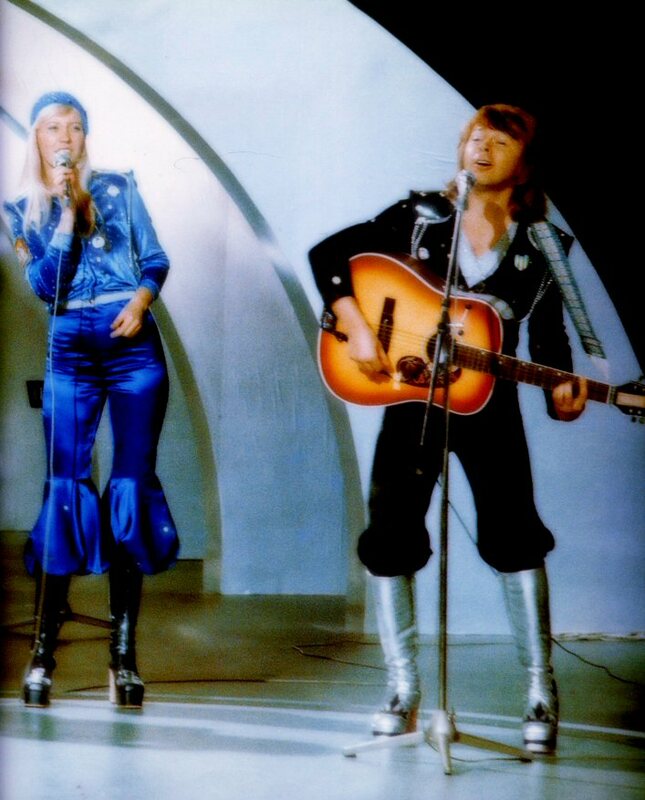 On May 16th they appeared in the TV show "Starparade" where they performed "Waterloo" and "Honey Honey". 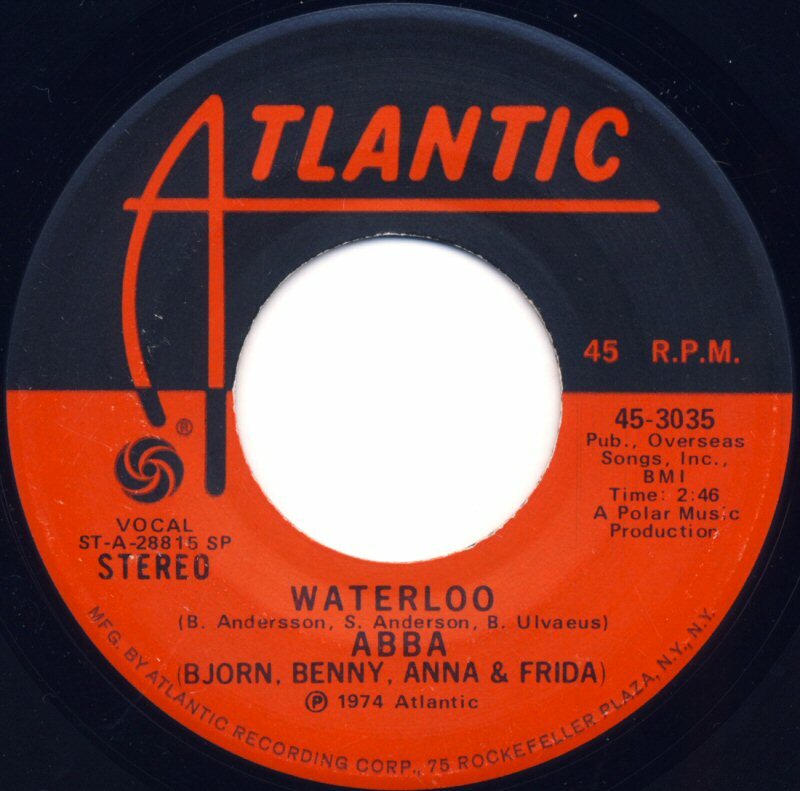 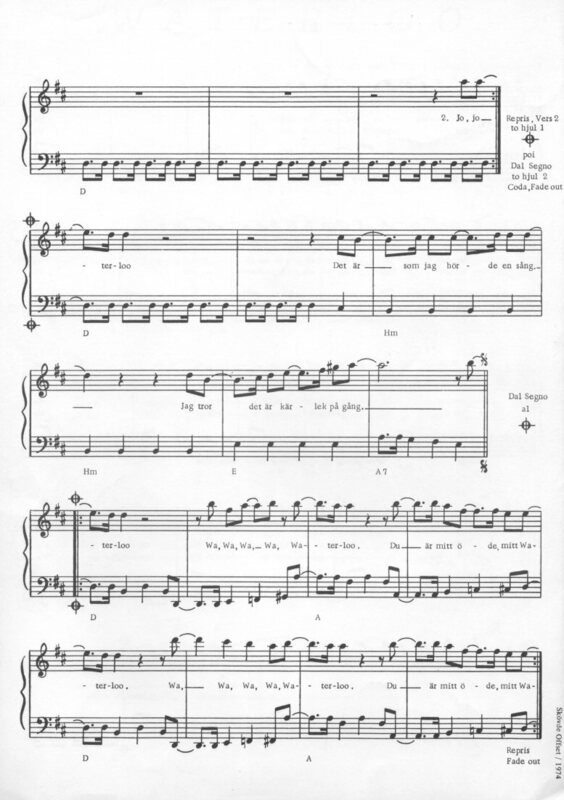 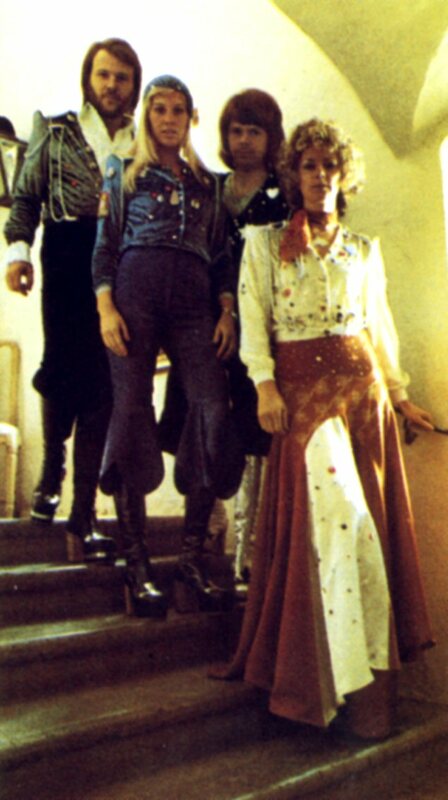 ABBA recorded the German version of "Waterloo" on March 15, 1974 for the future promotion in Germany, one of the most important countries for the group. 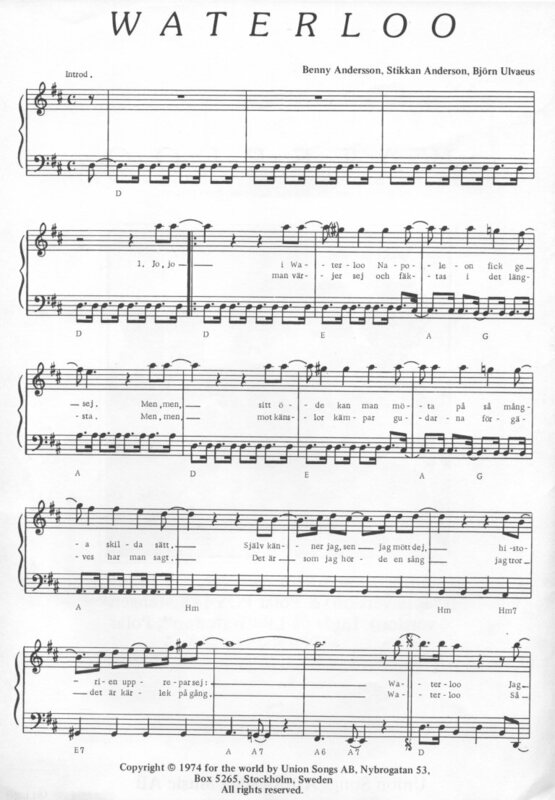 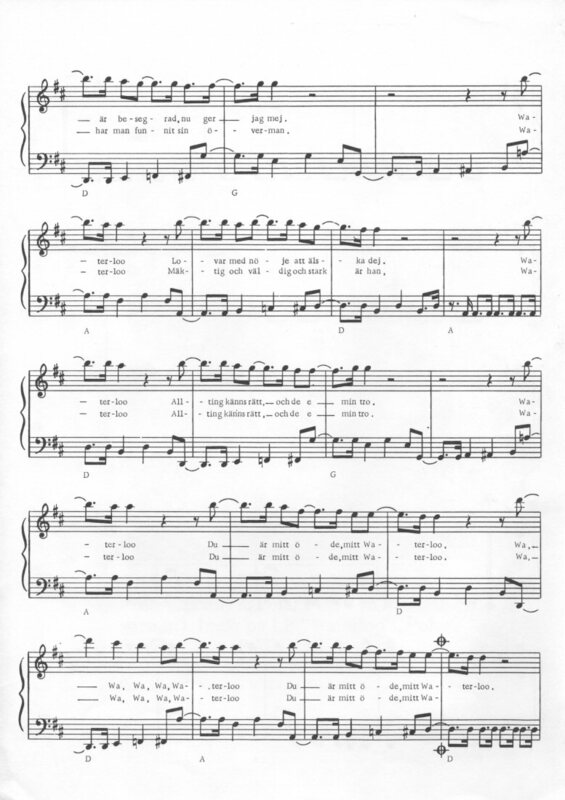 A single containing the German version was released in Germany later in the spring 1974 and the video for German TV was recorded during their visit there. 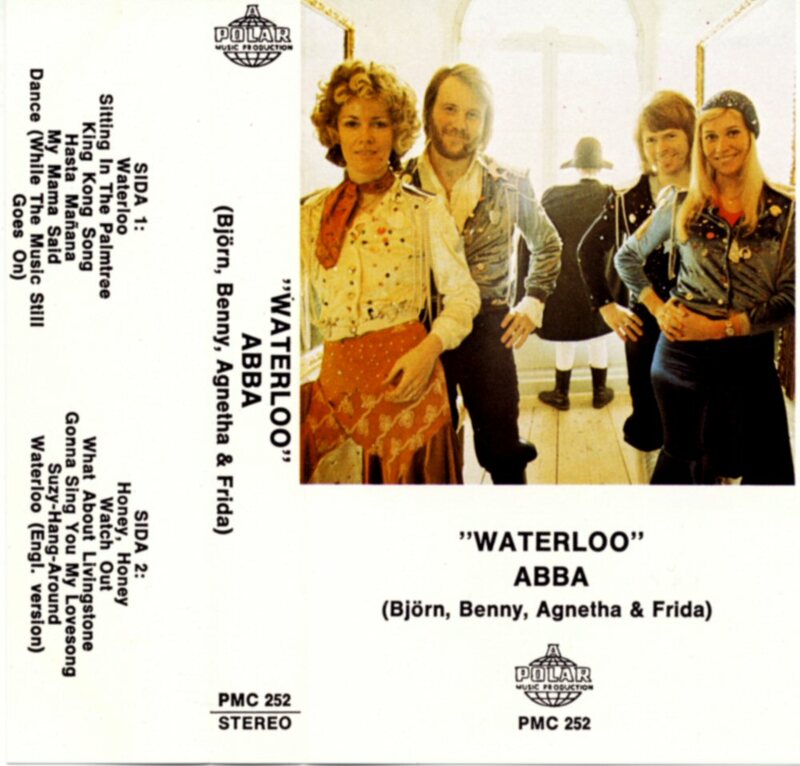 The video for the German version of "Waterloo" ABBA recorded during their promotional stay in Hamburg on May 13-16, 1974. 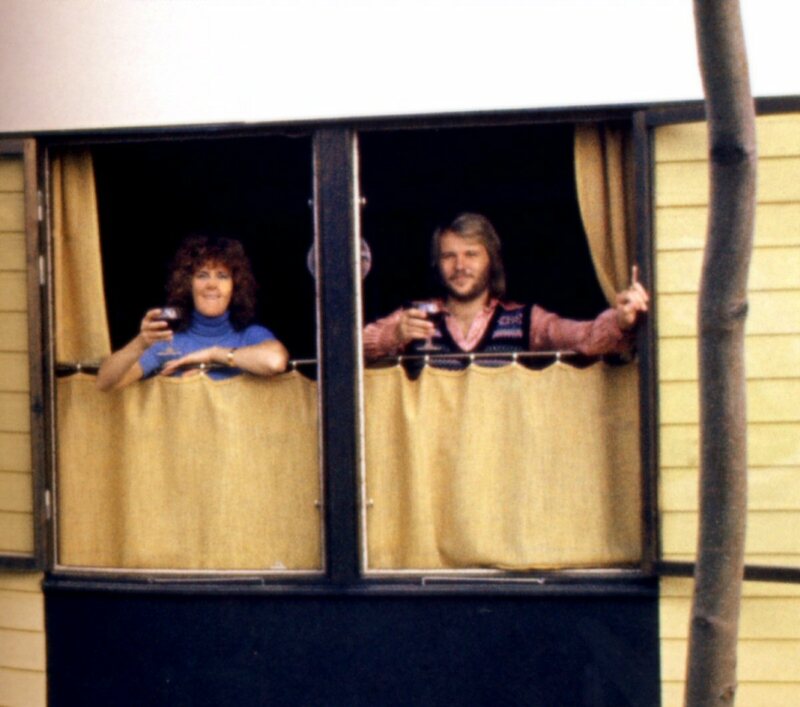 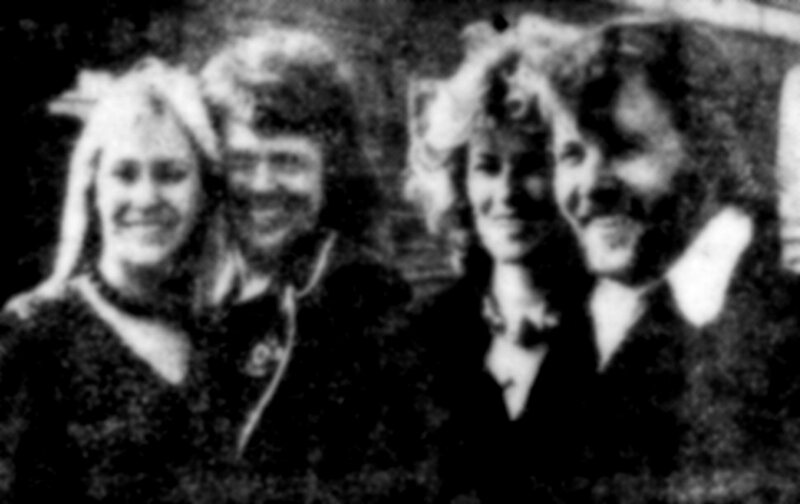 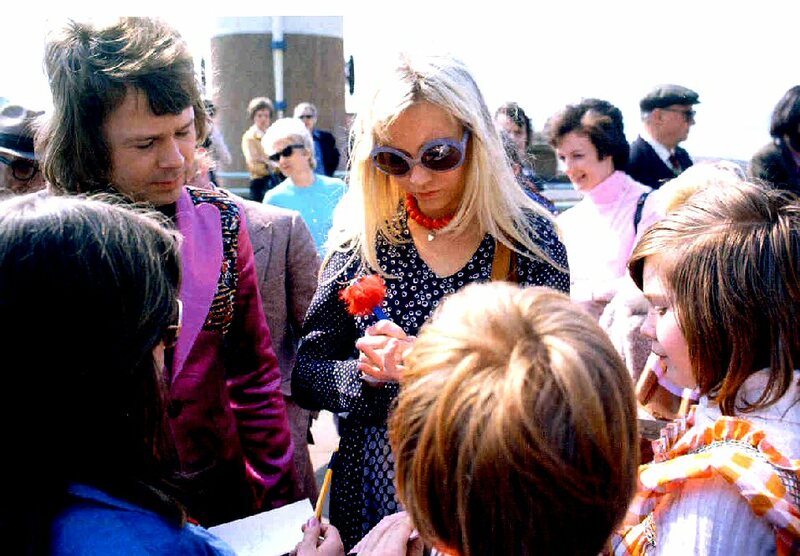 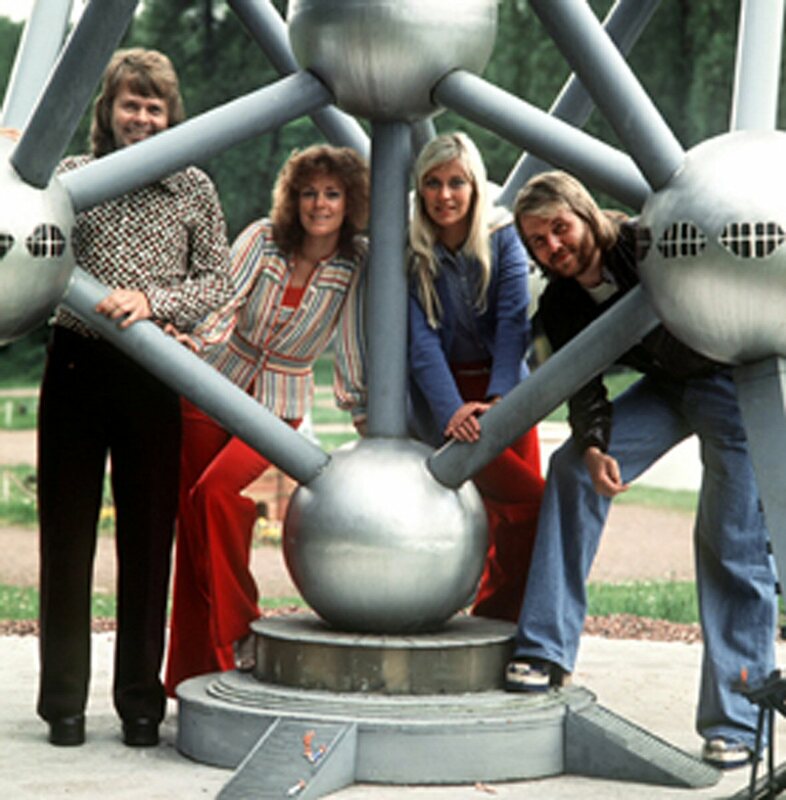 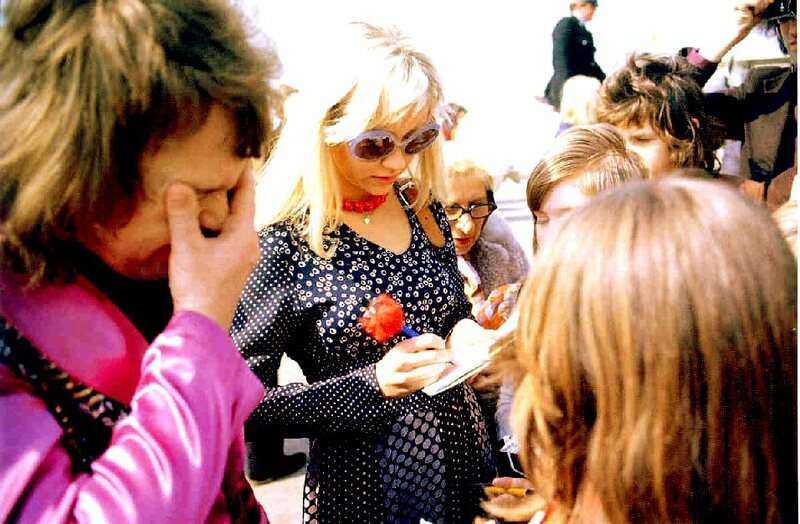 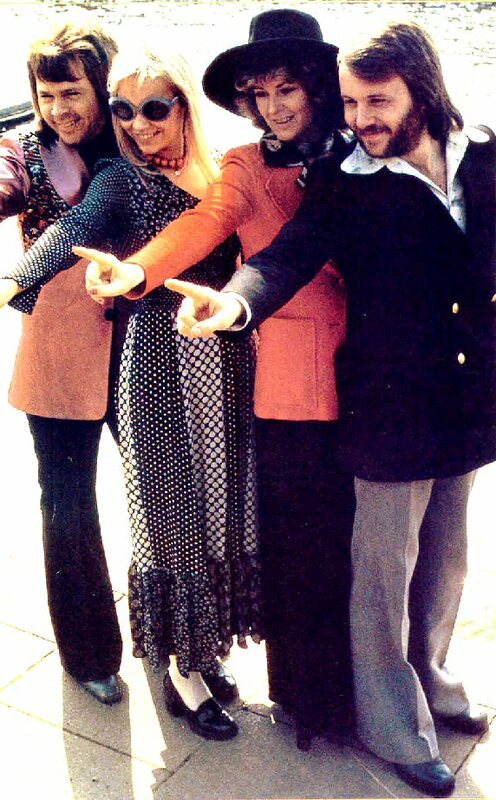 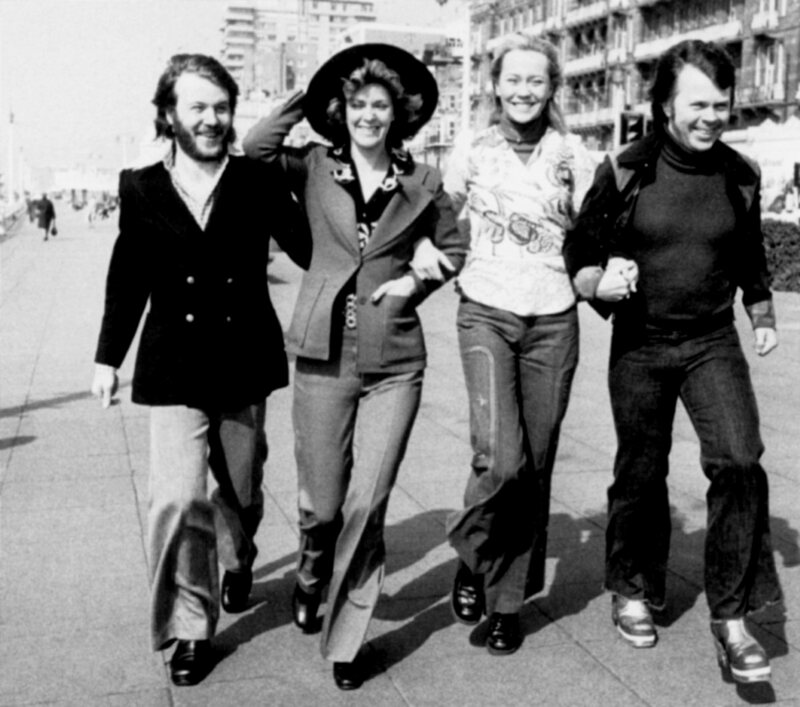 On May 17th ABBA arrived in Belgium during their promotional trip through Europe. 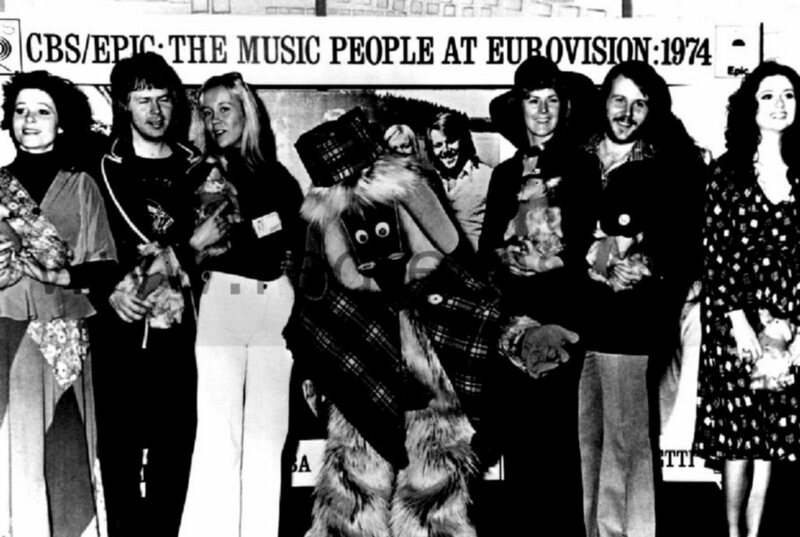 The group paid visit in Waterloo and Brussels. 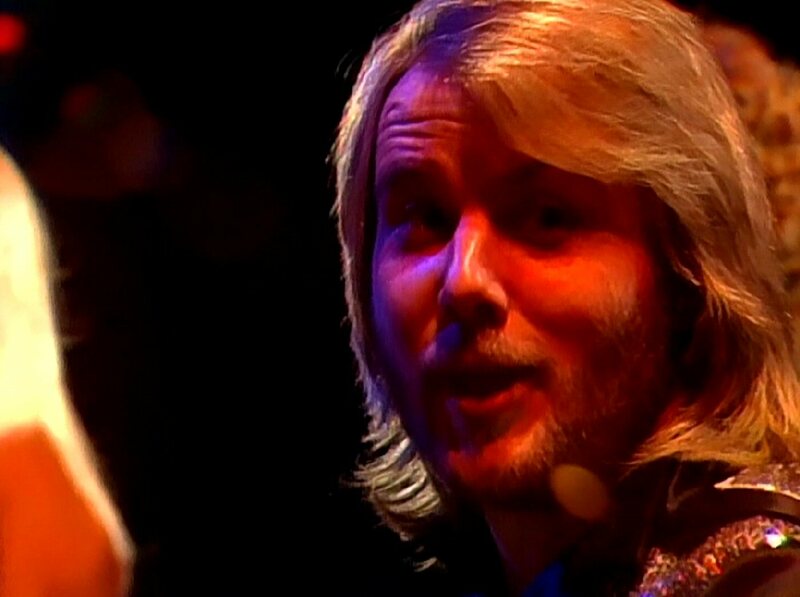 Performance on Belgian TV RTB. 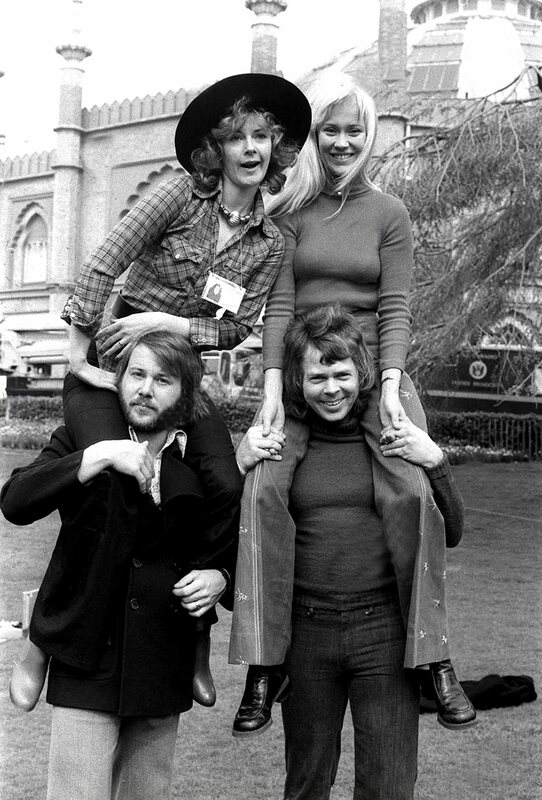 On May 20th, ABBA paid a short promotional visit in Madrid where a TV special was made. 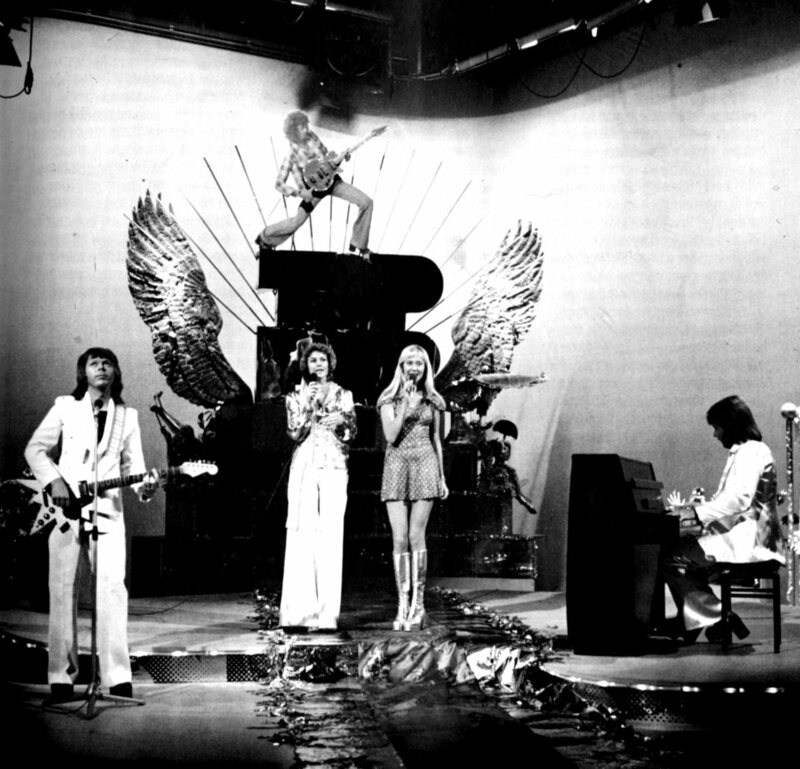 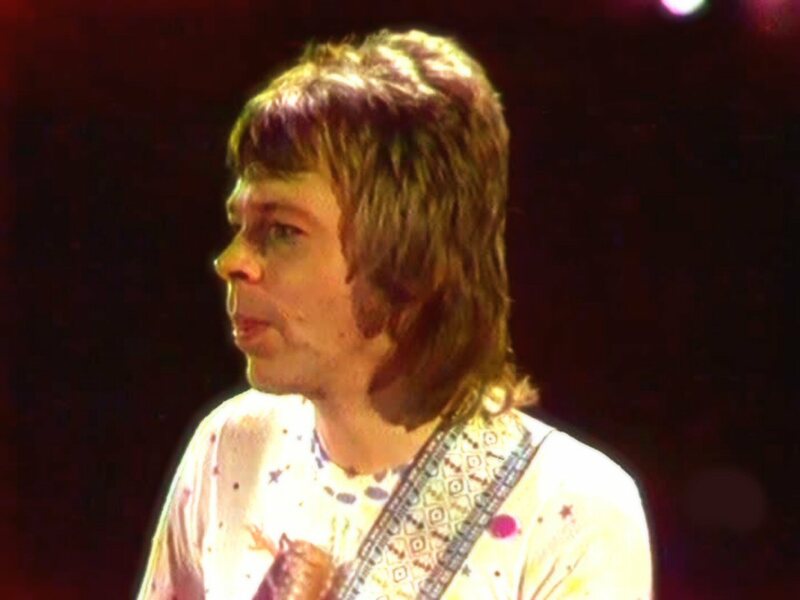 On May 28th, 1974 were in Hamburg and filmed performance of "Honey Honey" for the German TV N3. 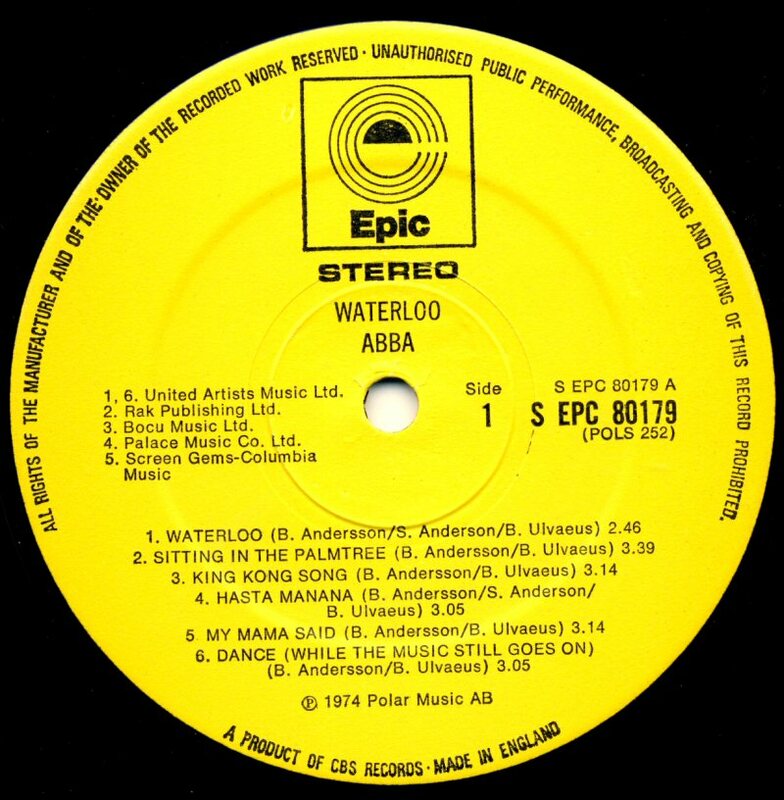 The British record company Epic decided to release "Ring Ring" as the second single after "Waterloo". 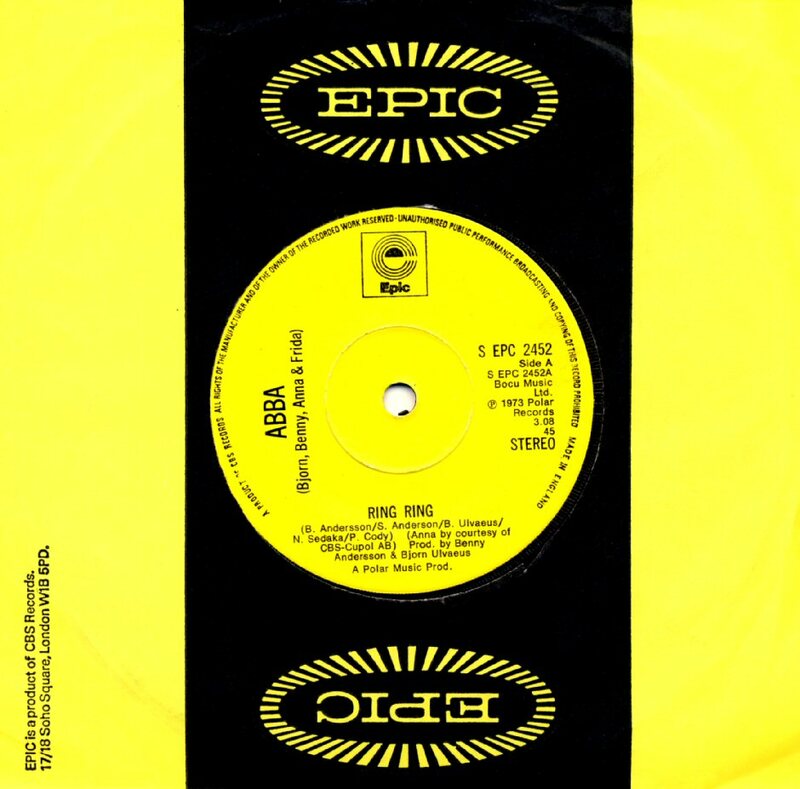 It is hard to understand why Epic was so bullet-headed with releasing "Ring Ring" once again after the total flop in 1973. 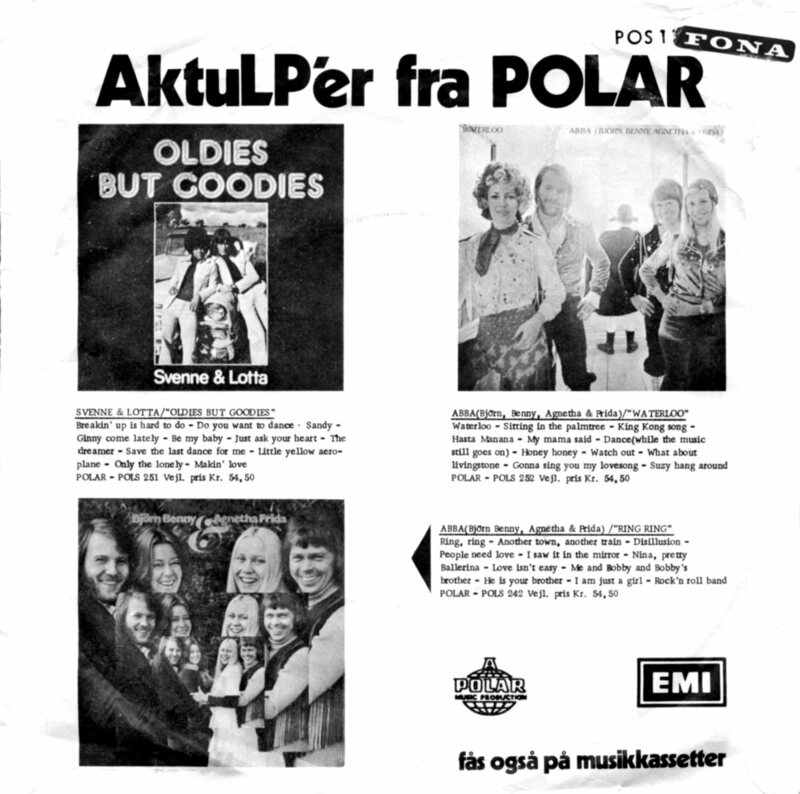 Even if the 1974 version was partly re-recorded and re-arranged but still it was the same song which was more than 1 year old. 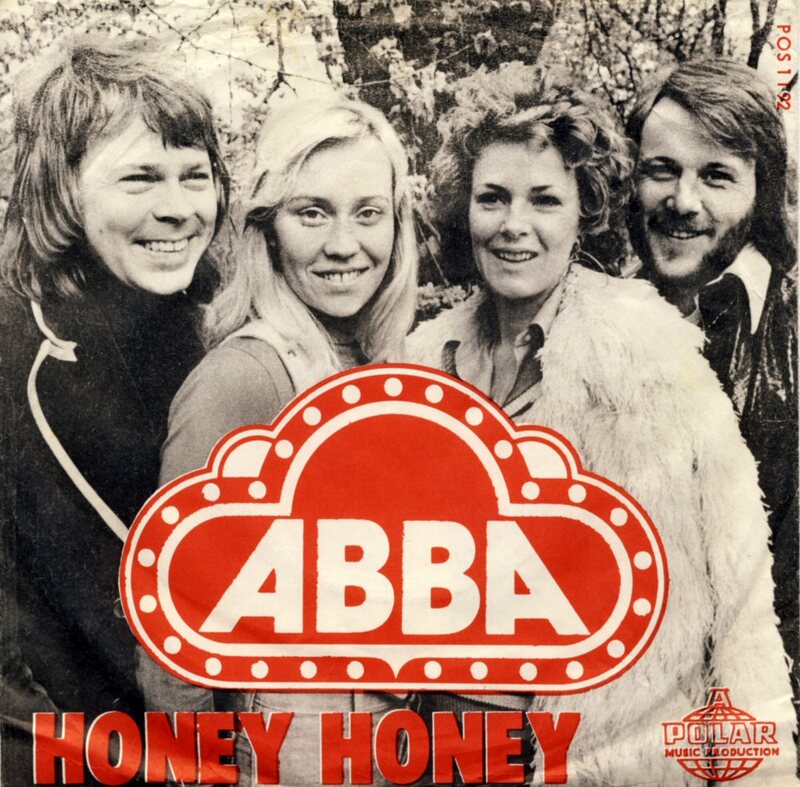 Probably "Honey Honey" which was chosen for the second single in 1974 in many other countries would have been a better choice even in Great Britain. 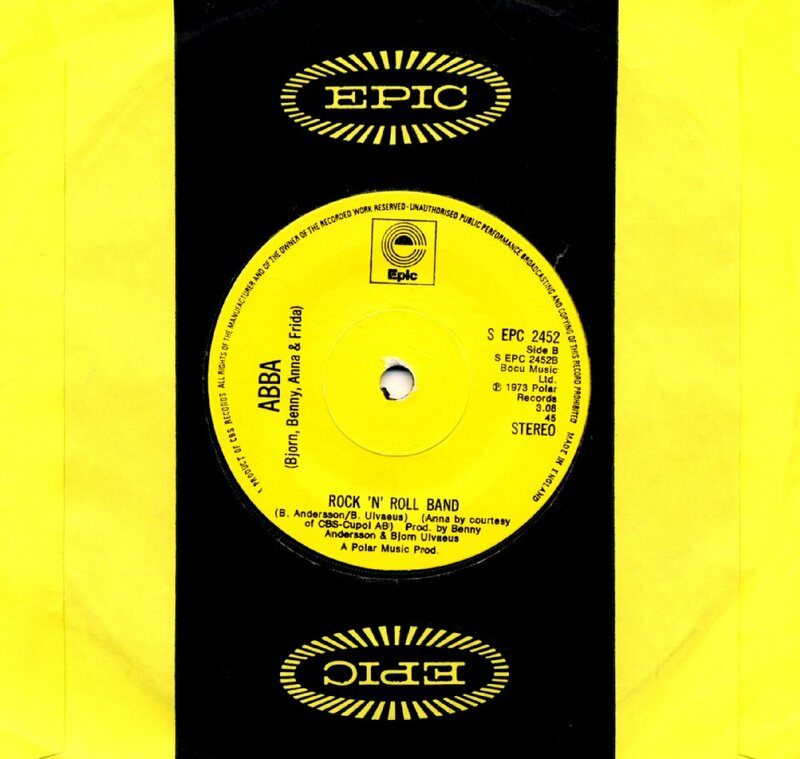 The single "Ring Ring" b/w "Rock'n'Roll Band" entered the UK single chart on July 13th, 1974 where it stayed for 5 weeks reaching #32. 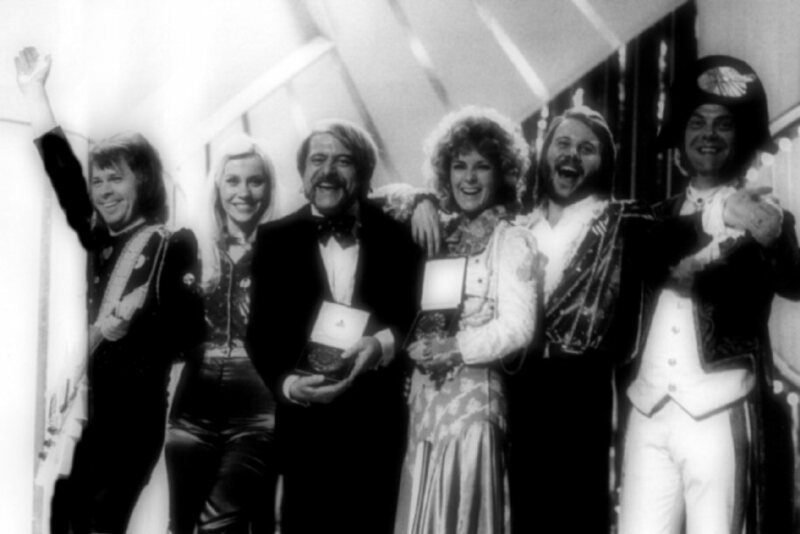 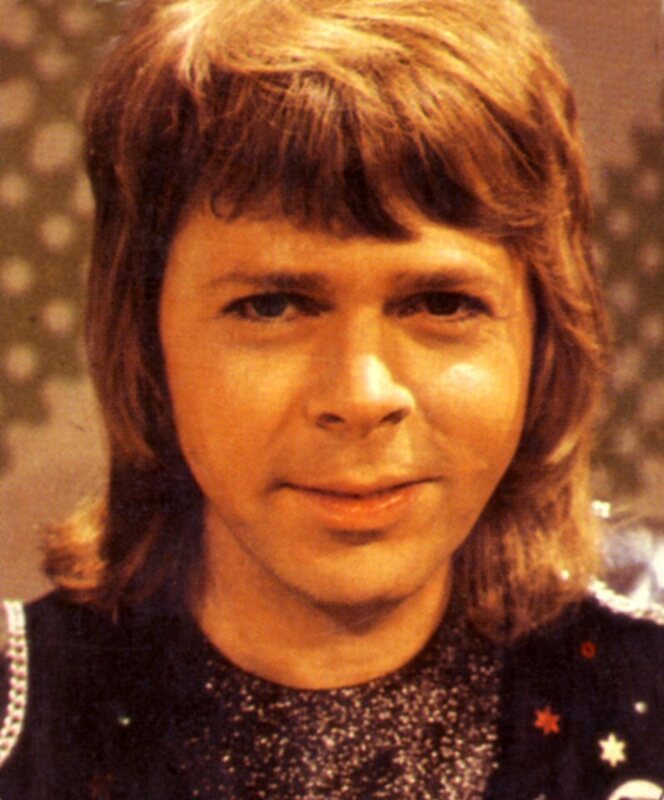 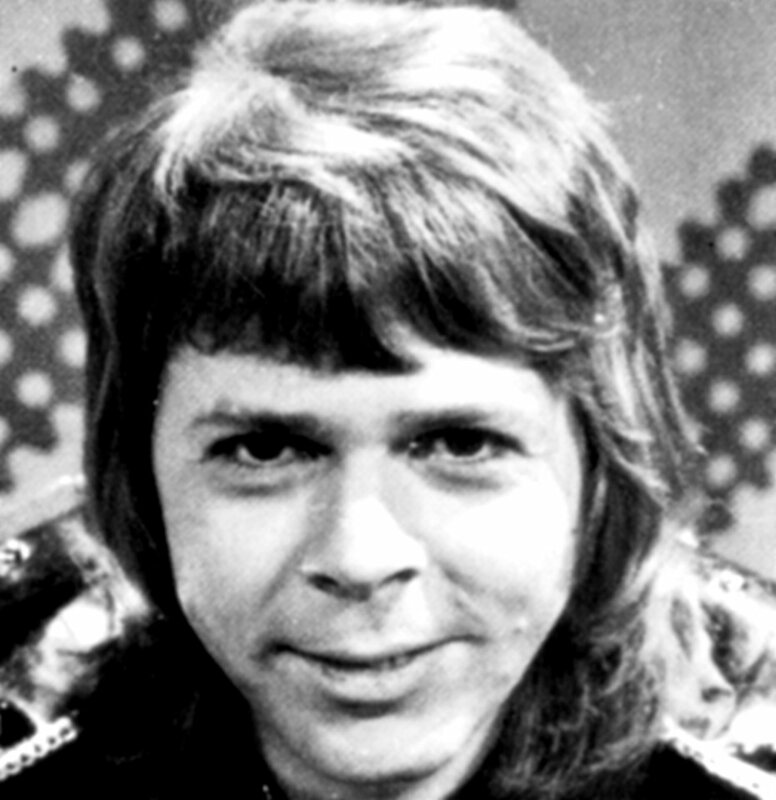 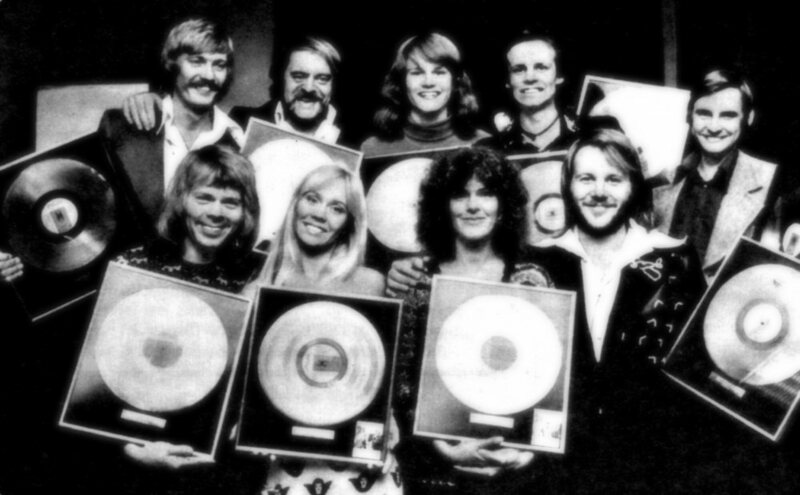 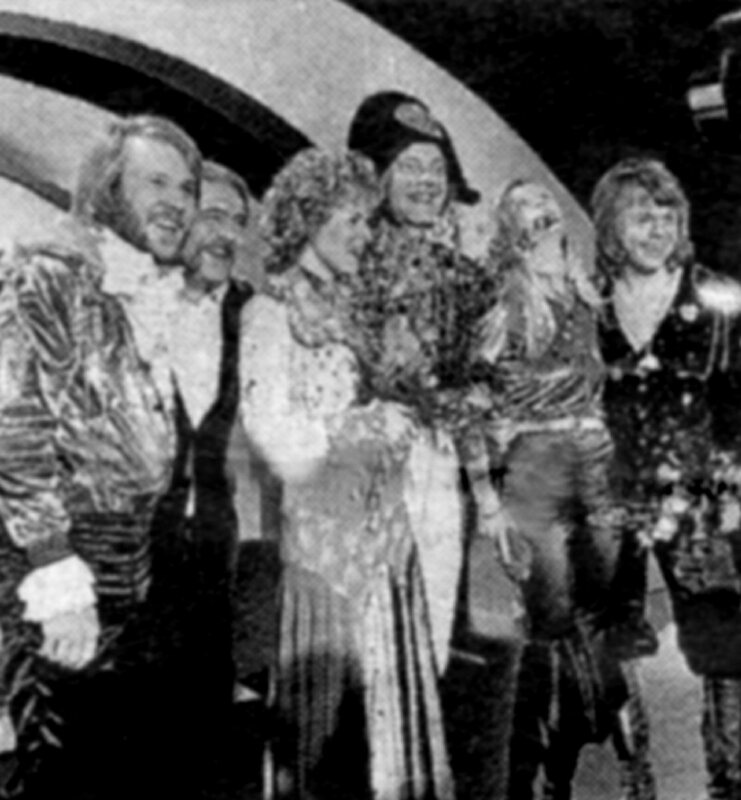 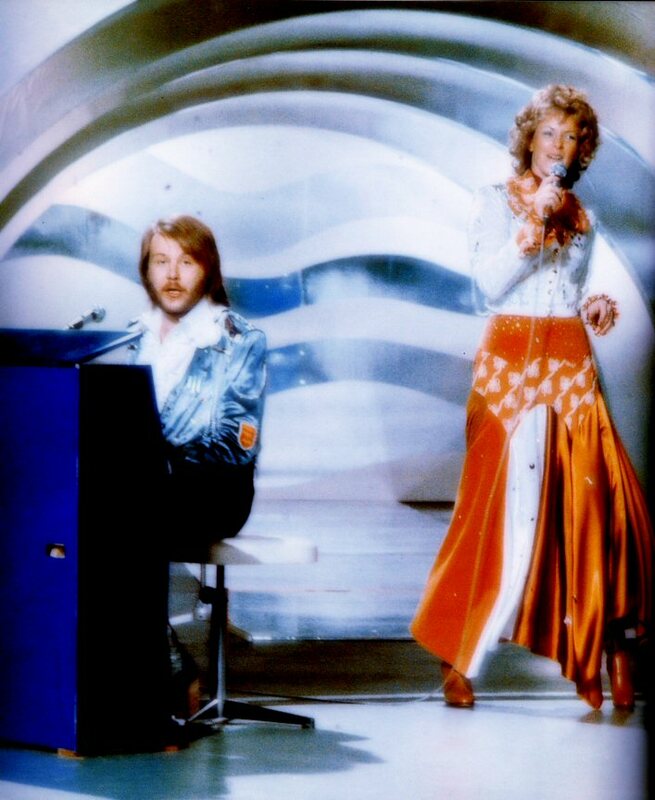 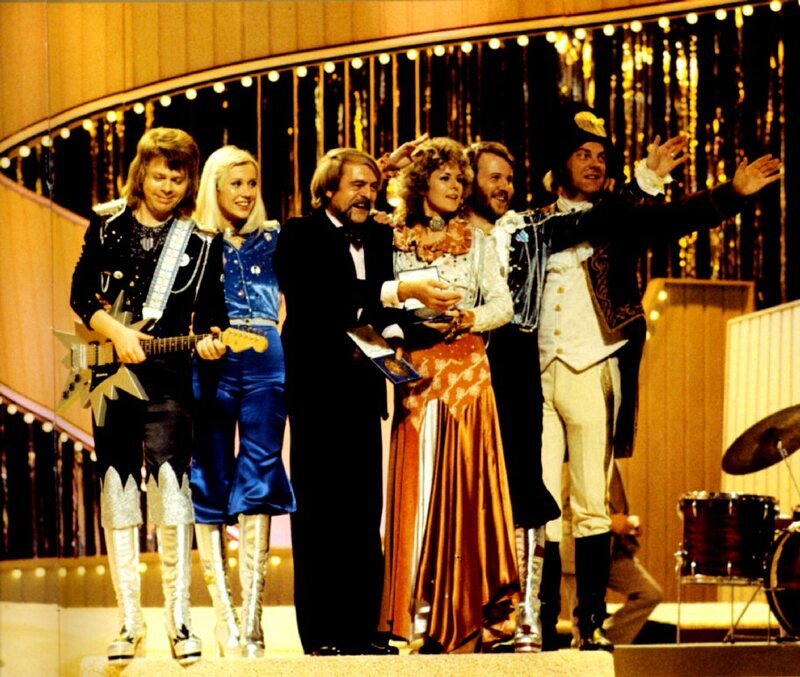 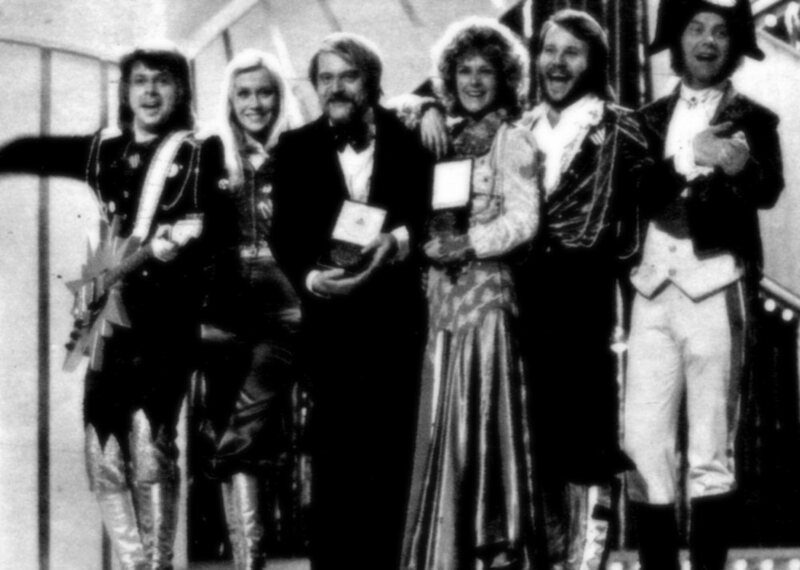 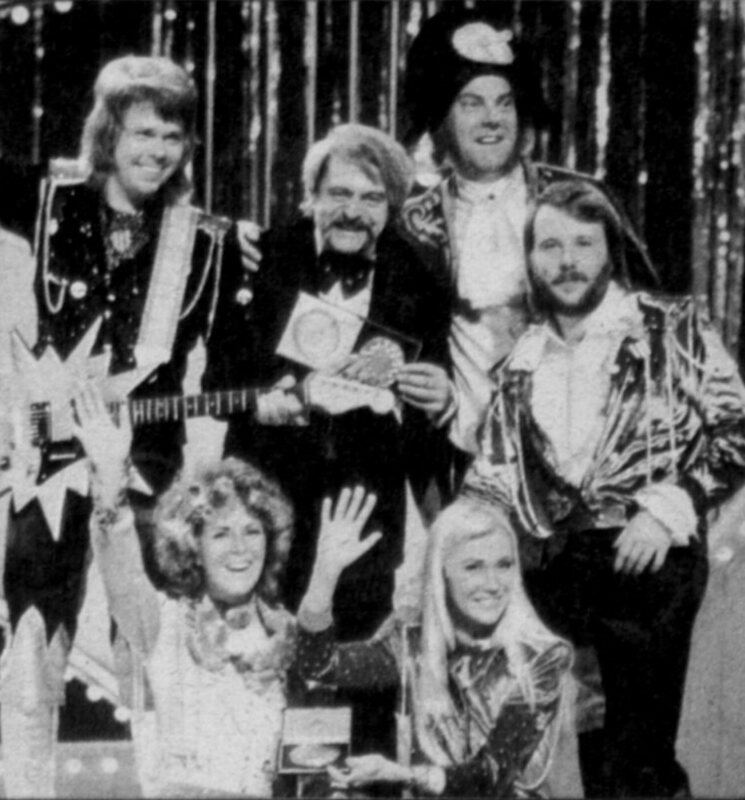 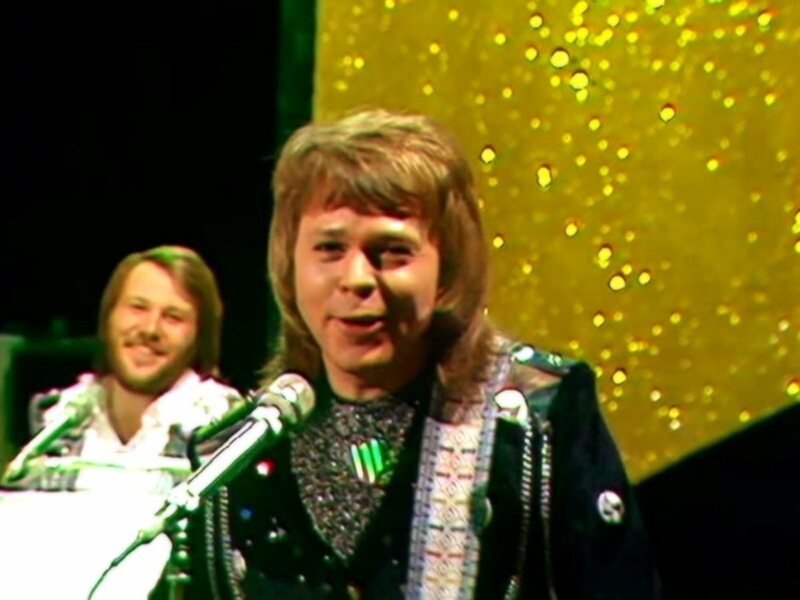 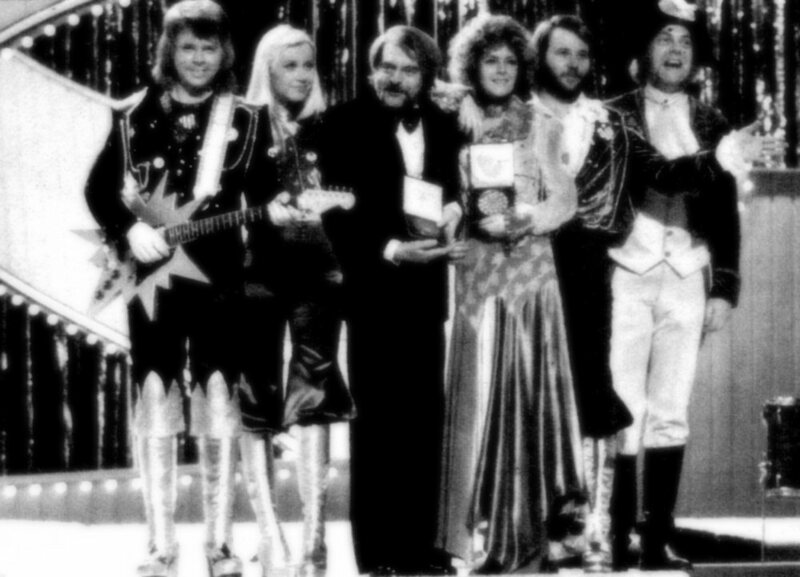 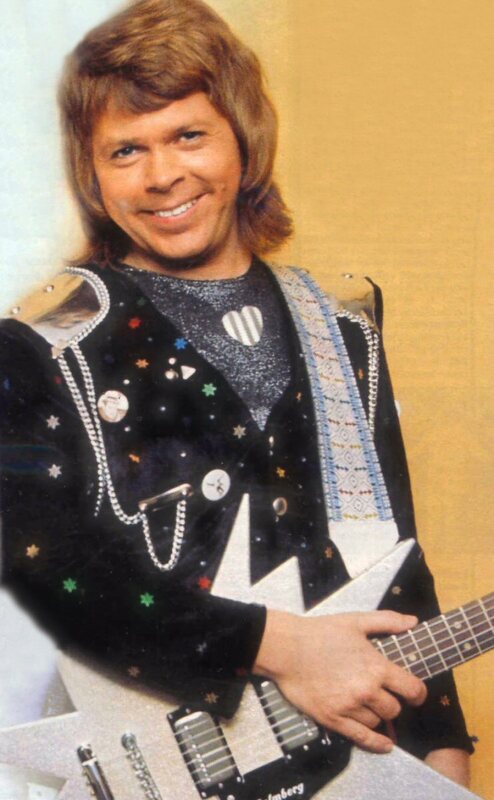 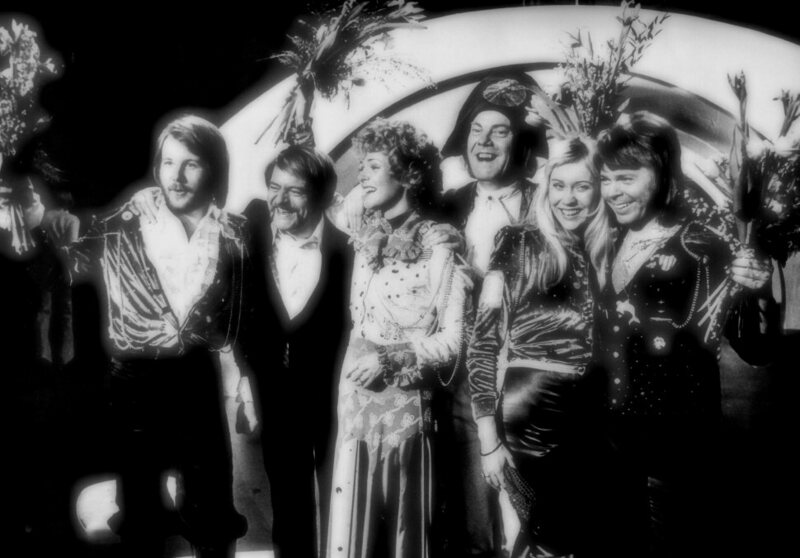 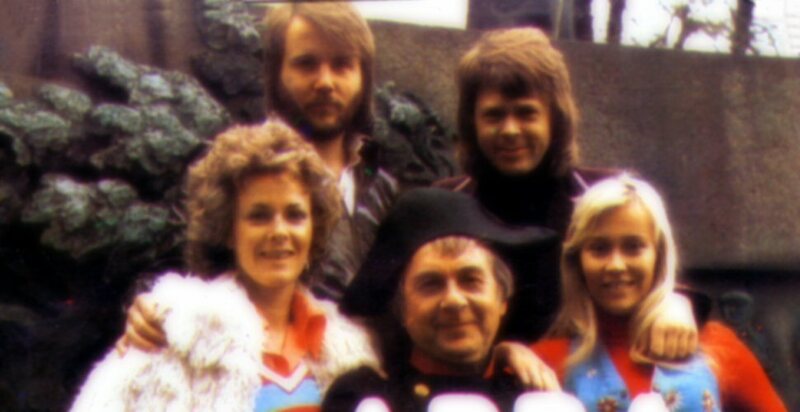 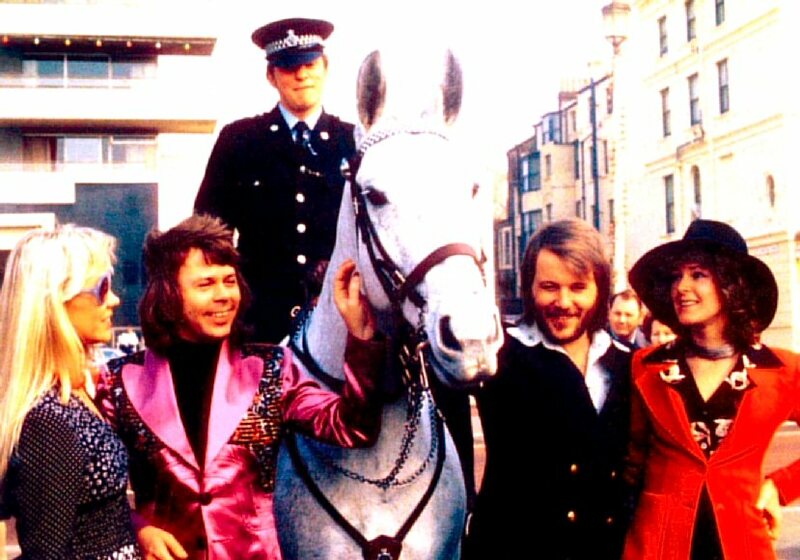 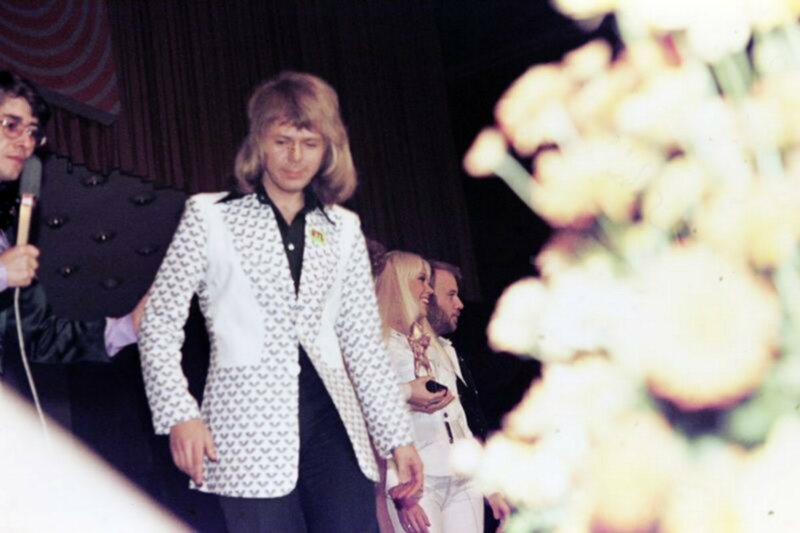 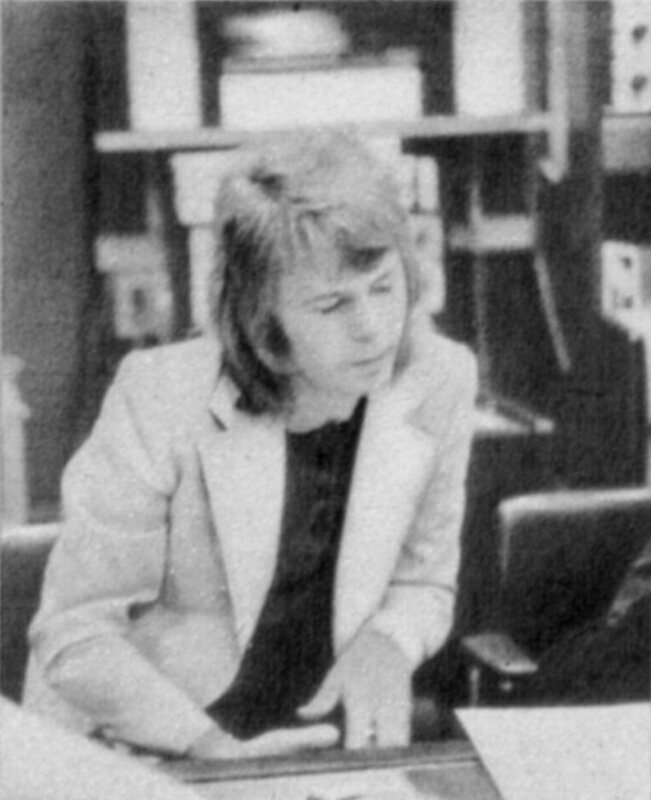 ABBA and Hootenanny Singers with Björn Ulvaeus were awarded with Gold records for their sales in 1974. 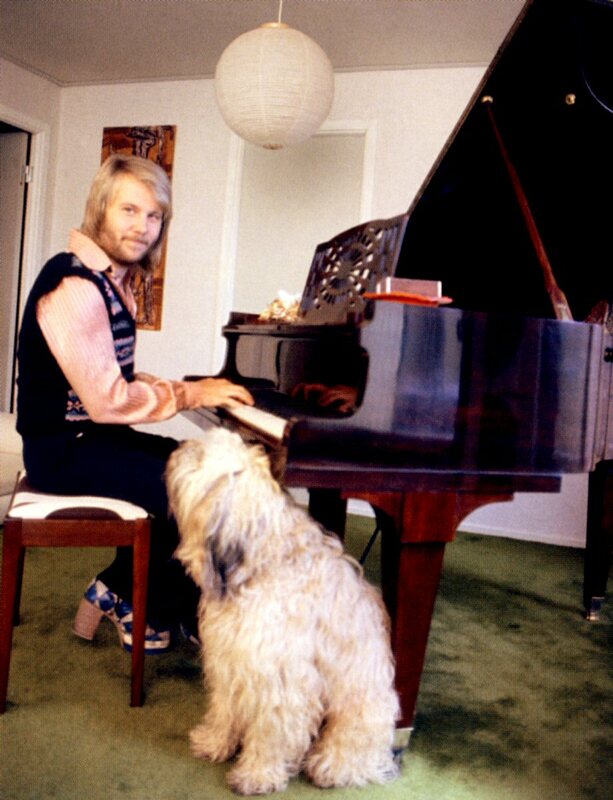 Björn had his favorite pullover with dogs on. 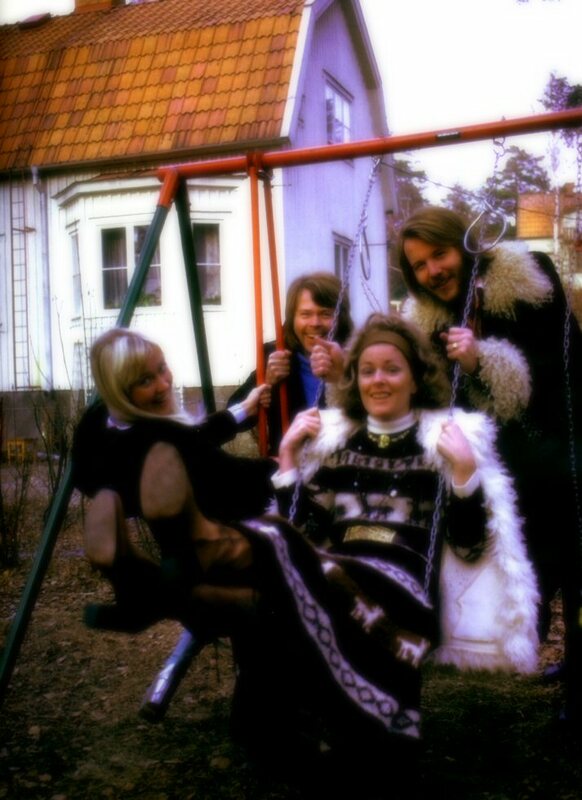 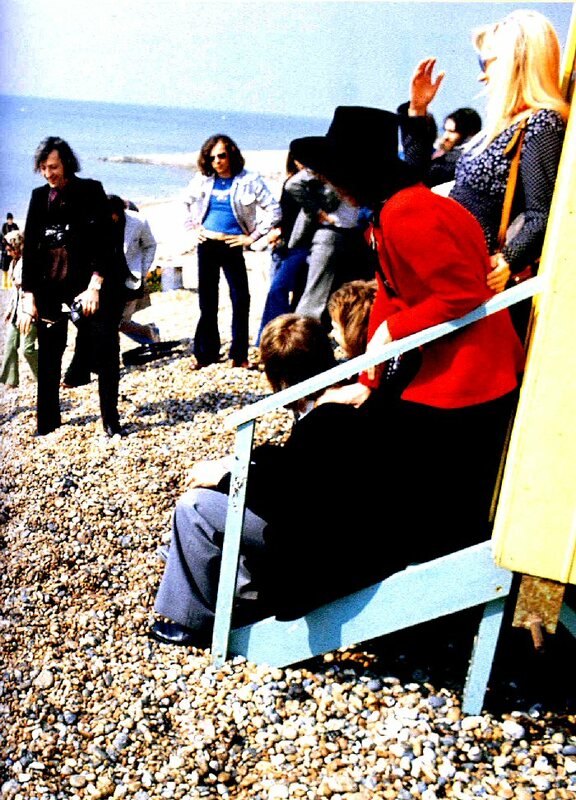 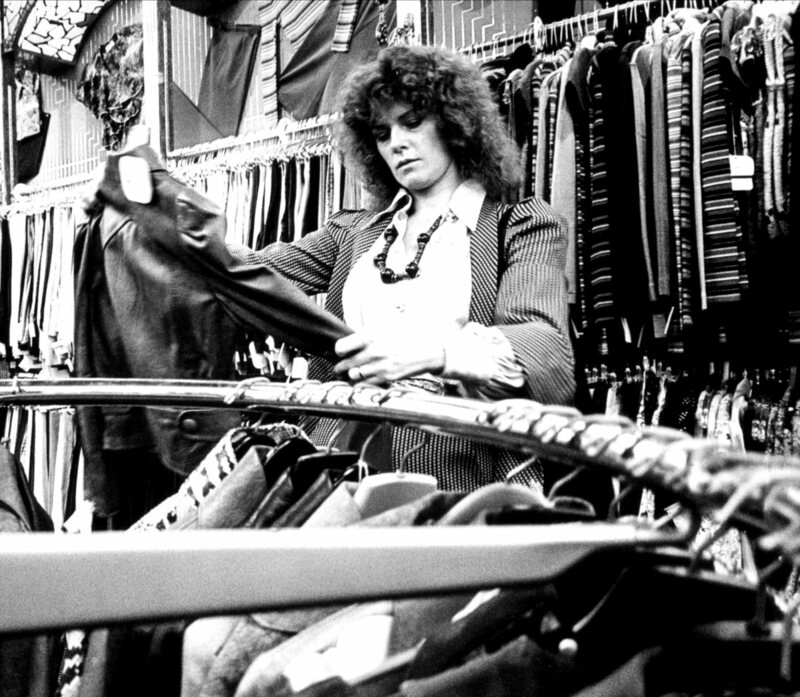 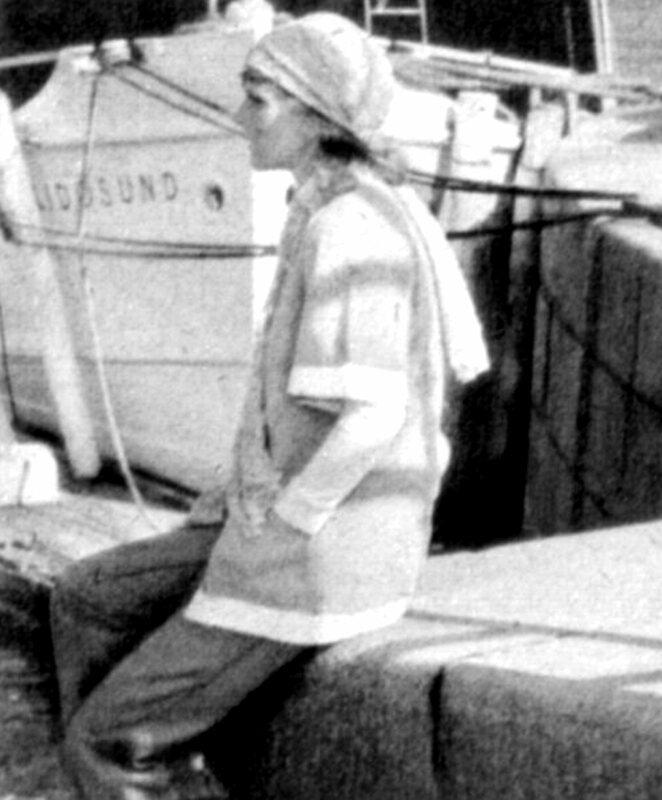 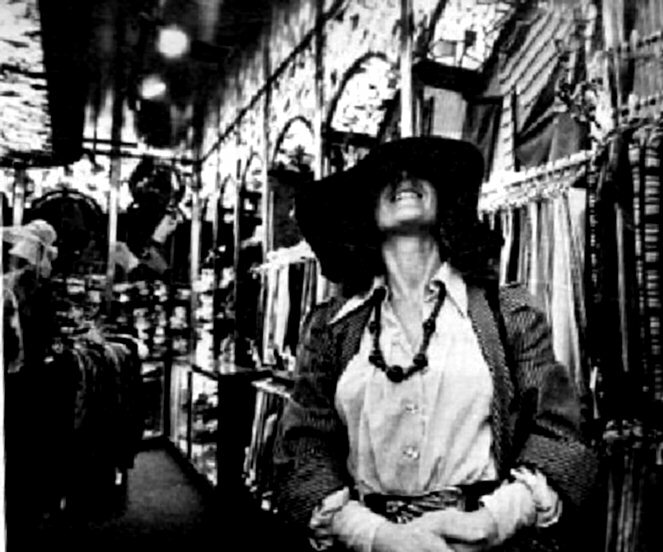 The same pullover can be seen on several photo sessions both in 1974 and 1975. 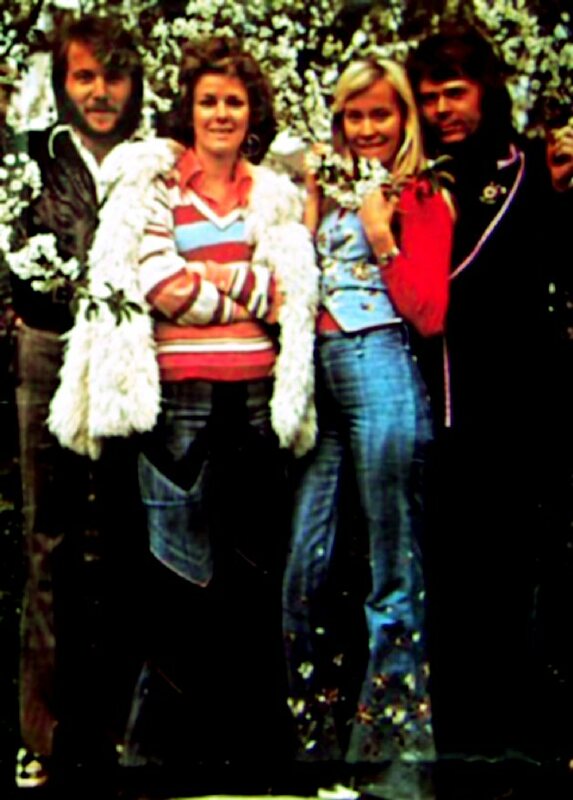 This session is probable best-known from the cover of the rare Australian "The best of... " album released by RCA two years later. 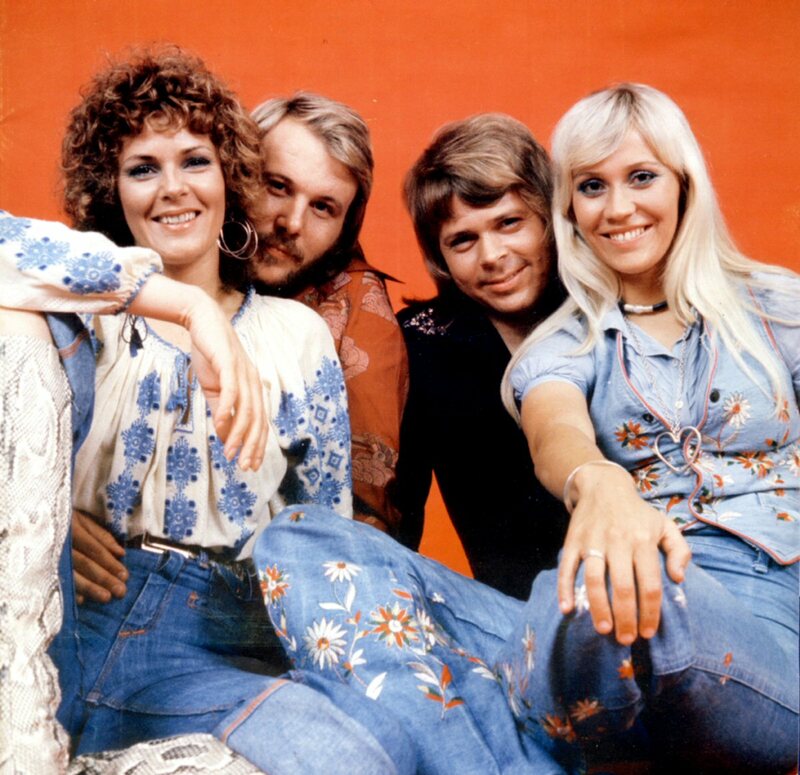 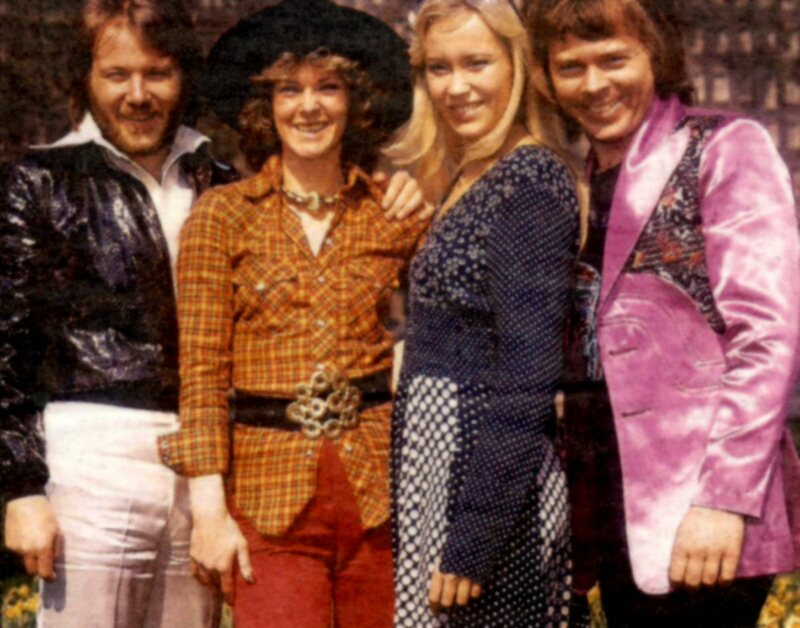 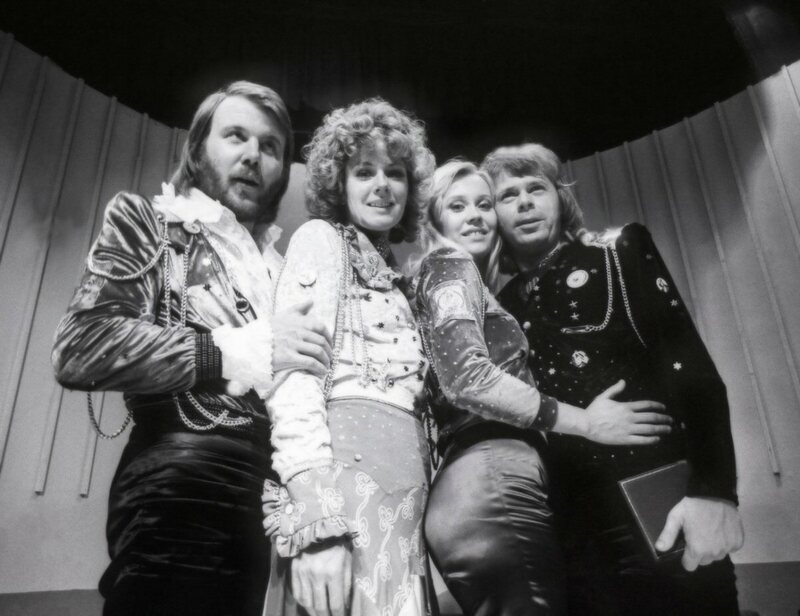 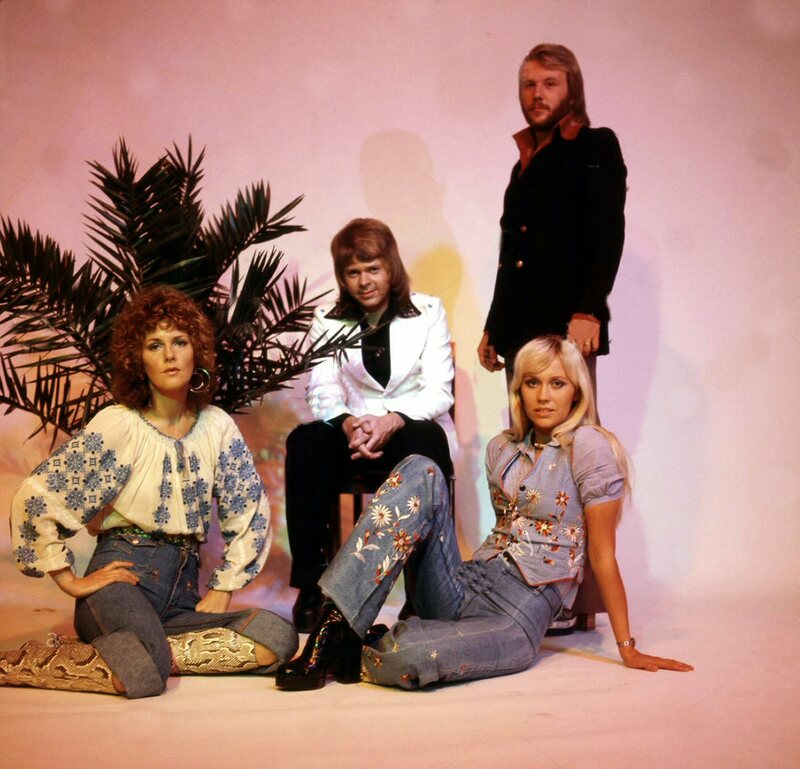 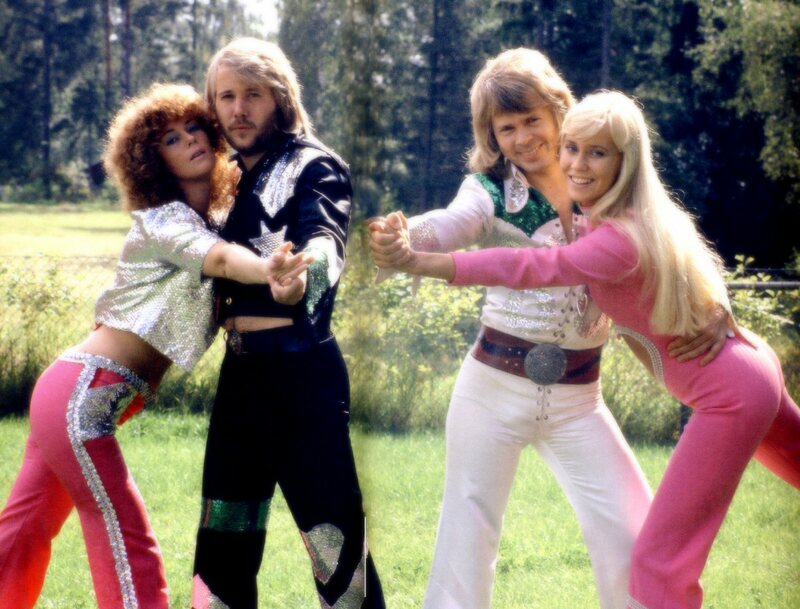 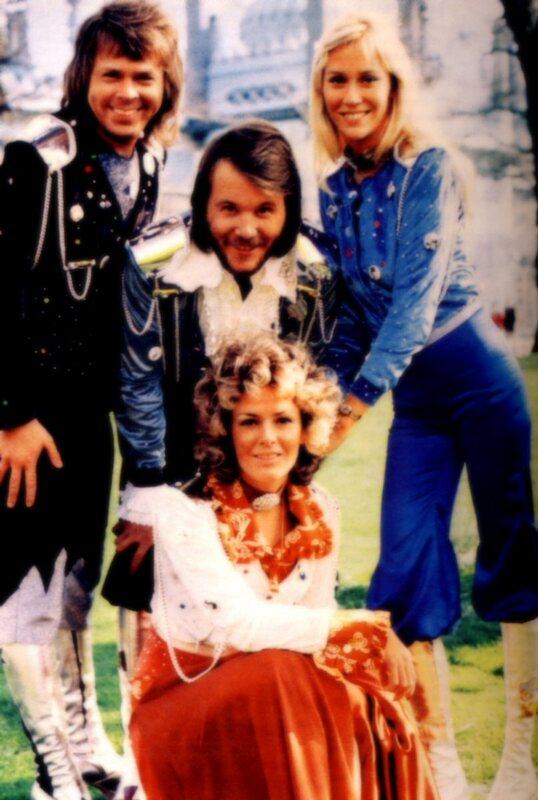 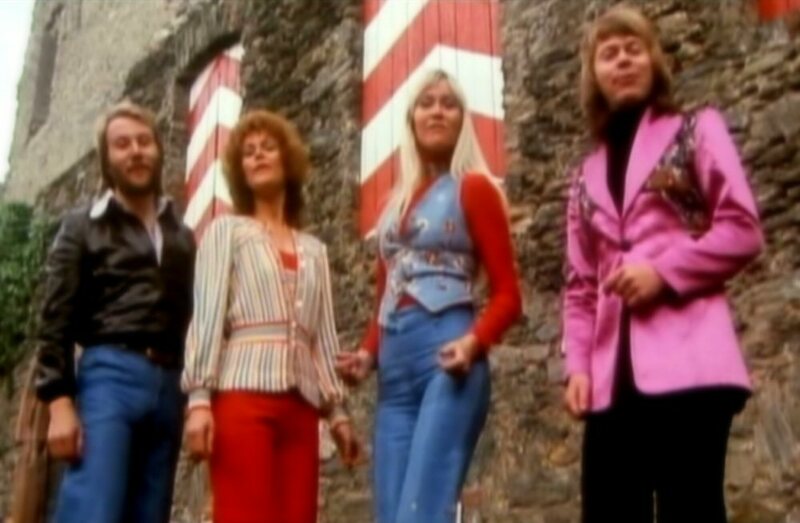 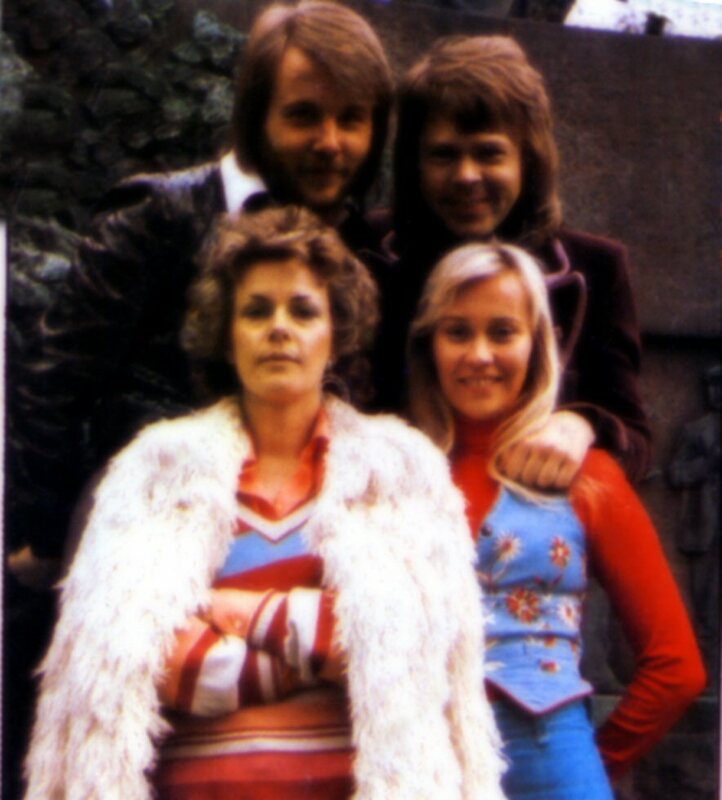 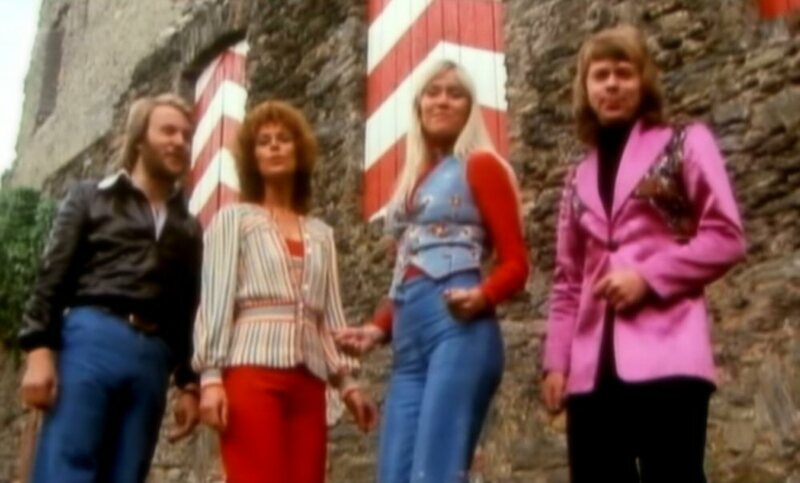 ABBA filmed their first videos ("Waterloo" and "Ring Ring") at the beginning of July. 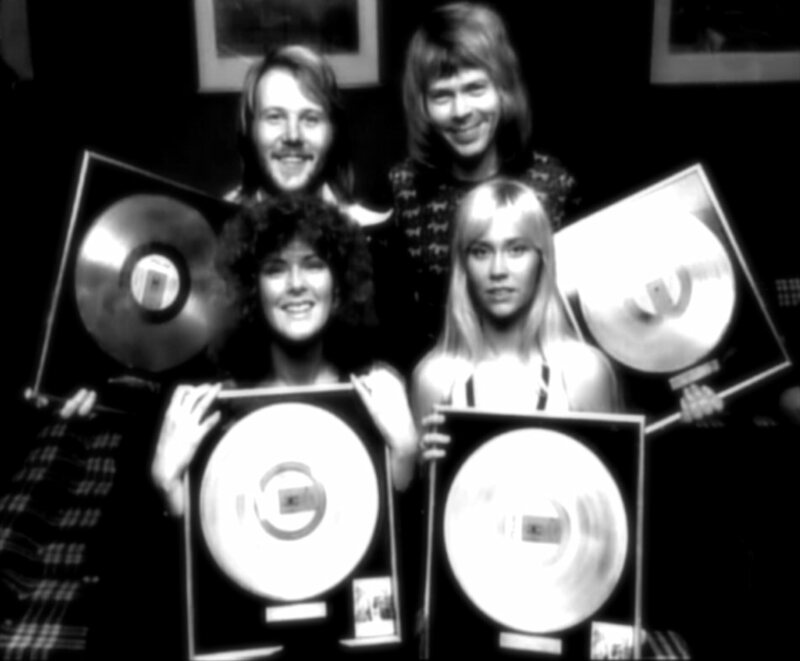 The videos were directed by Lasse Hallström and featured the group standing in the studio with the white background and miming to the songs. 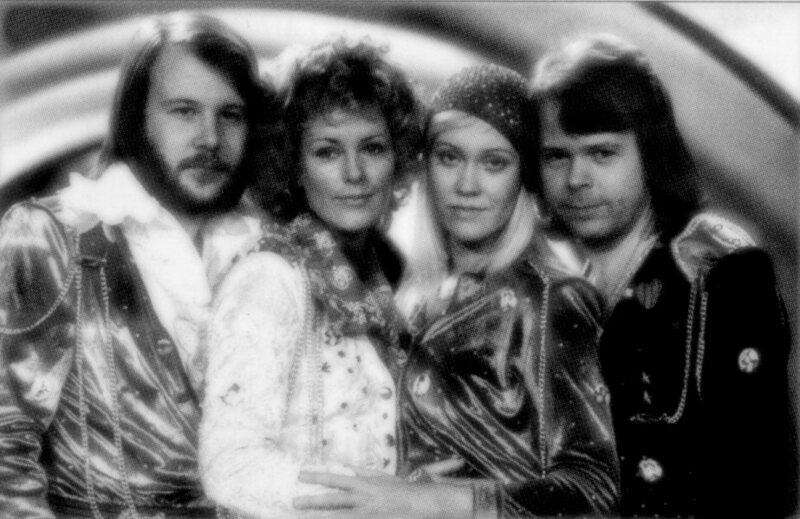 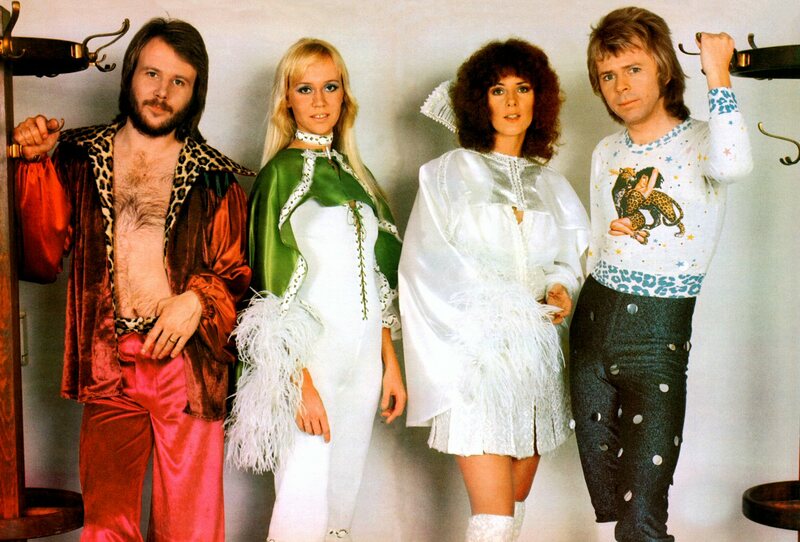 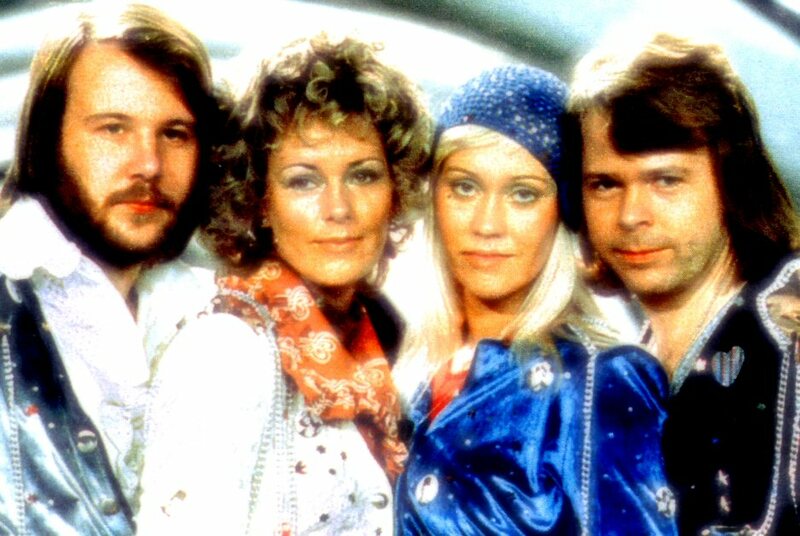 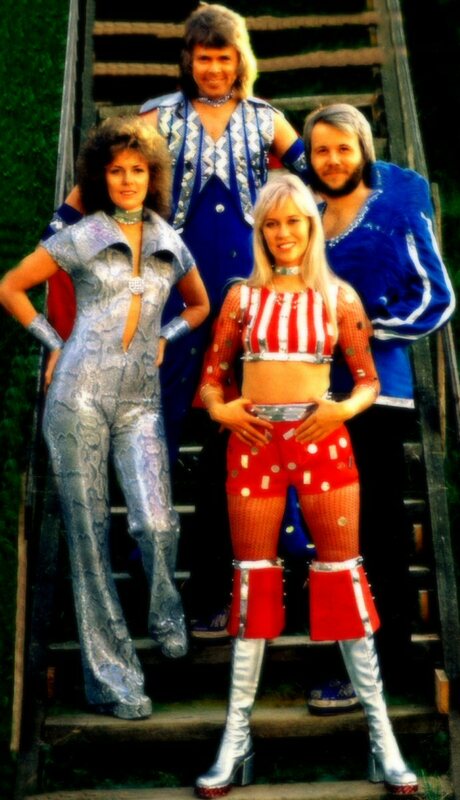 ABBA was the first pop group making videos to their songs. 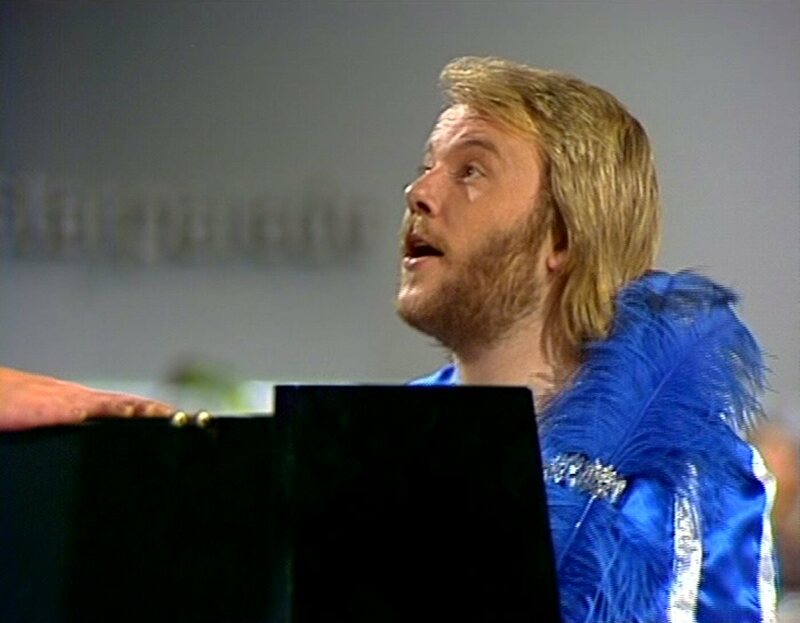 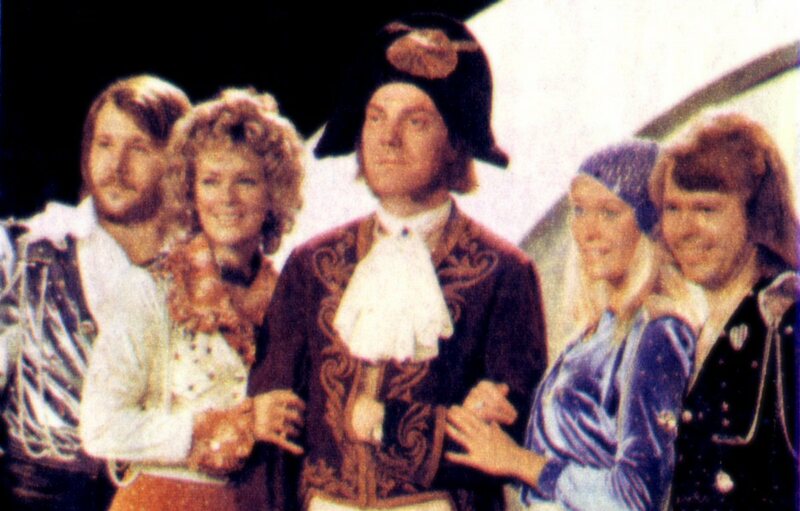 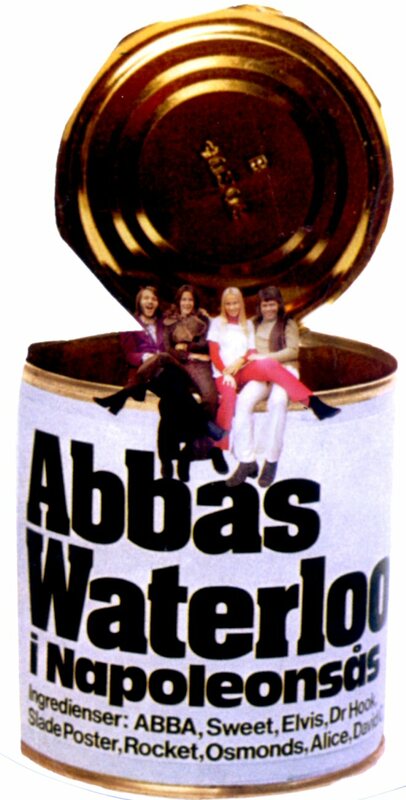 When the first ABBA video Waterloo had been made nobody knew that 10 years later this way of promotion would be the most usual in the pop world. 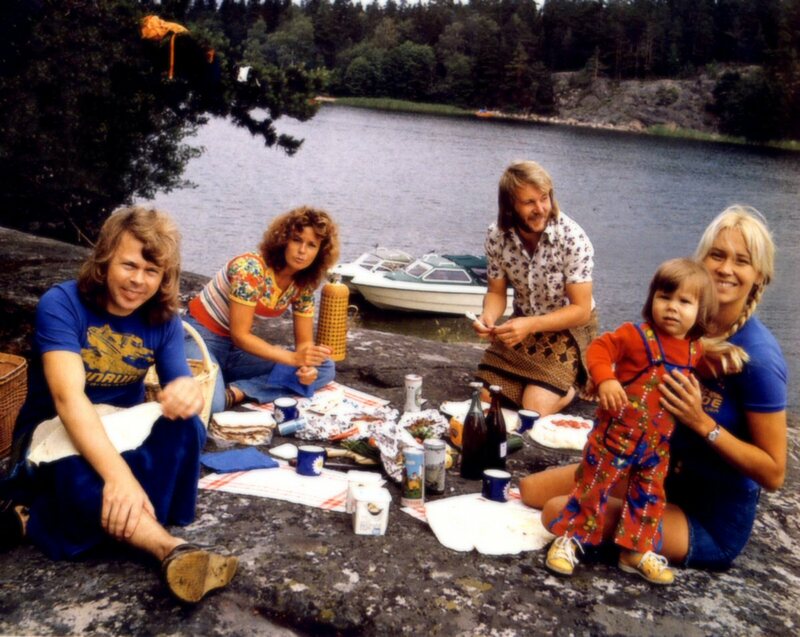 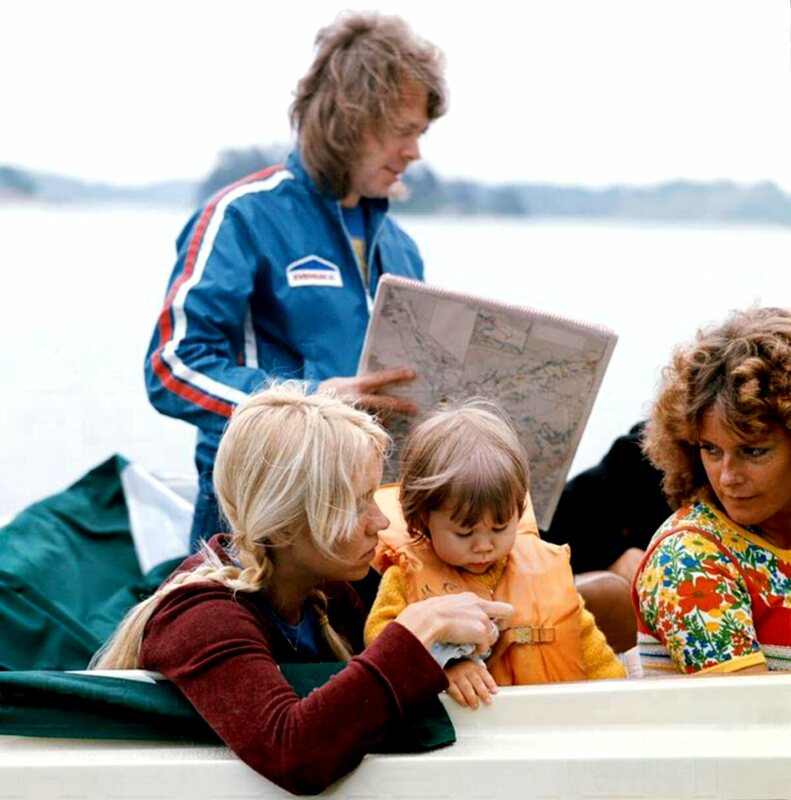 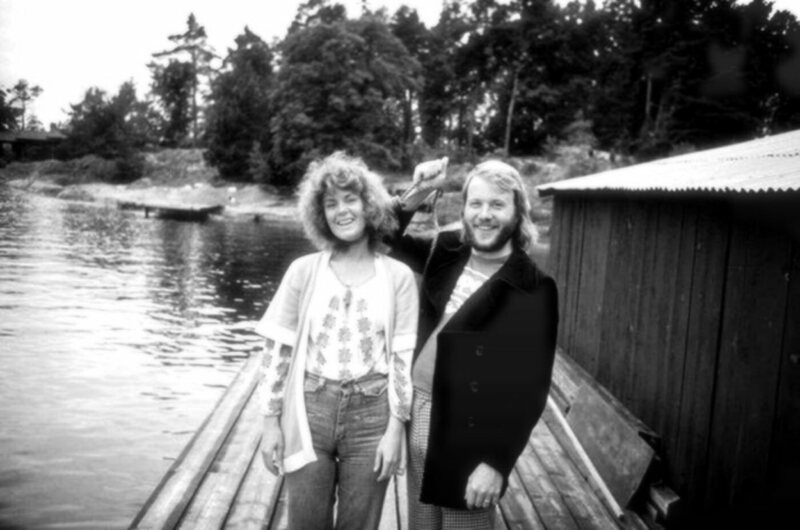 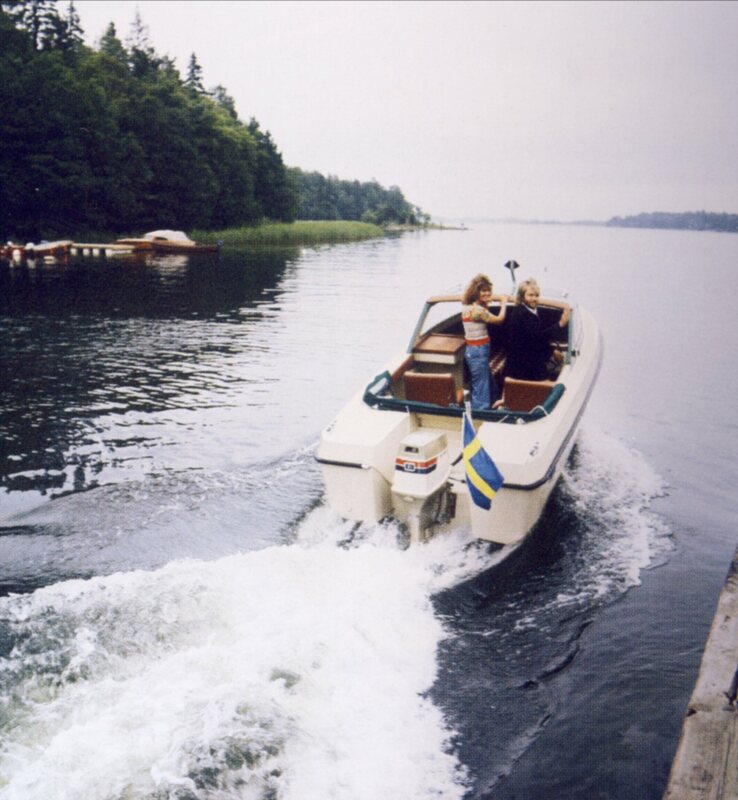 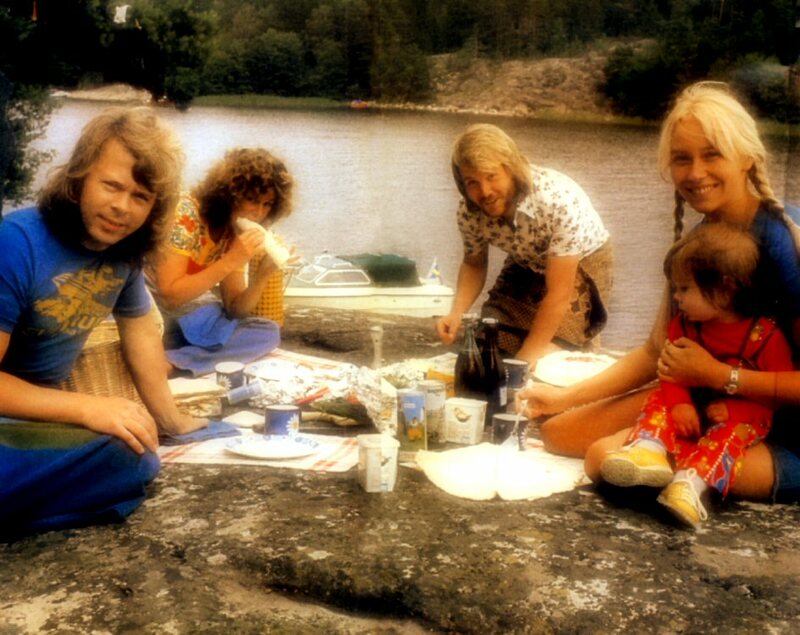 The group members spent the 1974 summer time partly on their island Viggsö and partly in the studio recording solo projects. 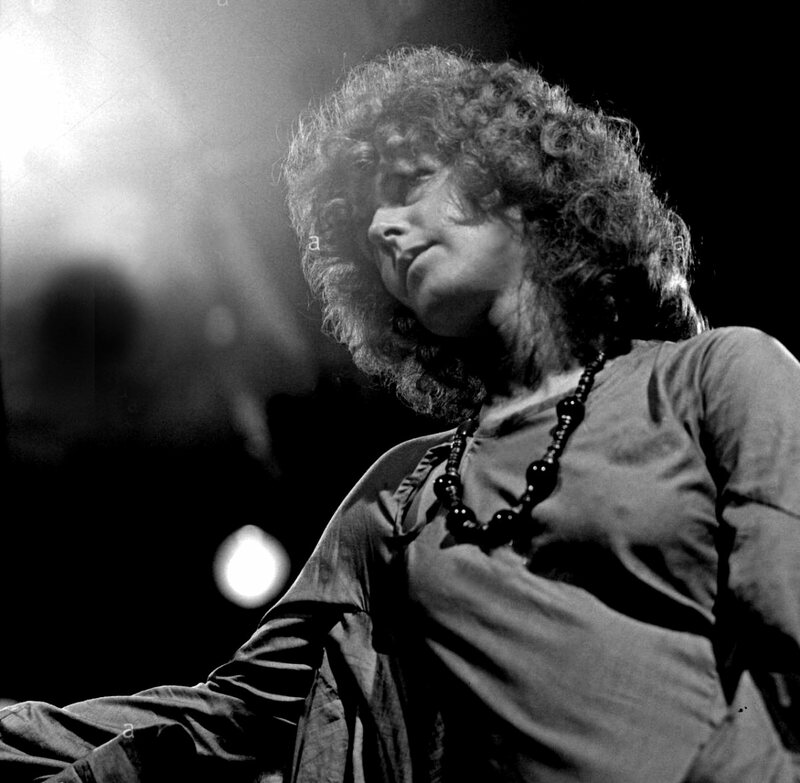 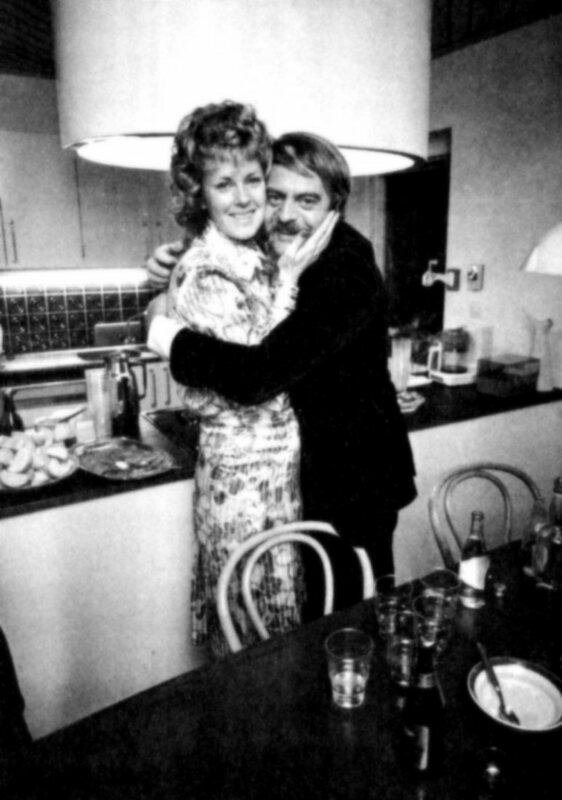 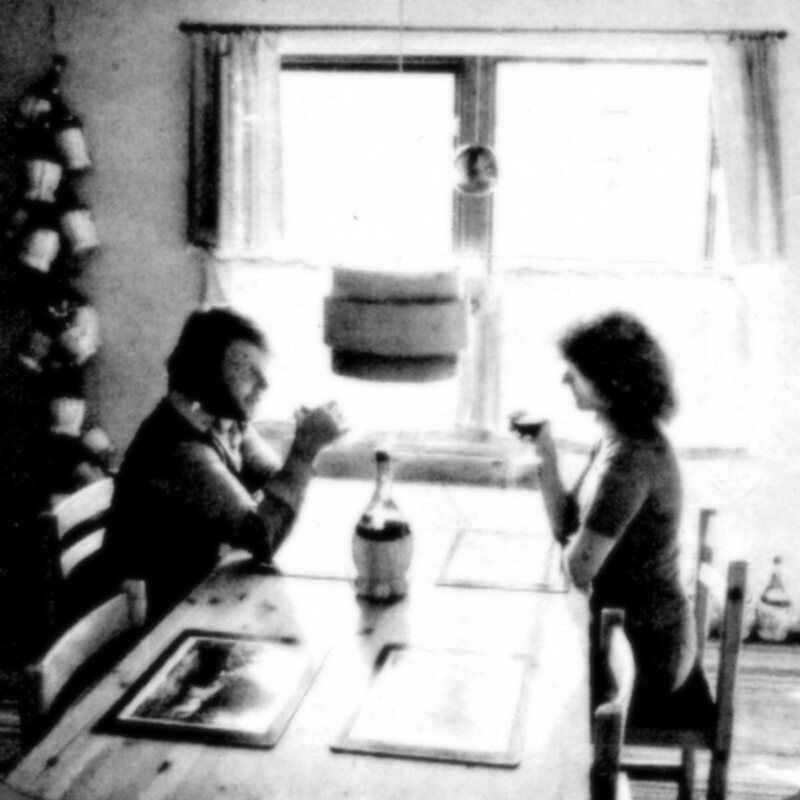 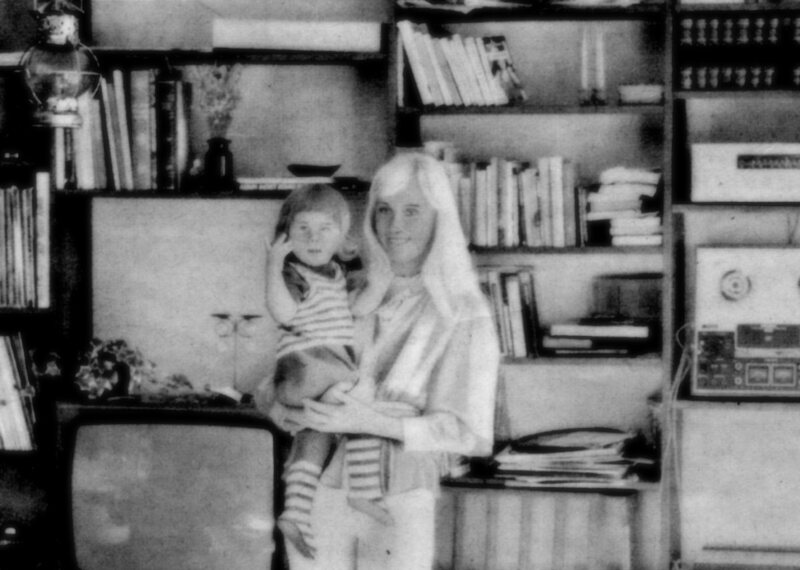 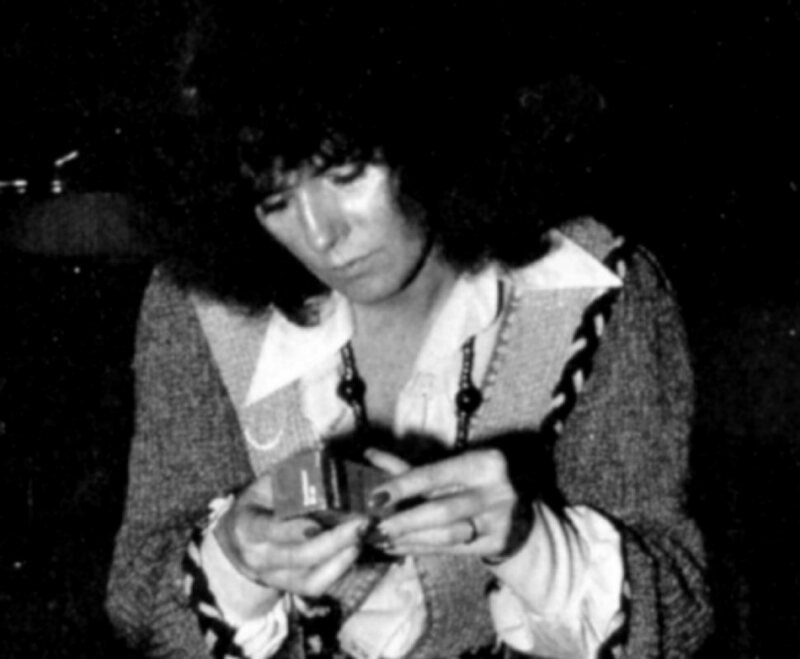 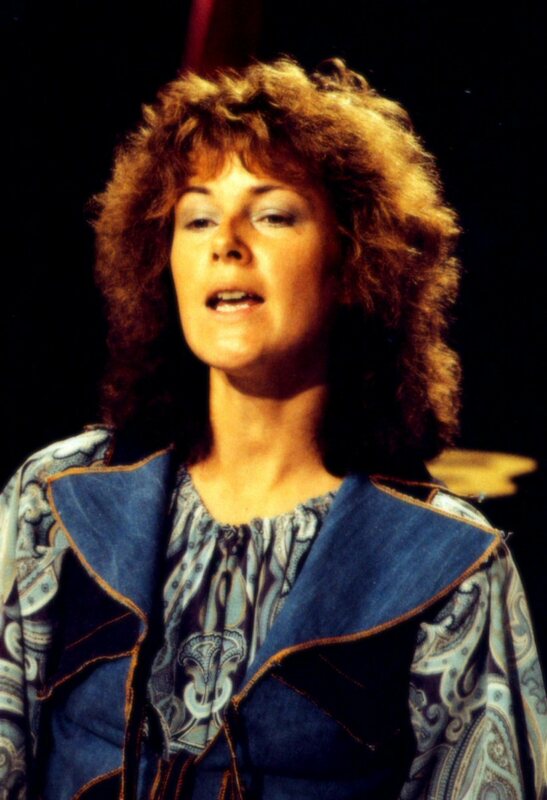 Frida together with Benny worked on her solo album which would be released at the end of 1975. 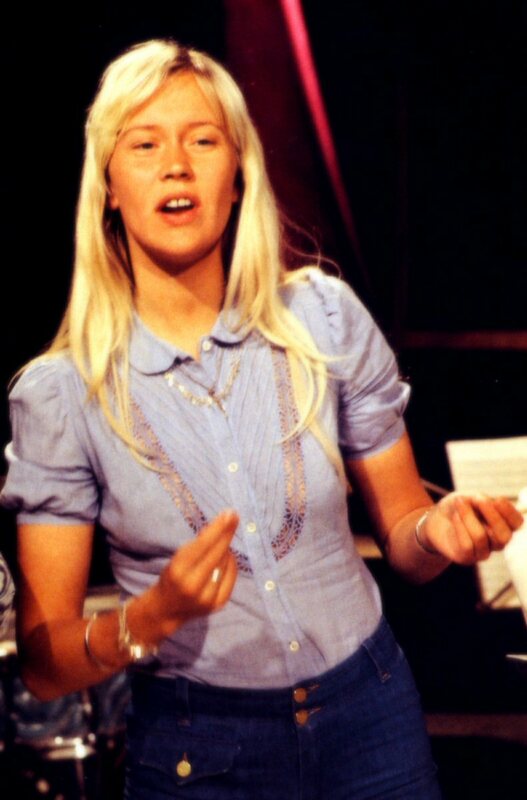 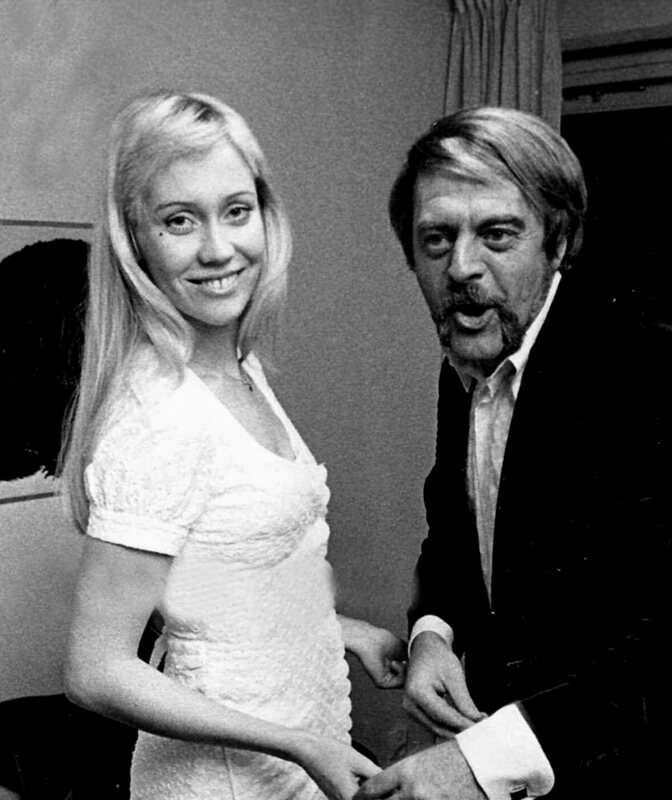 Even Agnetha worked on her new solo project. 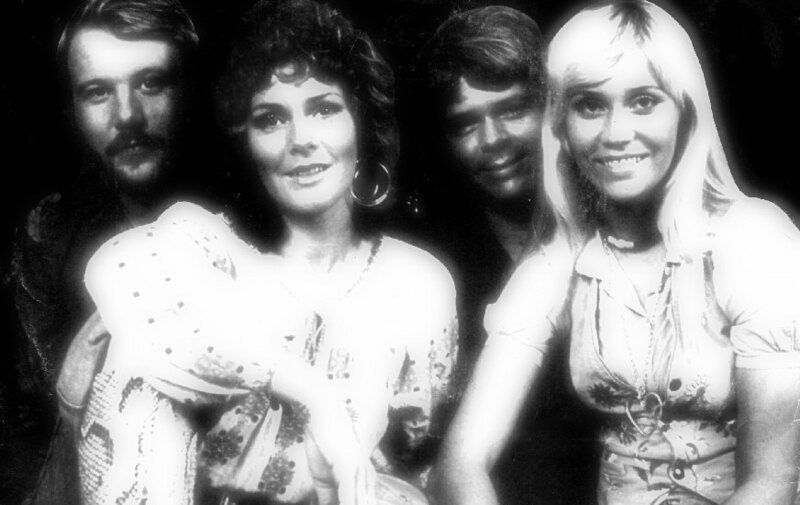 Björn, Benny and Hootenanny Singers finished their new album "Evert Taube på vårt sätt" (Singing Evert Taube in our way). 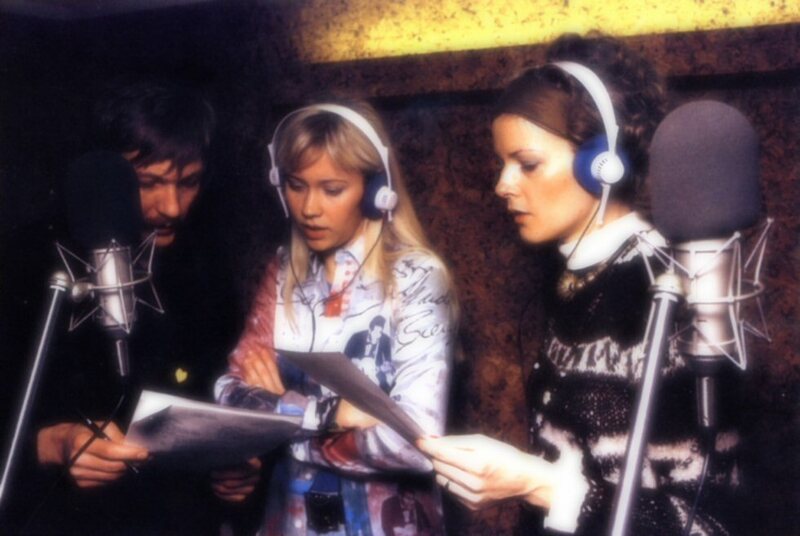 Recording sessions for a new ABBA album started in autumn. 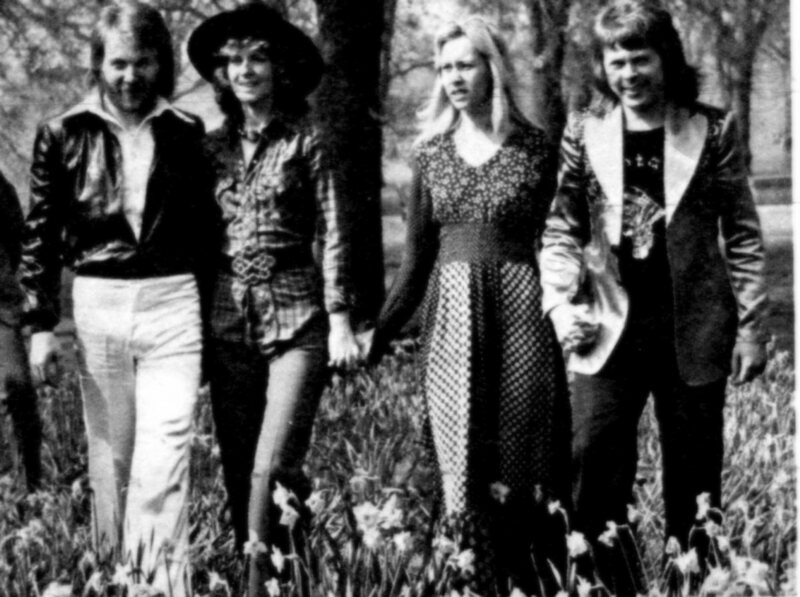 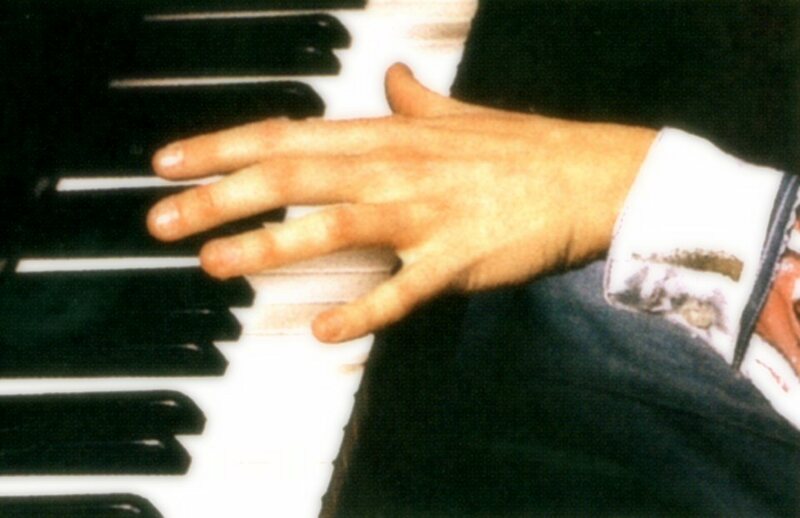 Wolfgang Heilemann took pictures of the group during several photo sessions in the summer 1974 in Stockholm. 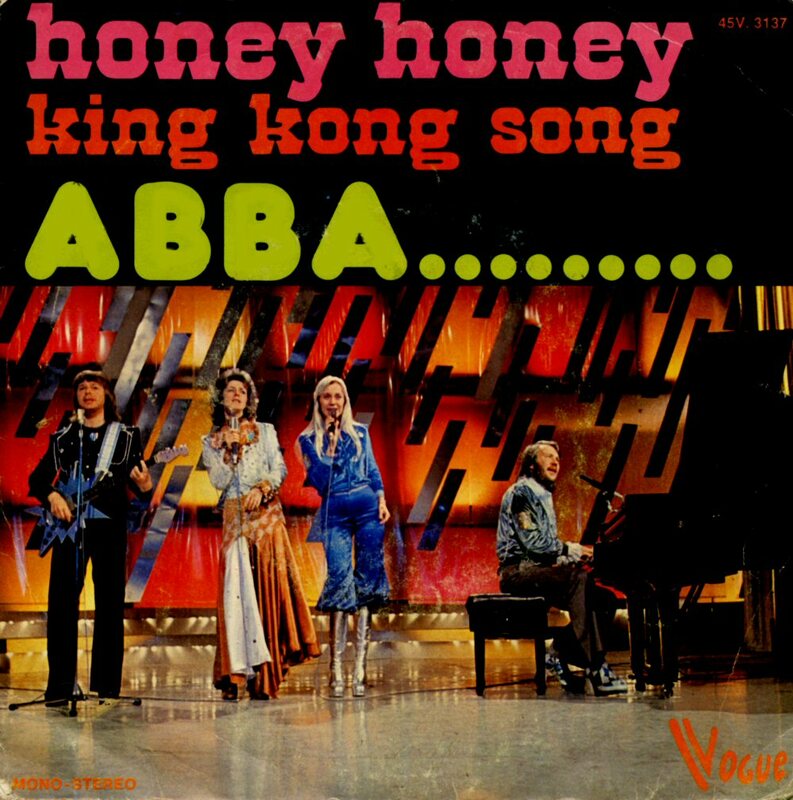 A new single "Honey Honey"/"King Kong Song" was released in April in Scandinavia. 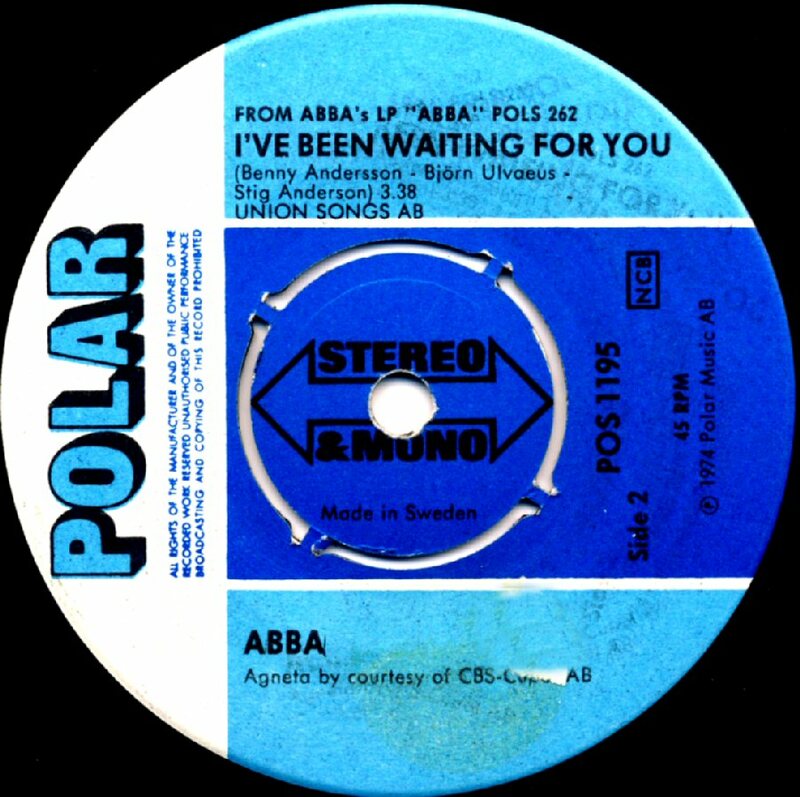 In Europe the release came some months later. 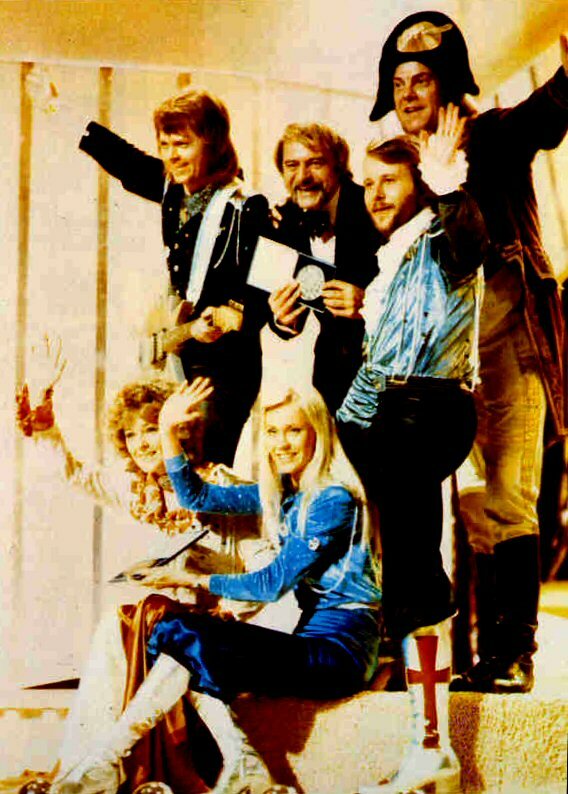 In USA in August 74 (chart entry on September 14, 10 weeks #27), Australia in October 74 (chart entry November 4, 19 weeks, #30). 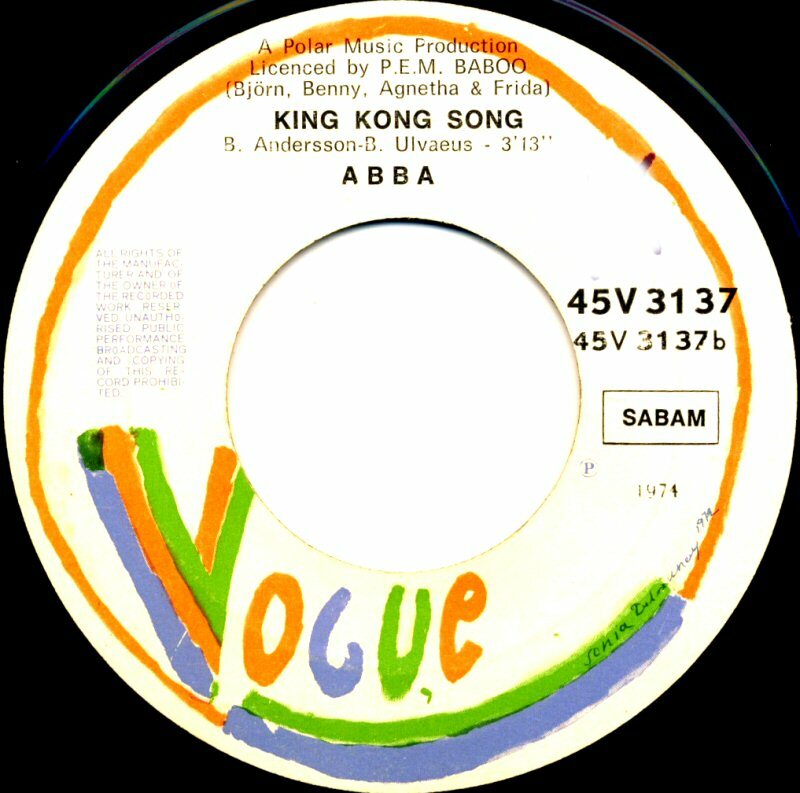 The single "Honey Honey" with "King Kong Song" on the B-side was released by Vogue in Belgium in July 1974. 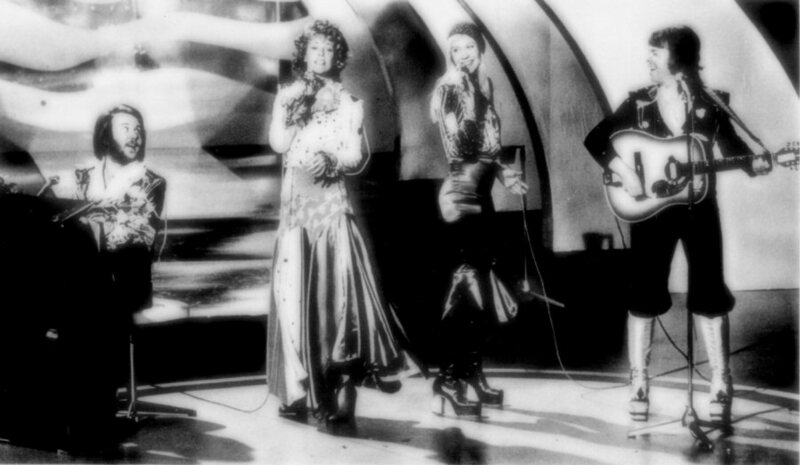 The cover photo shot was taken from the group's performance on French TV in April 74 in the show "Domino". 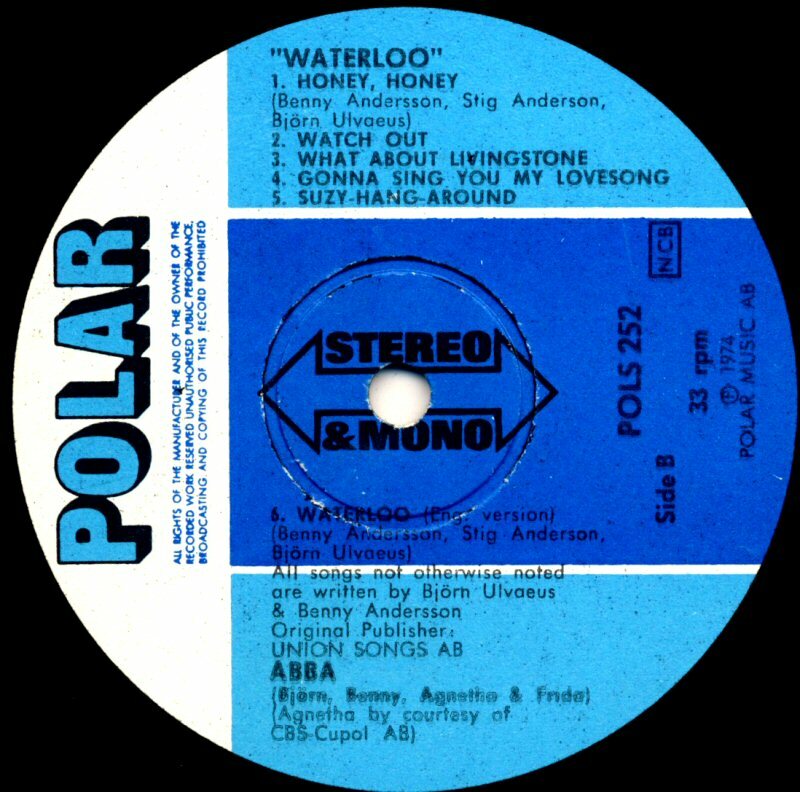 The second single from LP "Waterloo" released in Germany was "Ring Ring" in the remixed sax version and "Honey Honey". 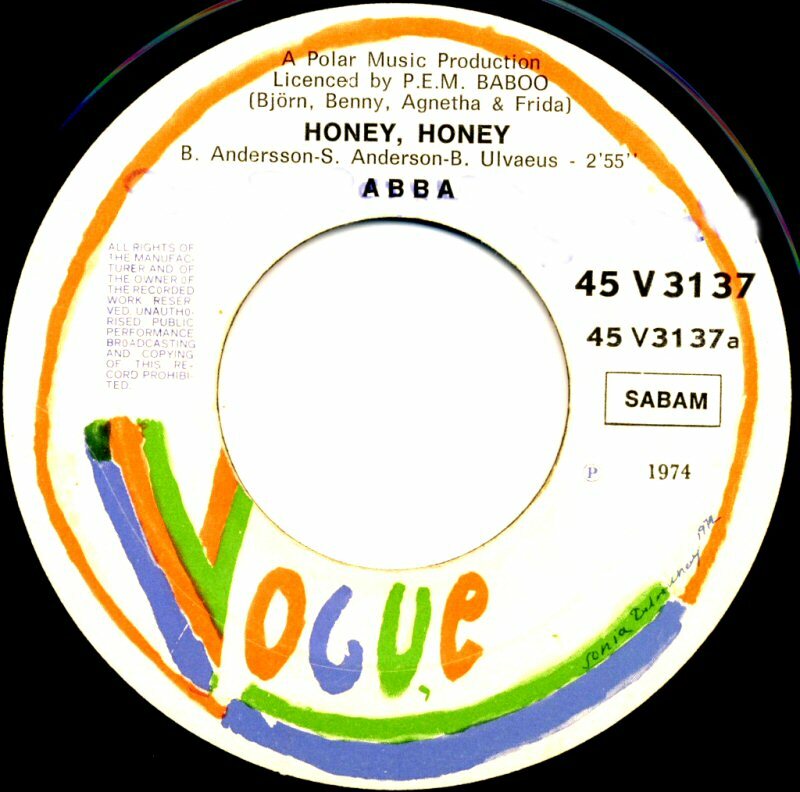 The single was presumably thought as a single with two A sides even if it was stated on the record that "Honey Honey" is on the side B. 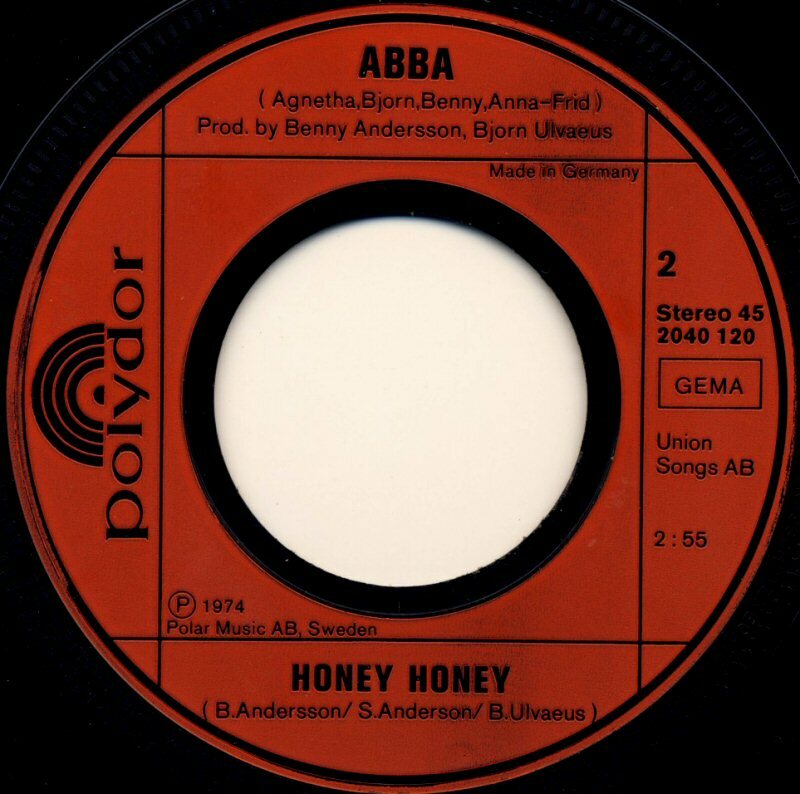 It was though "Honey Honey" which became hit in Germany entering the chart on July 8th, 1974 and staying there for 22 weeks with the peak position #2. 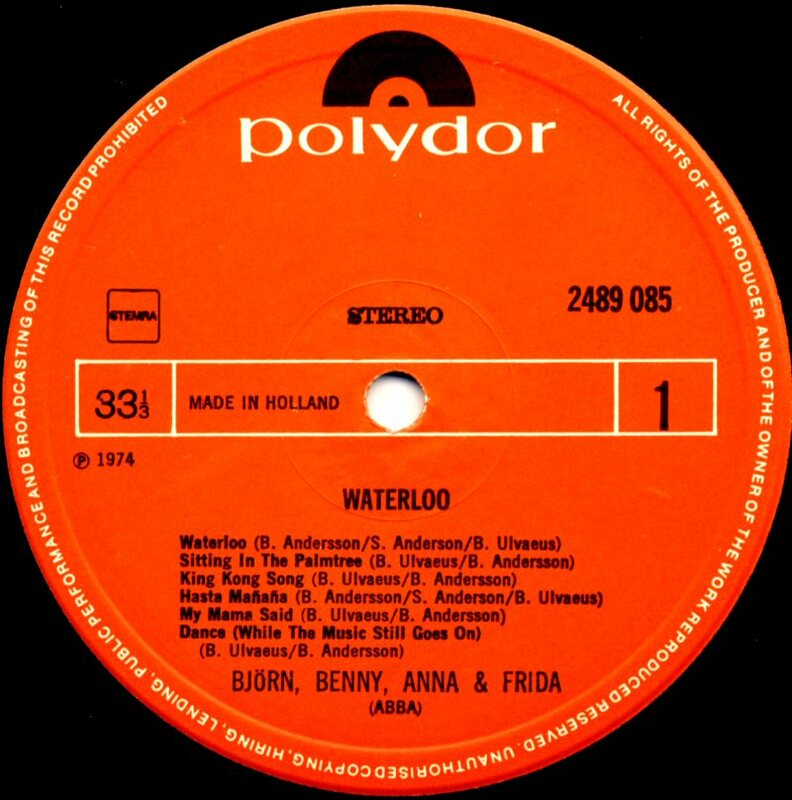 The second single from the album "Waterloo" in Holland was "Honey Honey" b/w "Hasta Mañana" and it saw its release in December 1974. 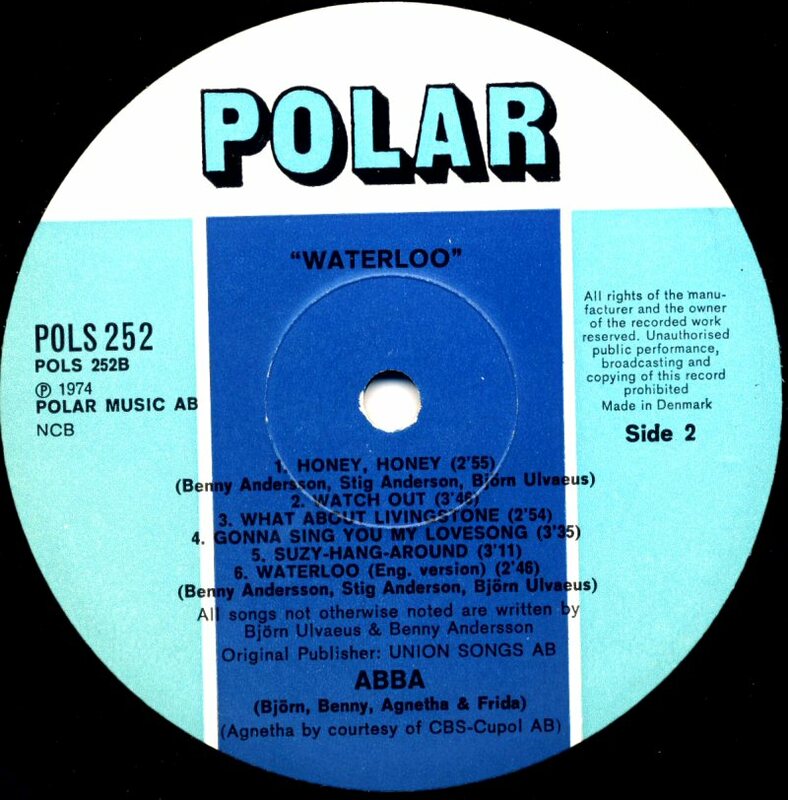 "Honey Honey" was not so successful as "Waterloo" and it reached #16 on the Dutch single chart where it stayed for 6 weeks. 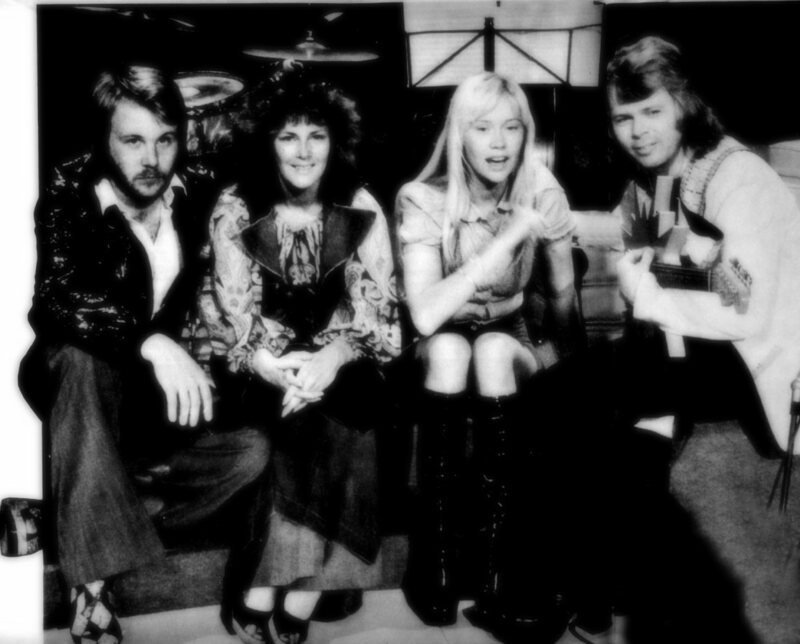 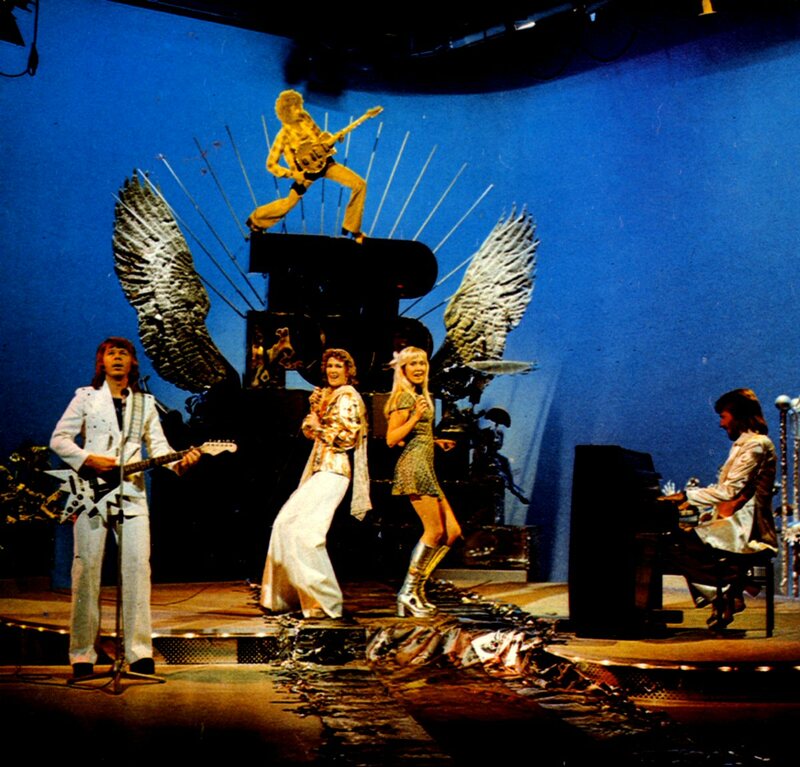 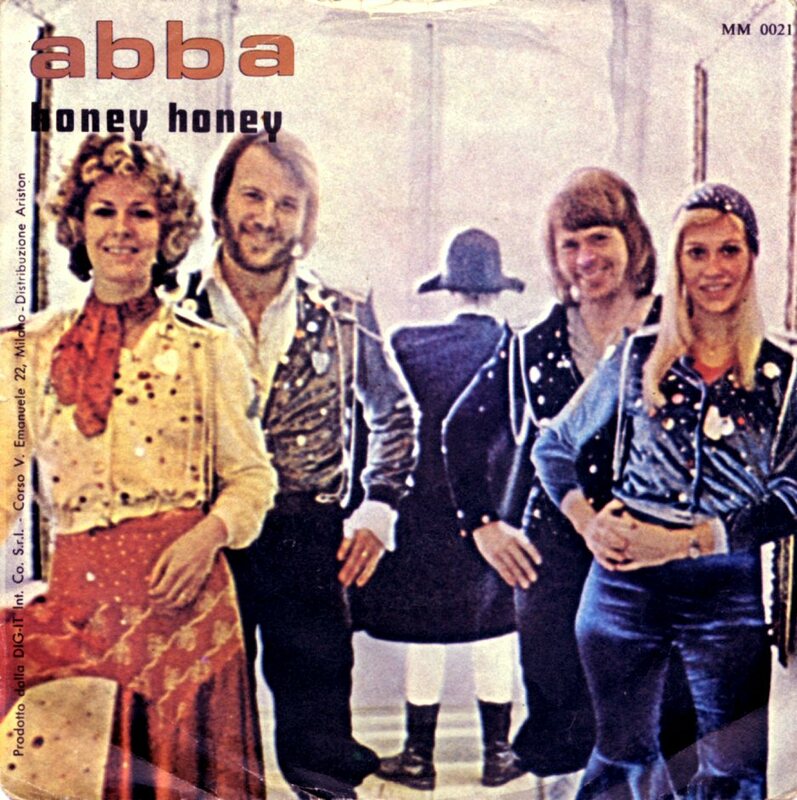 In West Germany ABBA performed "Honey Honey" in the TV special "Disco" which was broadcasted on September 28, 1974. 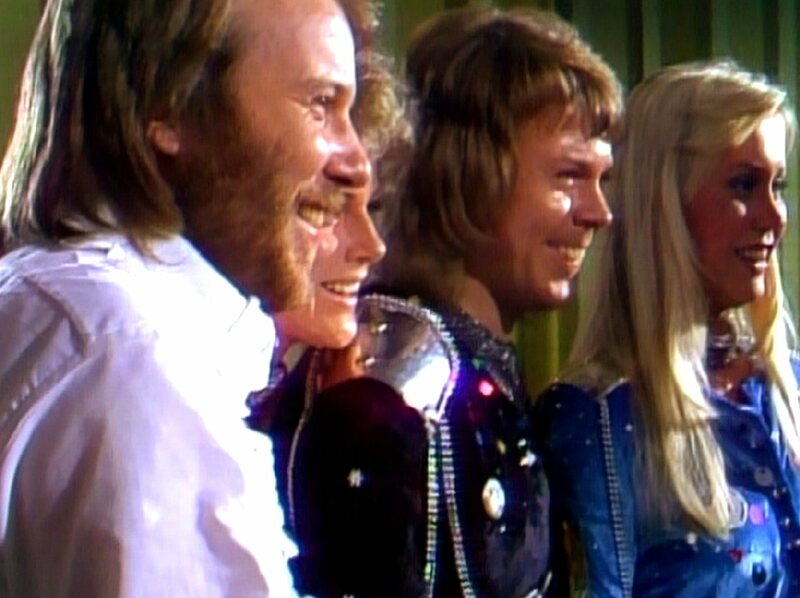 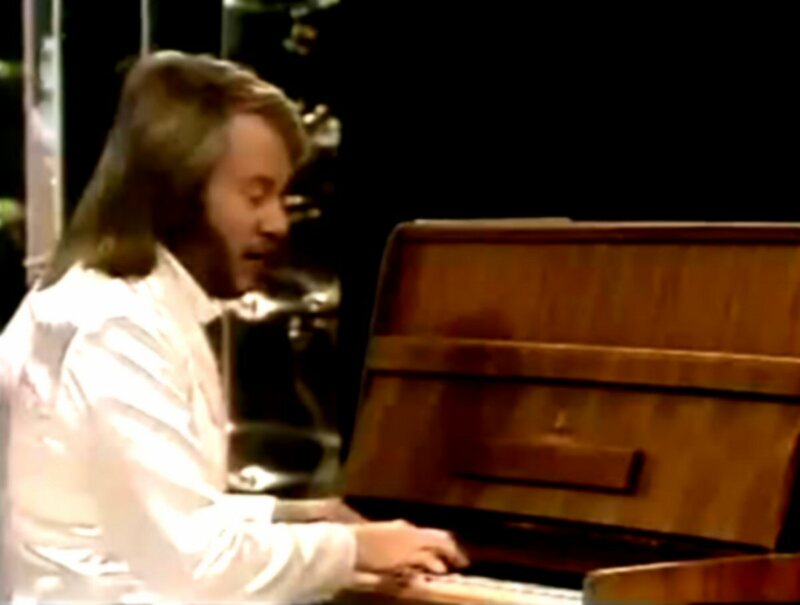 ABBA appeared even in "Die Aktuelle Schaubude" on German TV. 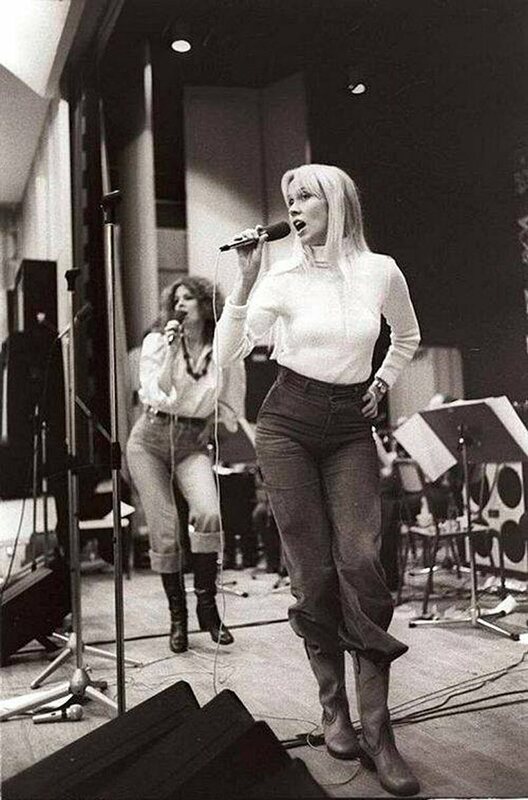 Two rare photo shots from the "Honey Honey" period. 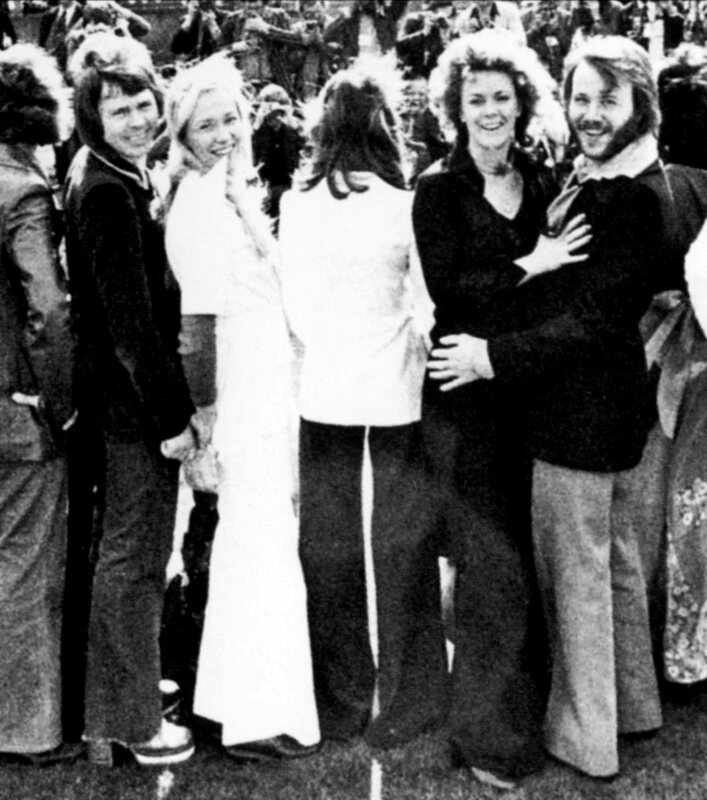 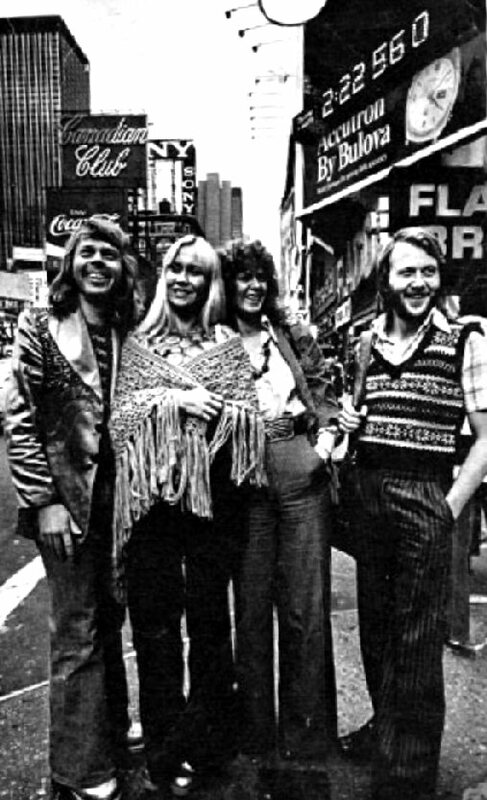 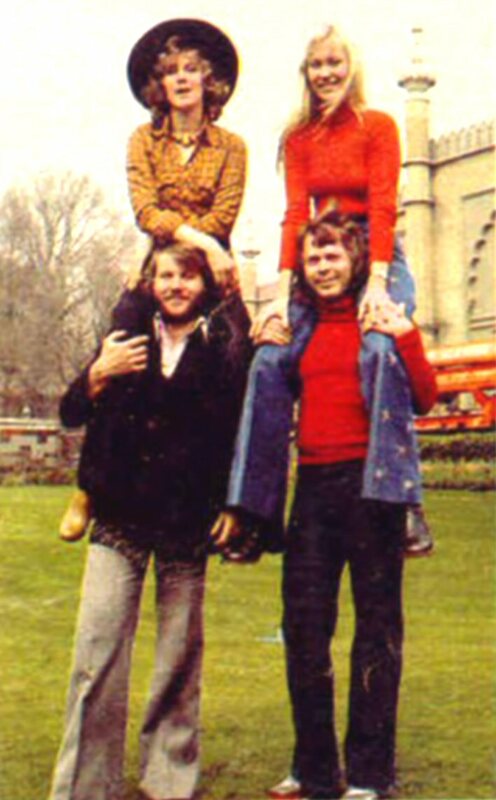 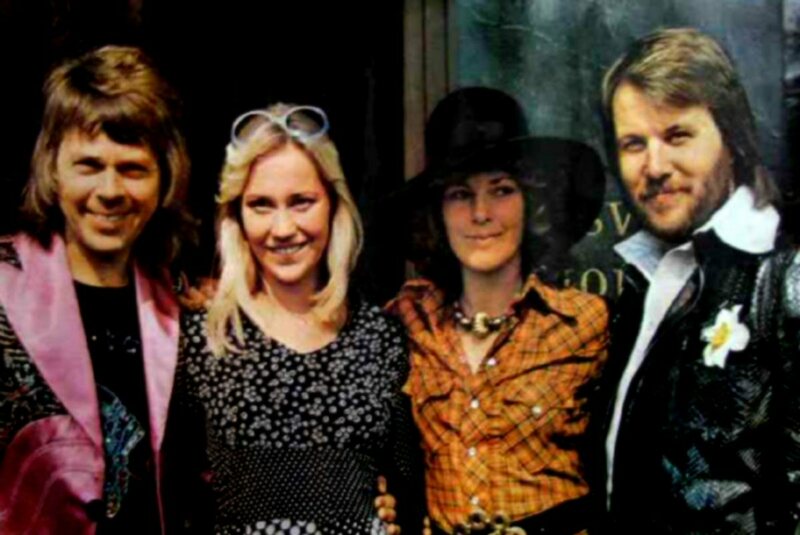 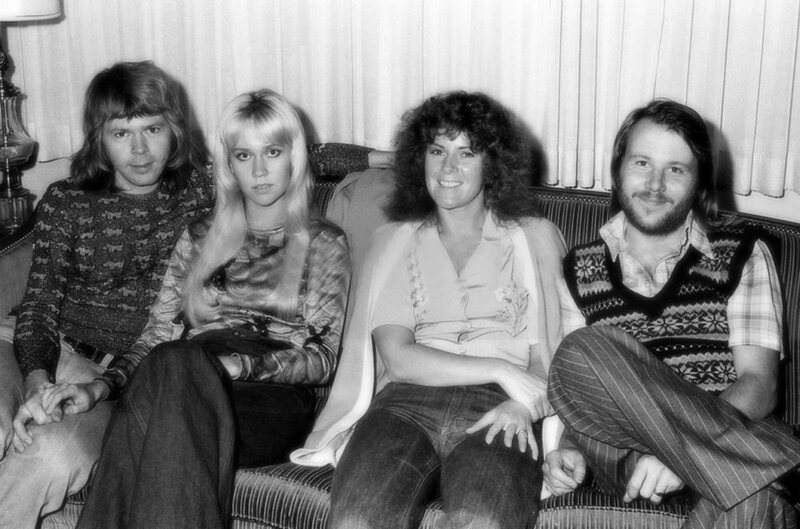 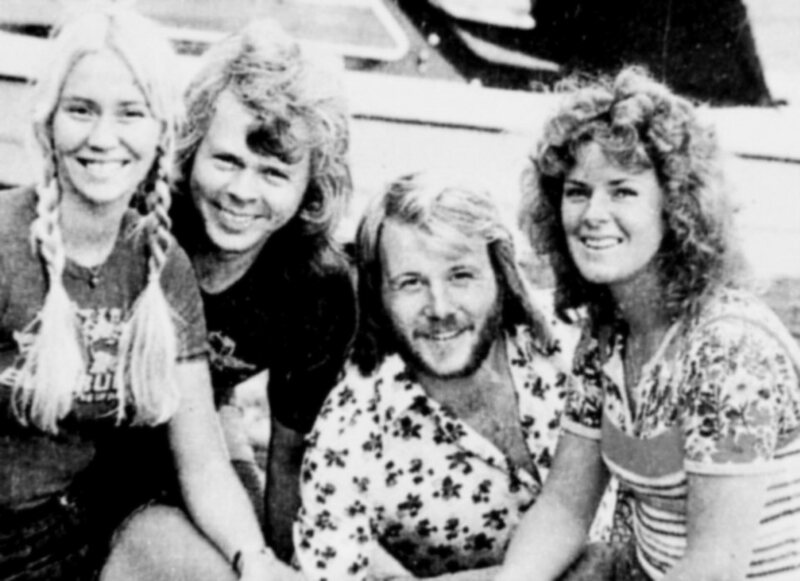 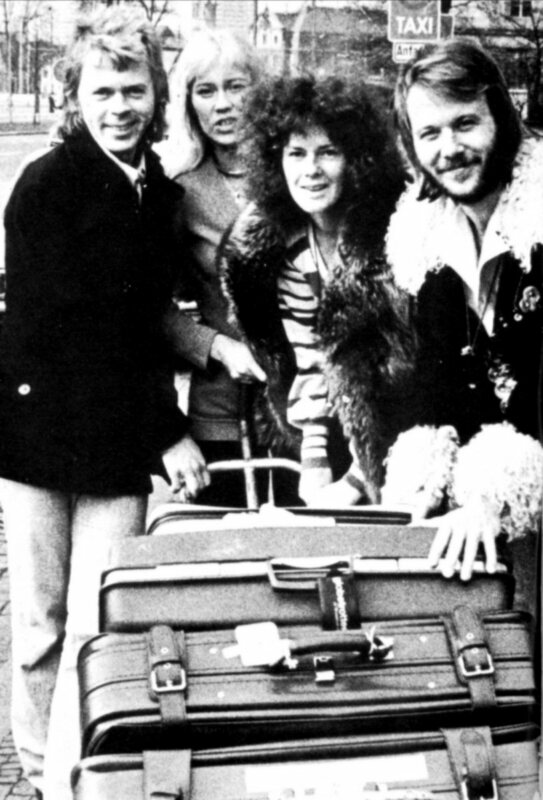 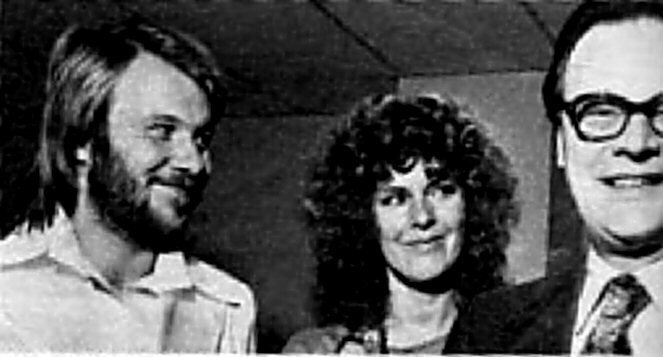 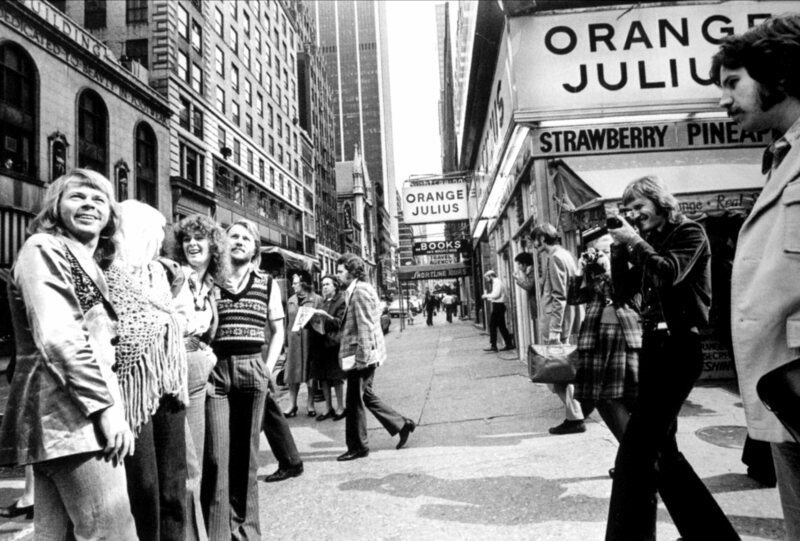 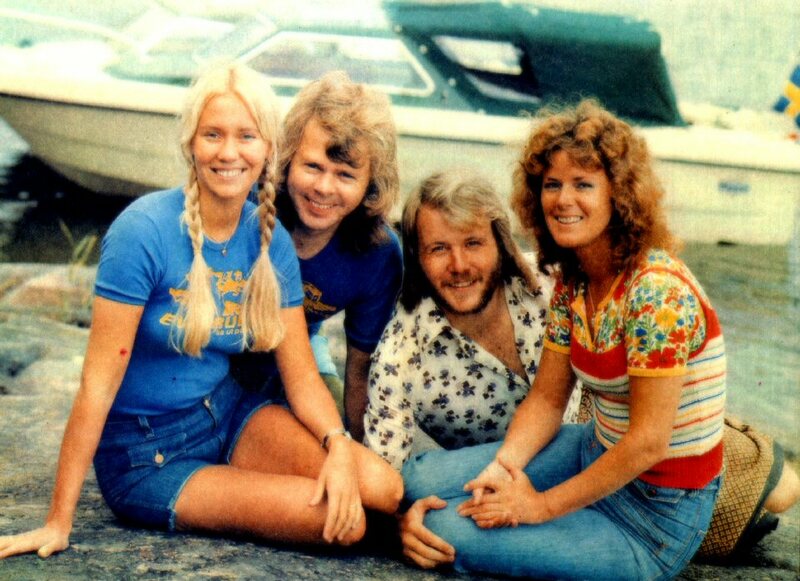 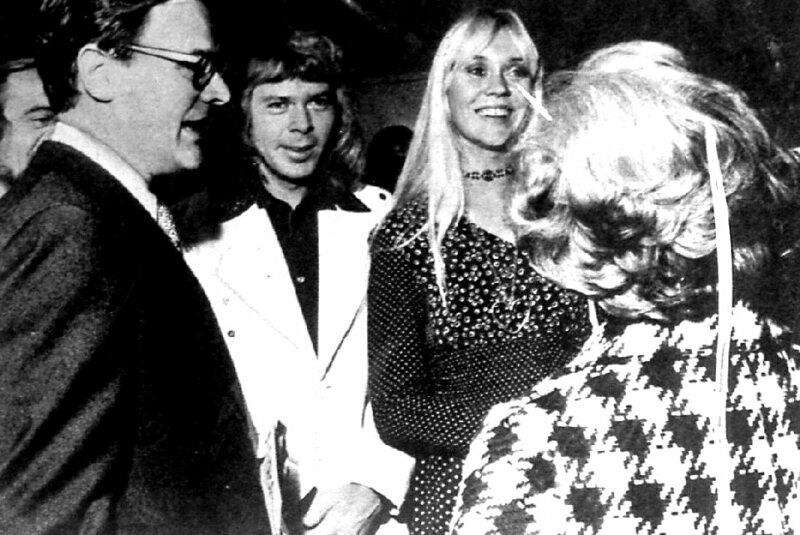 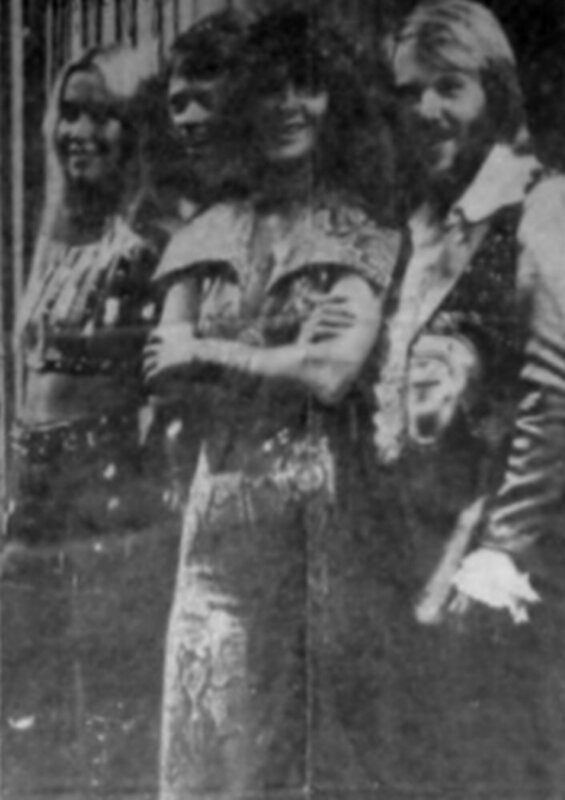 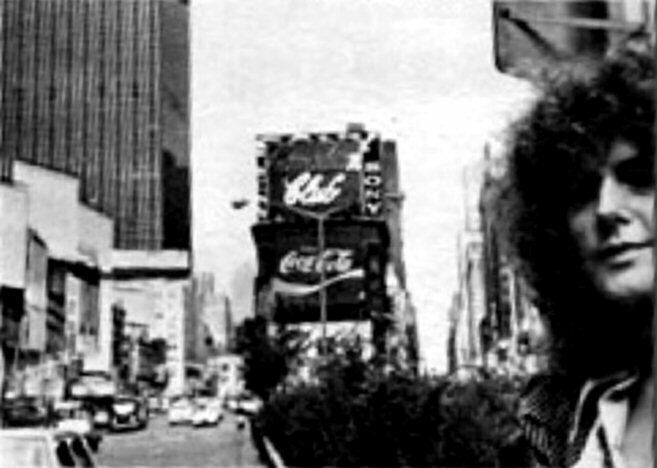 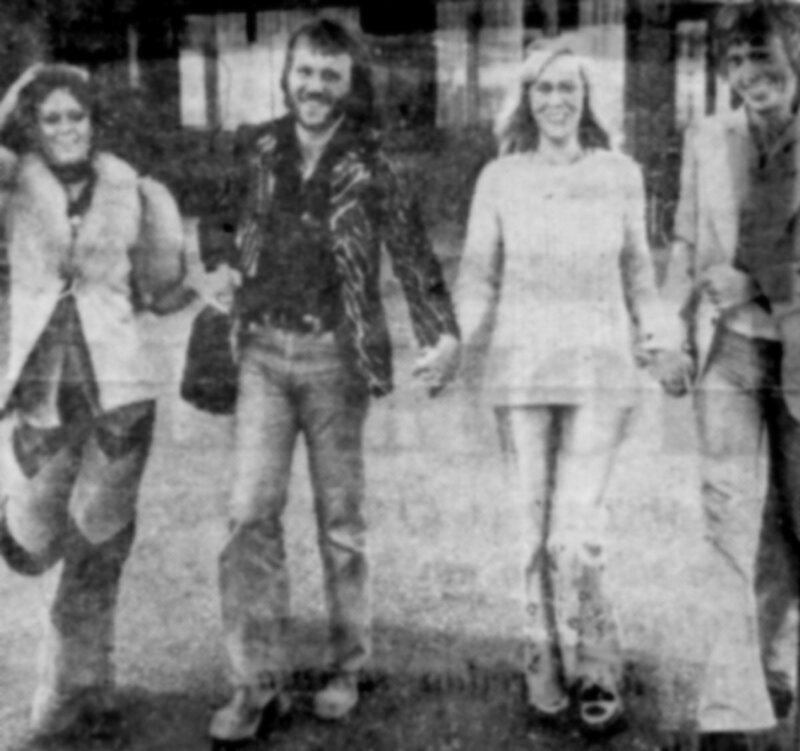 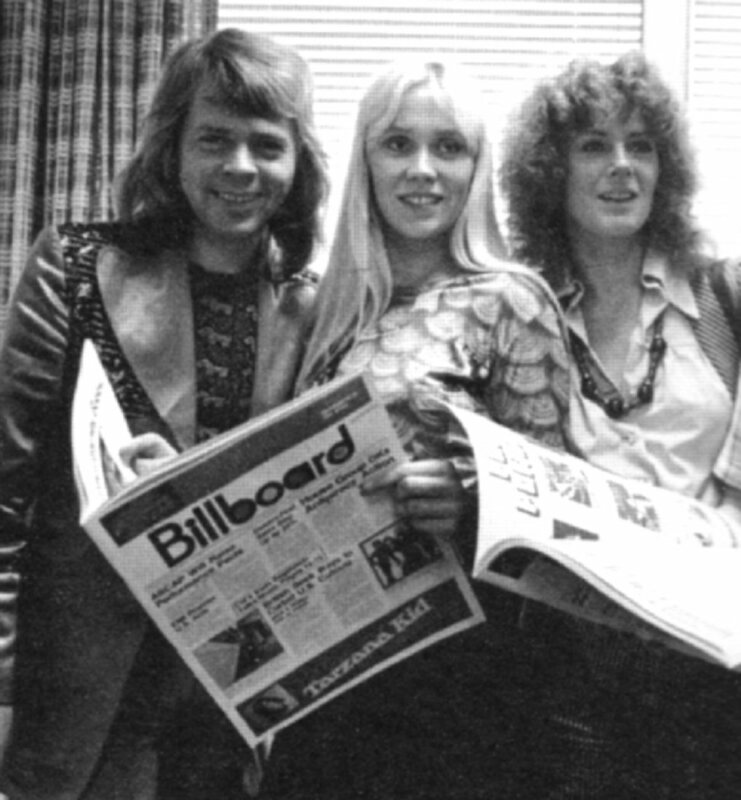 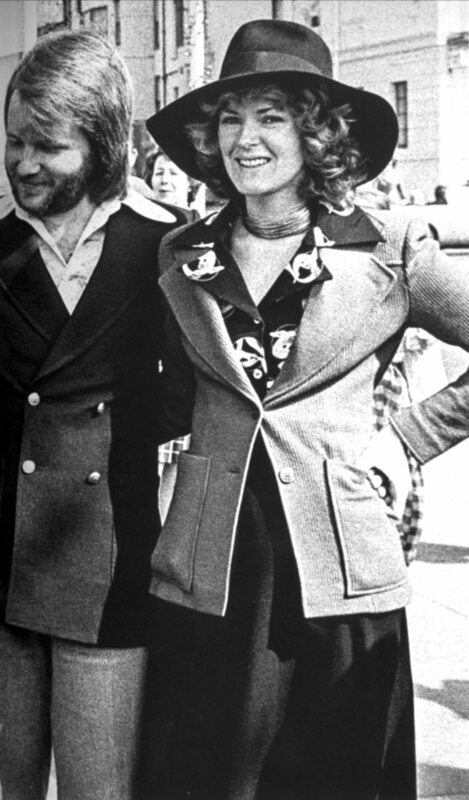 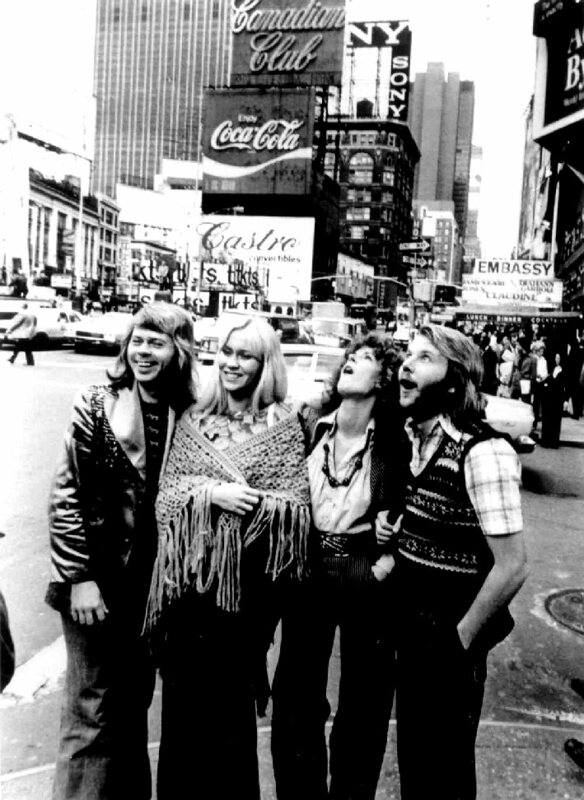 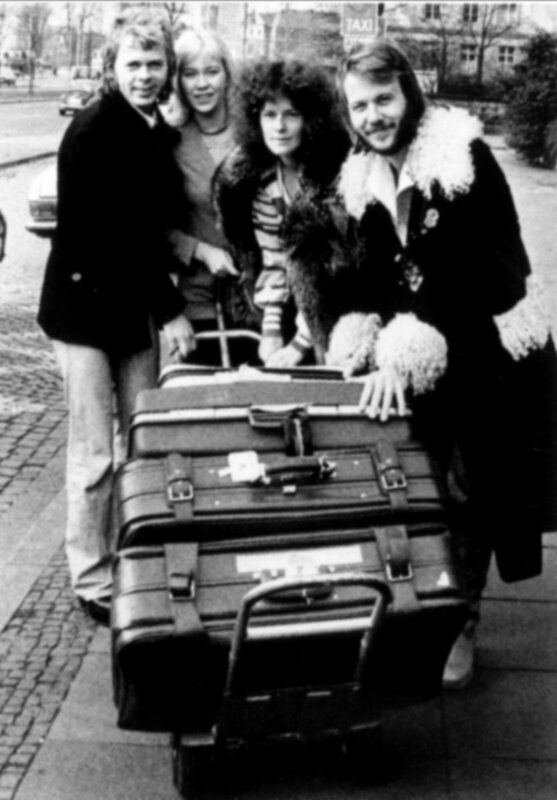 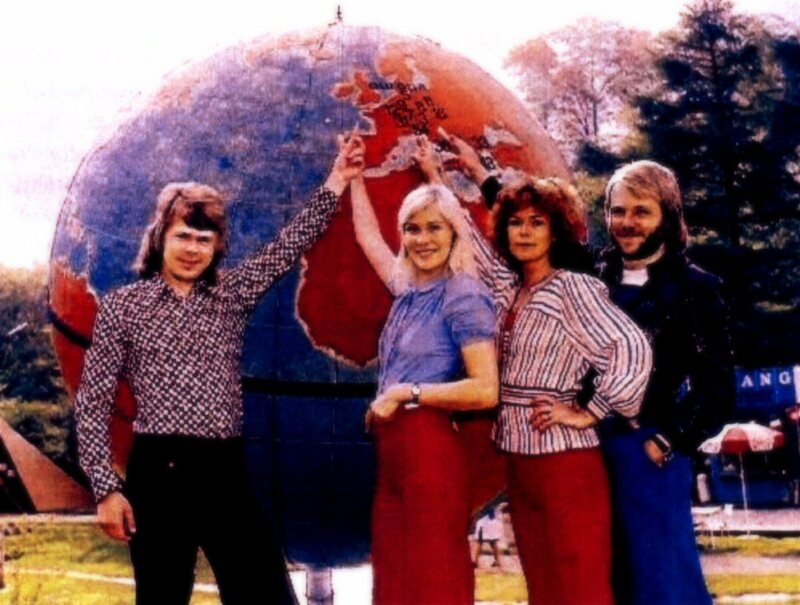 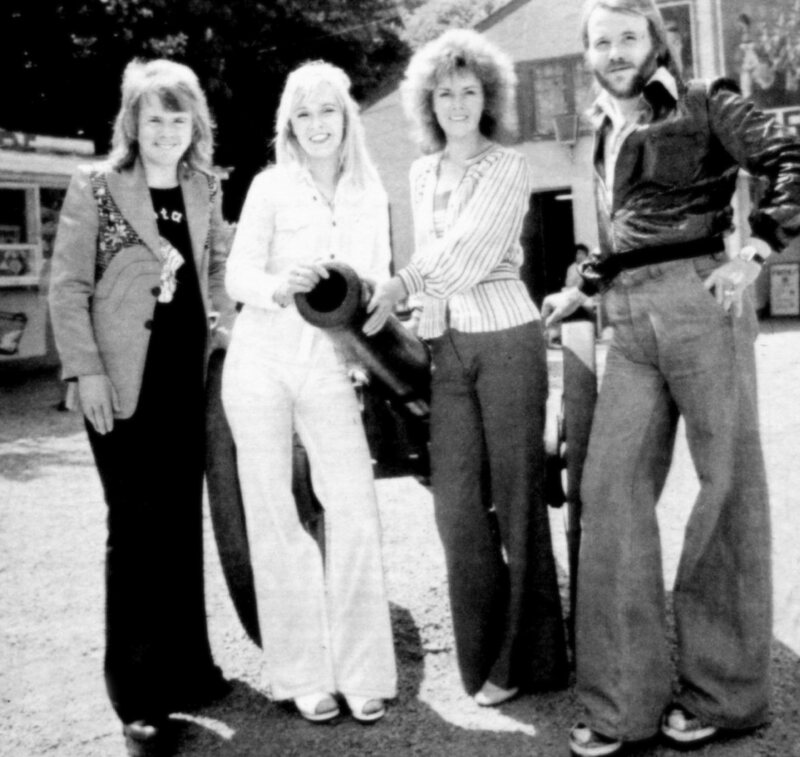 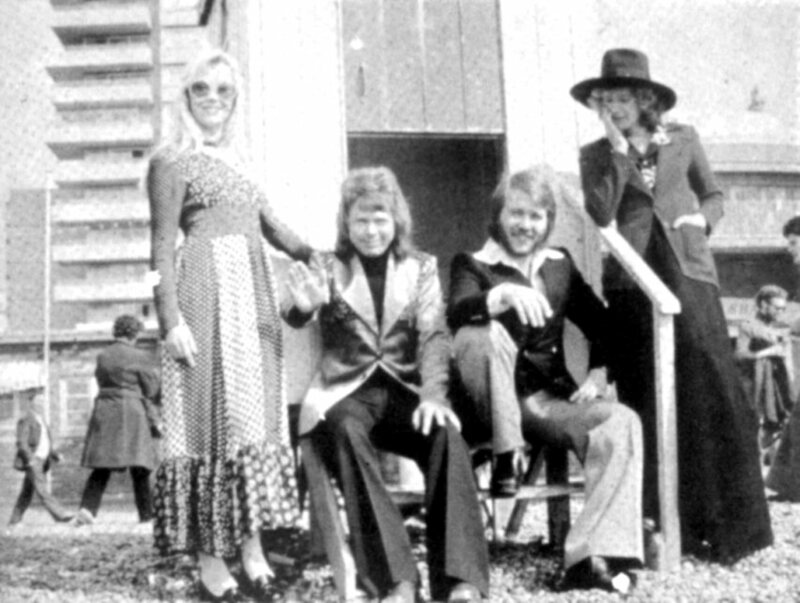 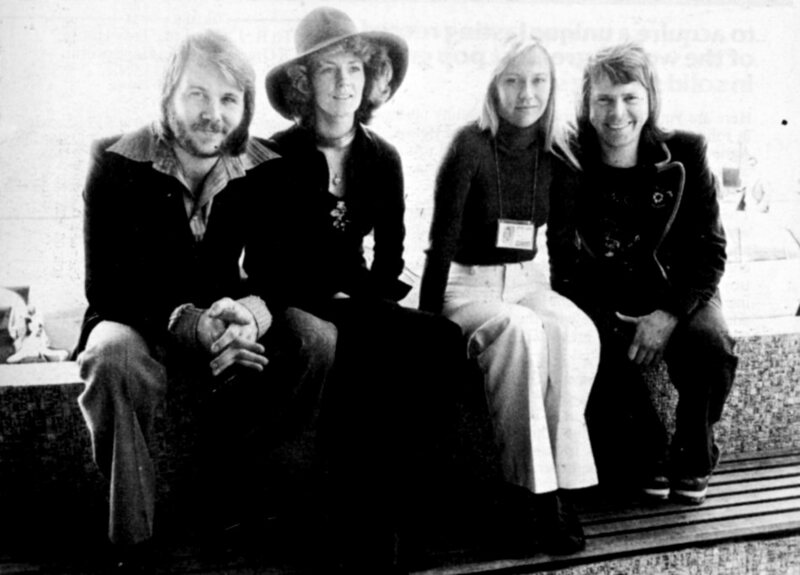 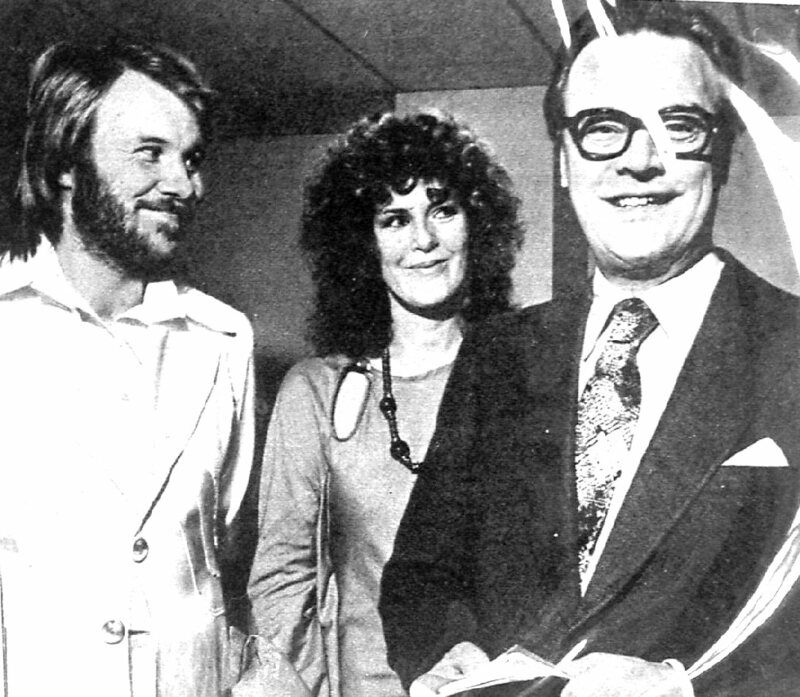 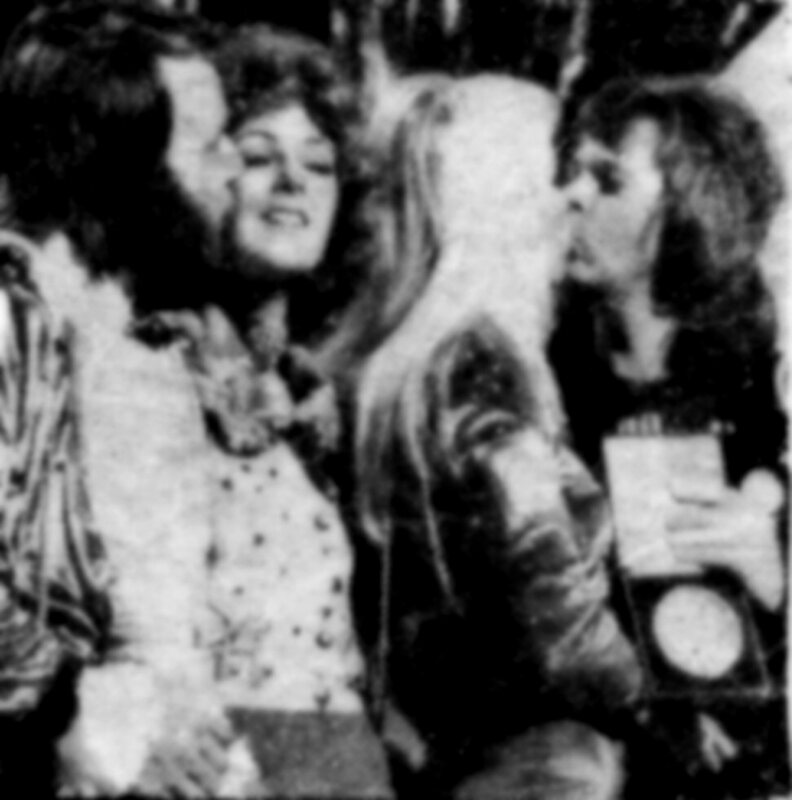 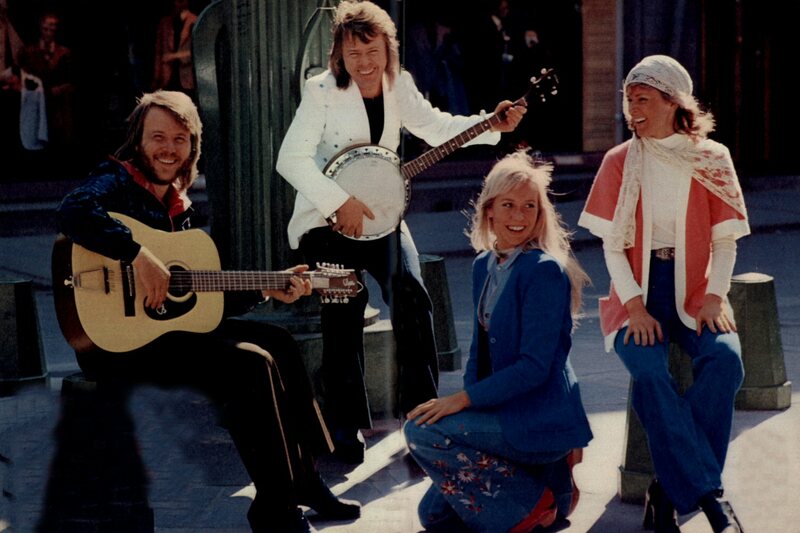 At the end of September ABBA traveled to USA for their first promotional trip in this country. 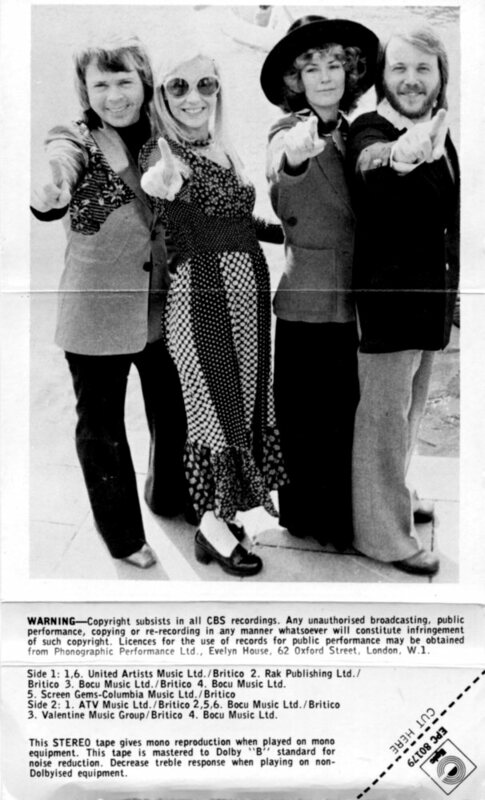 They stayed in New York where they met journalists and appeared on TV in Mike Douglas Show. 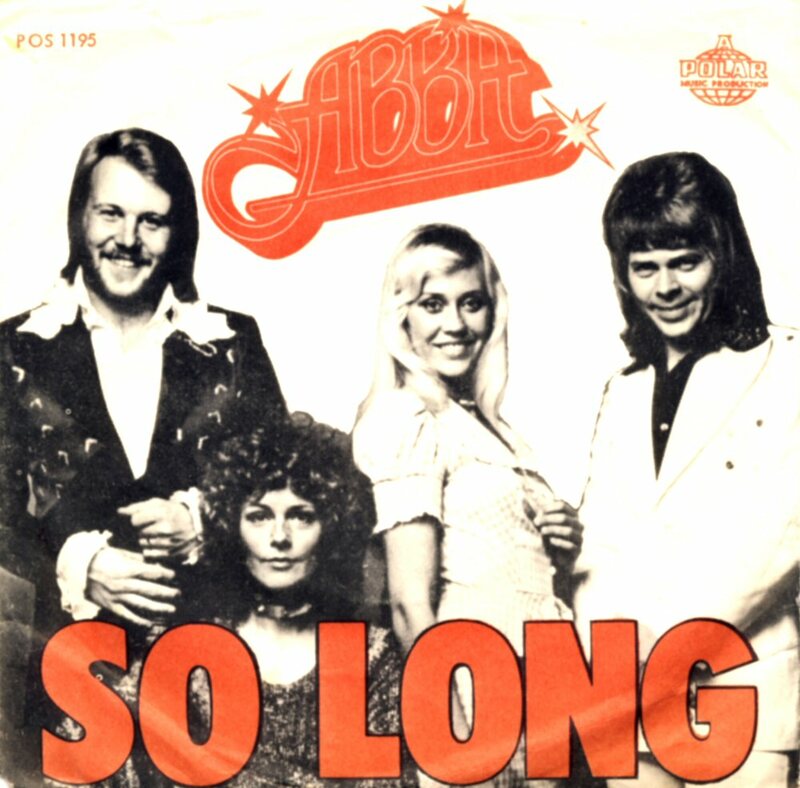 In October 1974 RCA Victor released an EP containing 4 songs in Australia. 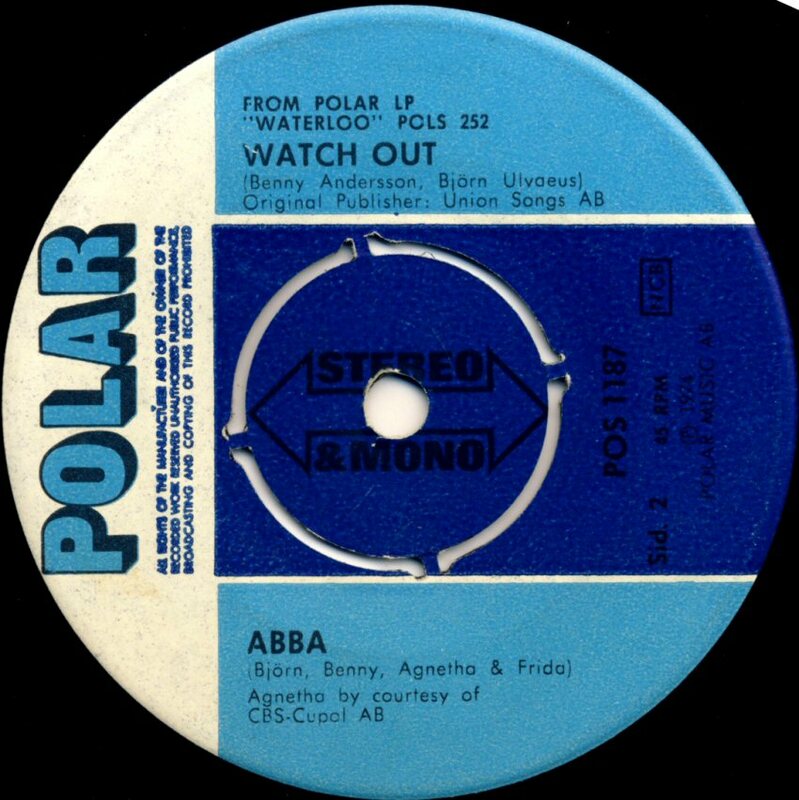 The songs were: Waterloo/Watch Out/Ring Ring/Rock'n'Roll Band. 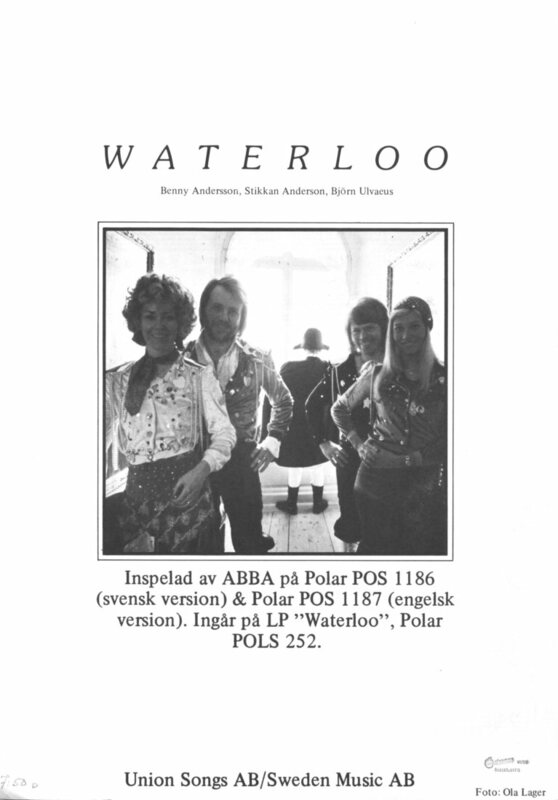 Probably the most odd release in ABBA's history with a very ugly cover. 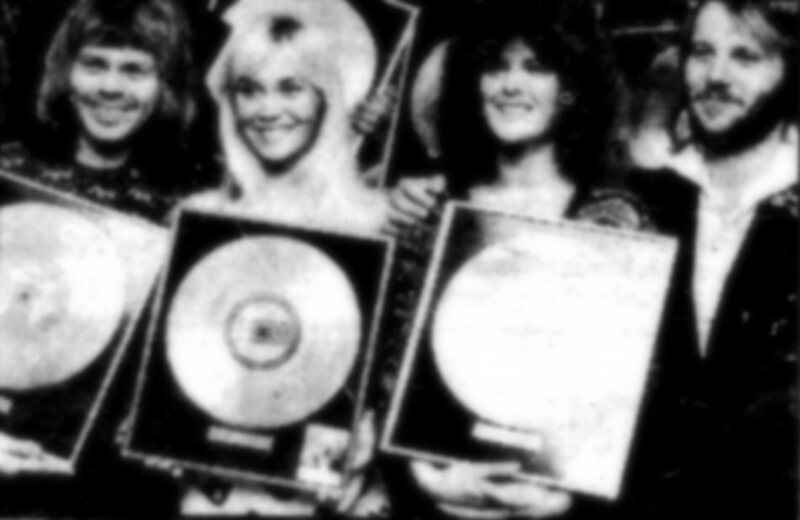 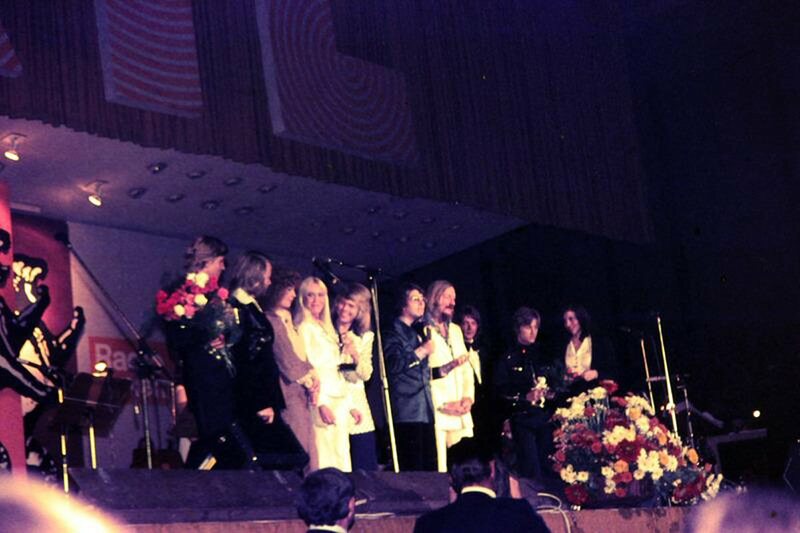 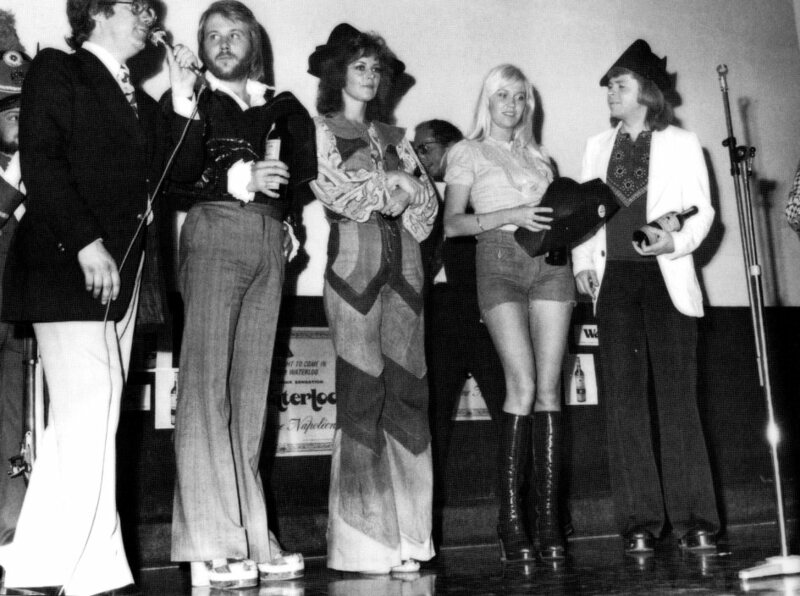 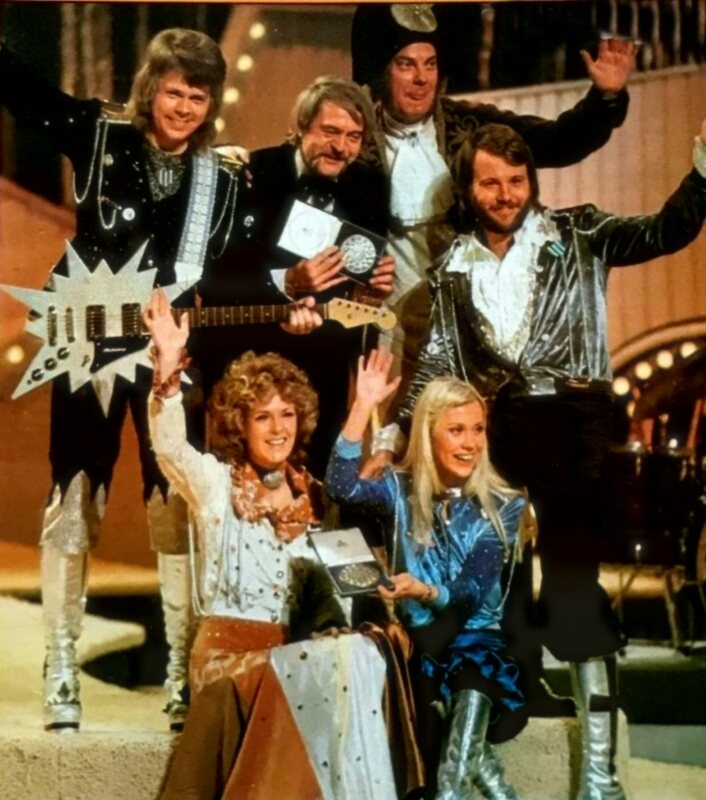 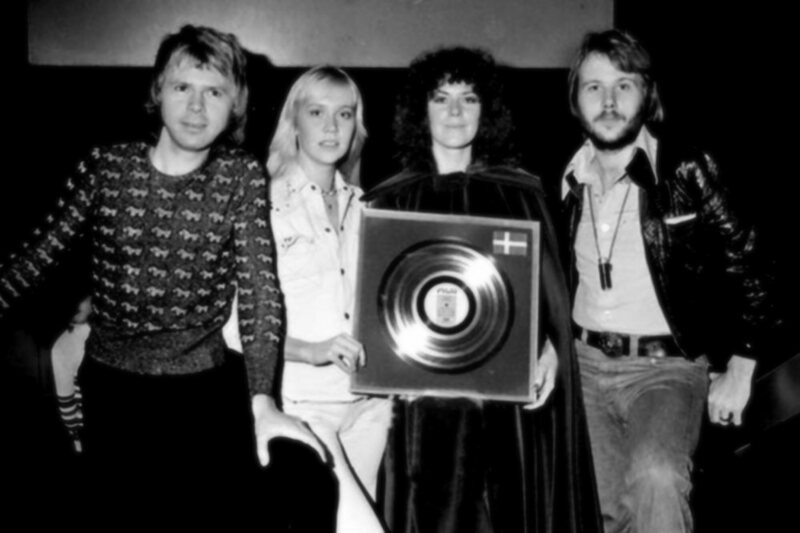 On October 3rd, 1974 ABBA were awarded with the Golden Lion Award (Der goldene Löwe) by Radio Luxembourg. 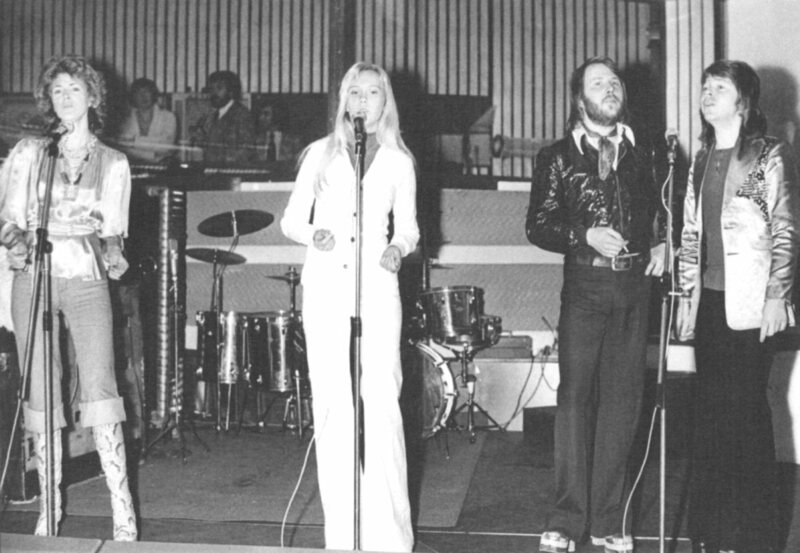 The group even performed "Ring Ring". 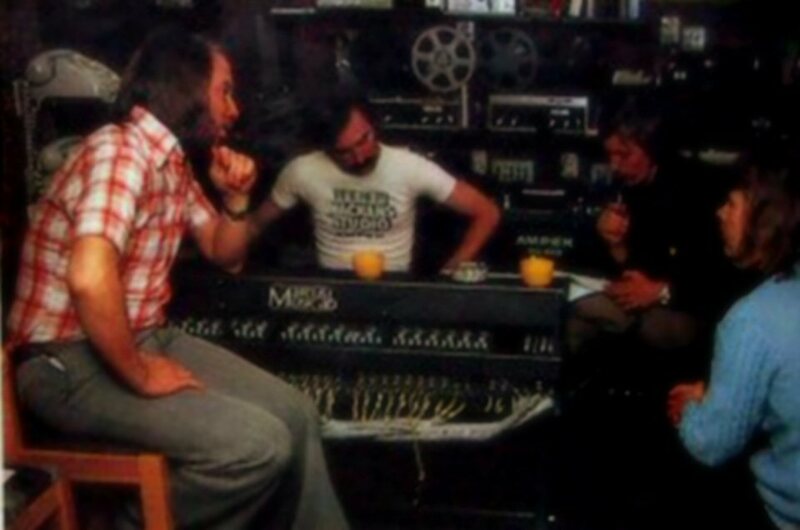 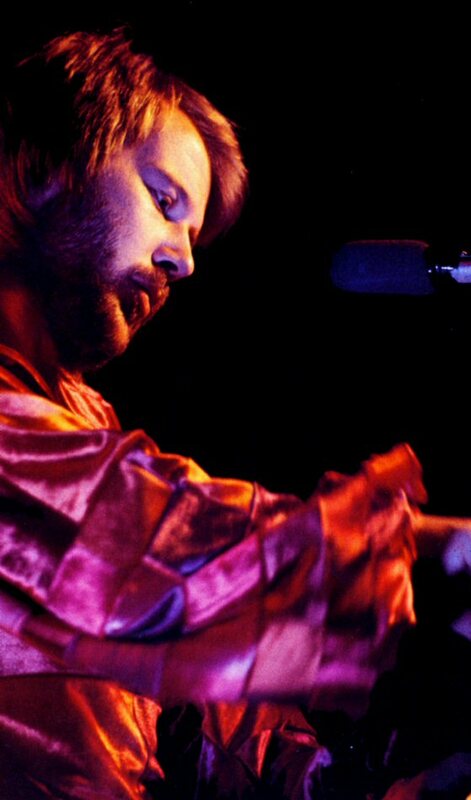 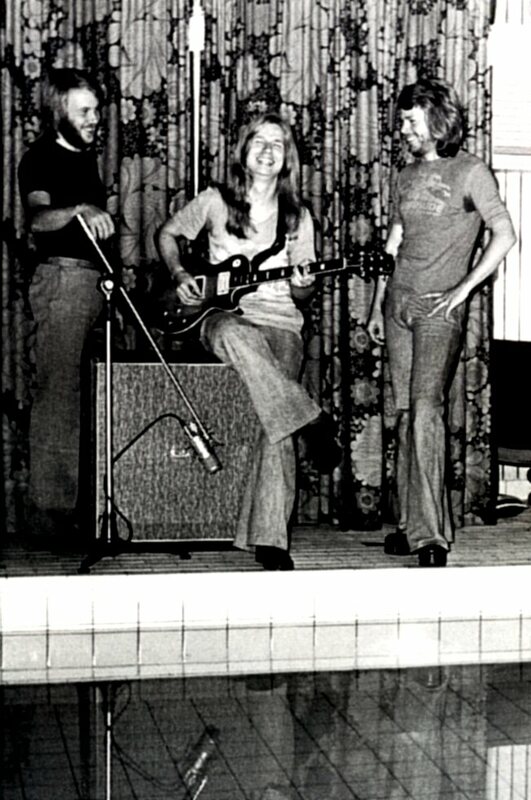 The recording sessions for a new album started already in September 1974. 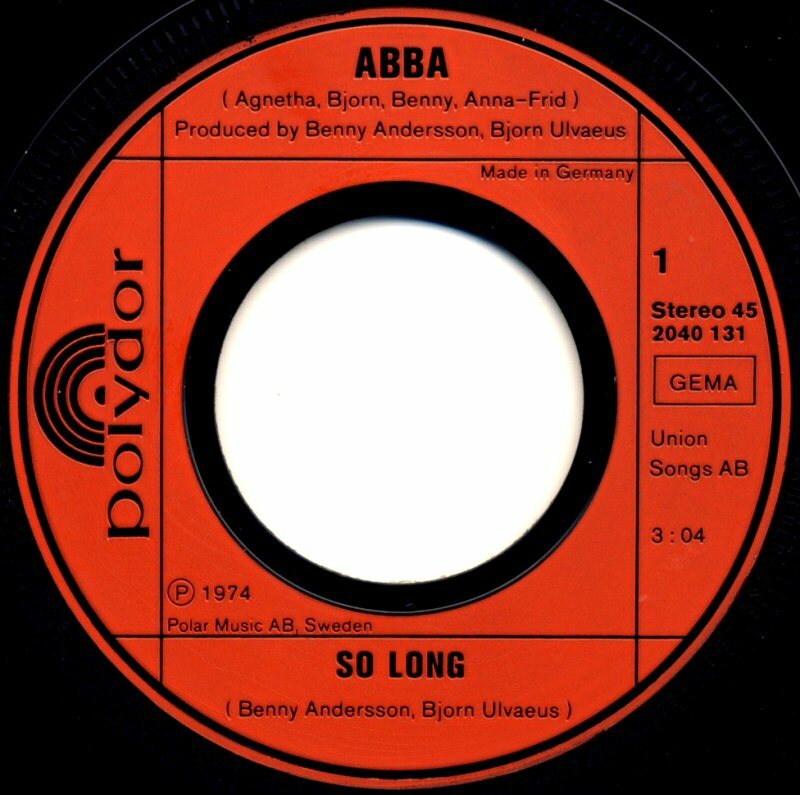 France was one of the first European countries that released the single "So Long" b/w "I've Been Waiting For You" from the upcoming new album scheduled for spring 1975.. 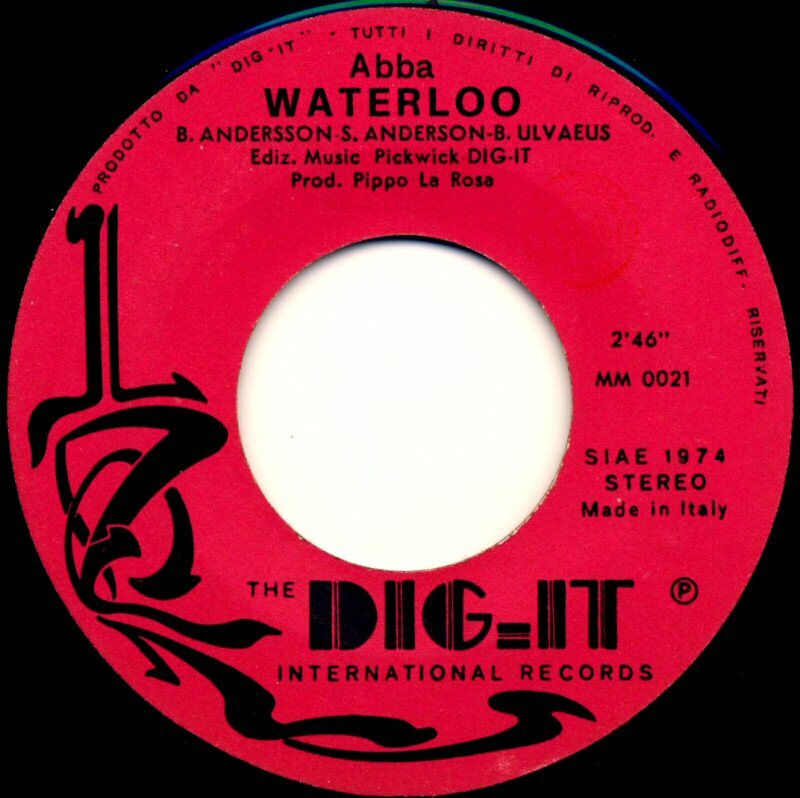 The single saw its French release in October 1974 and it appeared shortly on the French chart where it peaked at #64. 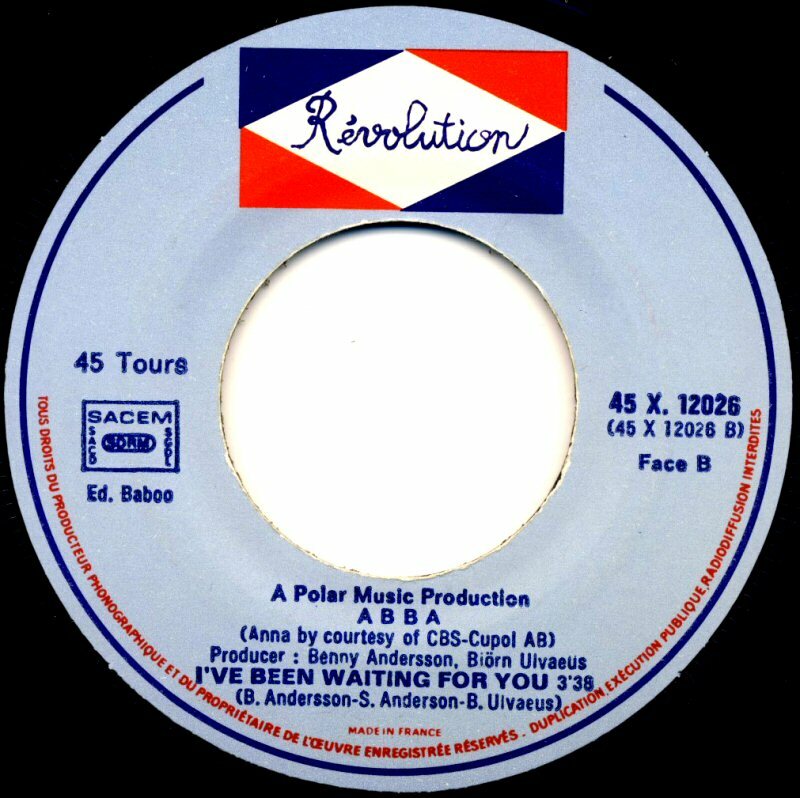 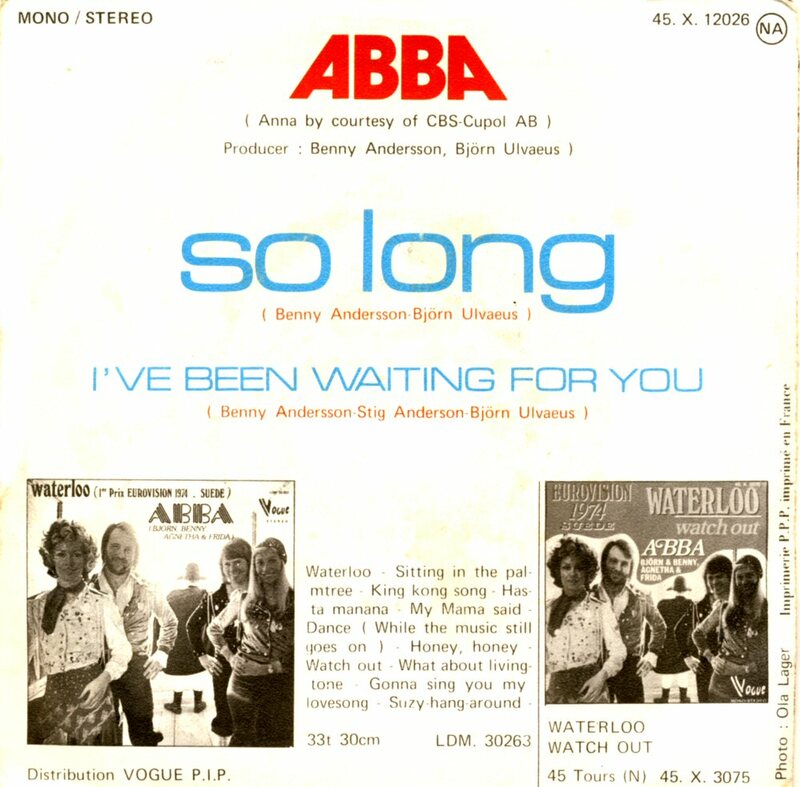 The single "So Long"/"I've been Waiting for You" was released in Great Britain on November 18th, 1974. 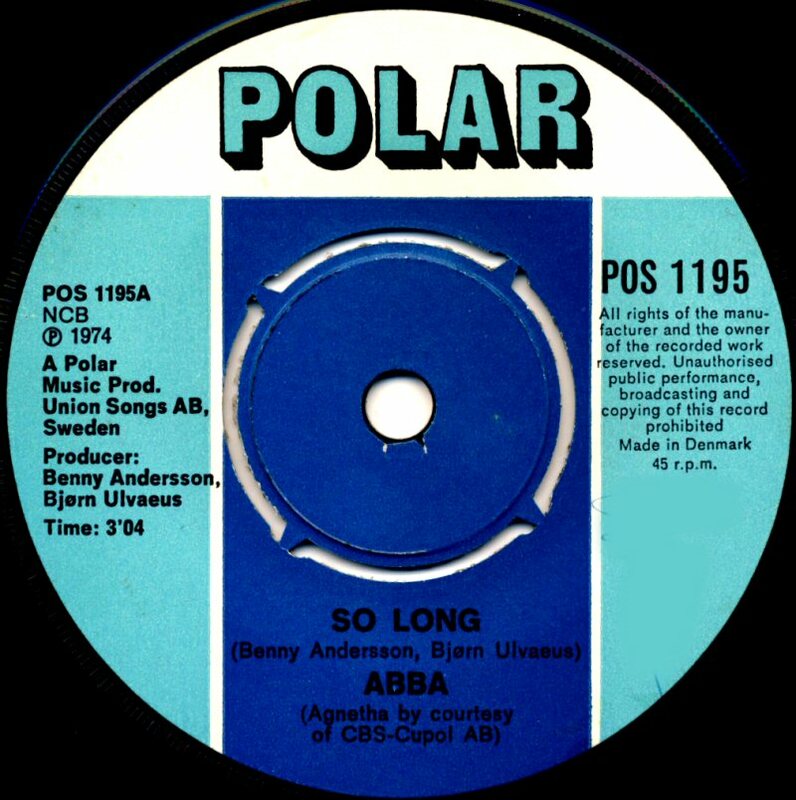 Maybe the choice of "So Long" on the A-side was not the right decision? 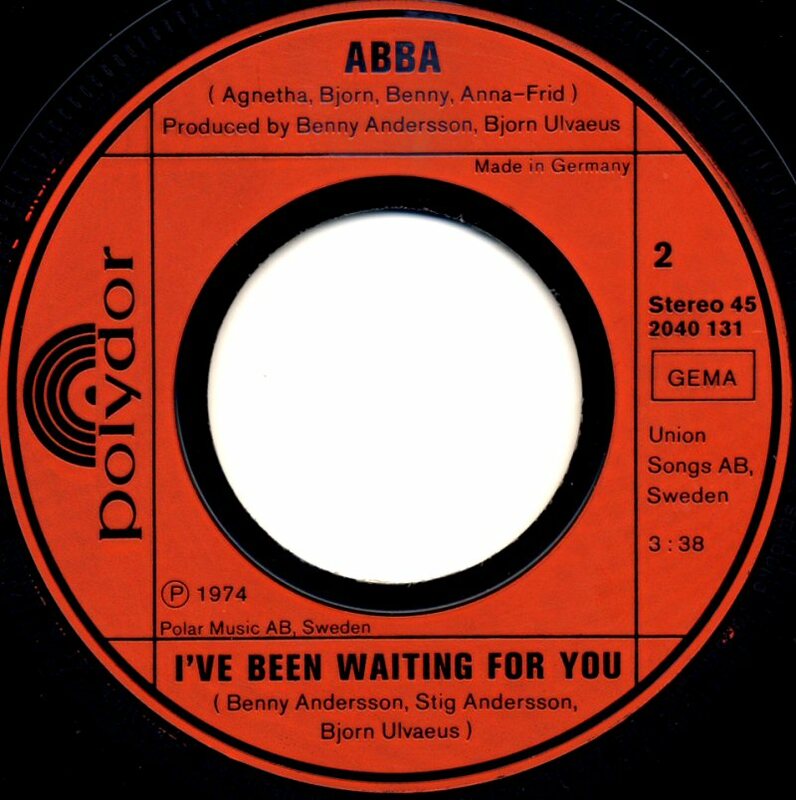 Maybe "I've Been Waiting For You" would have had a bigger chance to bring ABBA to the UK Top Ten already then? 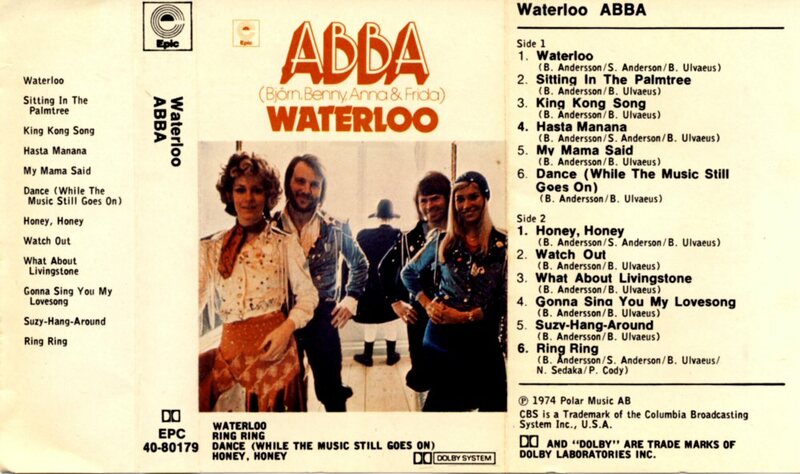 Anyway "So Long" was not good enough for the British music market and it sounded too much as "Waterloo". 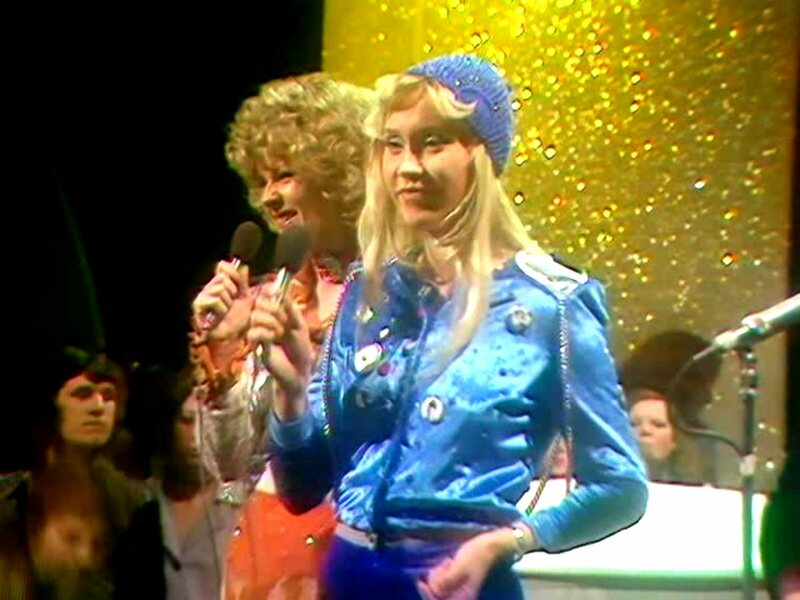 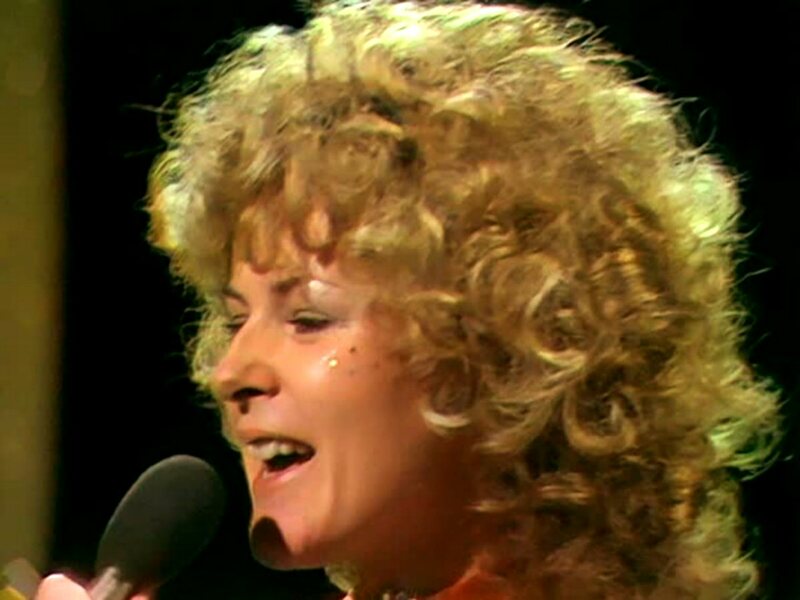 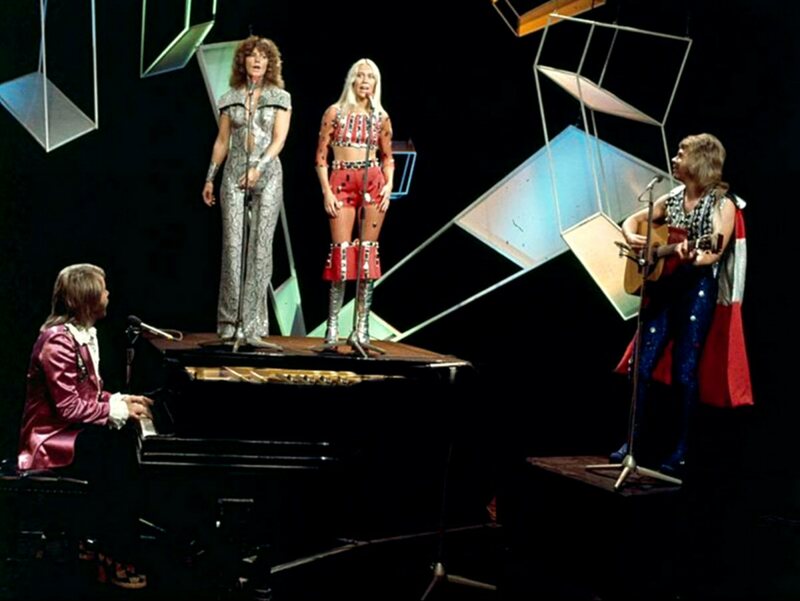 It did not enter the British chart even if ABBA performed the song in Top of The Pops in December 1974. 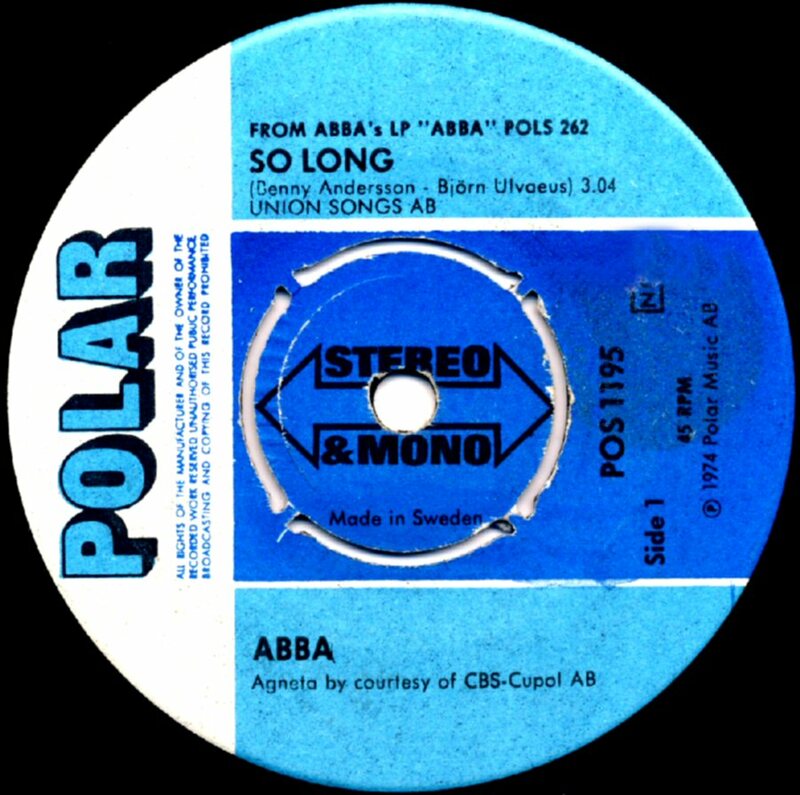 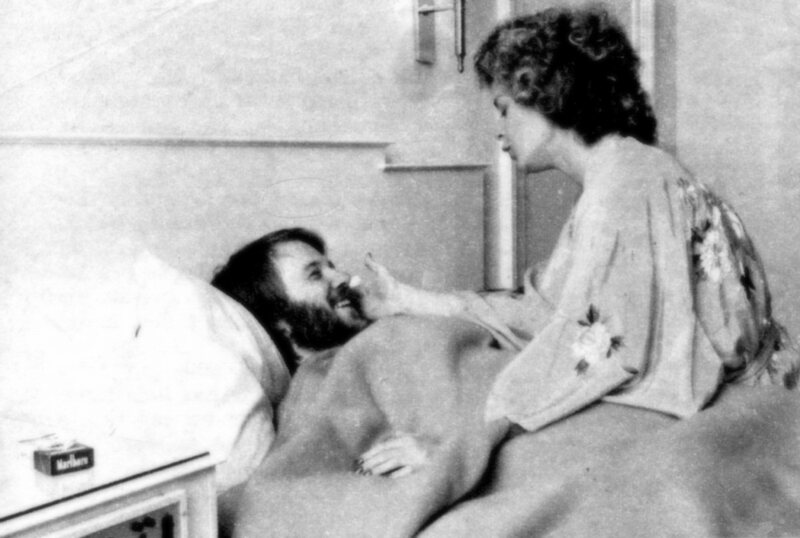 "So Long" entered the Swedish "Topplistan" on January 28th, 1975 and stayed there for 8 weeks peaking at #7. 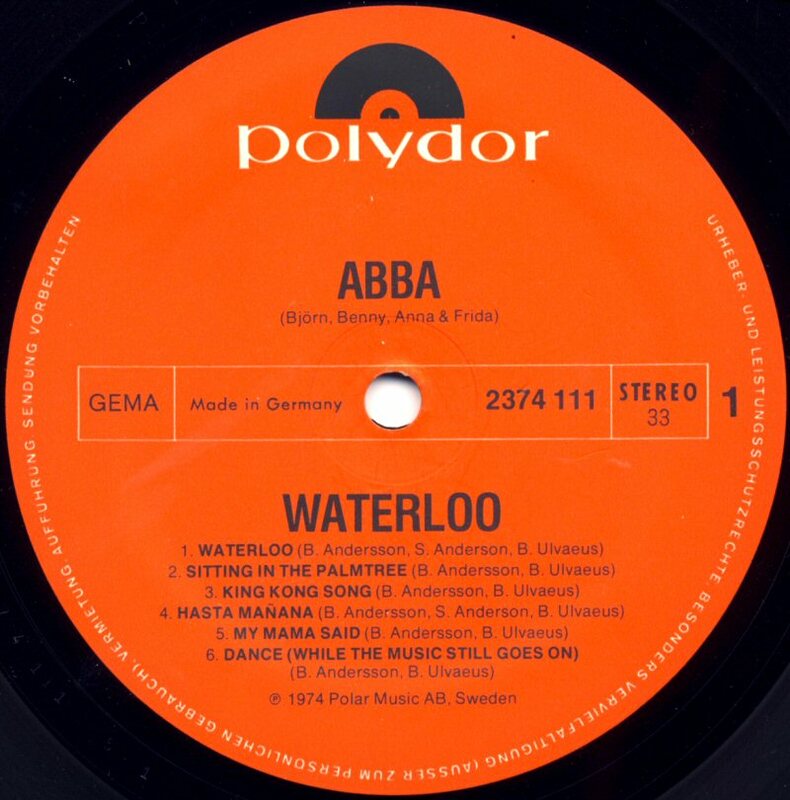 In West Germany it entered the chart on December 16th, 1974 and reached no 11. 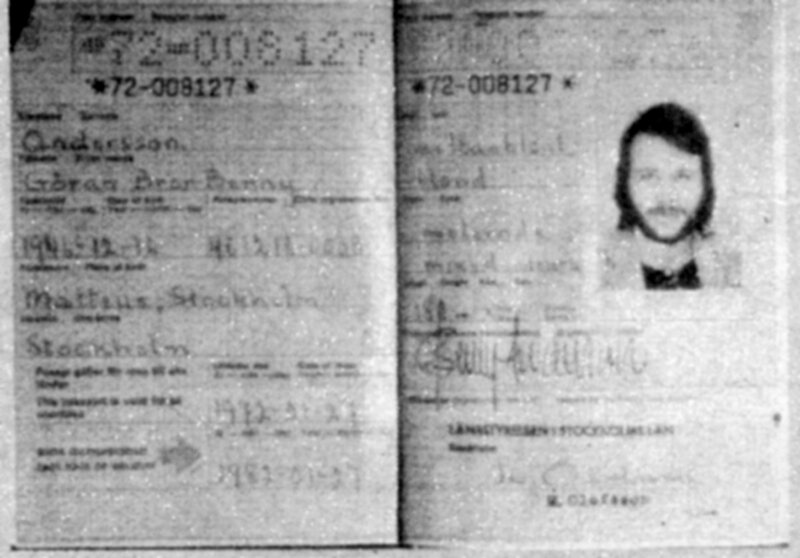 In Belgium on #29 and in Austria on #5. 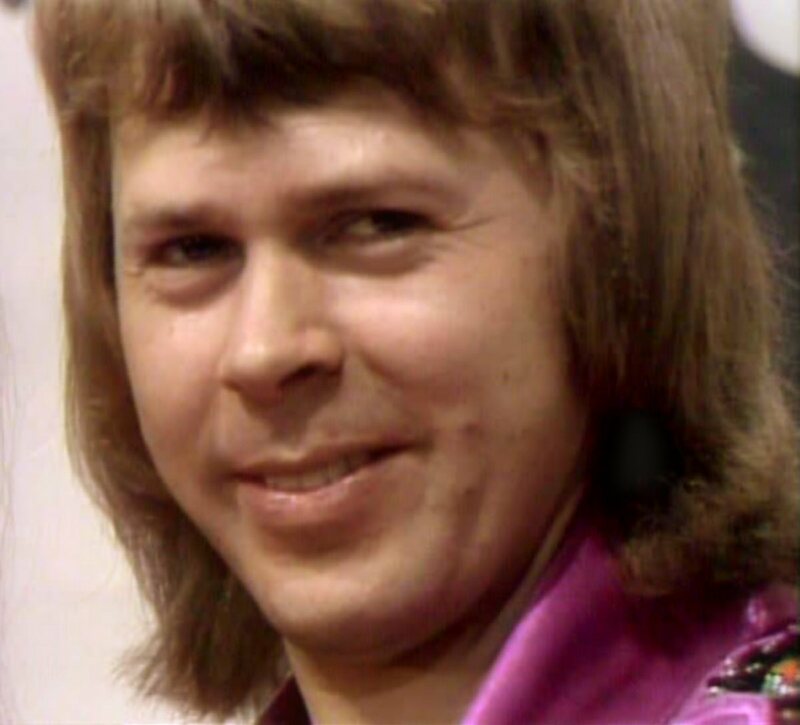 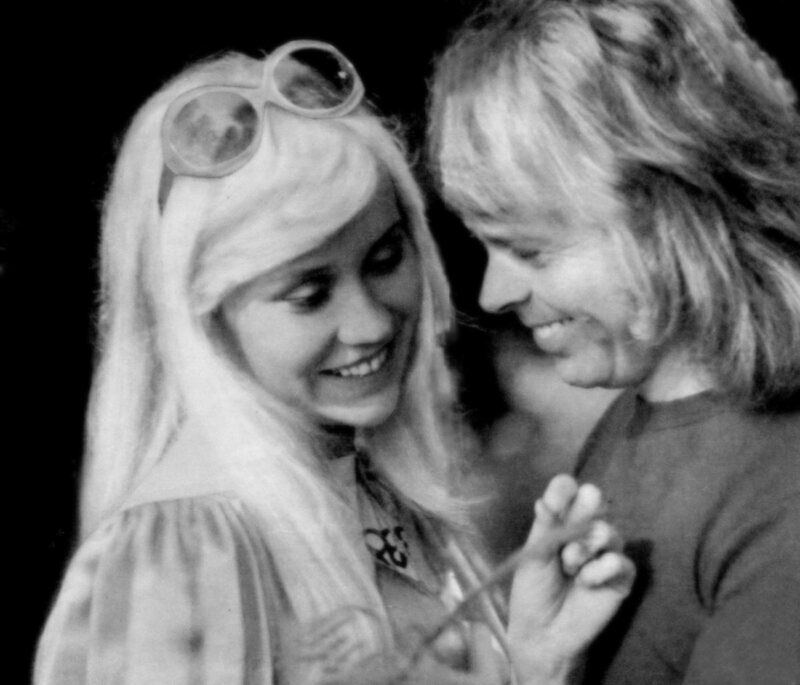 At the beginning of November Björn gave an interview for Finnish TV where he answered the questions concerning the forthcoming tour in Europe. 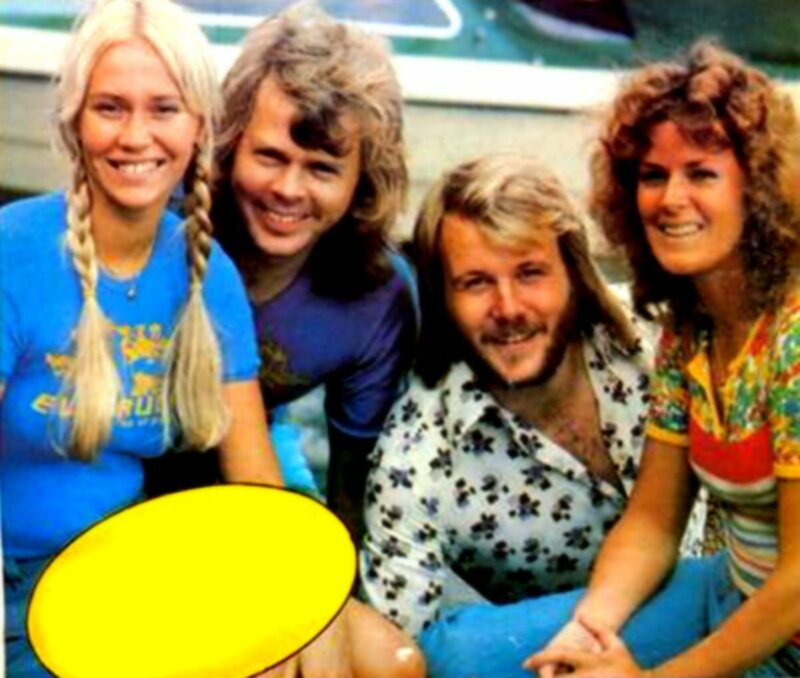 He confirmed that Finland was included during the second leg of ABBA's tour - the Scandinavian part of the tour. 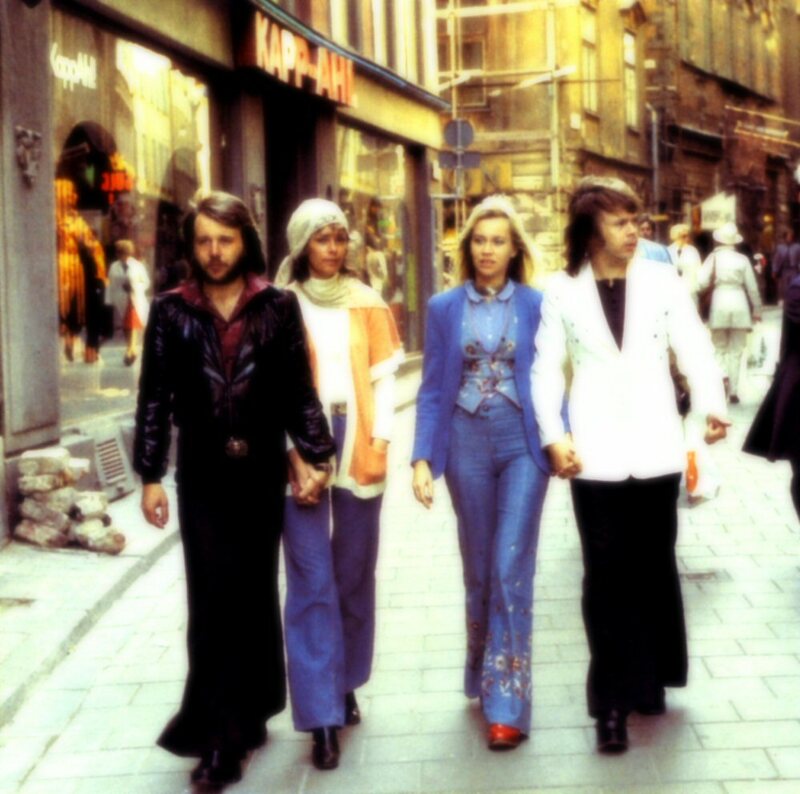 ABBA would perform live in Helsinki/Finland on January 20th, 1975. 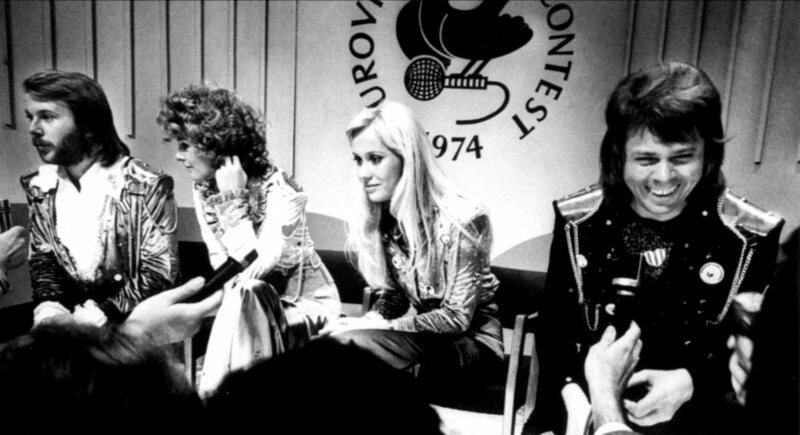 At the beginning of November ABBA recorded a TV show in Austria. 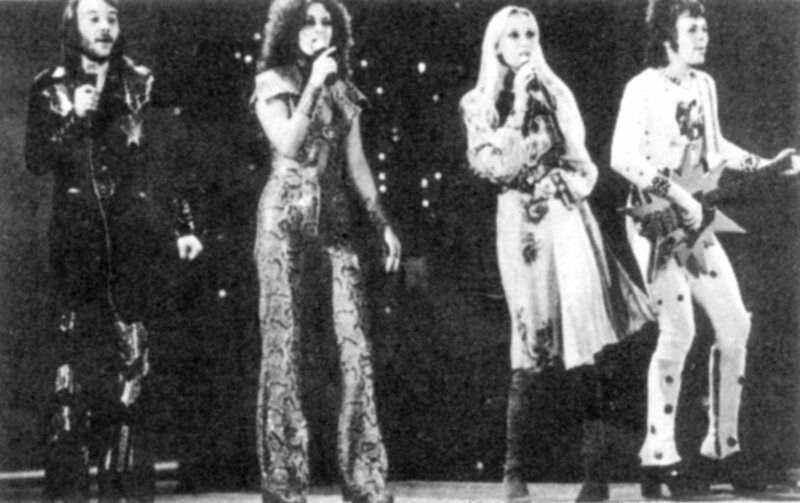 The group performed "Honey Honey" and "So Long". 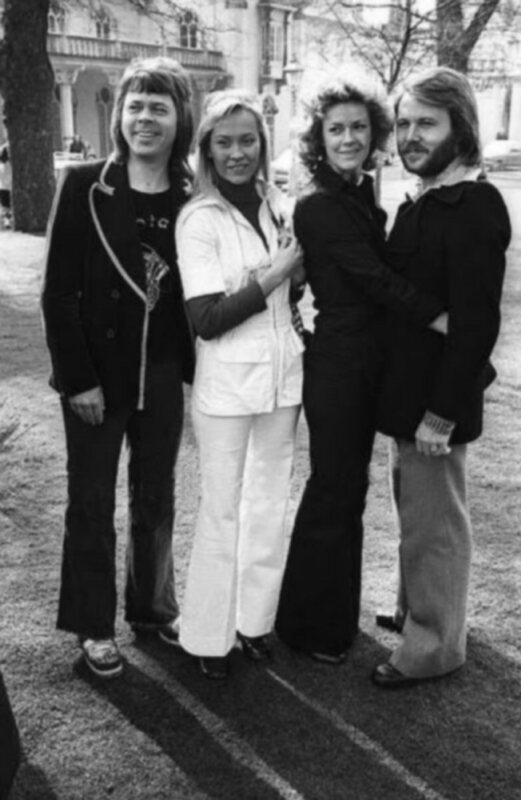 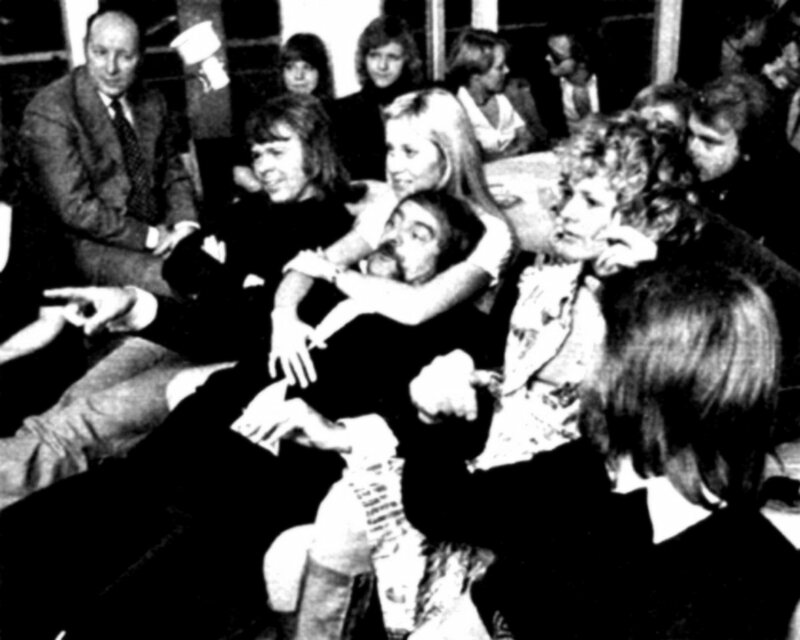 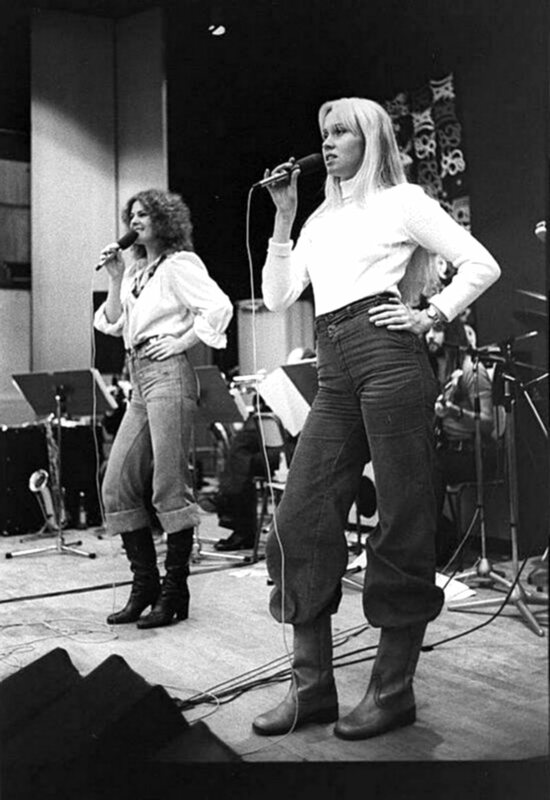 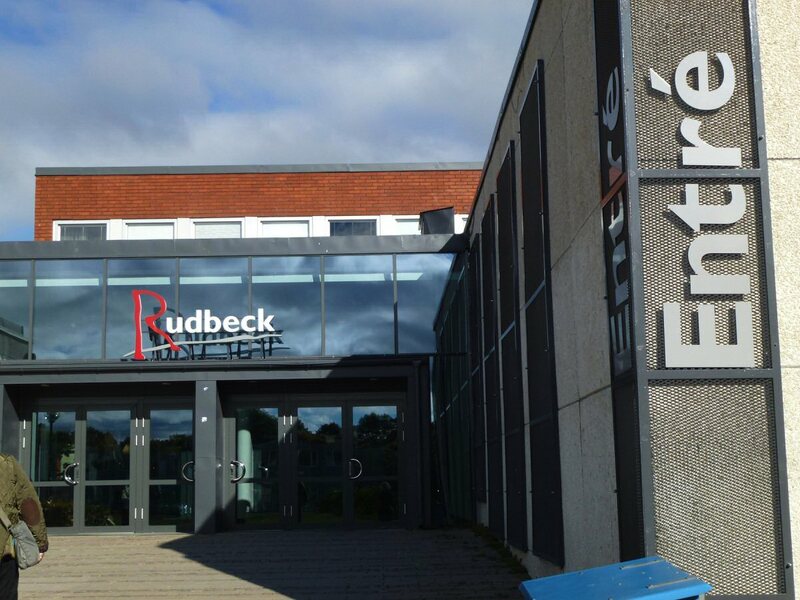 ABBA held the rehearsals before their first big international tour at the Rudbeck school in Sollentuna outside Stockholm at the beginning of November. 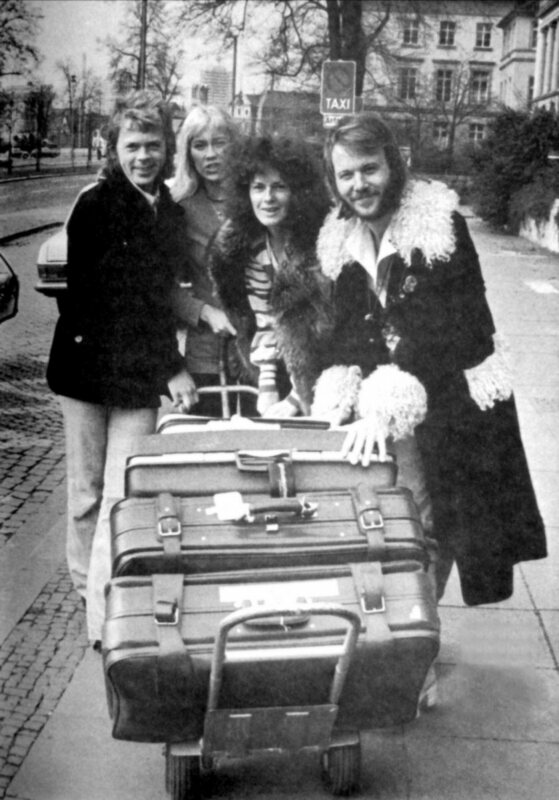 17 - Copenhagen, 18 - Hannover, 19 - Munich, 21 - Frankfurt, 22 - Berlin, 23 - Nürnberg, 24 - Wien, 25 - Innsbruck, 28 - Düsseldorf (cancelled - Frida sick), 29 - Bremen, 30 - Hamburg + Zürich (Switzerland) (cancelled). 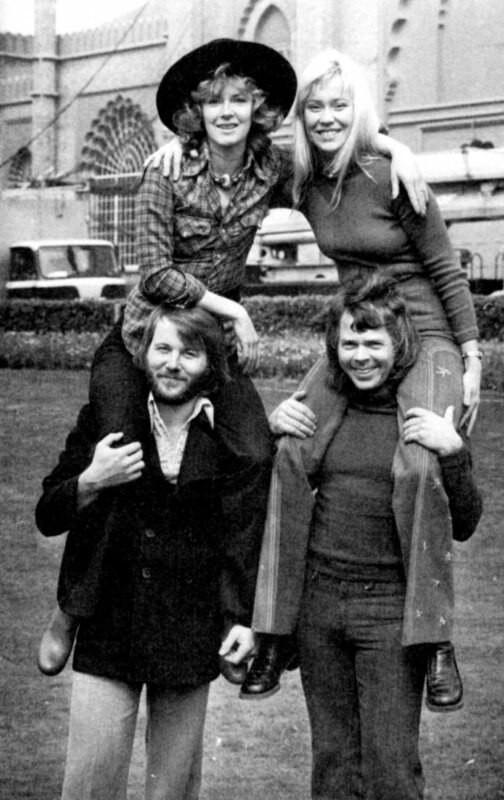 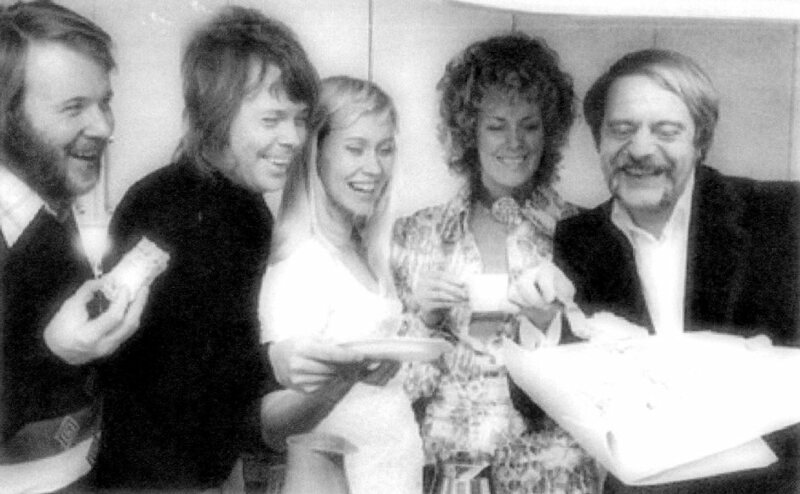 On November 17th, ABBA were in Copenhagen were they had some time for press and promotion. 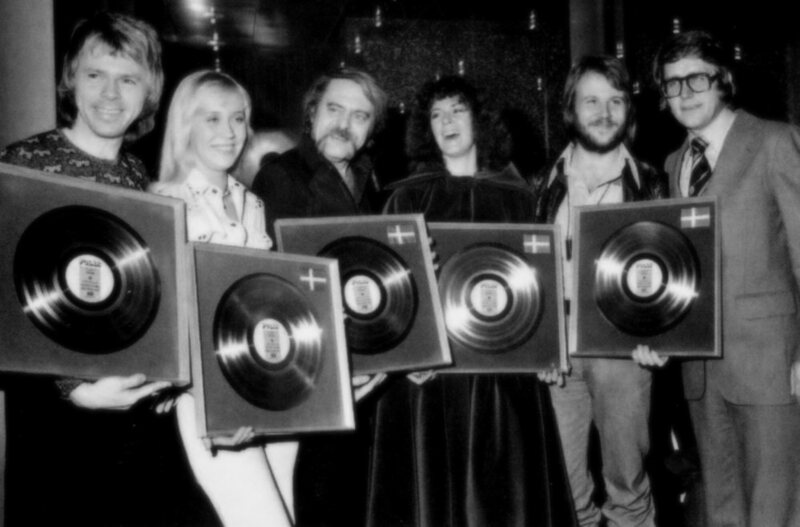 They were awarded for selling 25 000 of "Waterloo" album. 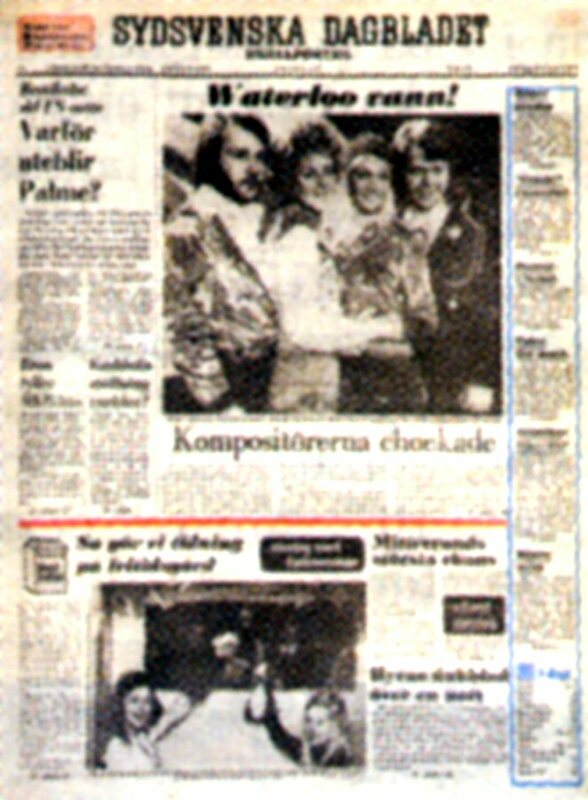 The ceremony took place at the restaurant Wivex in Tivoli. 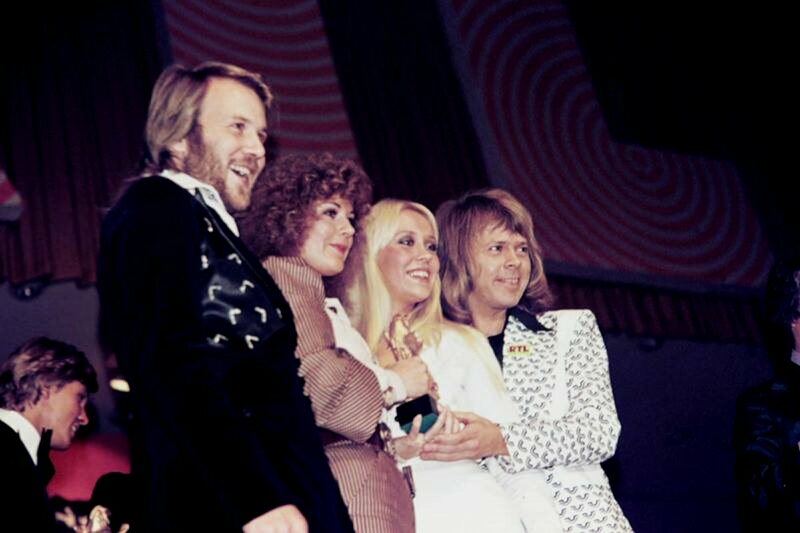 The tour in West Germany, Switzerland and Austria received very poor critics and nobody thought that ABBA would become very soon the most popular pop group in the world. 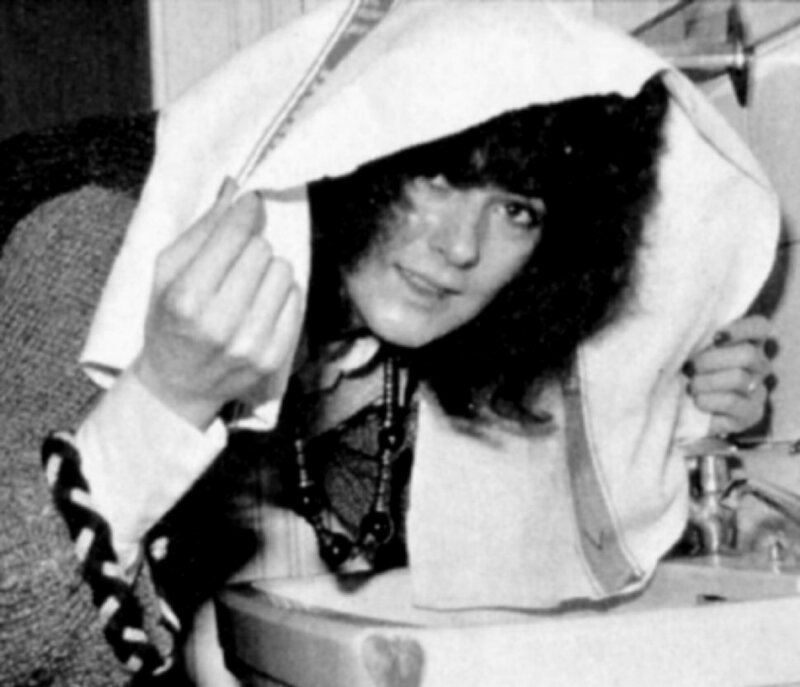 The concert scheduled for 28 November in Düsseldorf was cancelled because of Frida's flu. 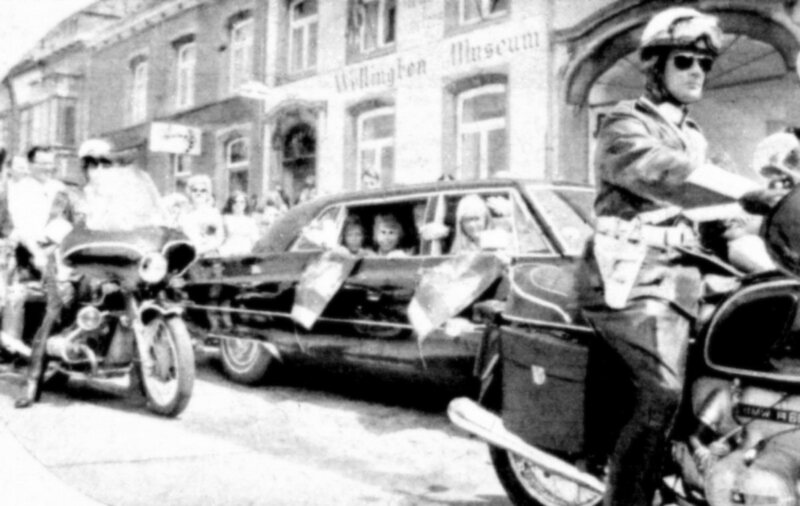 The day they played though in Bremen. ABBA did even some promotion for their new single "So Long". 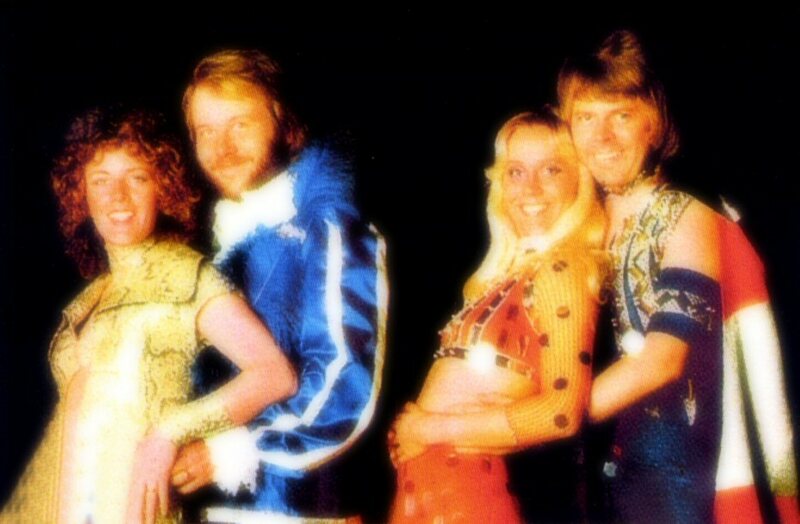 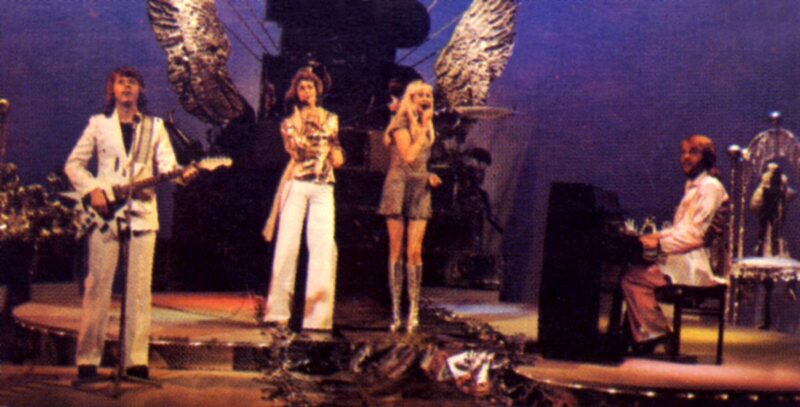 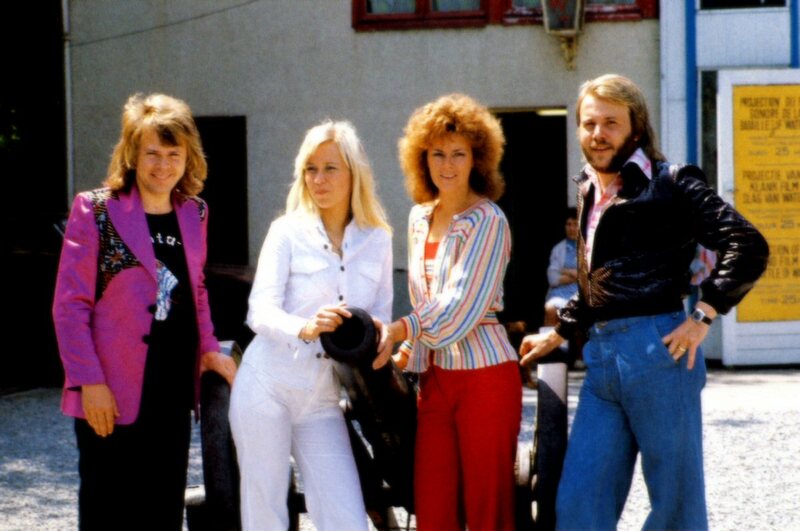 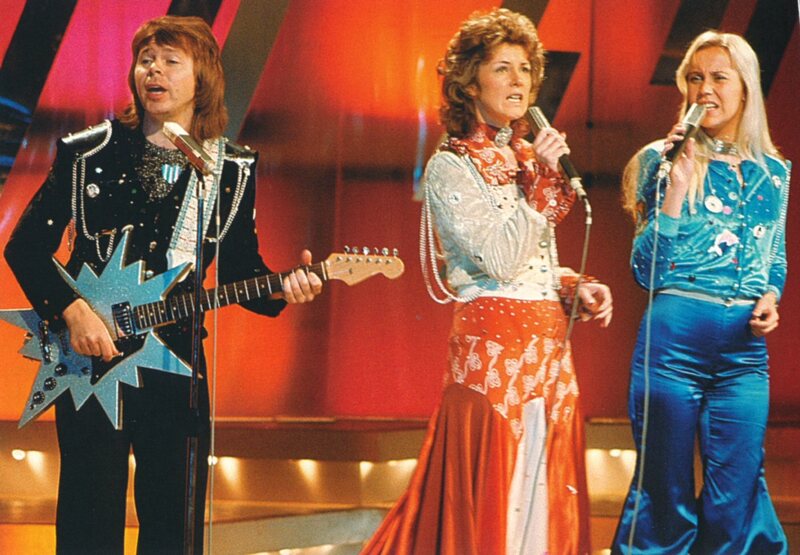 On December 7, 1974 ABBA performed for the first time in Eastern Europe - in DDR (East Germany). 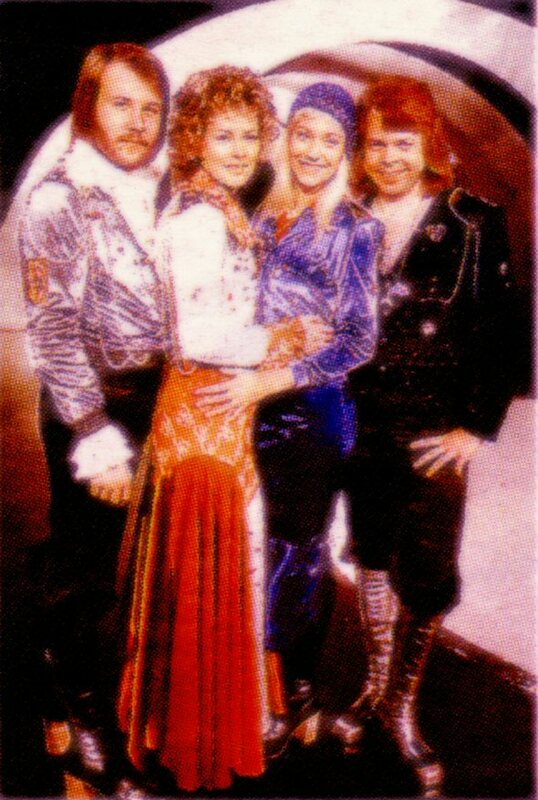 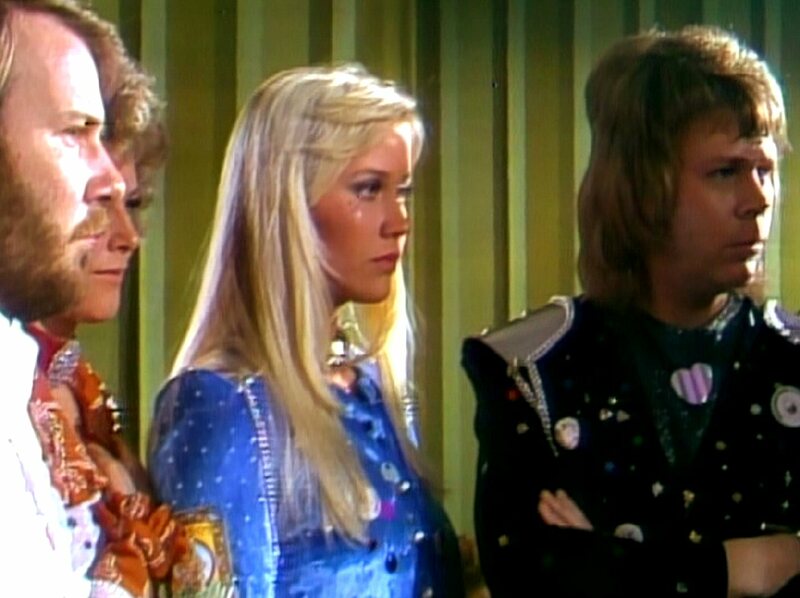 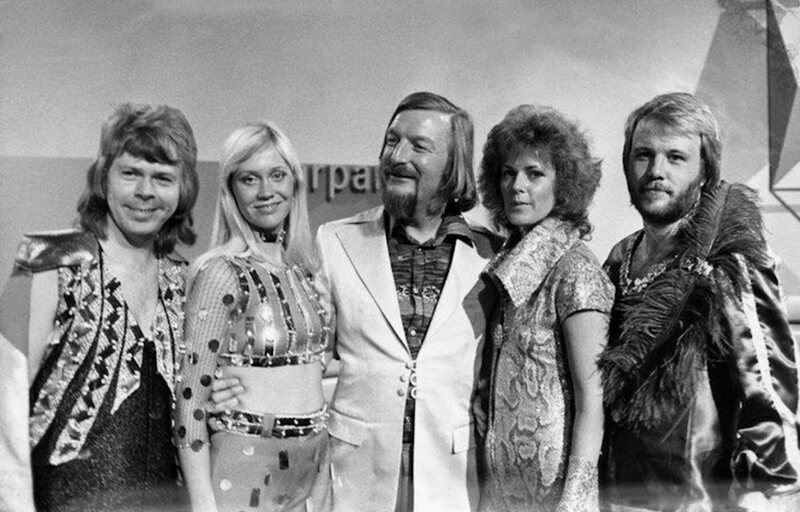 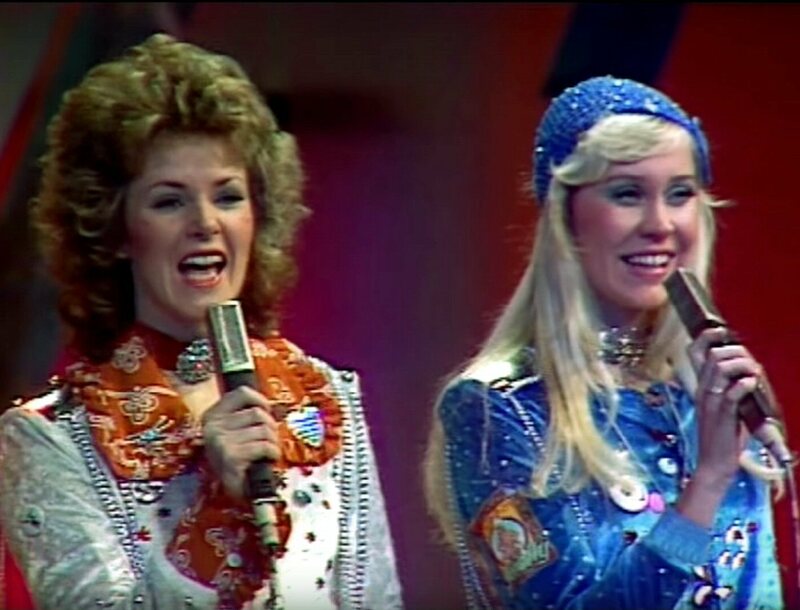 It was the first of totally two ABBA appearances in front of East European TV cameras. 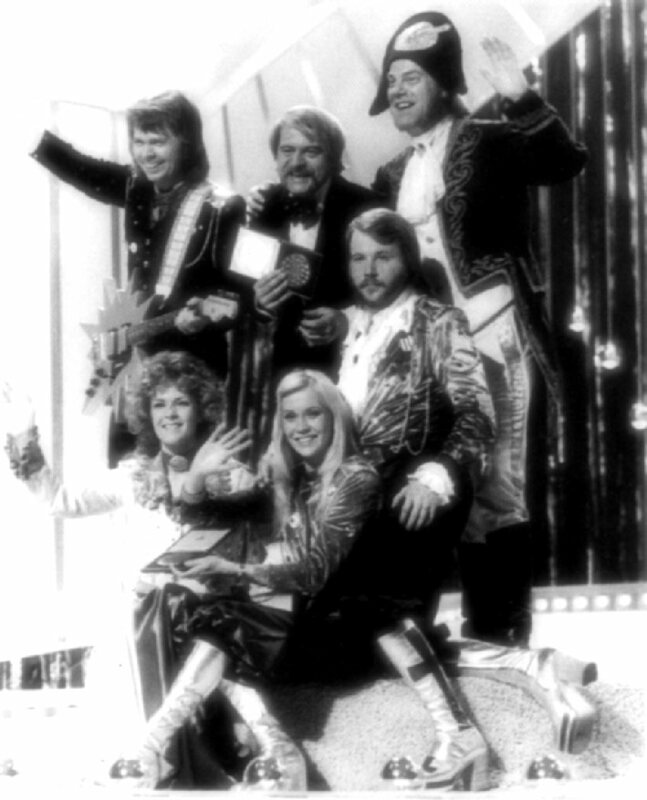 In the TV show "Ein Kessel Buntes" they performed their latest single hit "So Long" as well as "Honey Honey" and "Waterloo". 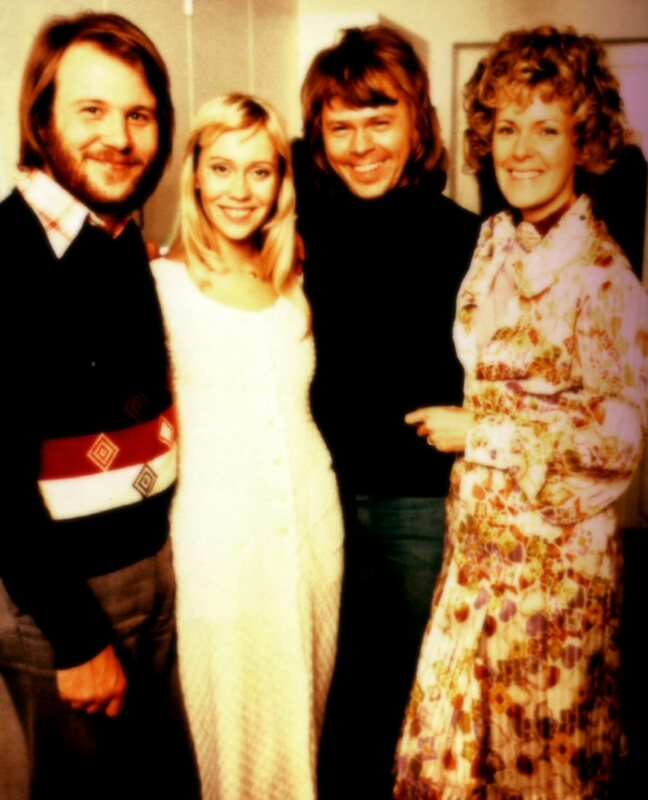 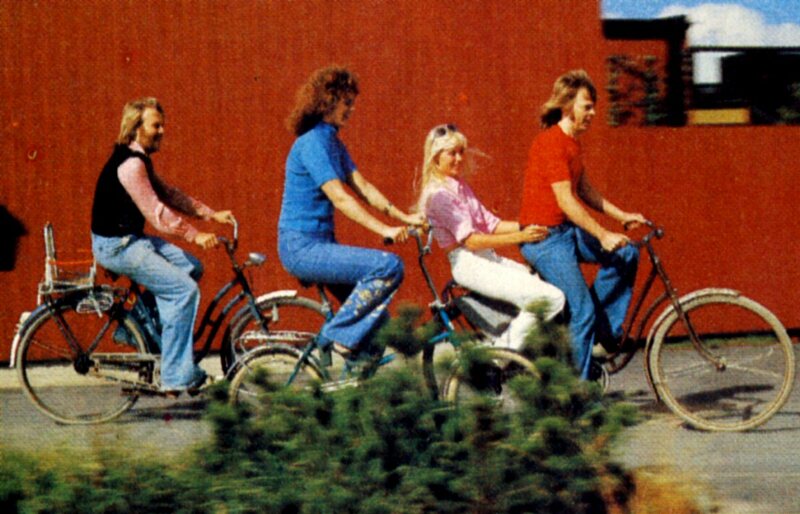 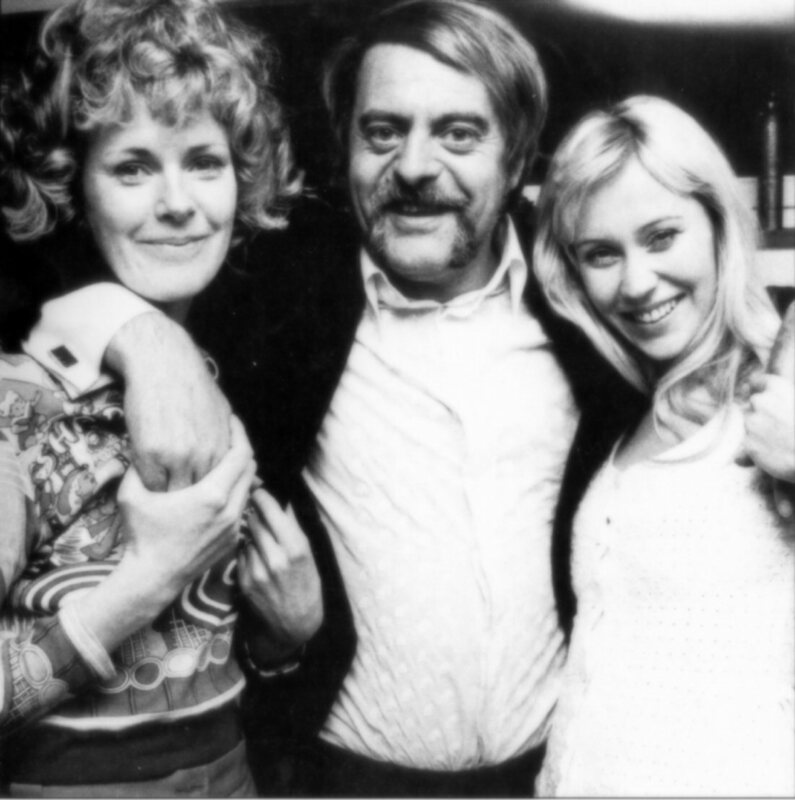 ABBA became very quickly very popular in West Germany. 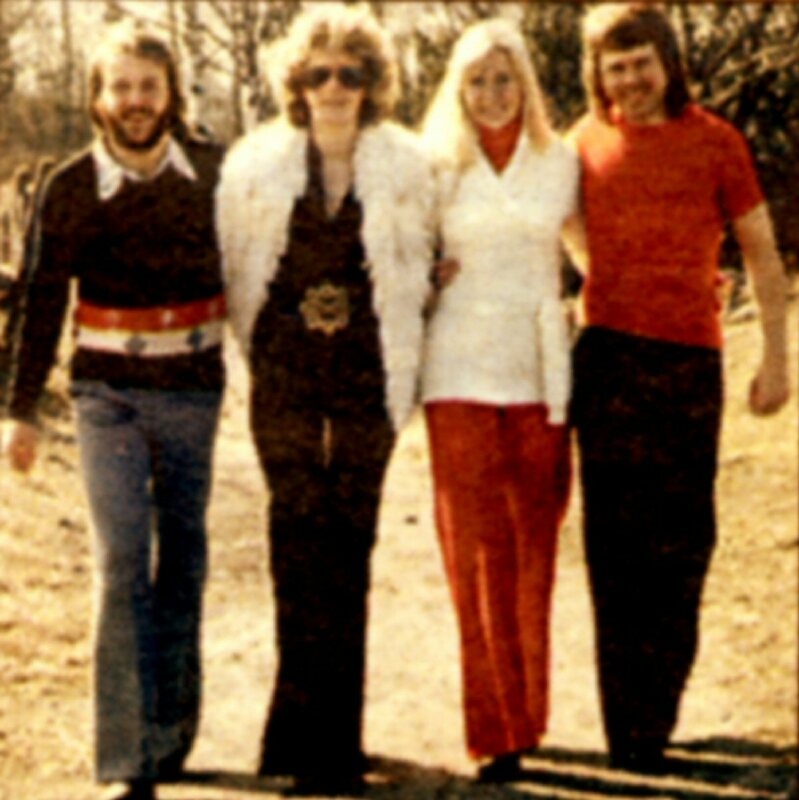 At the end of 1974 the German record company "Karusell" released LP "Honey Honey", entitled after the group's latest single hit by that time in Germany. 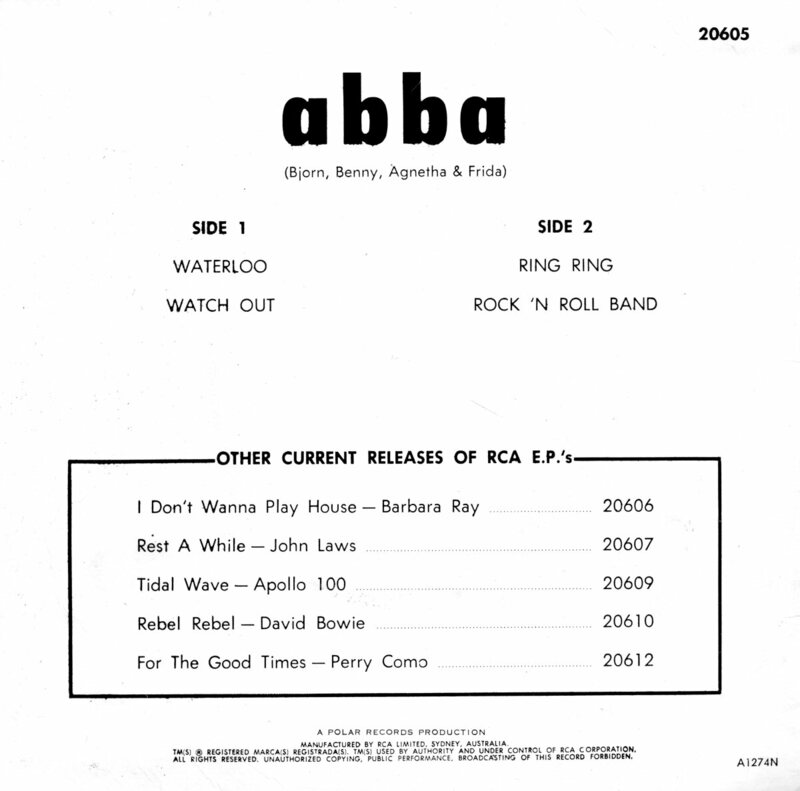 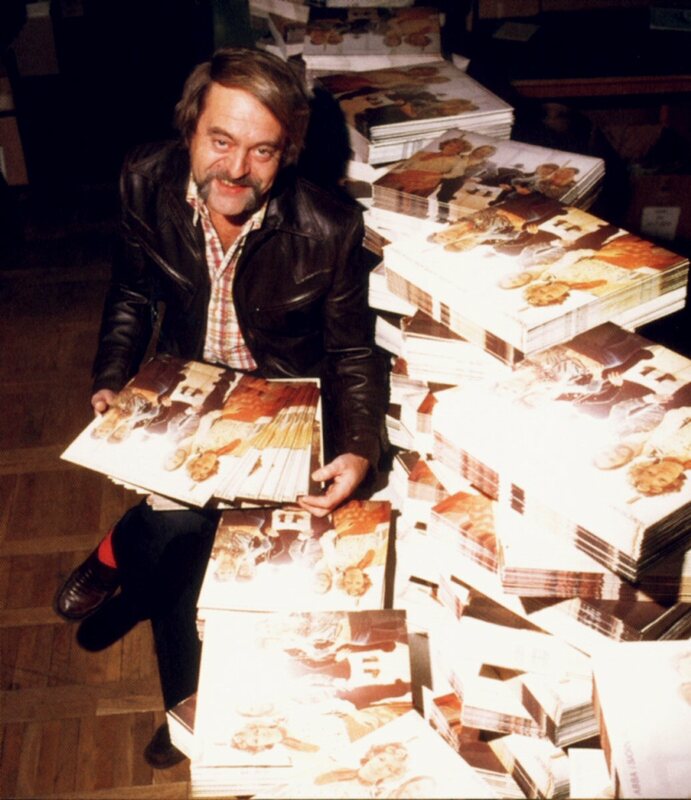 The LP contained songs previously available only in Scandinavia on ABBA's first LP "Ring Ring". 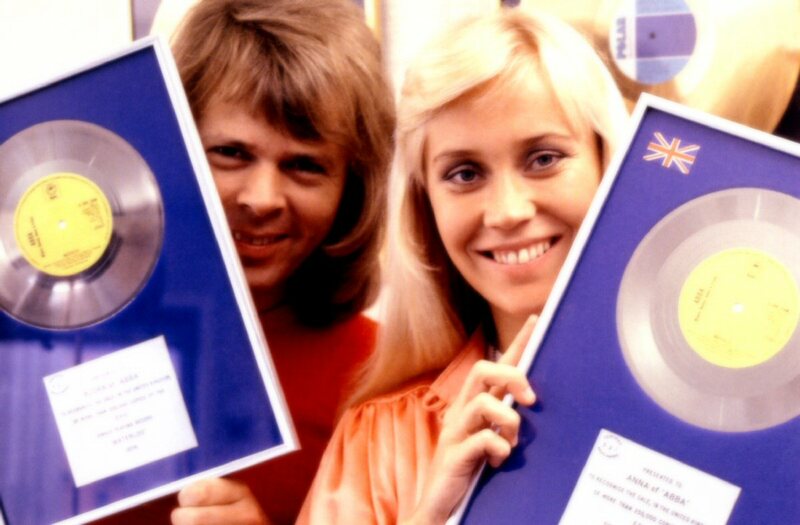 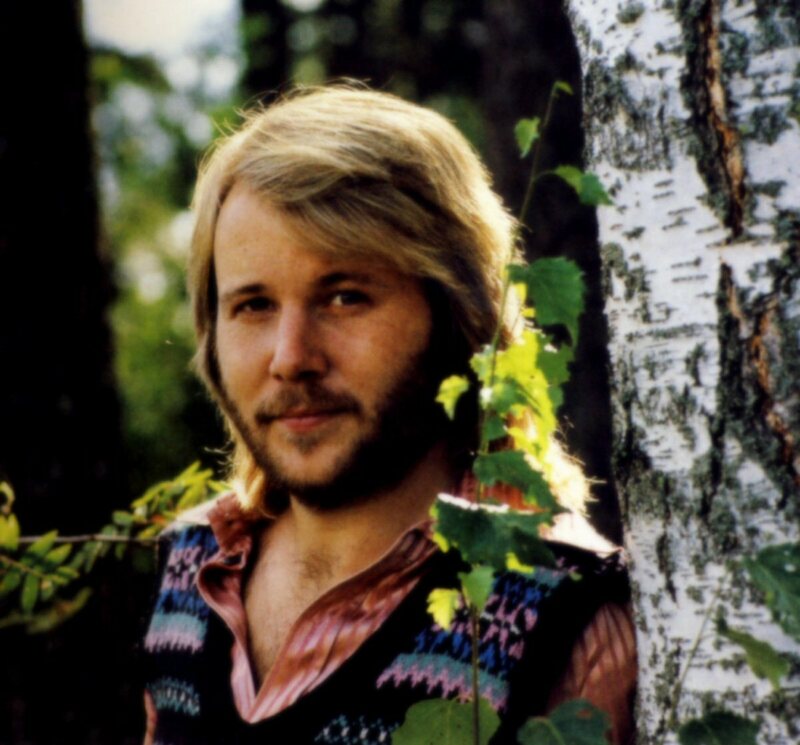 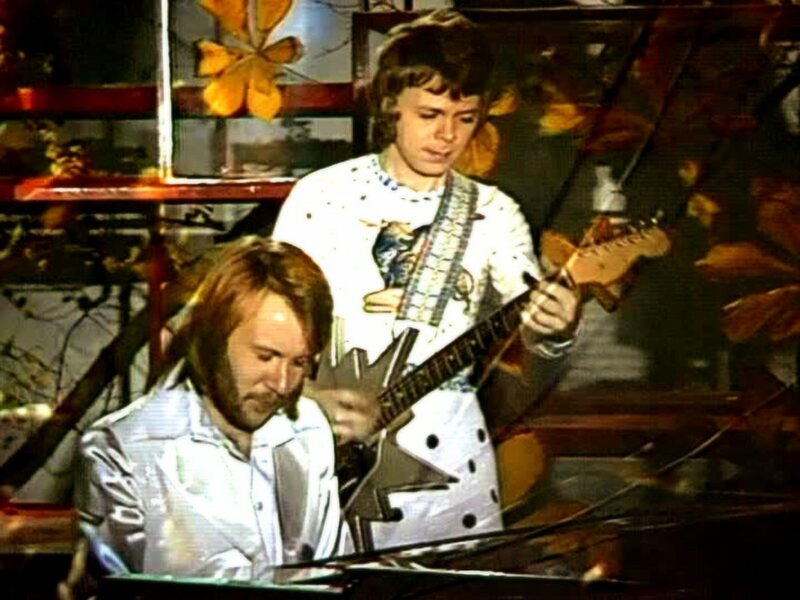 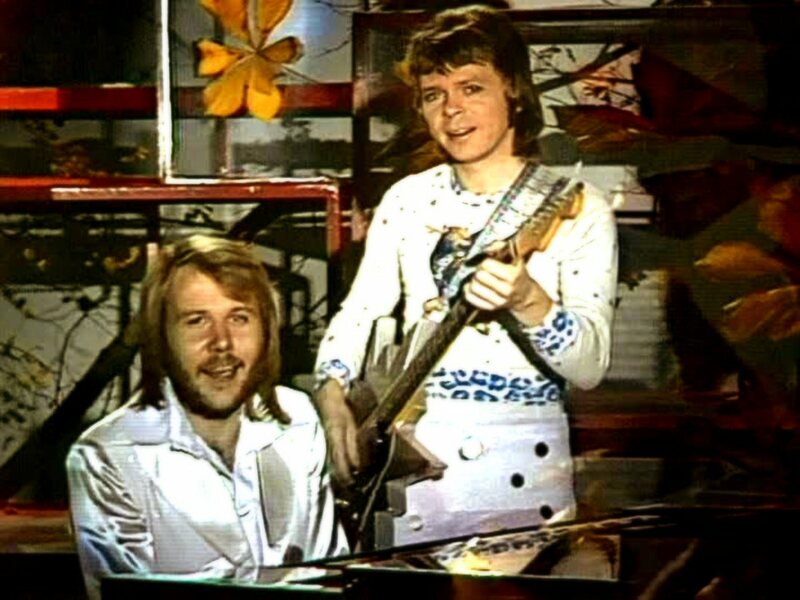 The track "I Saw It In The Mirror" was not included on this release and instead there was "She's My Kind of Girl" an early Björn & Benny recording without any participation of Agnetha and Frida. 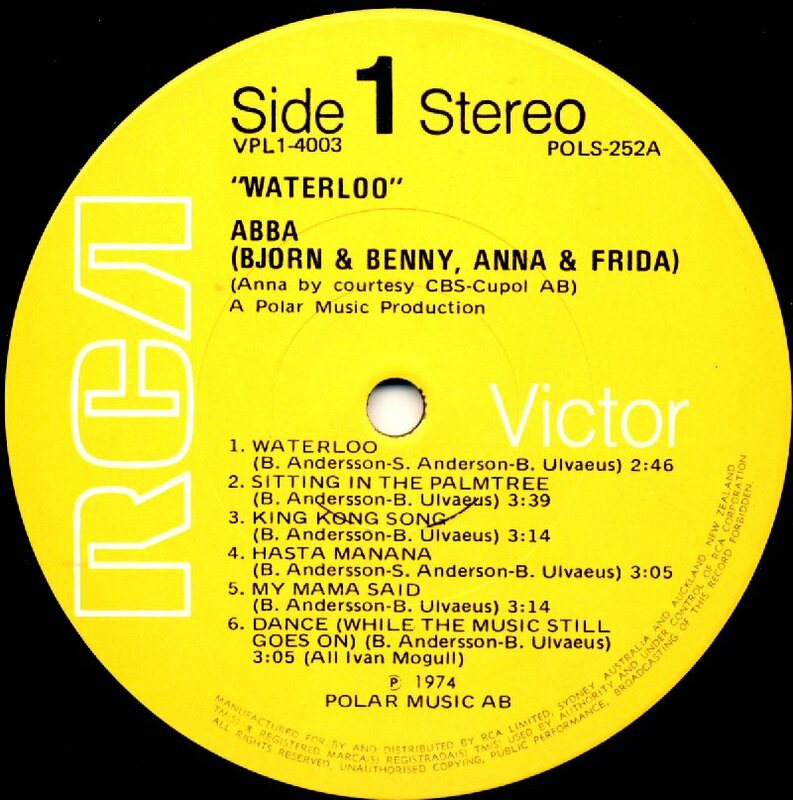 The title track opened the side 2 of the LP and it was the only song taken from the LP "Waterloo". 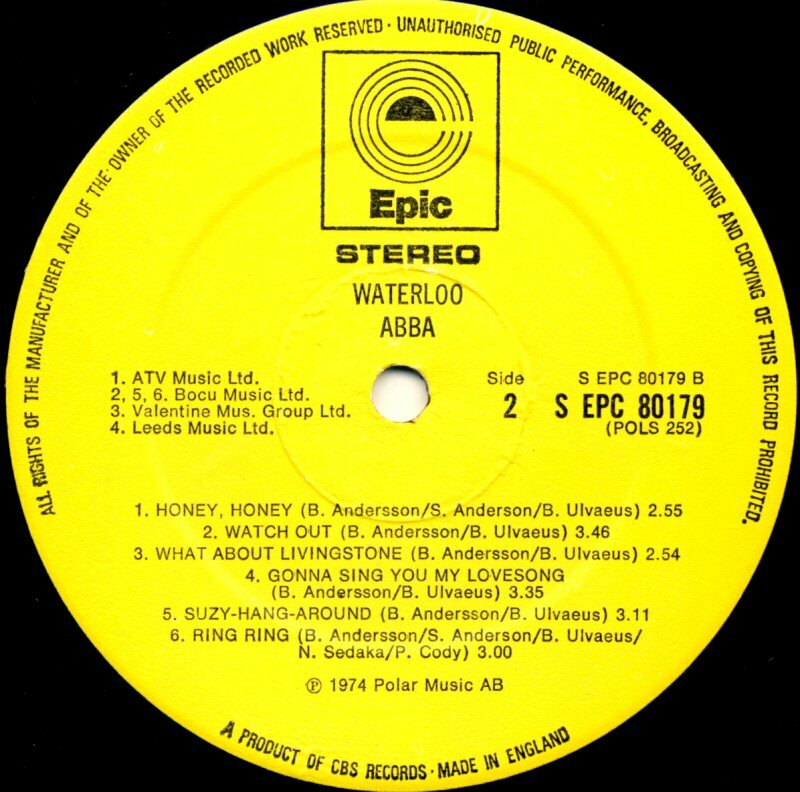 The LP "Honey Honey" would be re-released by Polydor in January 1979 with different cover but the same track listing. 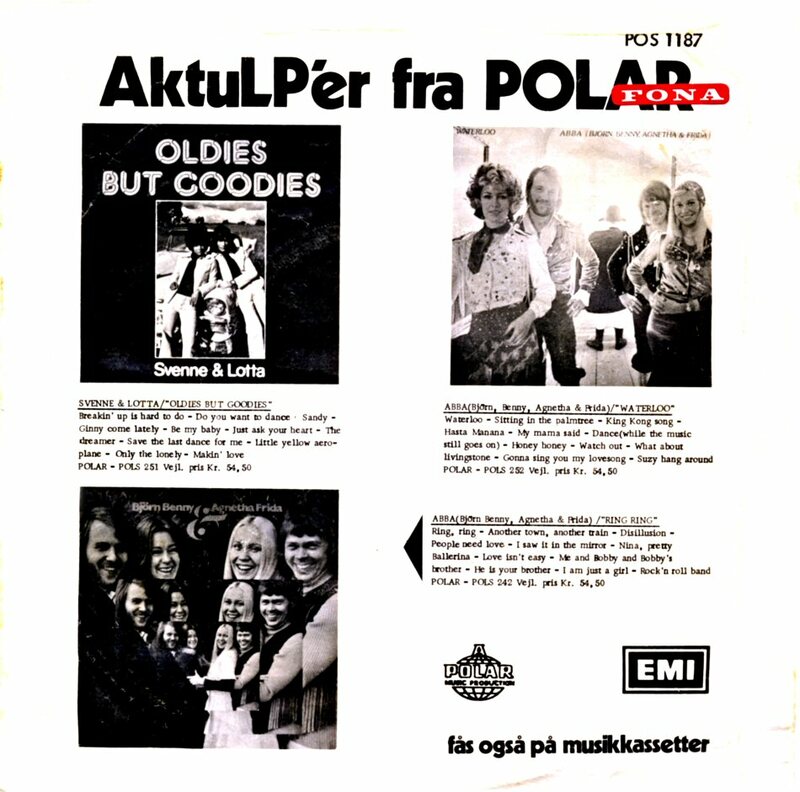 At the beginning of 1990s the album was even released on CD. 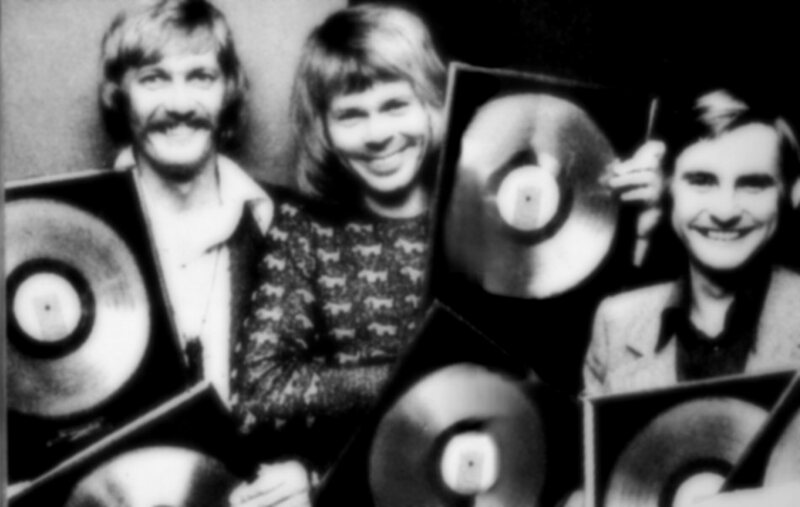 Both the first LP release and the CD release are practically impossible to find nowadays. 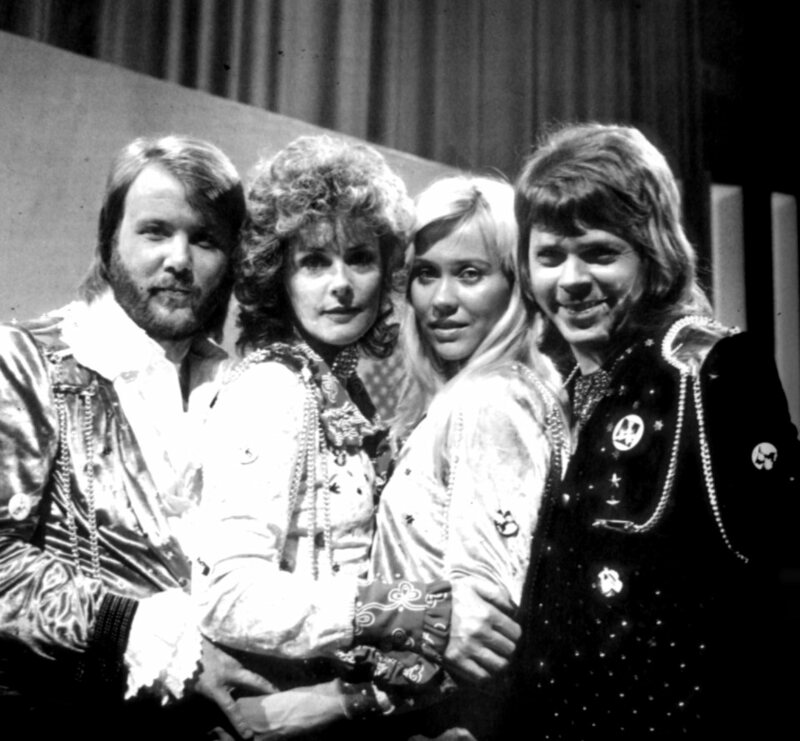 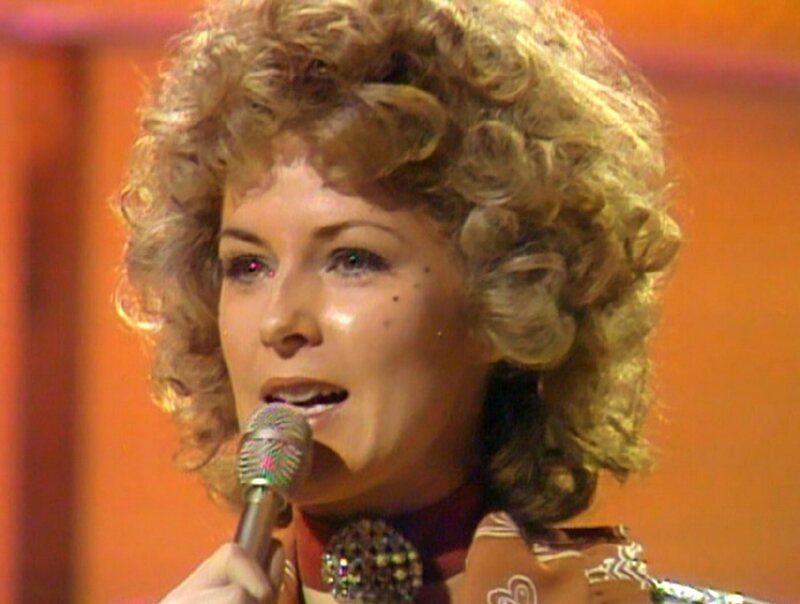 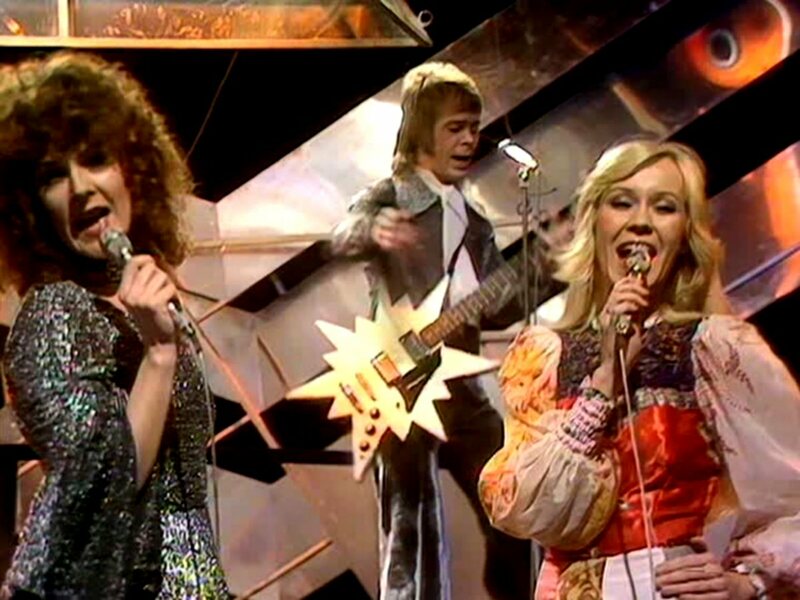 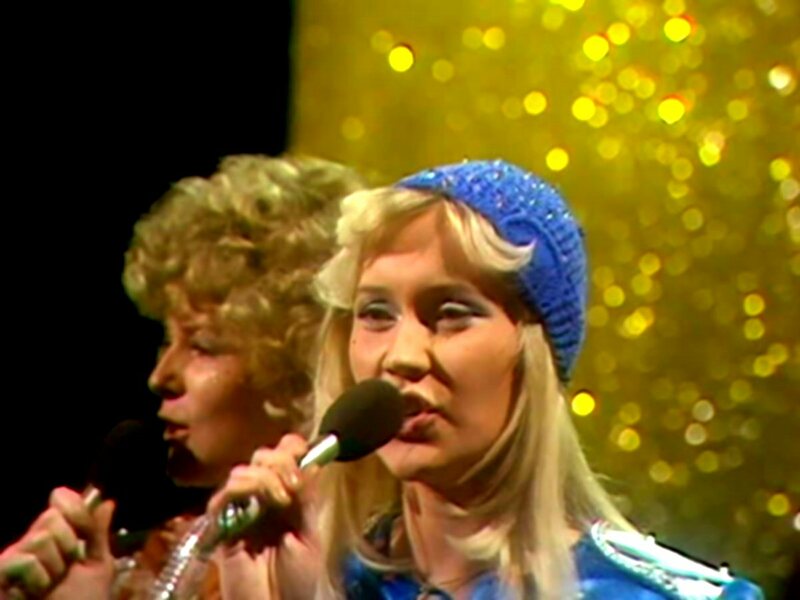 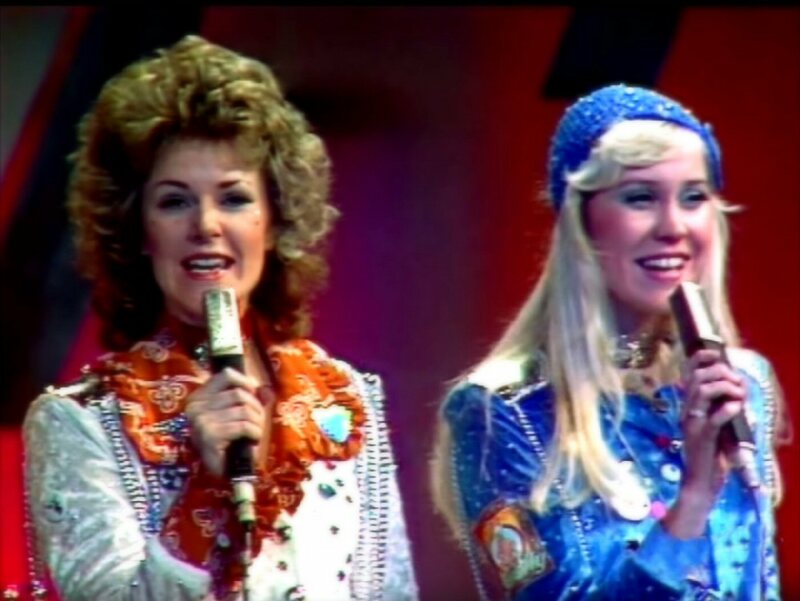 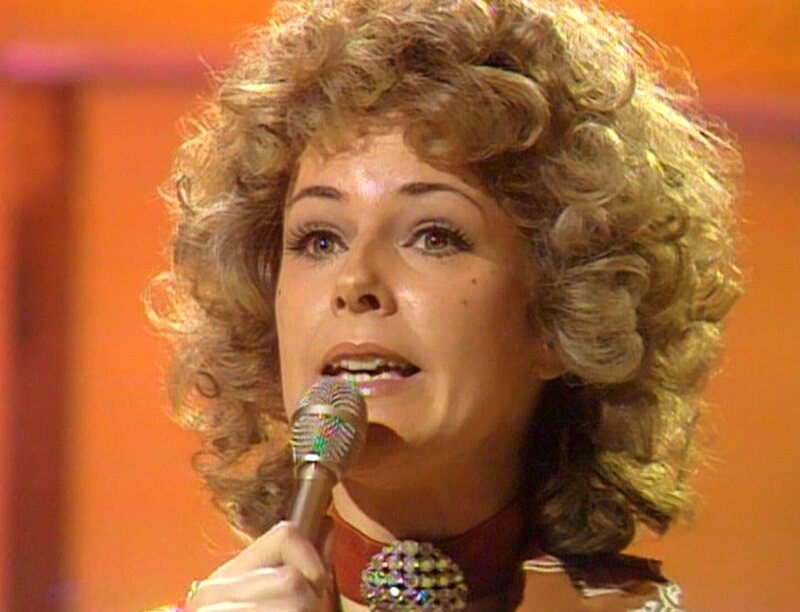 For the third time in 1974 ABBA performed "Waterloo" in "Top of the Pops" in Great Britain.